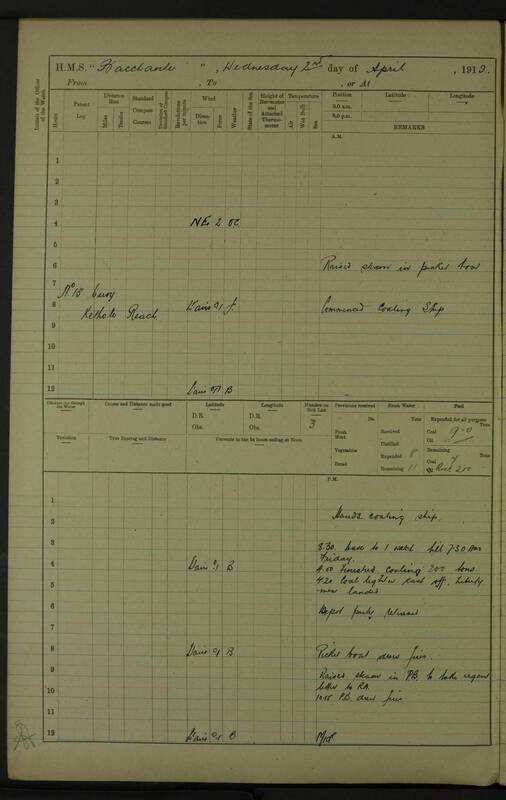 9.30 am: Court of Enquiry assembled on board. 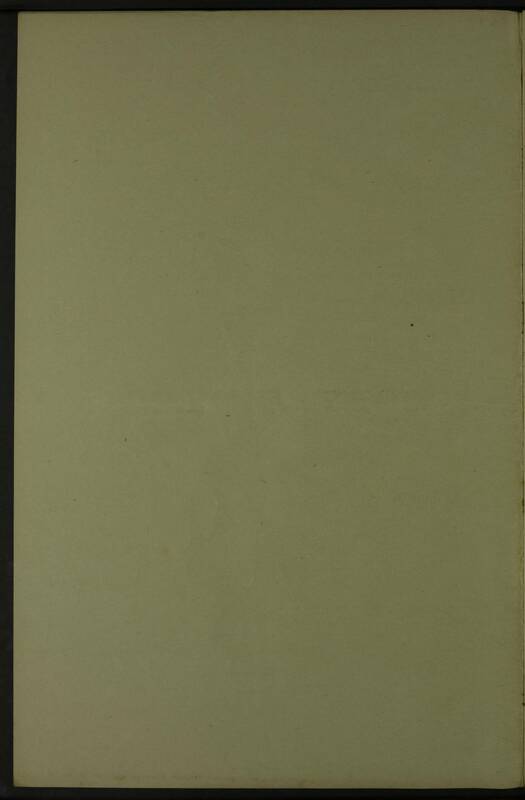 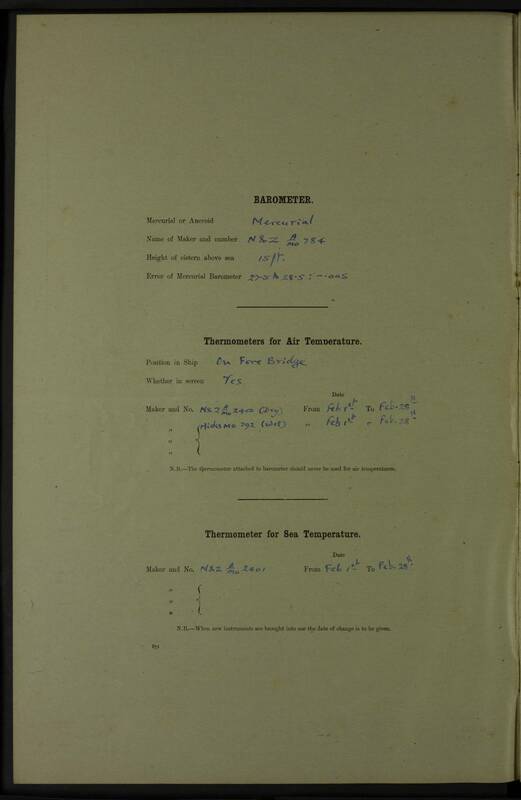 am: Fleet Paymaster Owen Penfold, R.N. 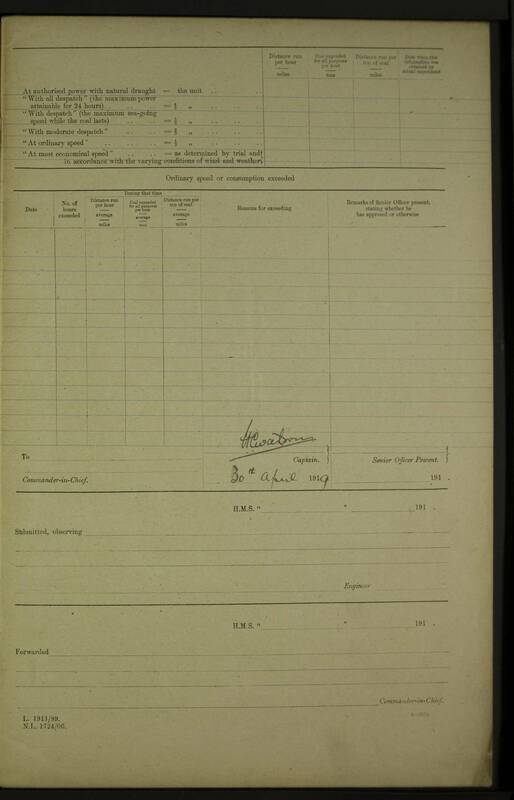 and Lieutenant Money, R.N. 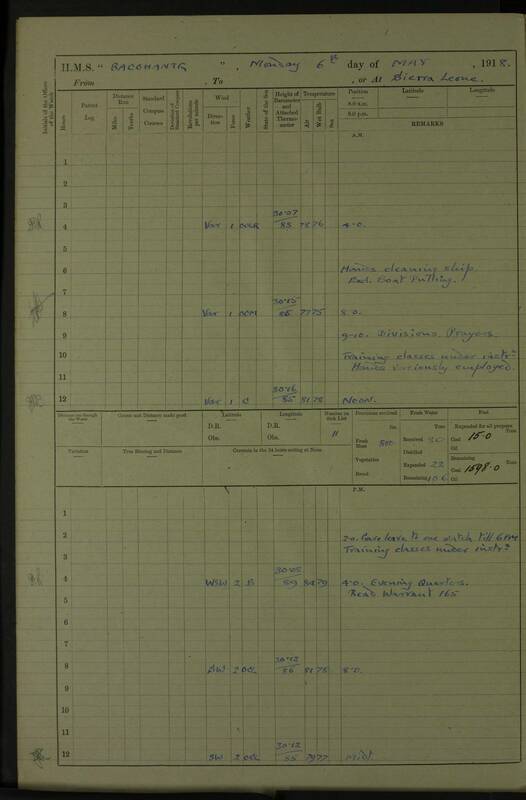 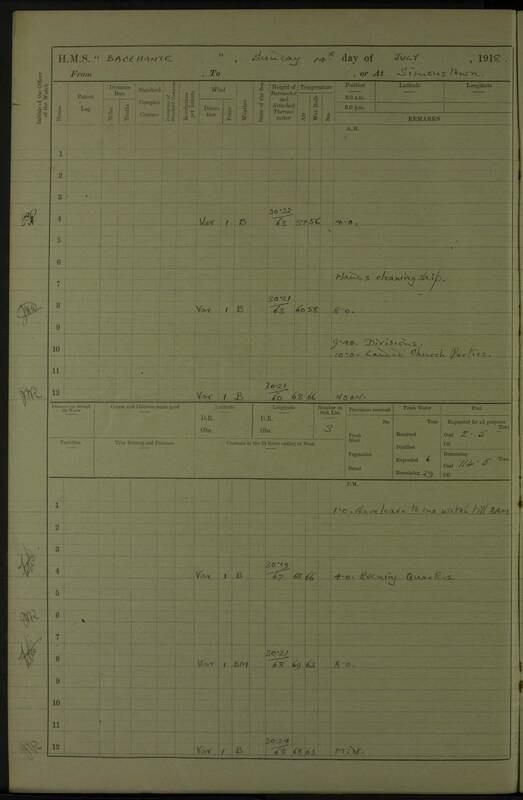 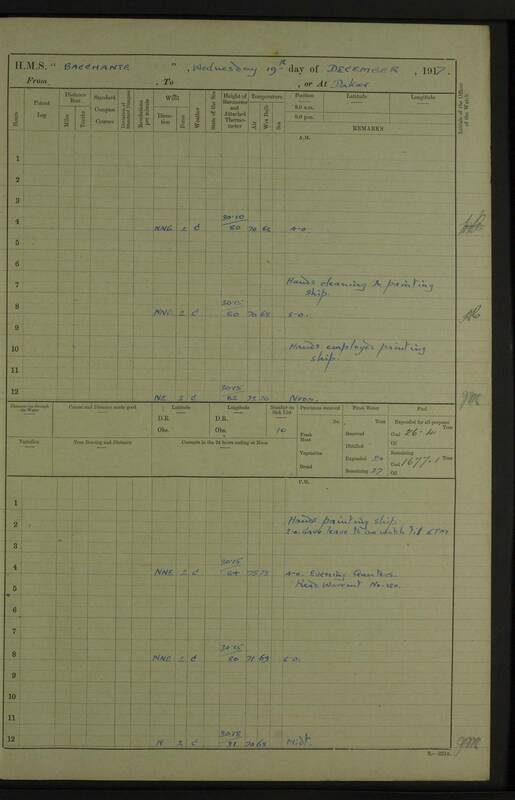 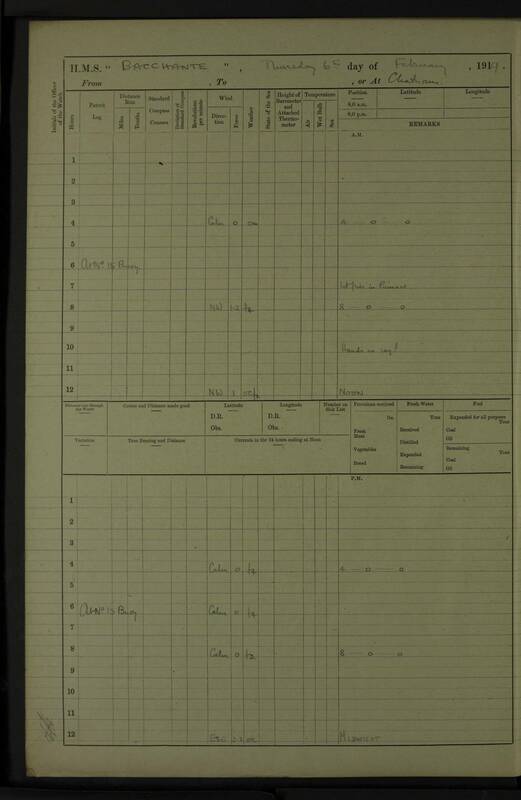 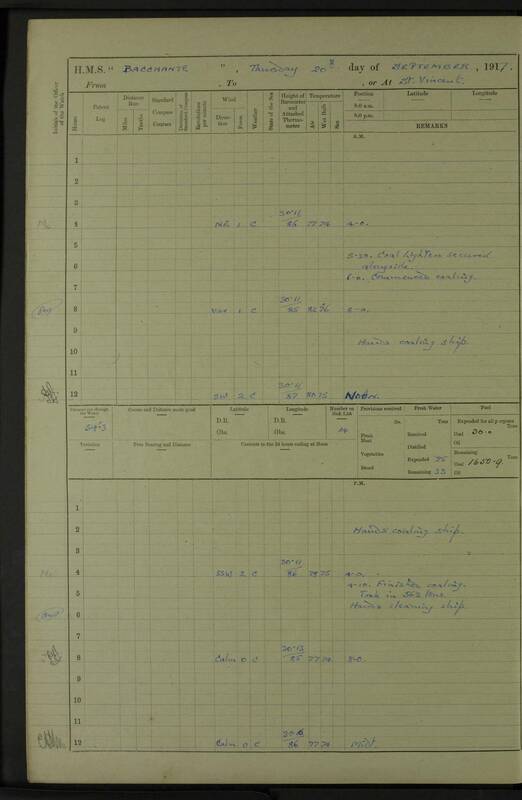 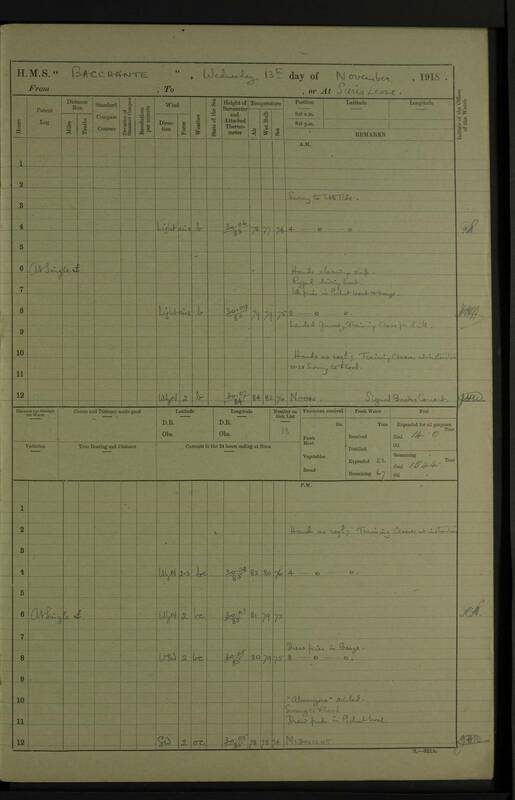 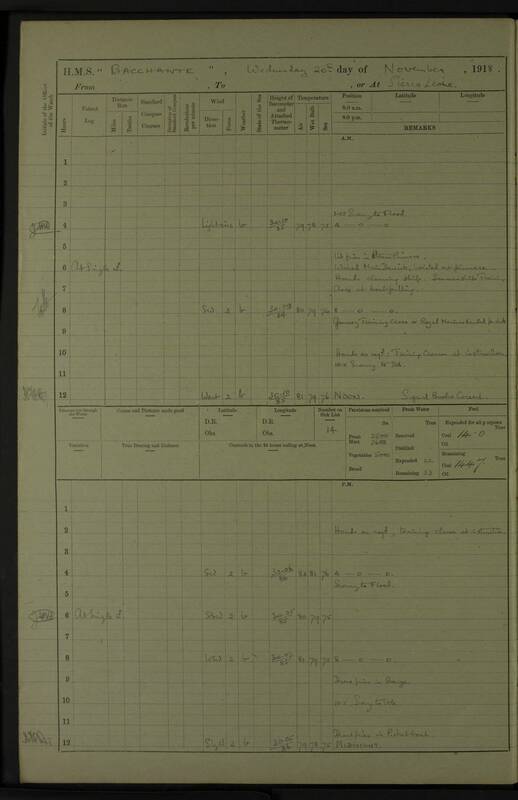 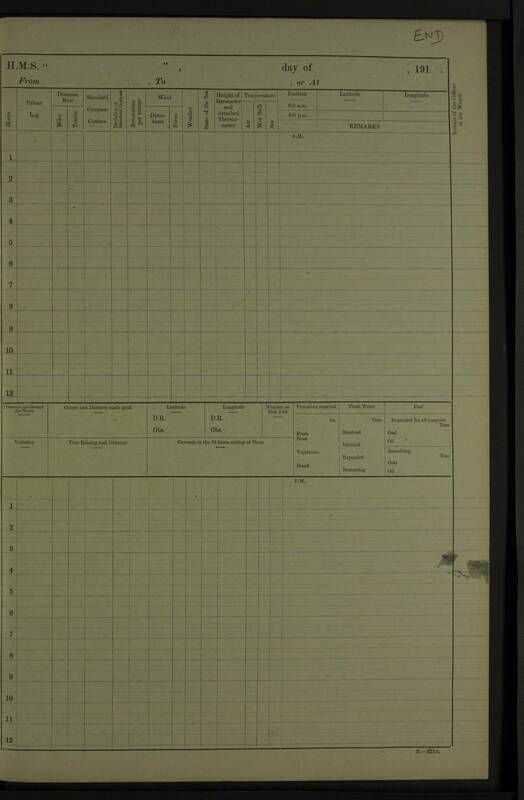 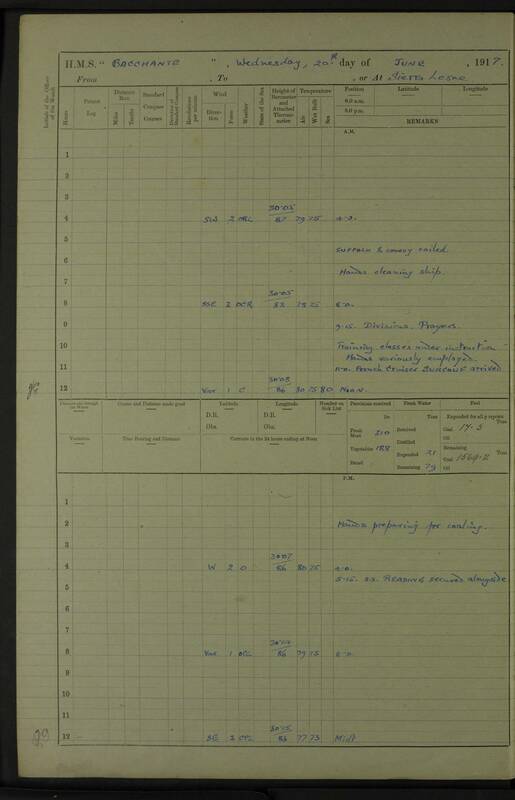 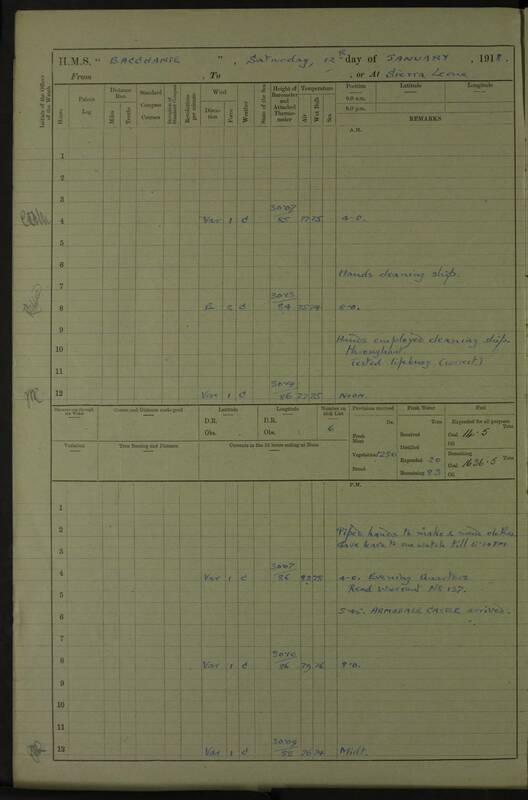 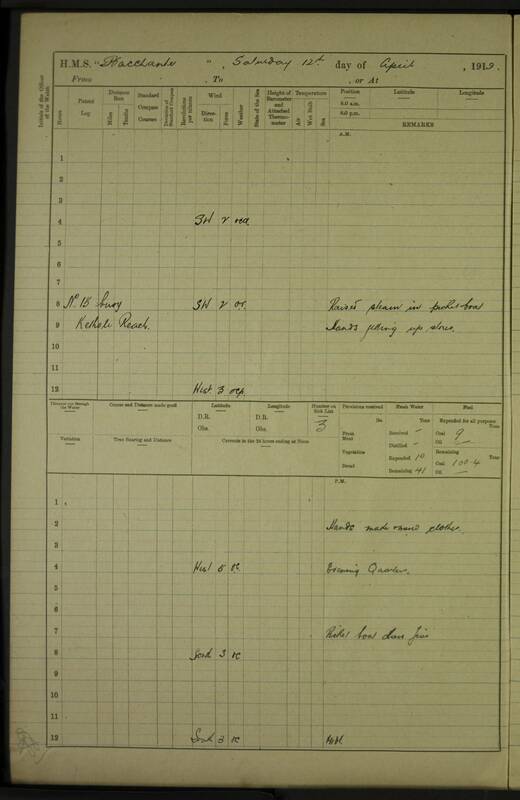 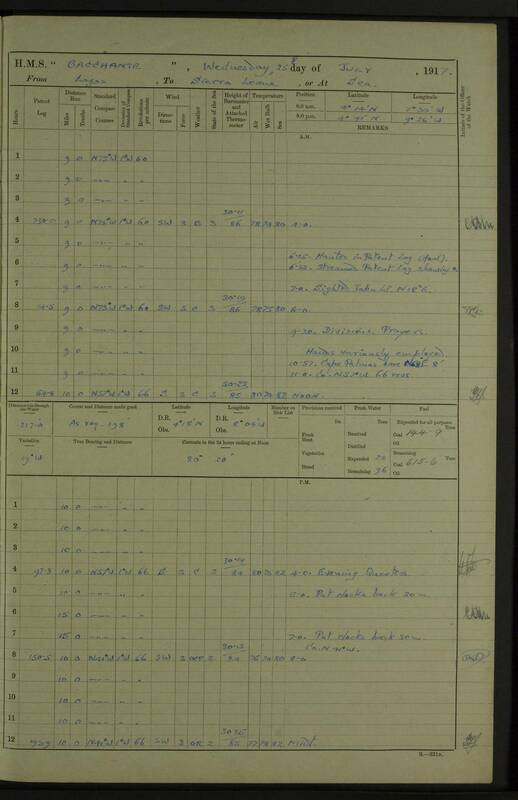 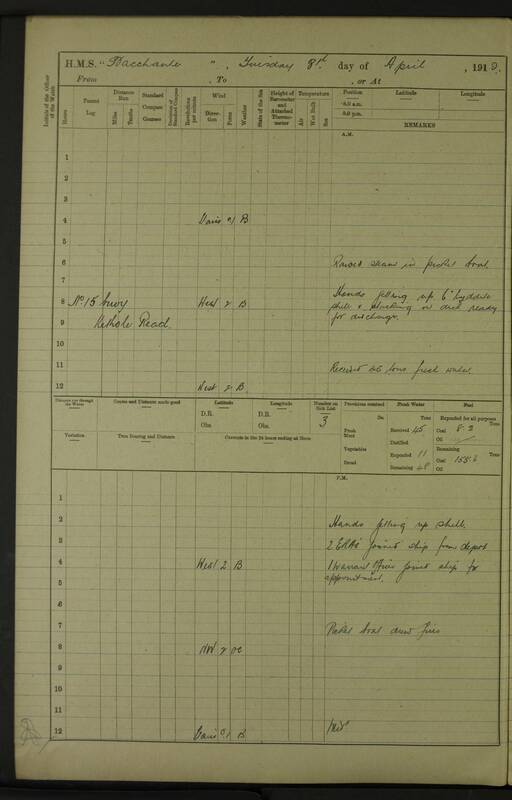 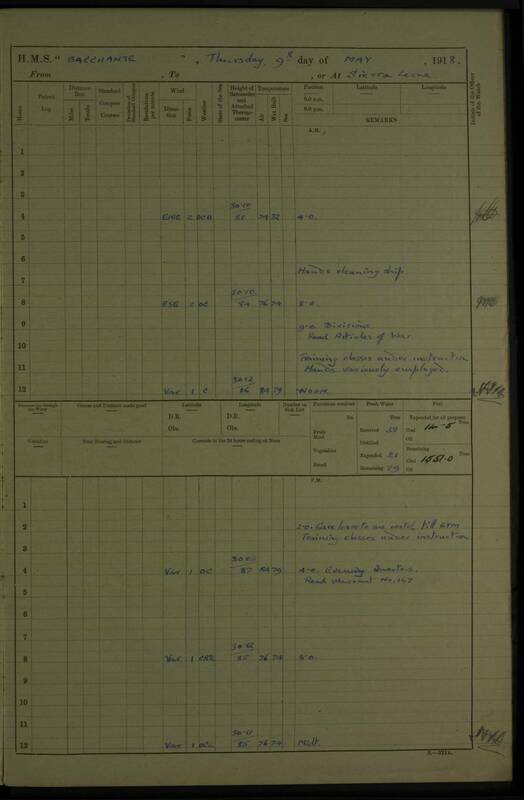 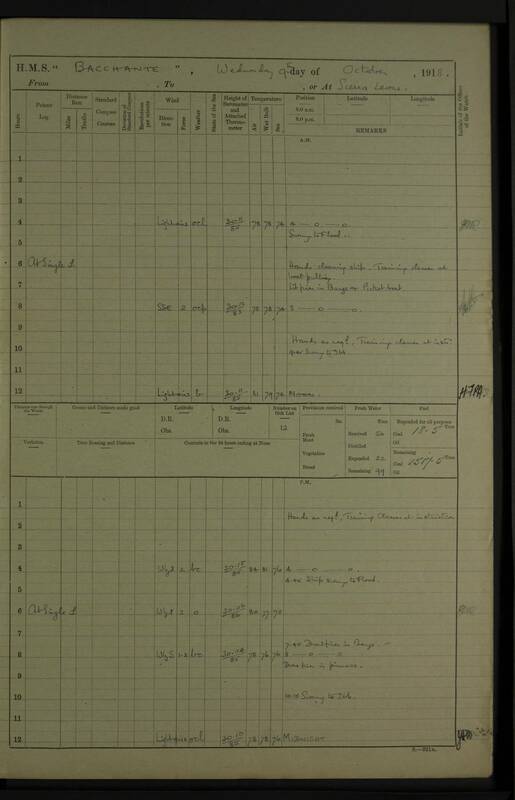 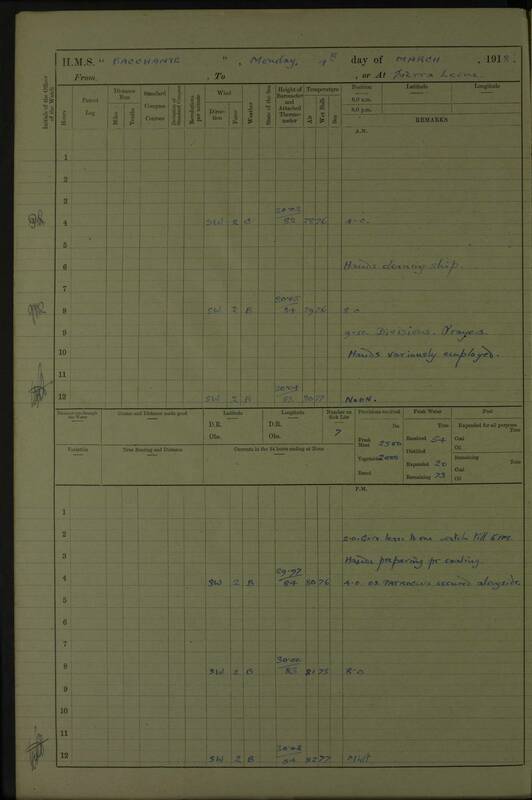 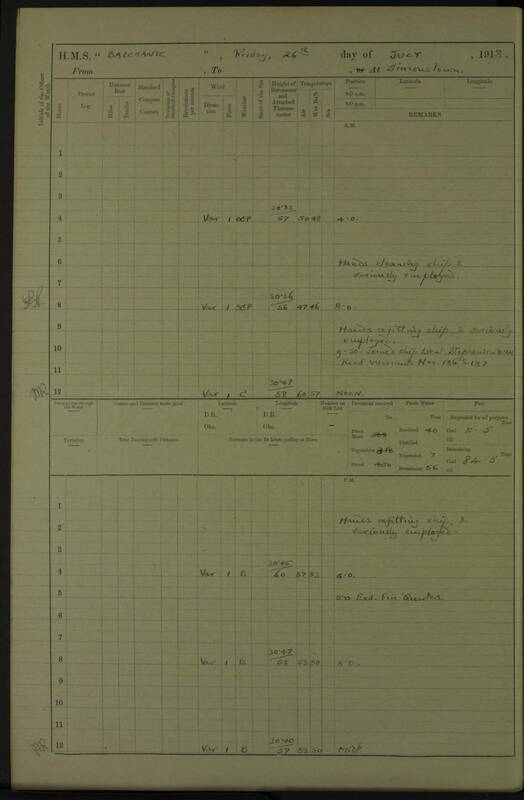 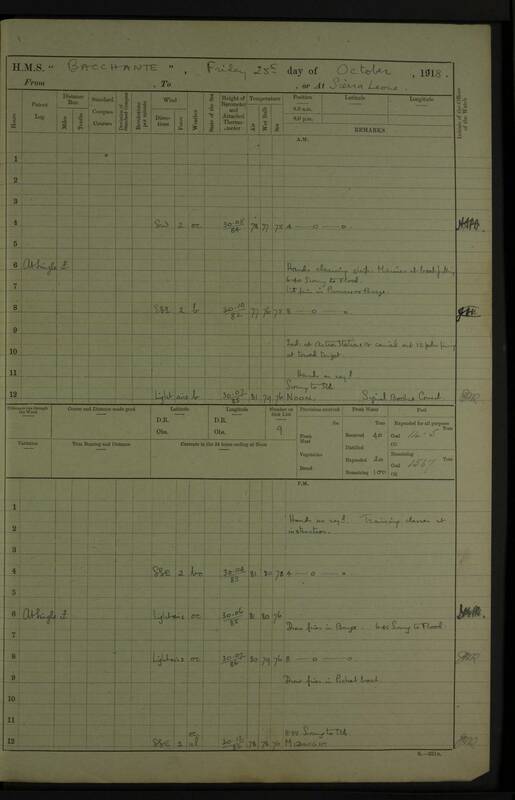 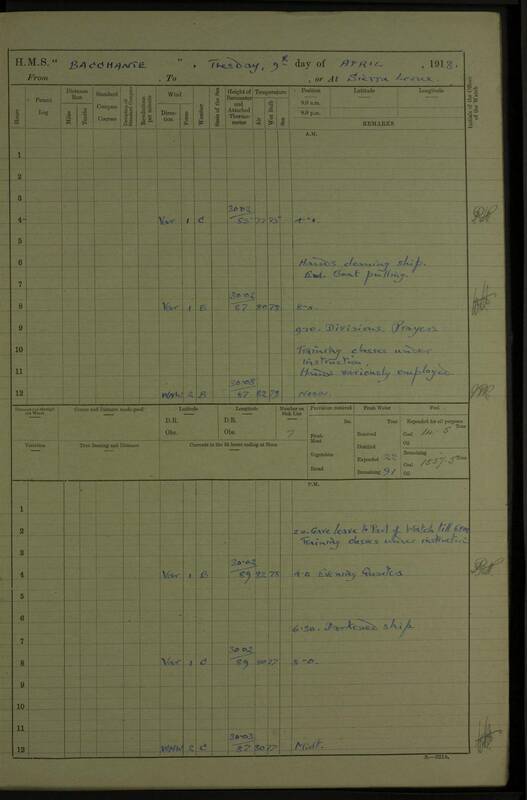 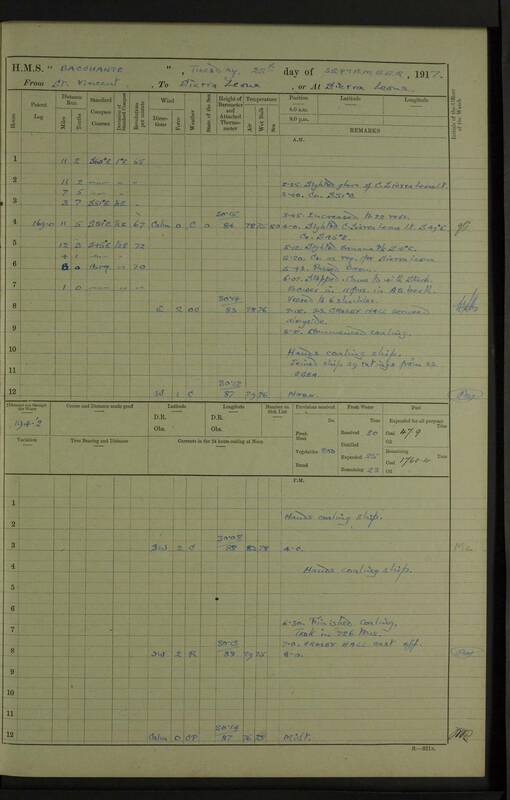 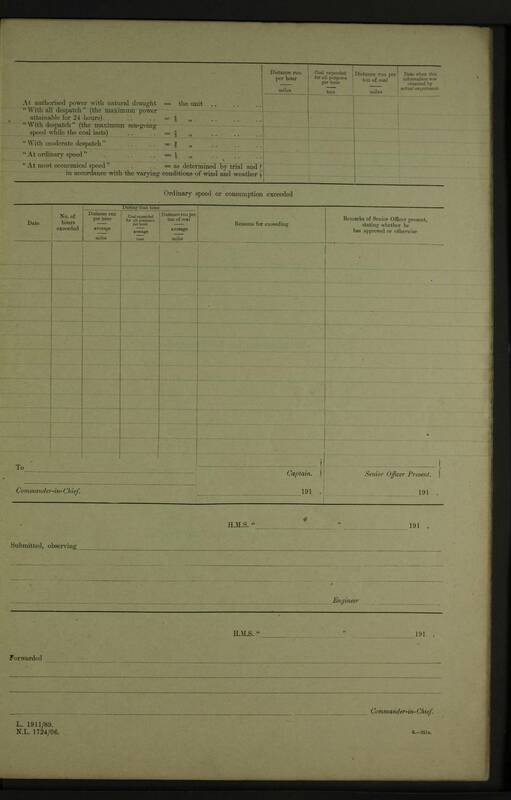 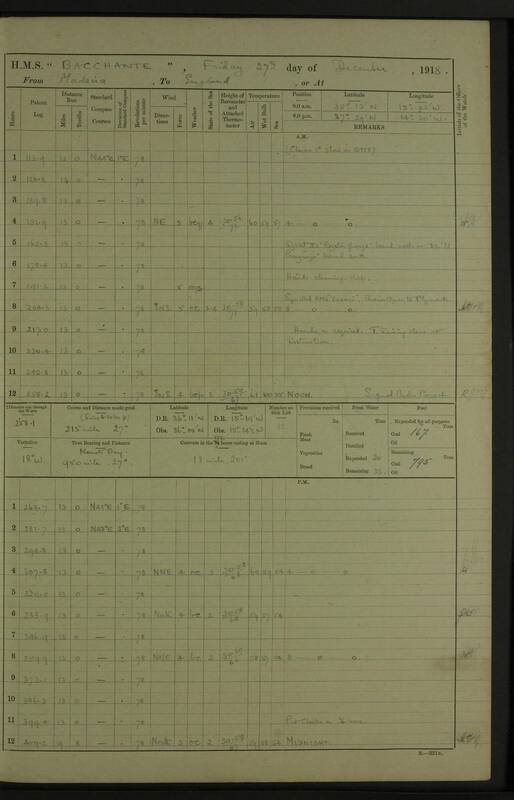 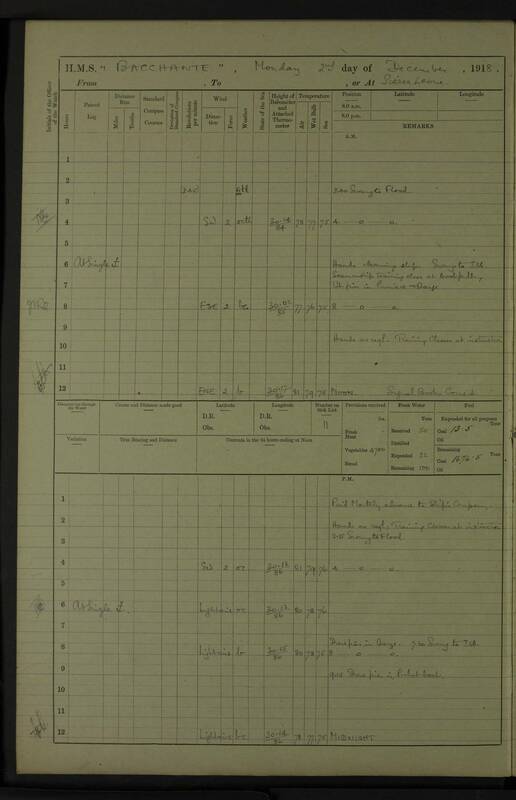 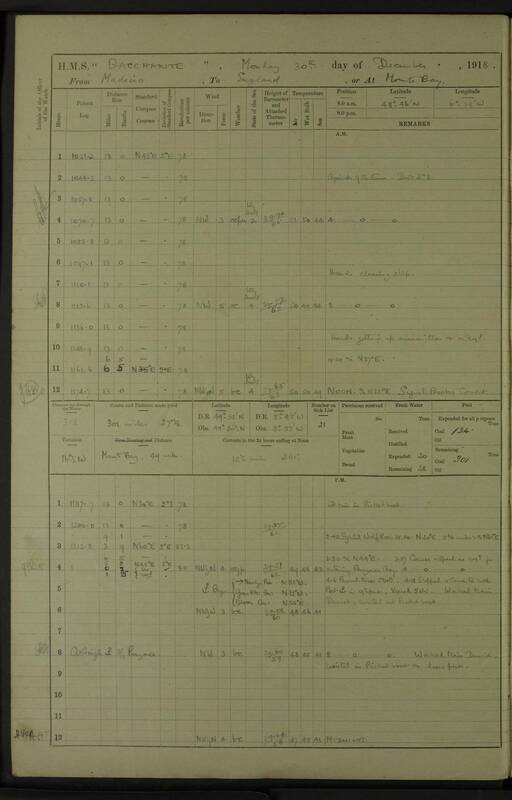 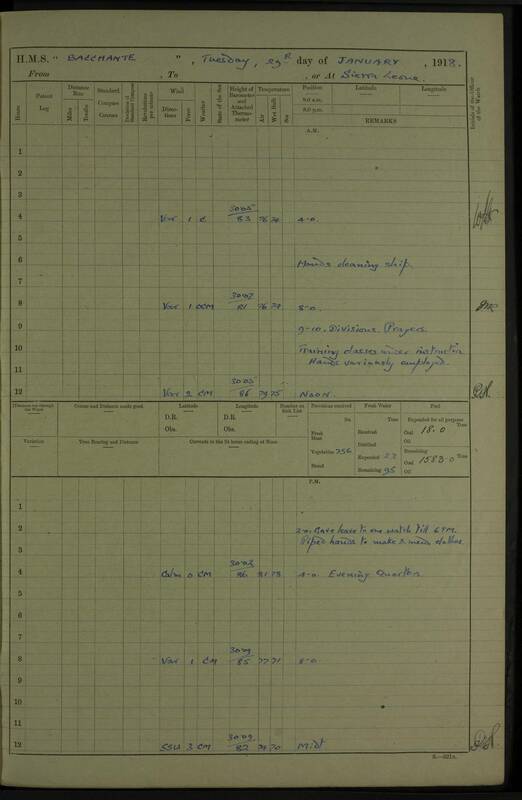 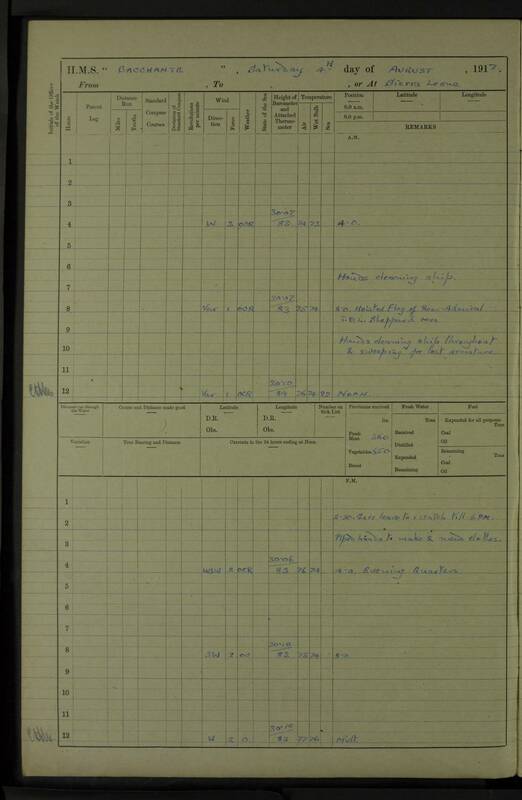 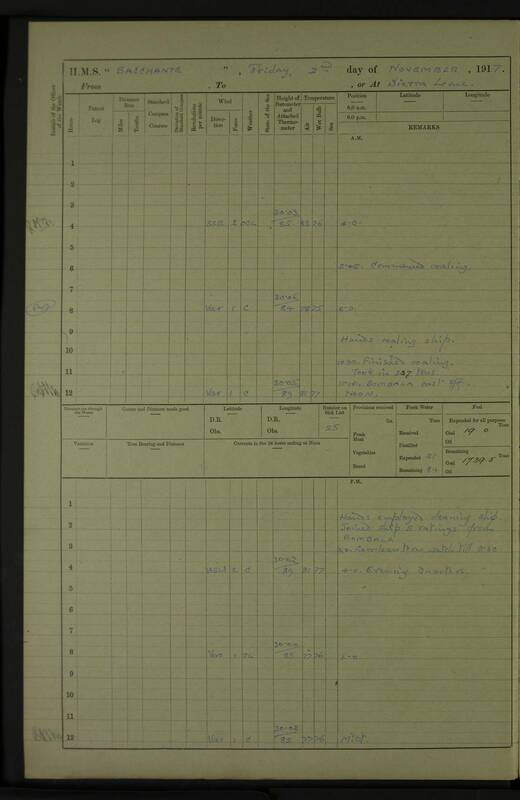 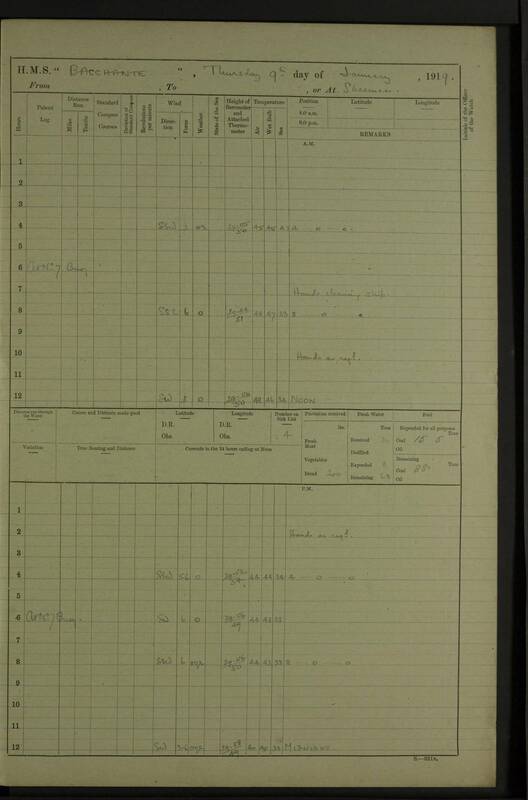 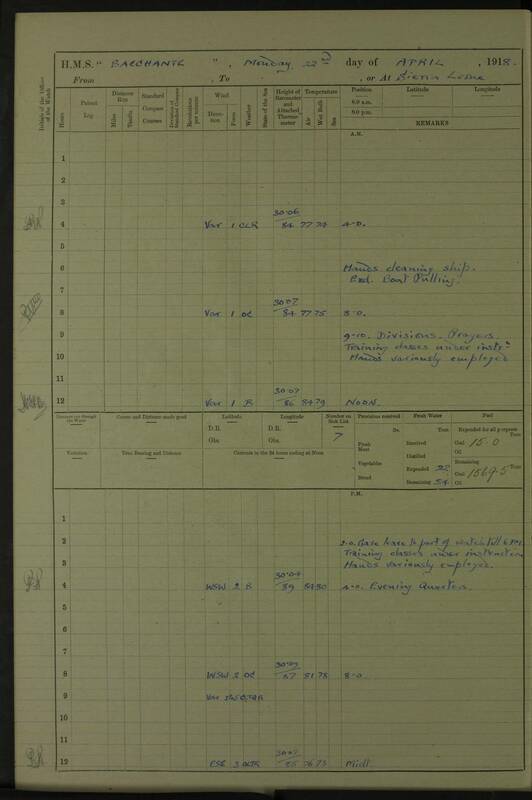 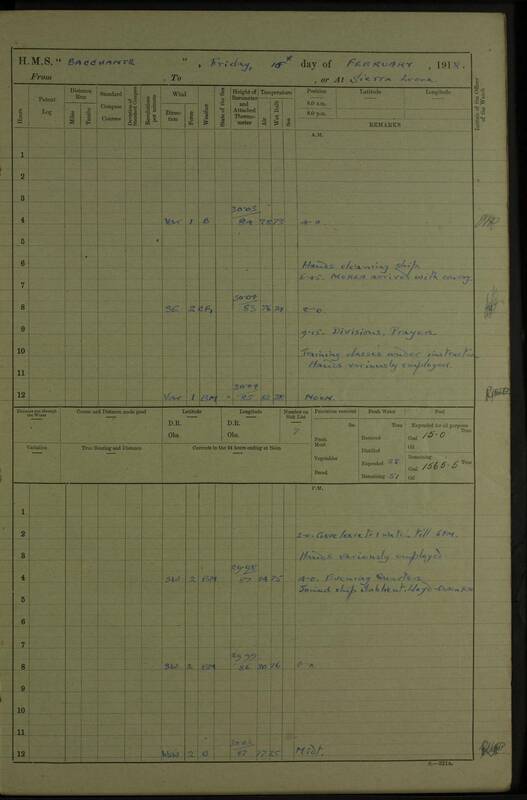 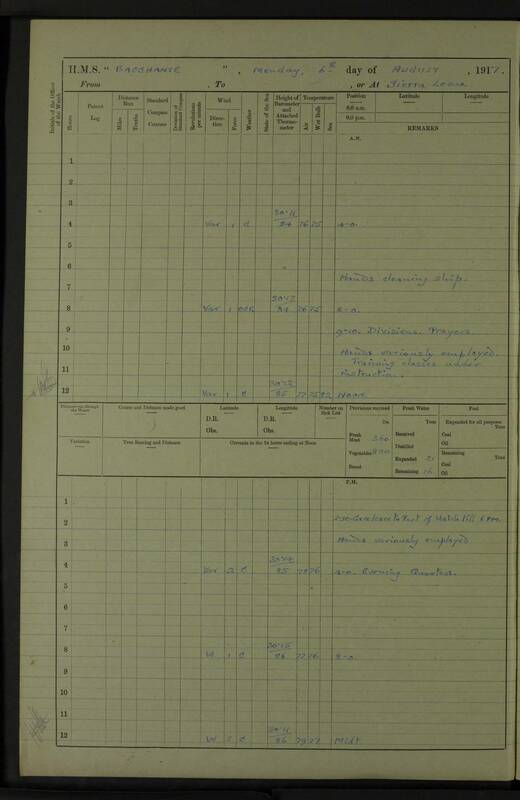 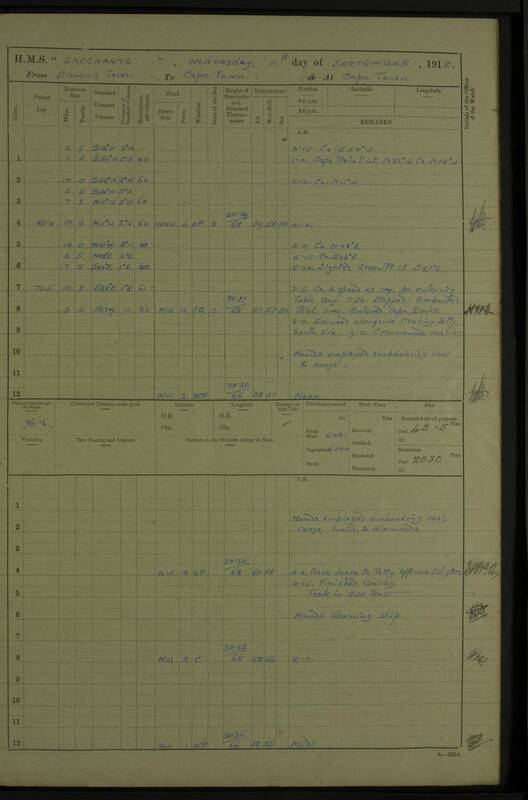 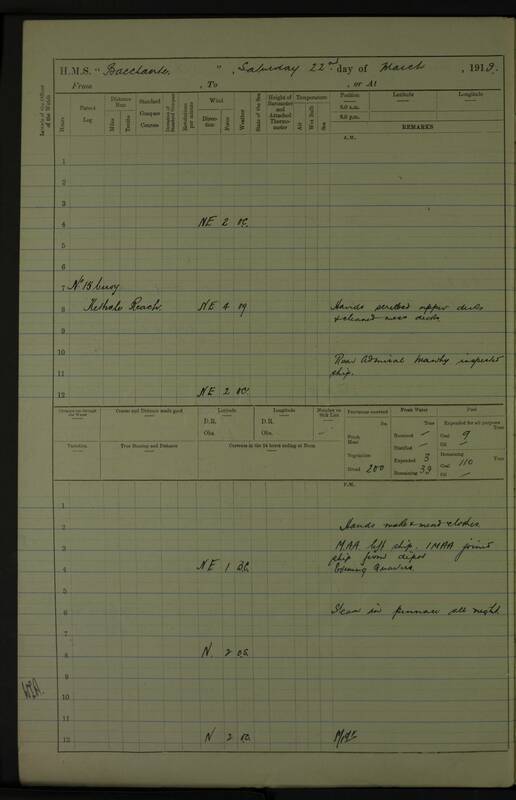 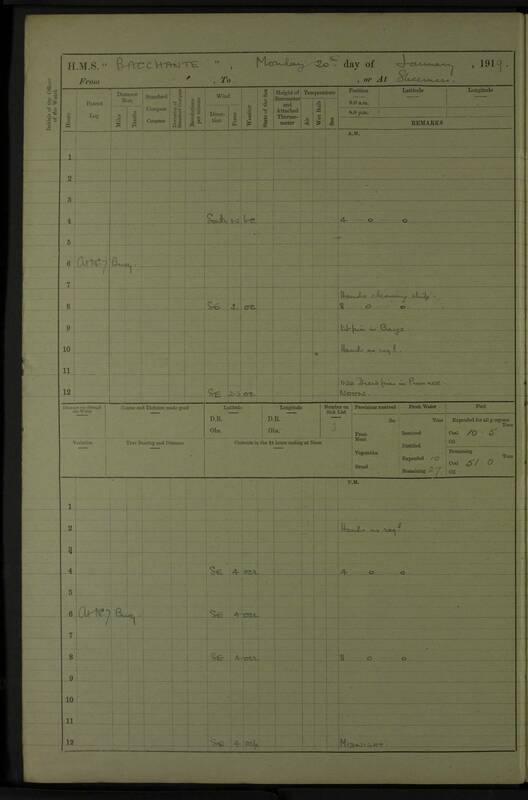 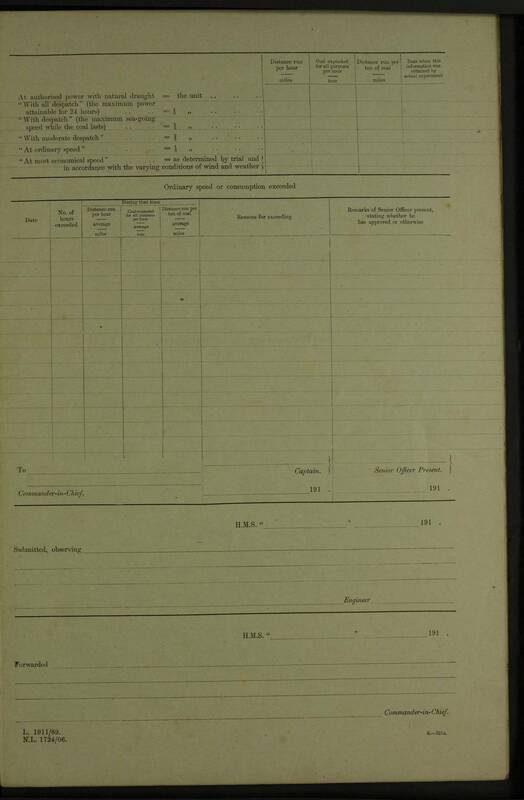 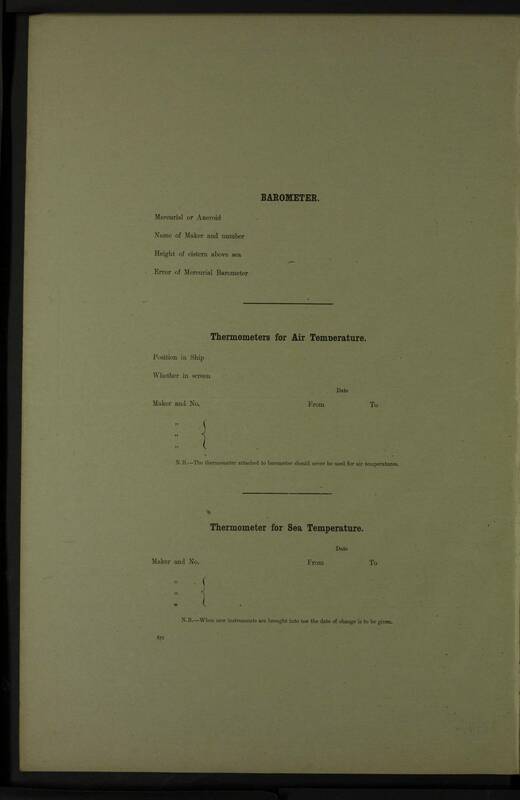 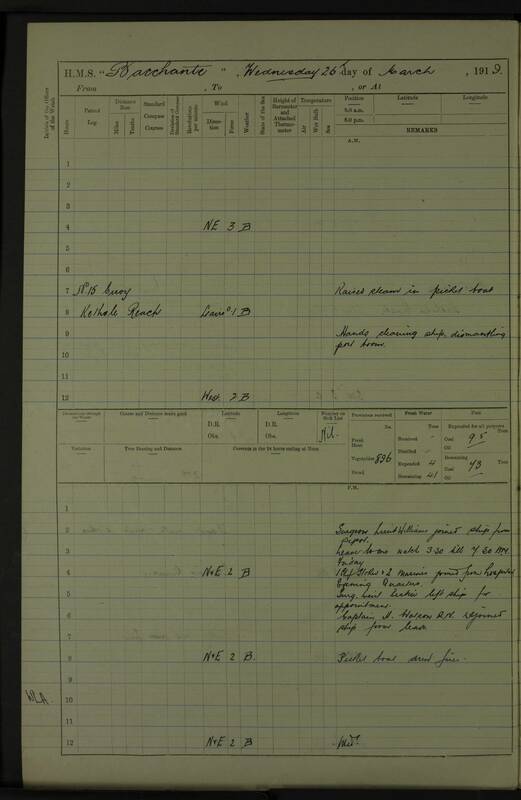 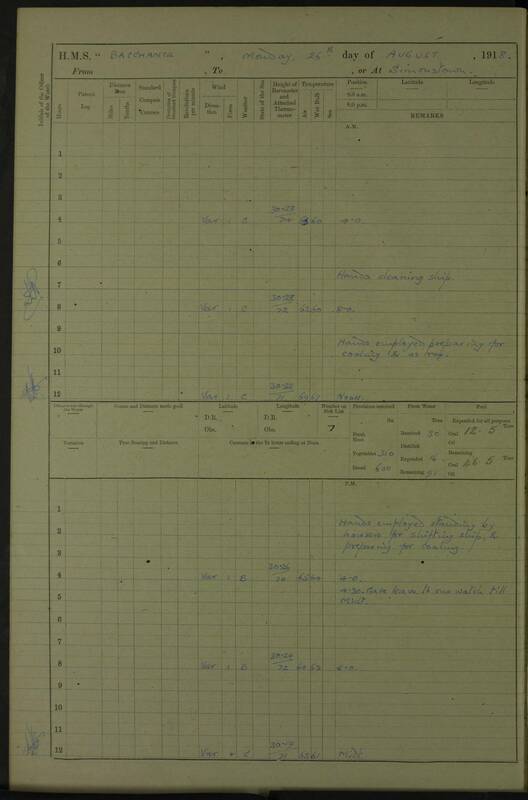 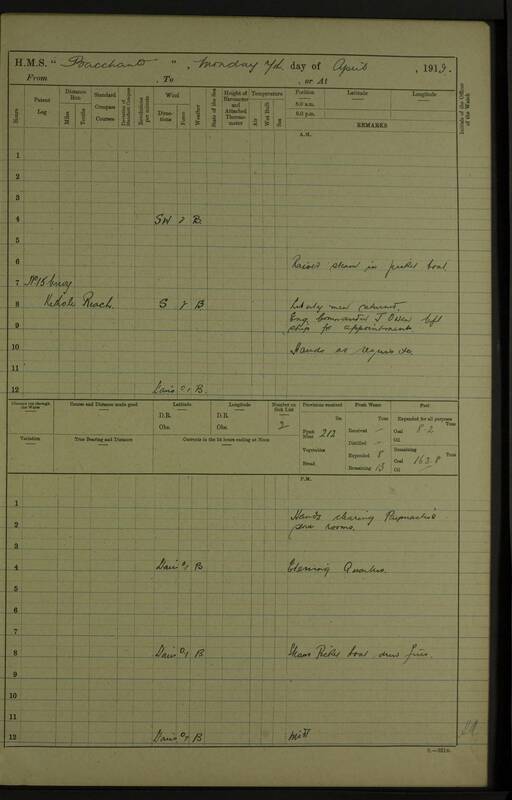 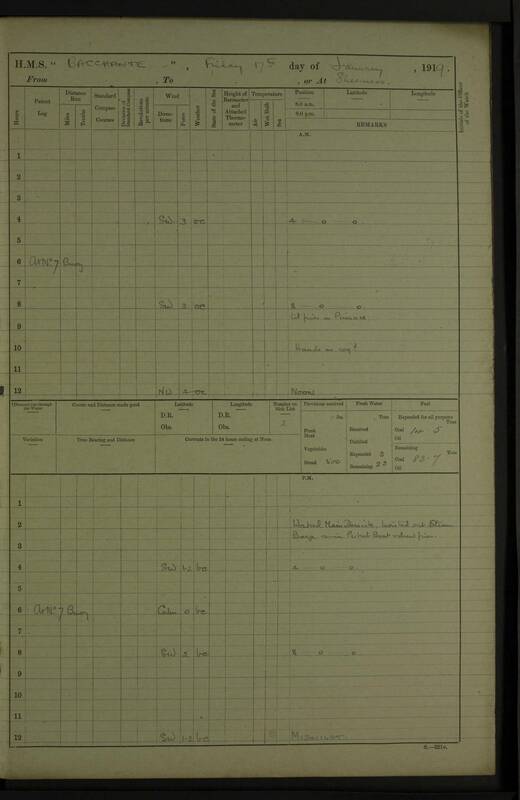 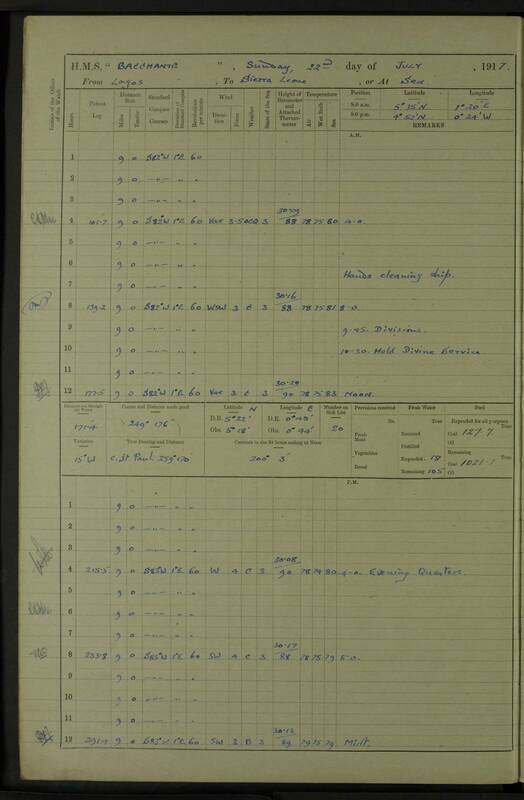 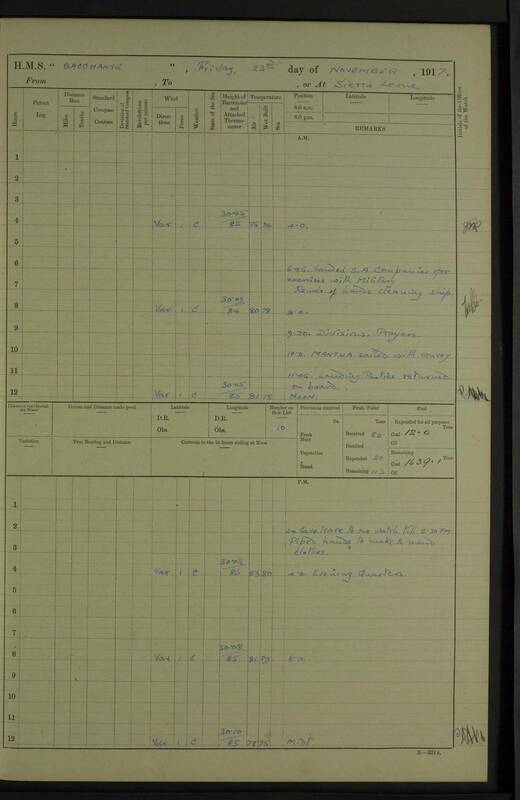 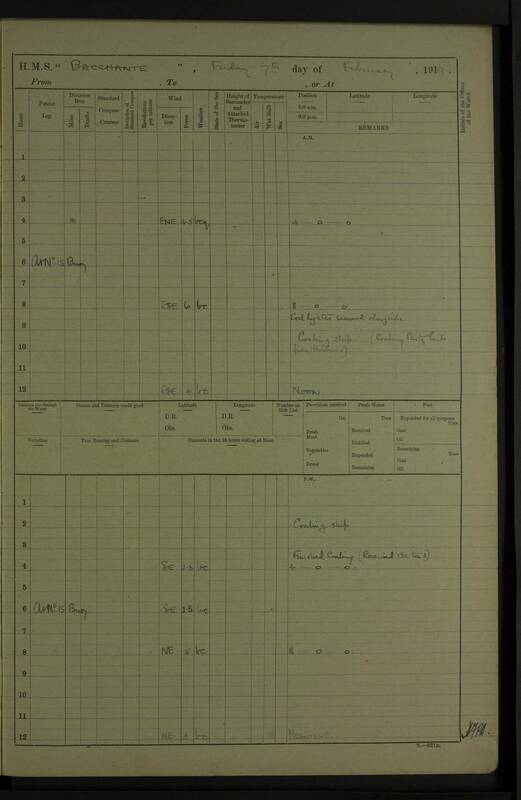 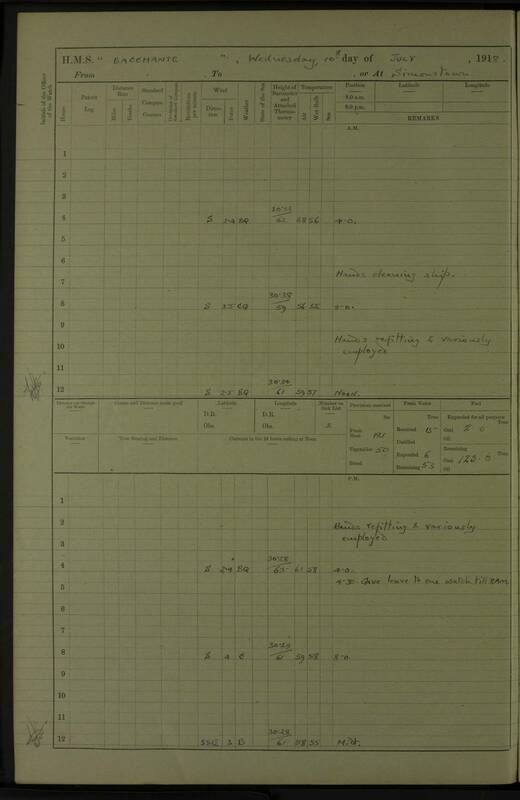 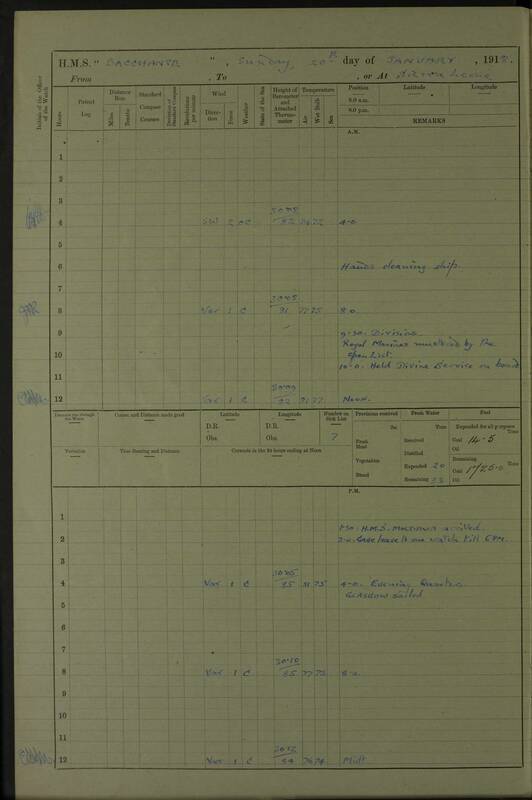 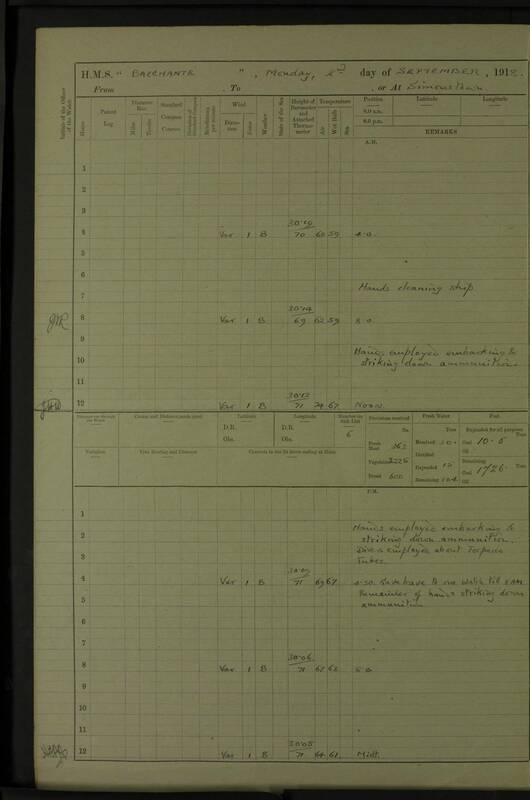 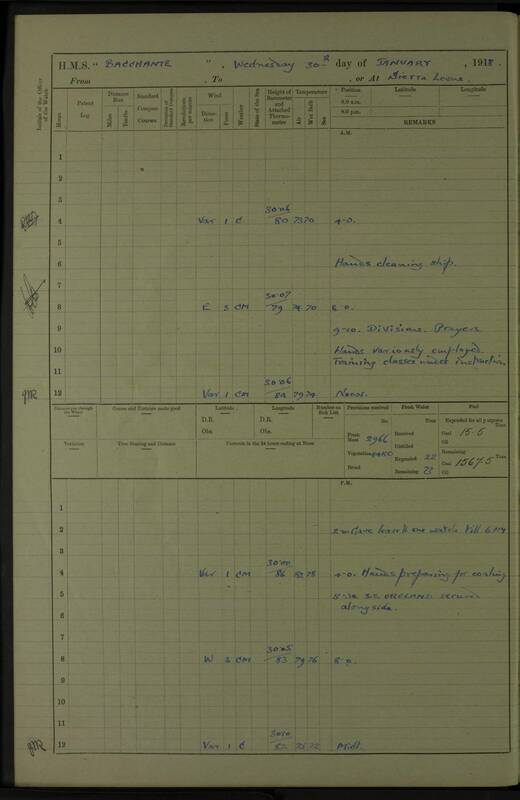 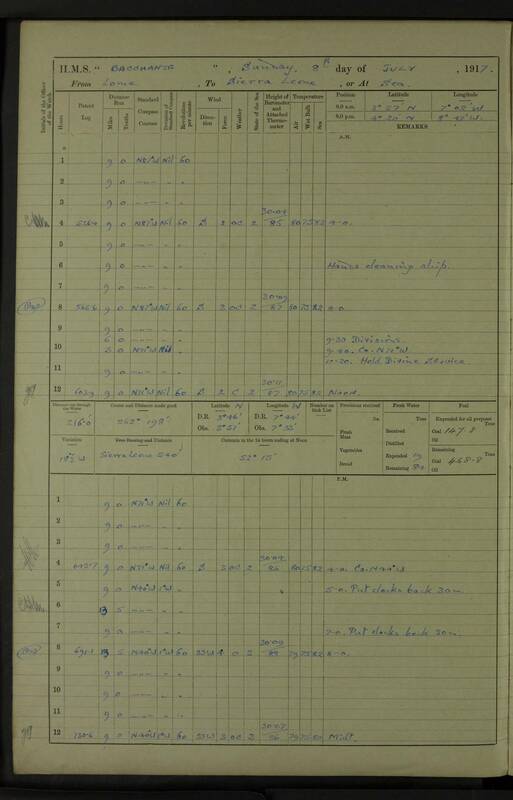 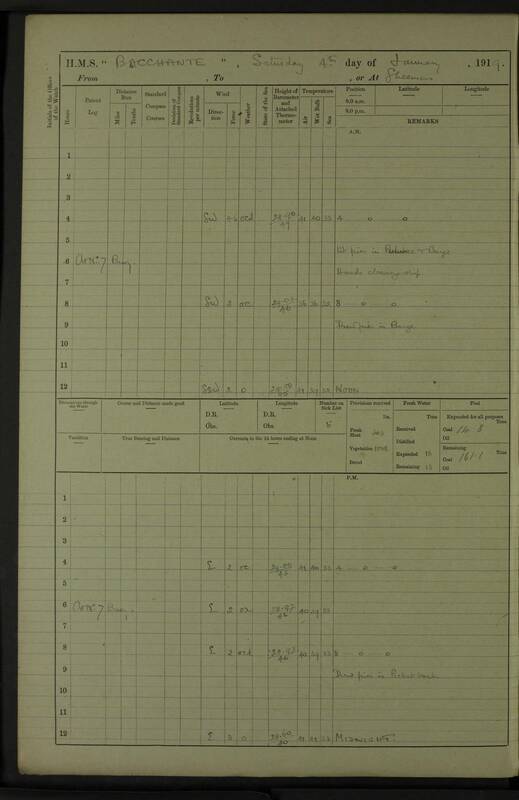 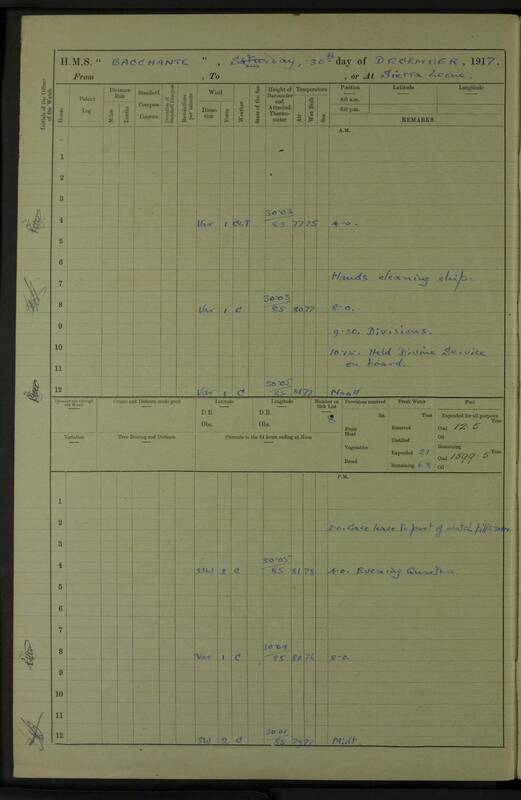 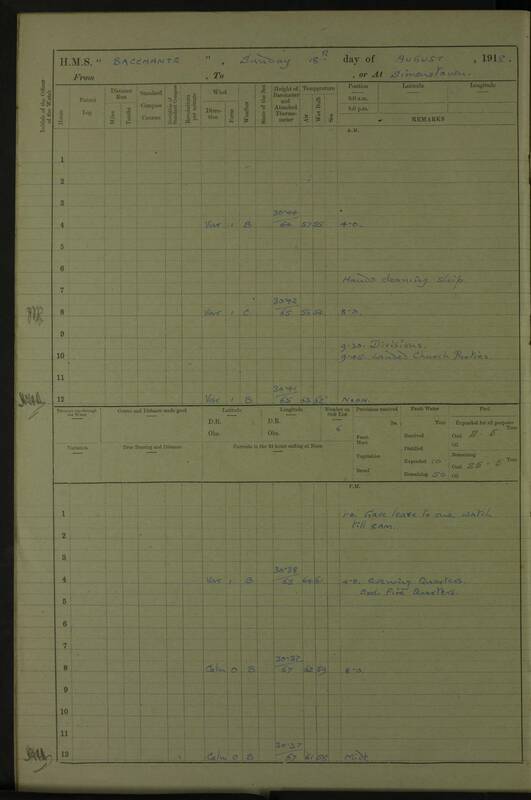 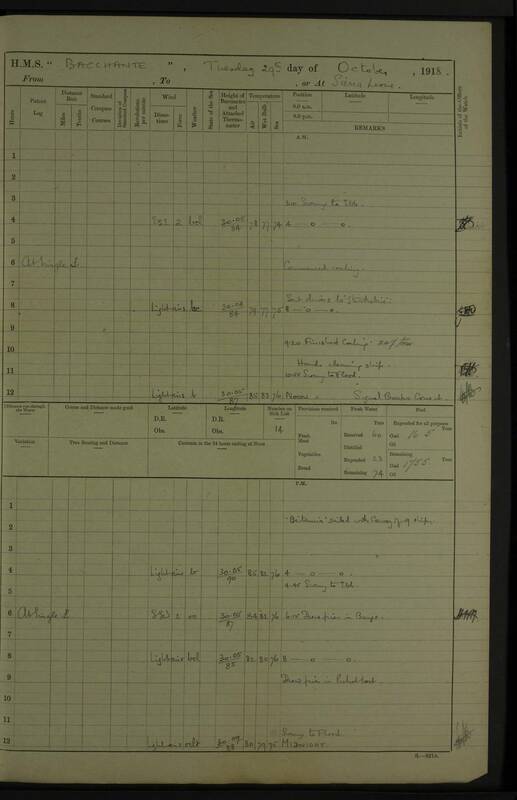 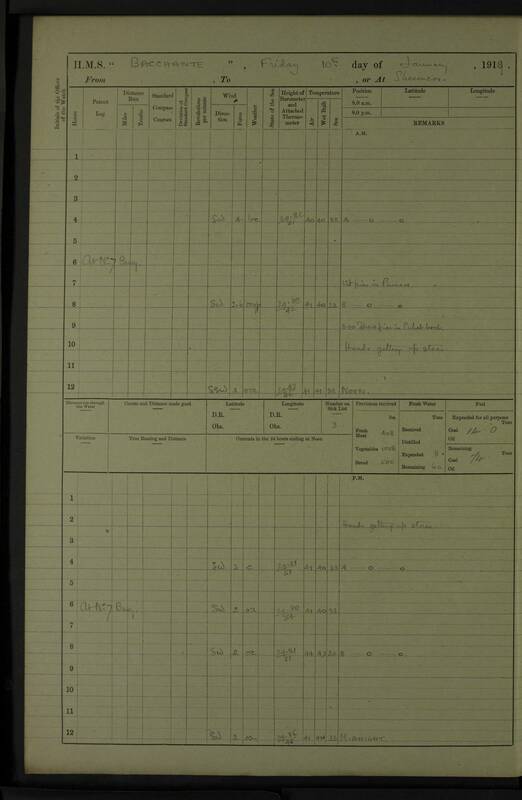 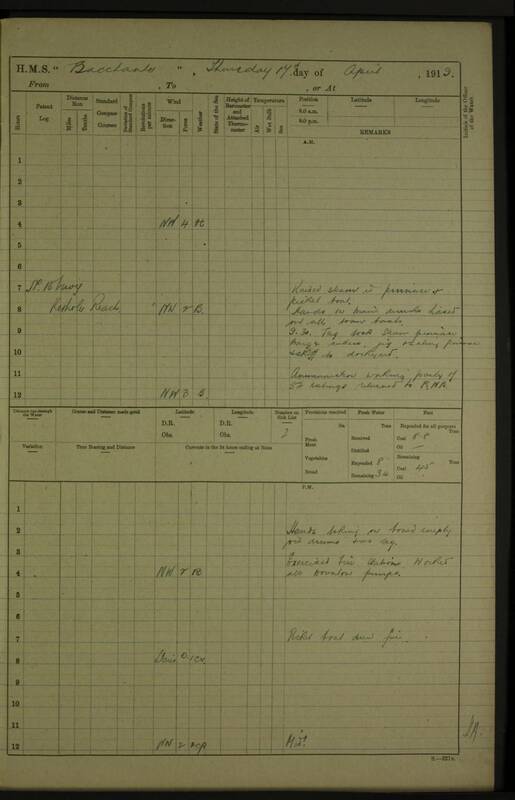 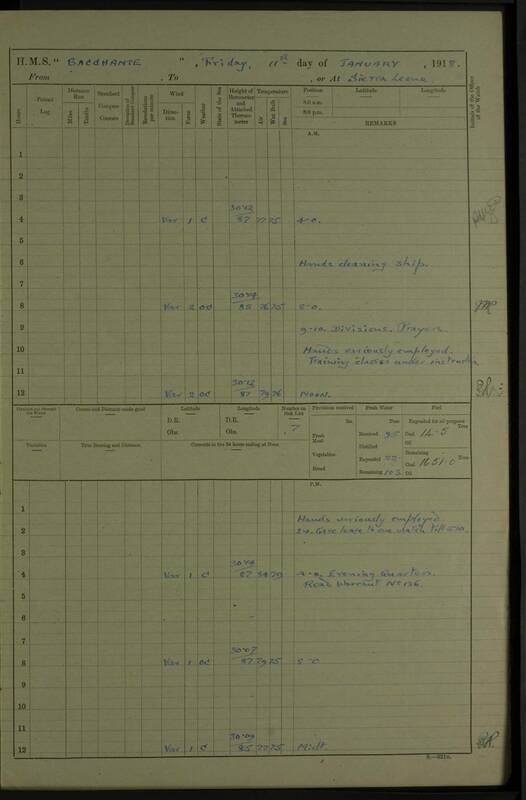 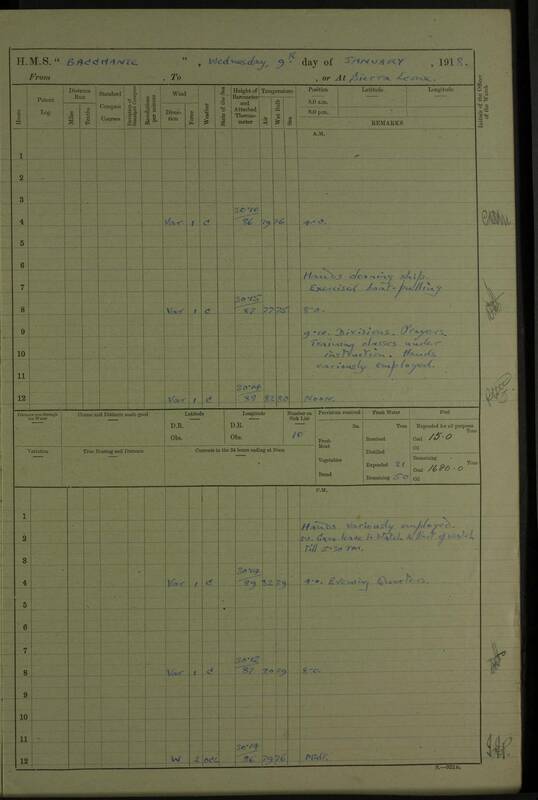 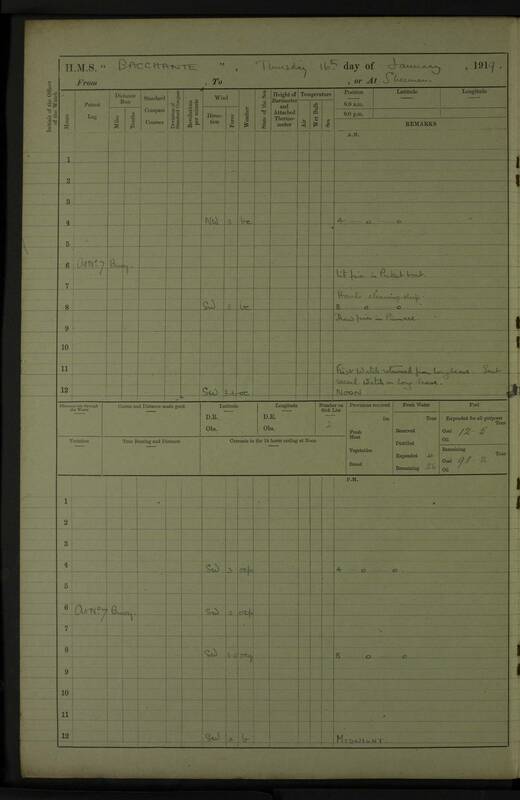 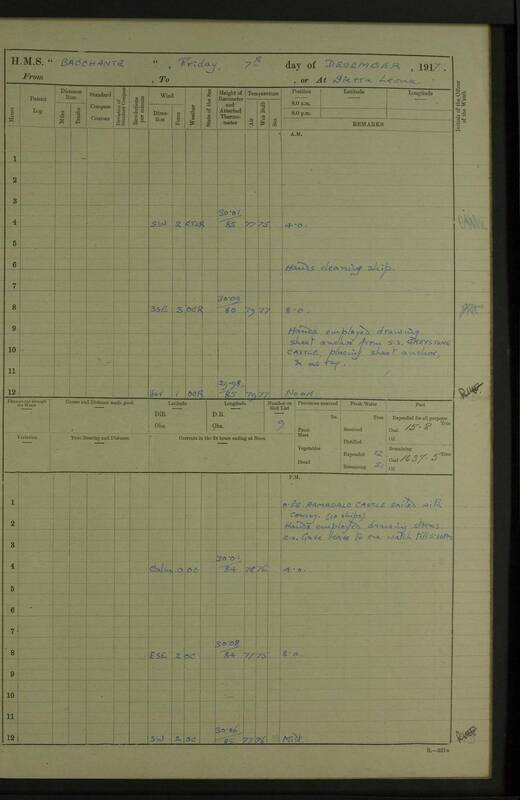 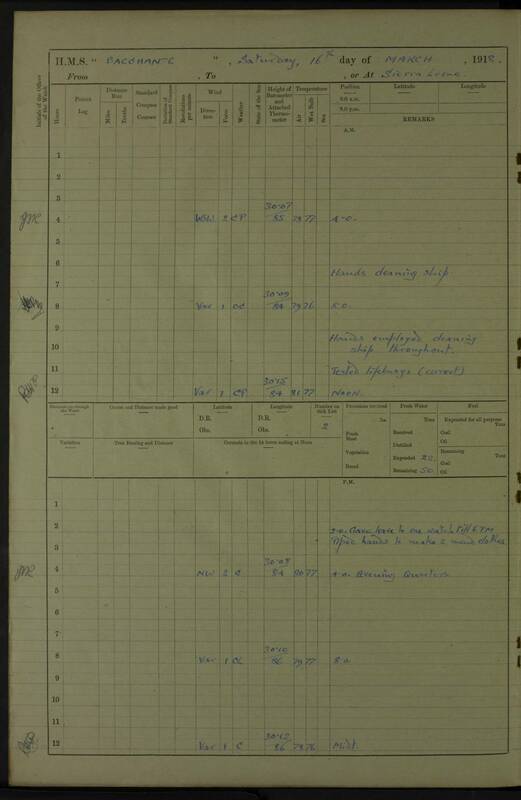 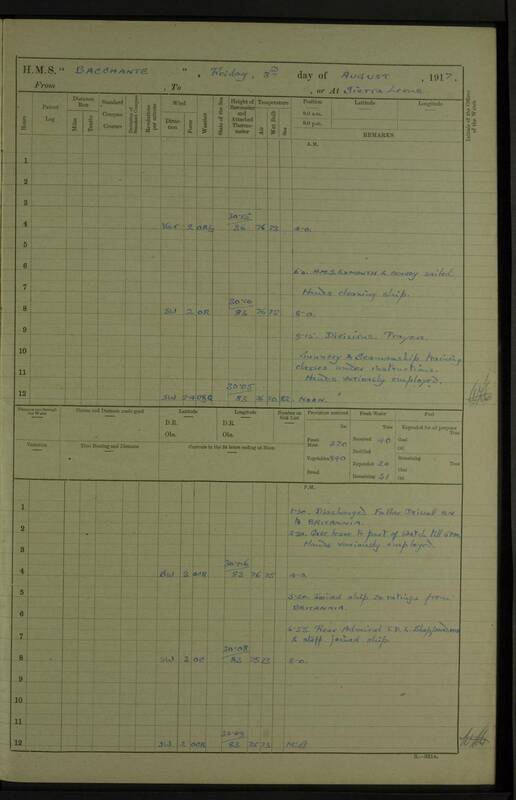 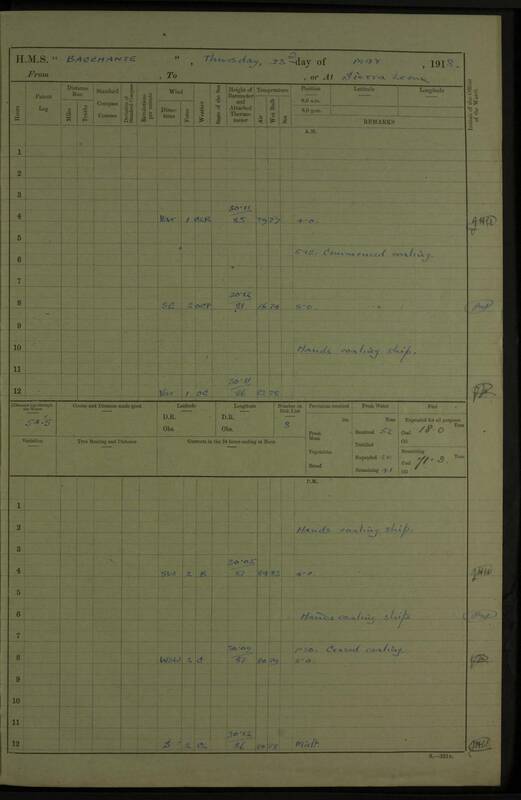 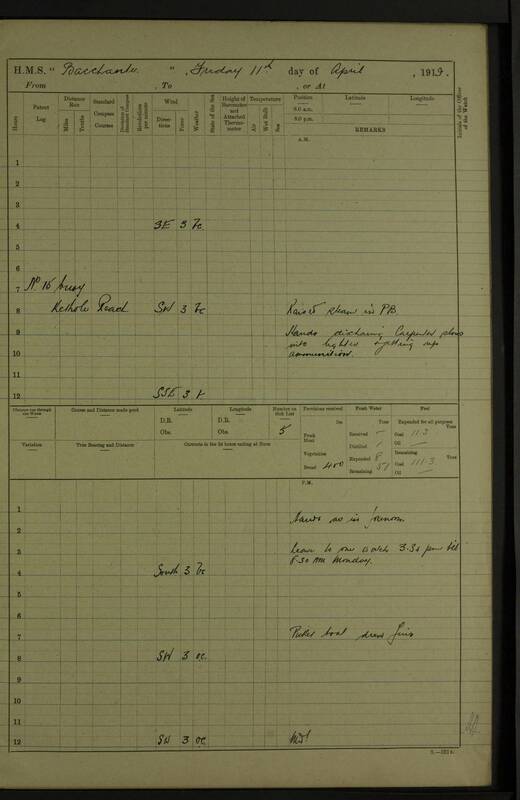 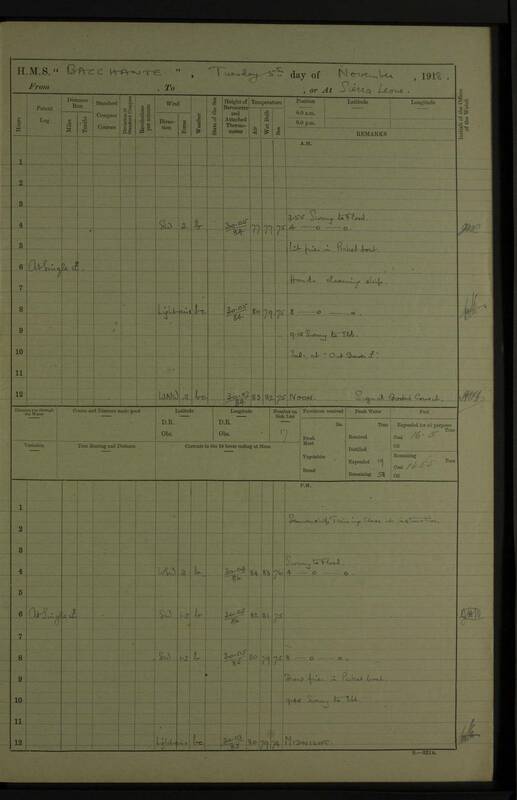 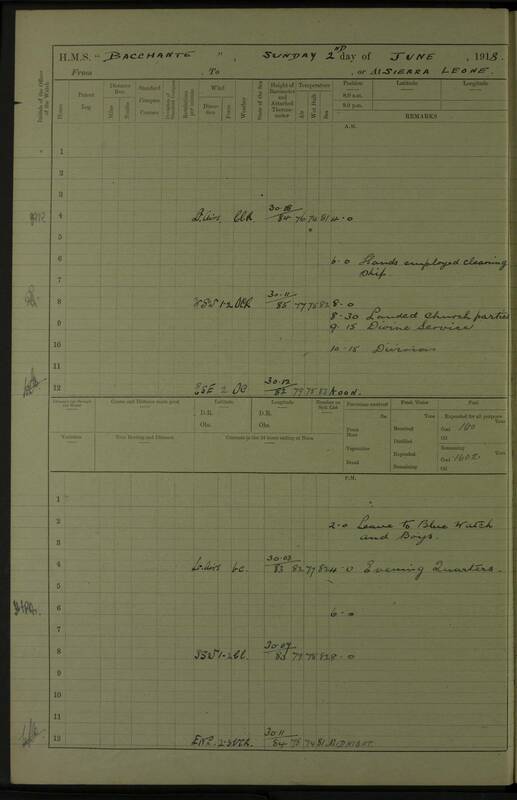 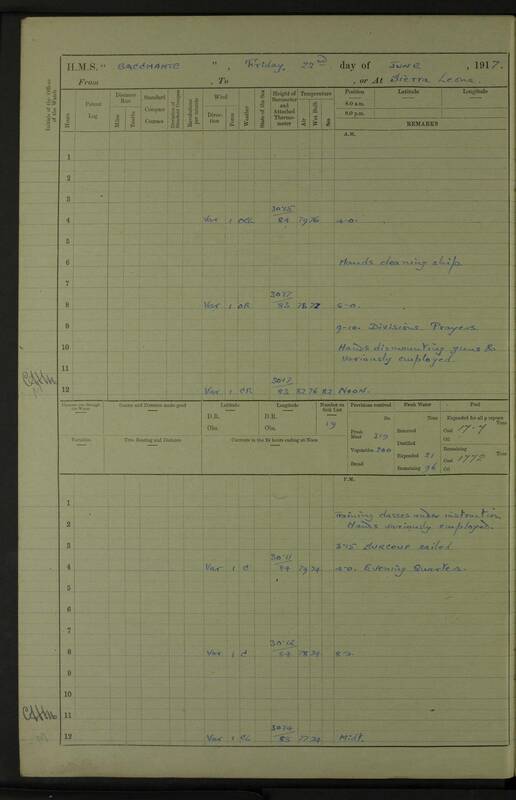 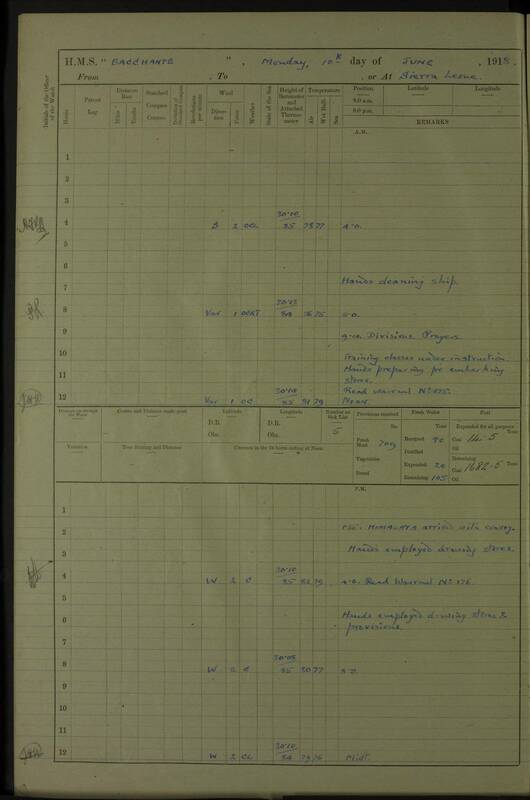 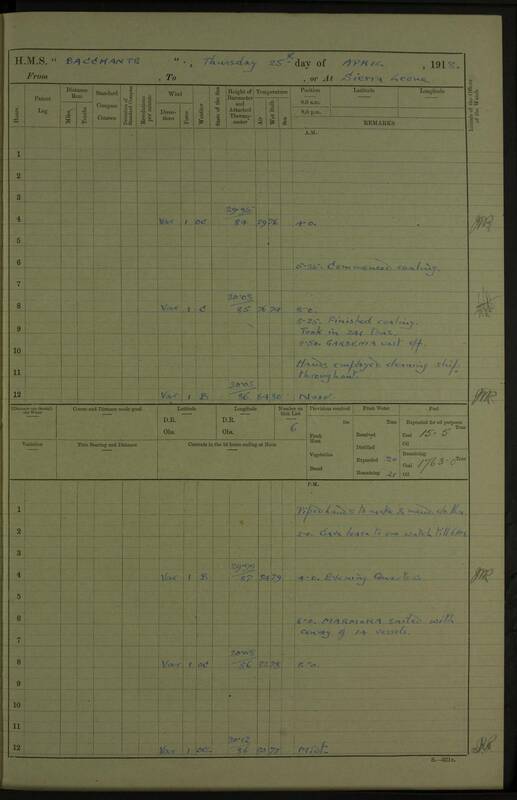 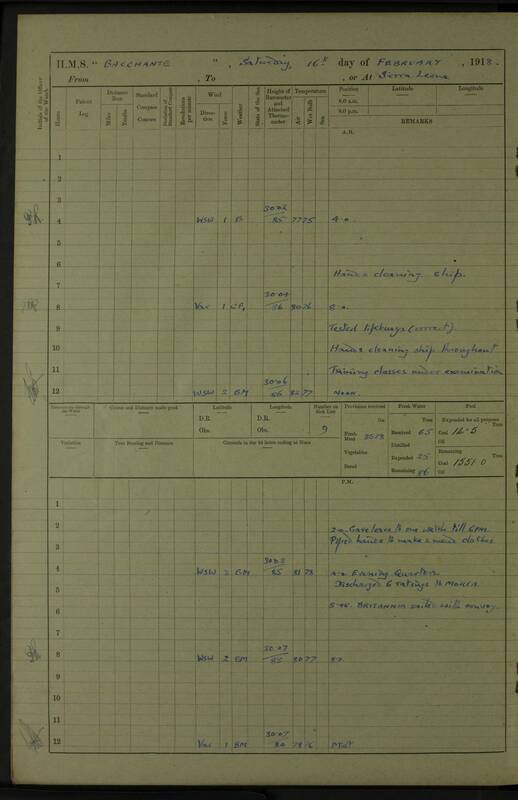 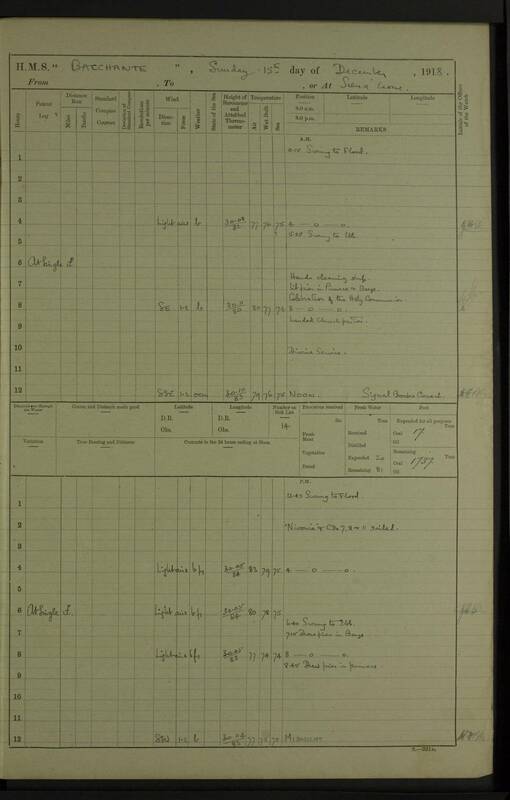 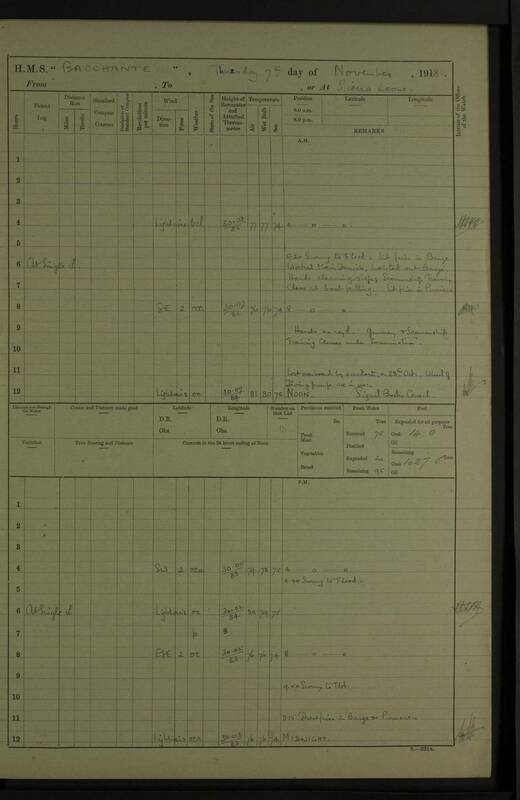 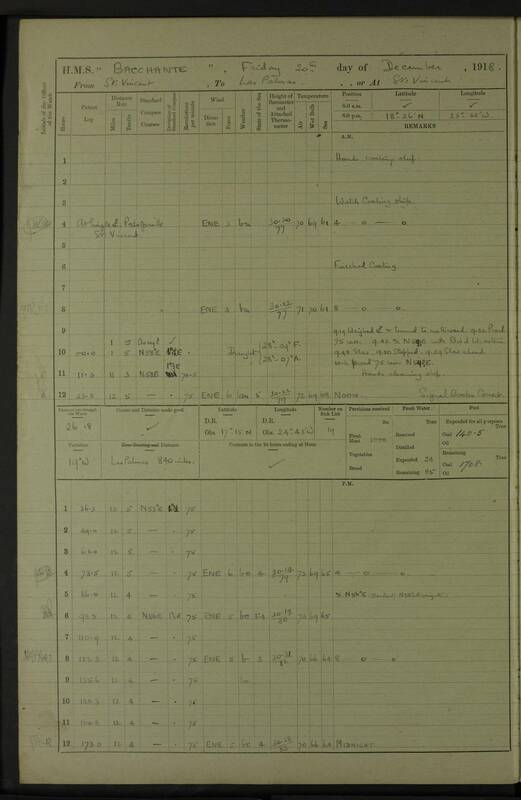 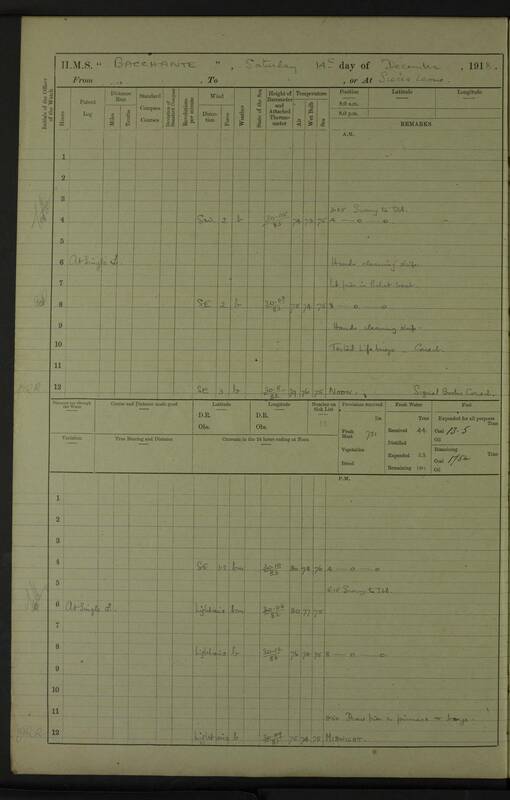 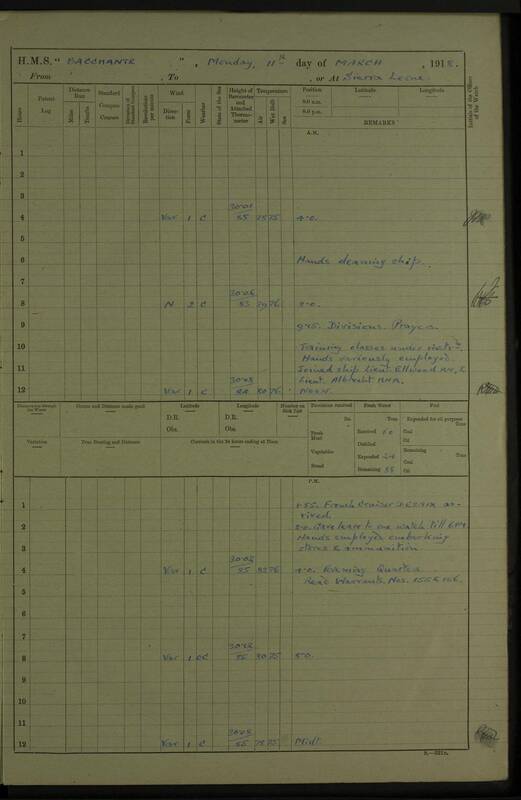 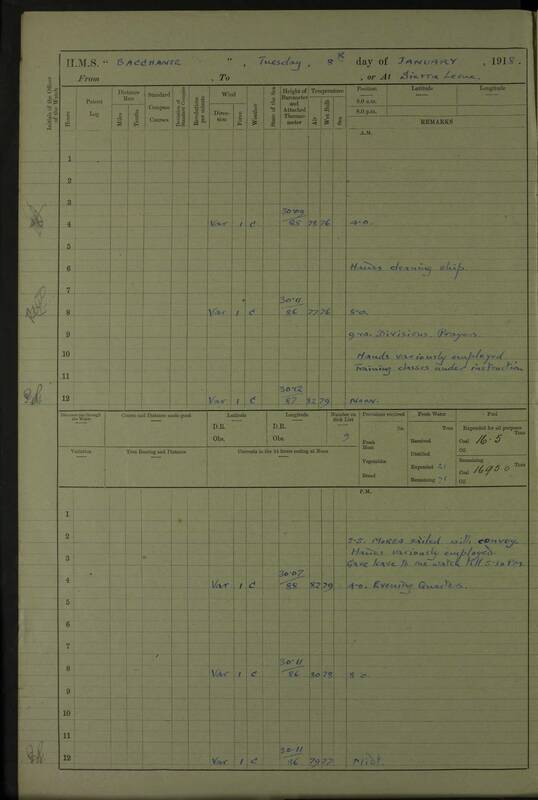 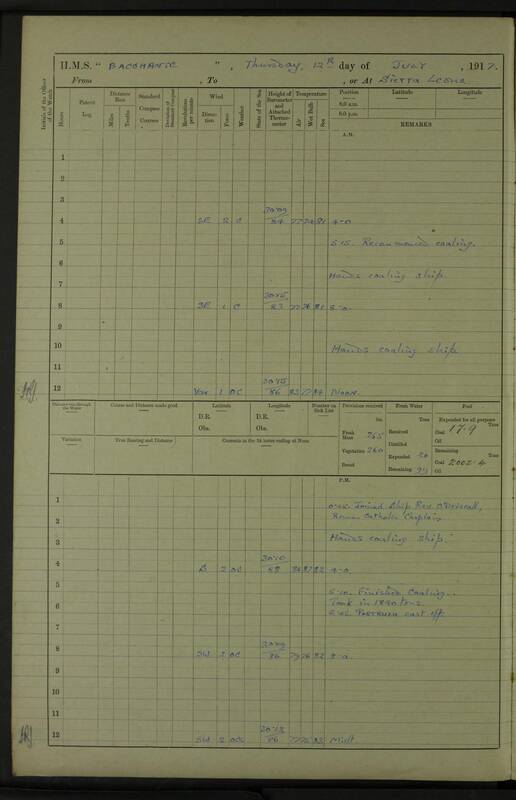 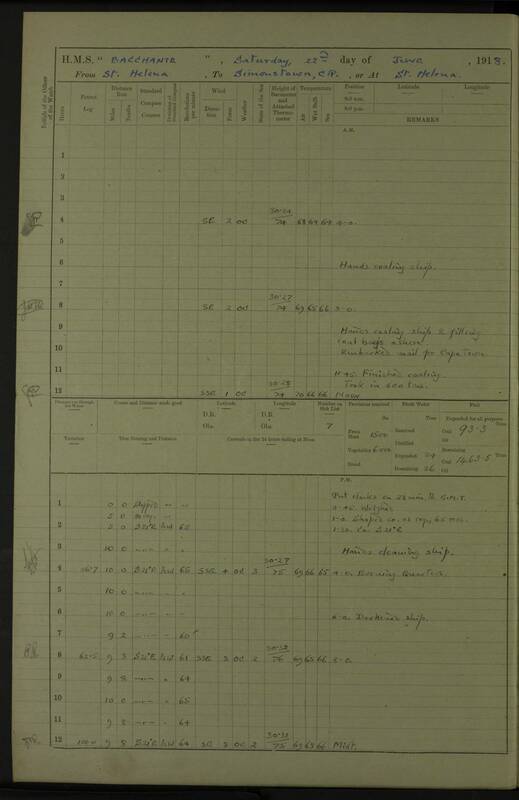 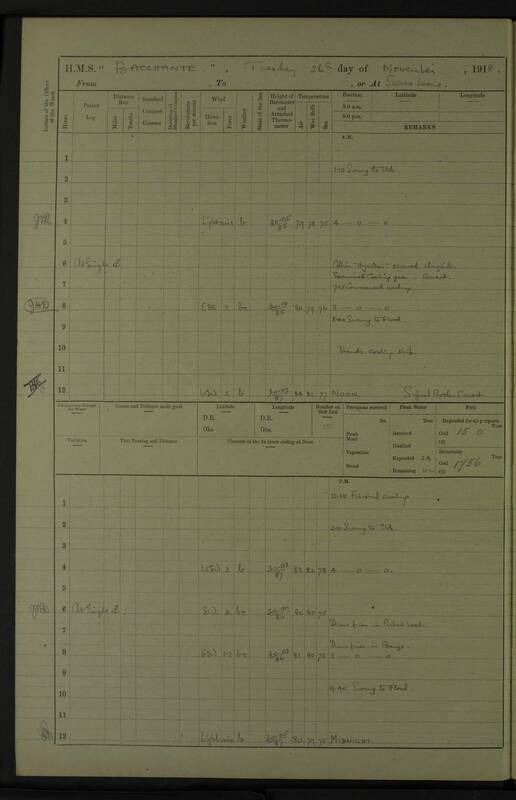 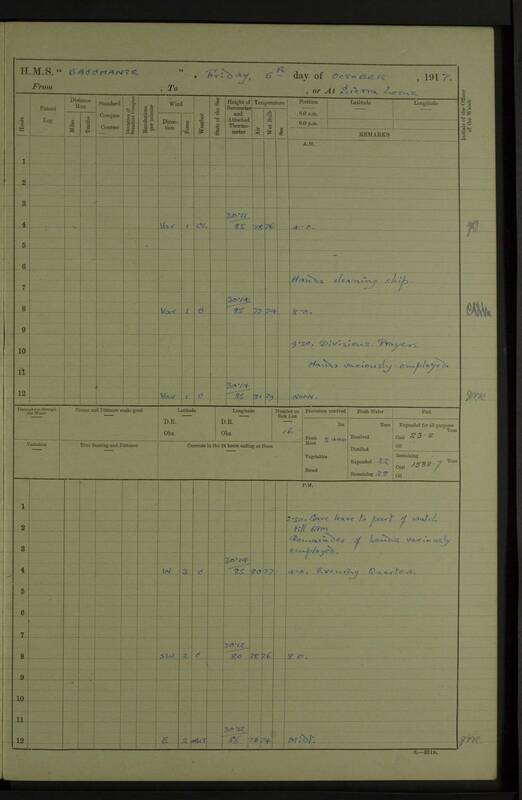 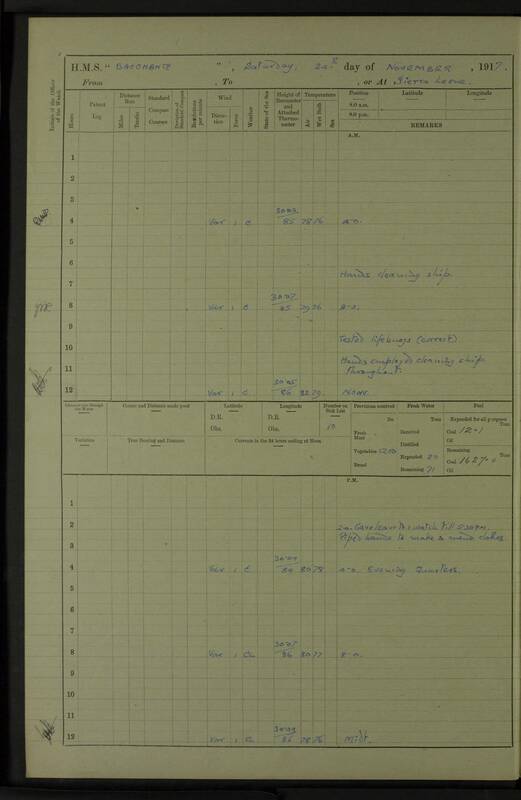 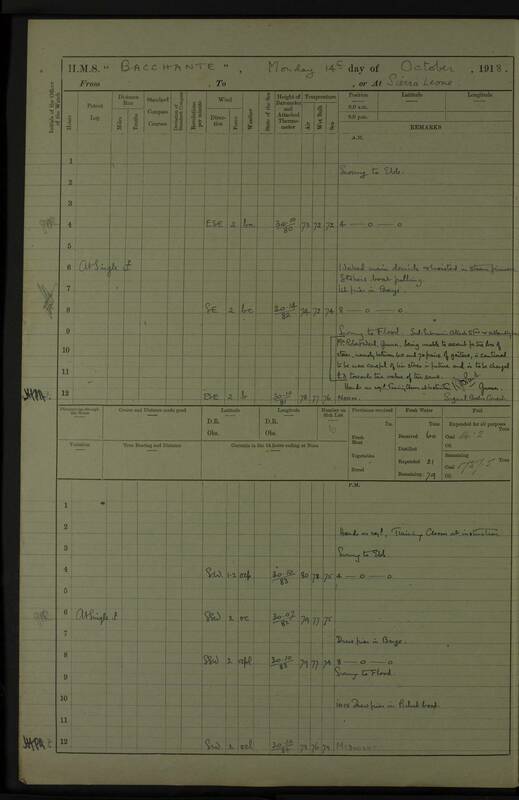 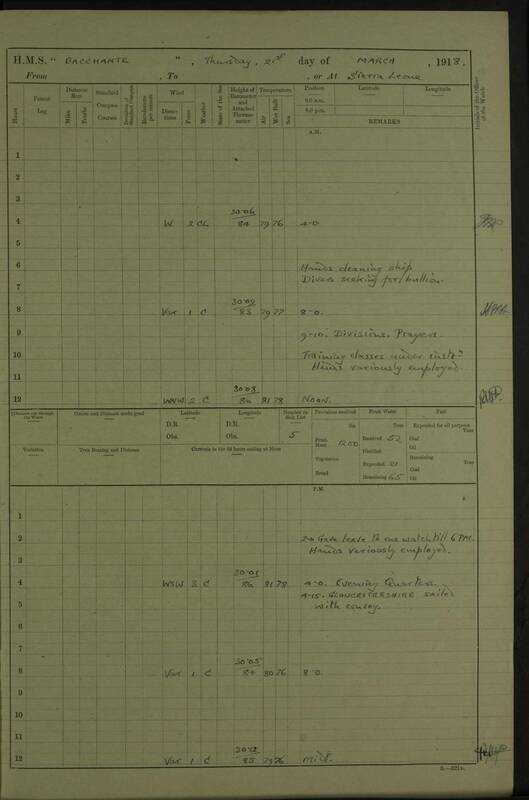 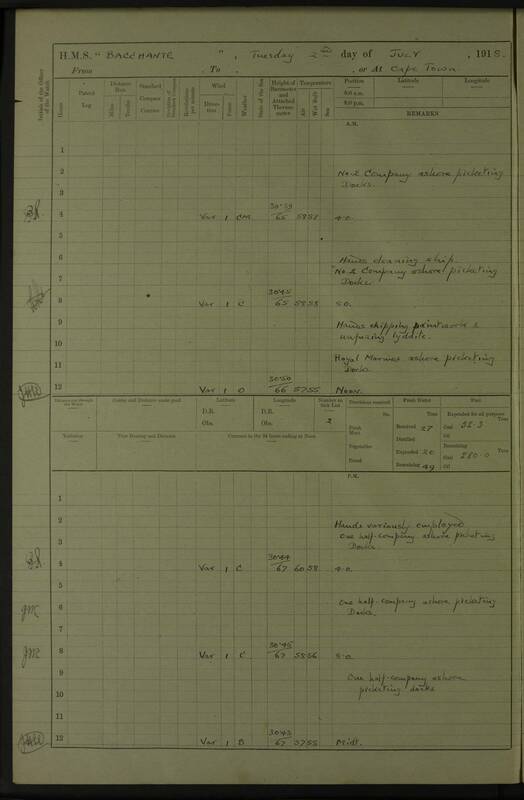 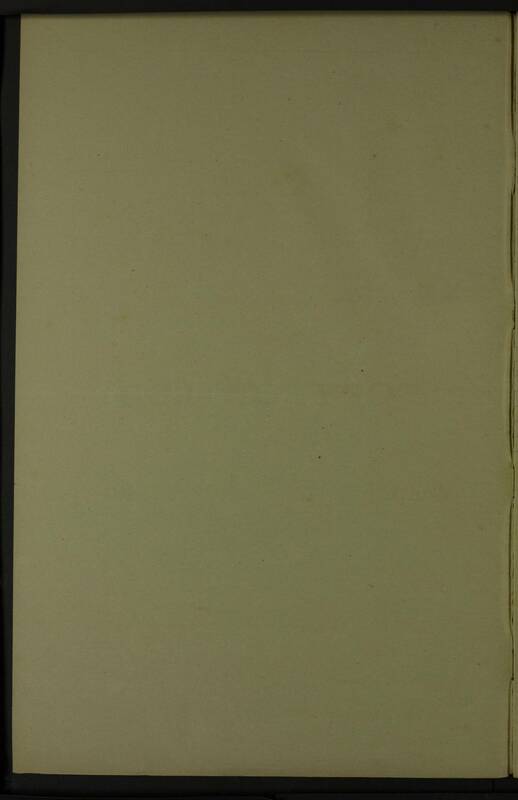 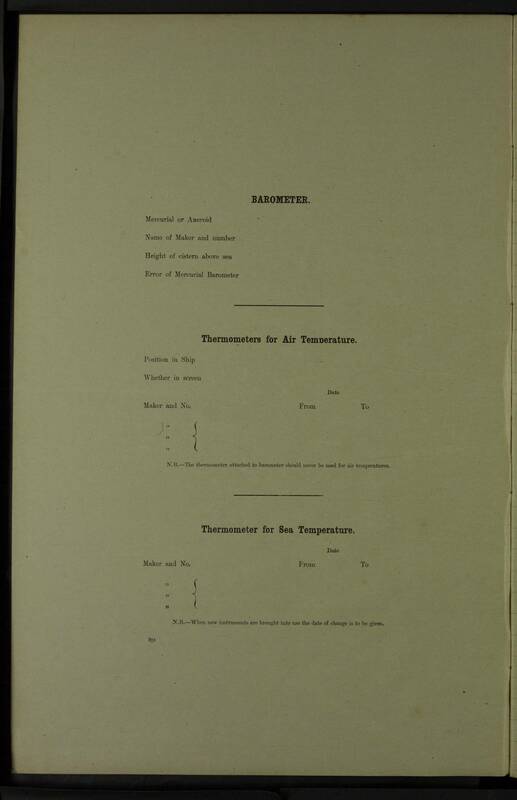 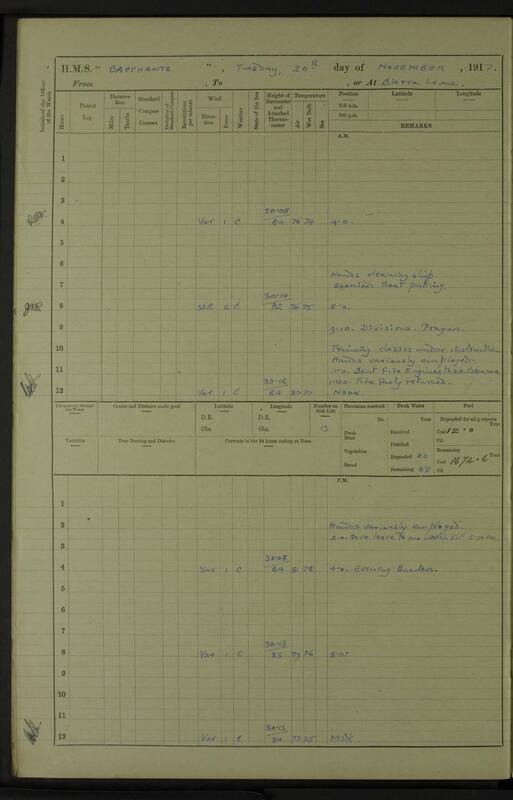 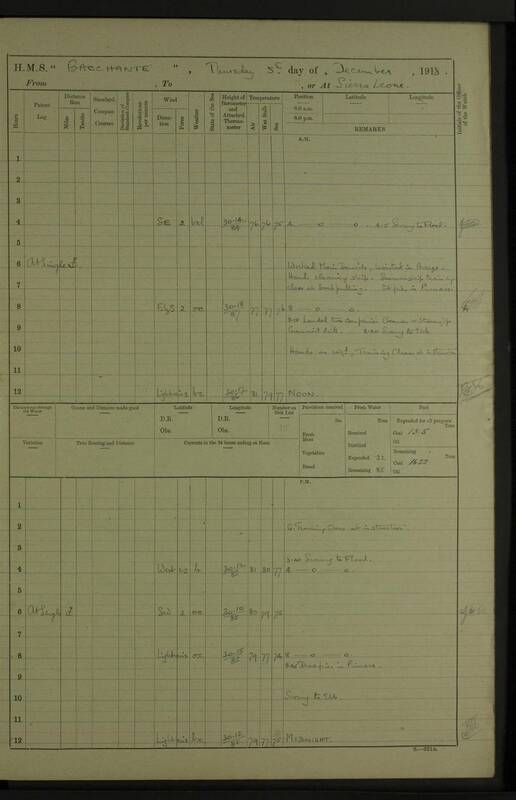 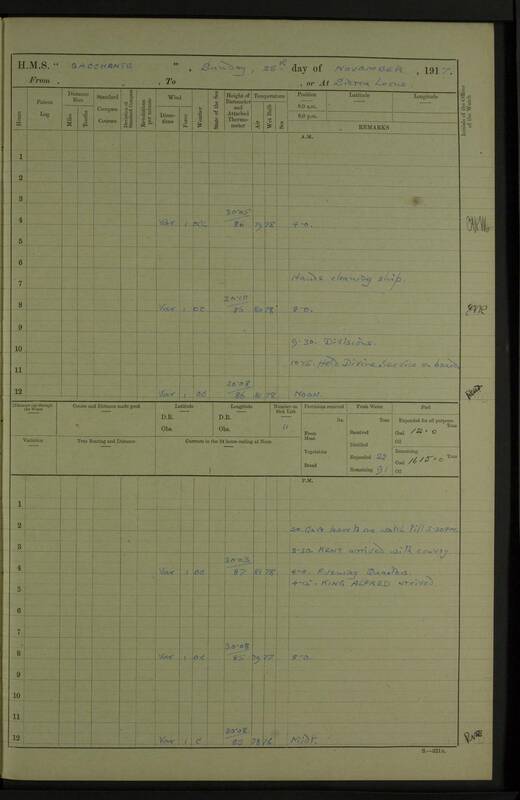 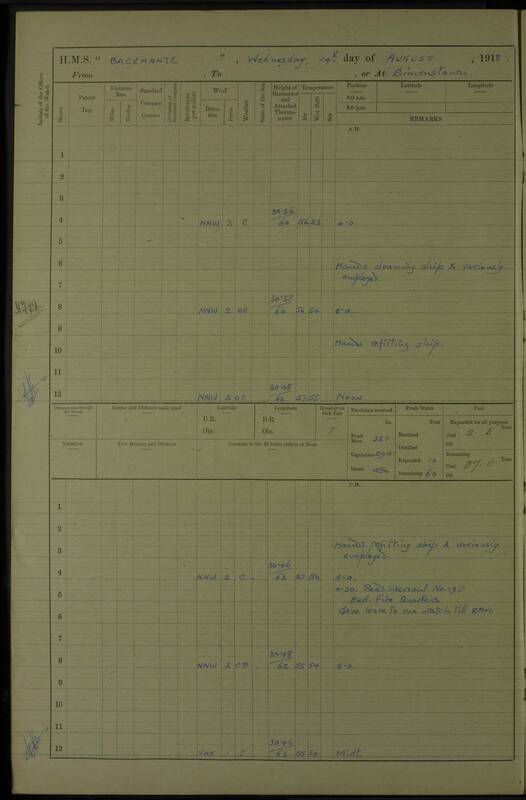 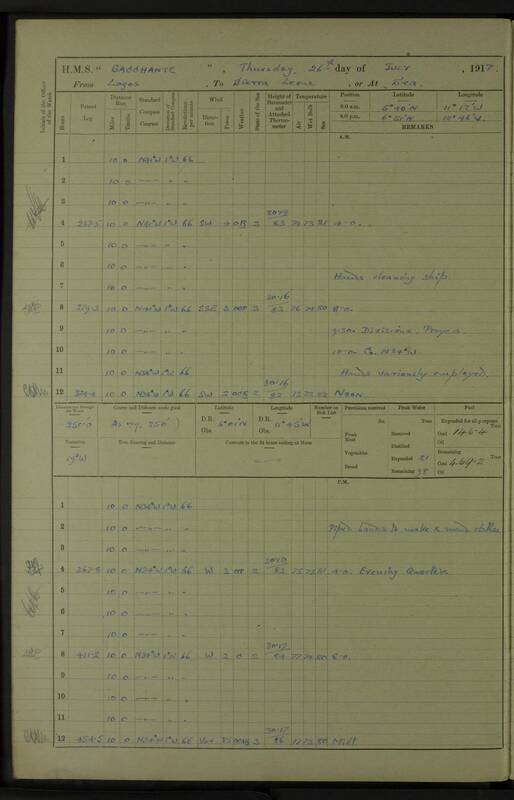 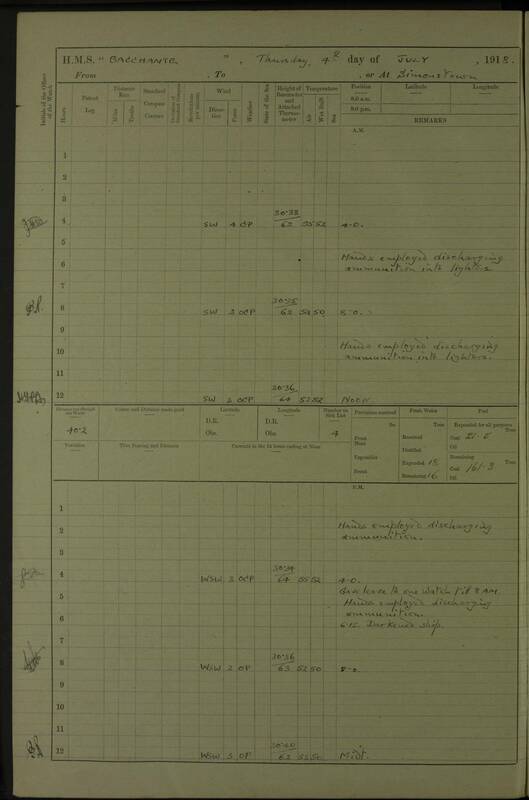 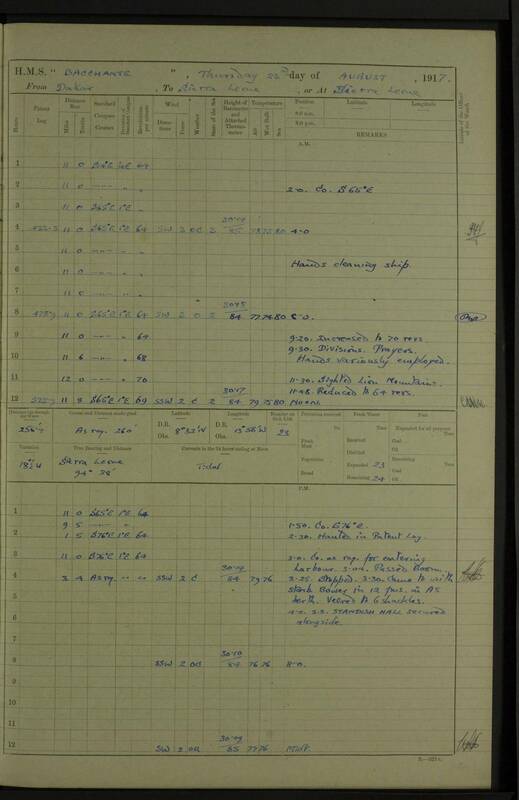 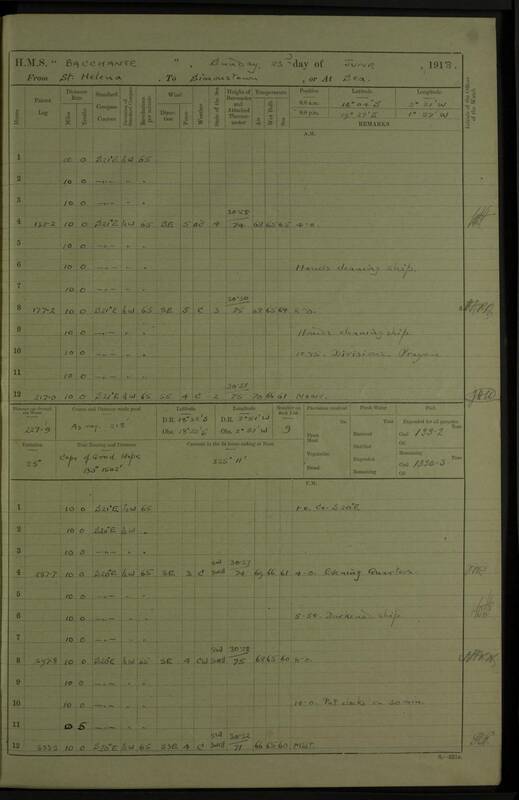 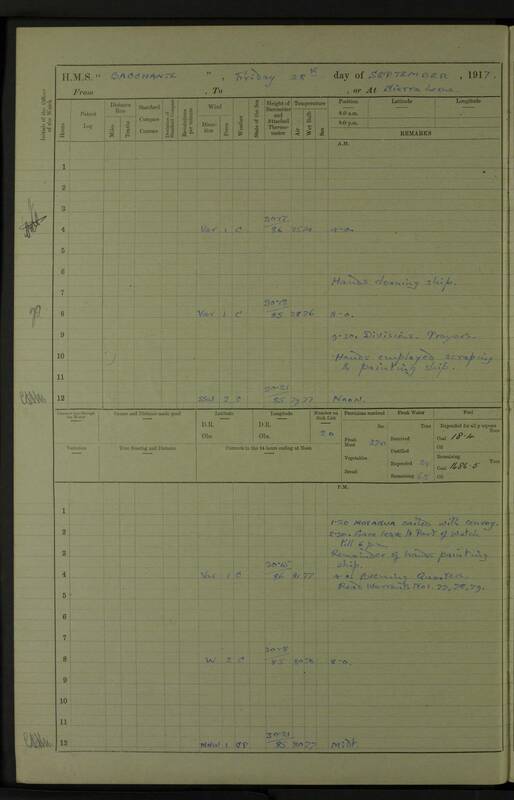 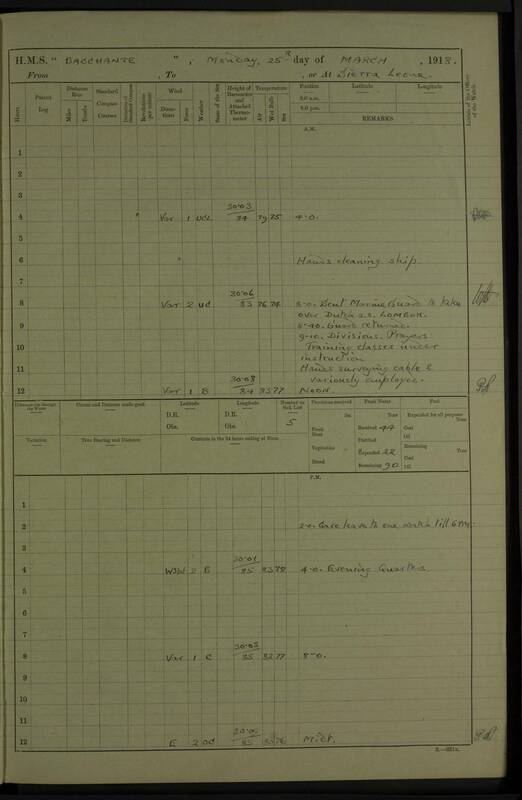 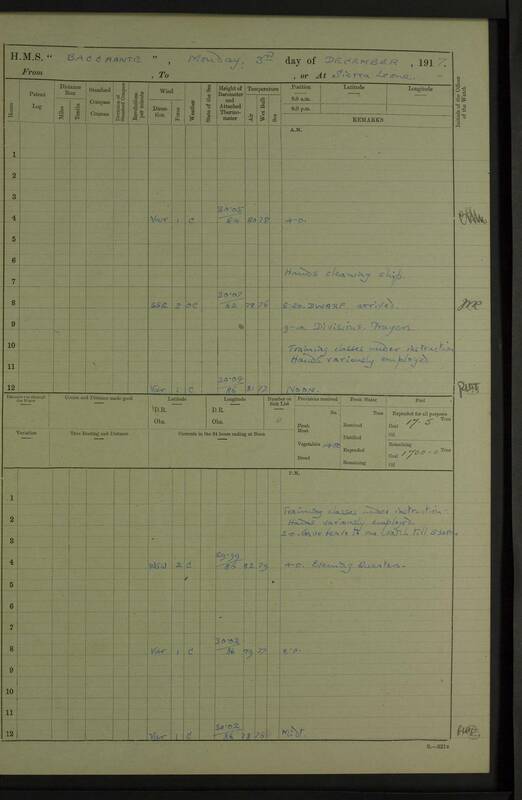 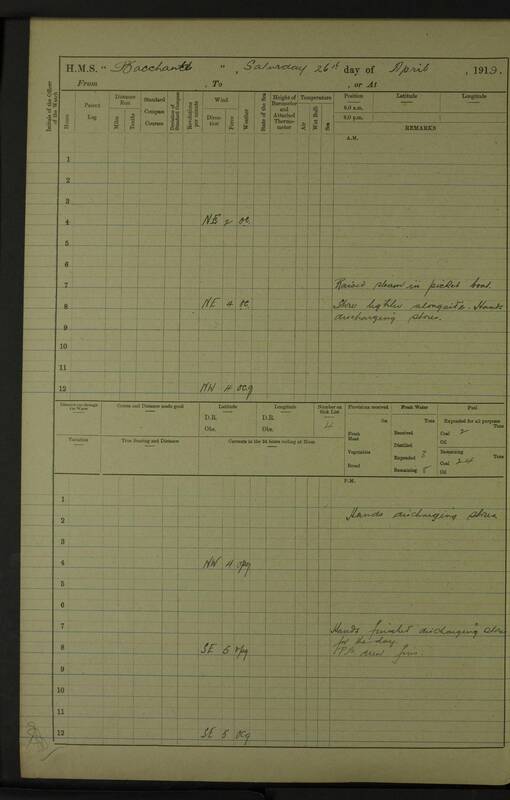 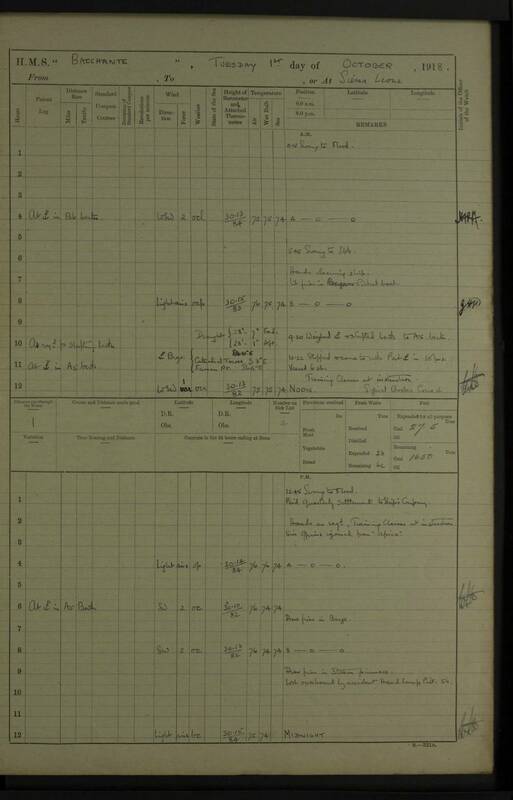 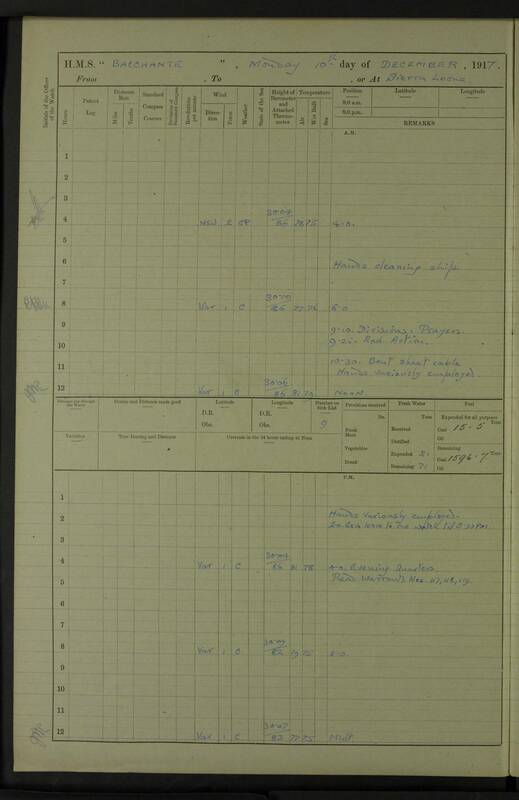 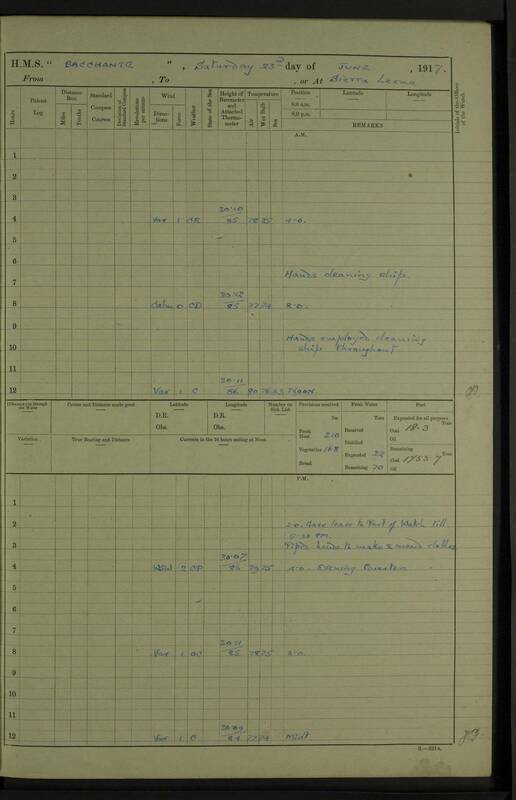 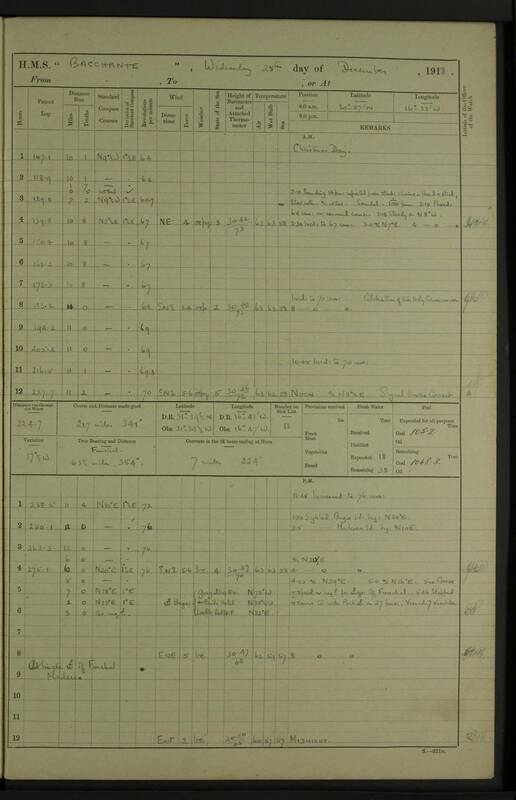 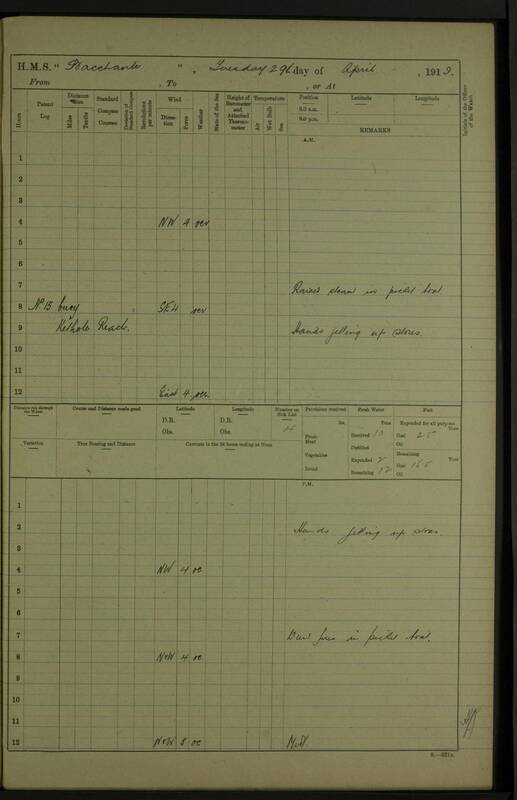 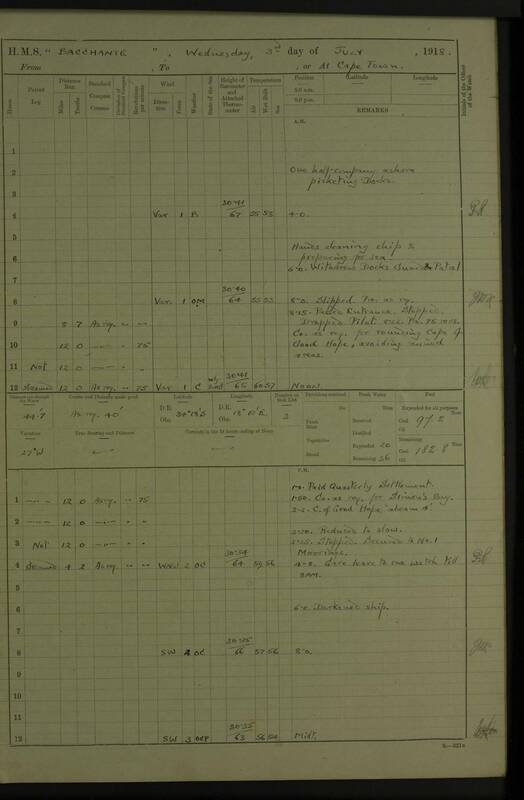 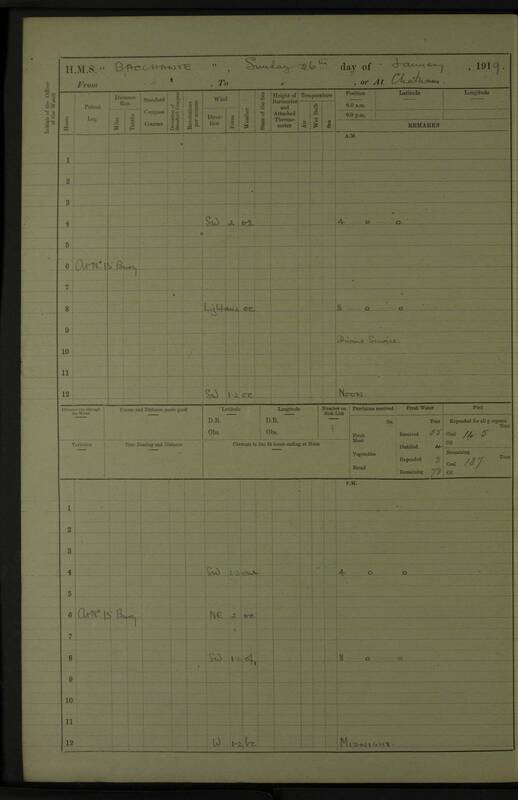 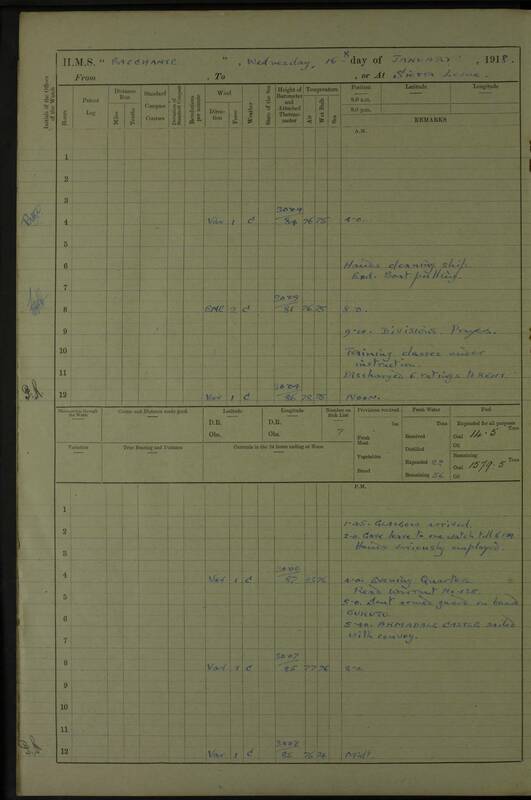 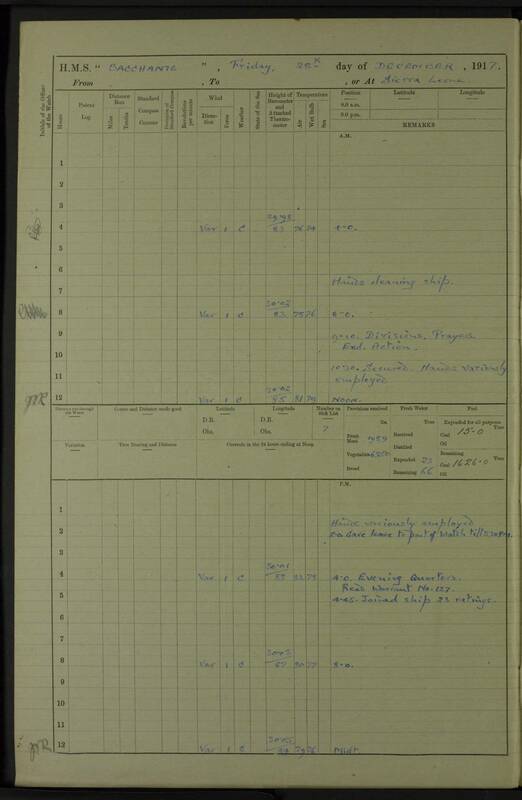 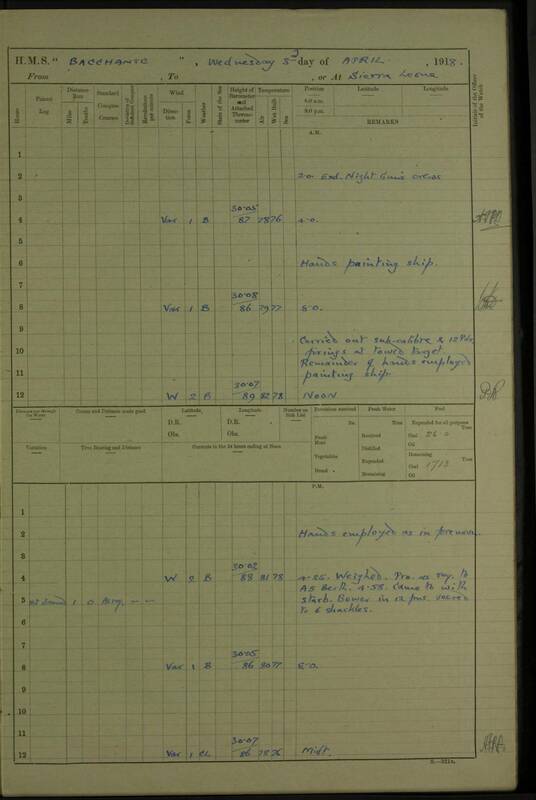 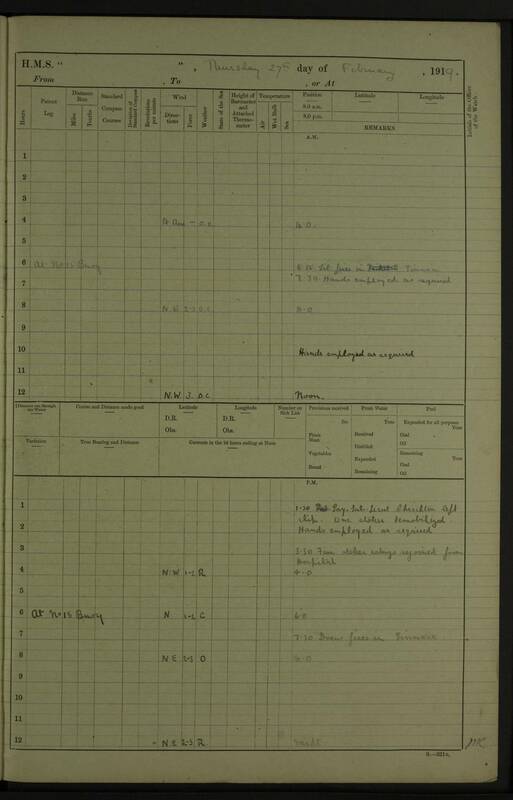 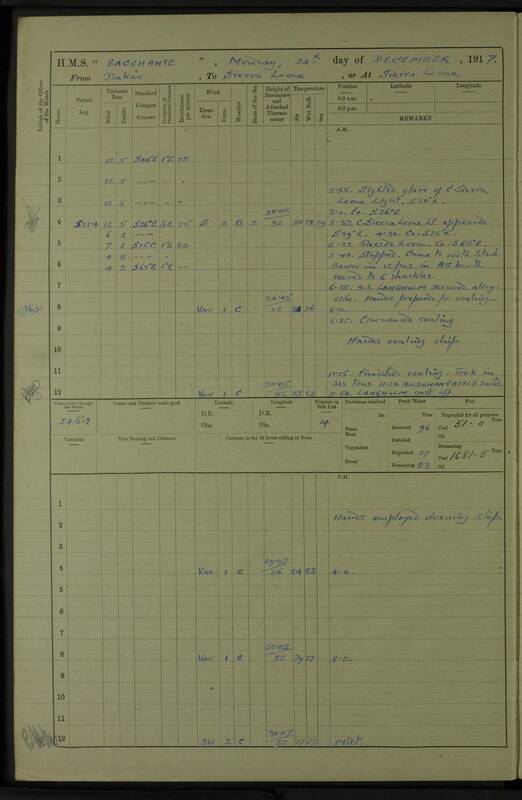 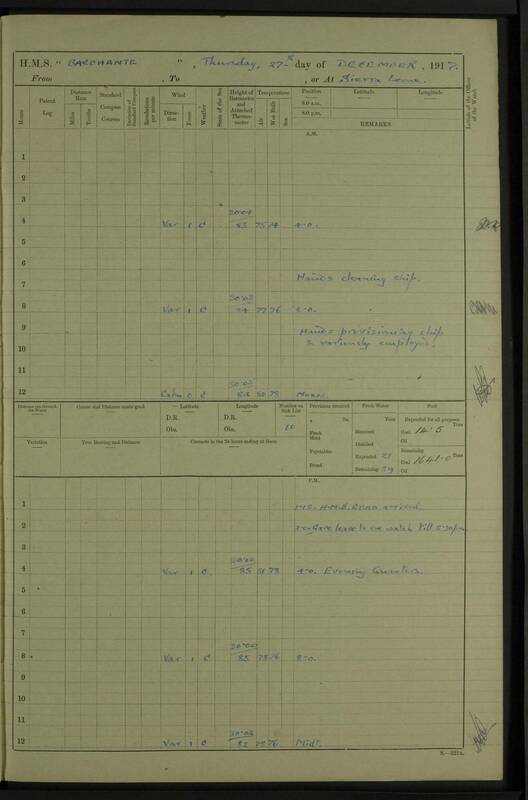 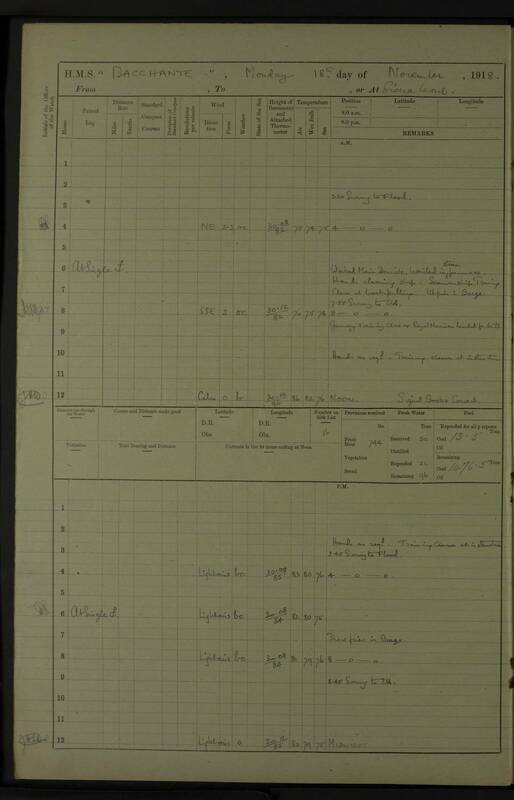 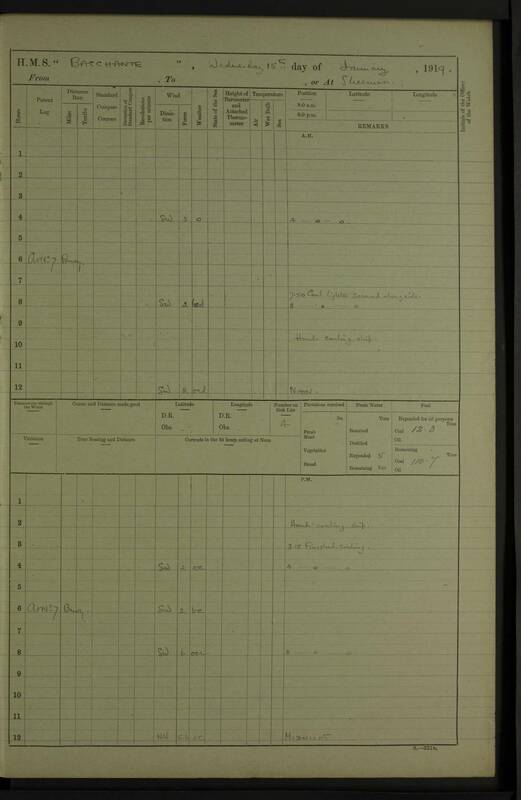 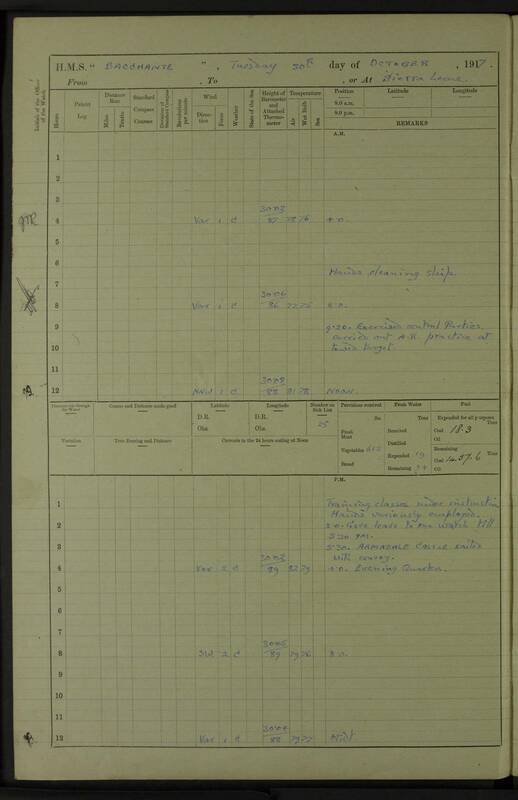 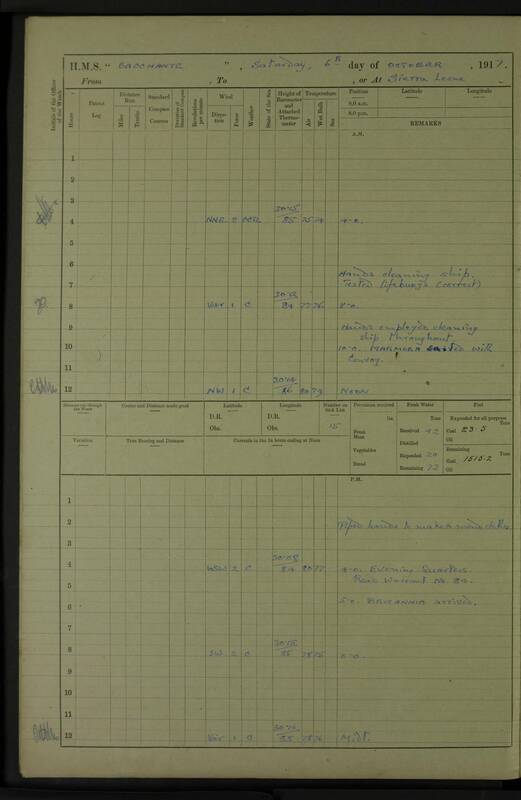 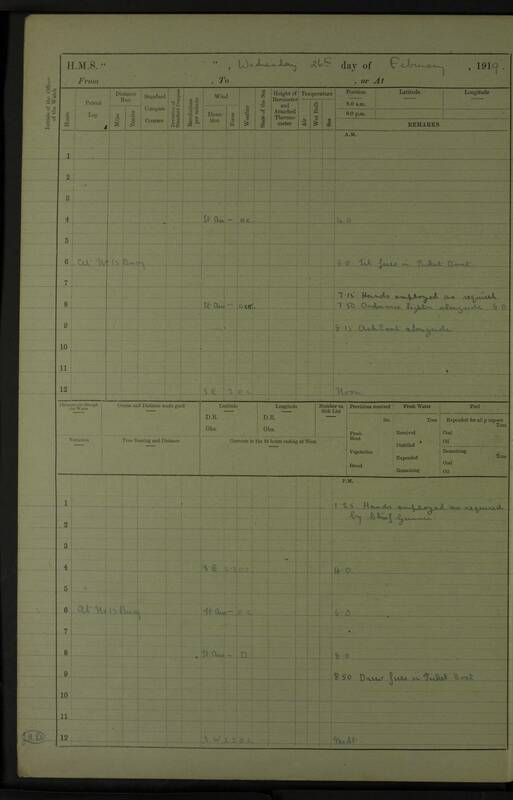 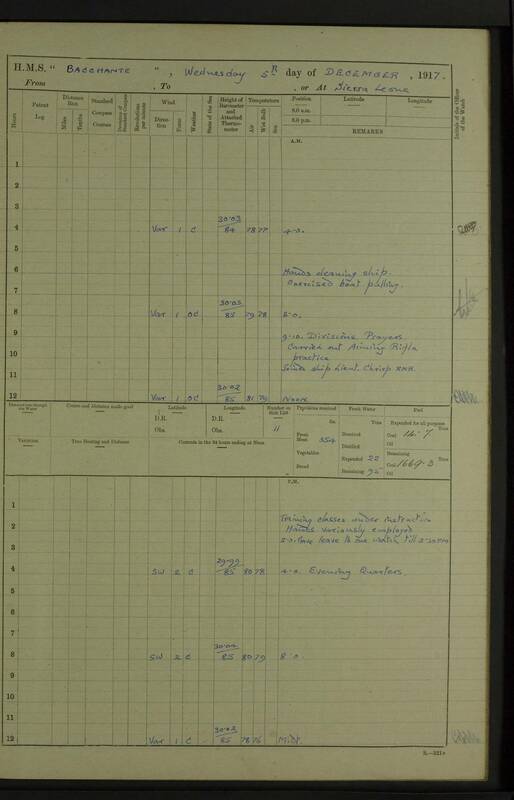 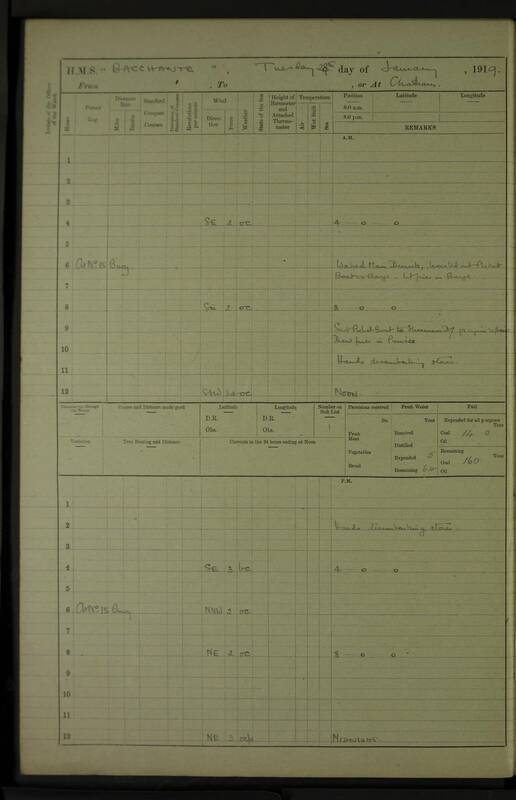 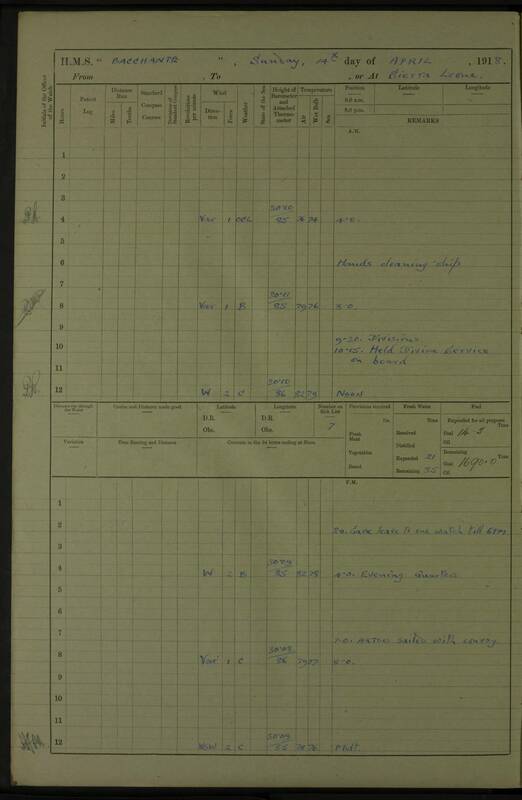 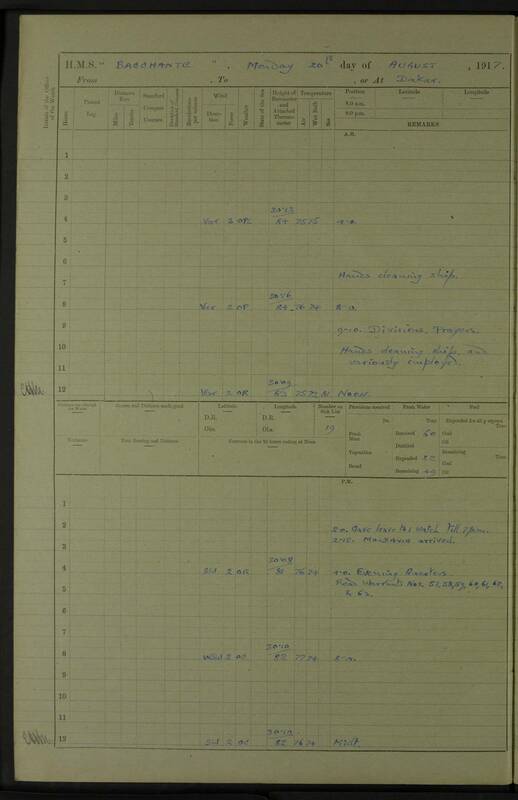 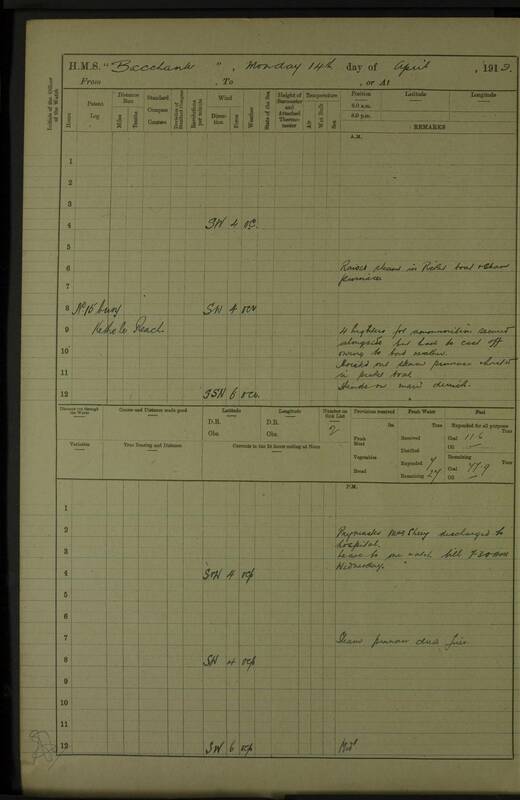 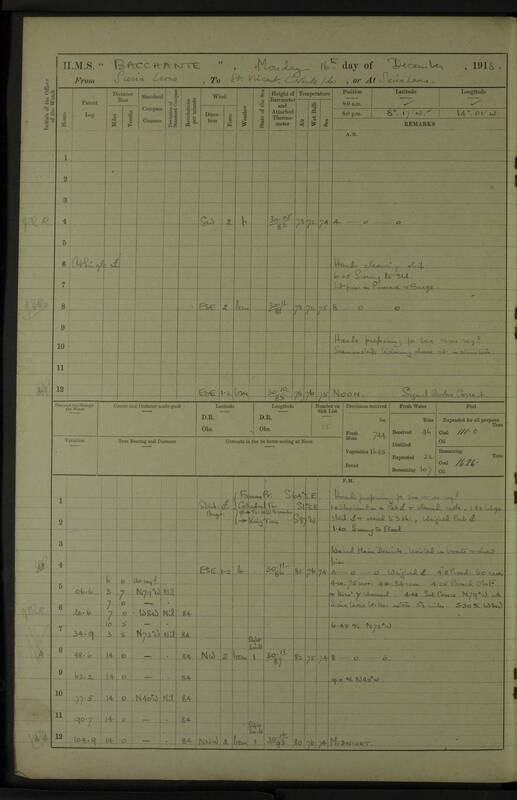 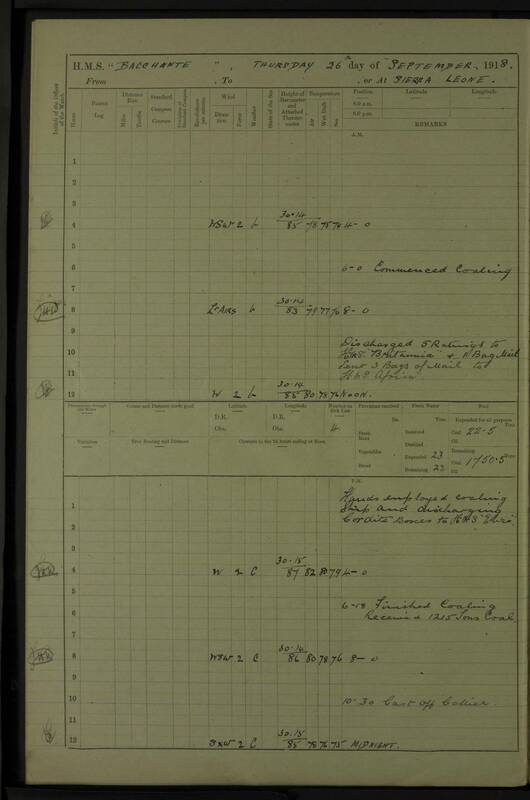 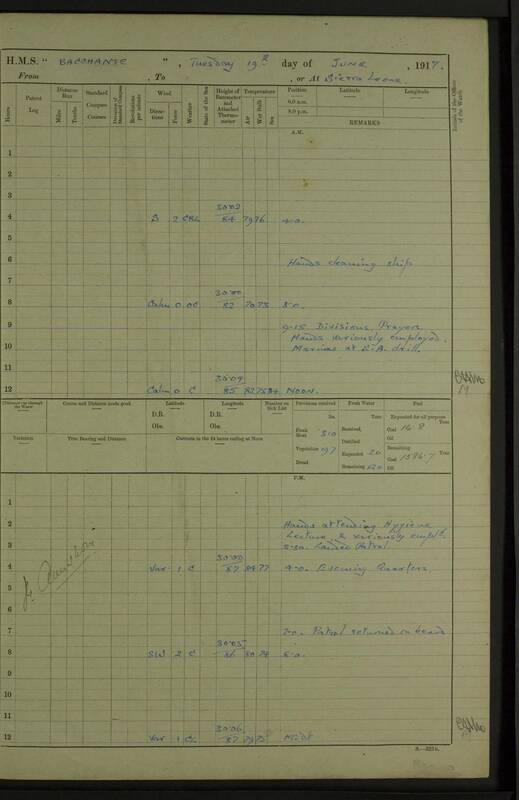 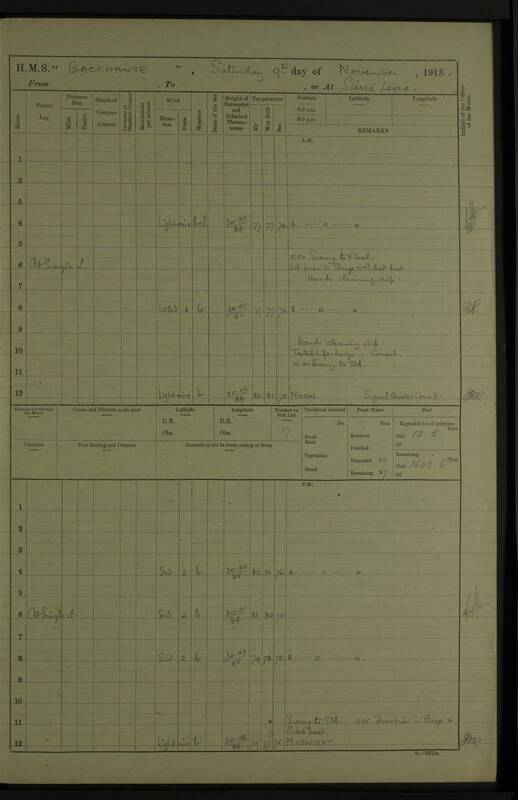 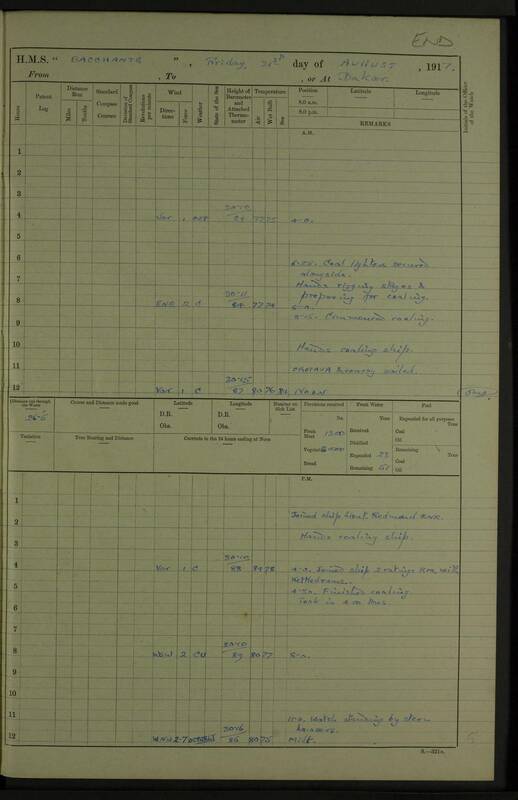 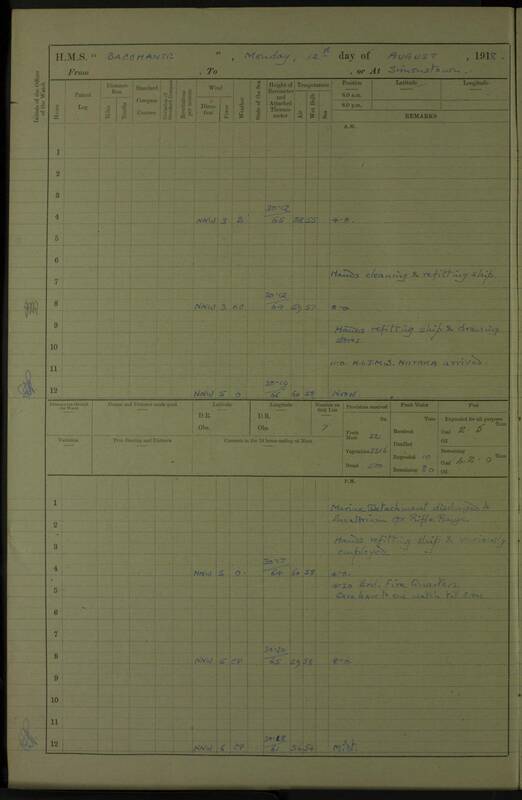 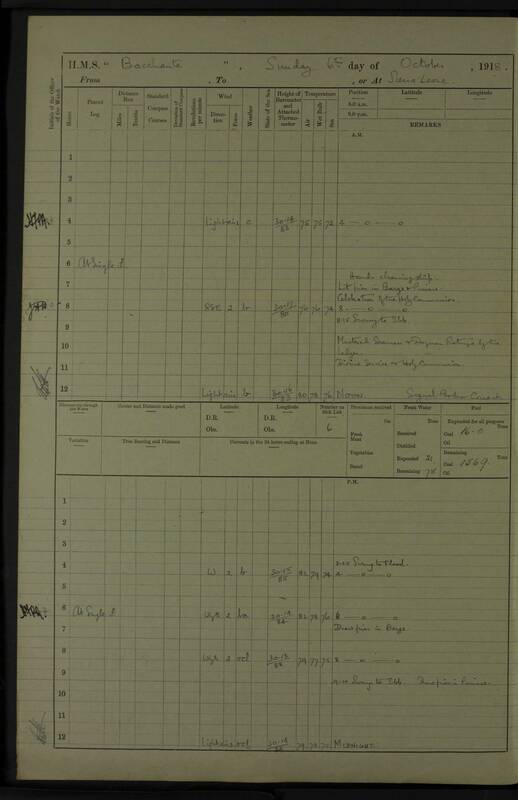 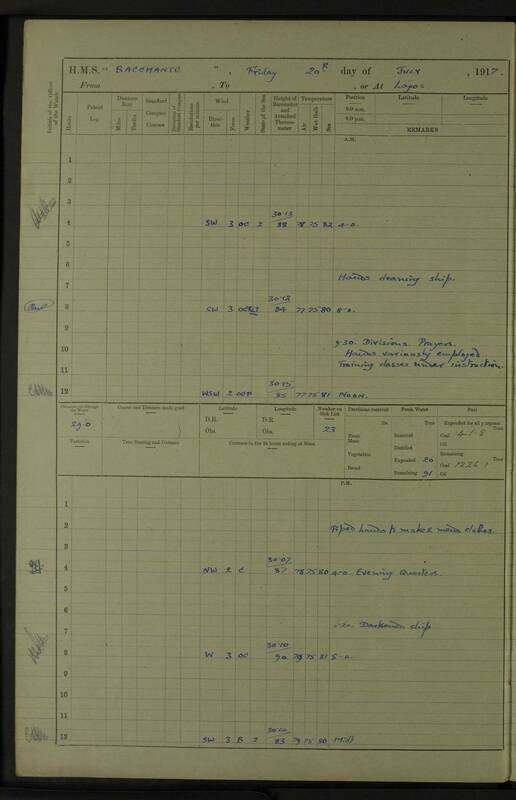 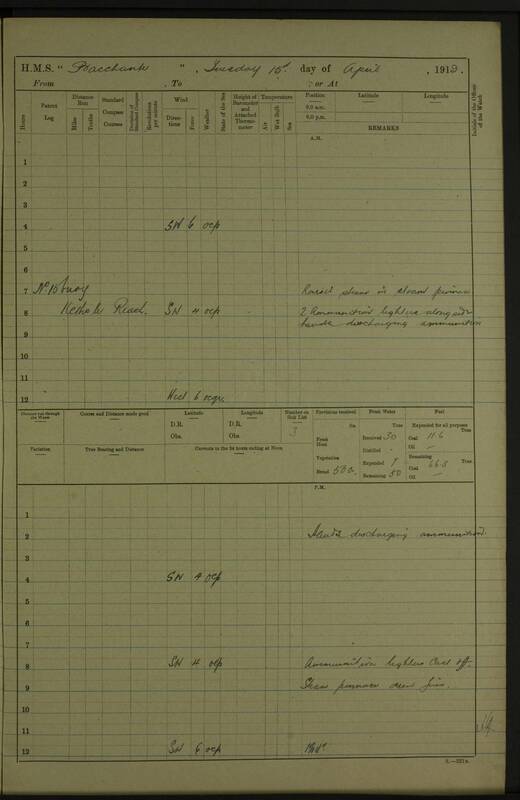 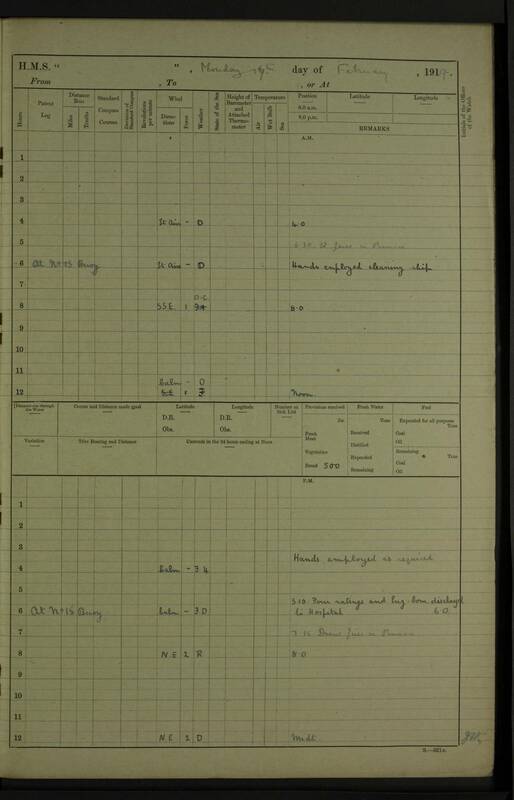 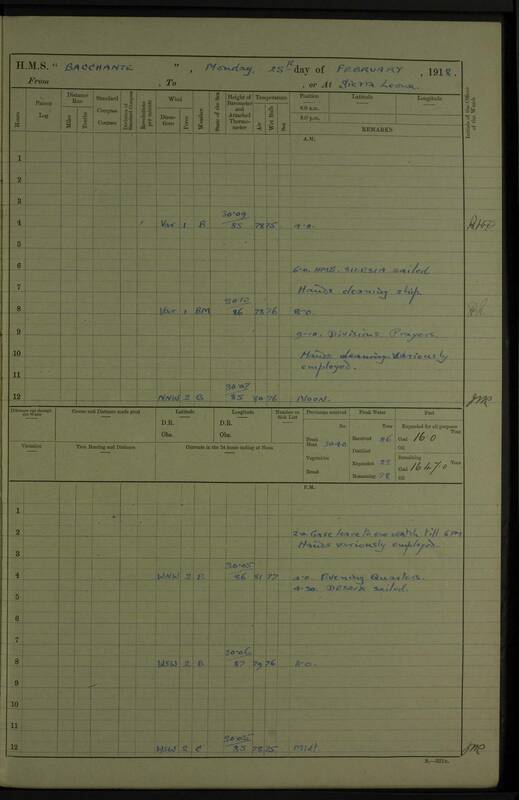 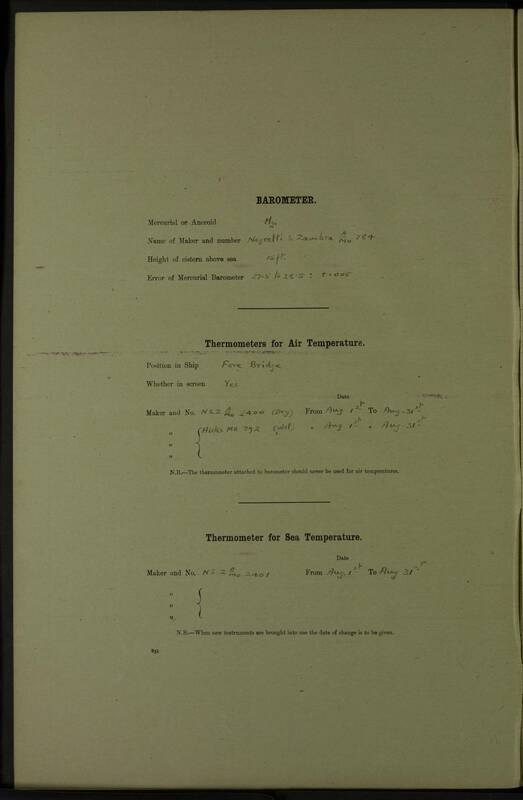 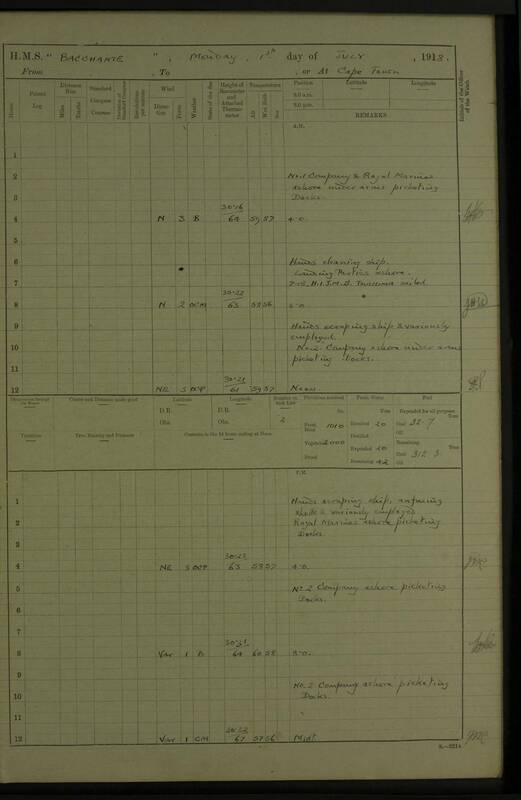 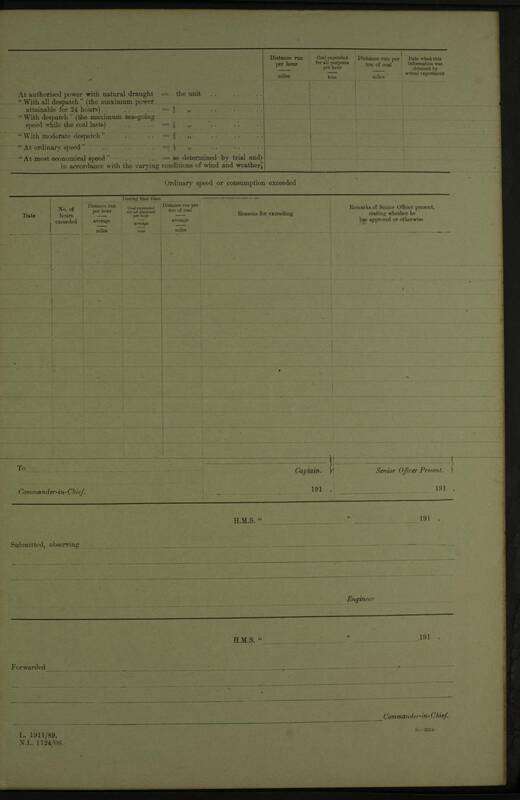 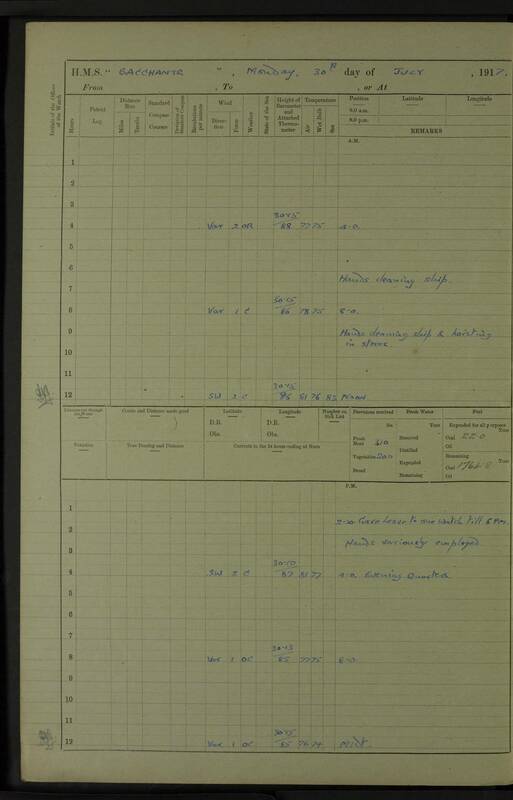 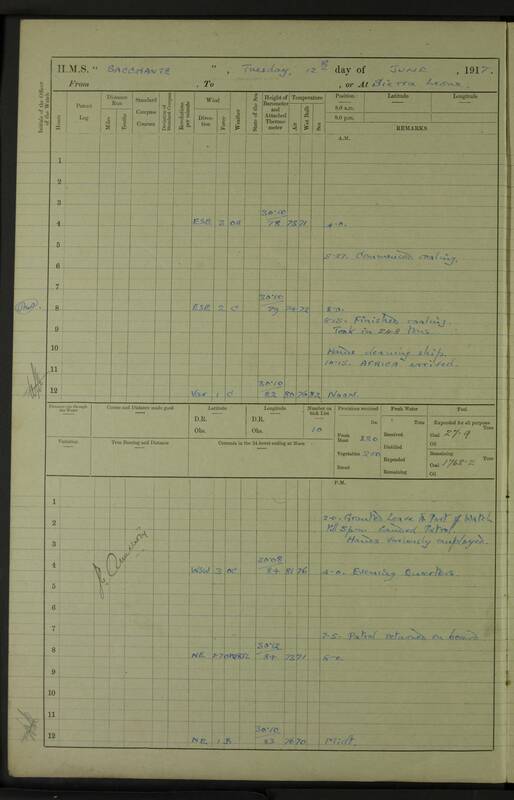 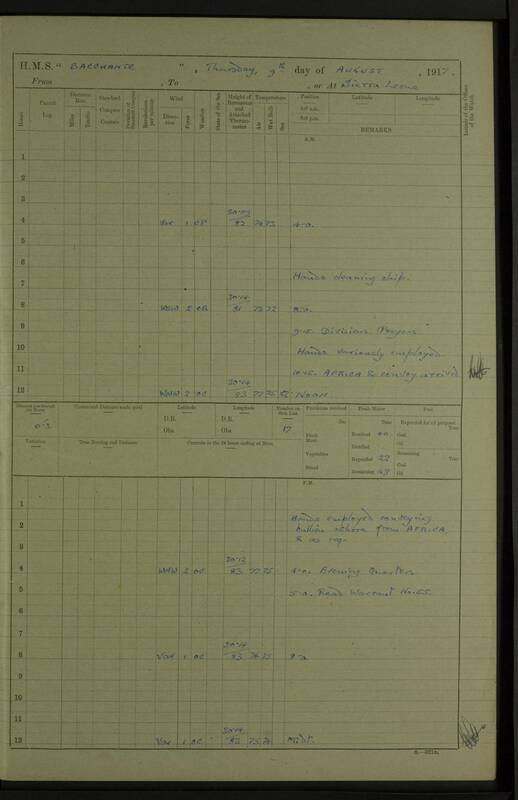 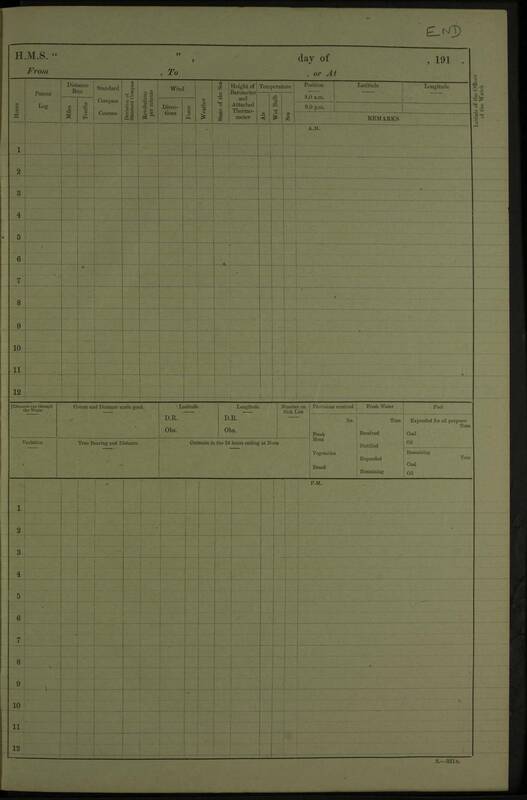 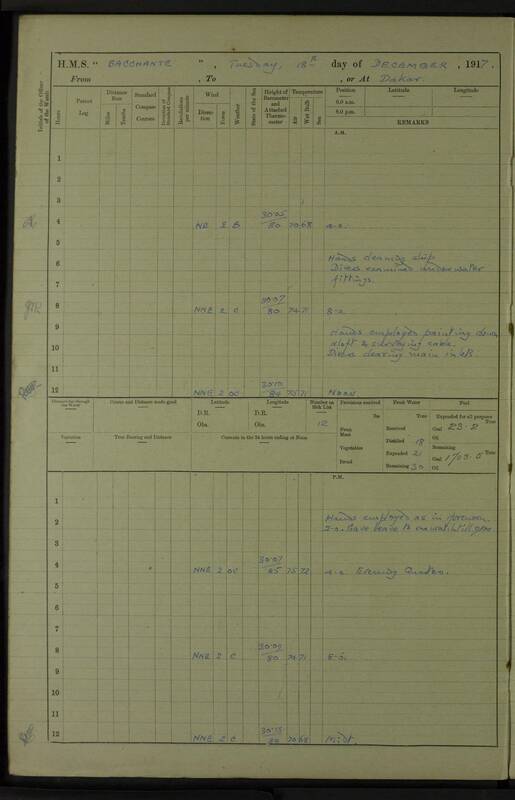 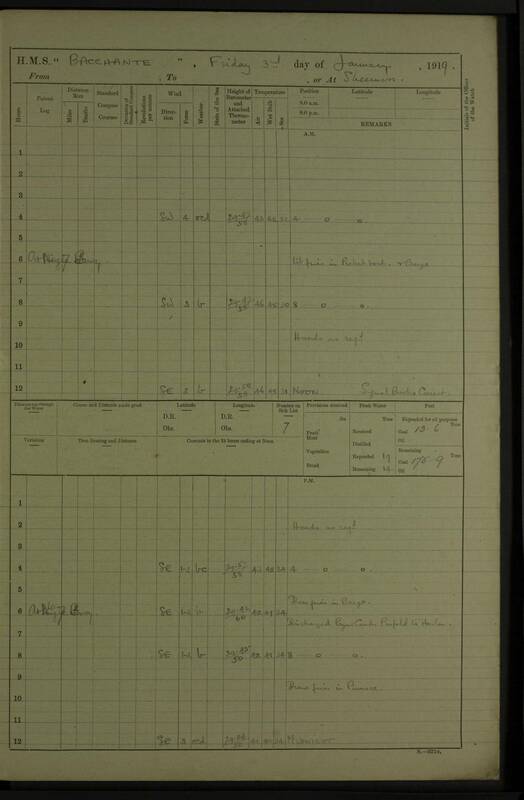 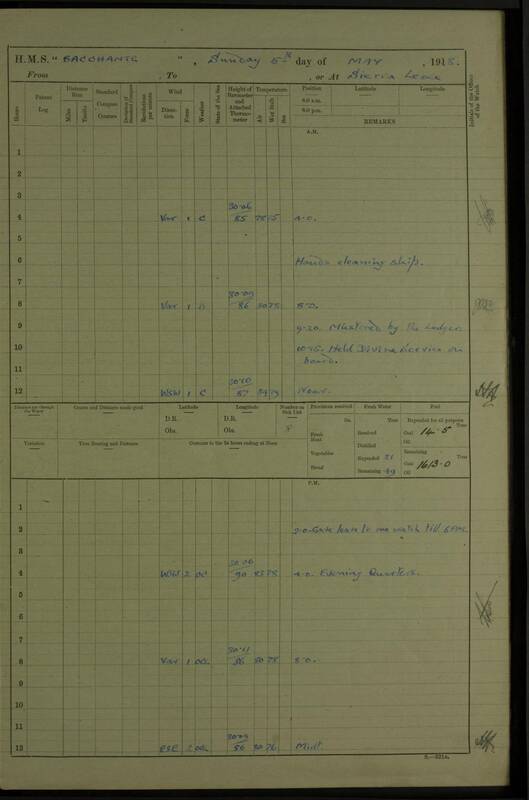 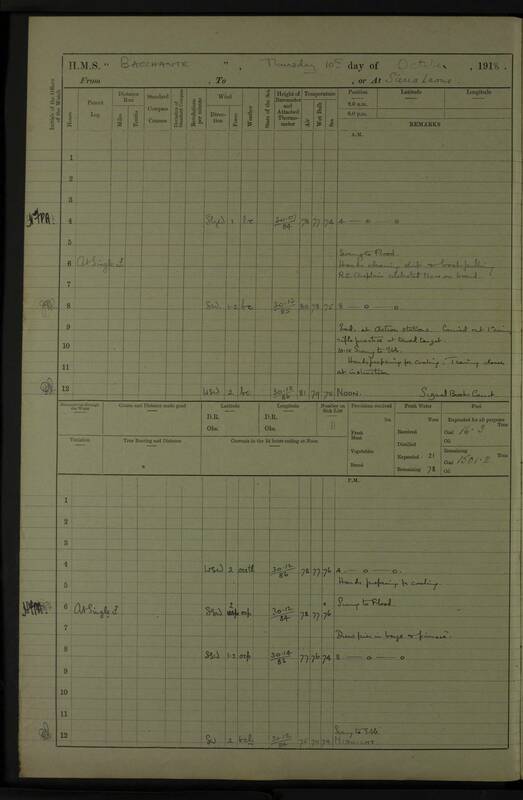 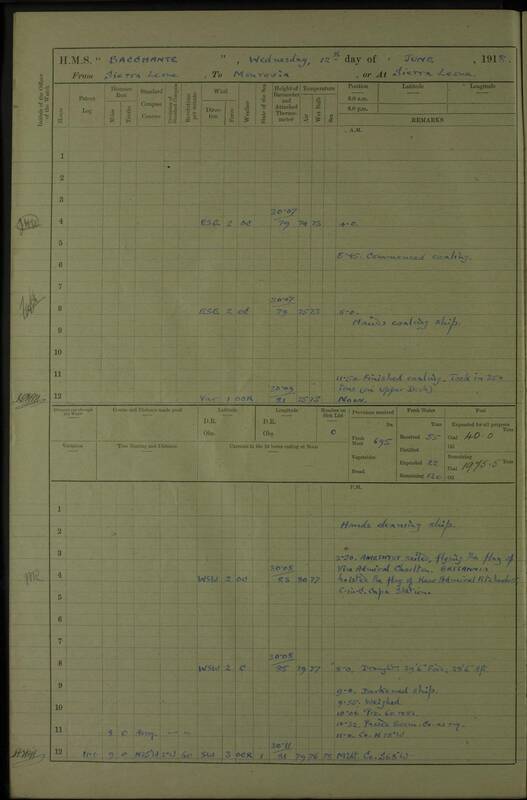 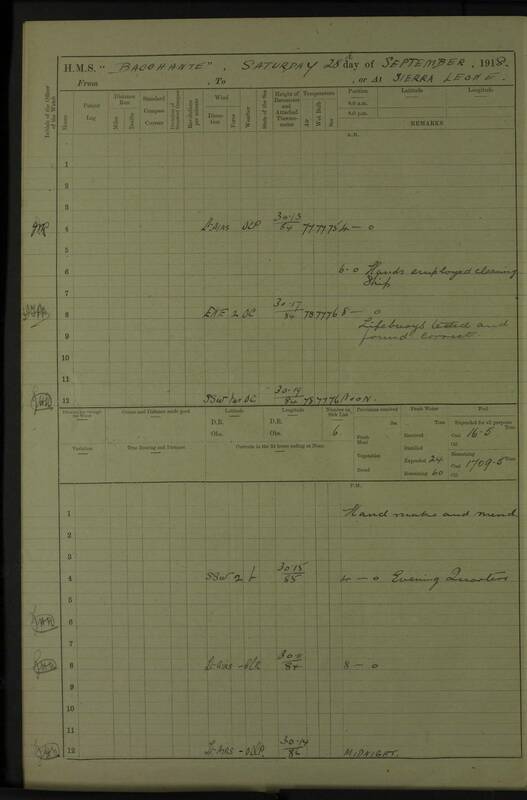 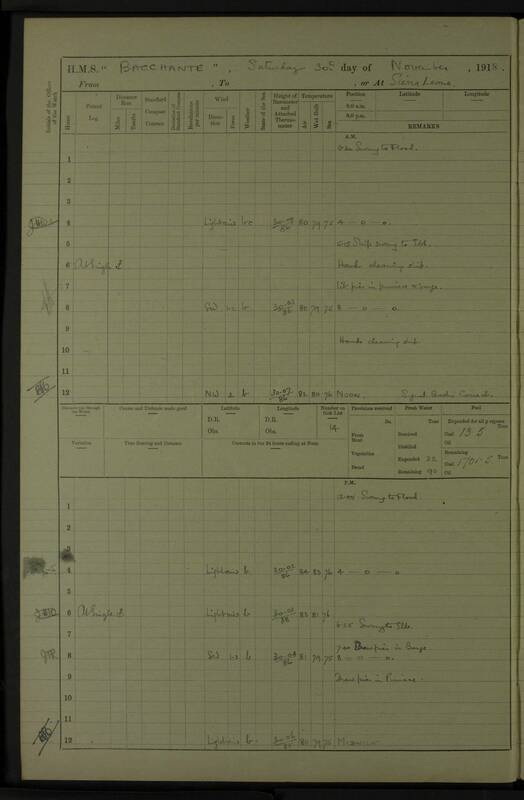 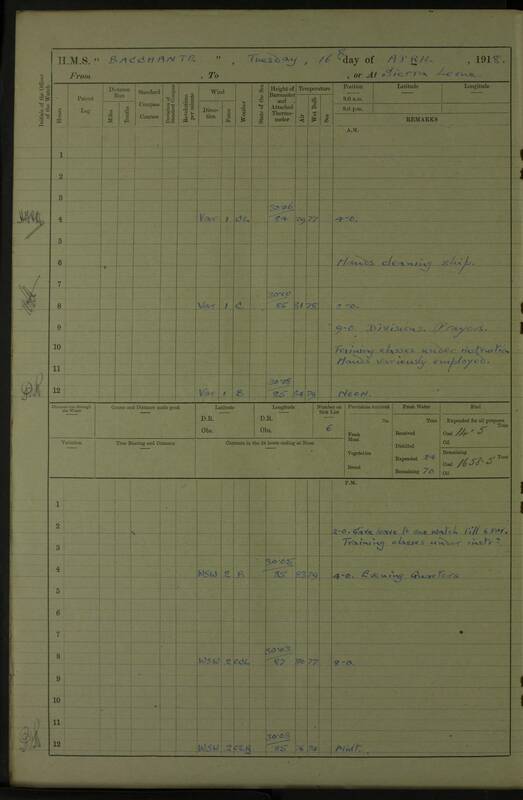 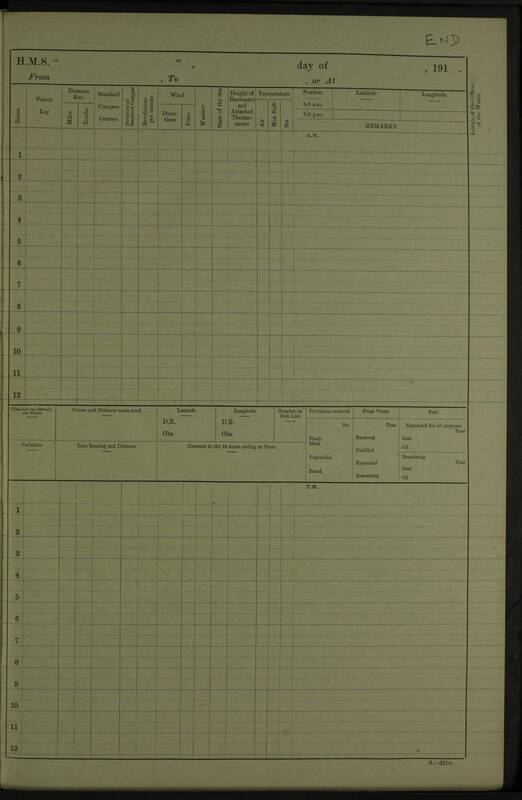 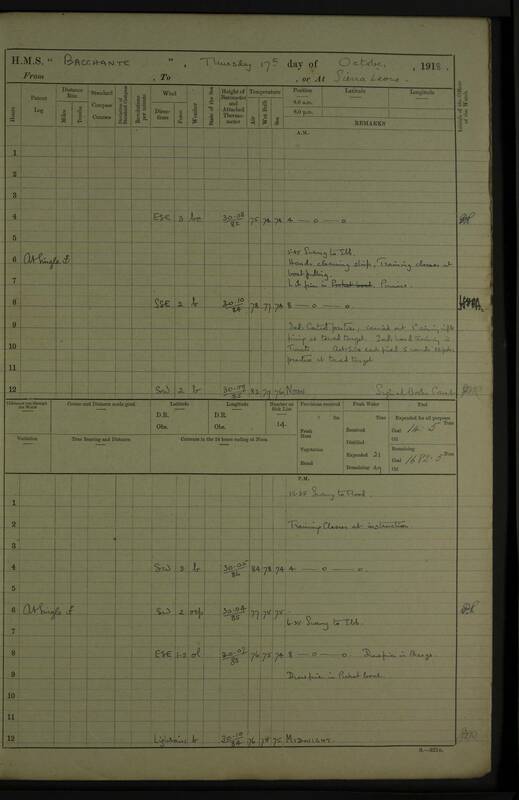 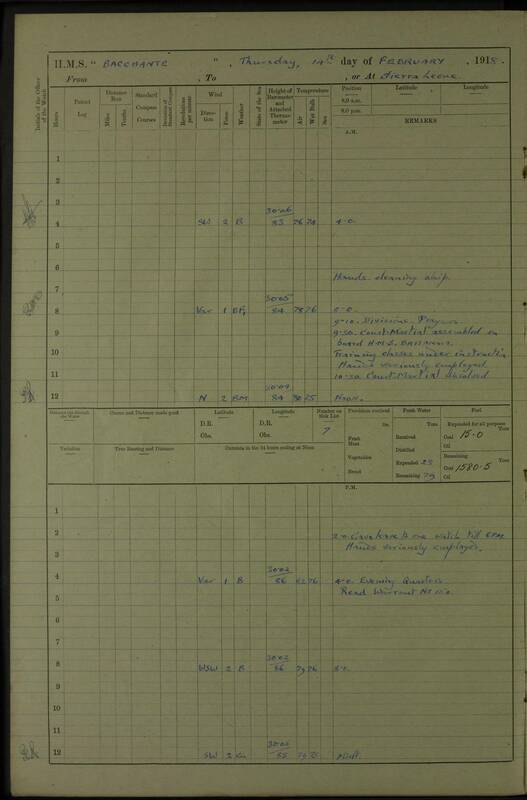 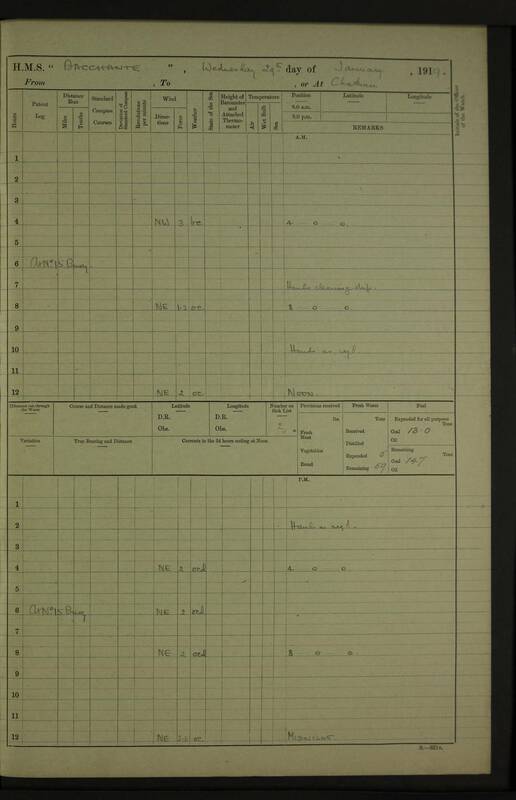 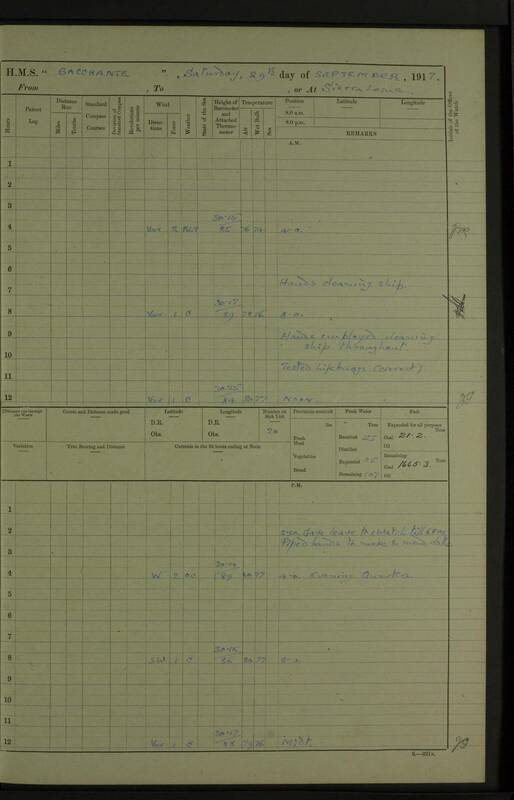 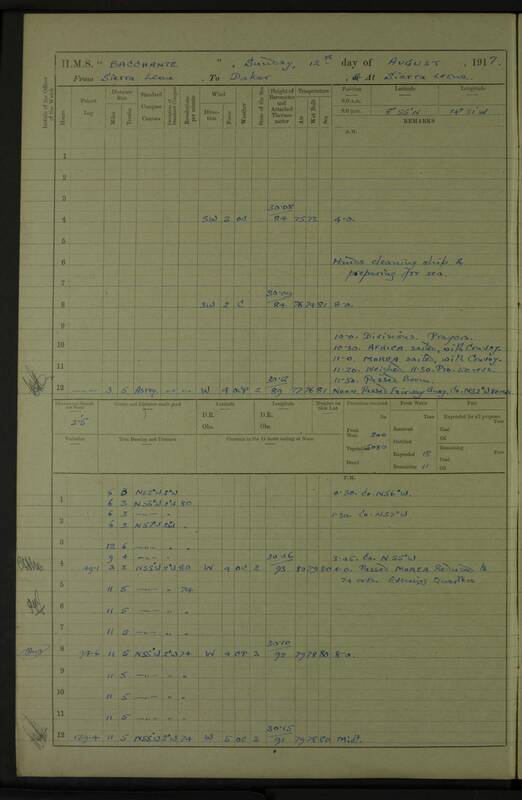 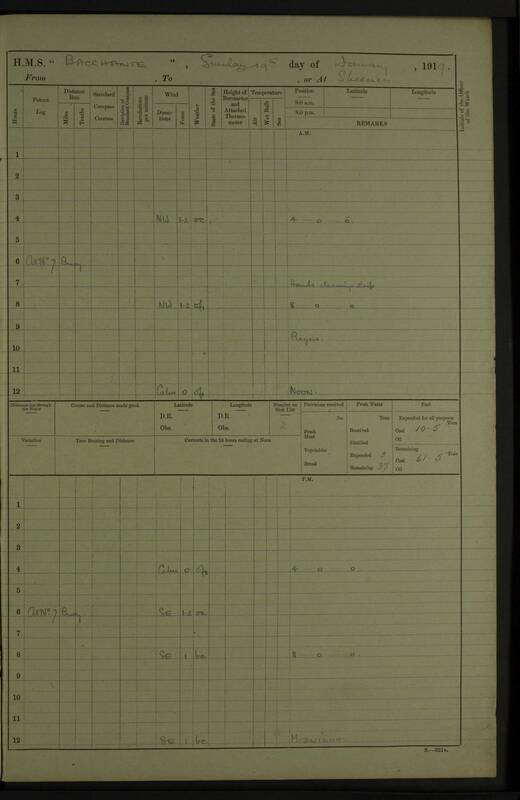 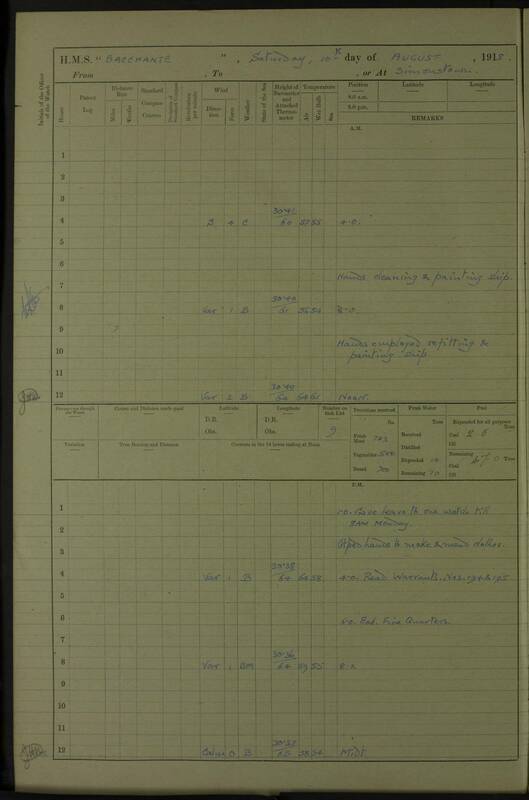 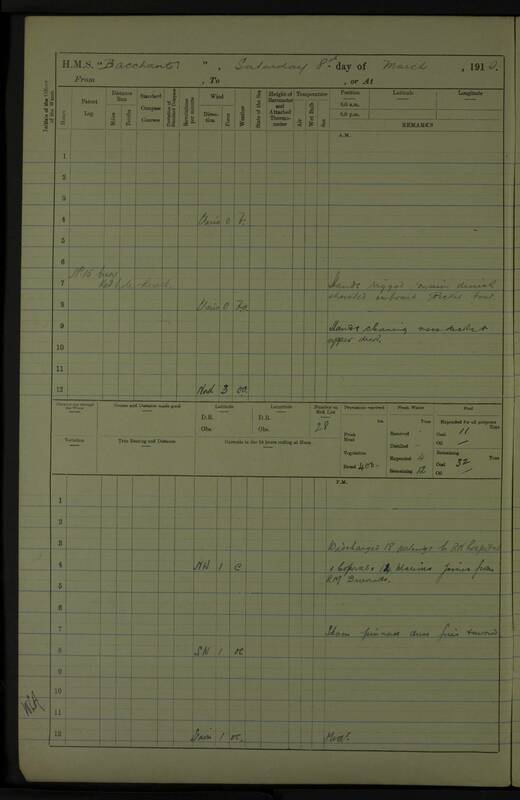 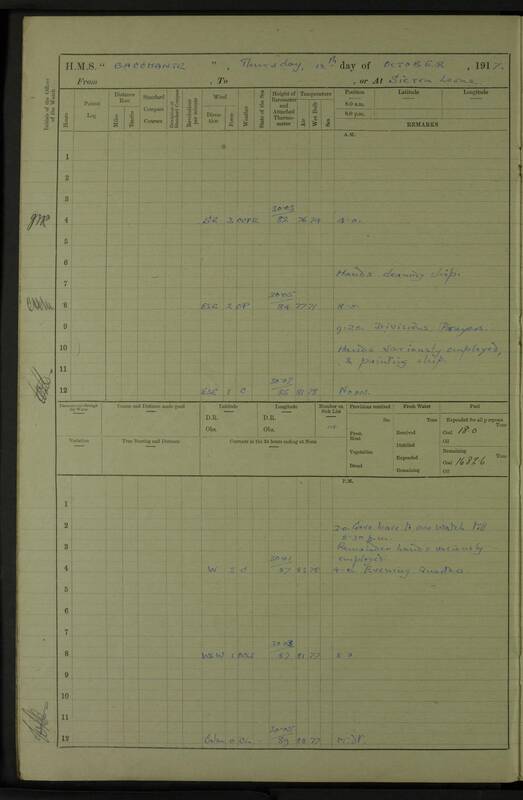 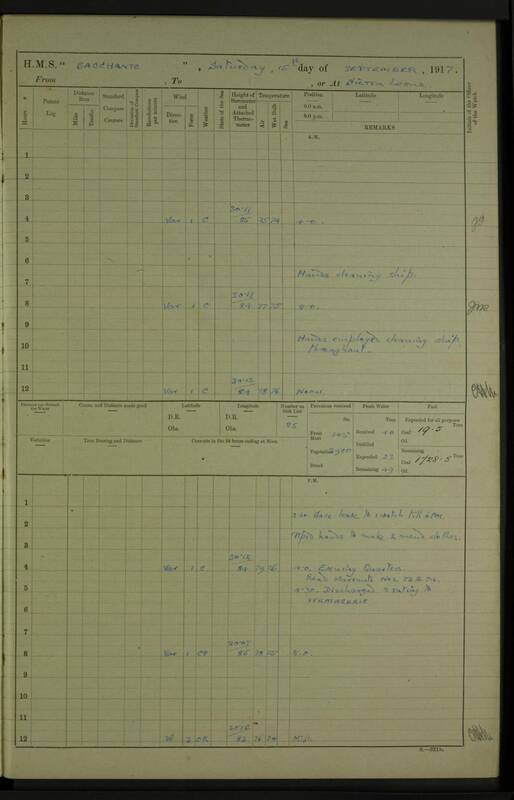 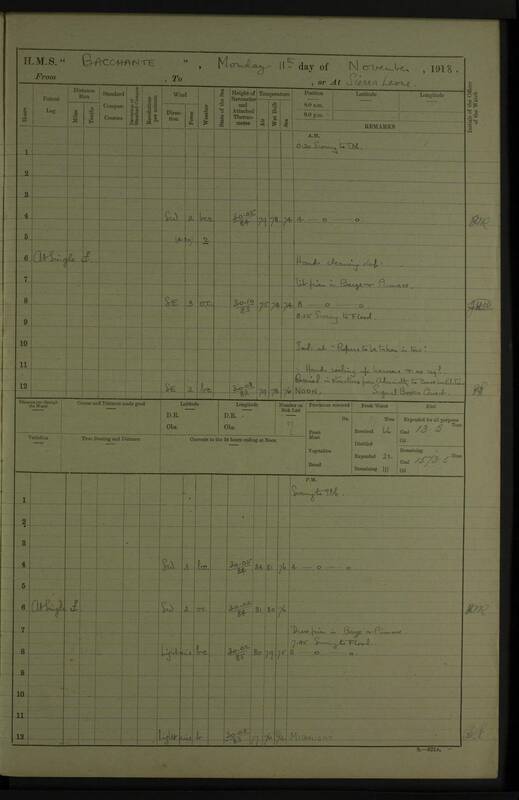 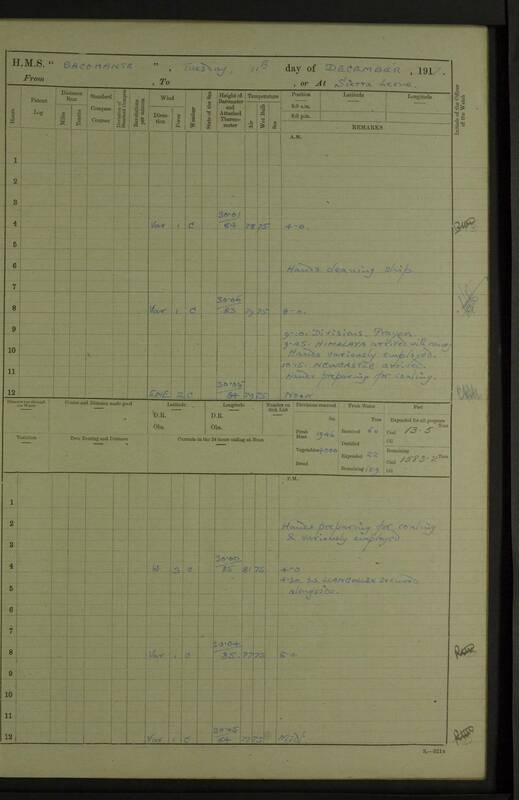 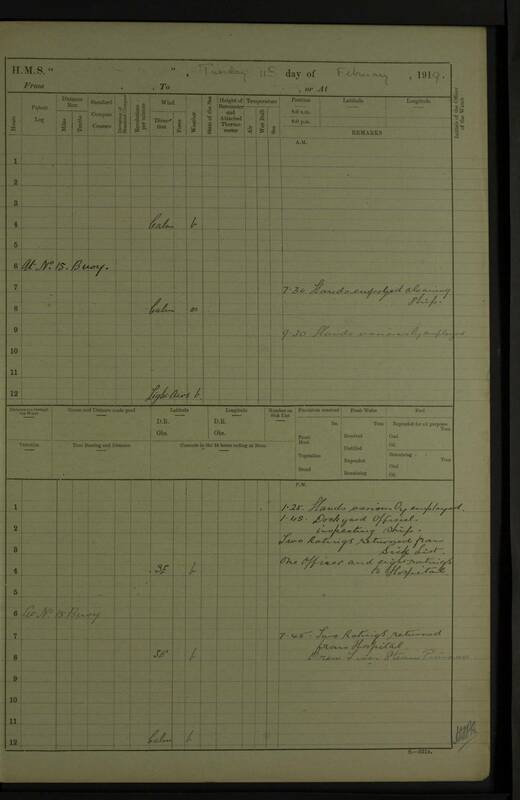 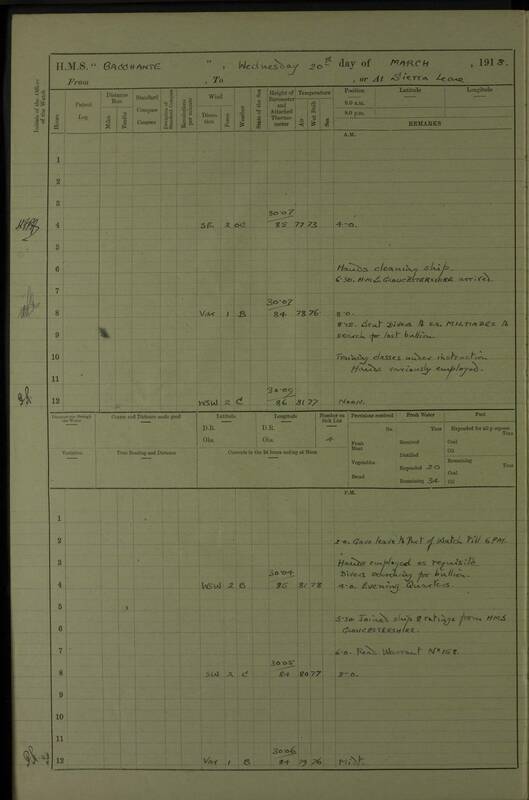 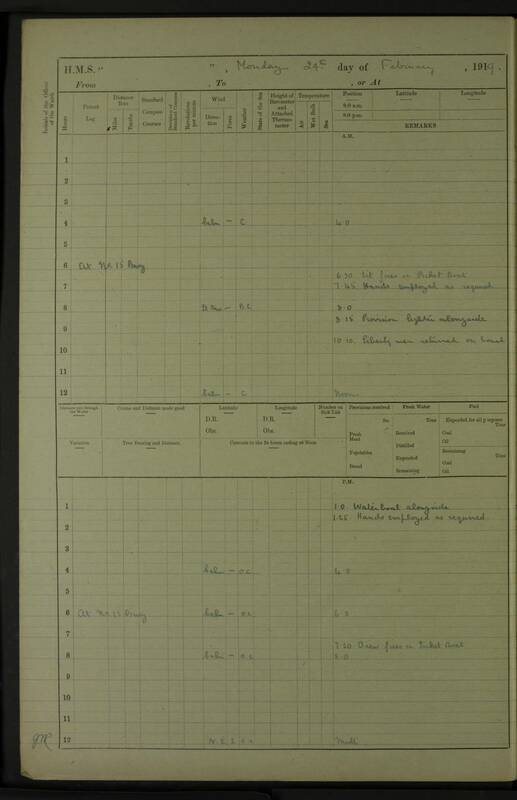 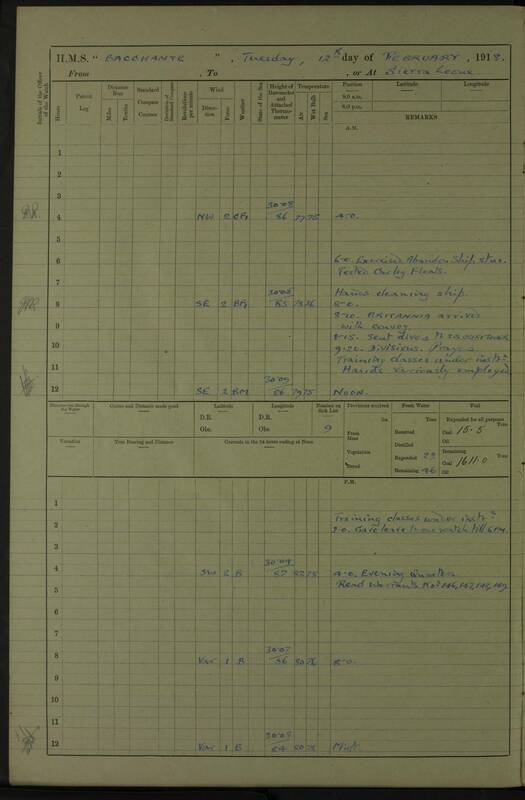 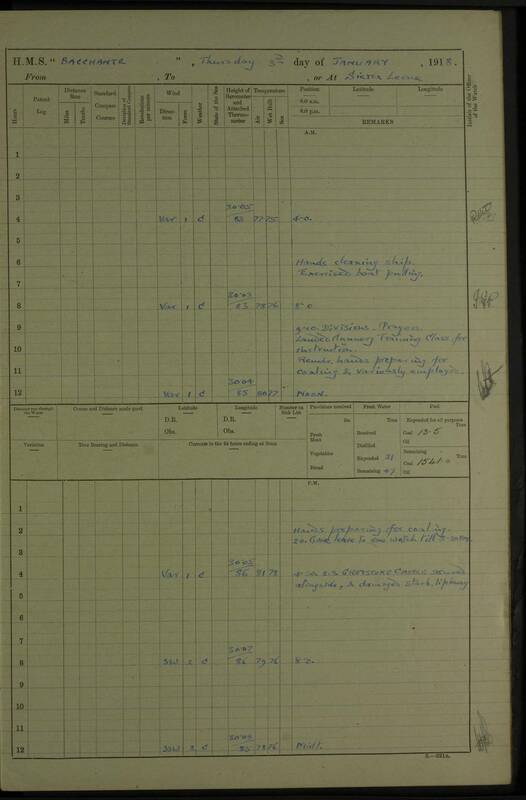 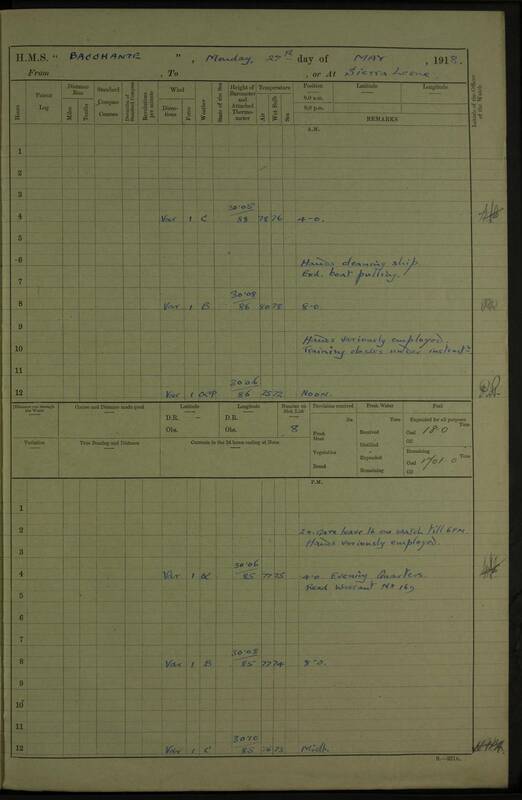 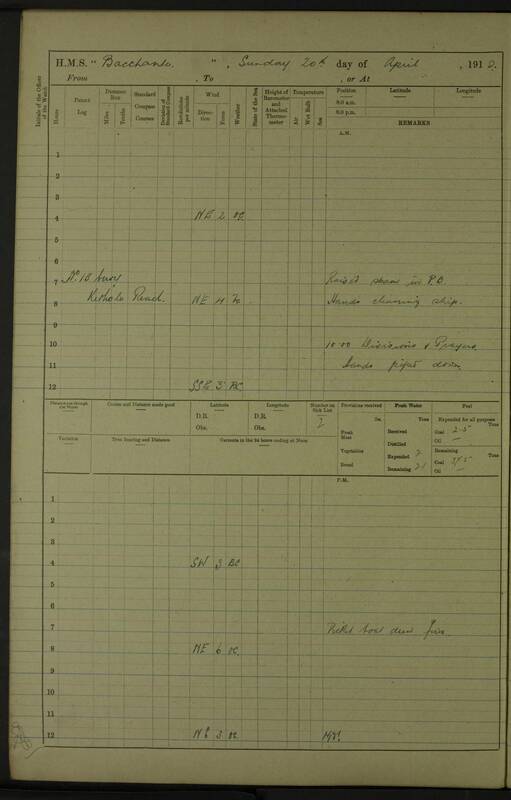 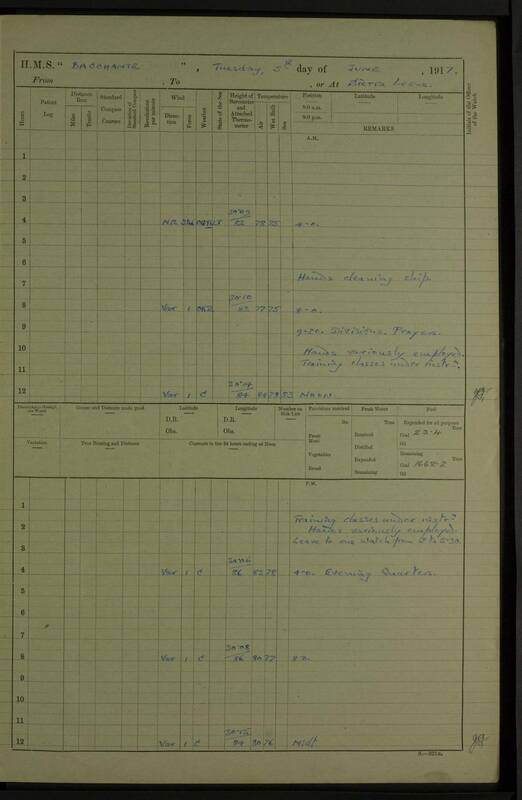 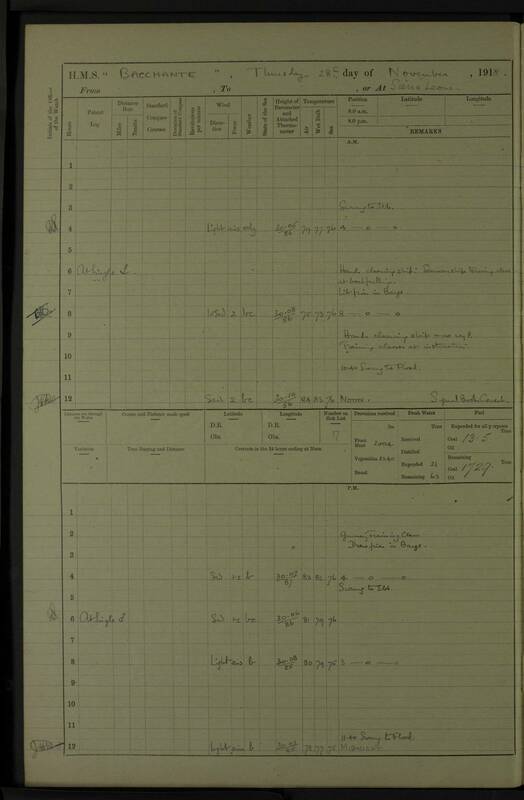 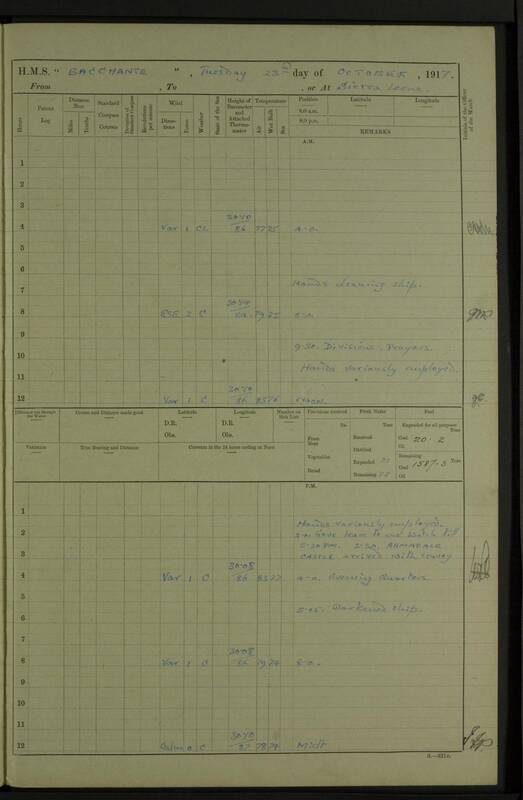 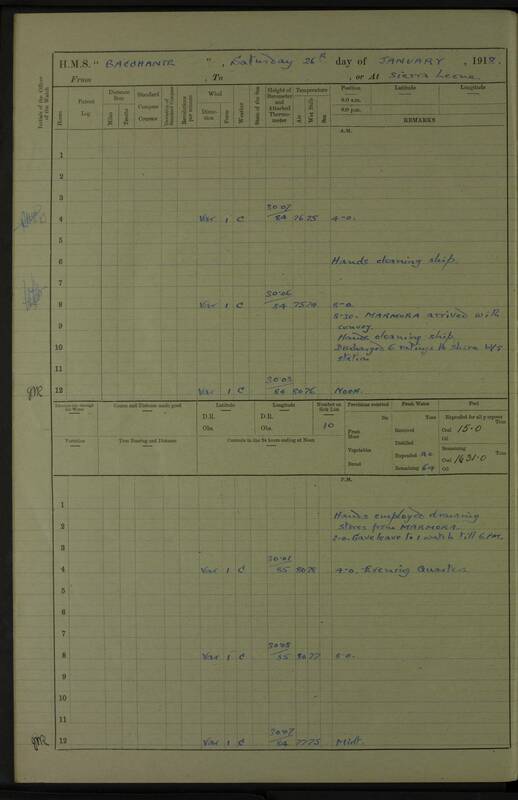 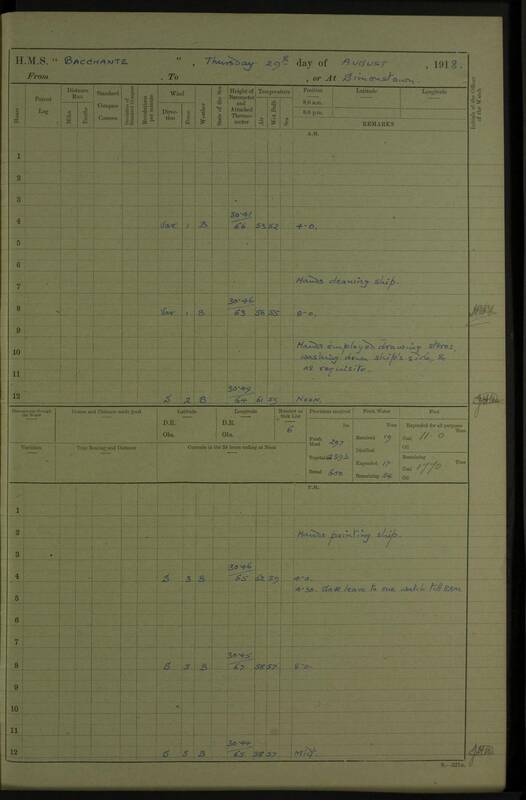 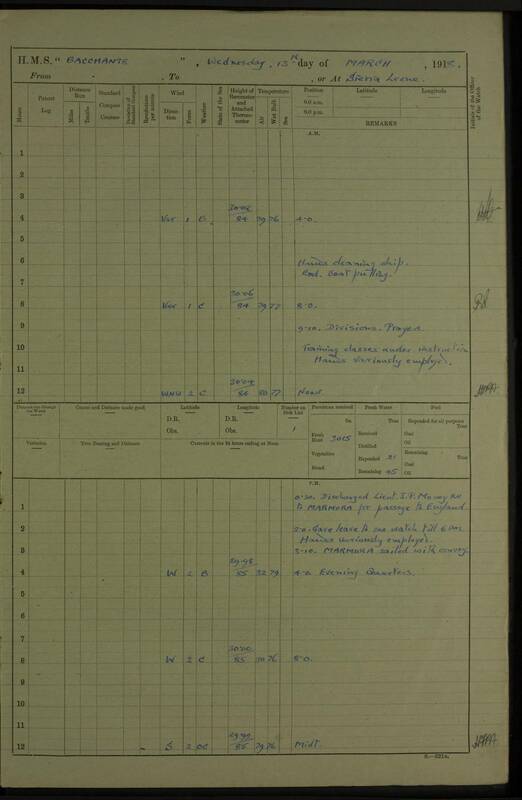 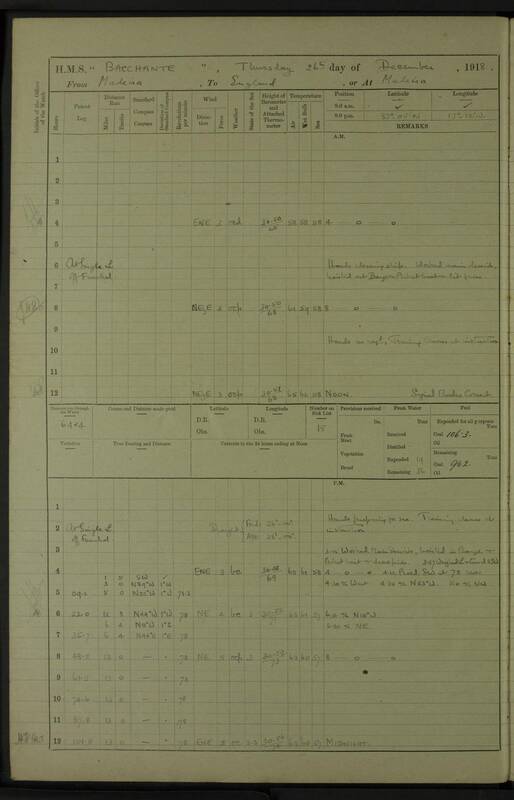 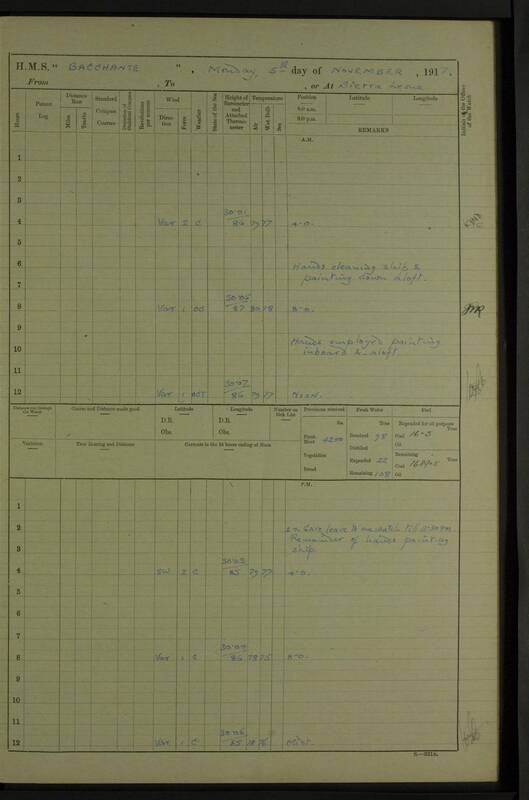 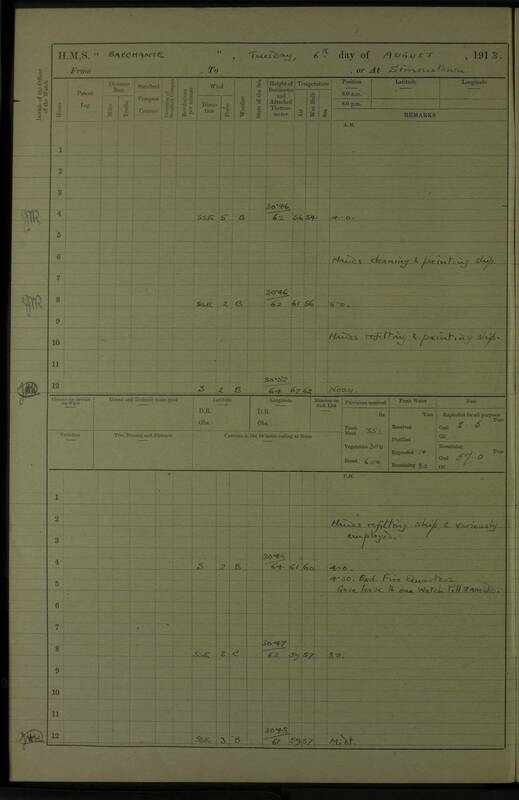 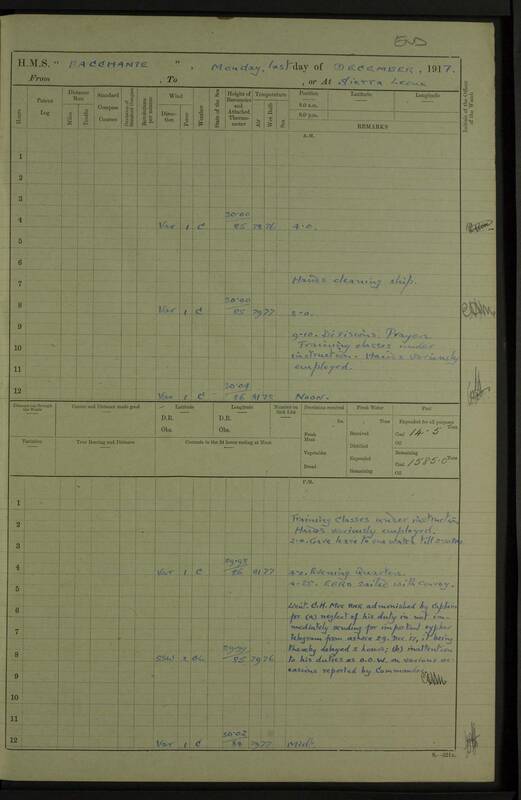 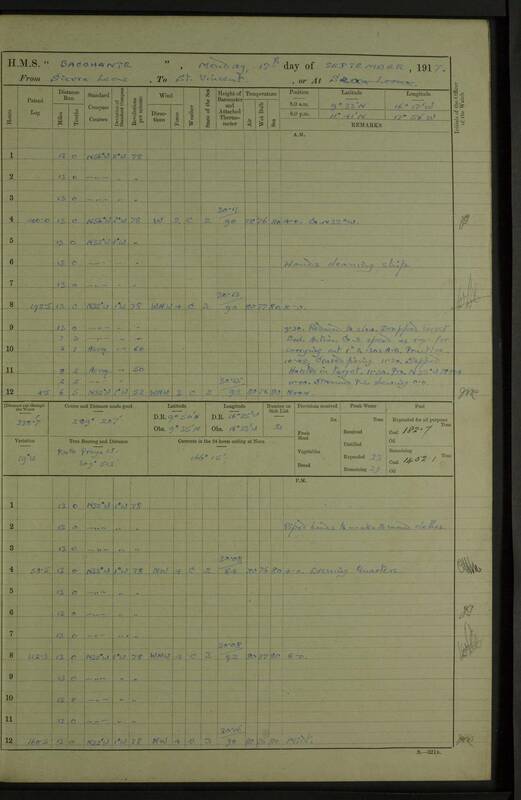 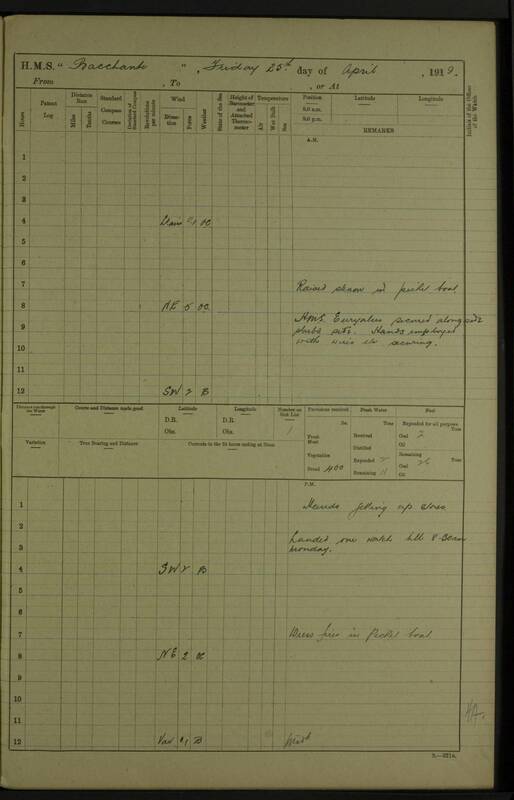 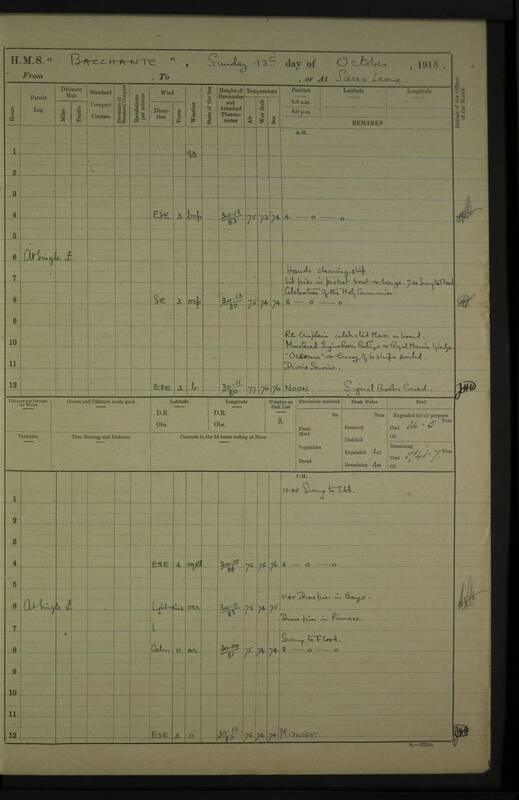 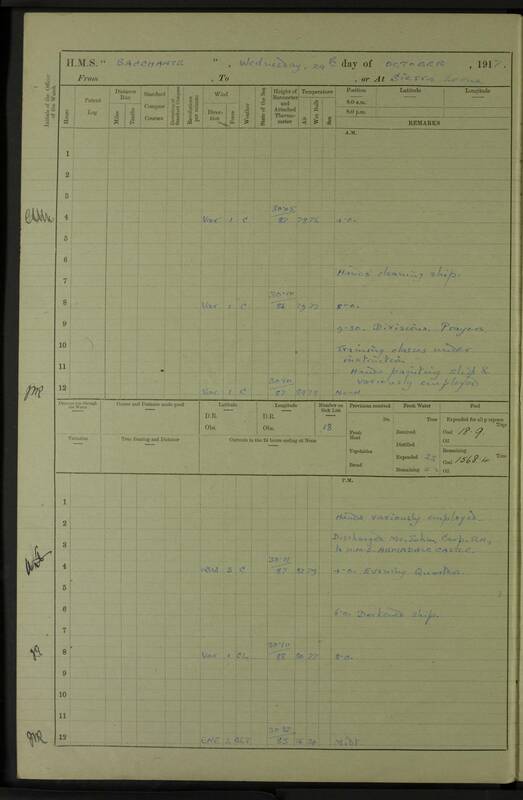 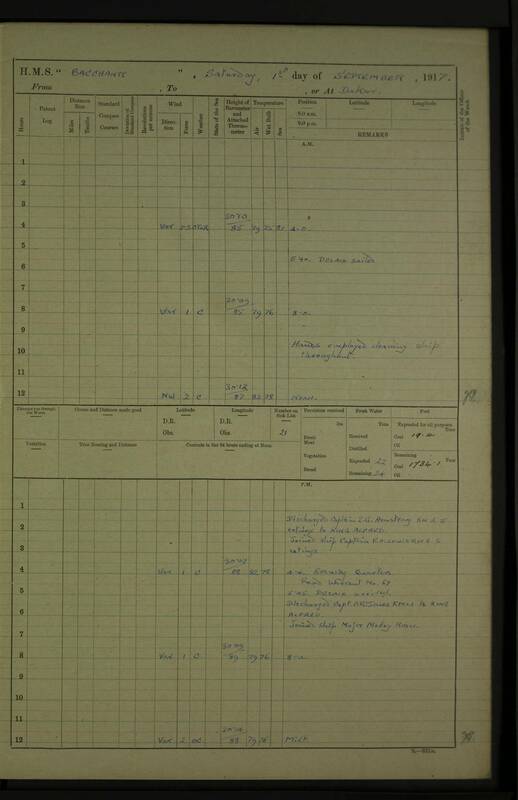 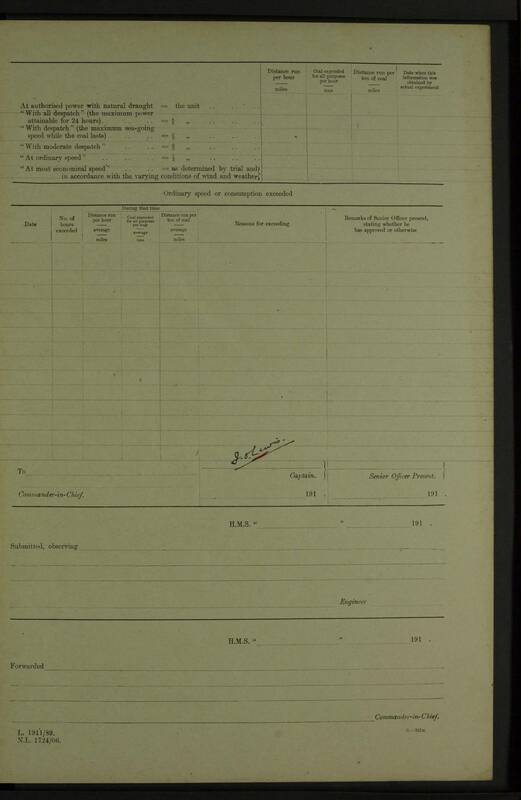 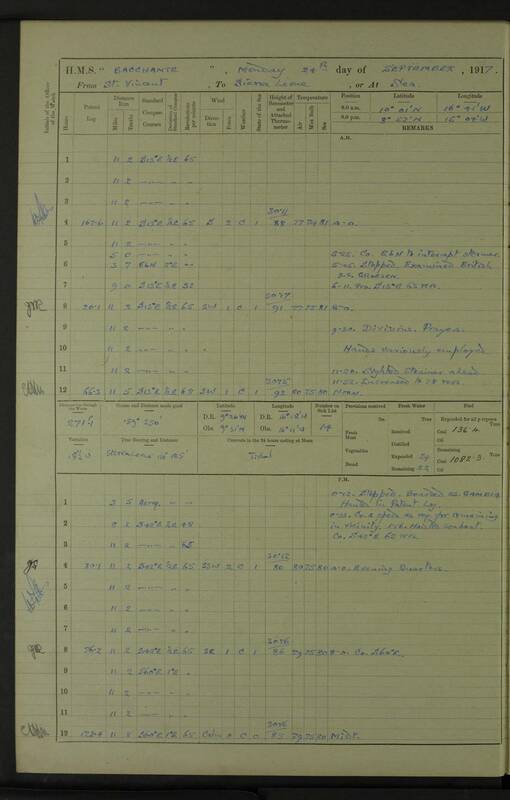 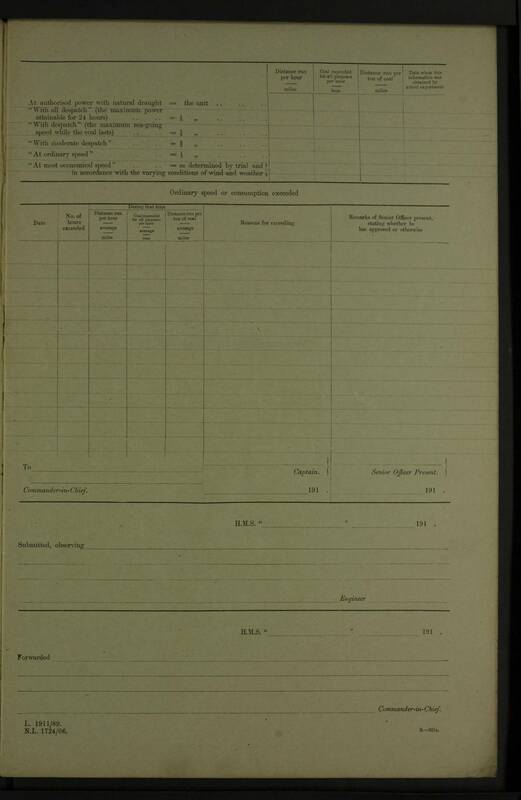 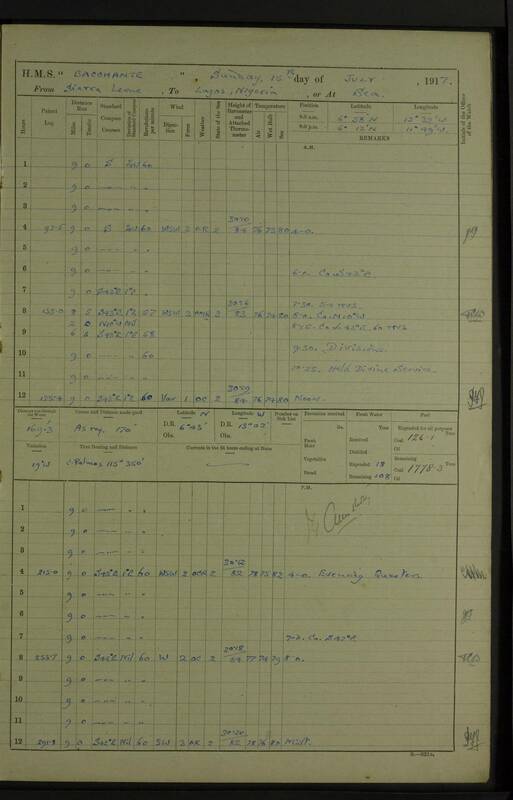 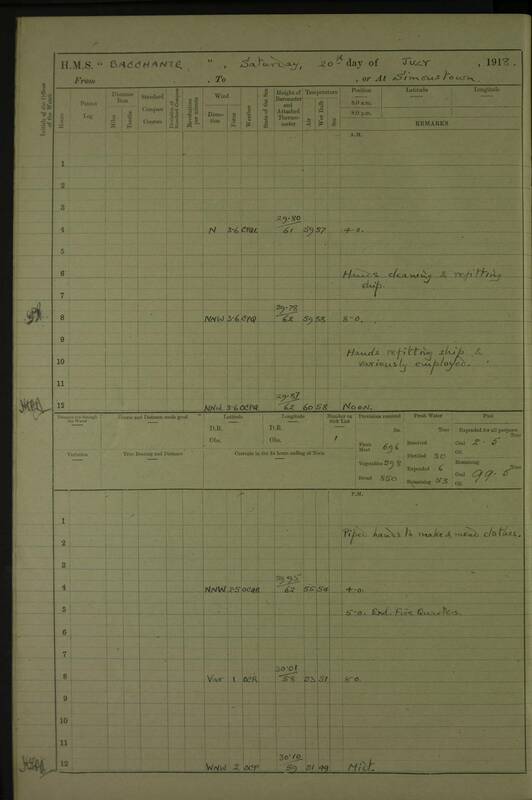 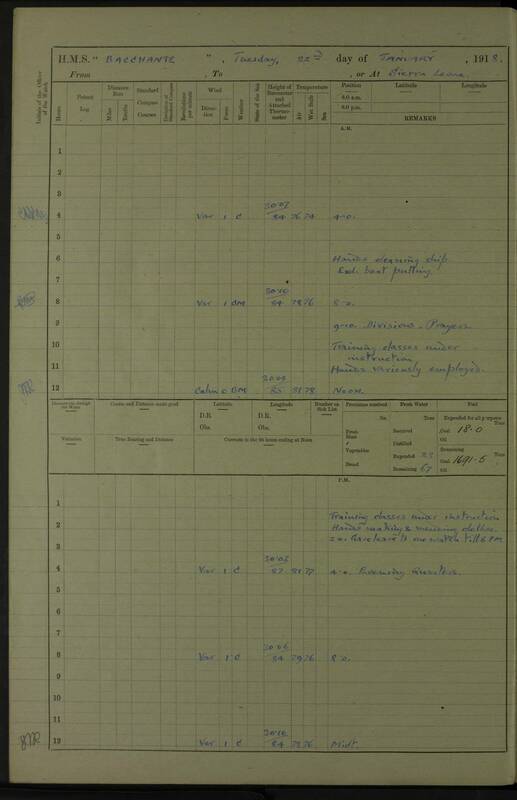 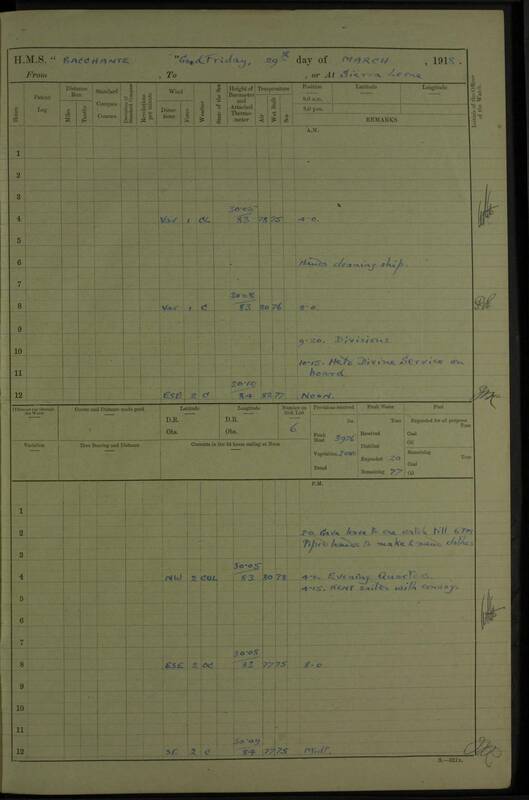 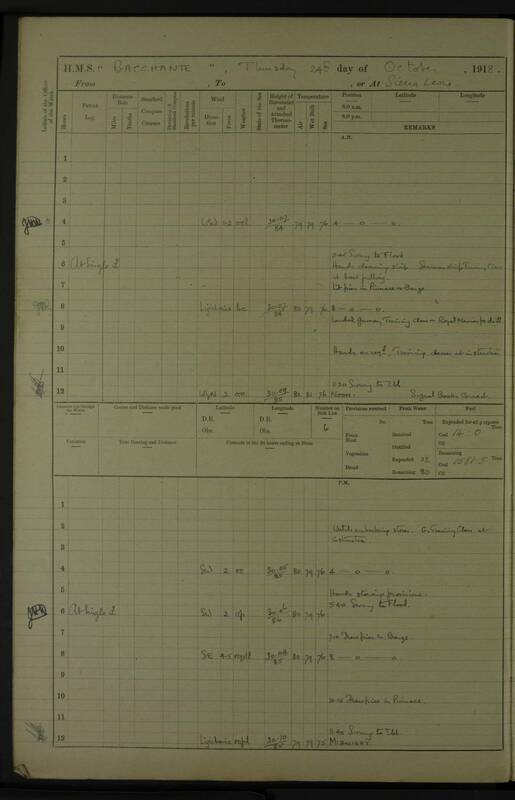 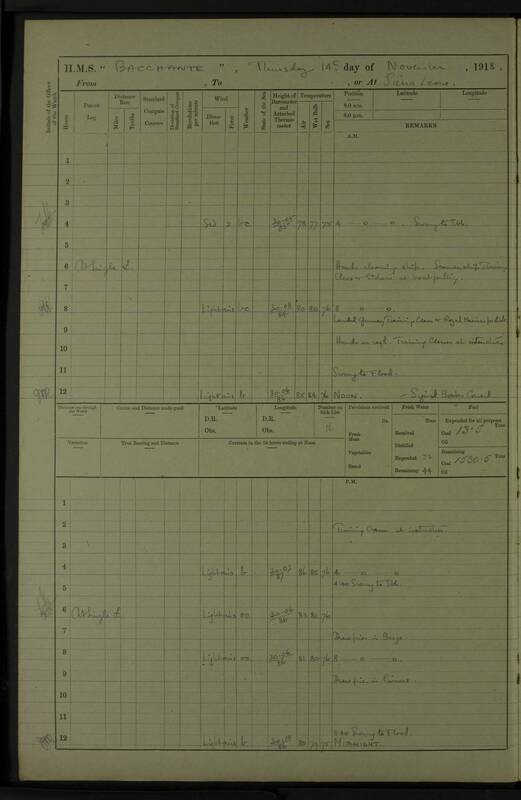 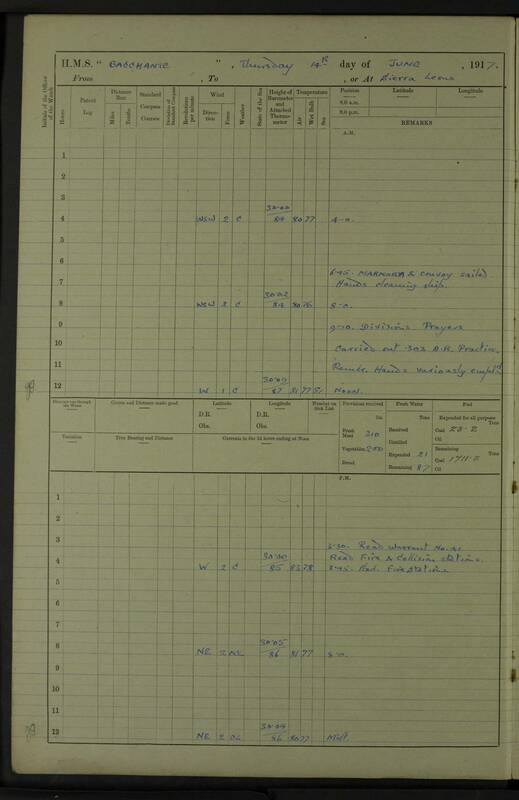 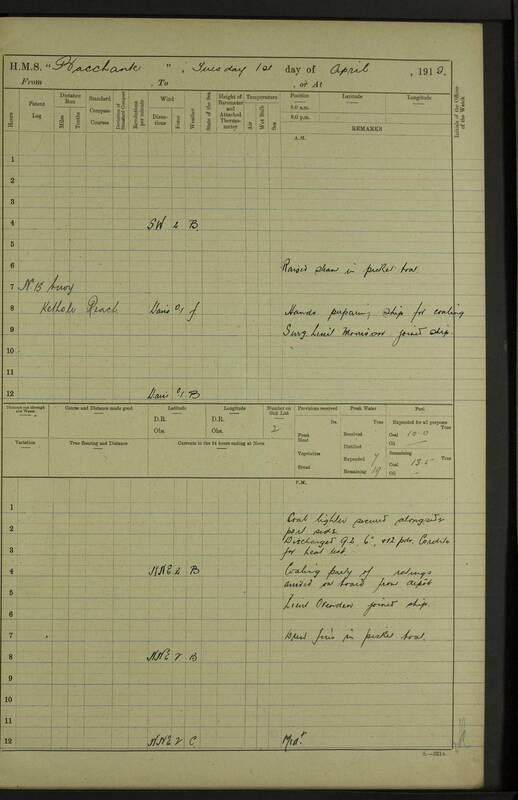 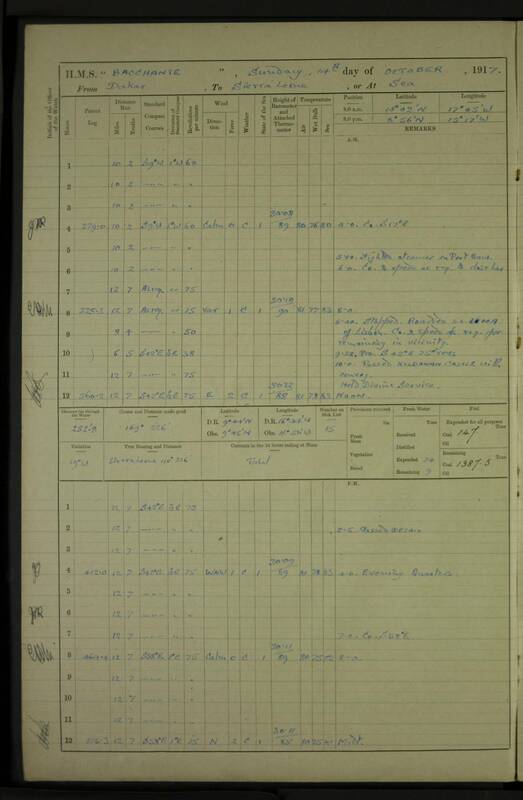 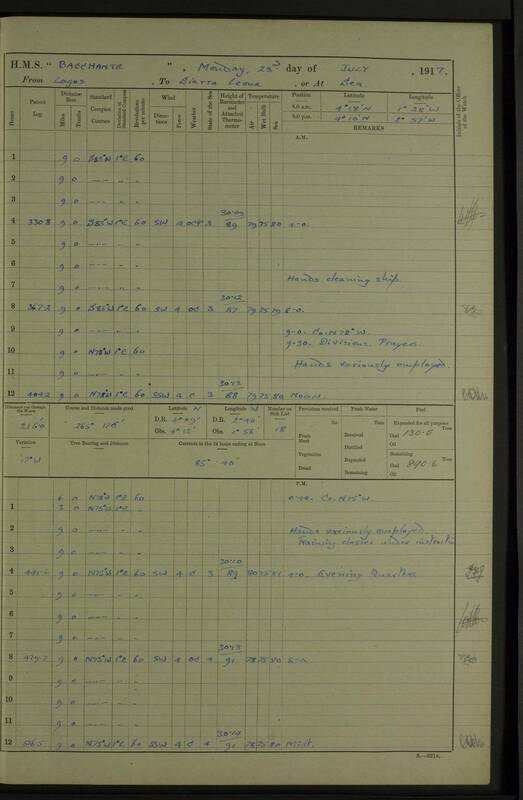 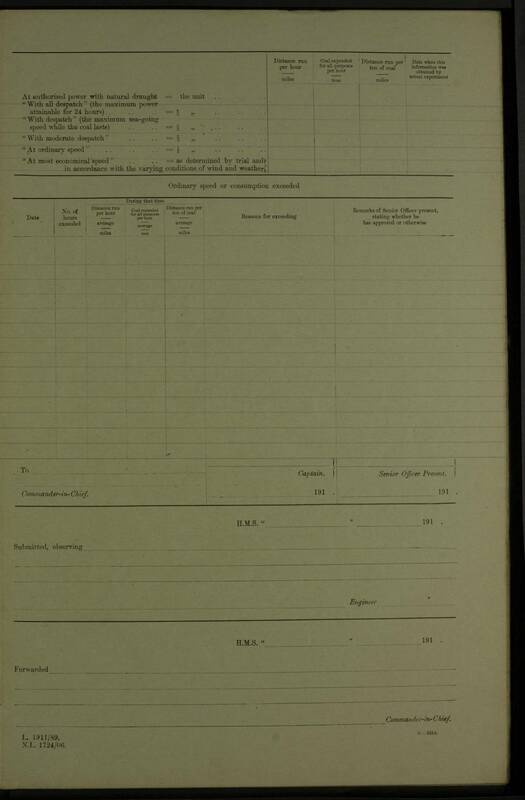 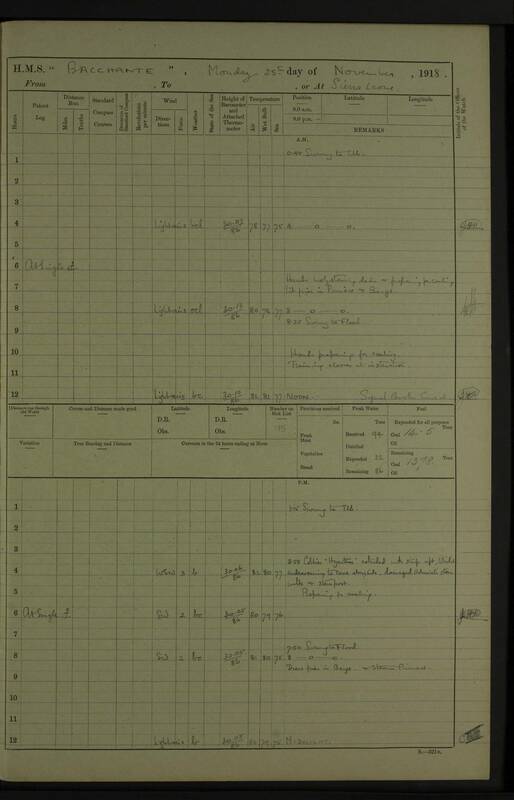 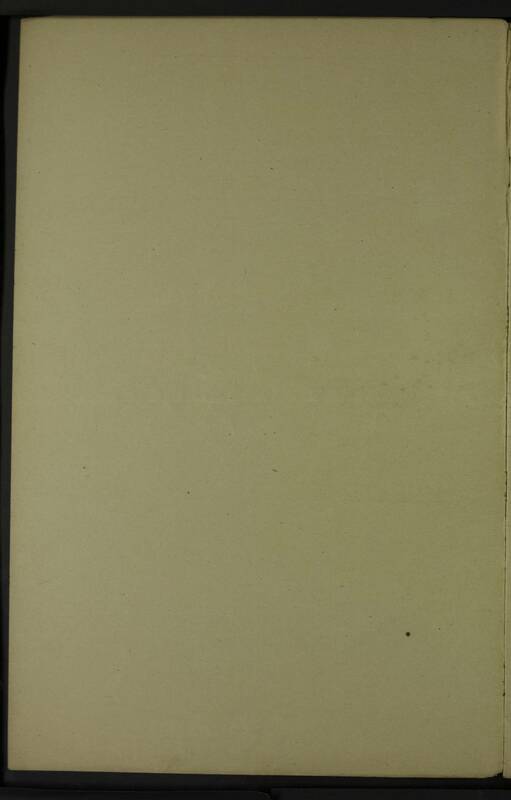 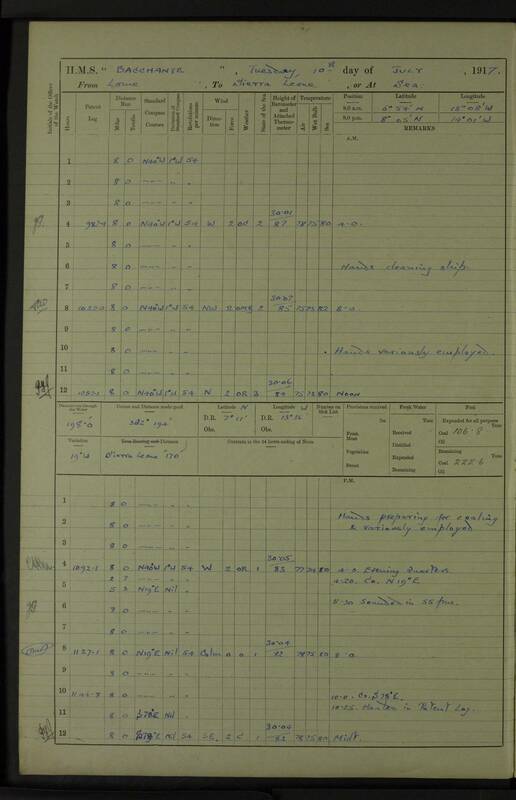 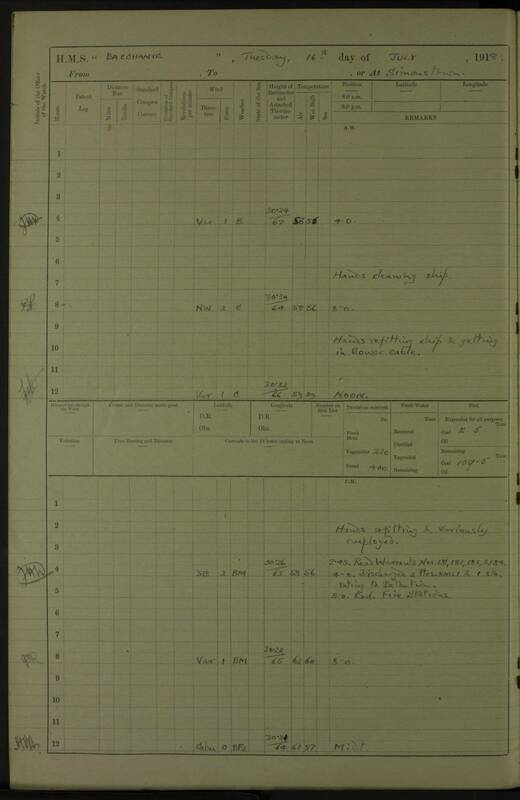 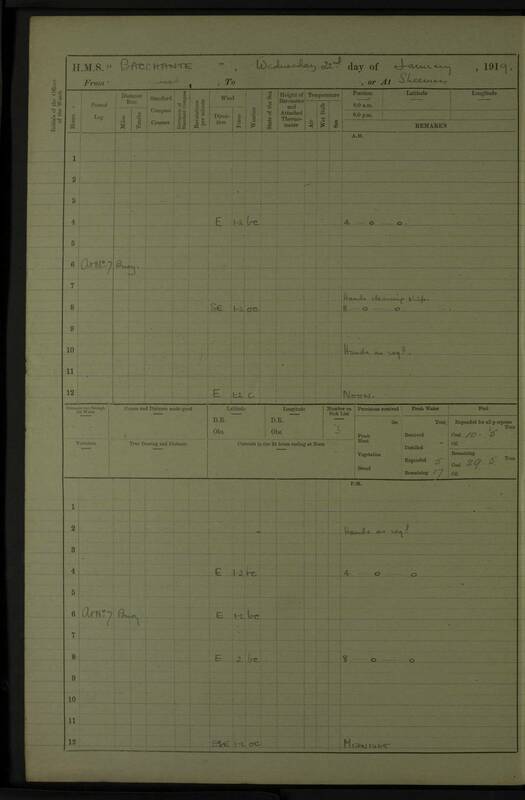 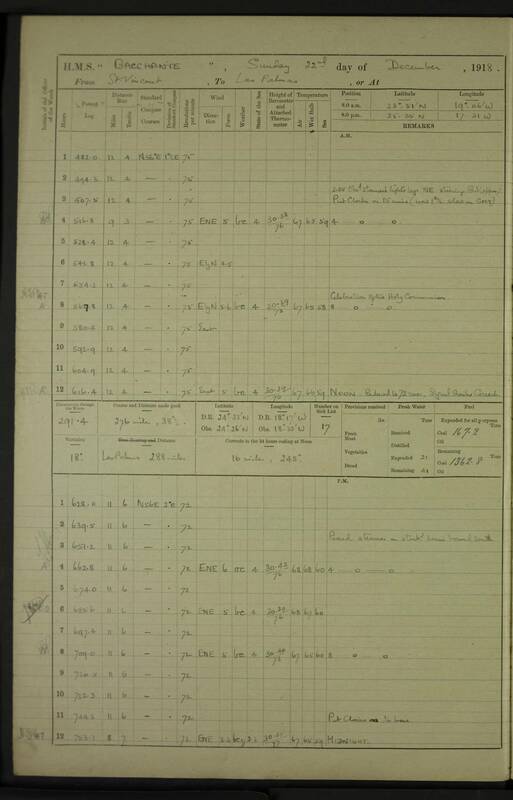 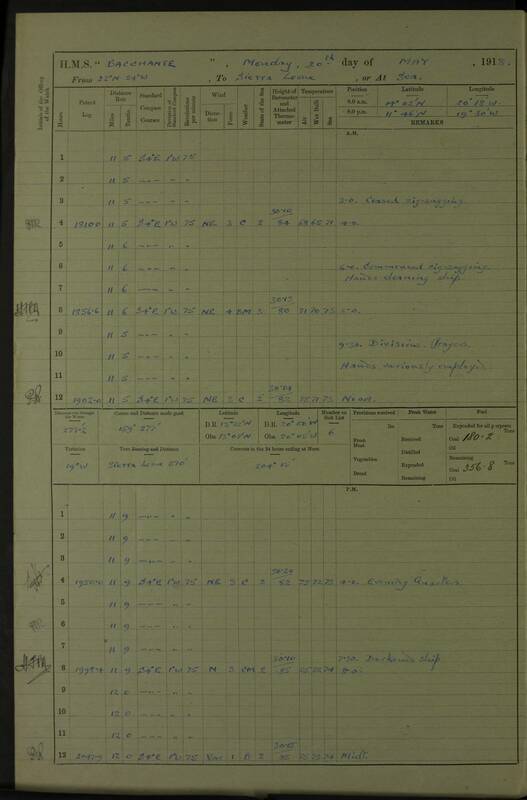 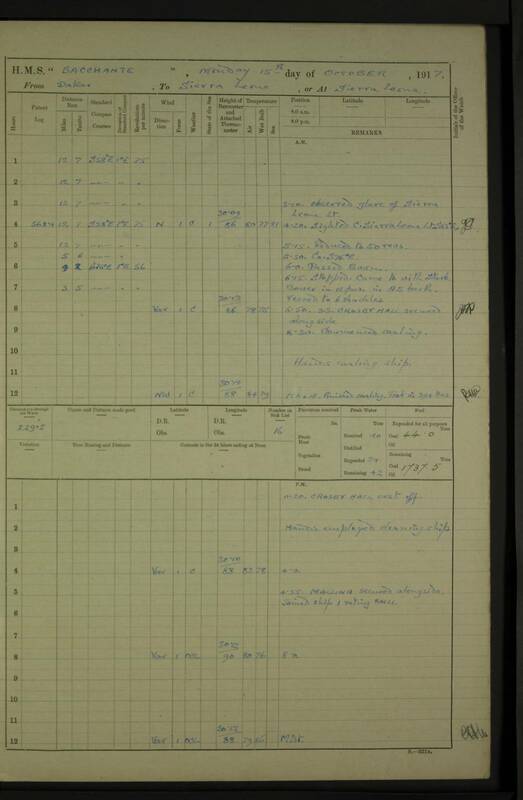 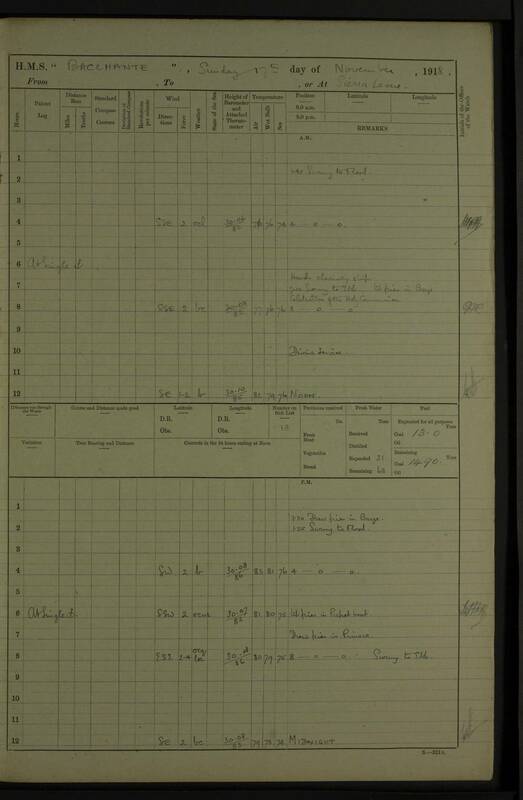 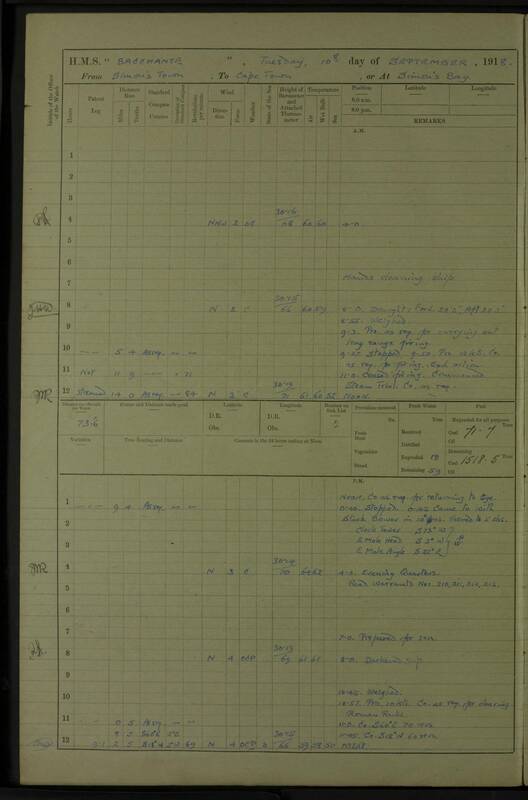 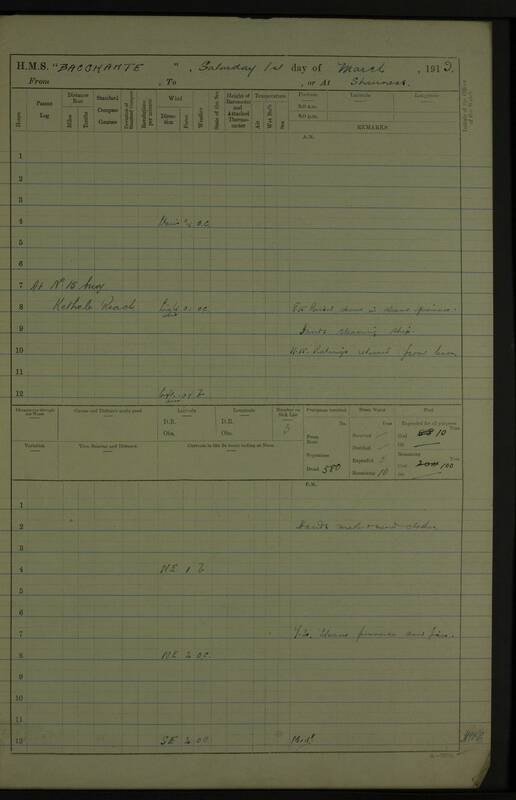 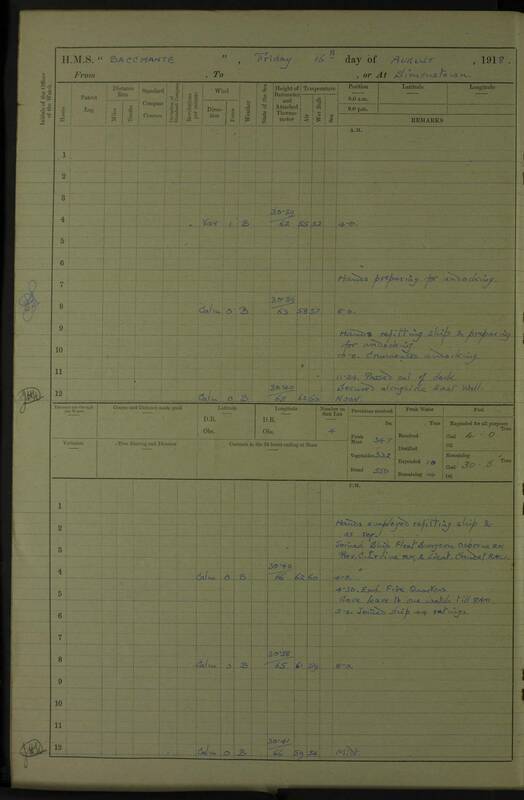 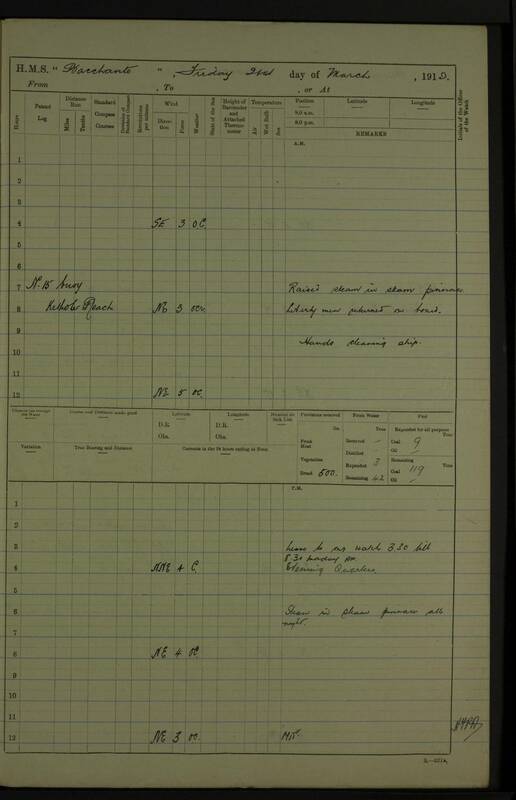 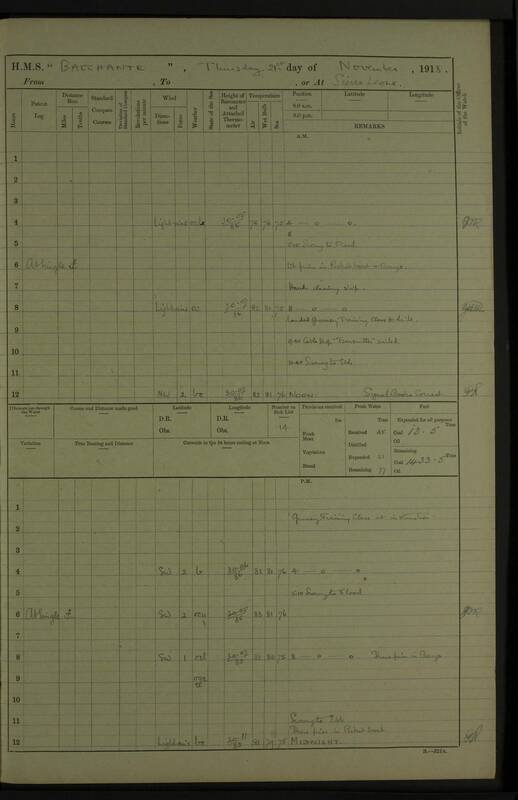 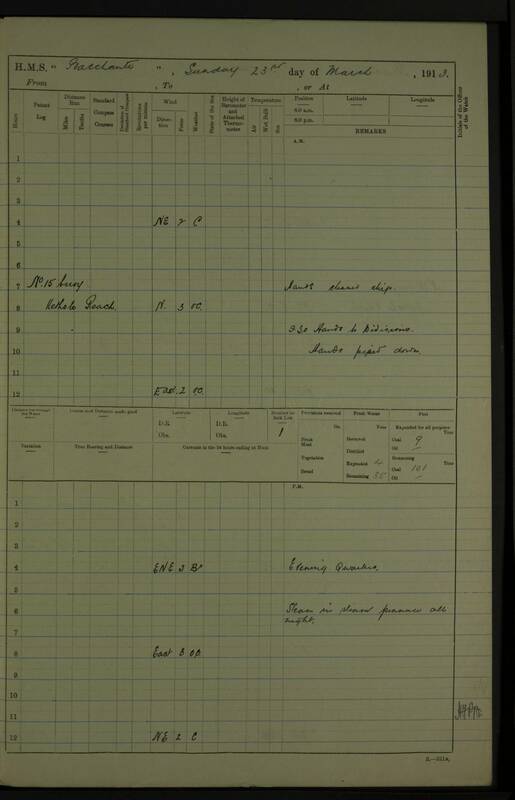 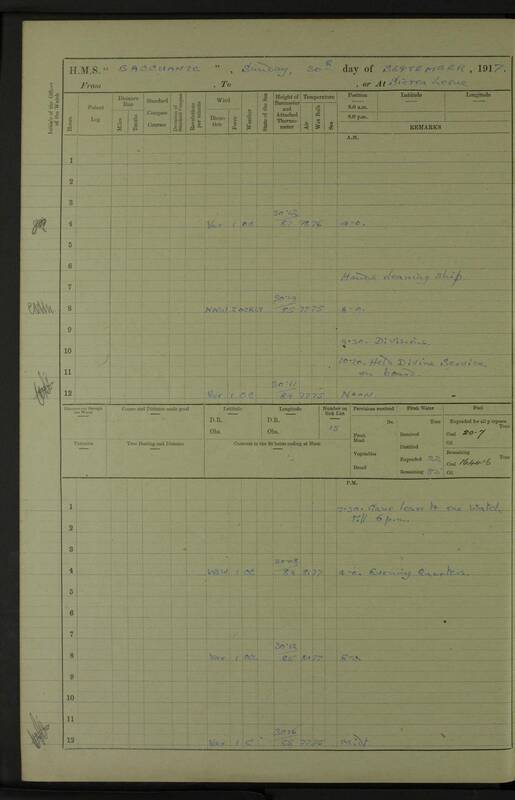 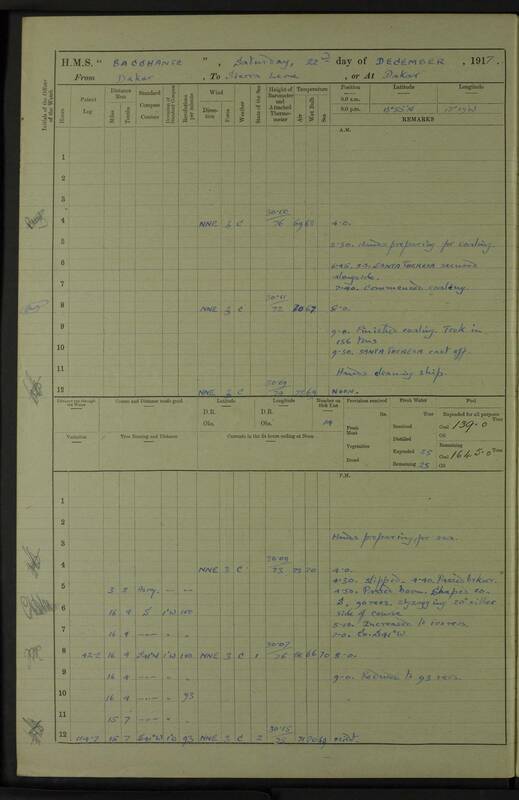 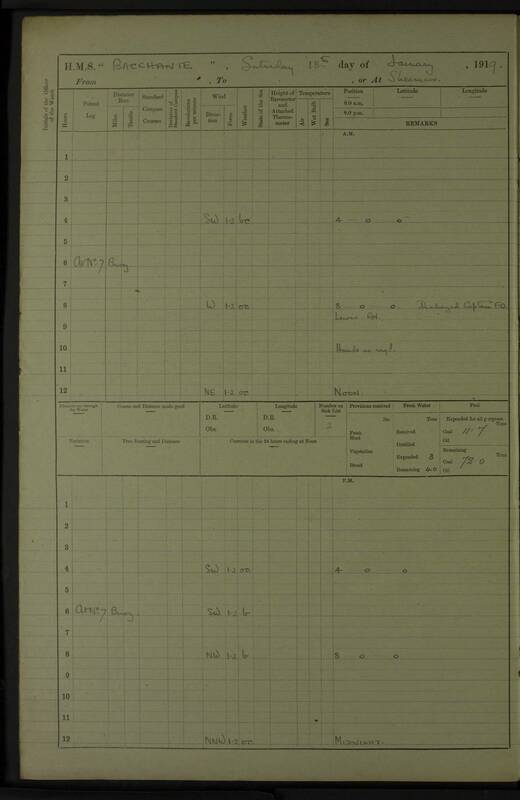 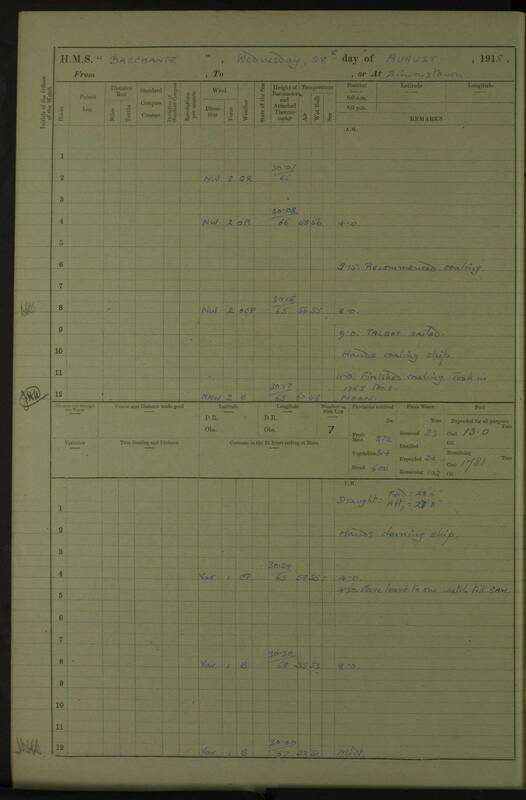 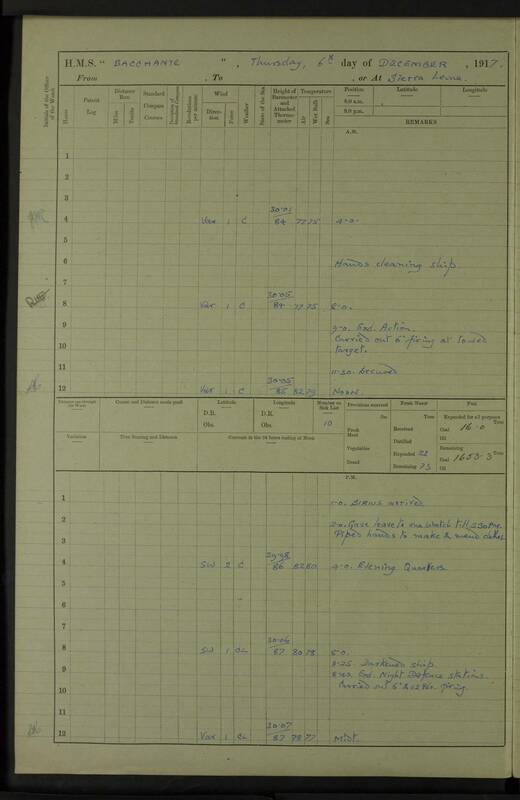 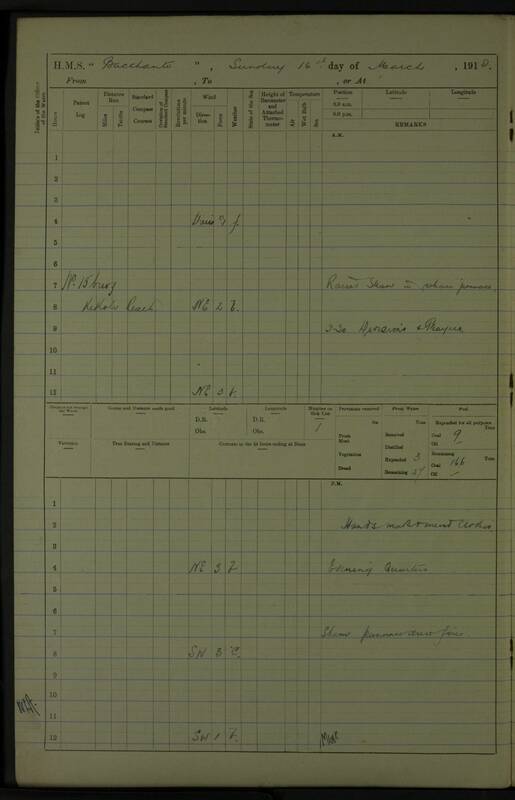 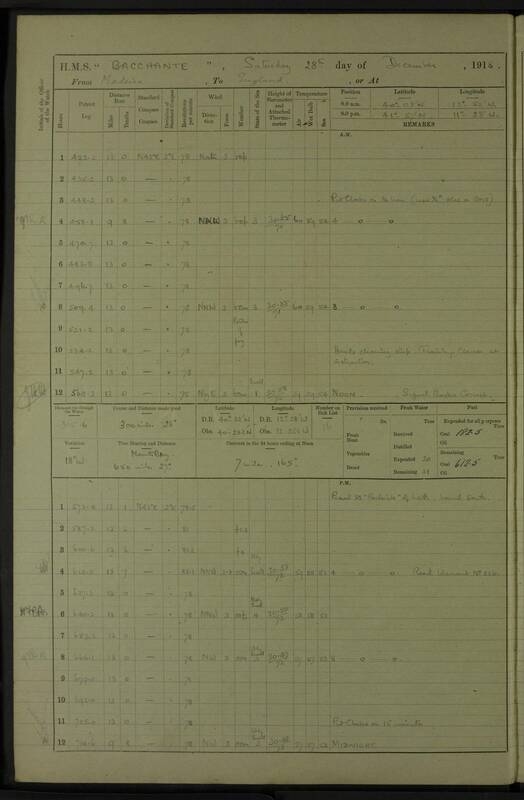 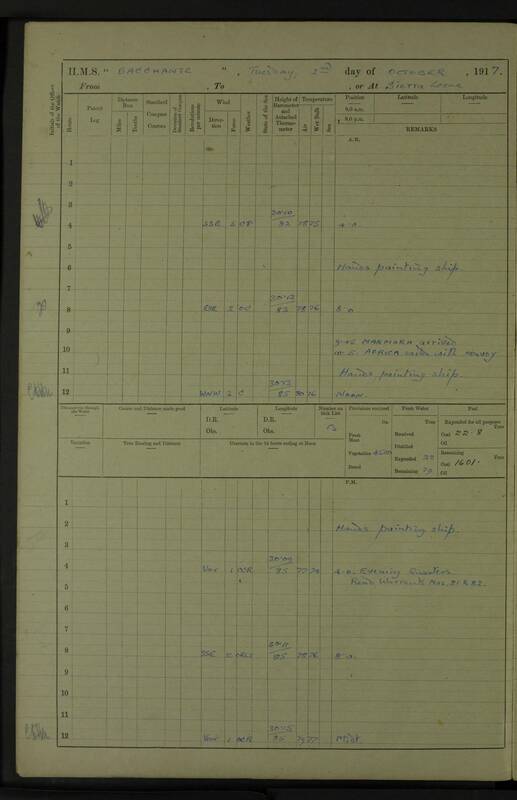 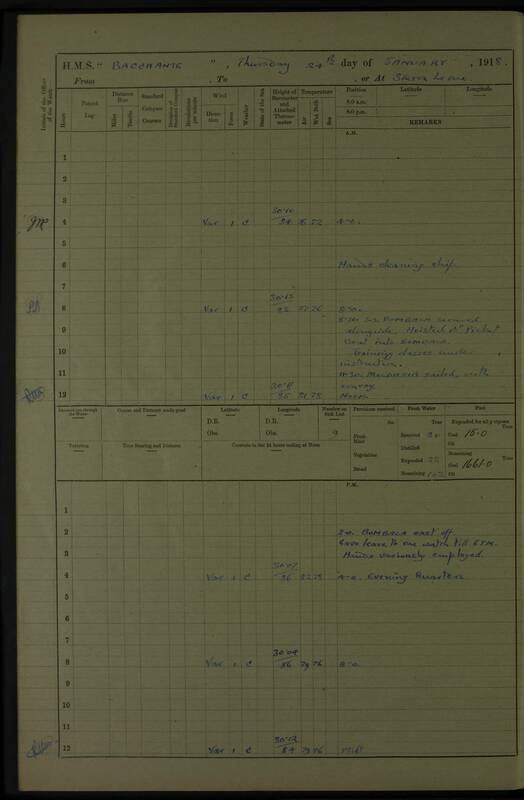 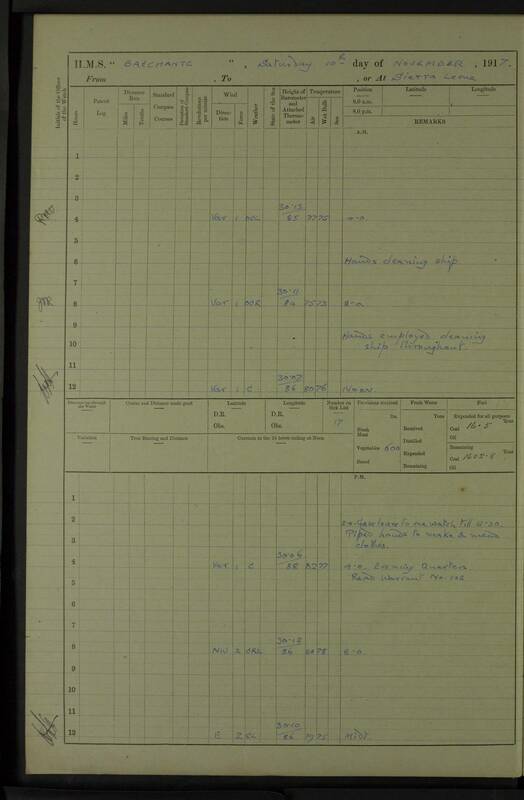 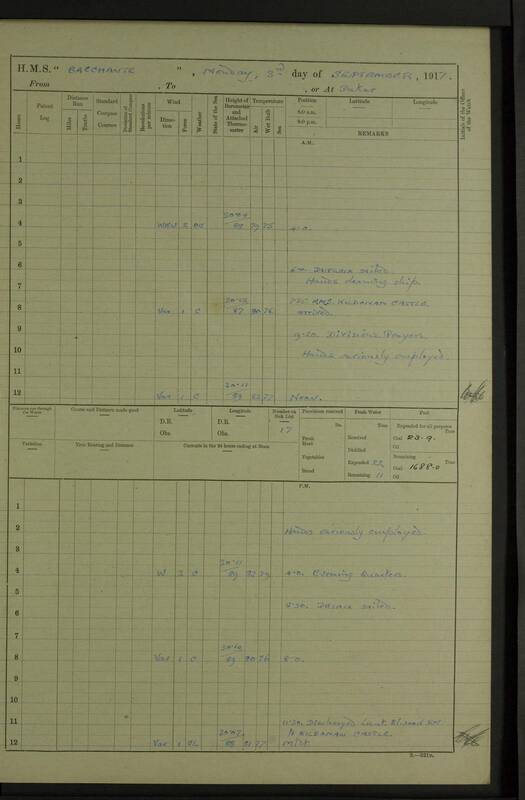 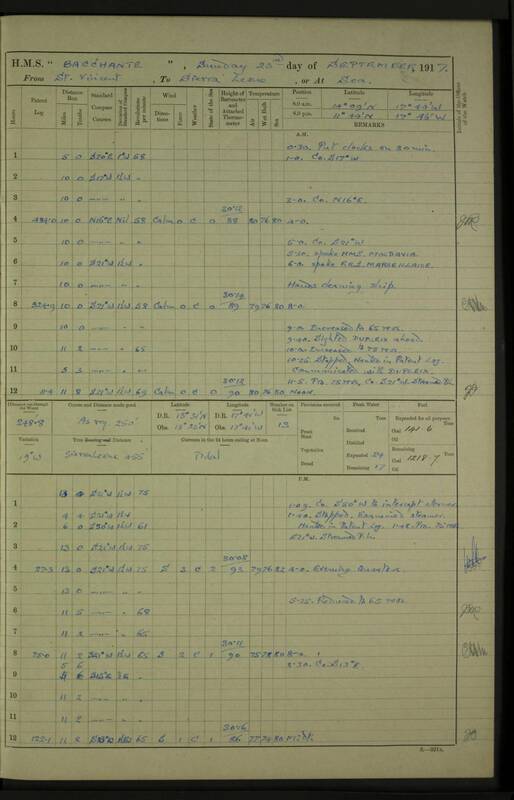 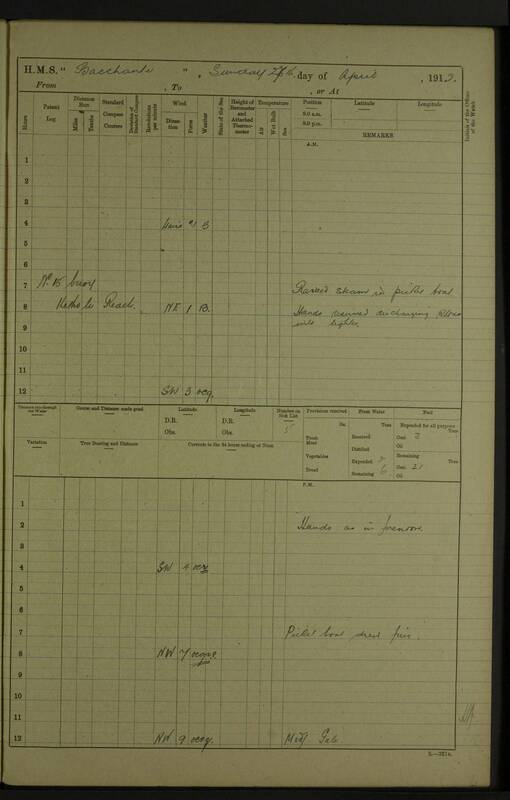 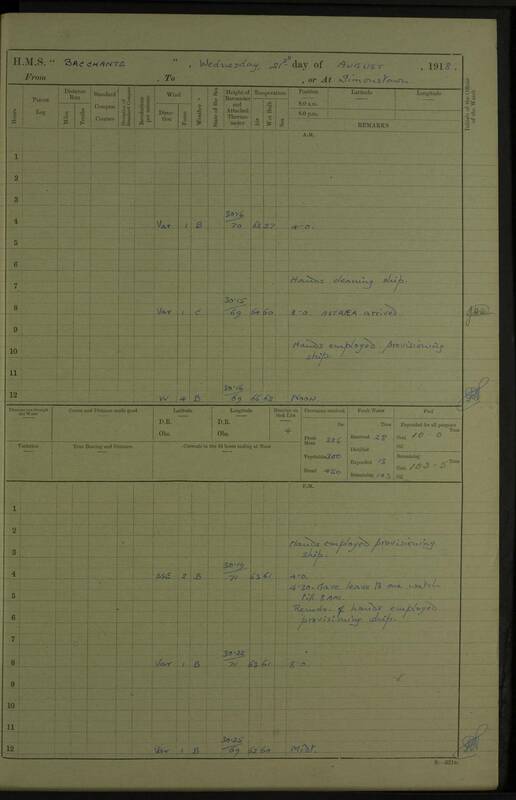 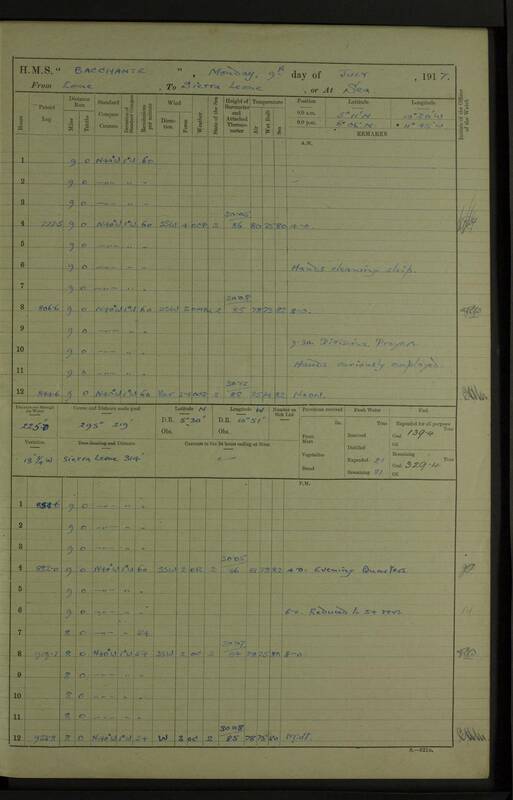 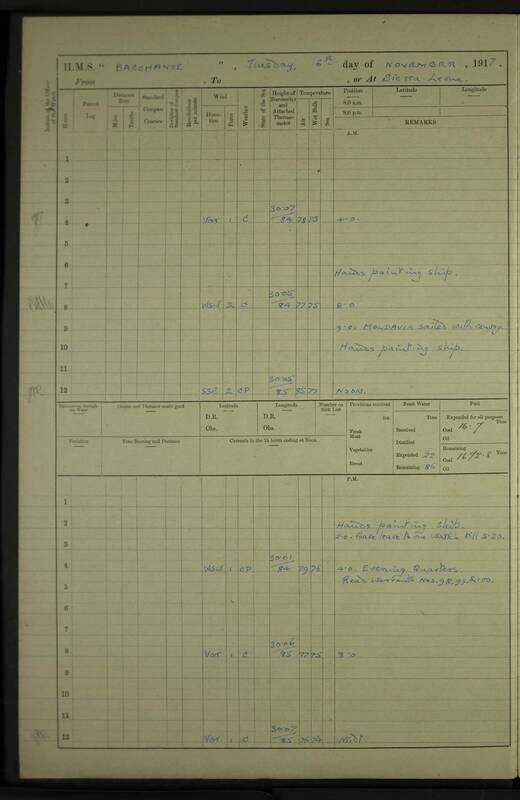 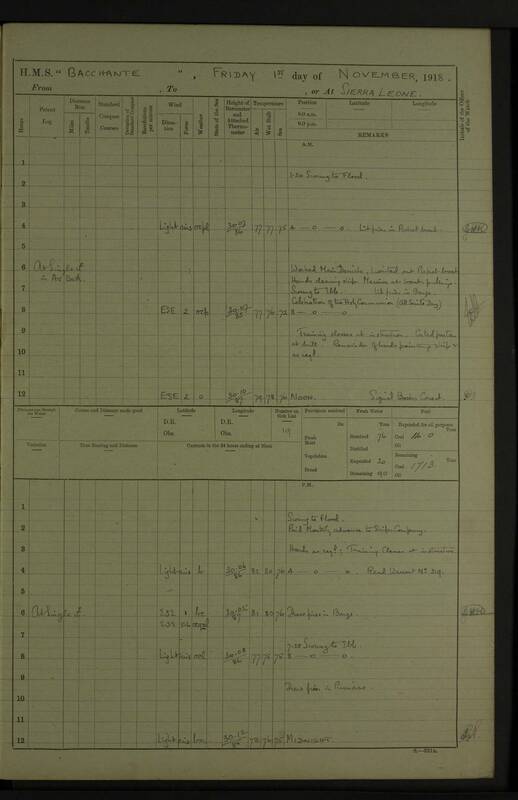 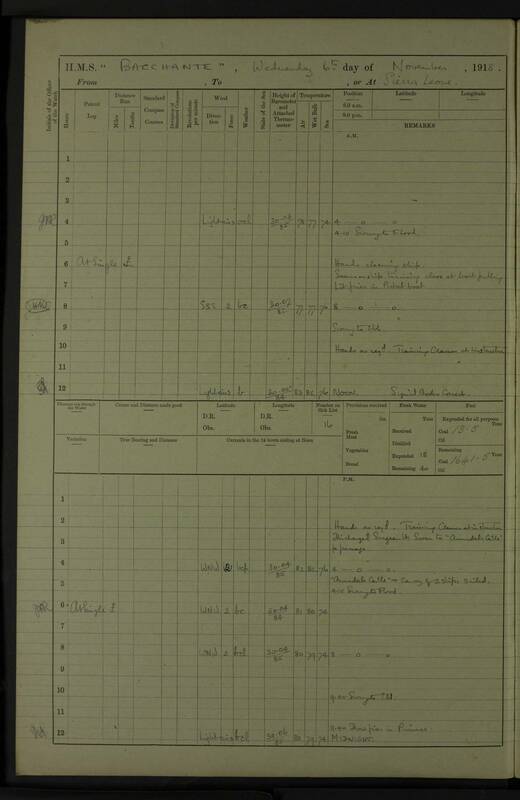 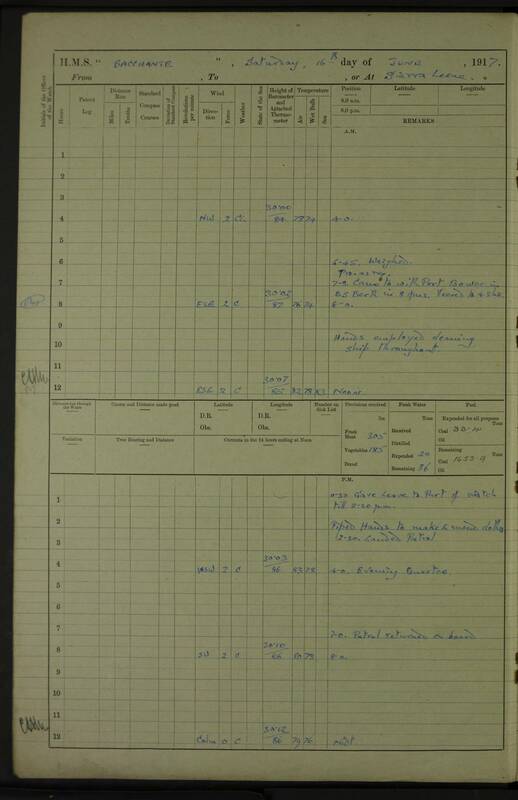 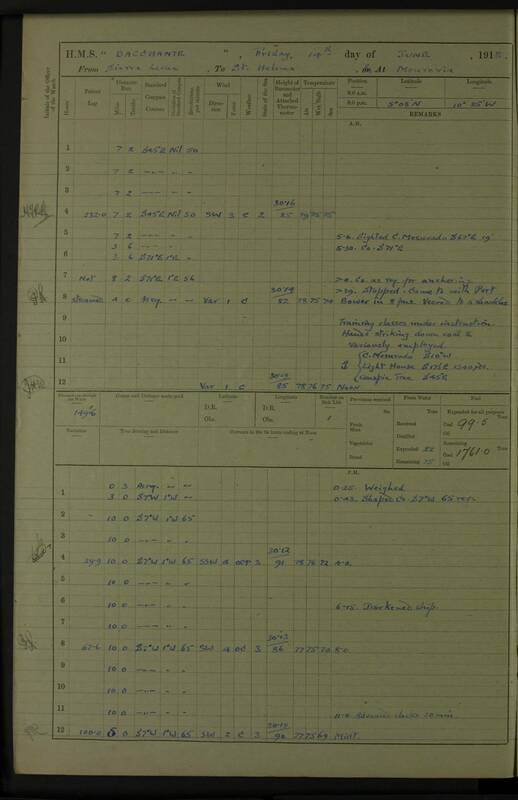 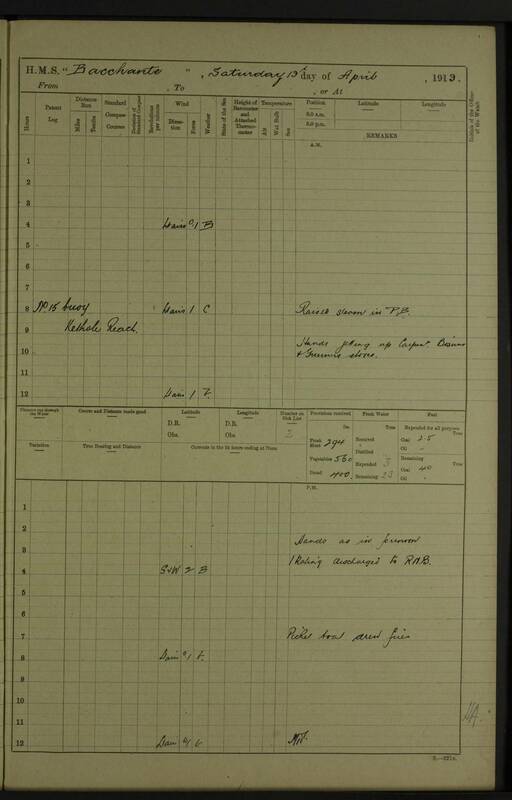 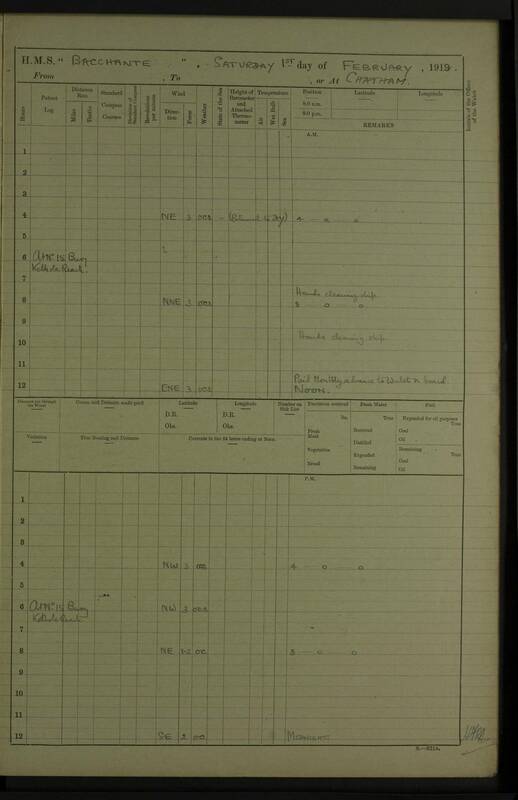 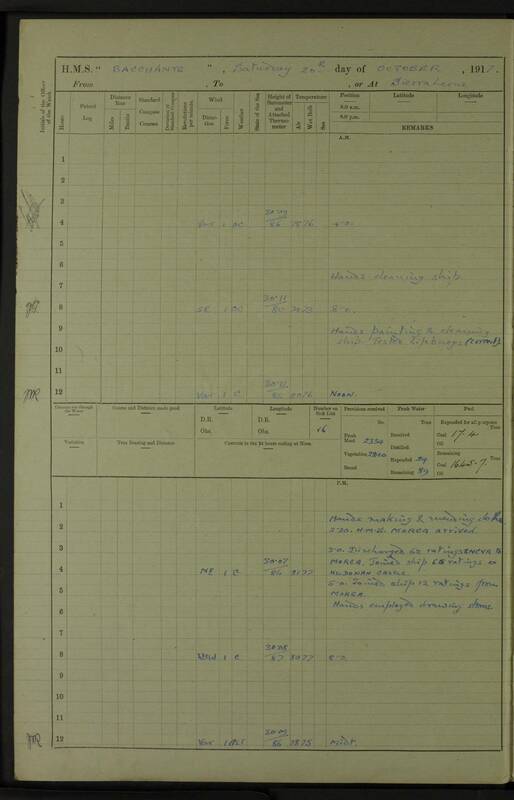 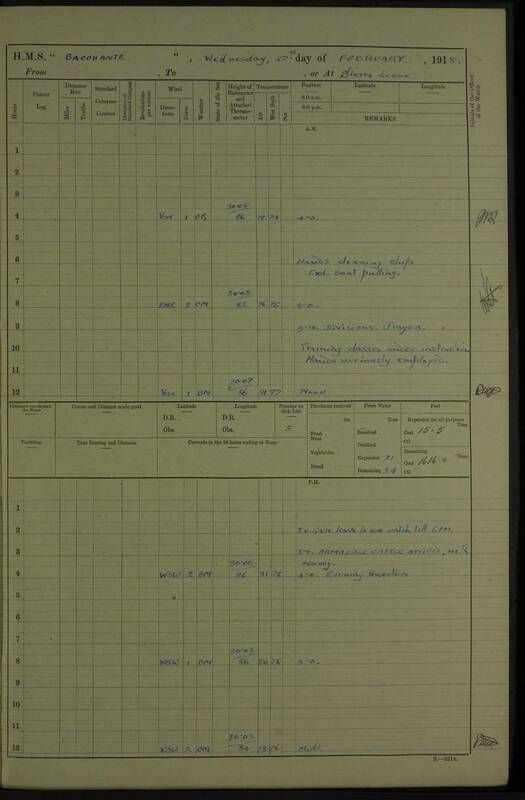 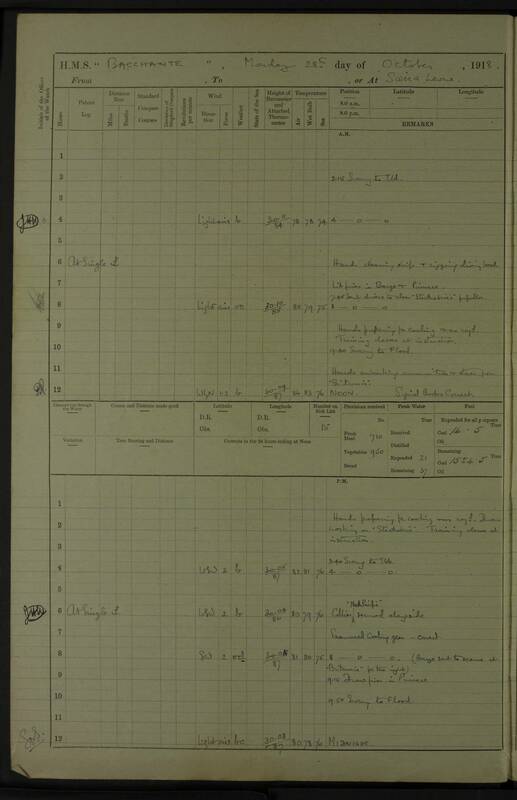 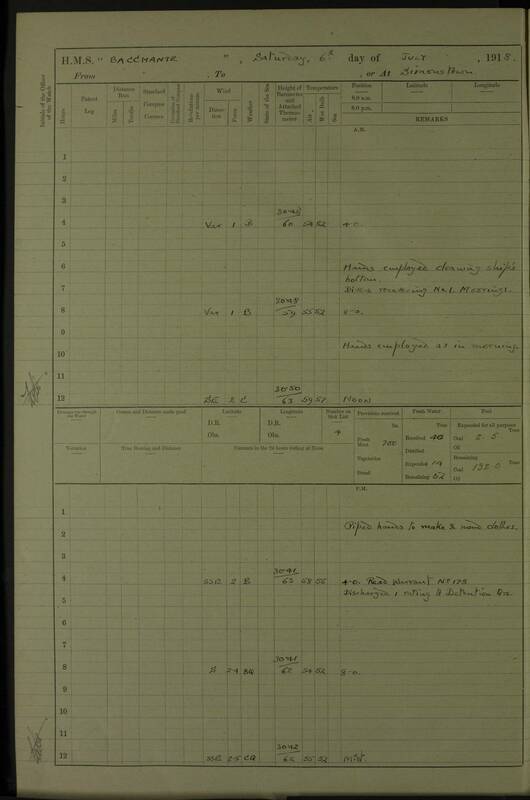 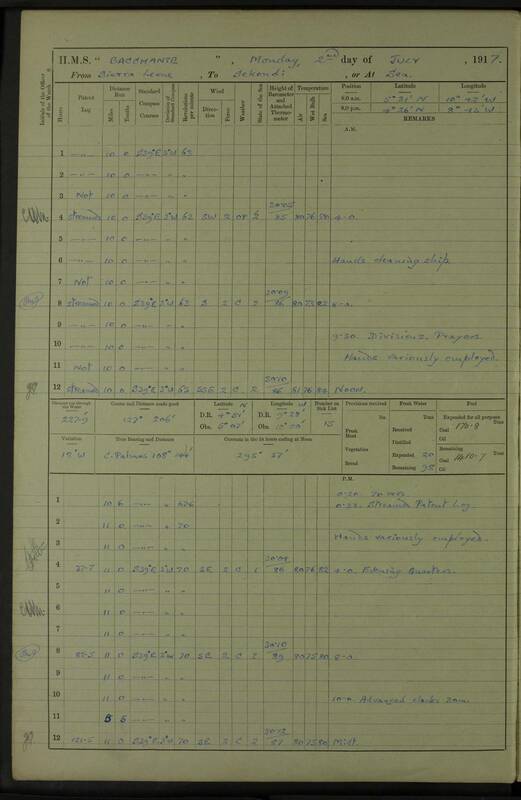 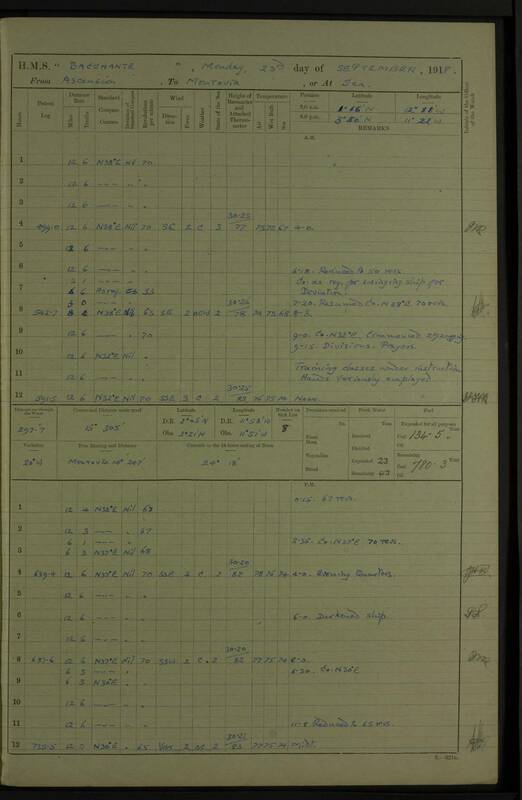 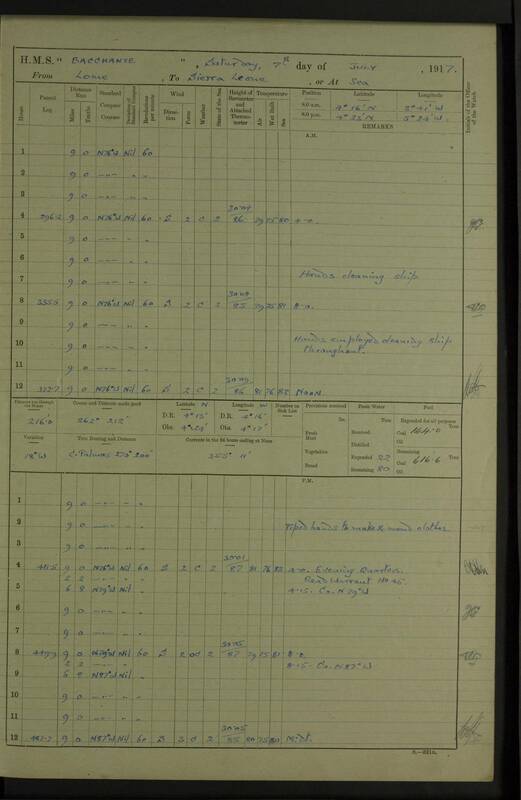 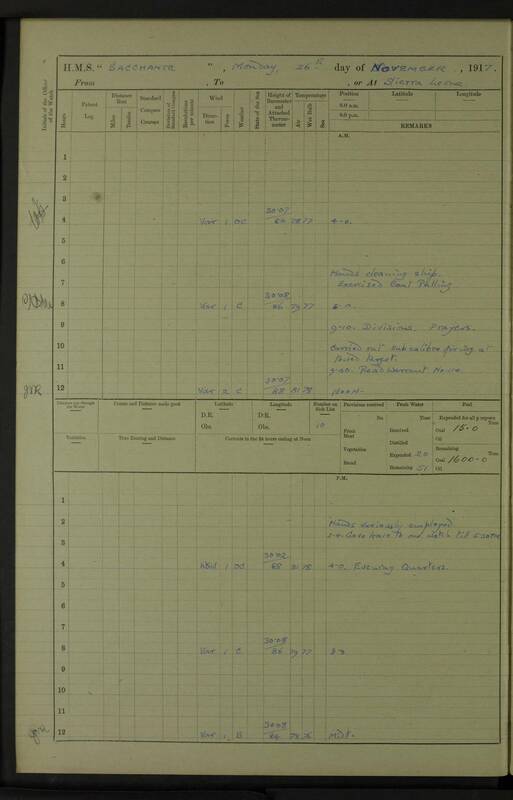 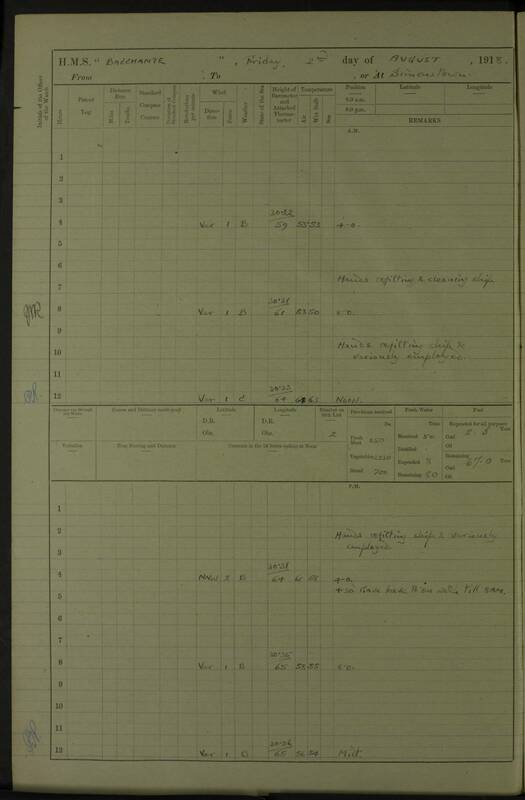 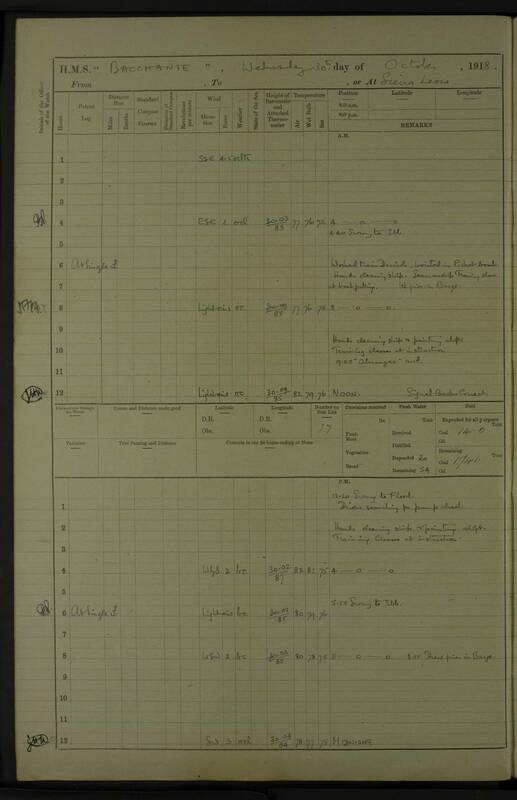 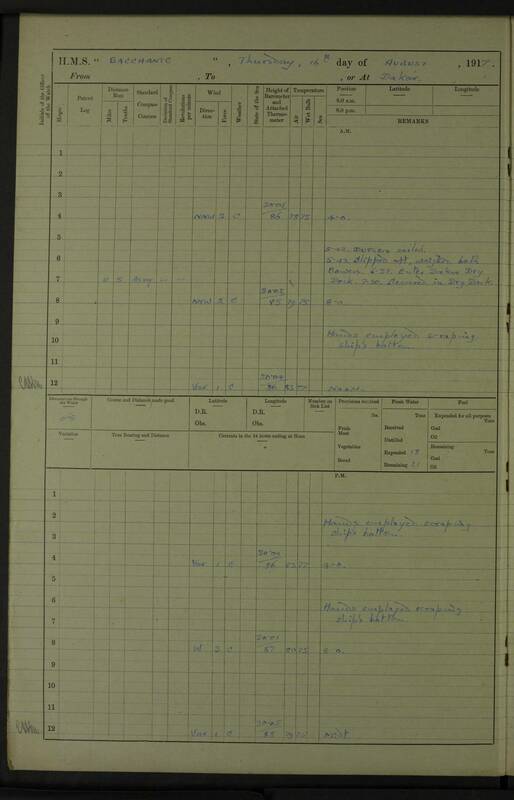 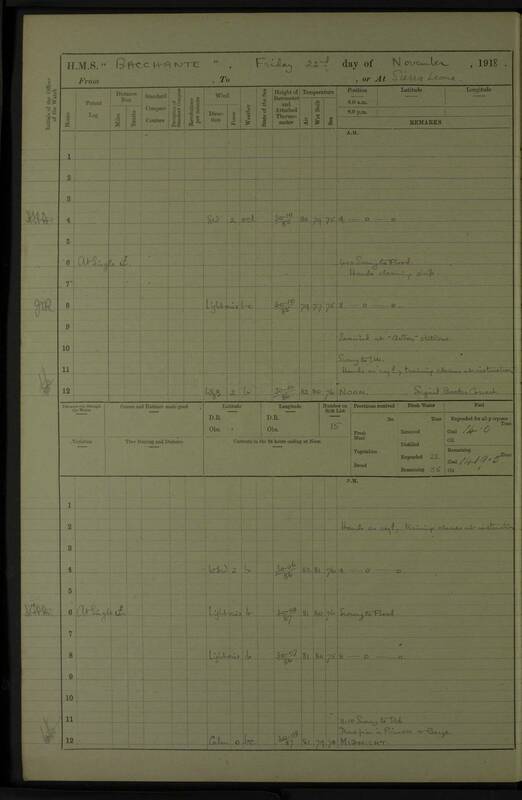 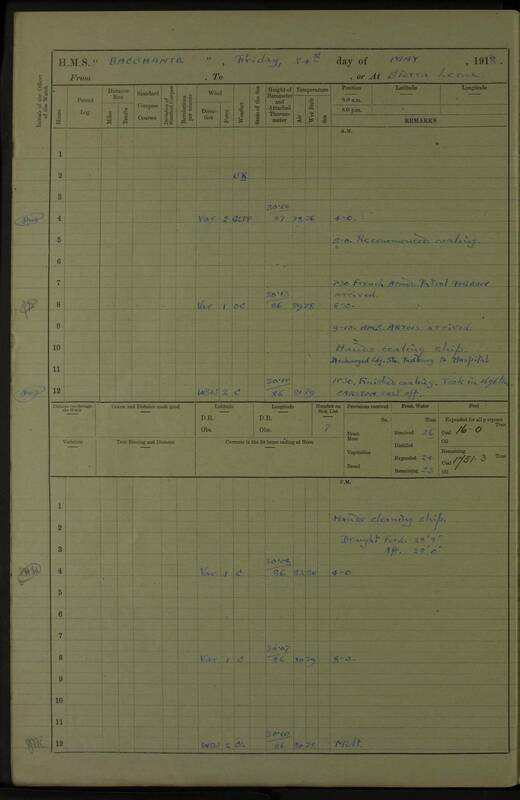 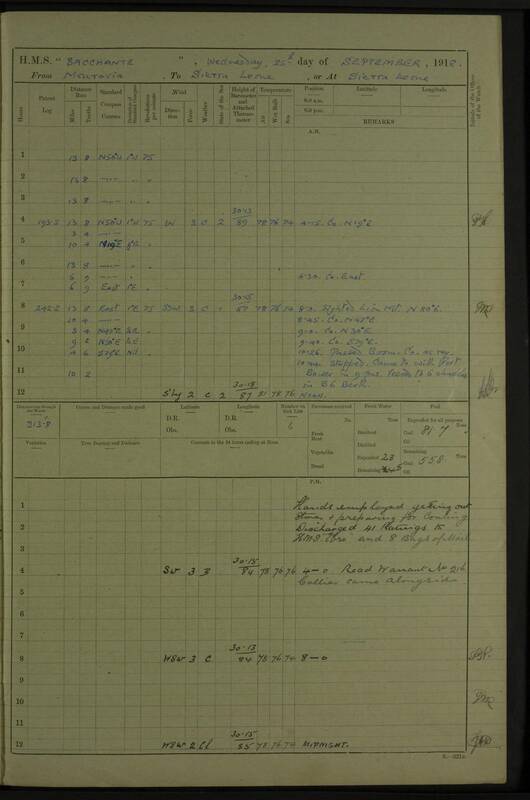 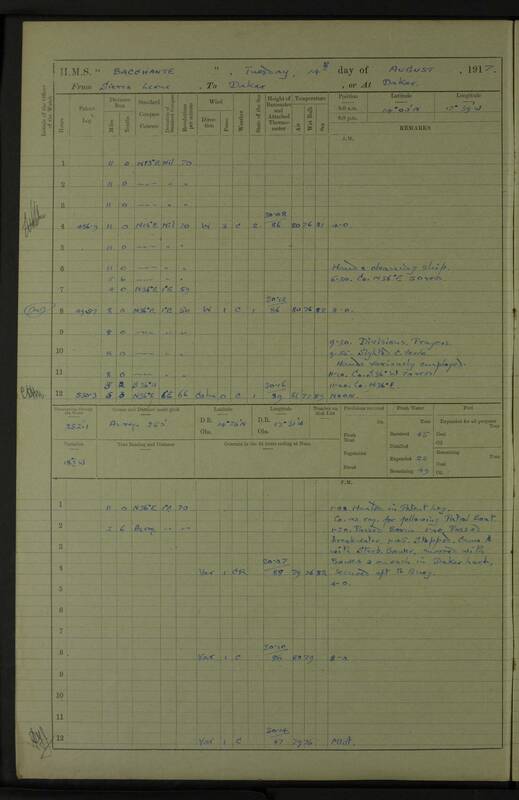 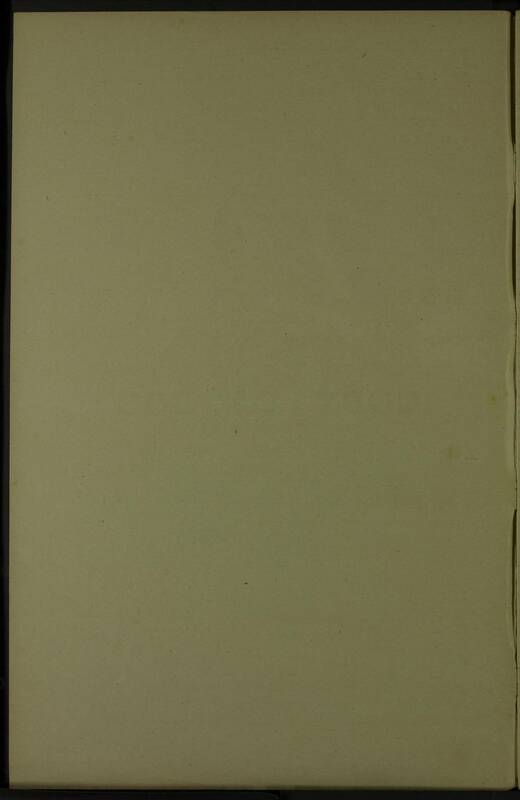 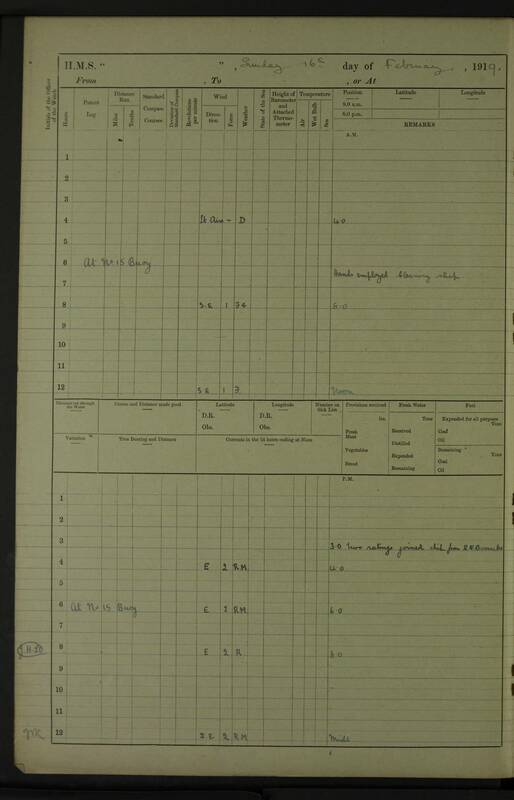 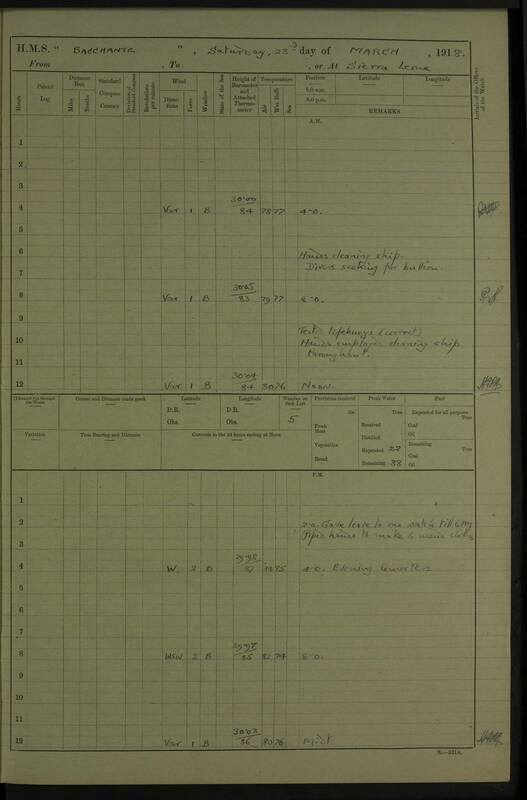 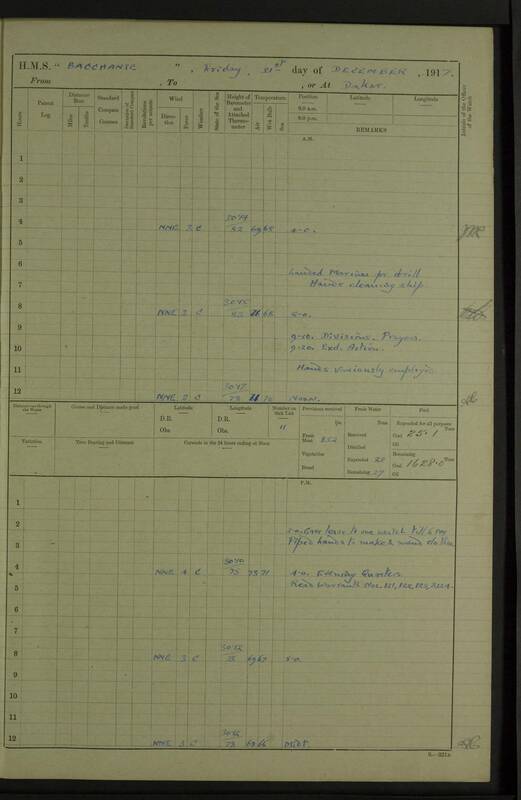 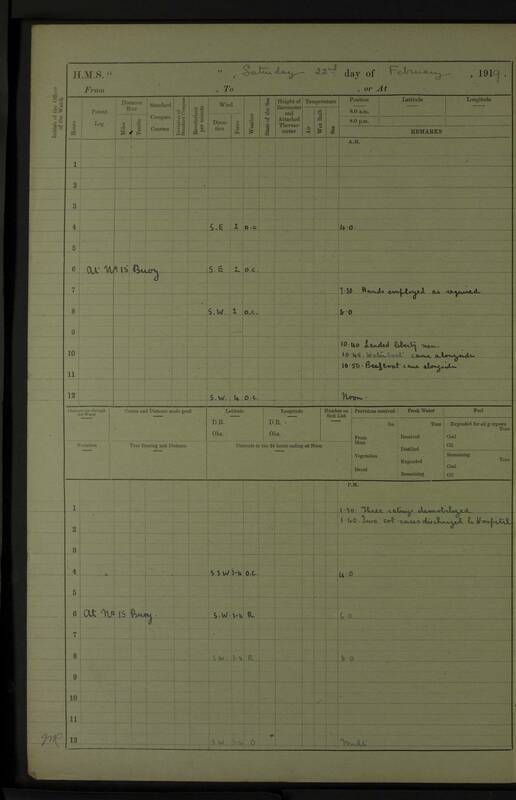 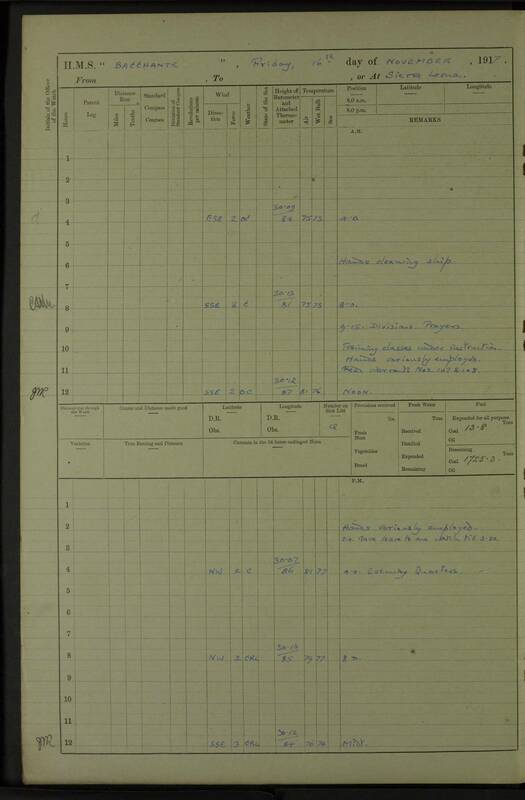 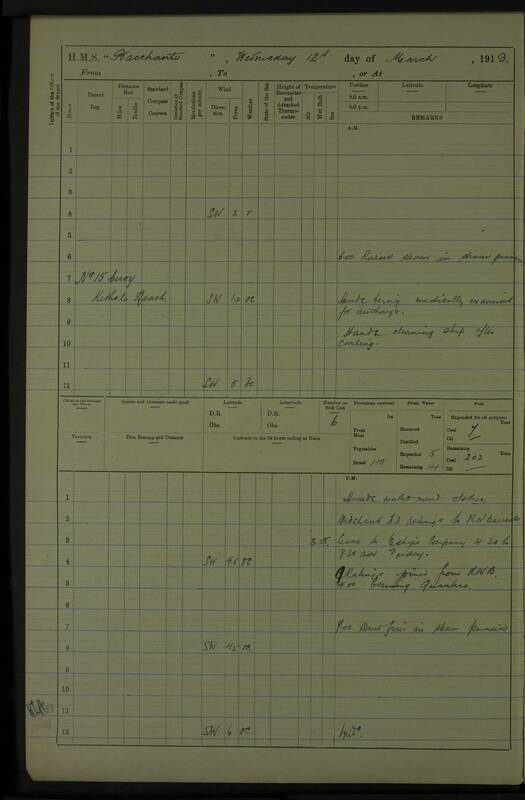 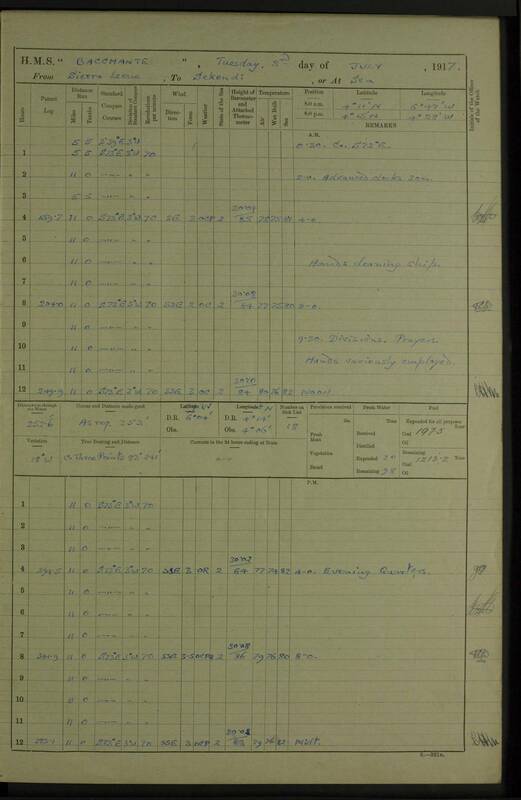 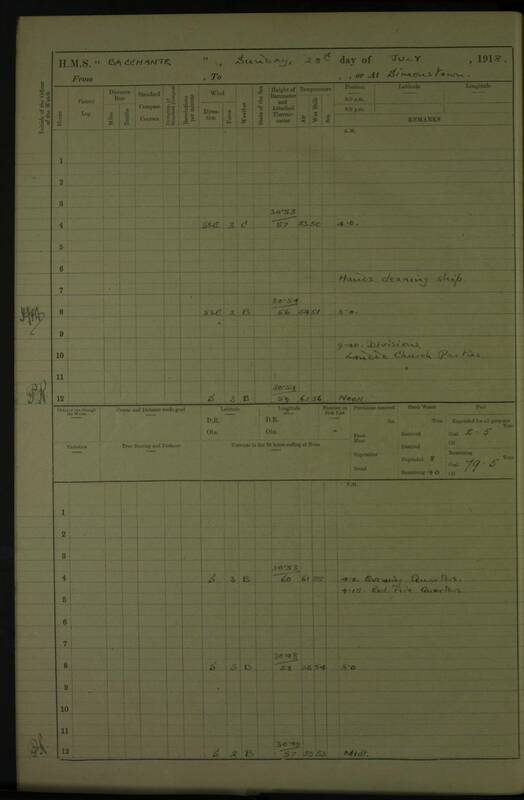 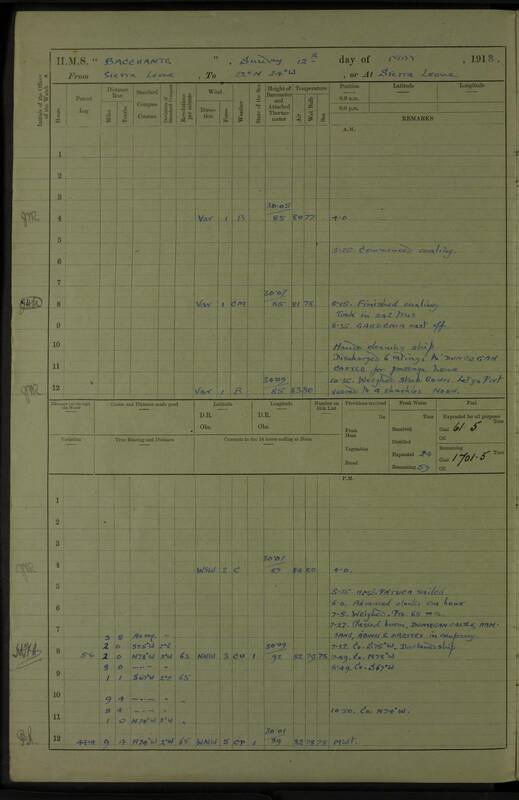 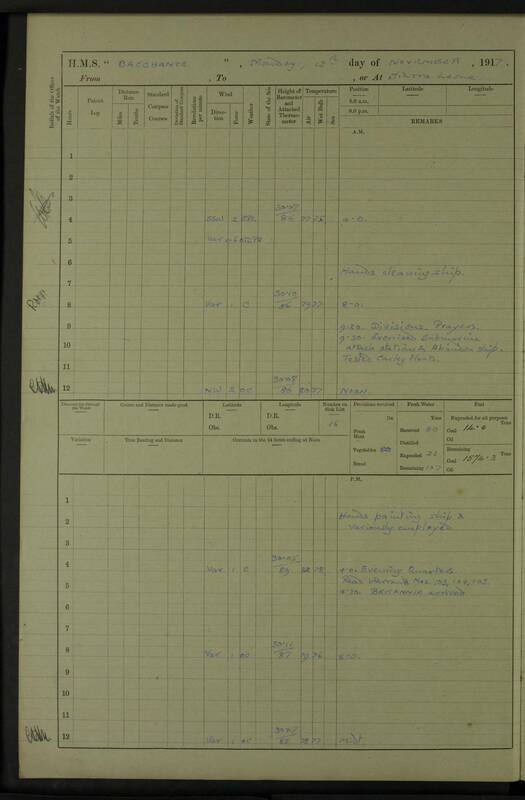 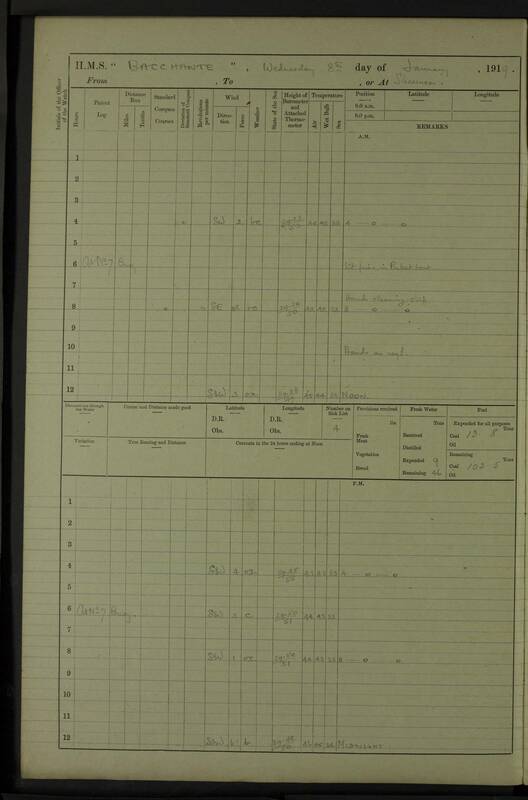 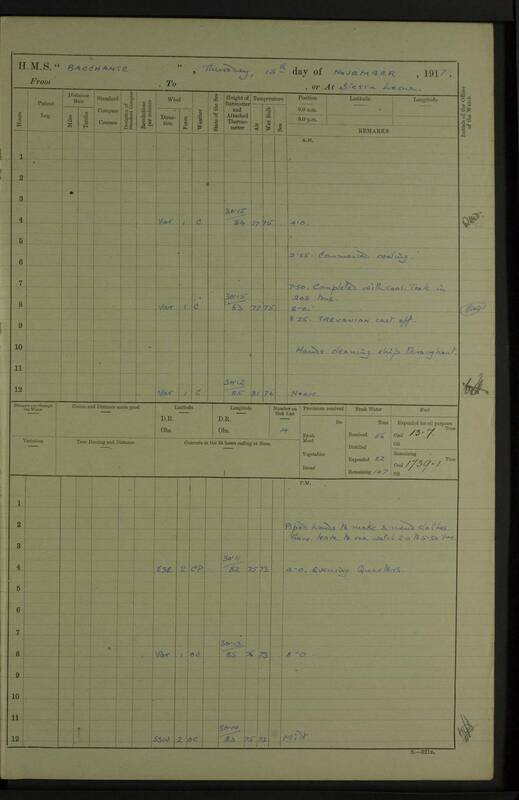 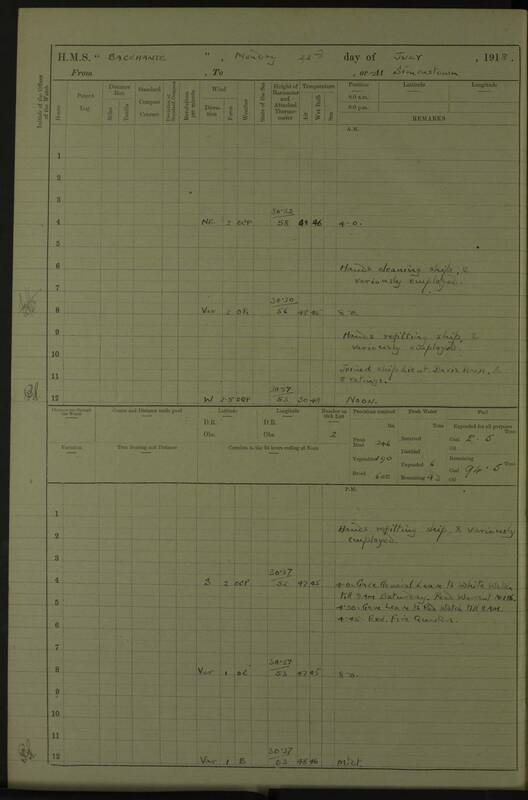 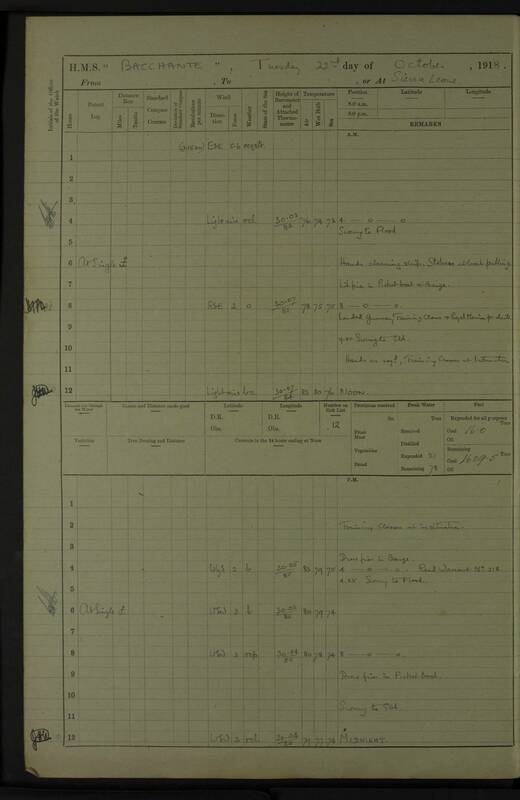 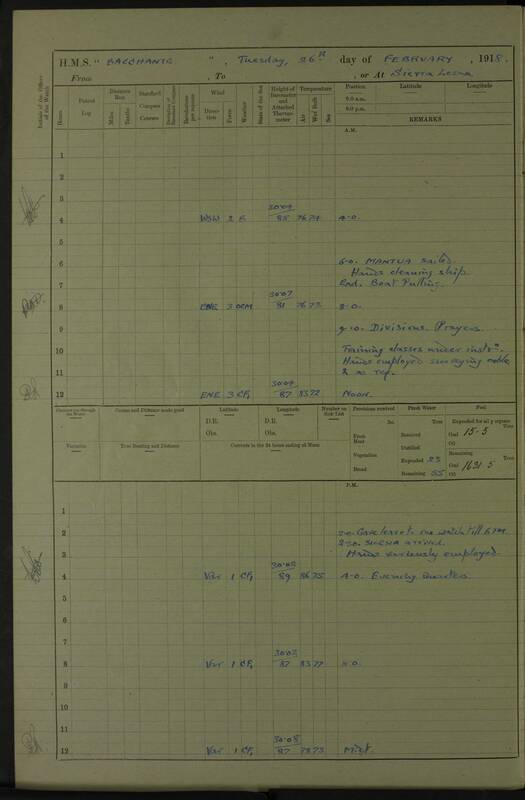 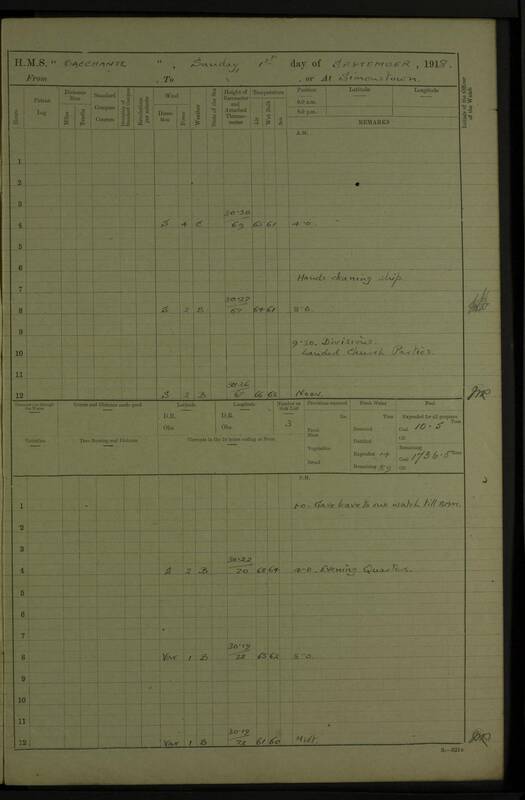 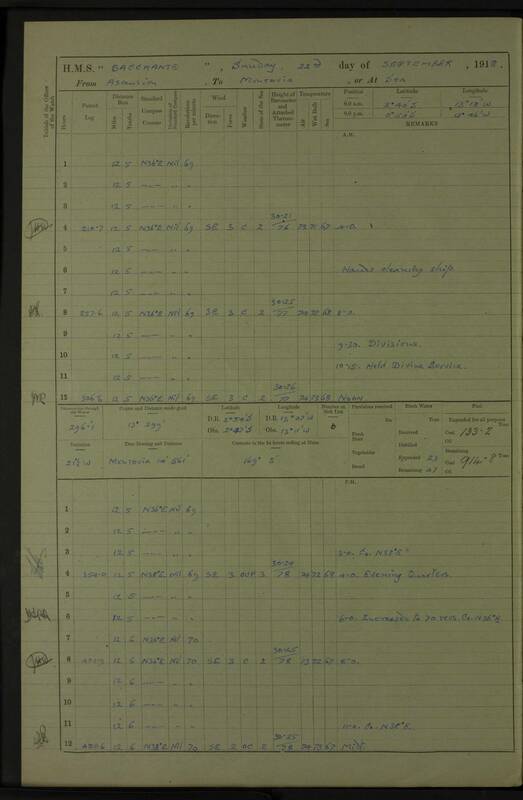 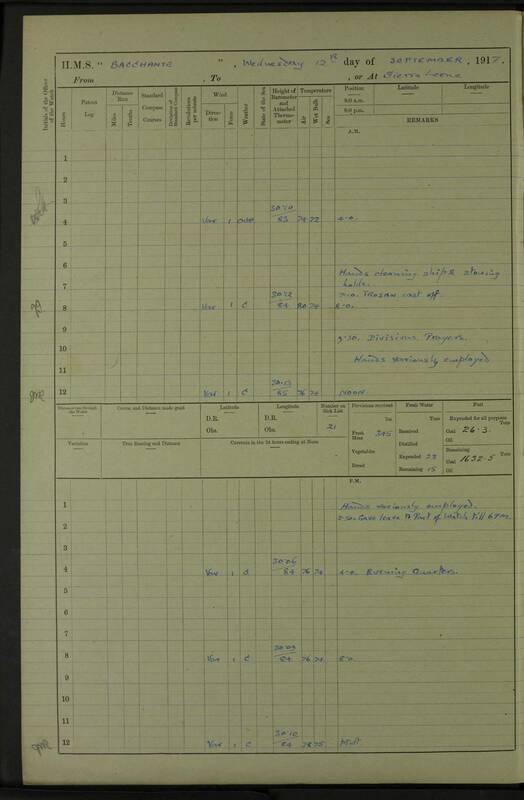 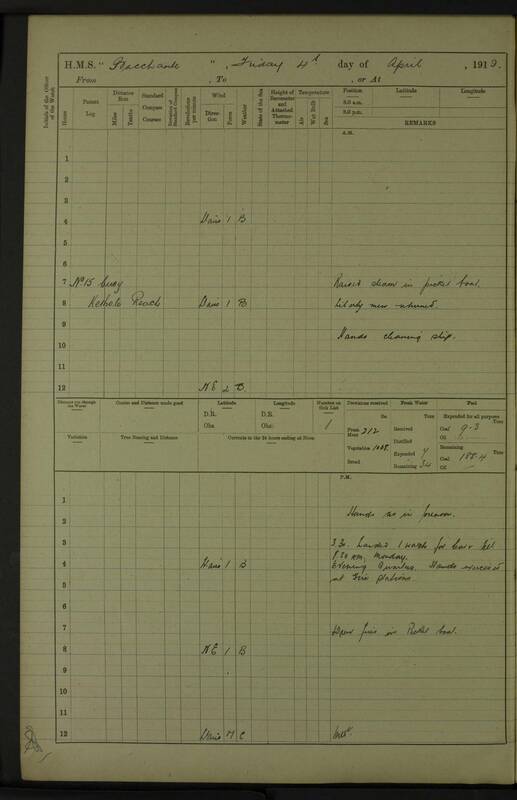 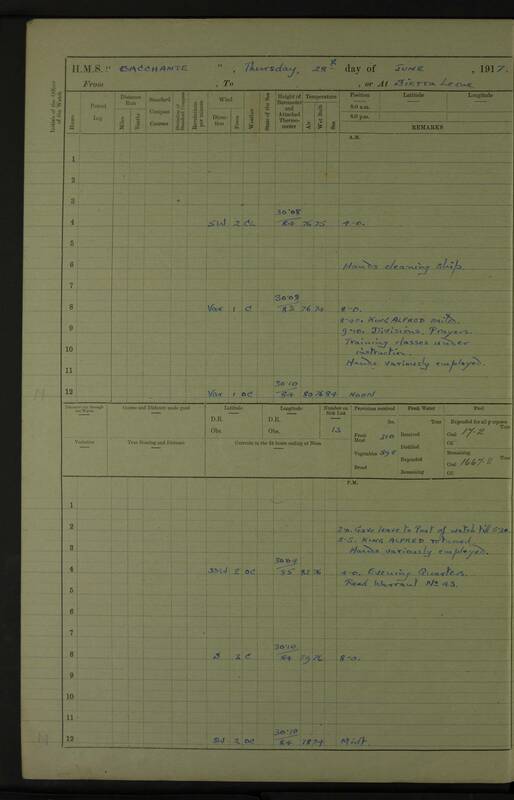 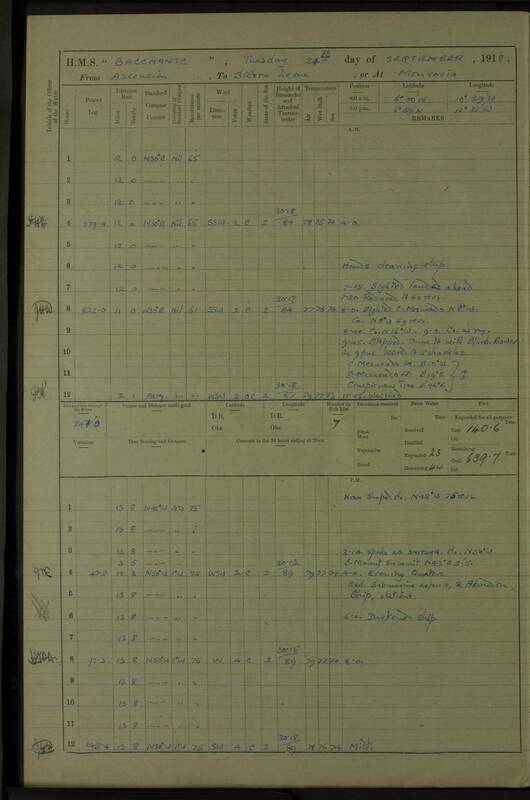 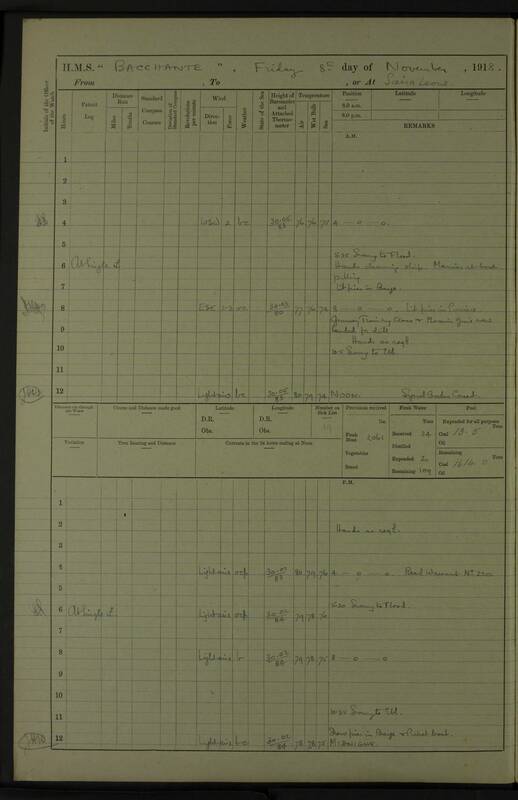 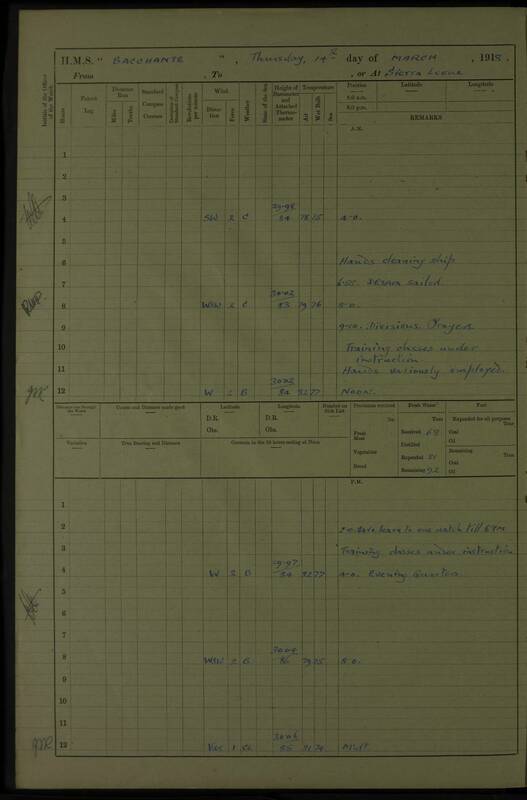 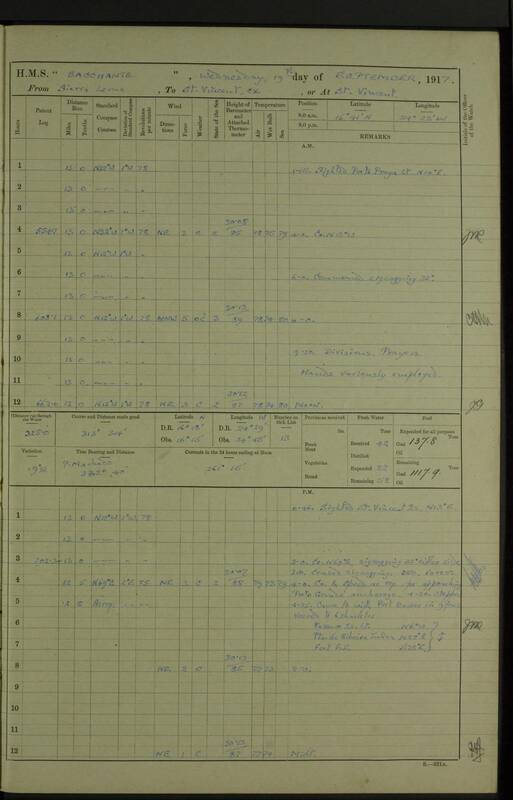 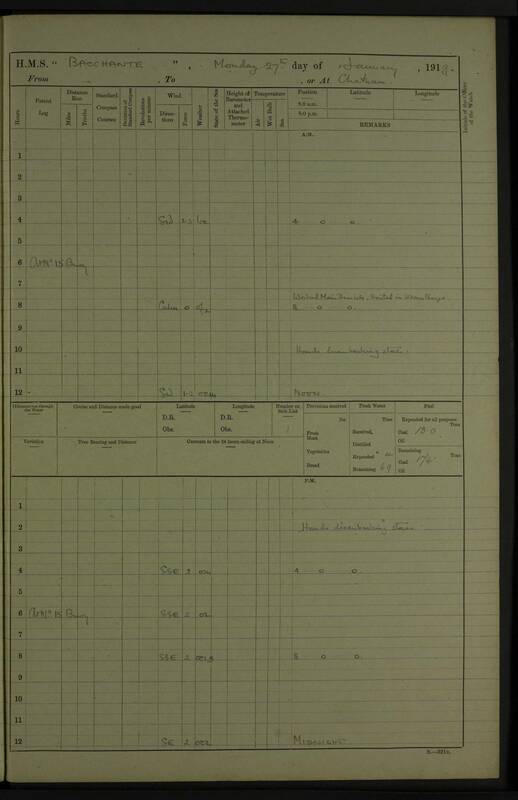 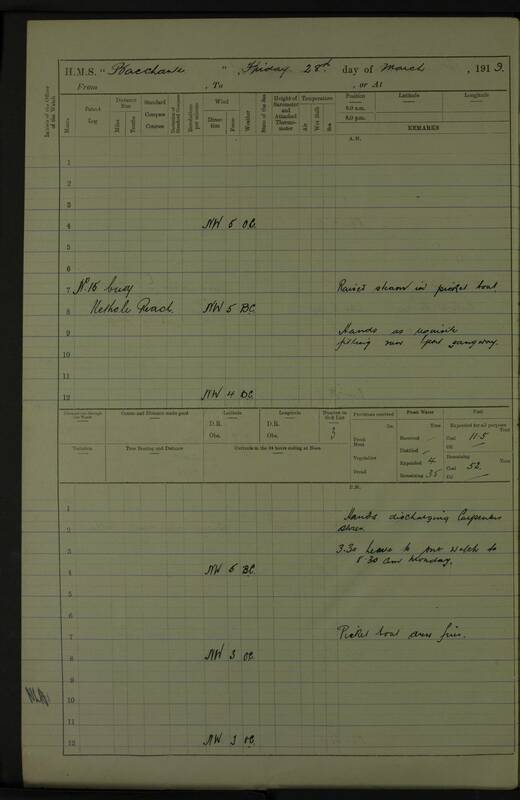 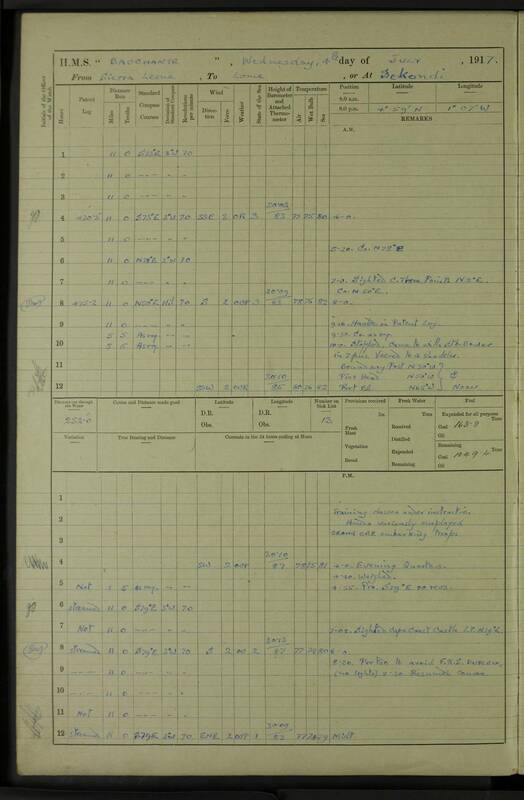 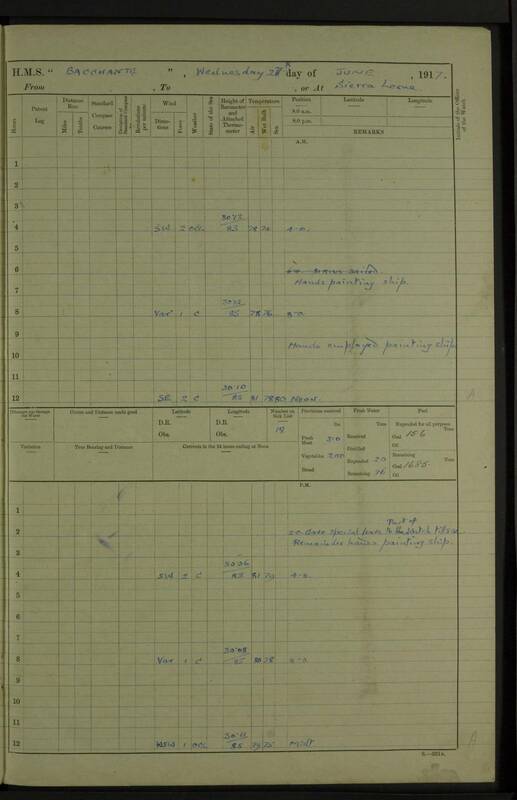 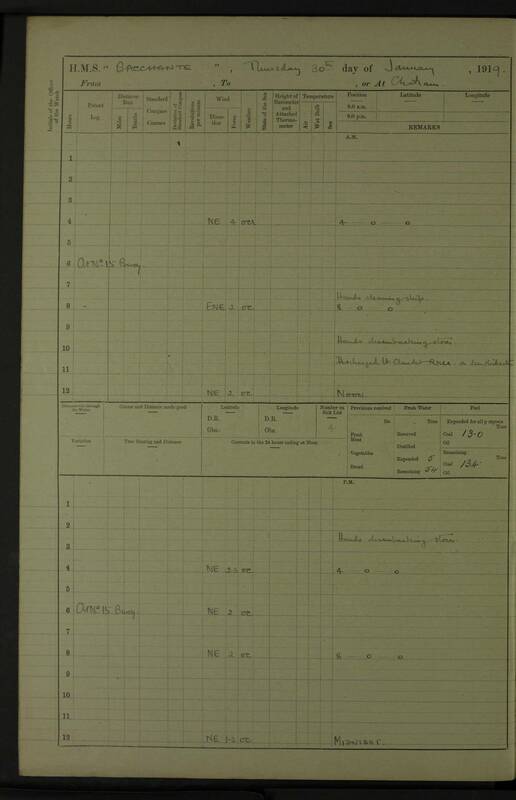 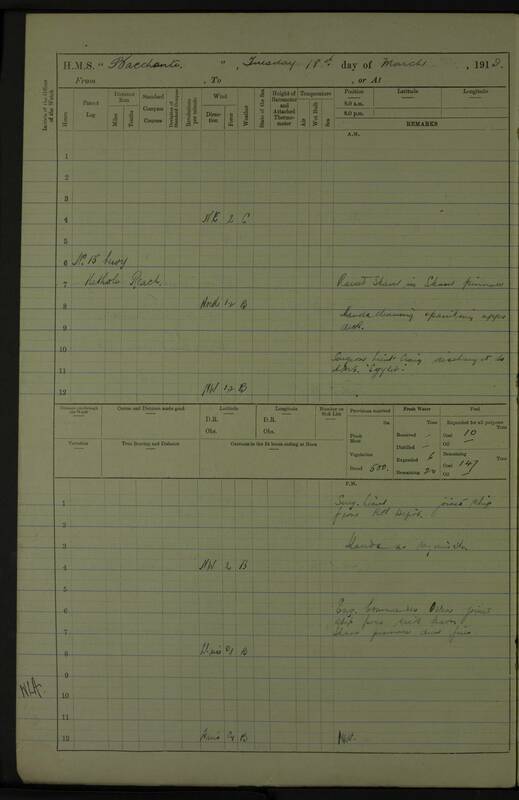 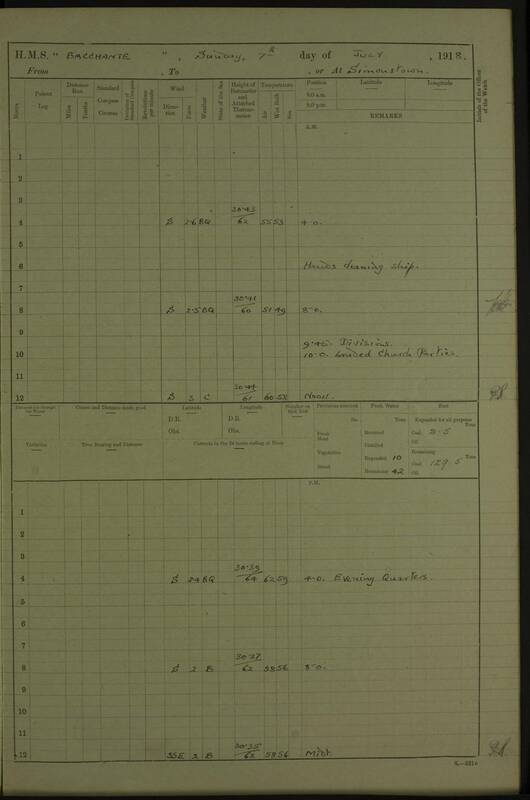 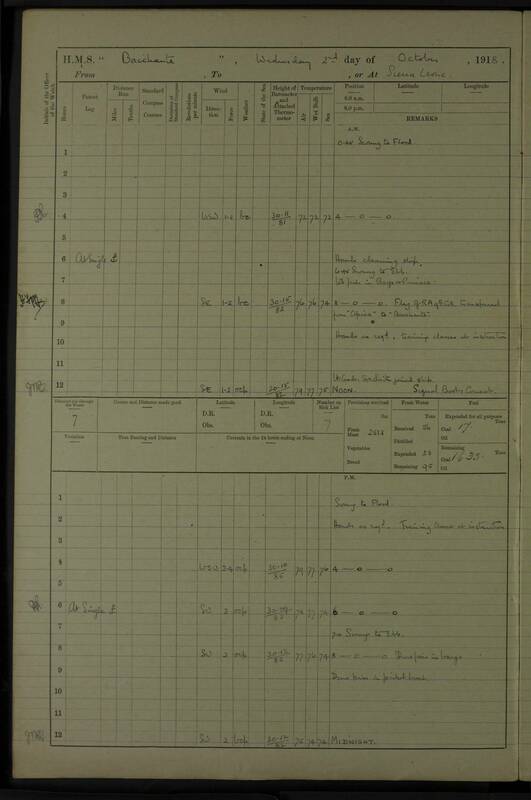 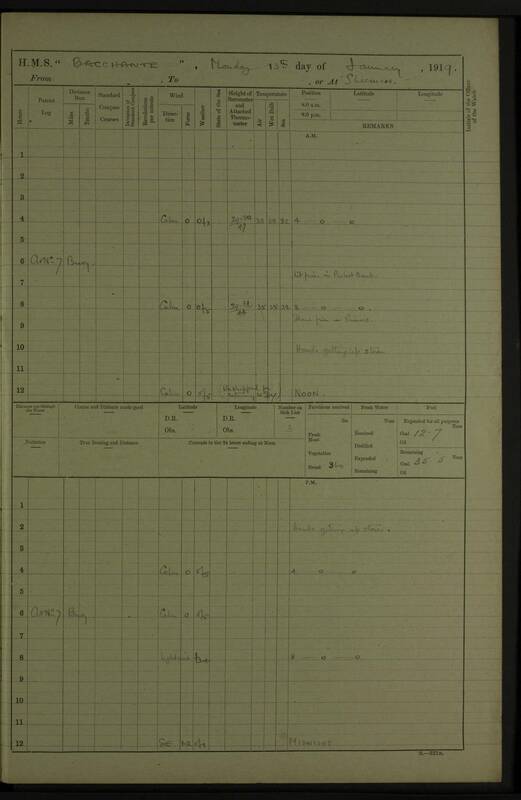 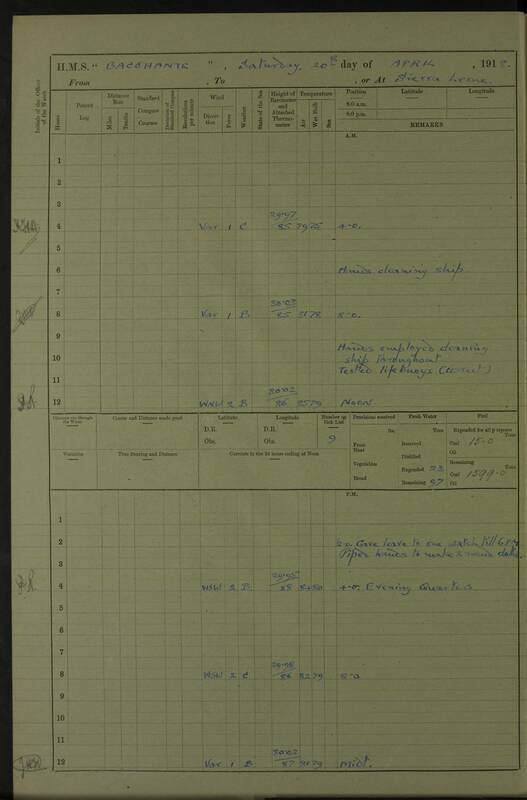 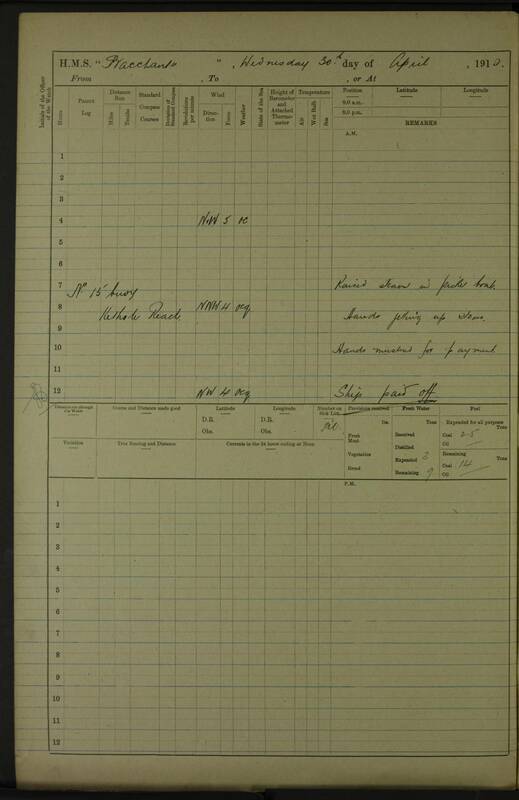 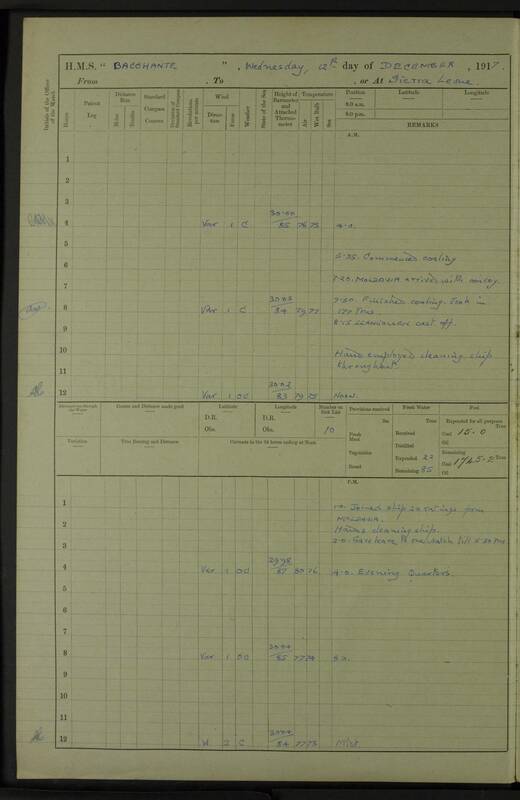 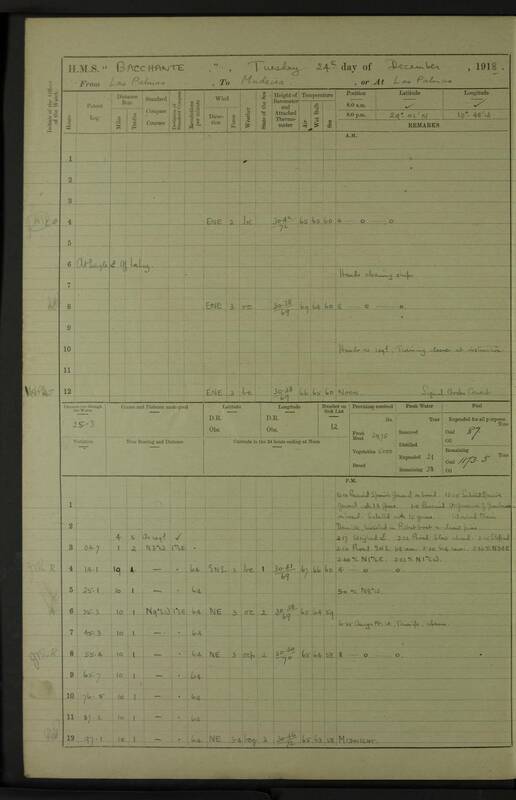 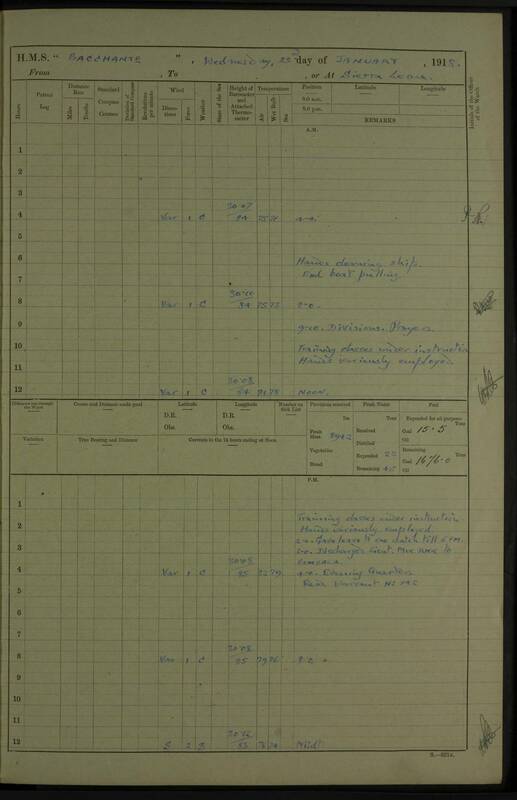 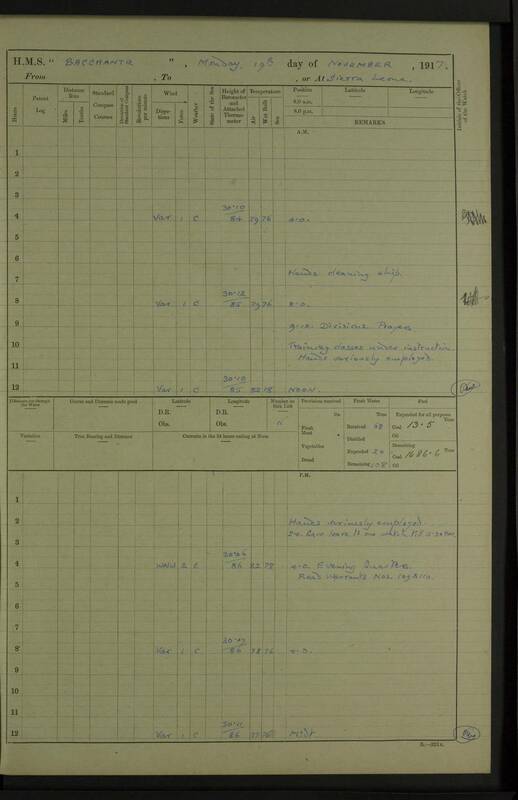 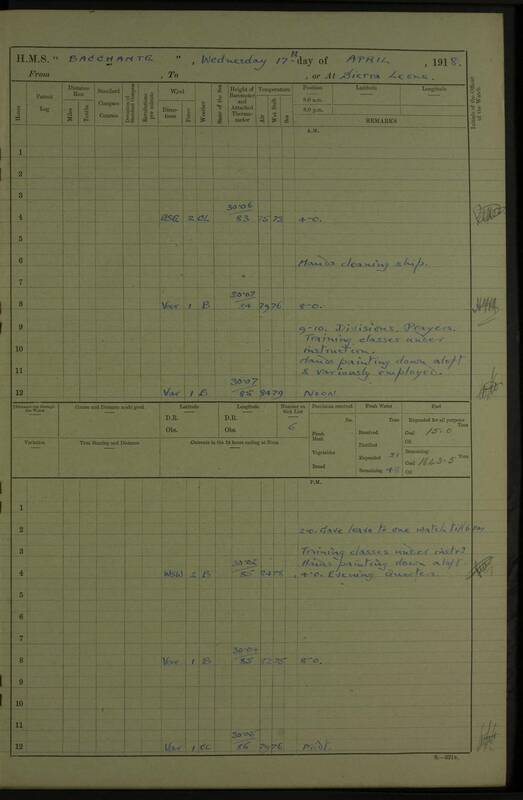 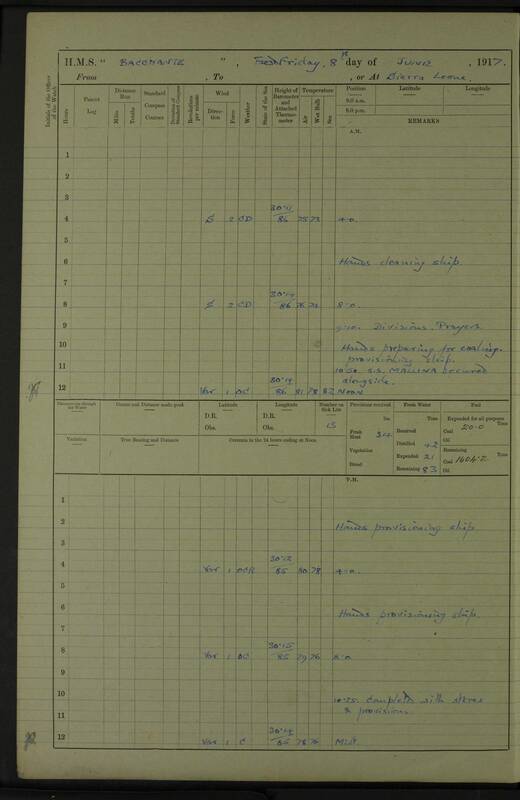 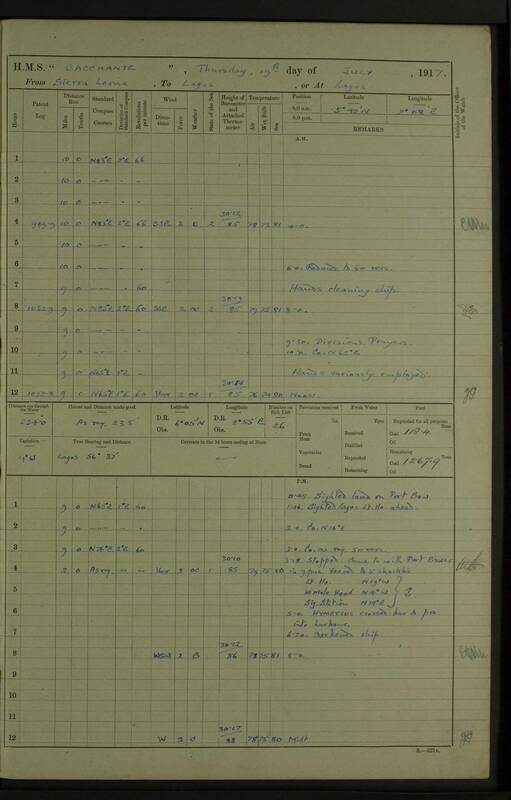 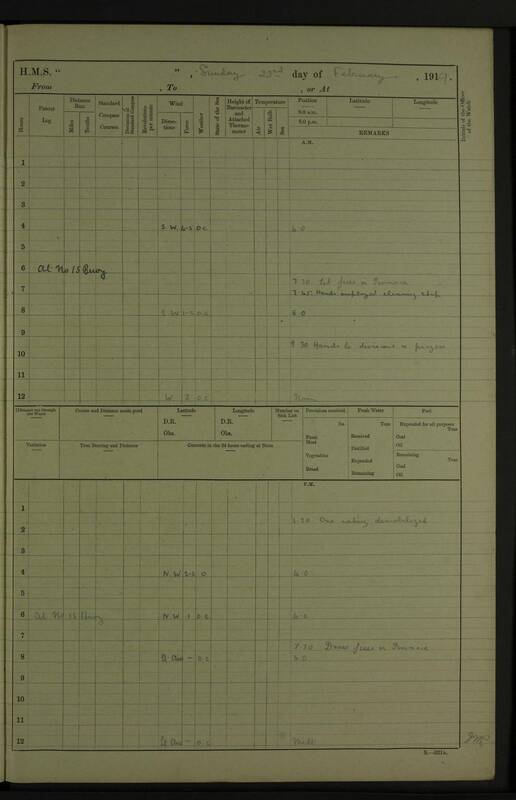 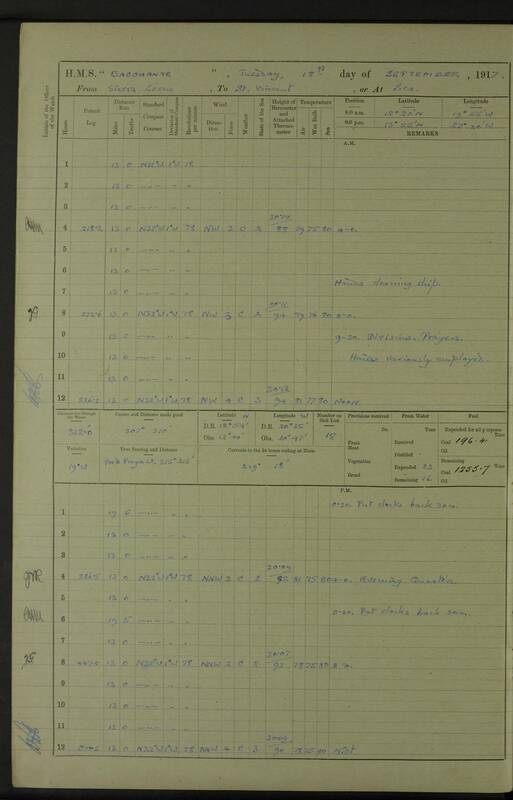 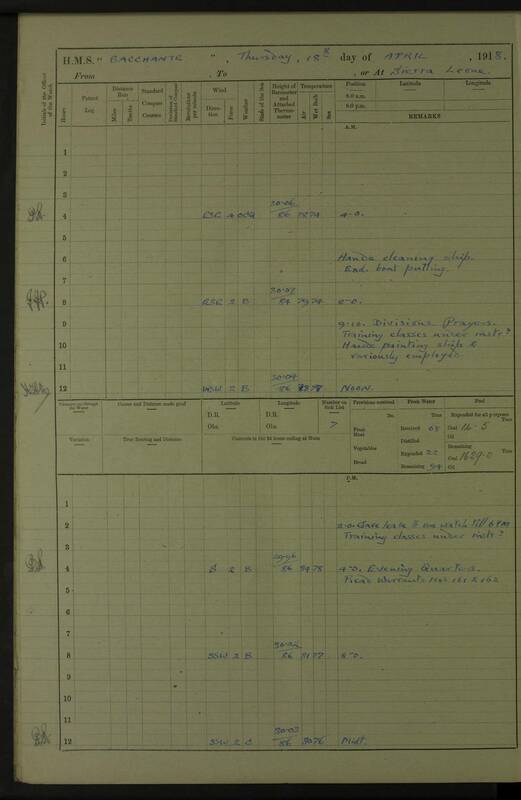 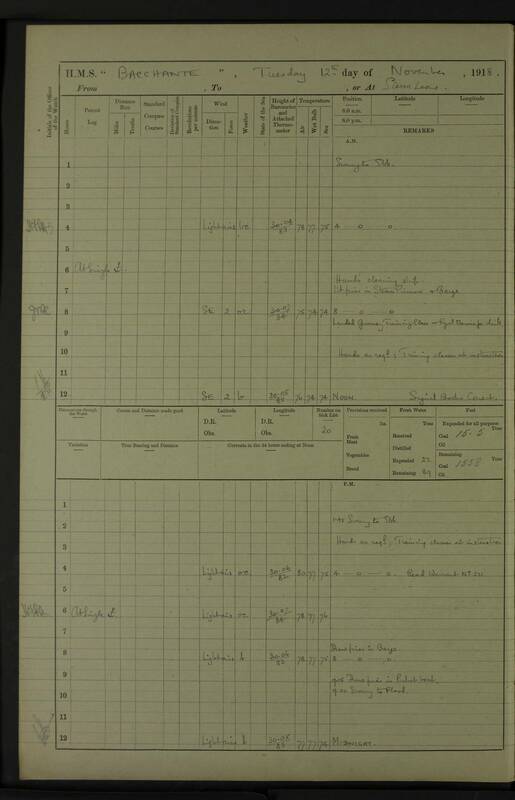 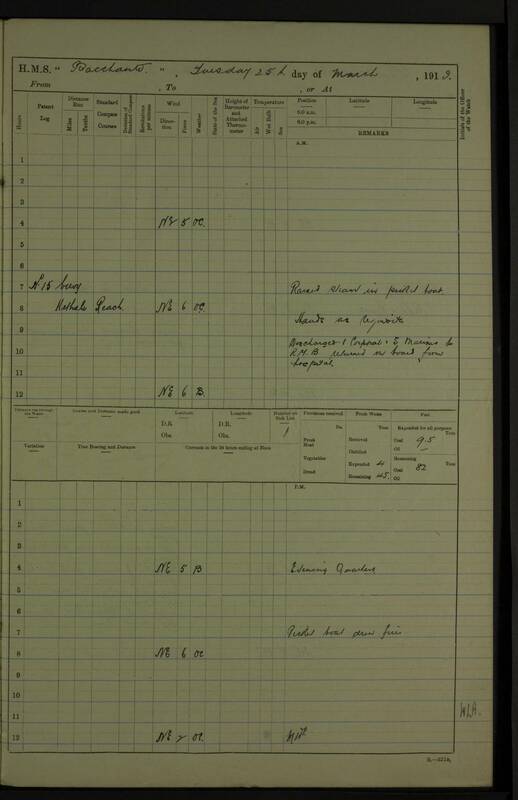 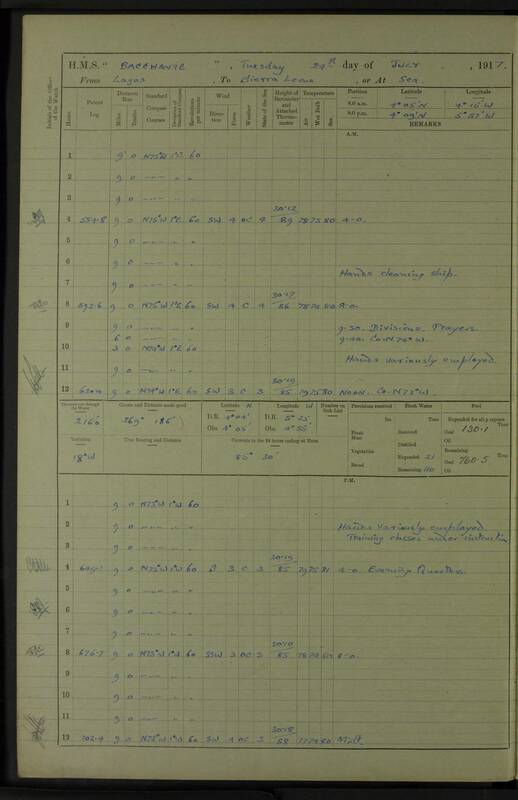 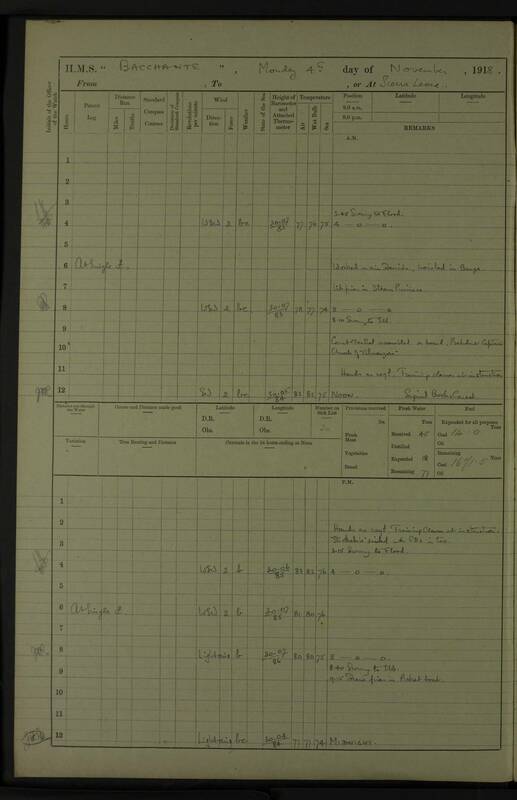 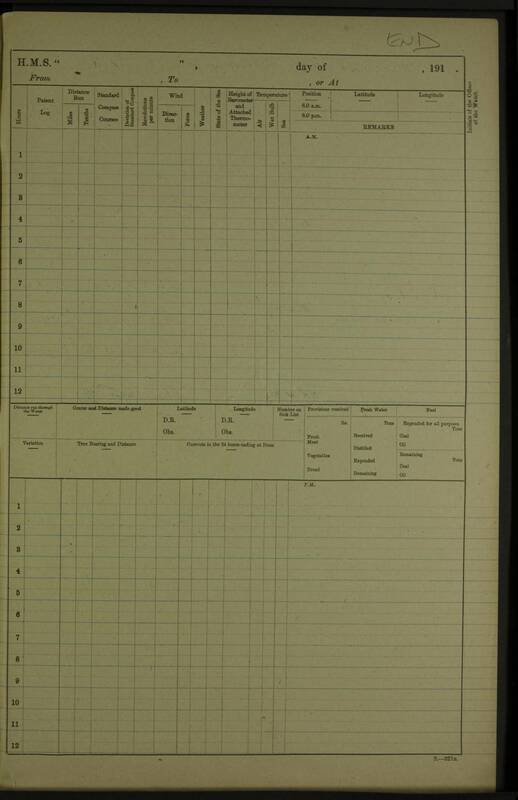 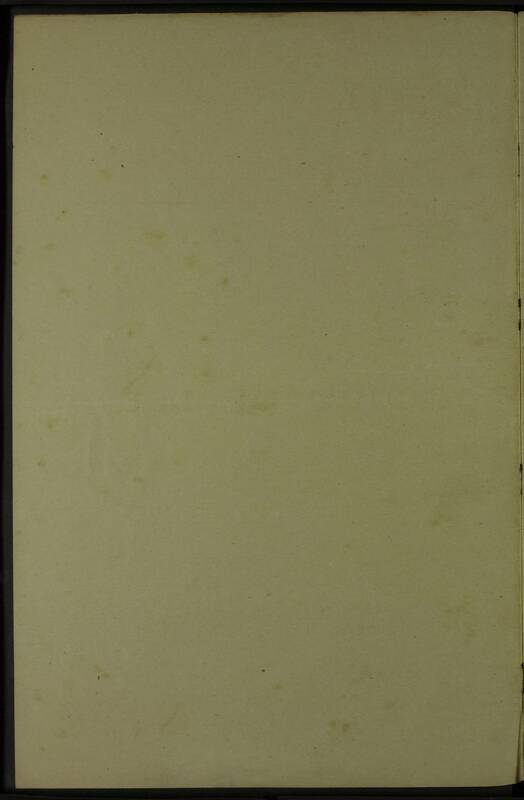 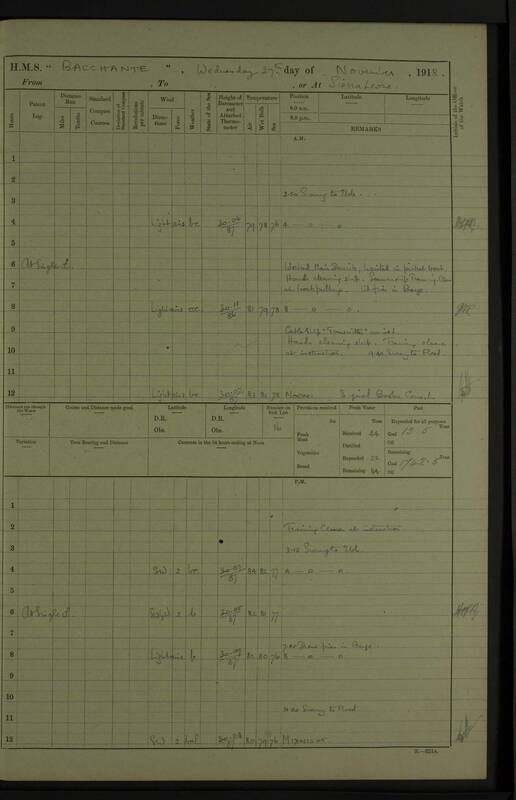 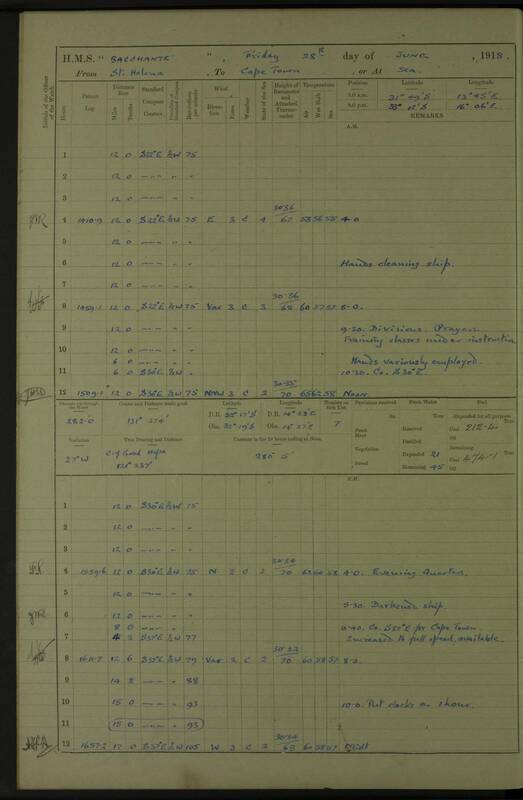 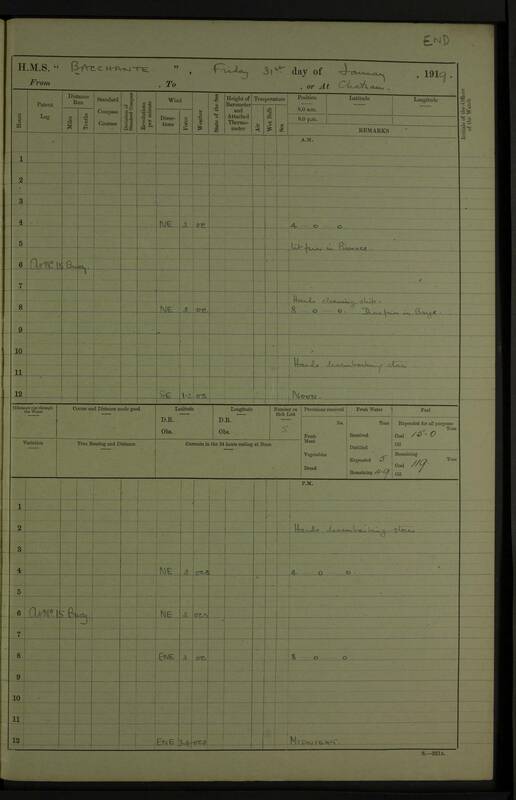 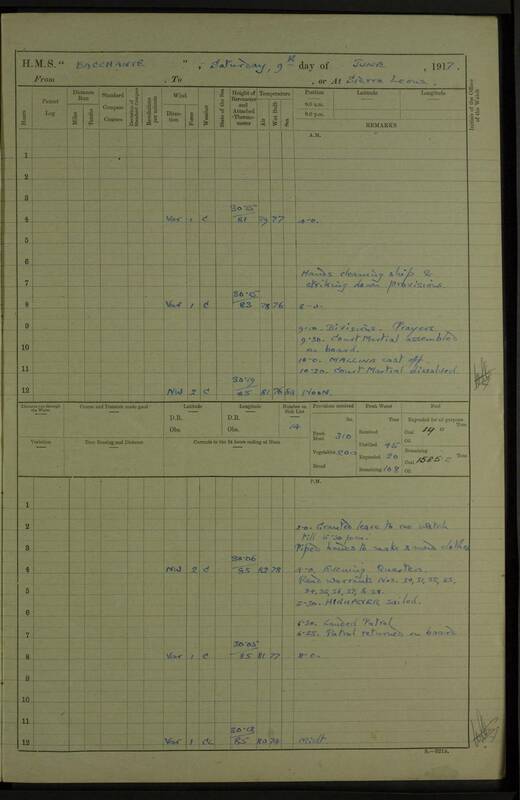 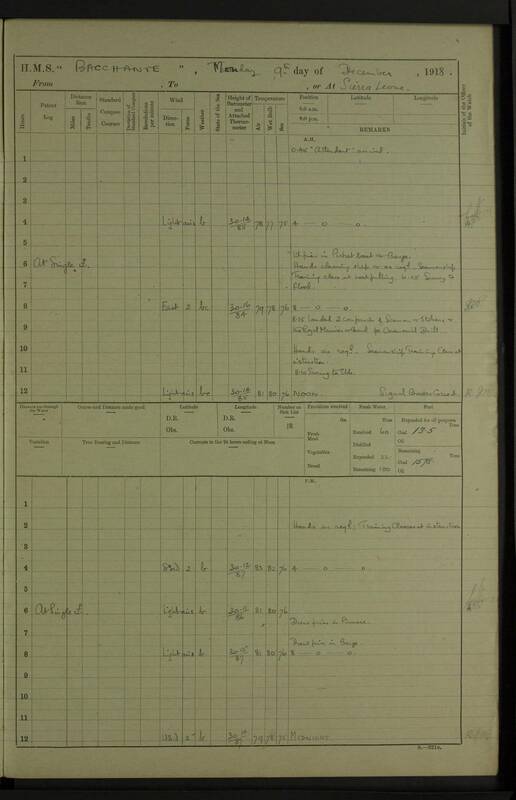 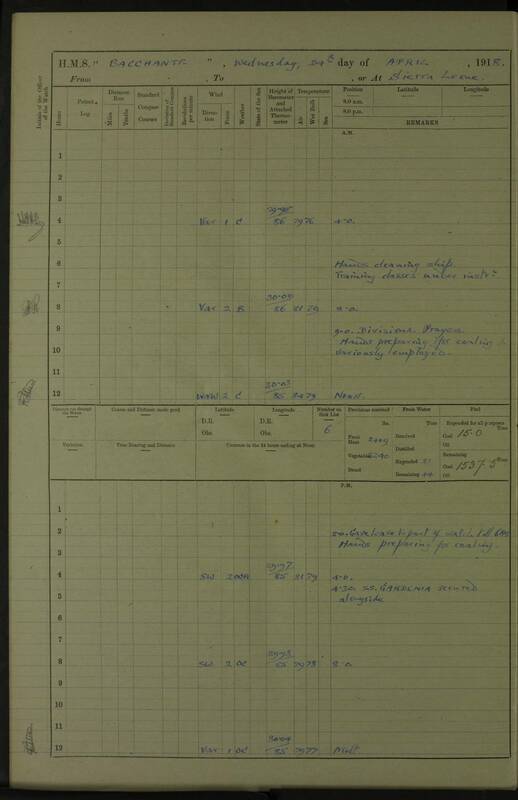 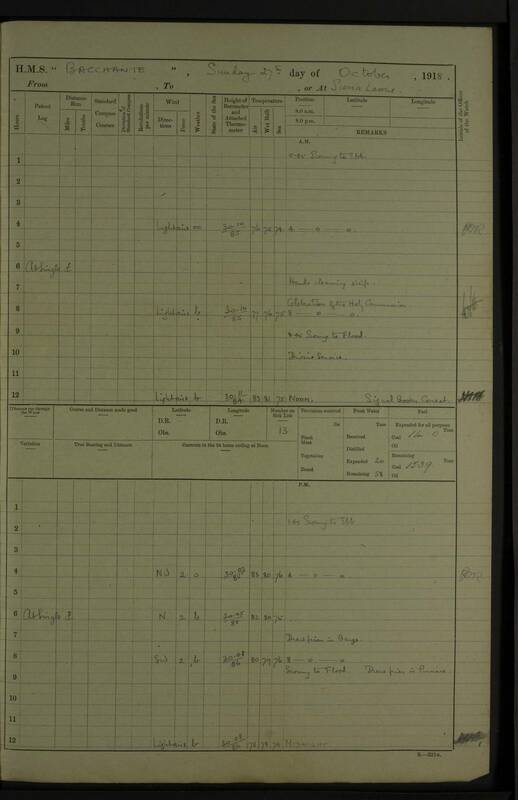 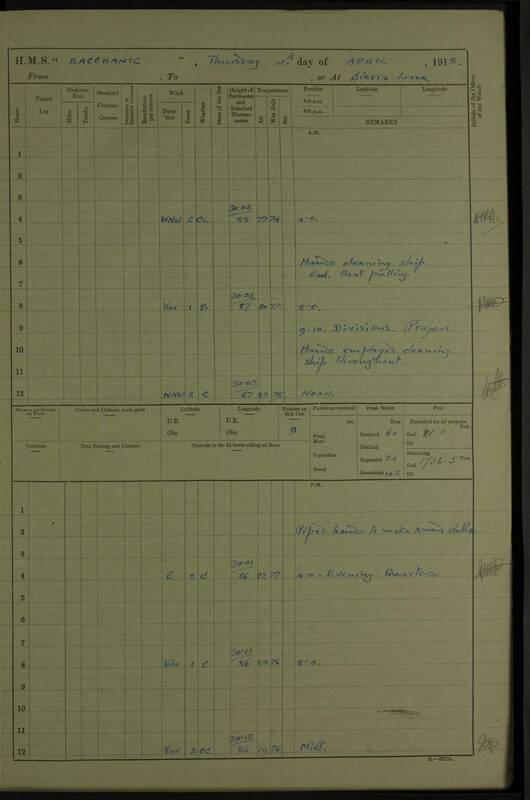 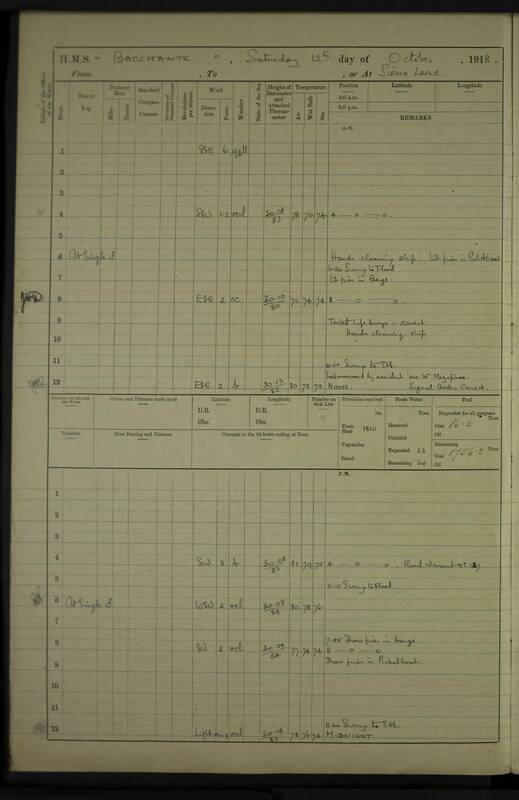 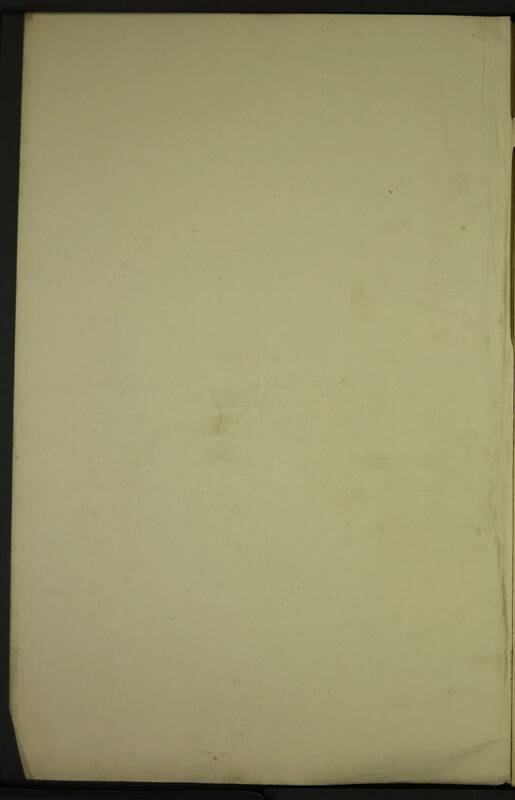 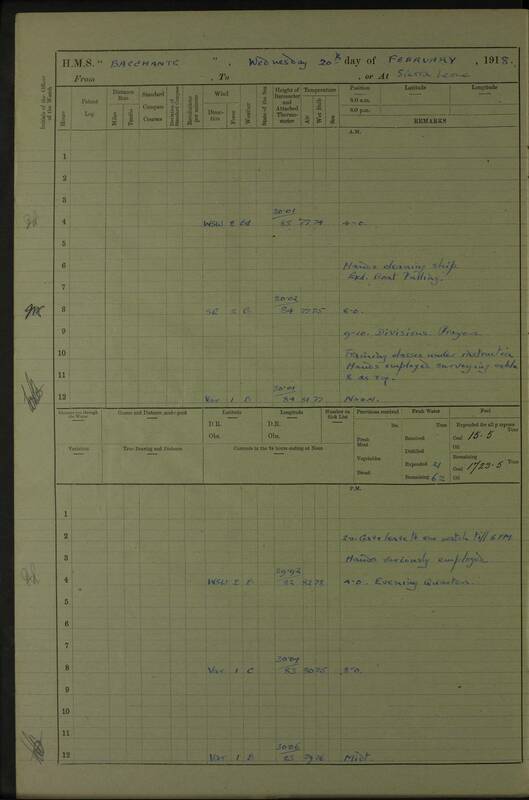 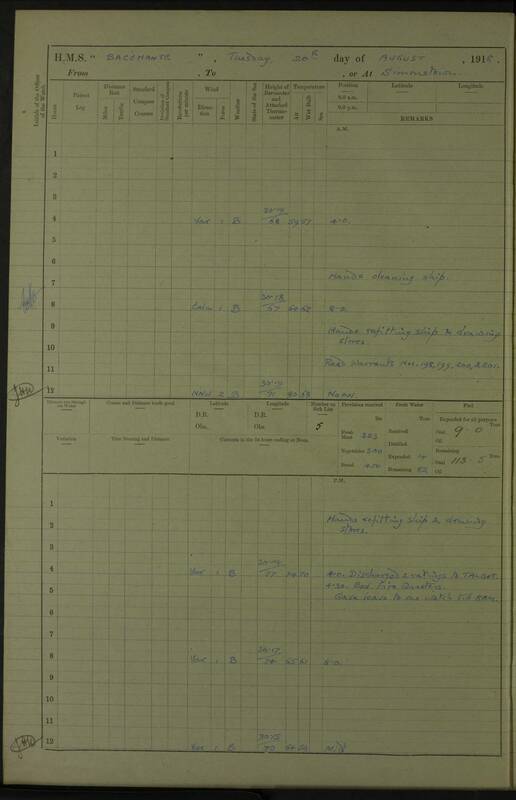 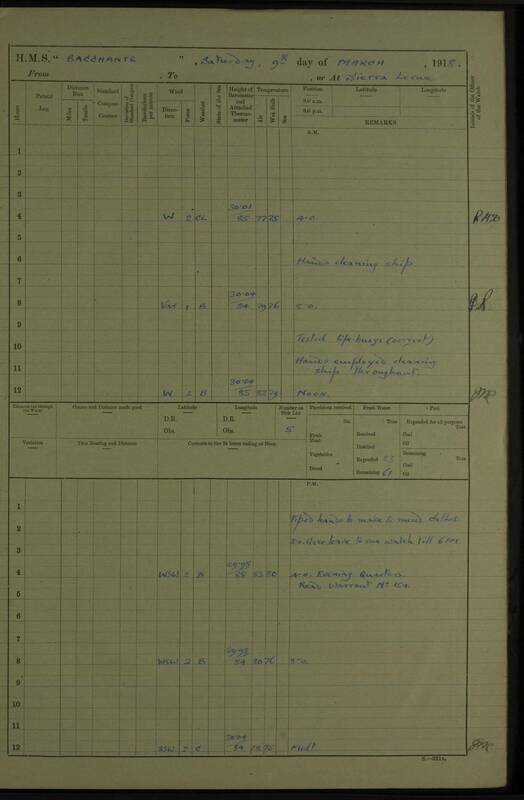 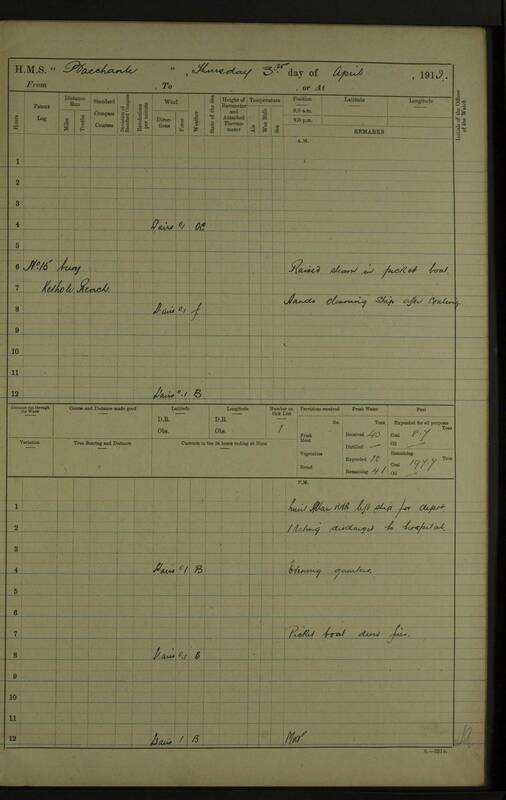 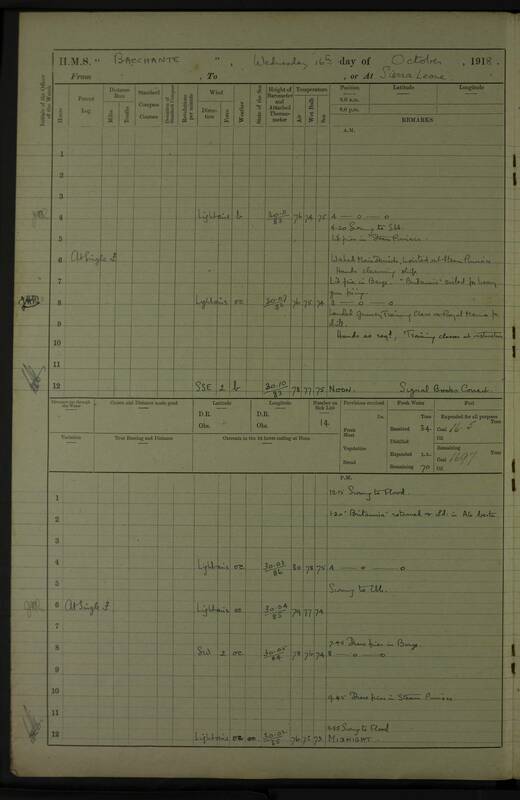 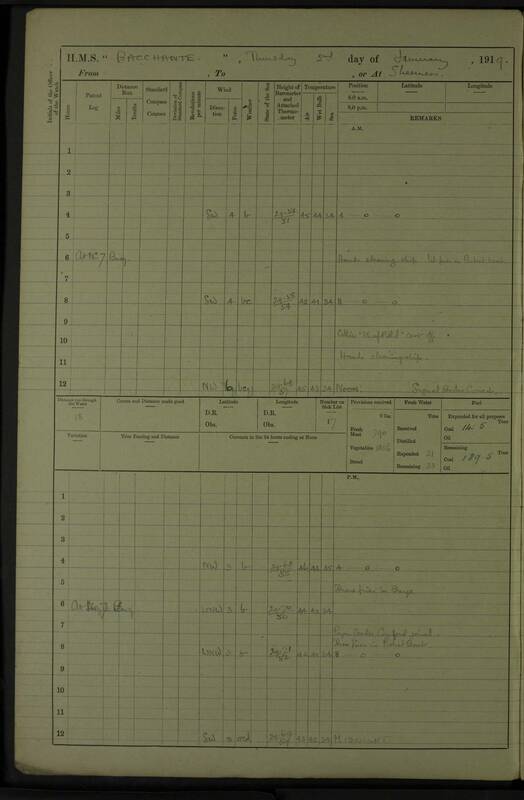 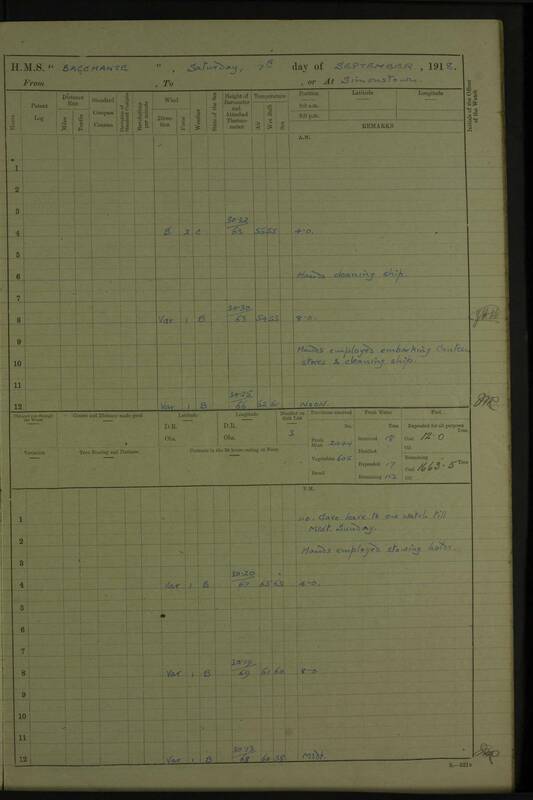 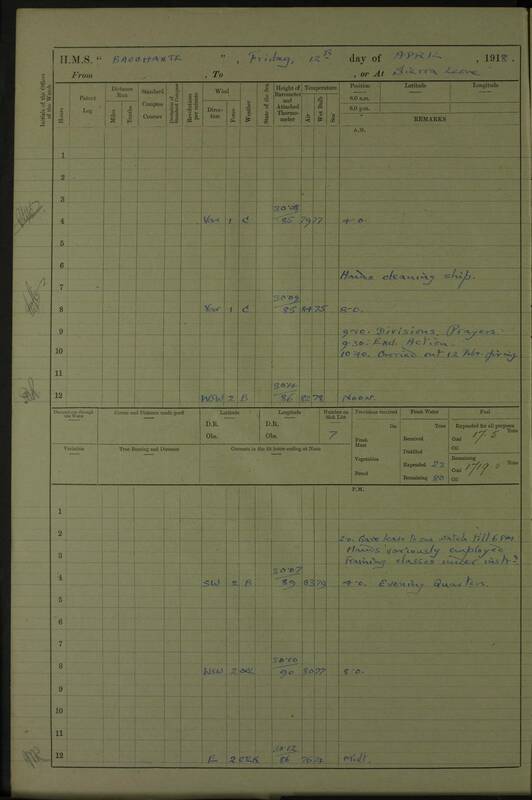 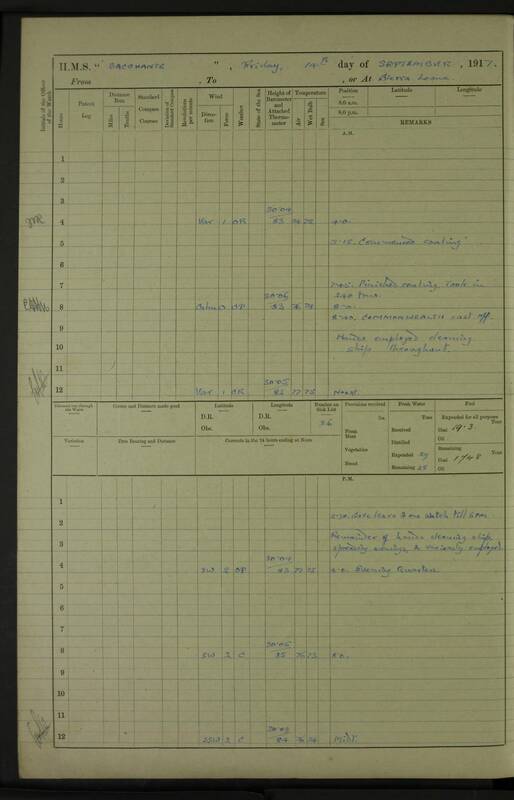 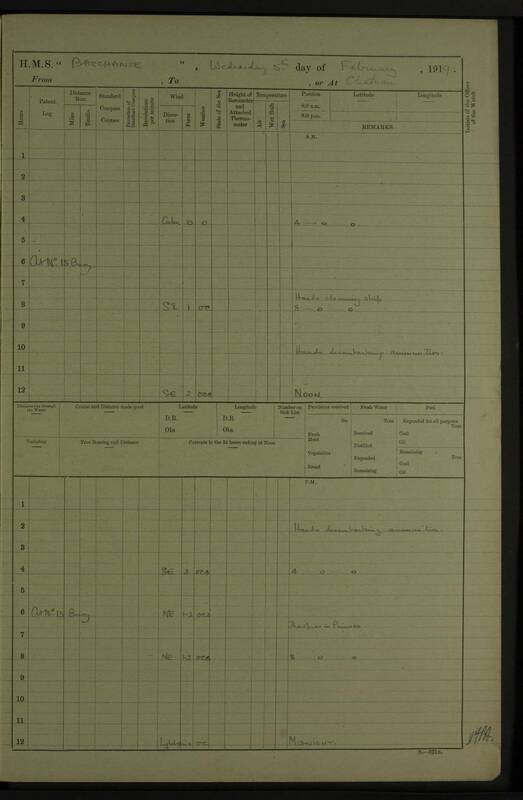 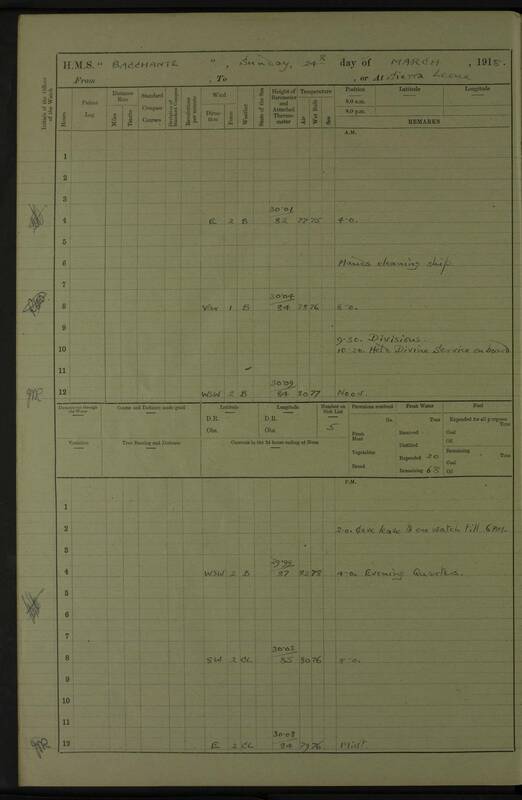 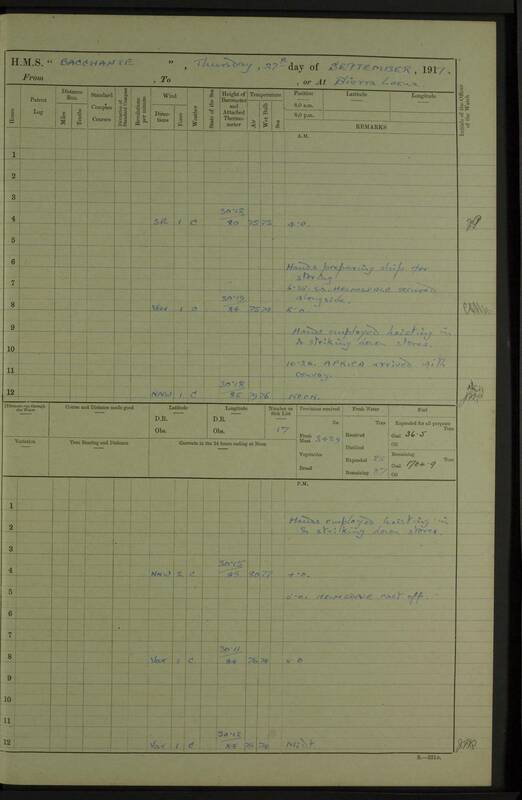 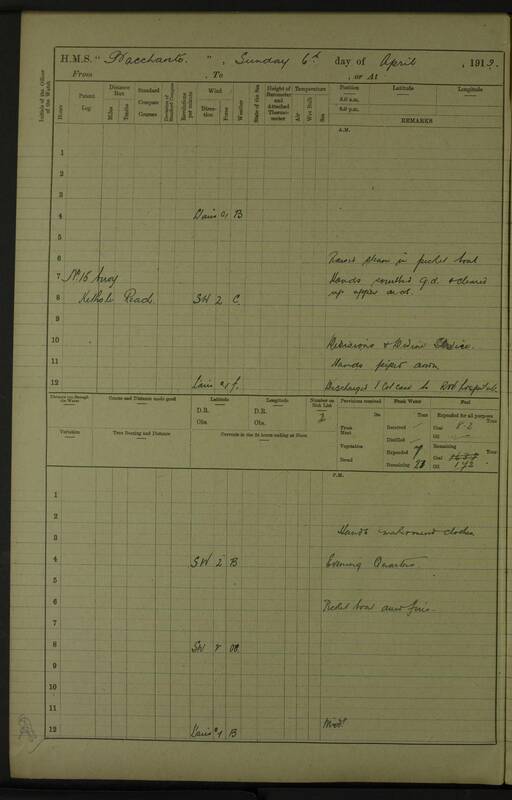 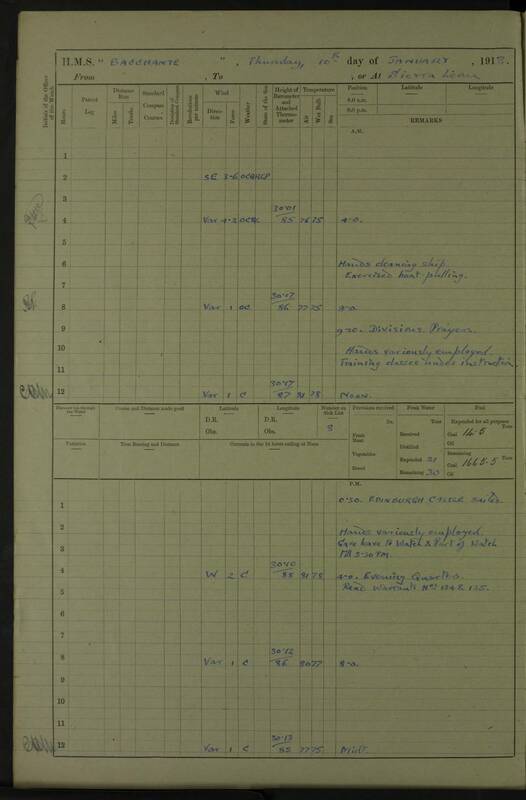 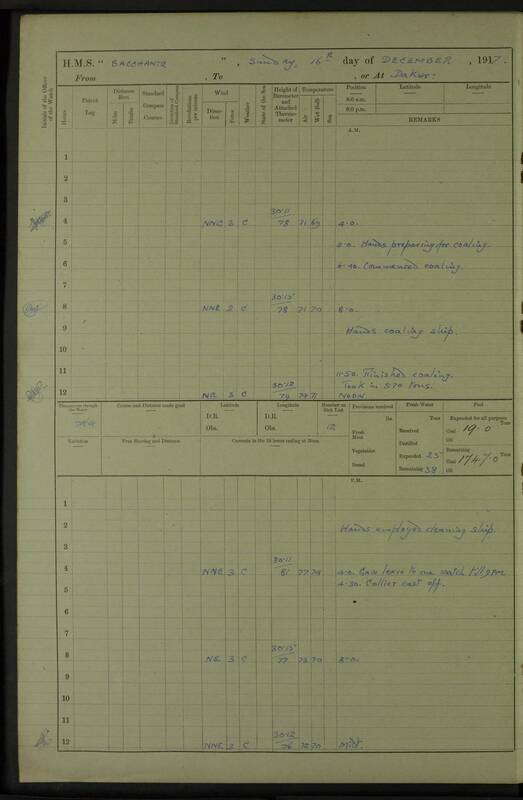 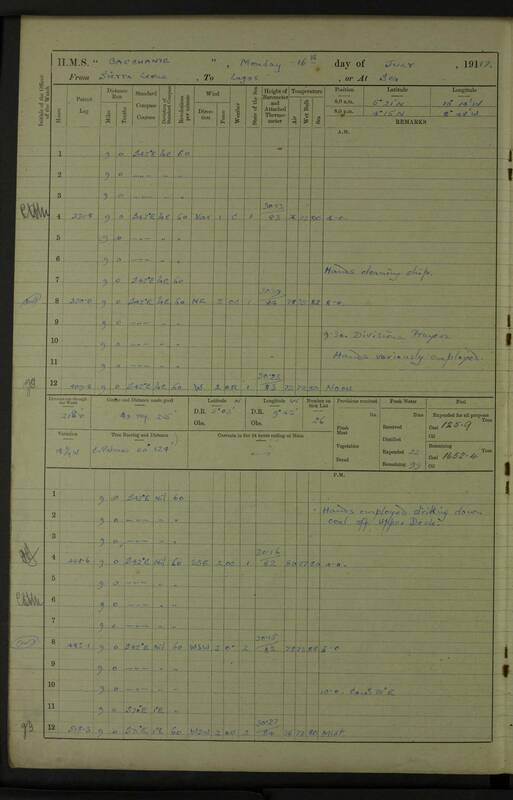 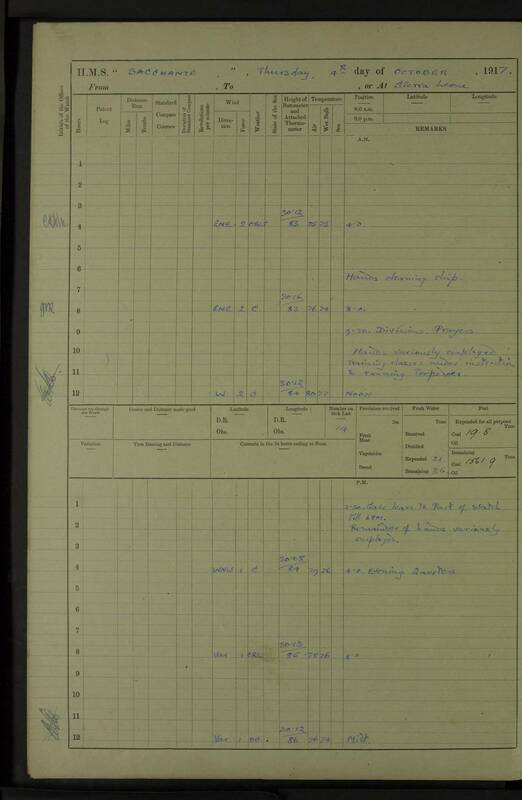 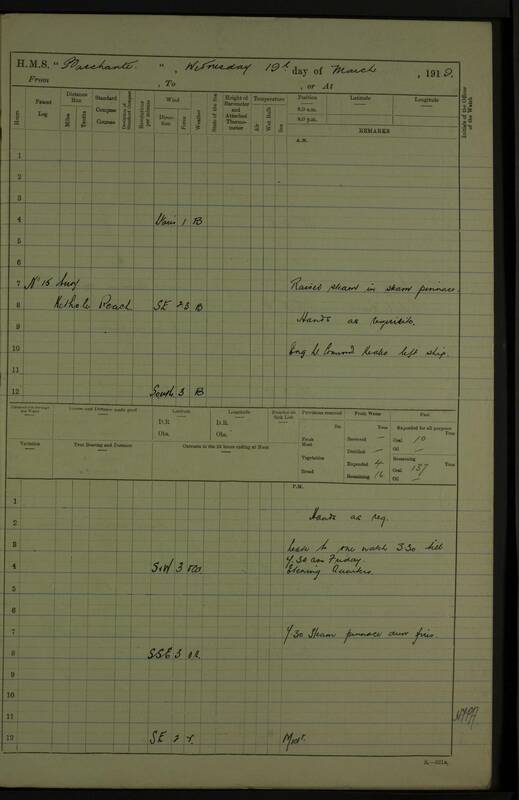 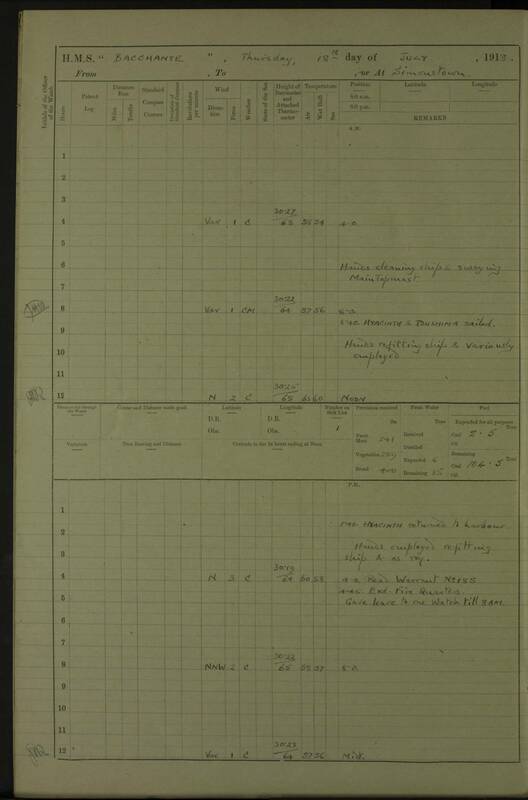 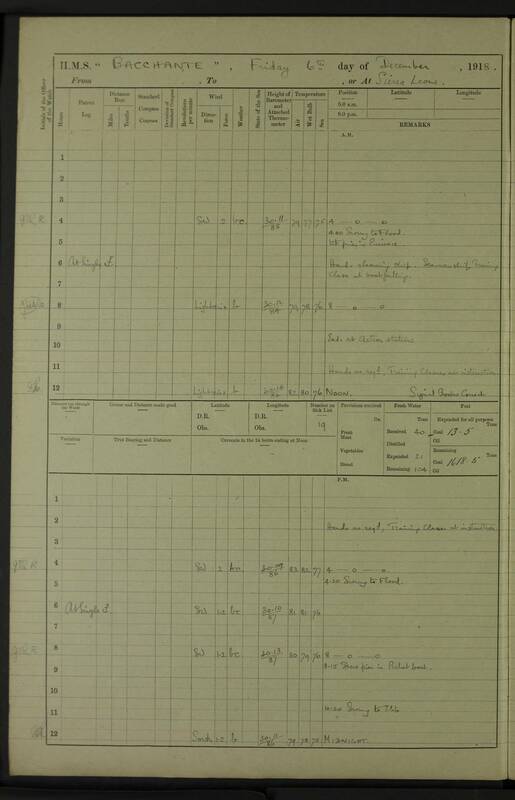 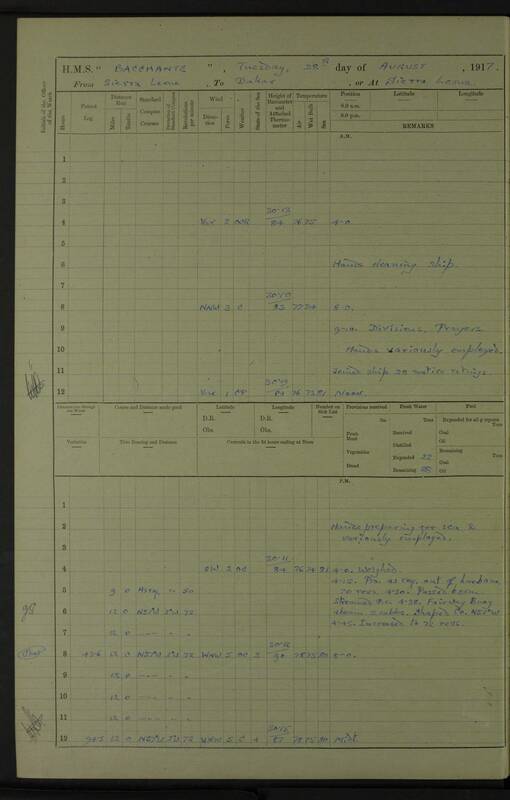 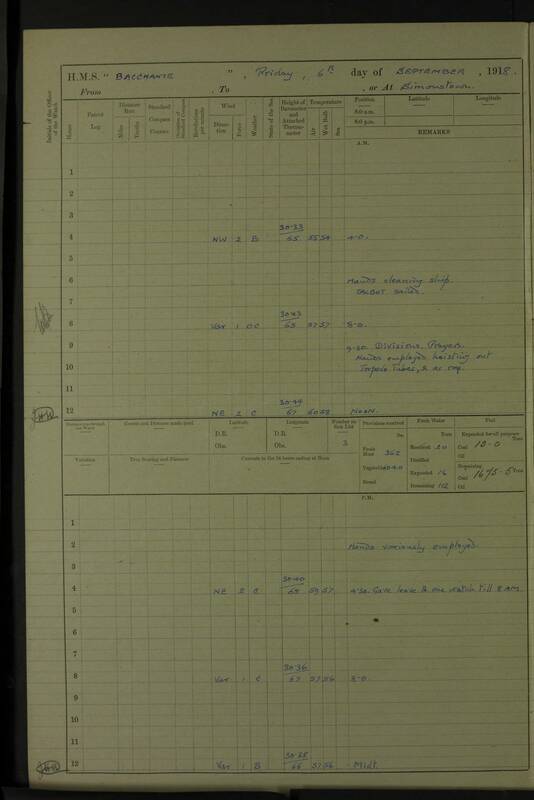 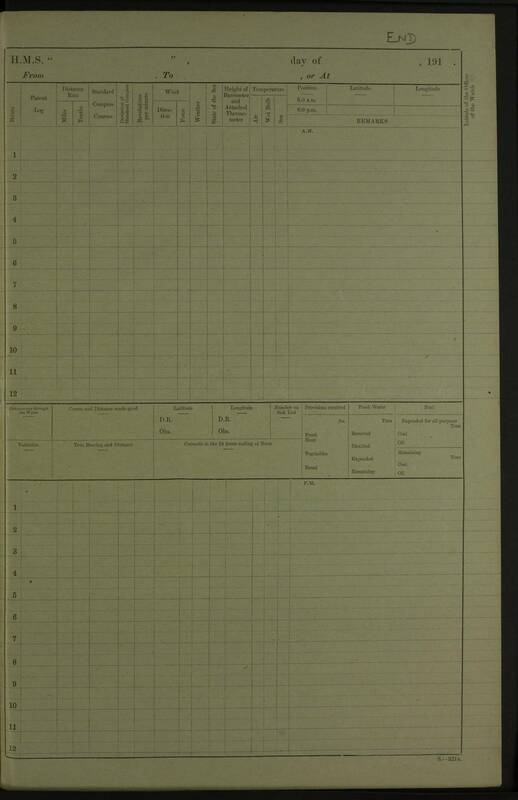 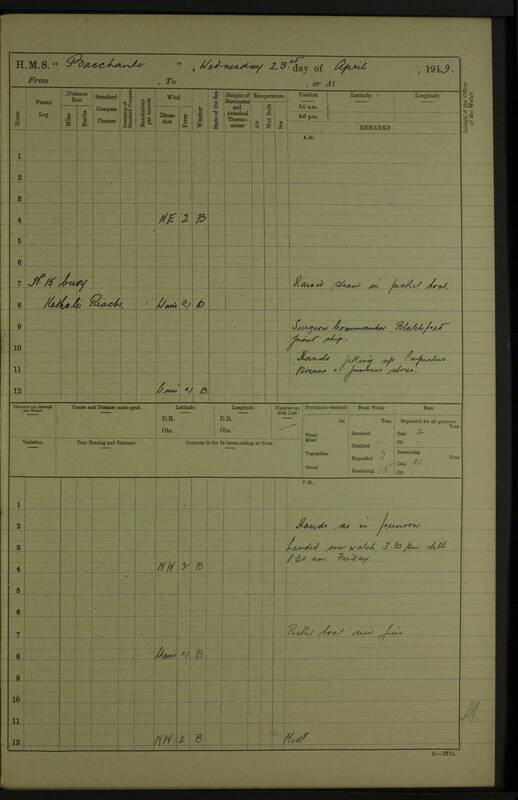 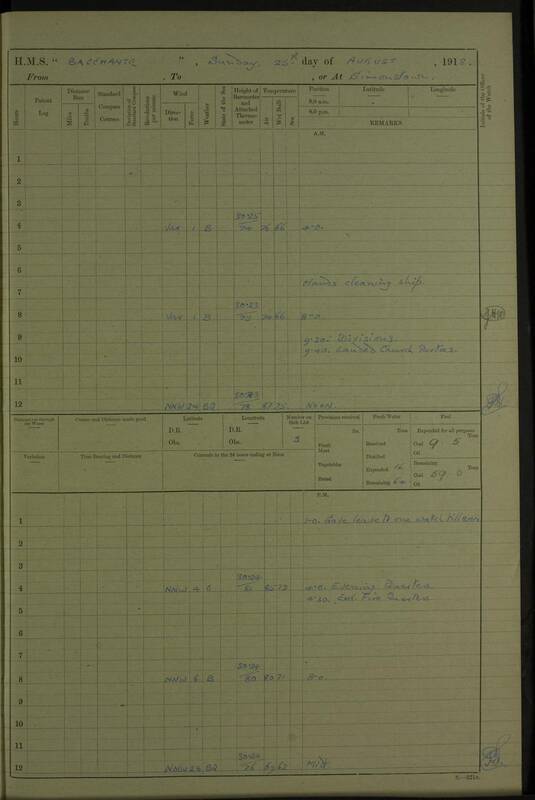 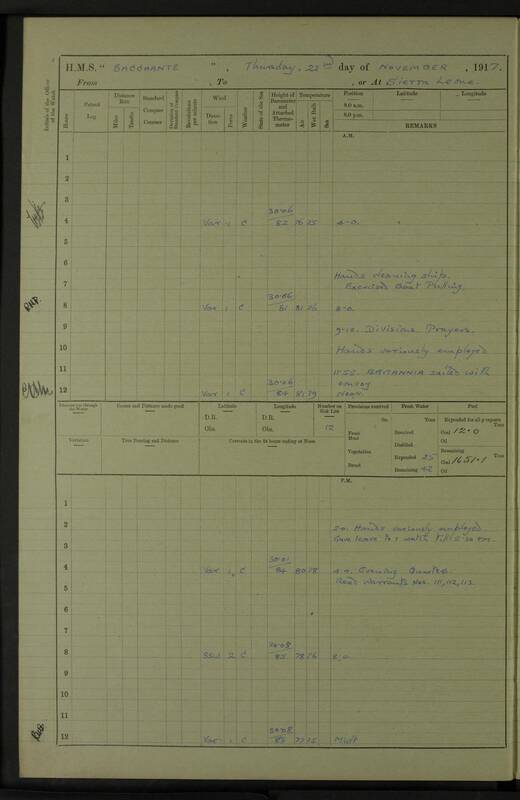 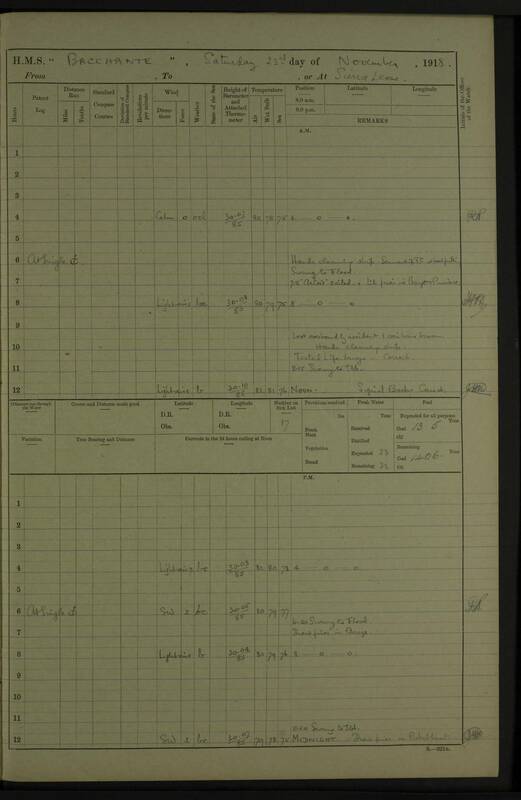 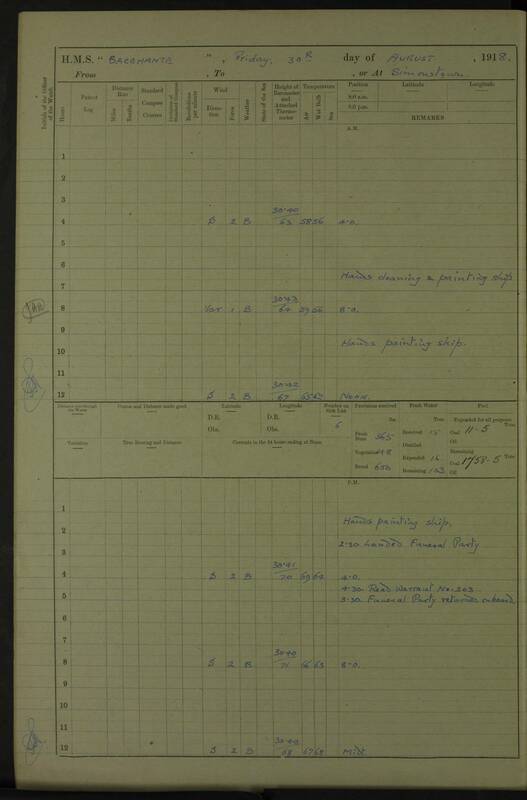 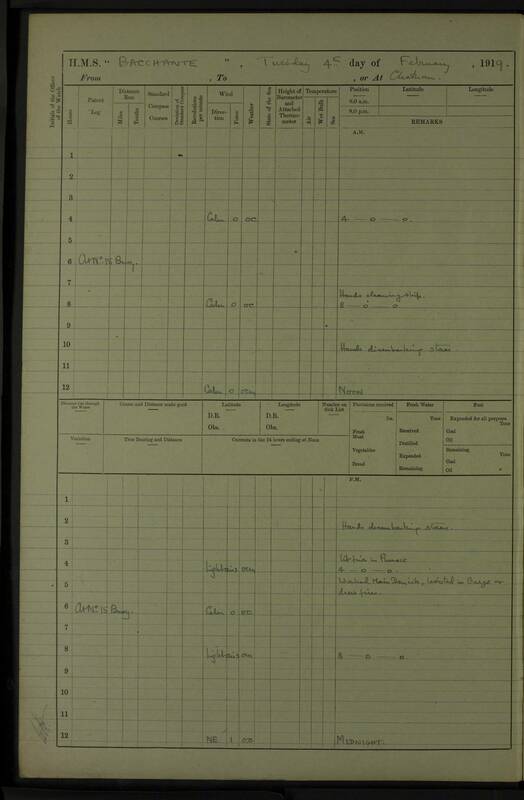 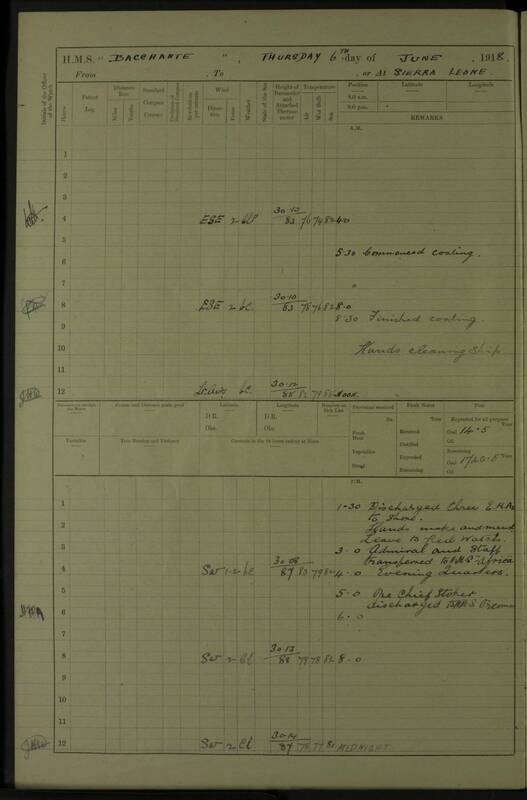 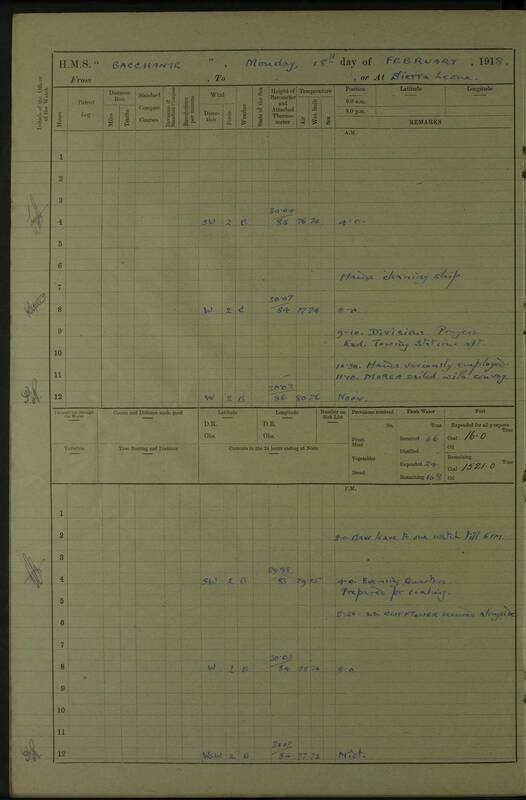 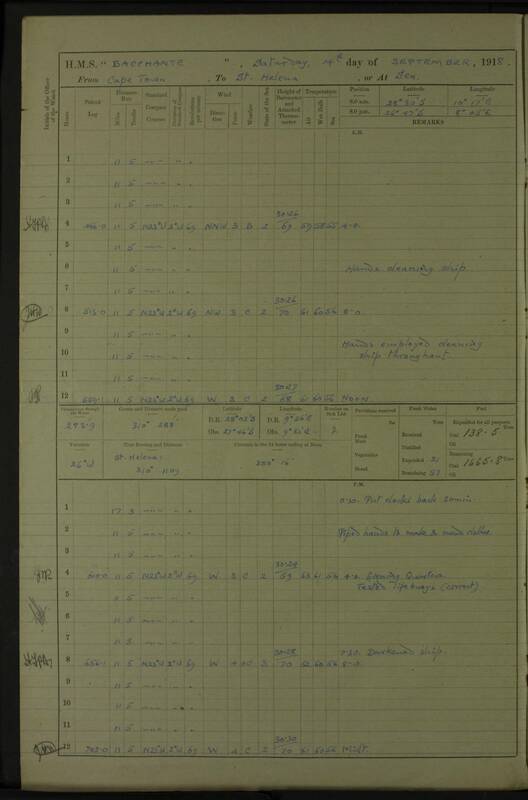 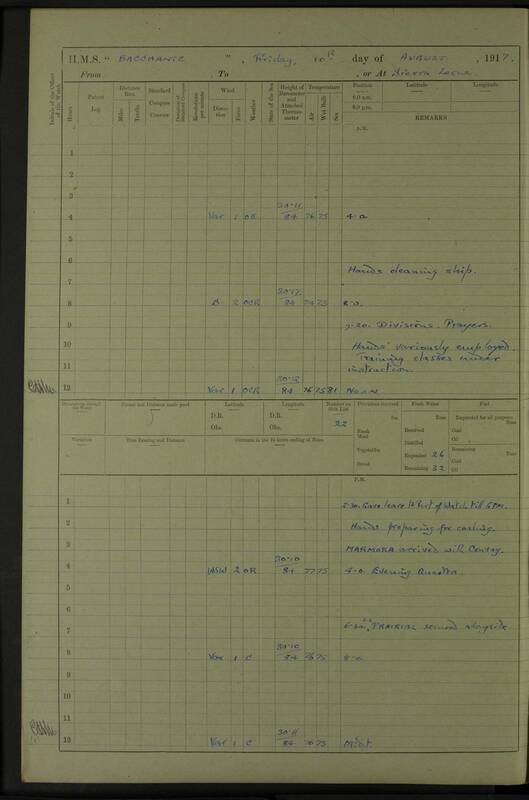 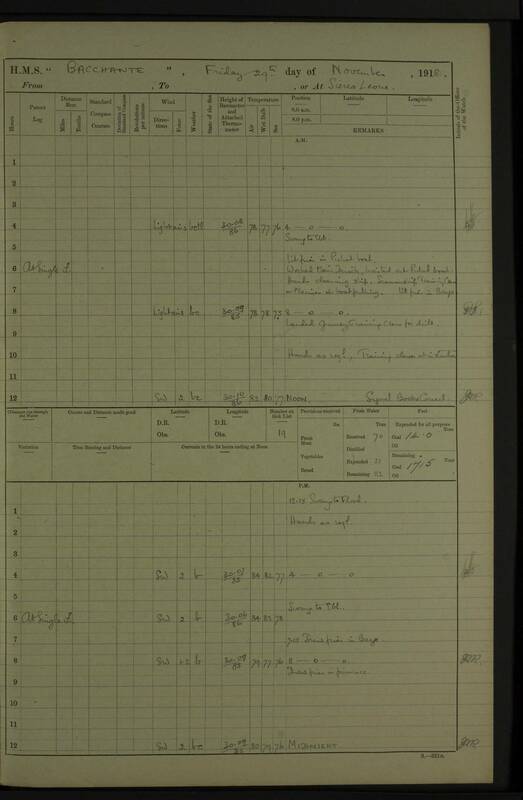 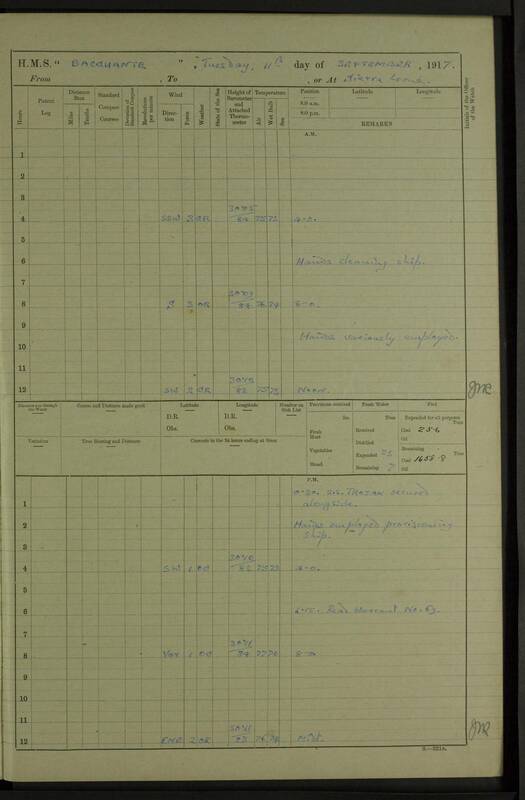 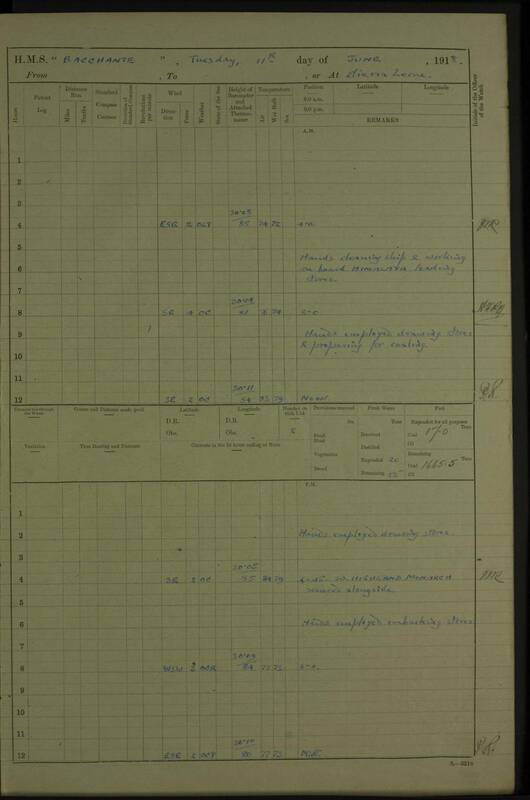 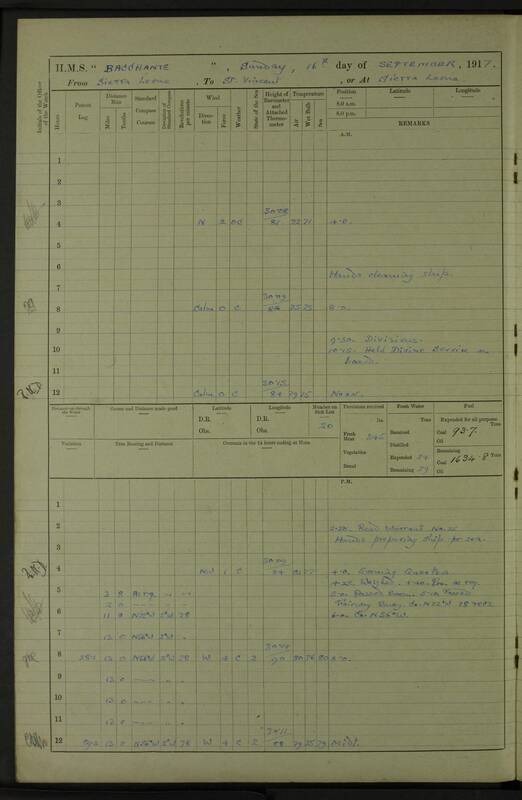 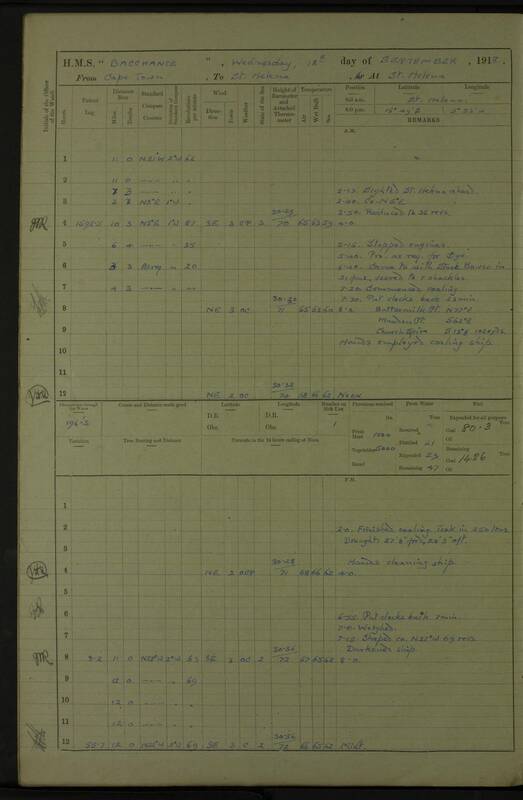 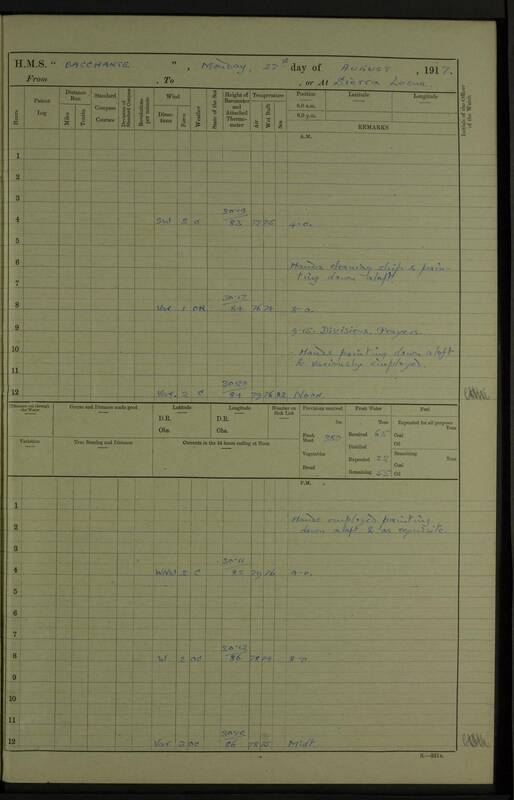 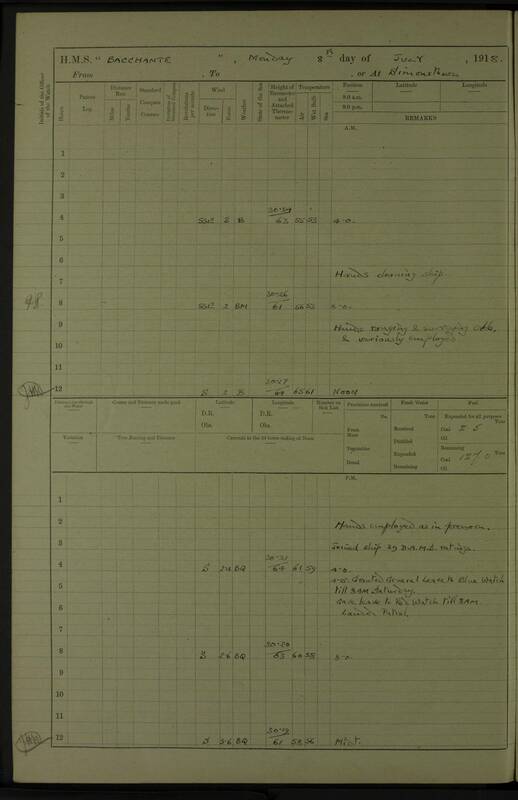 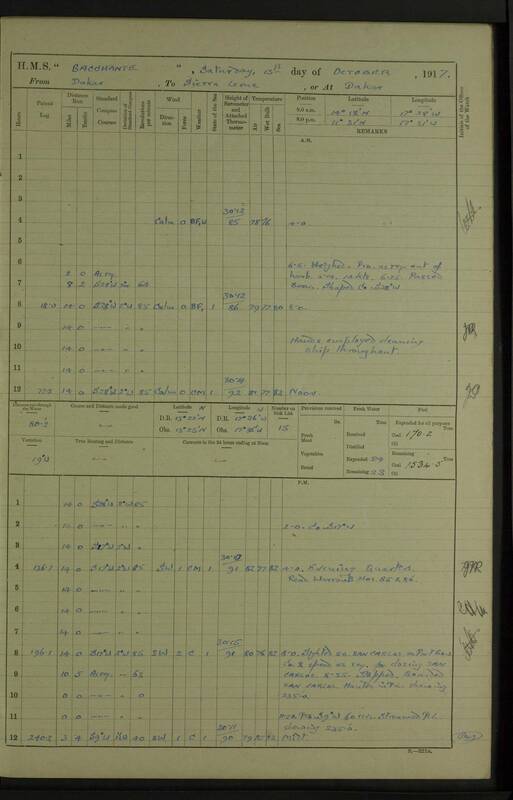 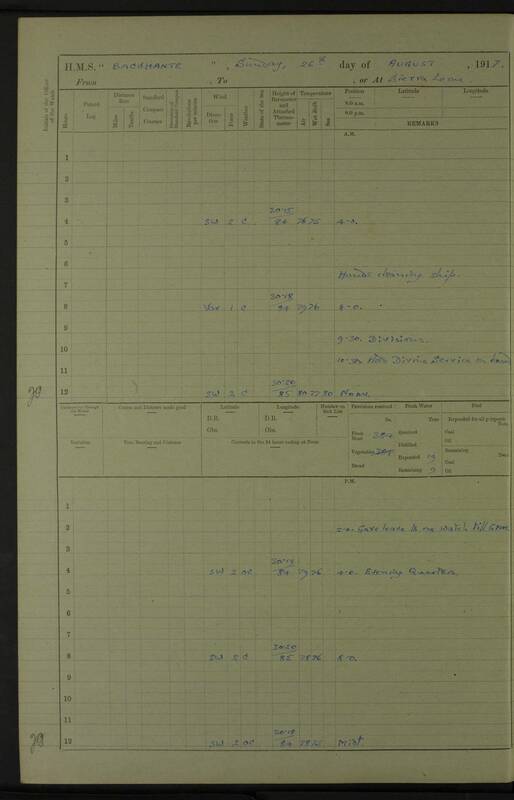 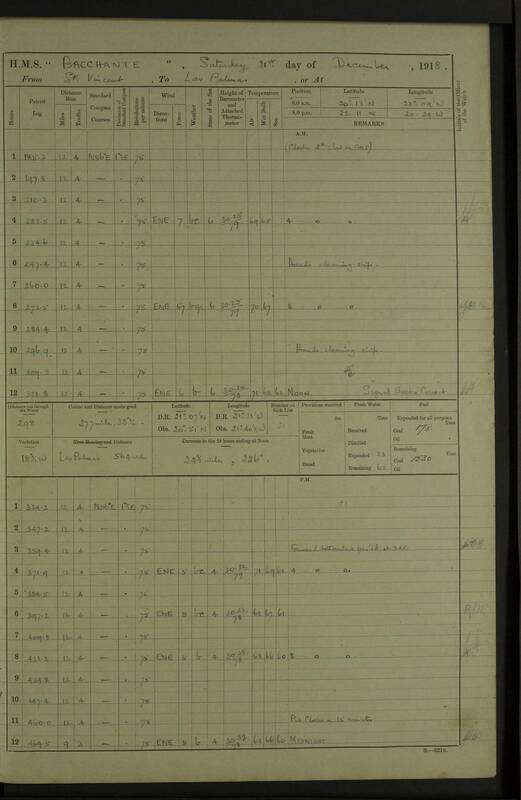 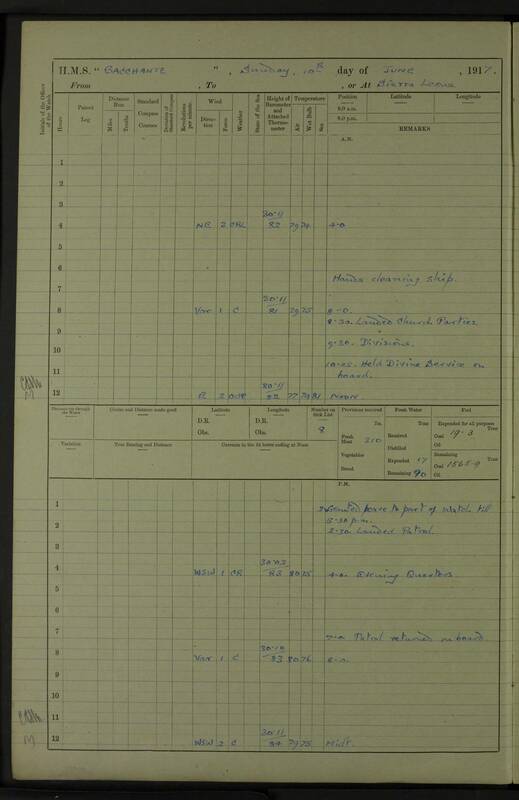 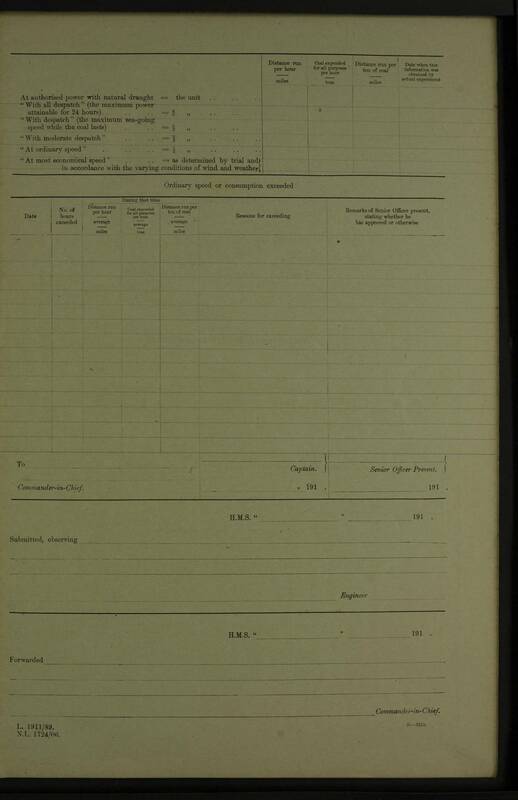 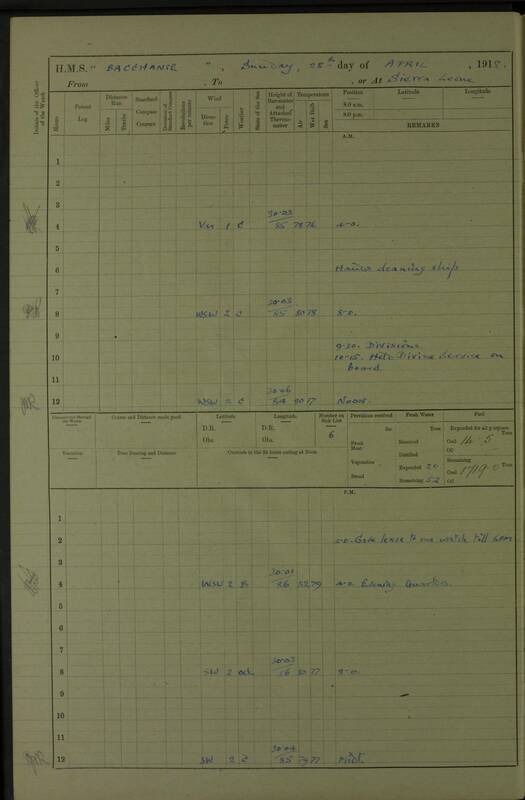 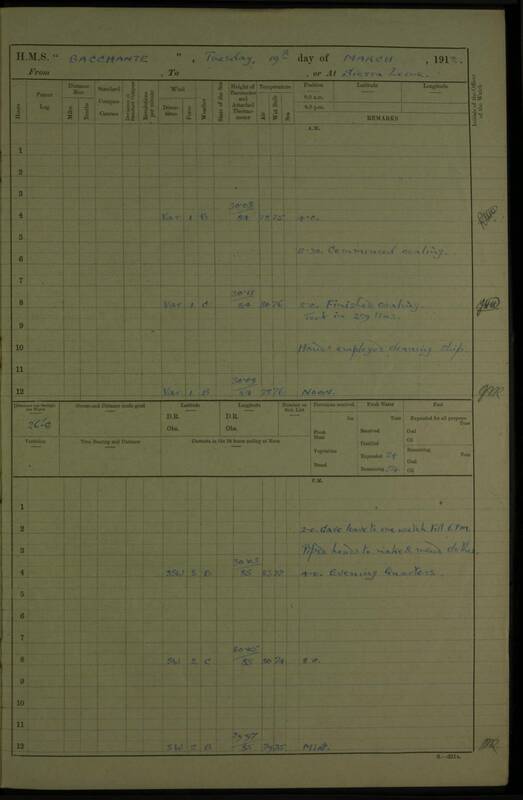 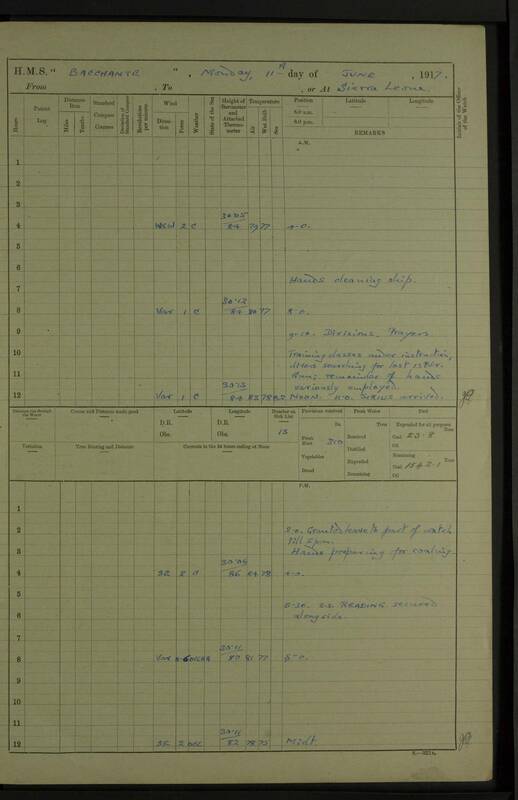 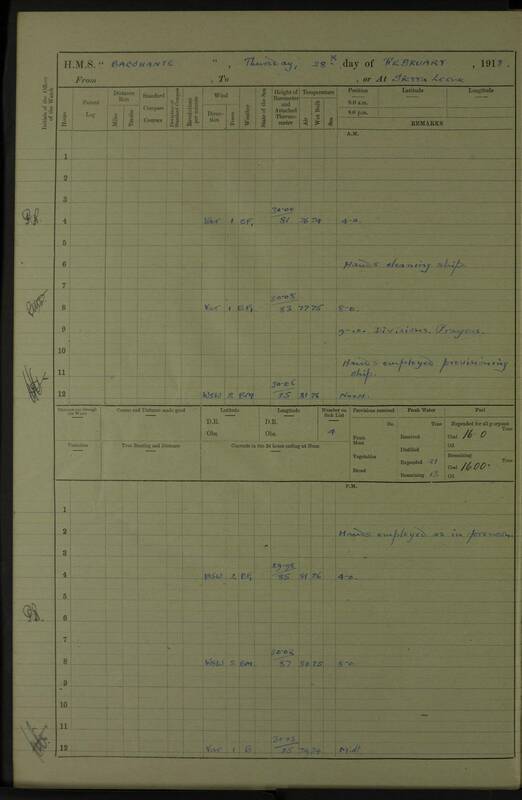 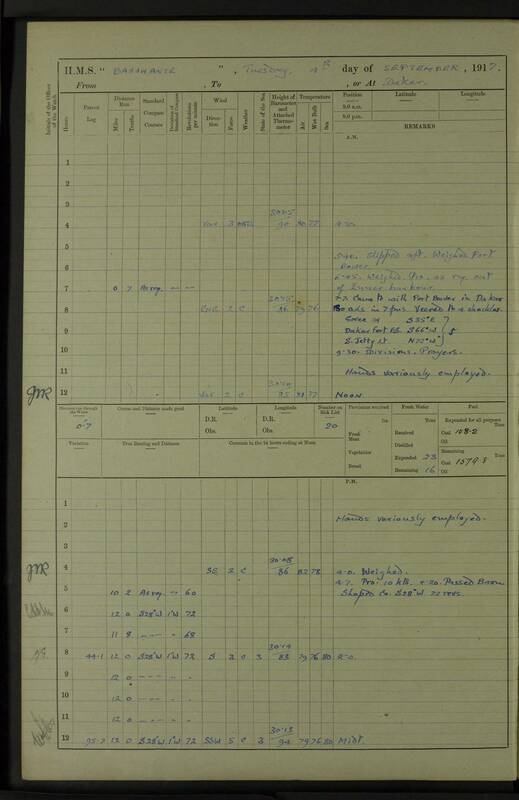 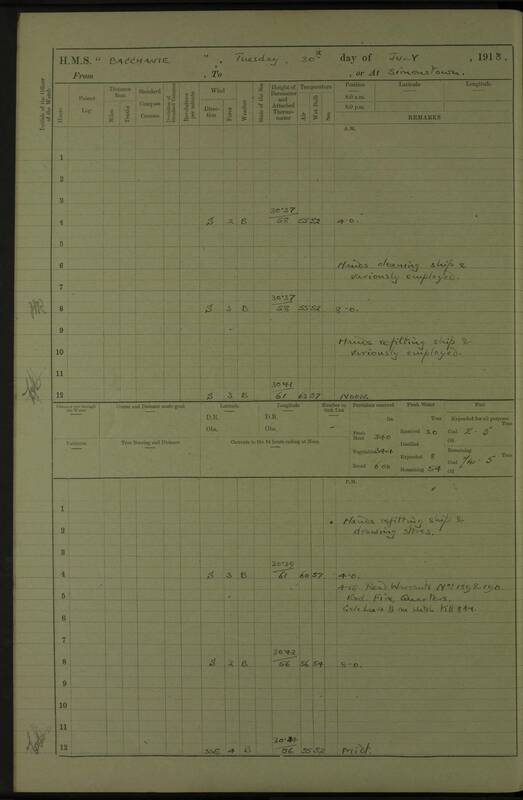 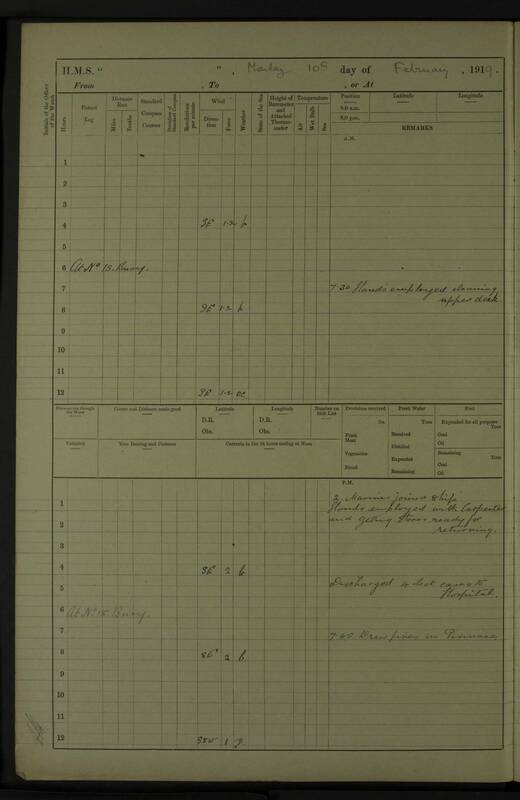 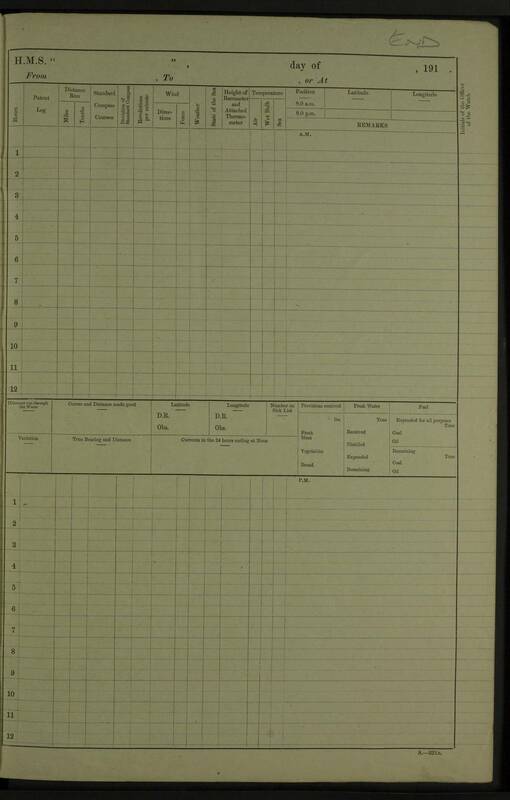 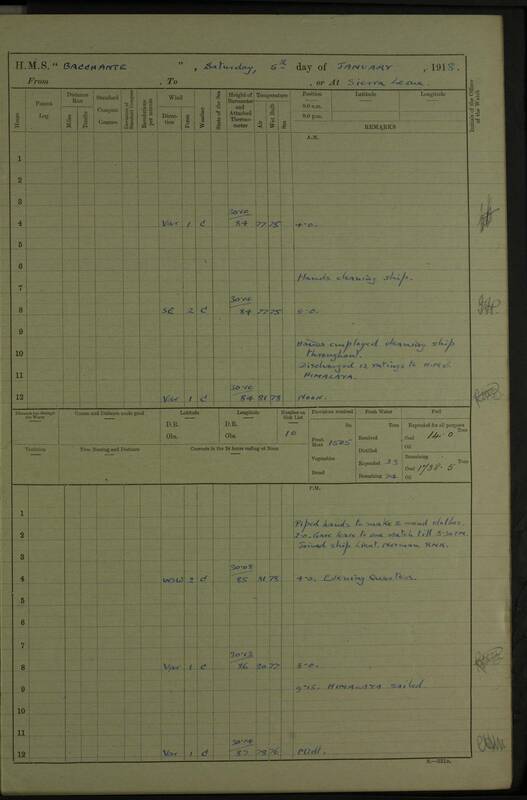 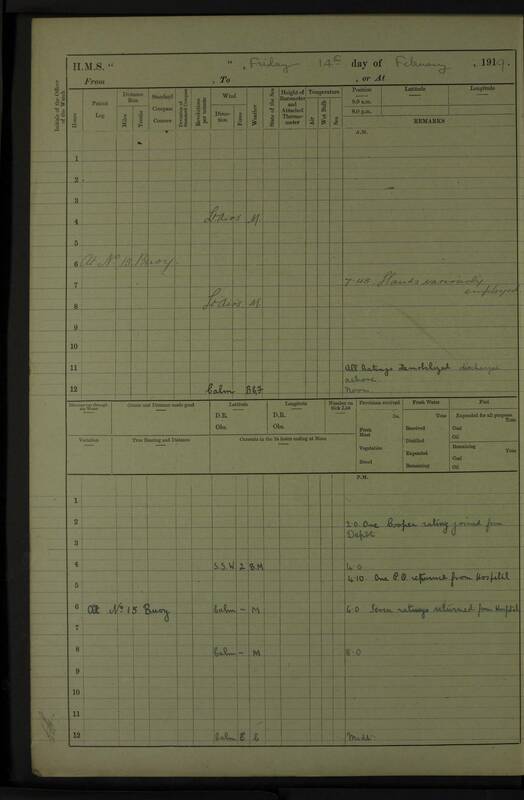 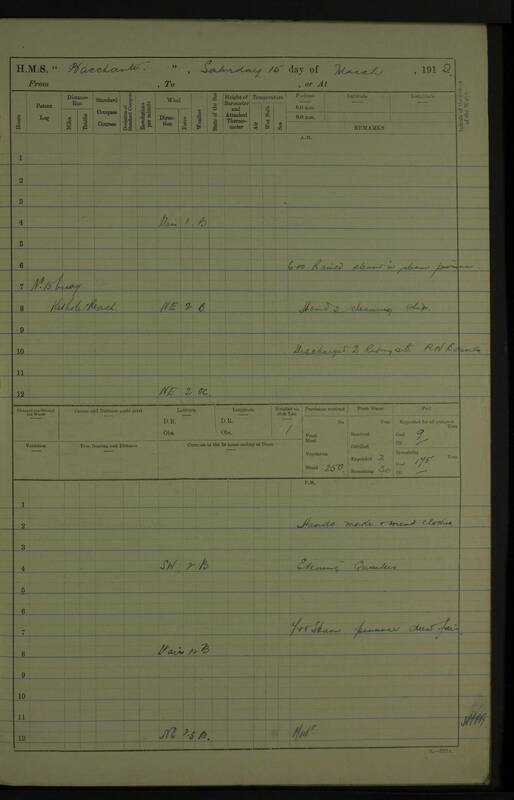 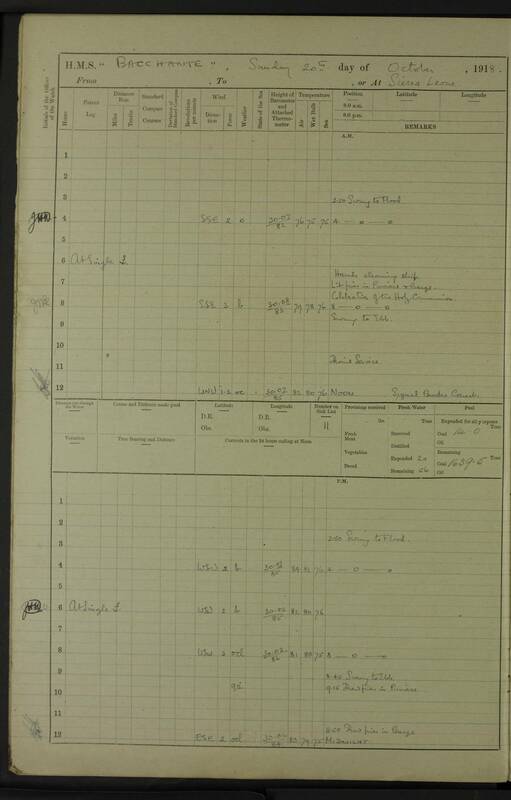 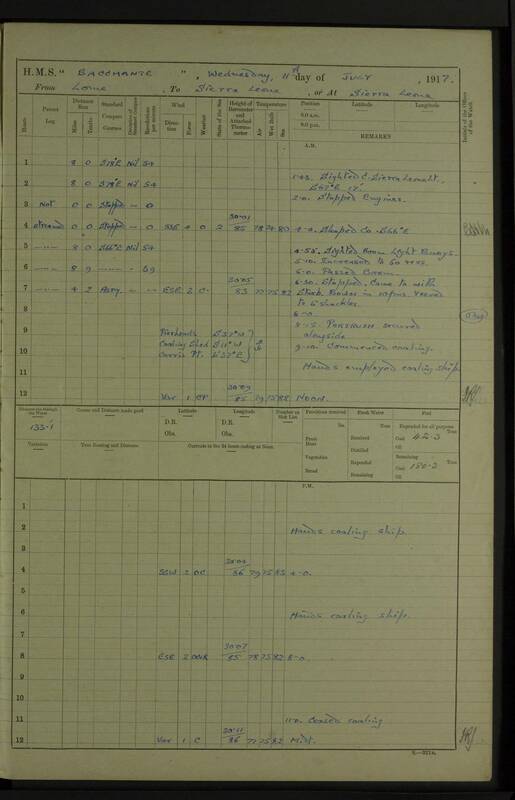 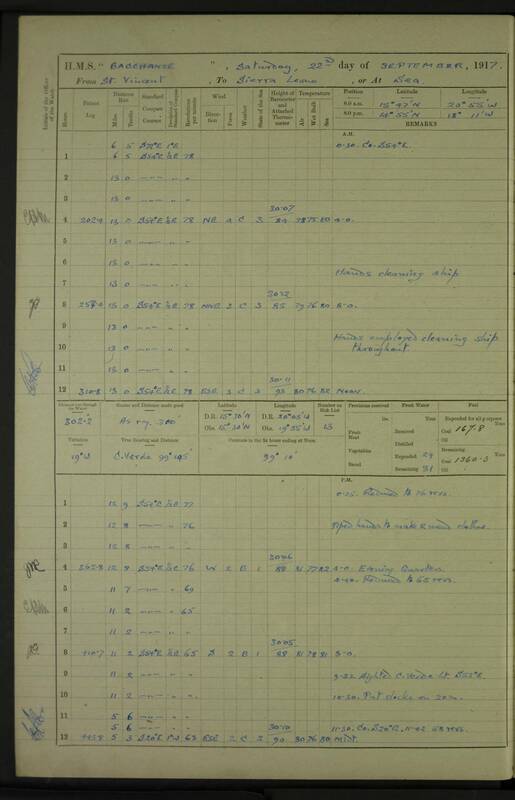 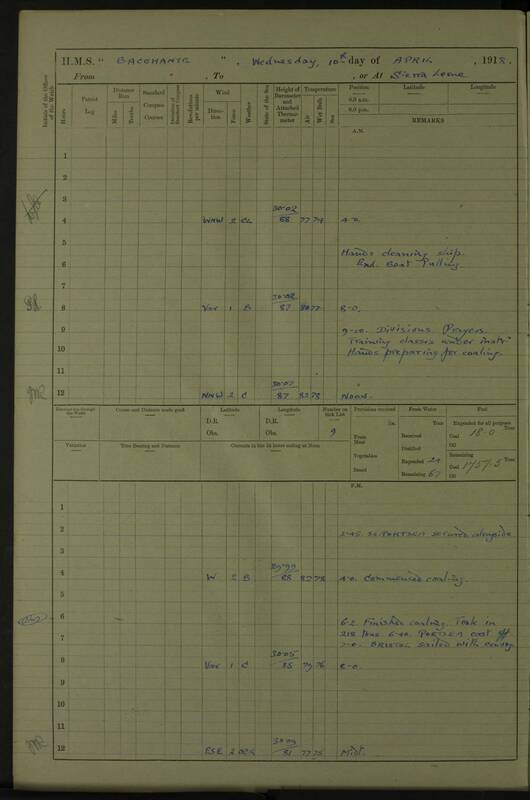 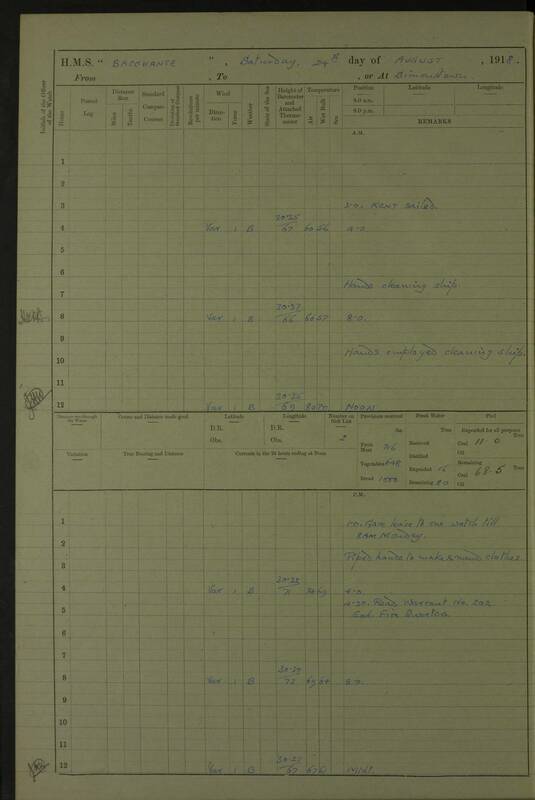 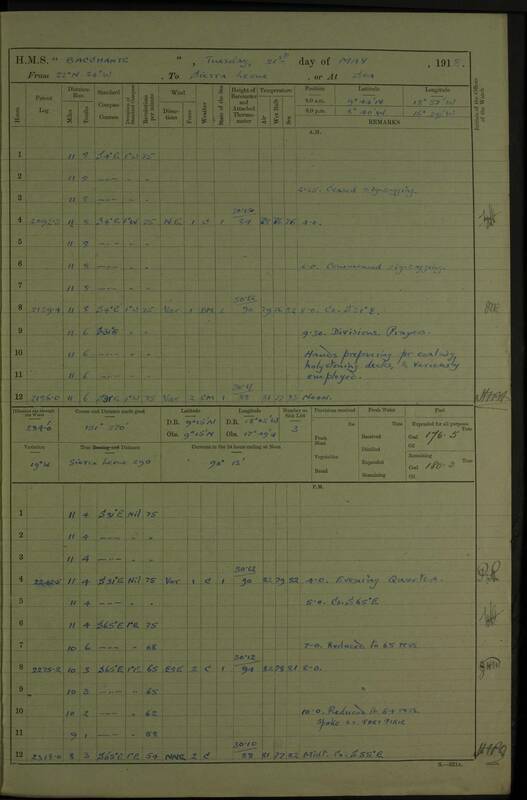 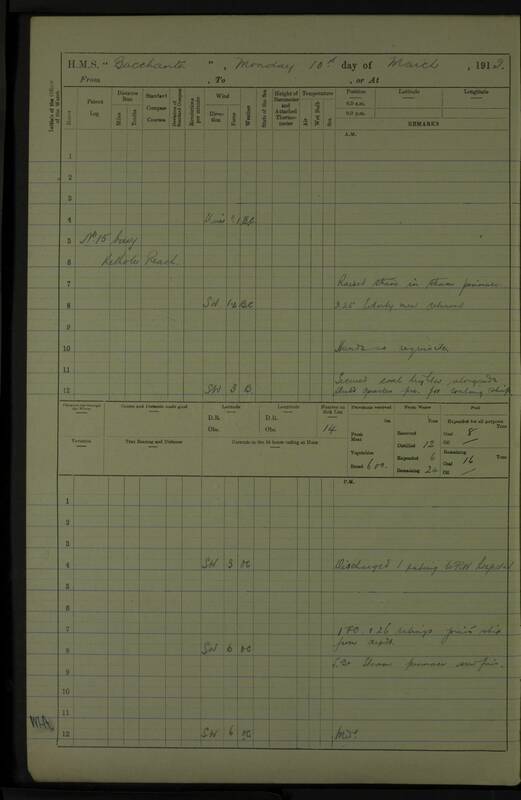 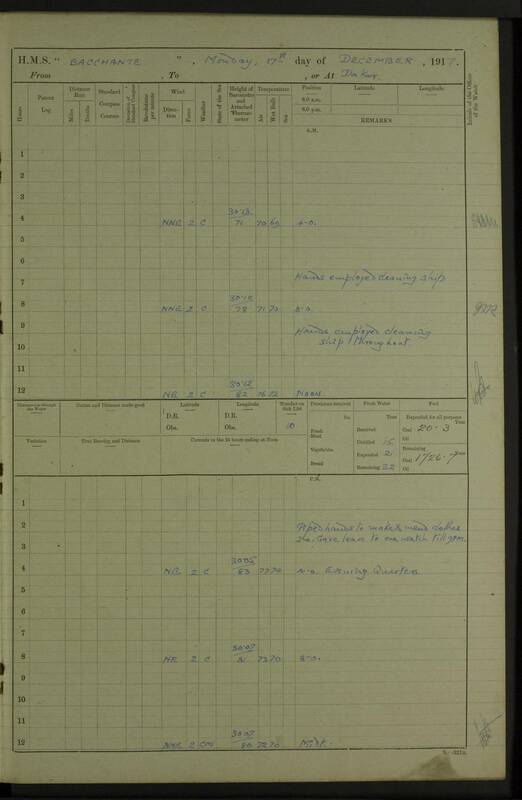 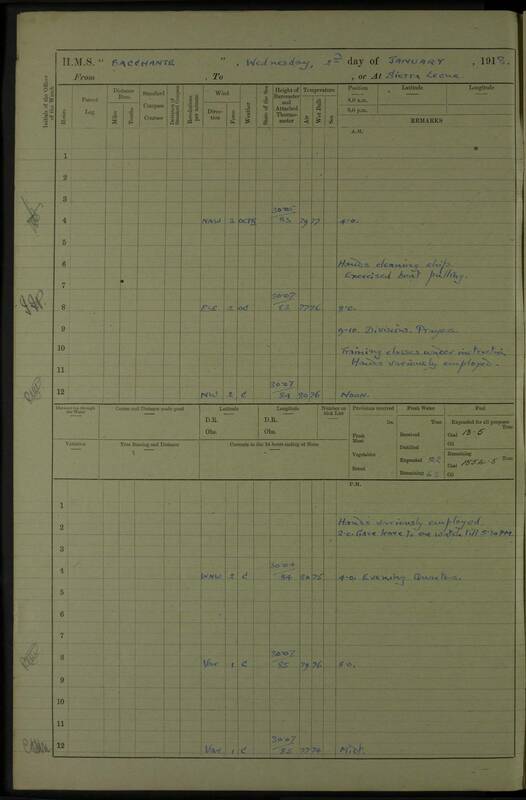 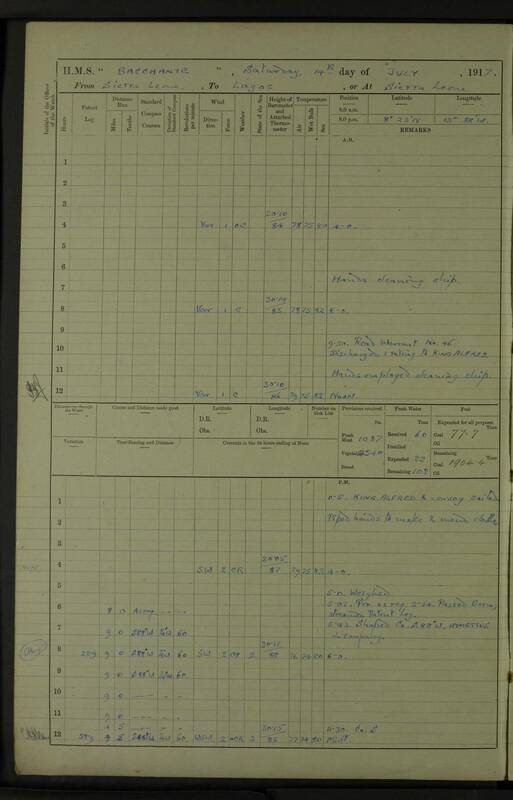 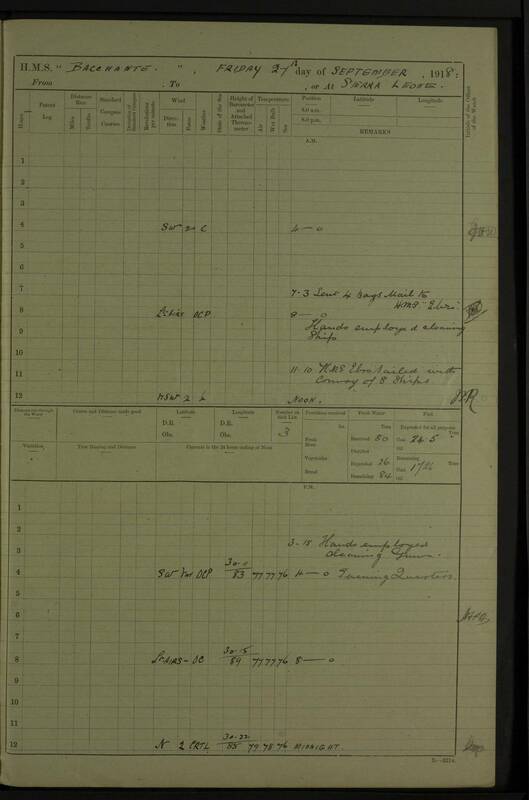 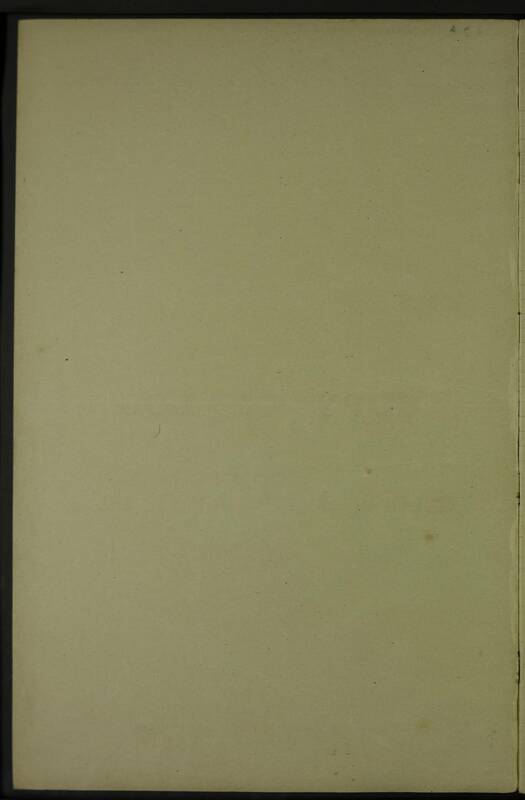 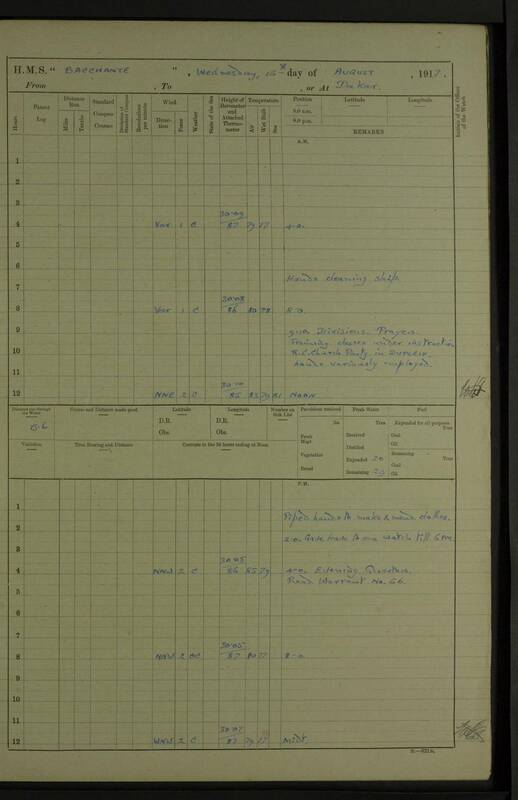 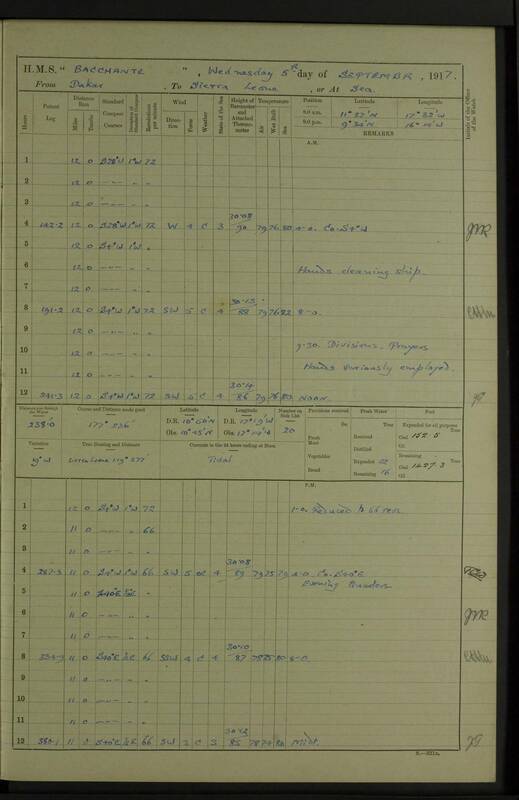 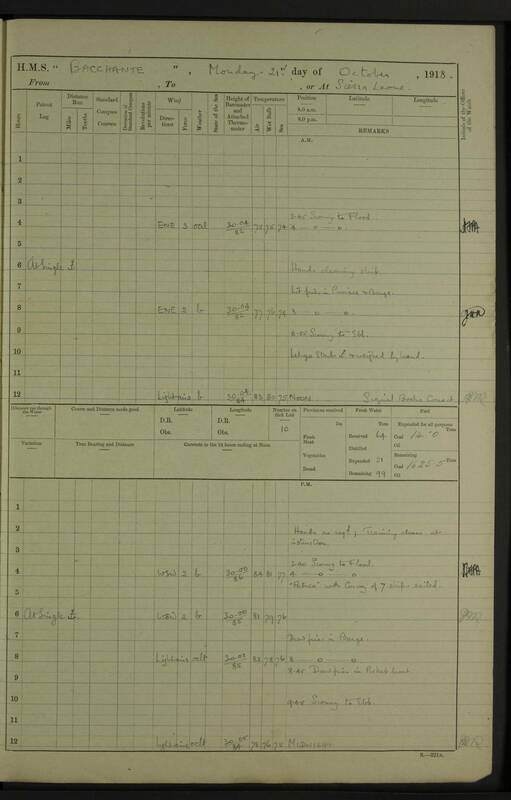 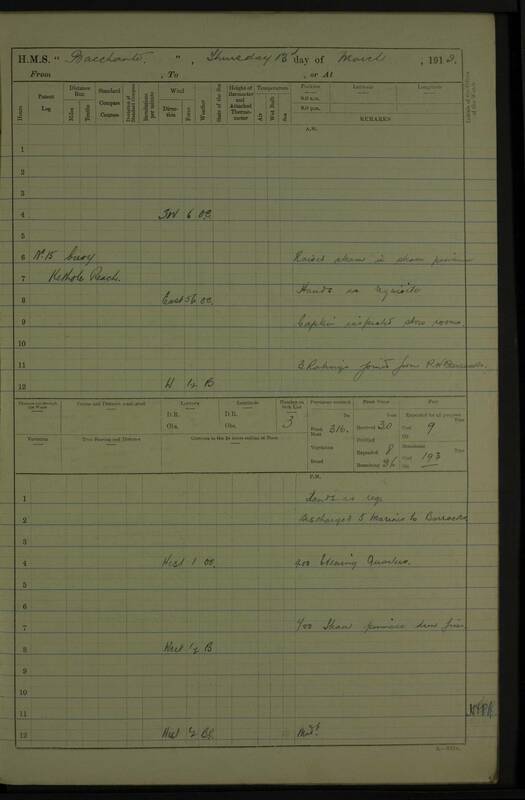 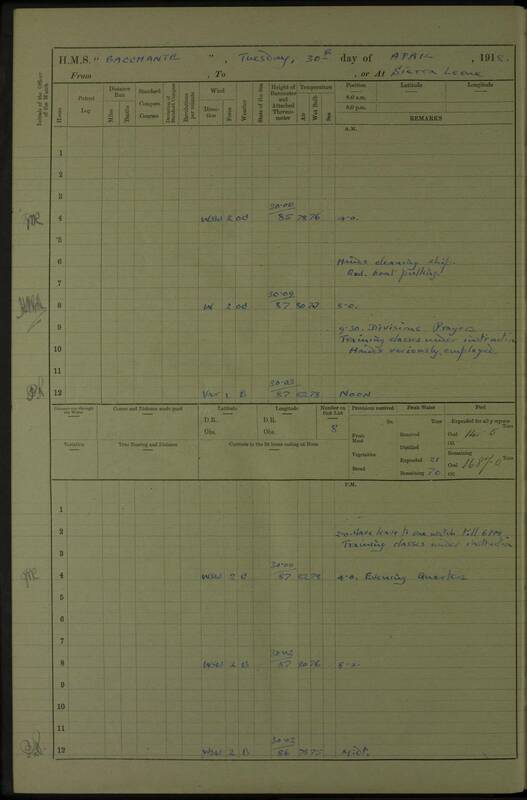 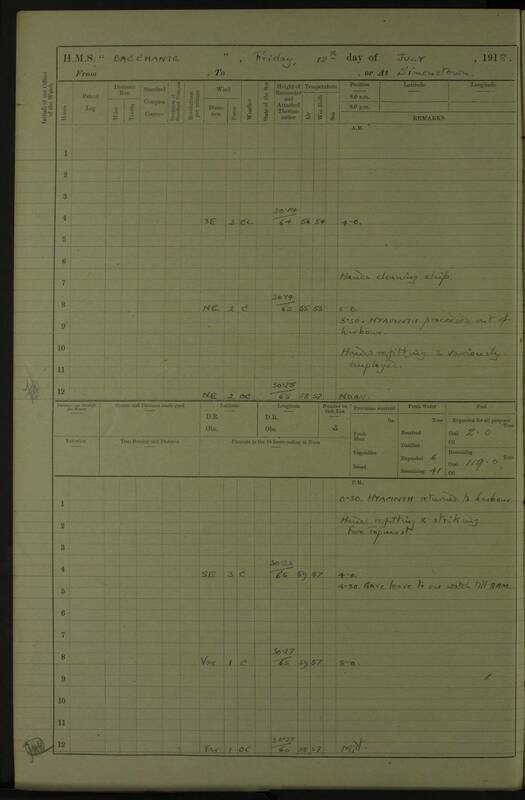 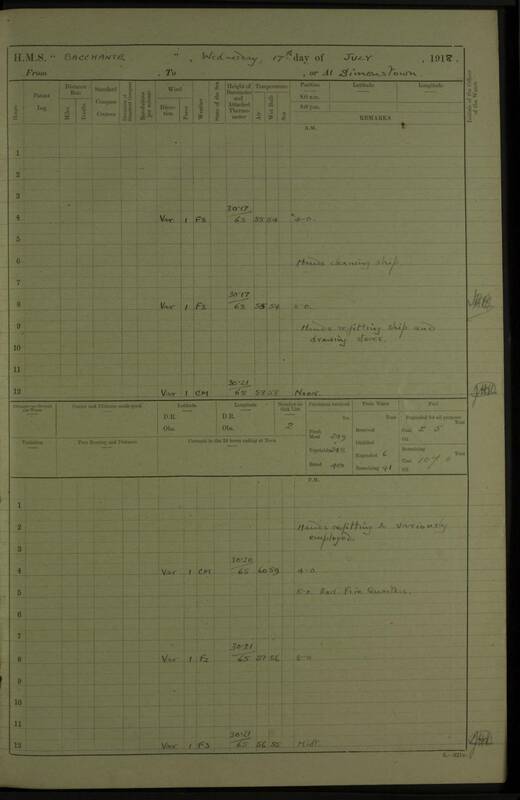 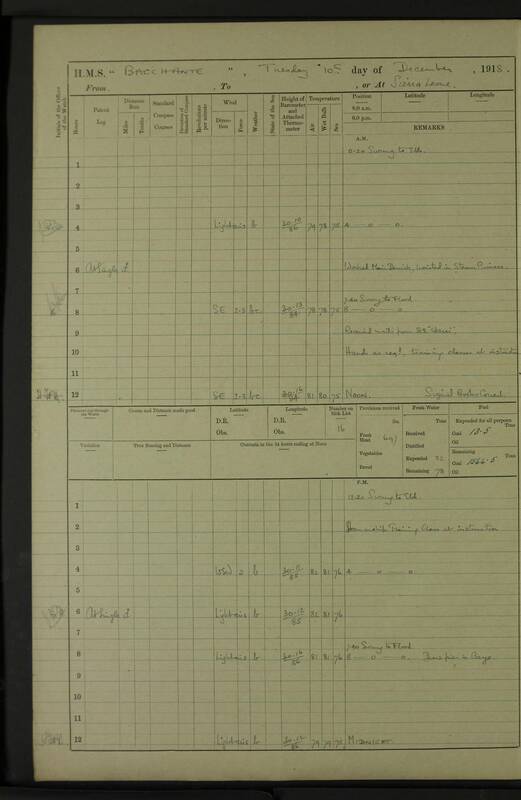 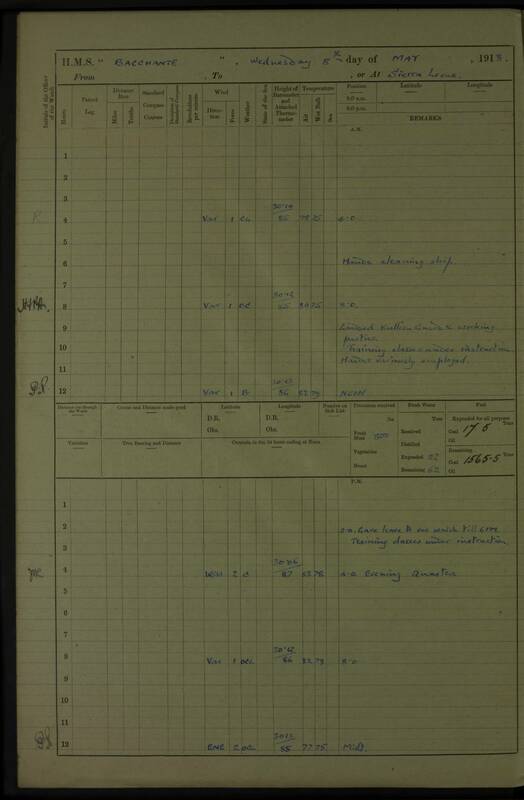 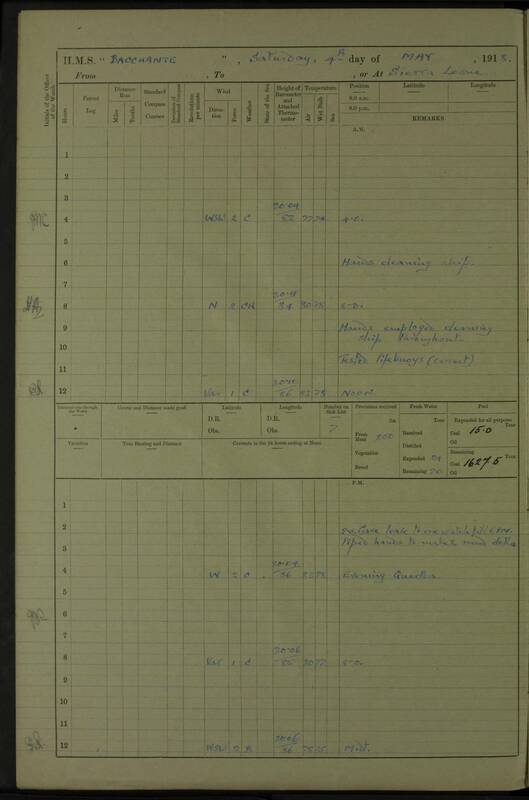 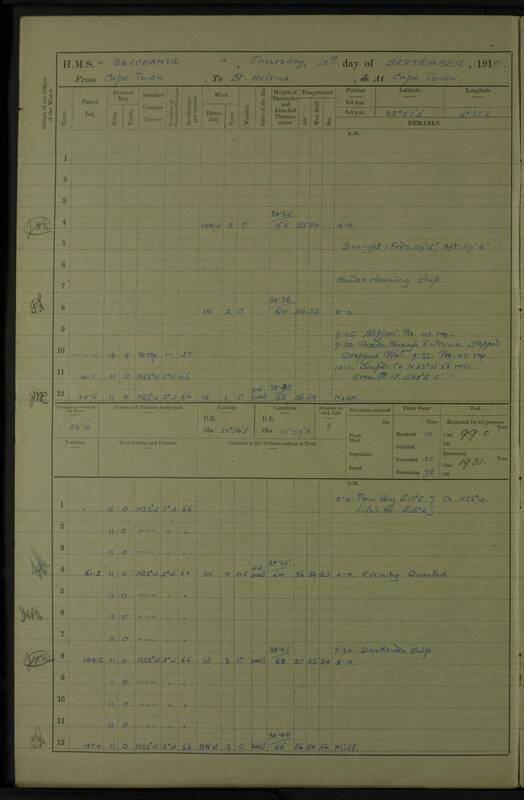 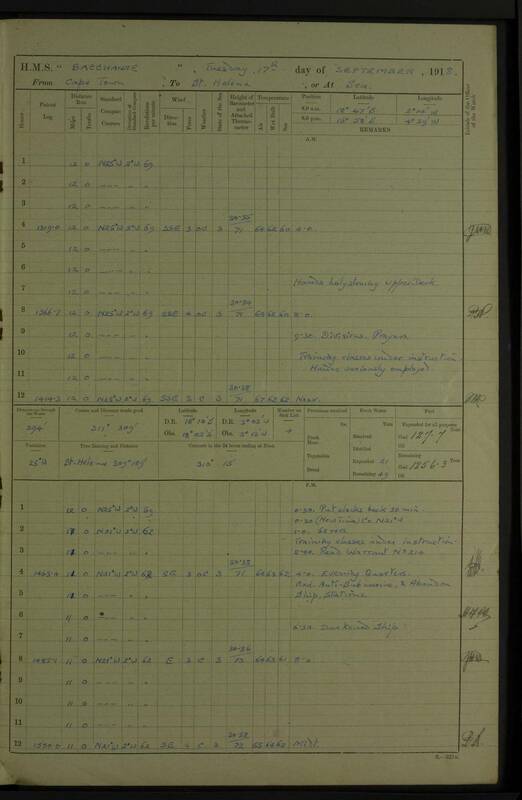 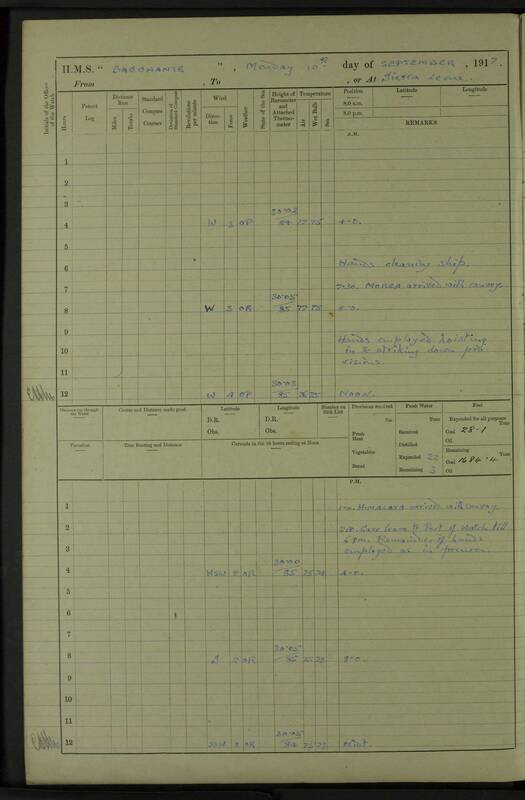 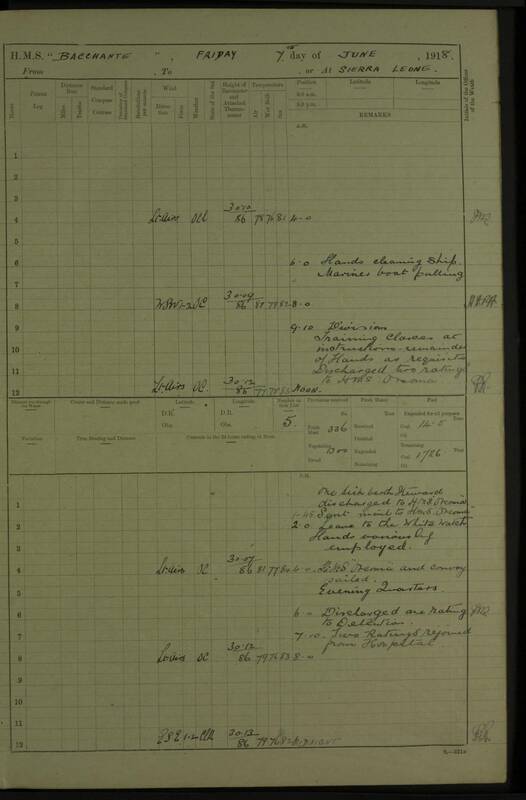 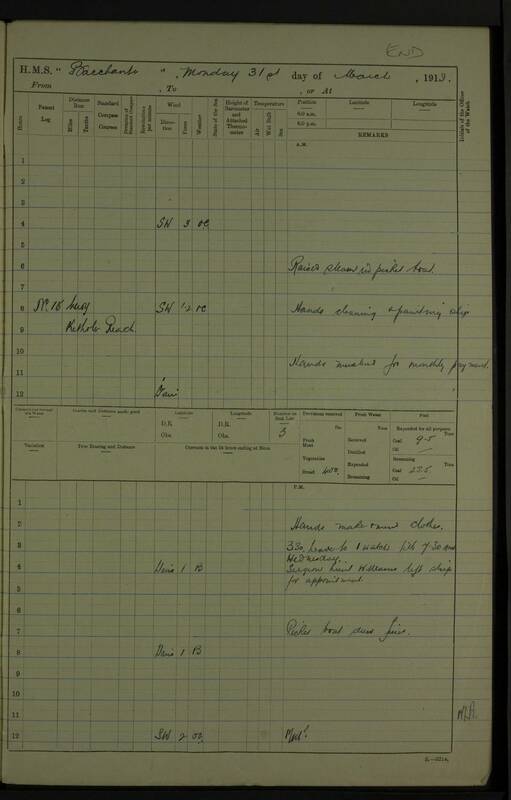 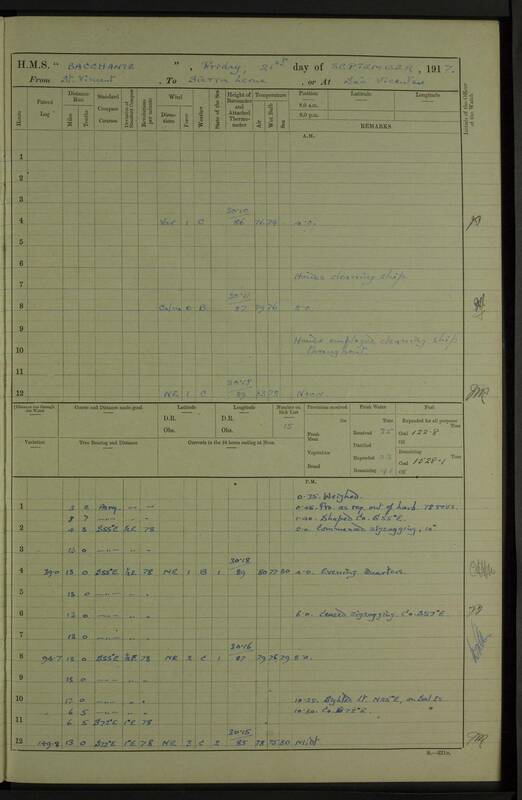 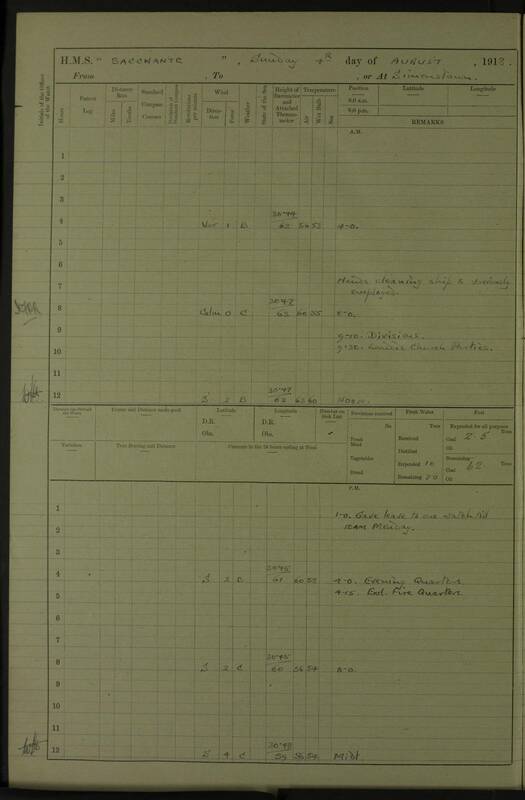 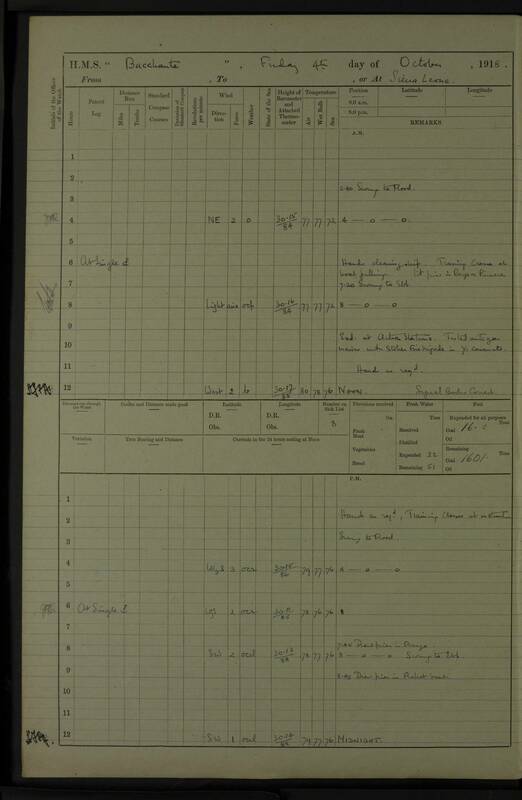 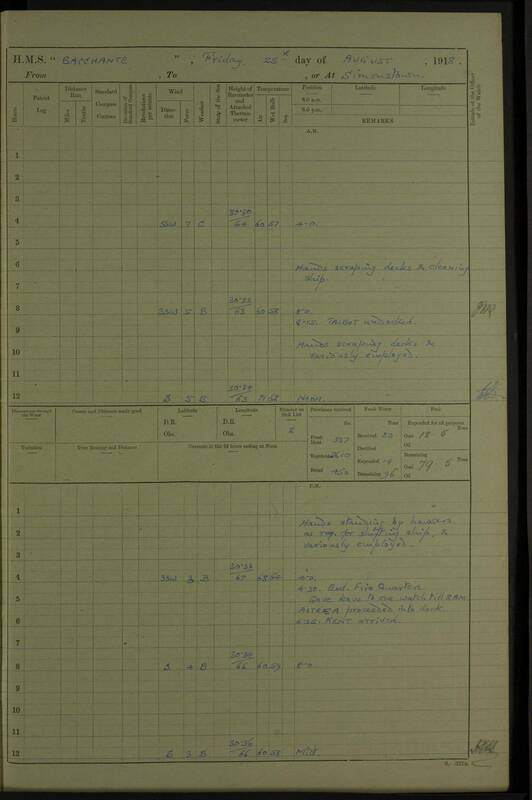 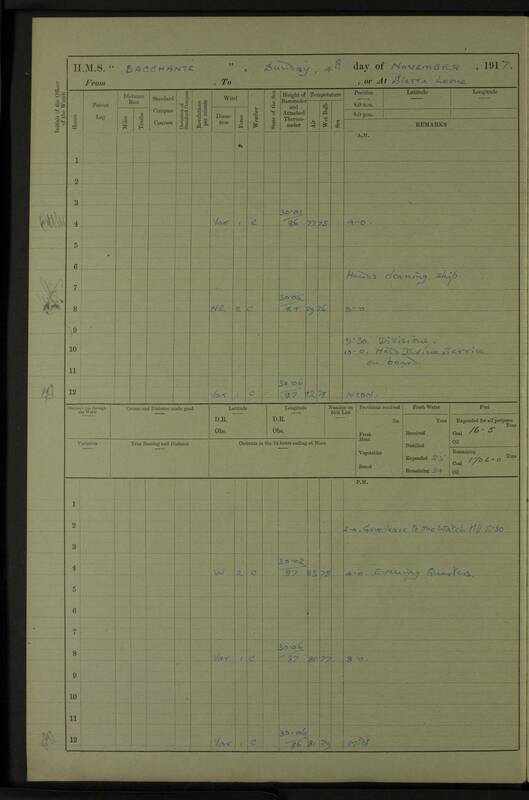 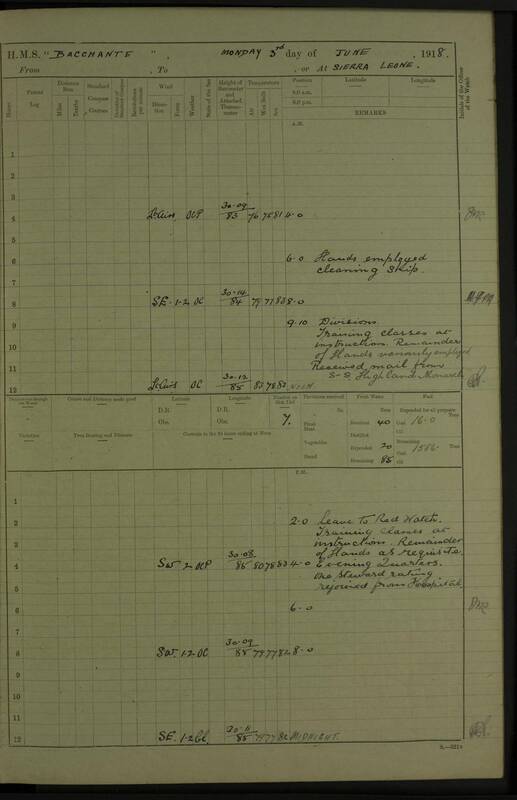 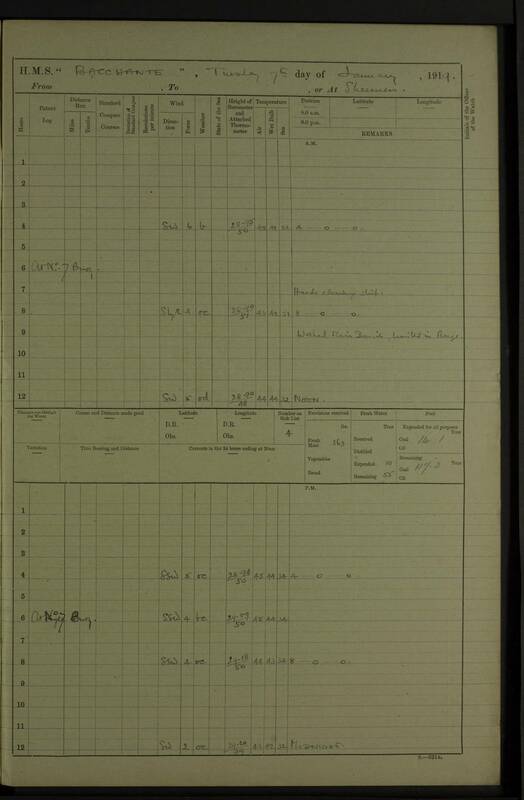 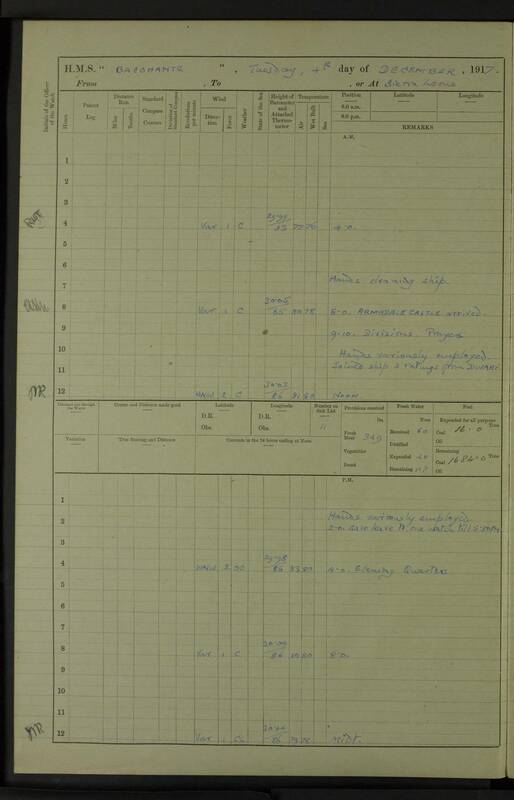 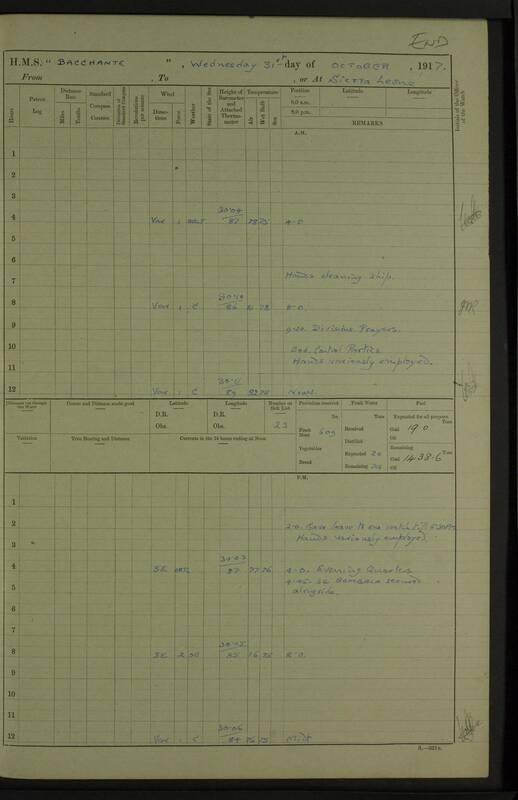 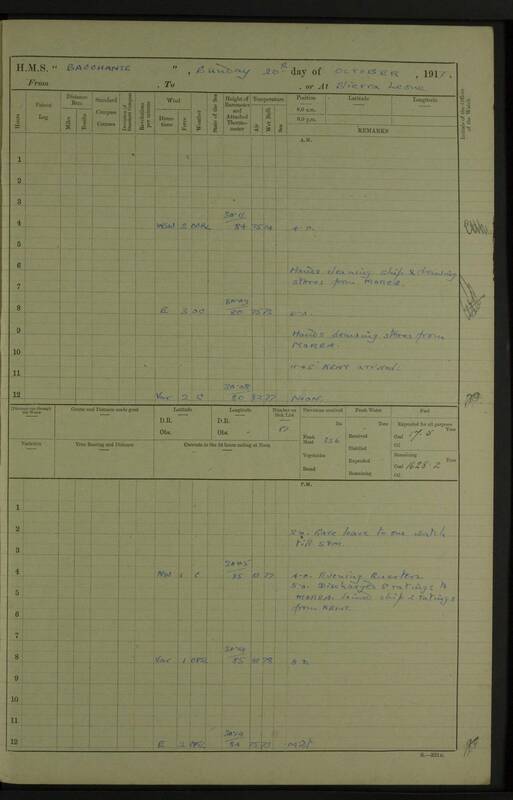 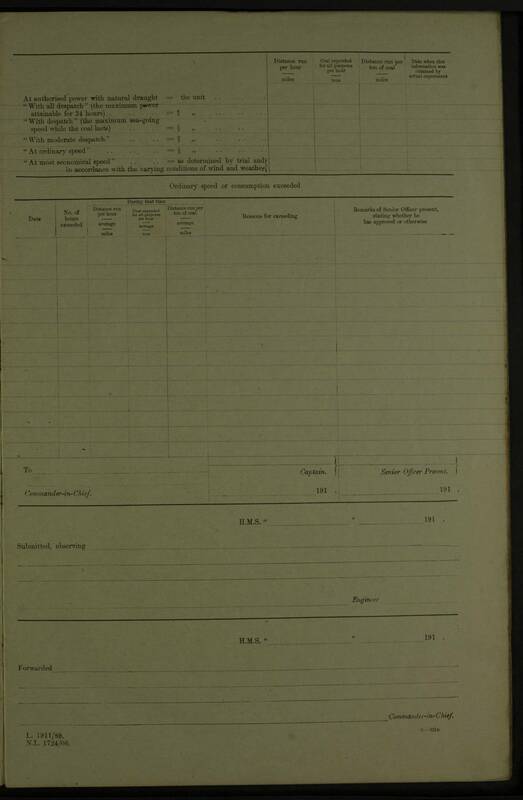 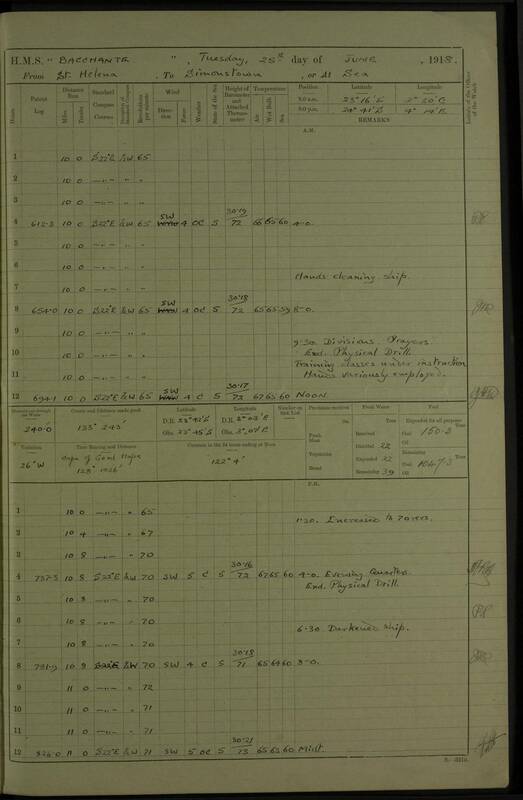 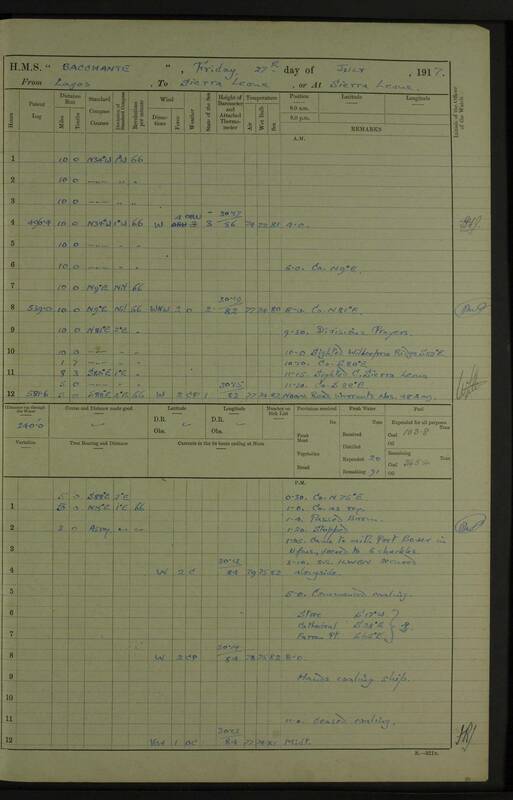 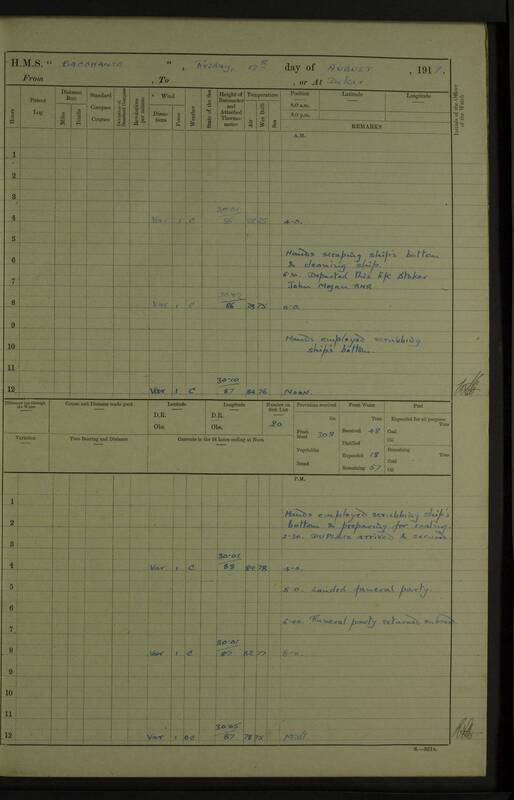 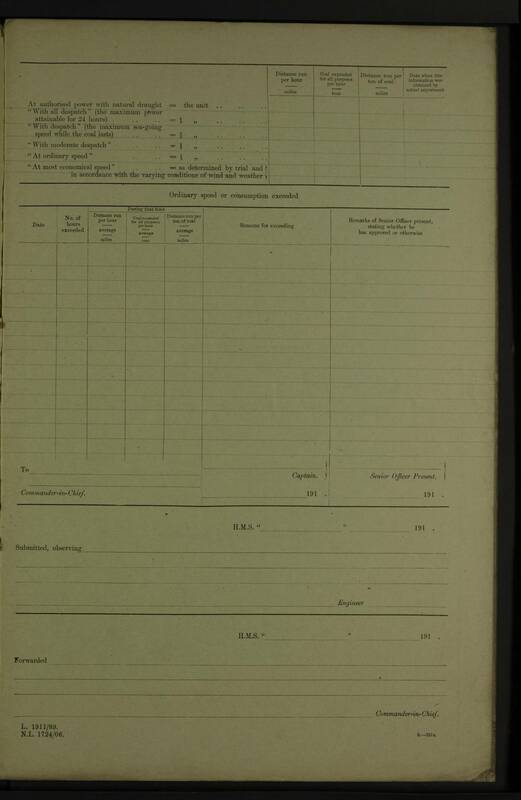 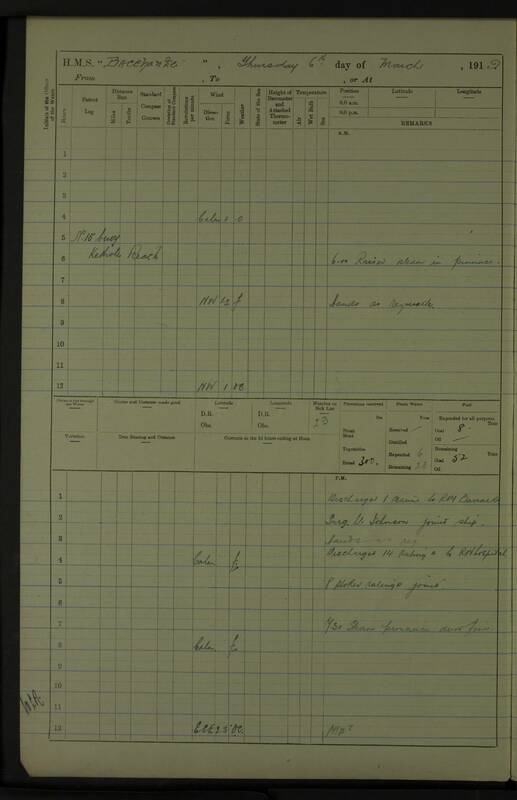 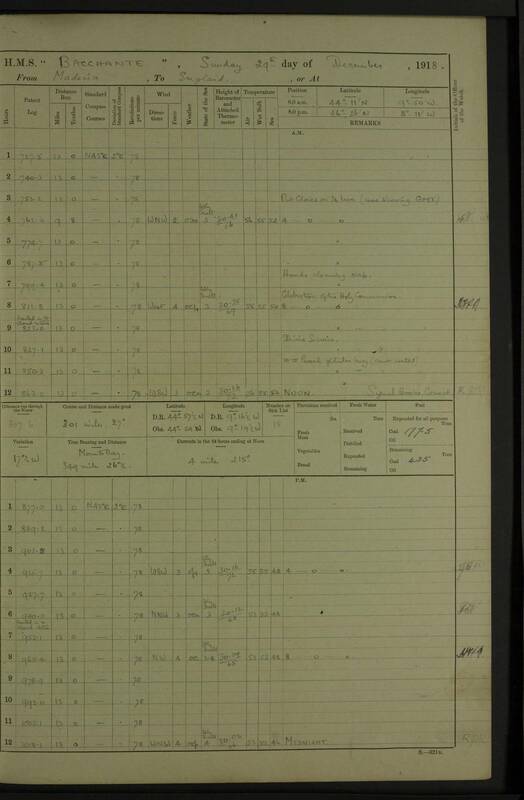 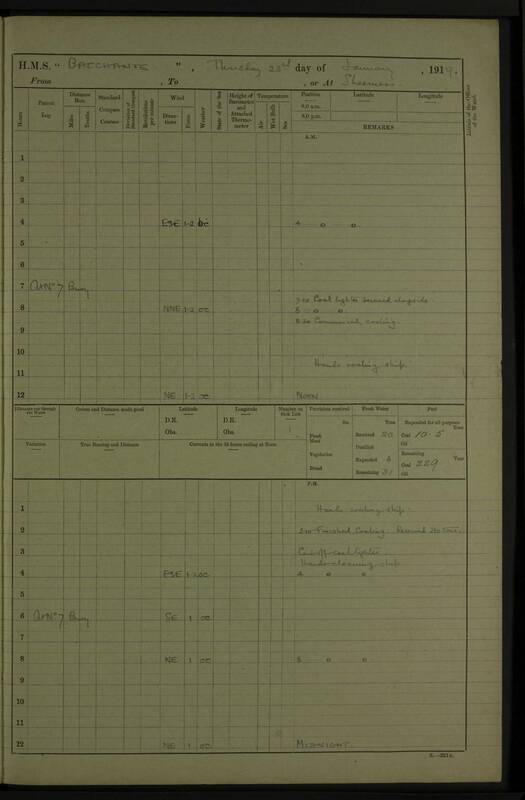 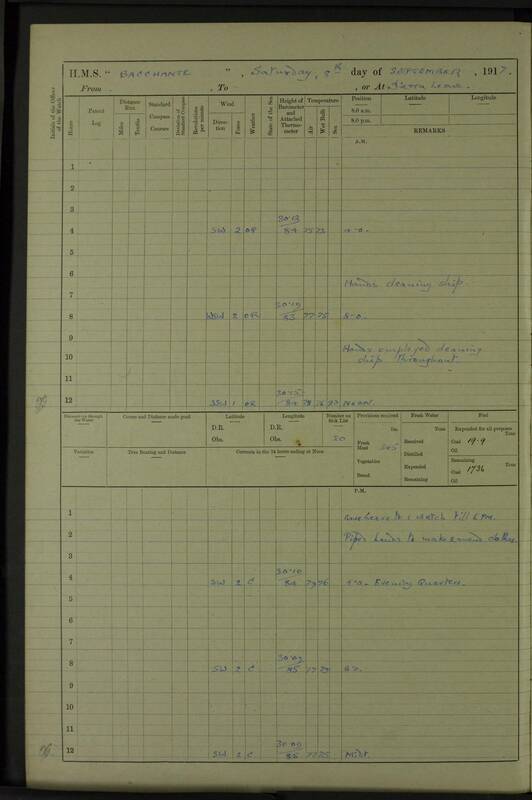 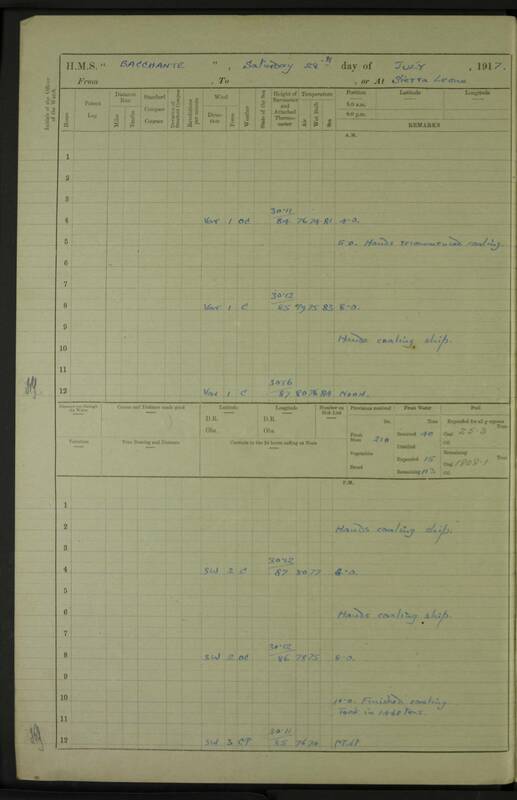 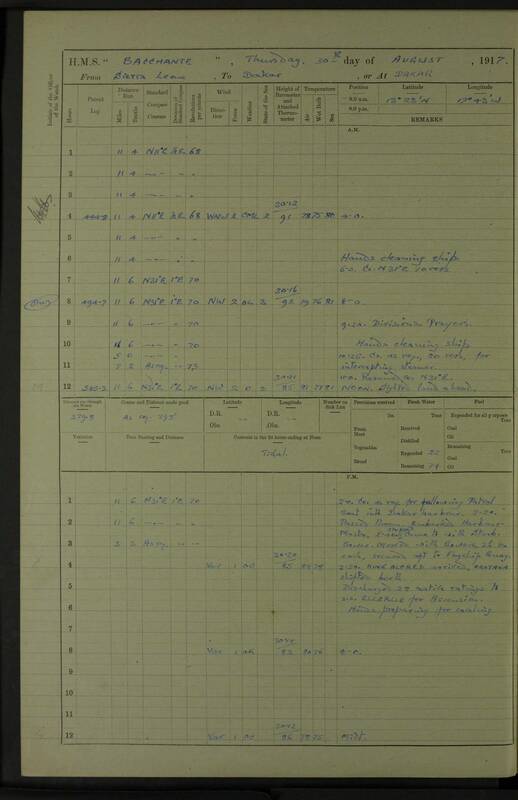 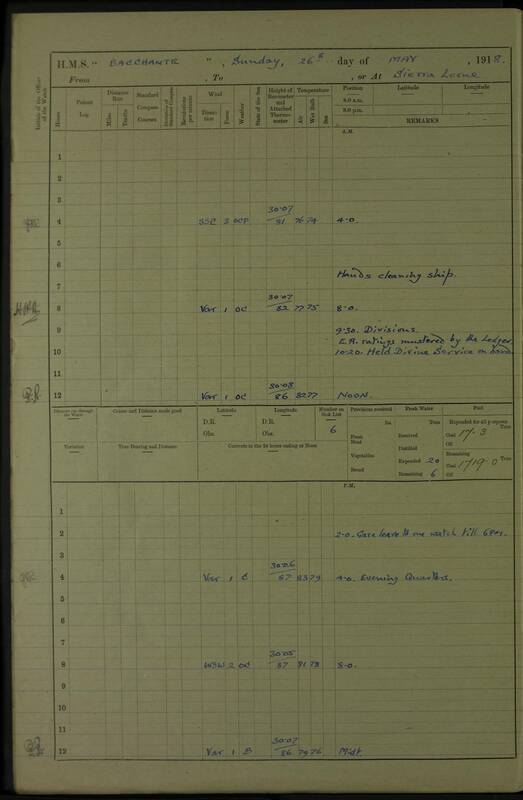 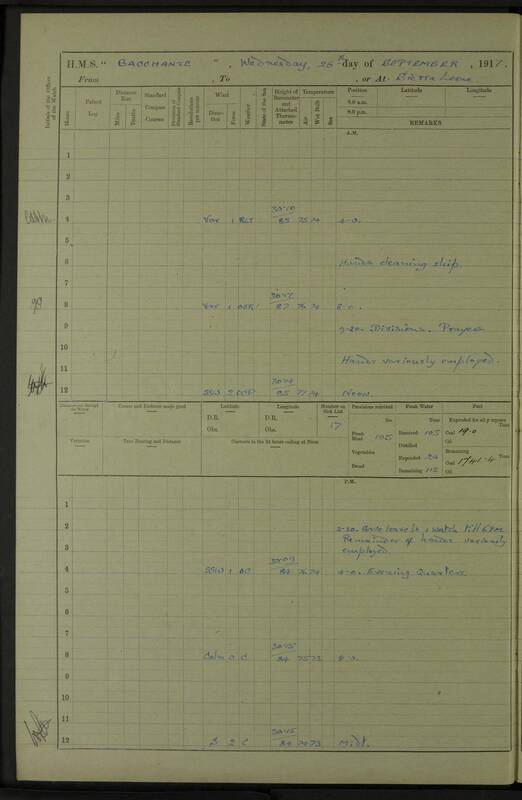 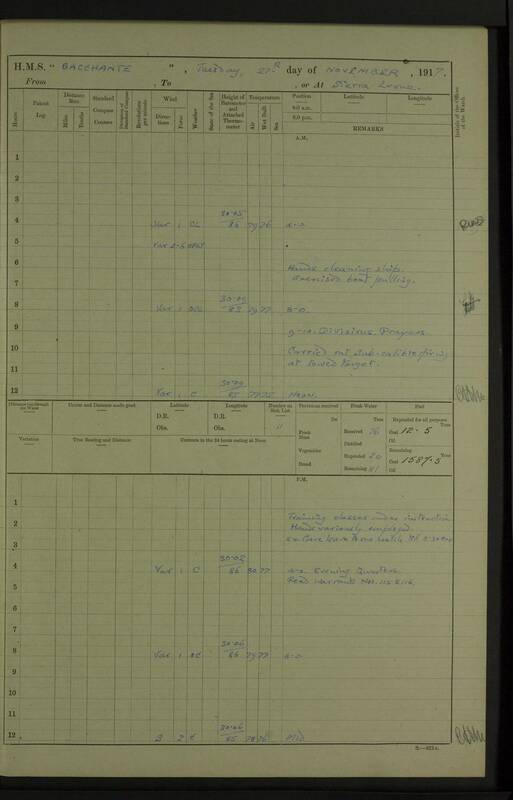 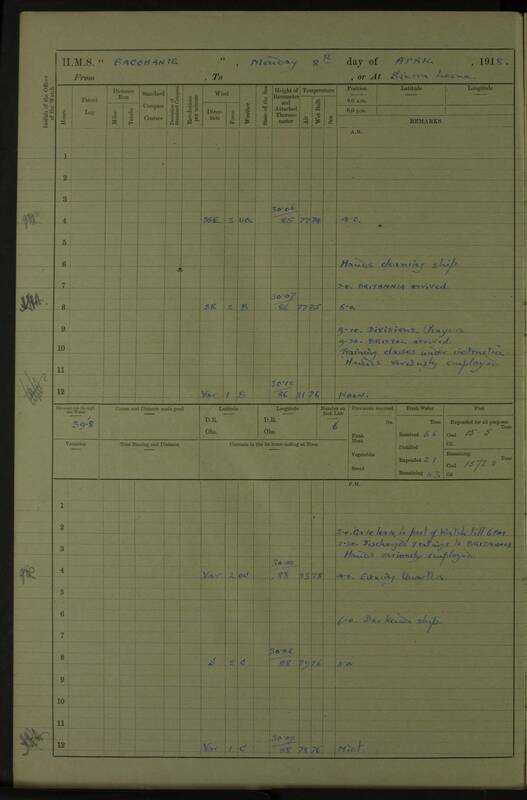 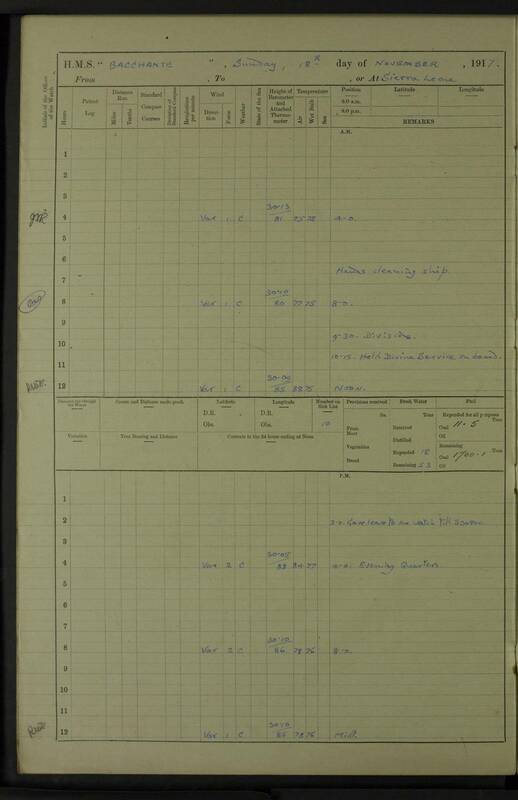 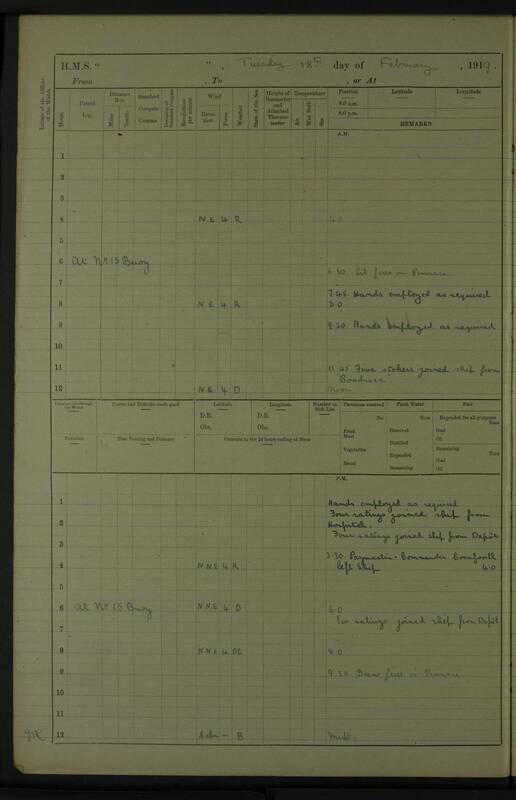 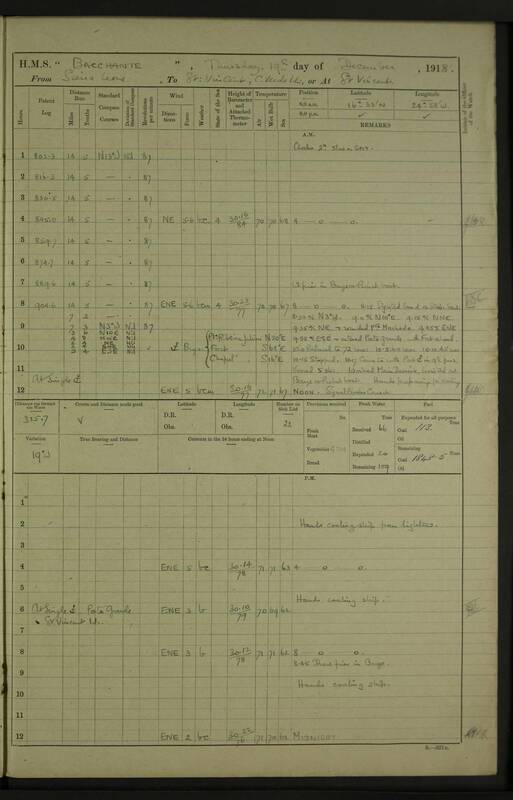 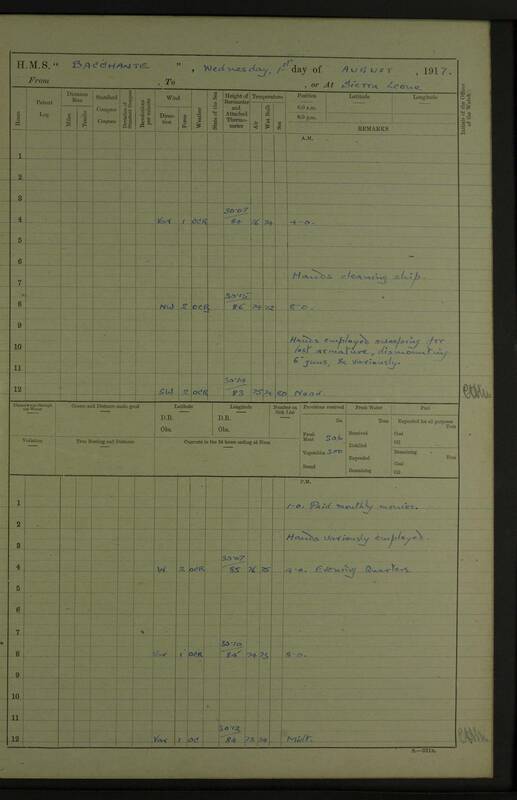 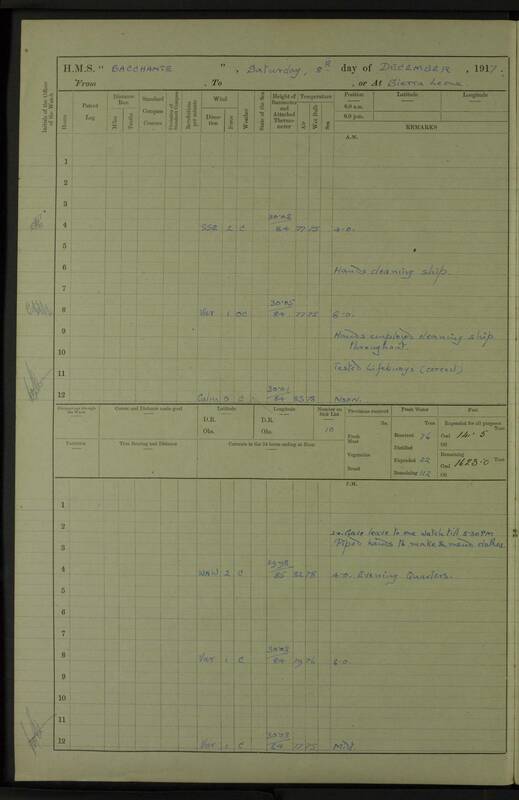 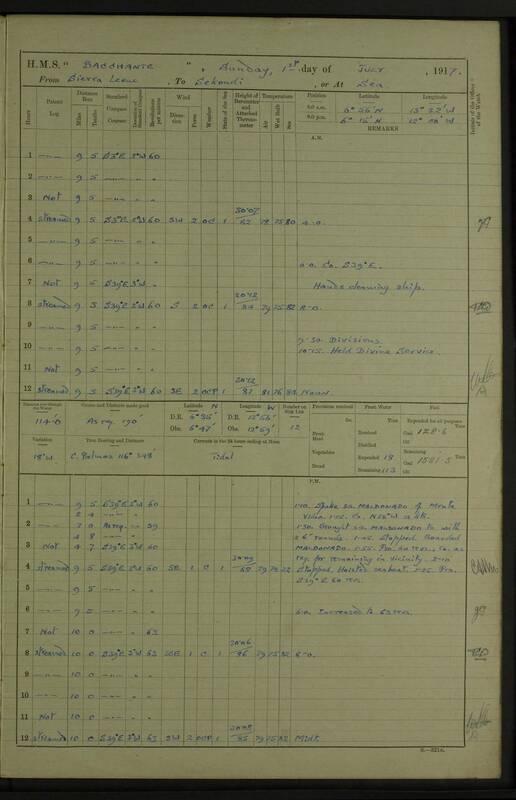 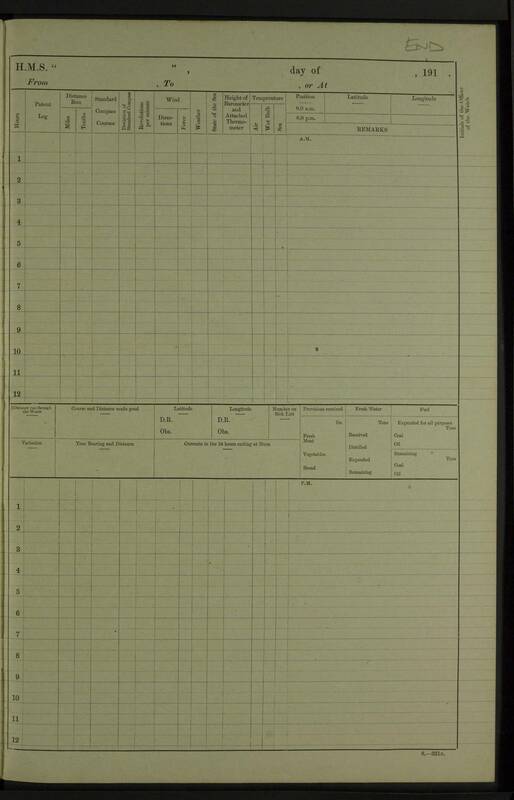 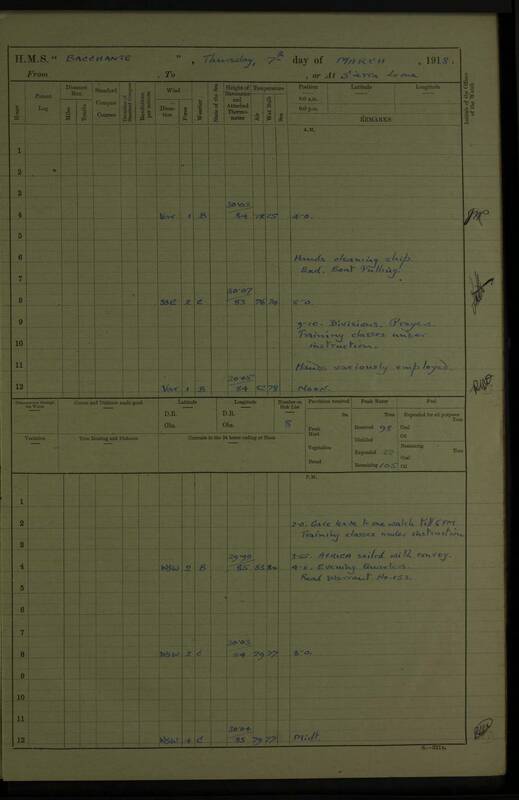 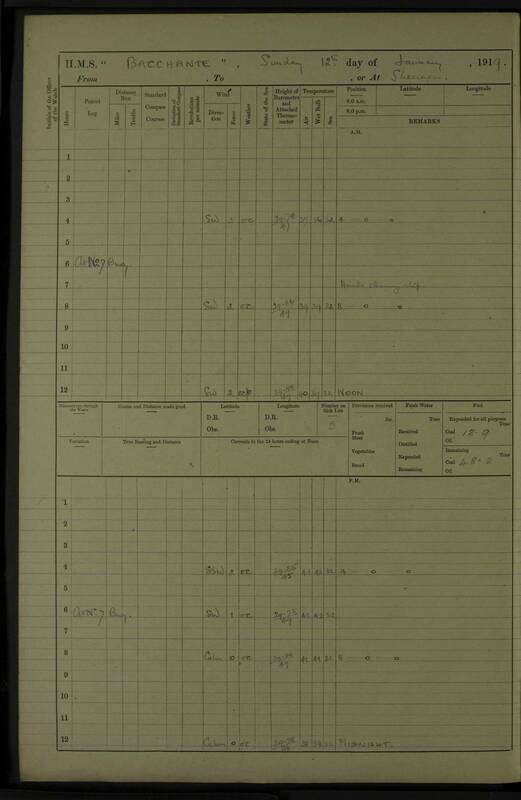 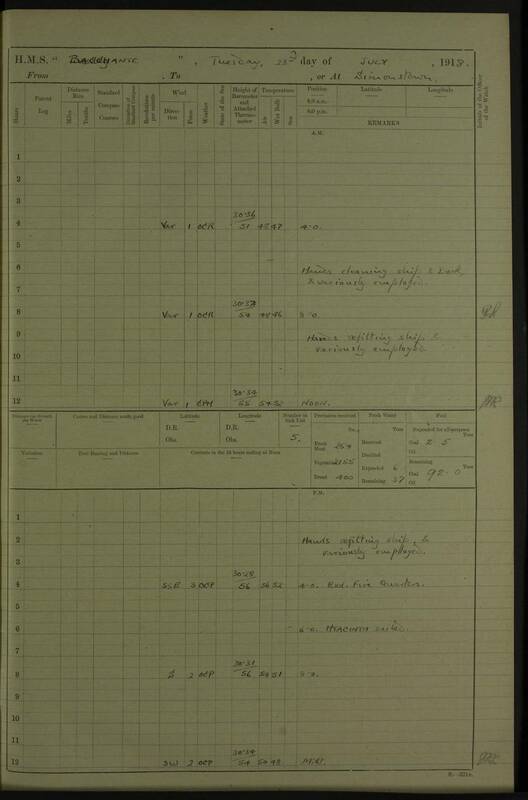 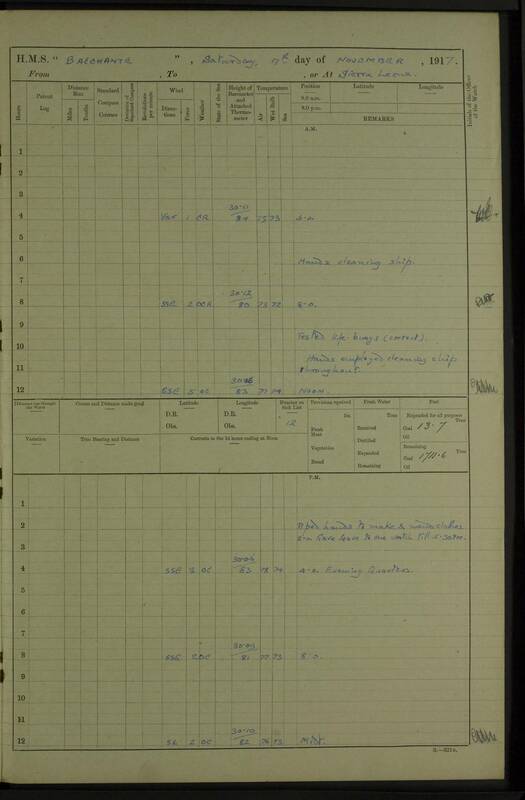 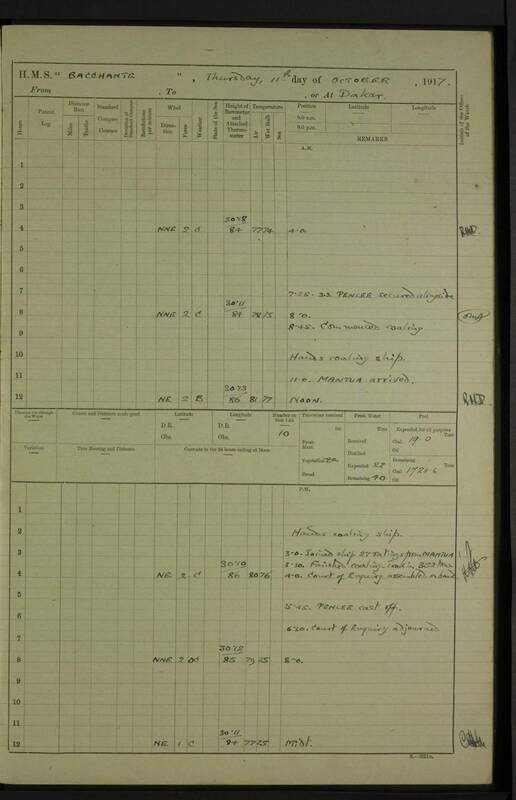 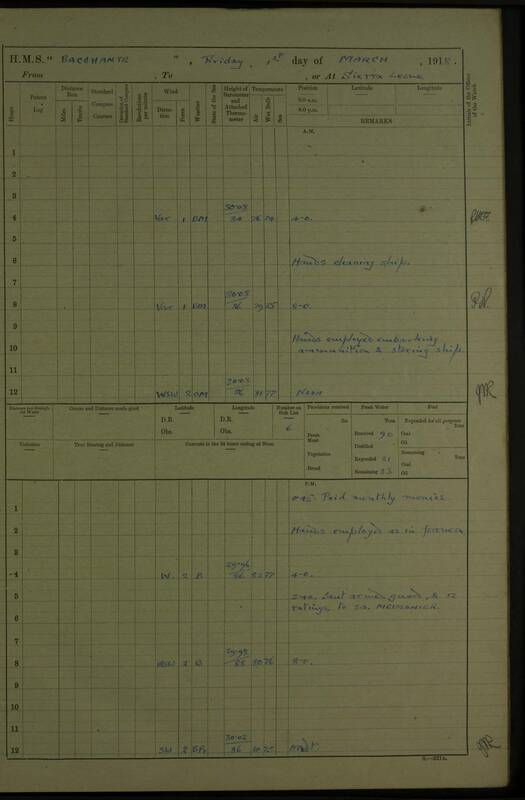 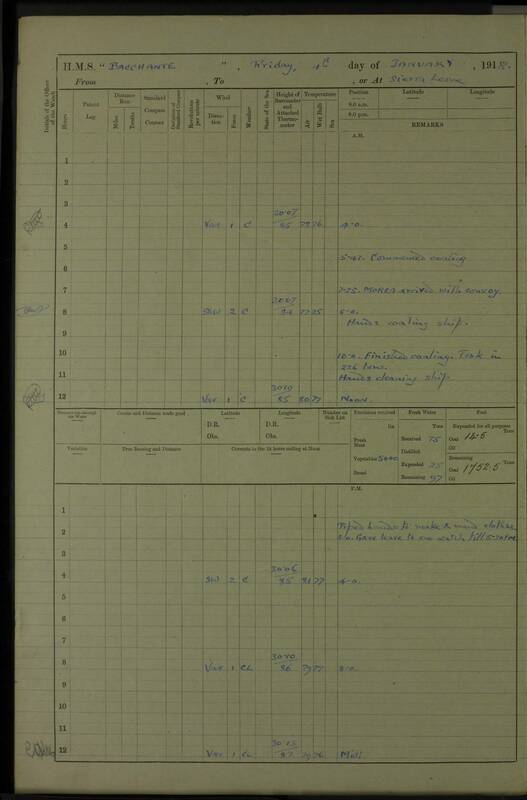 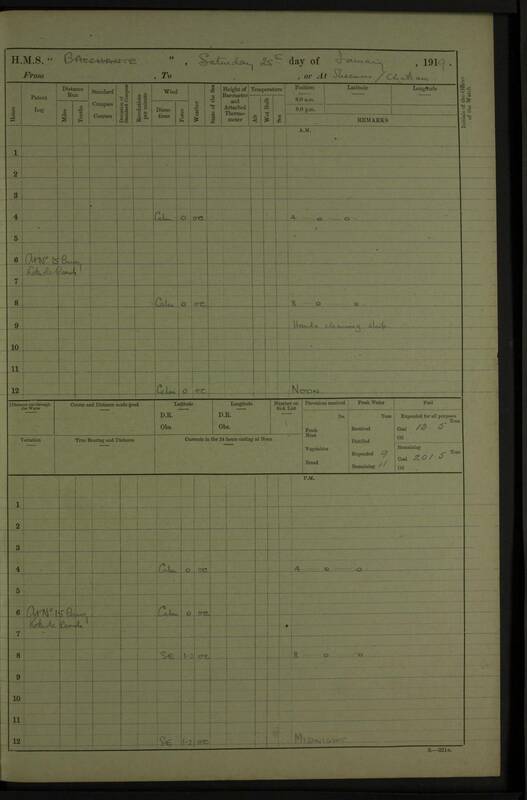 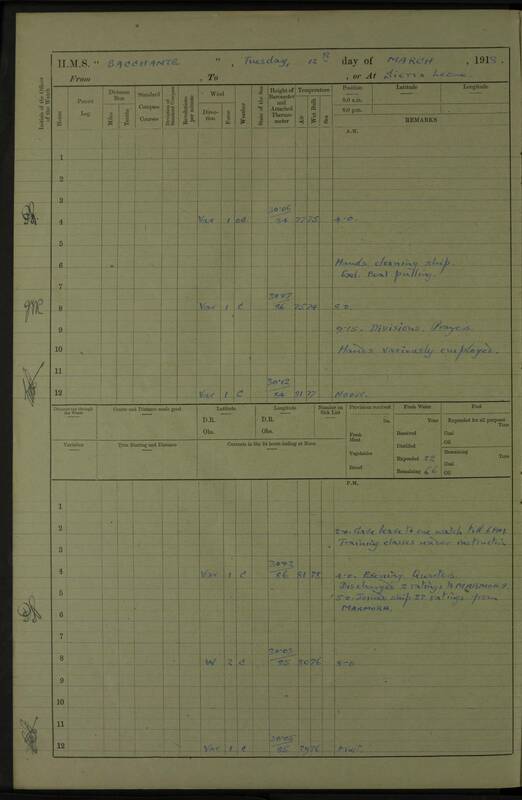 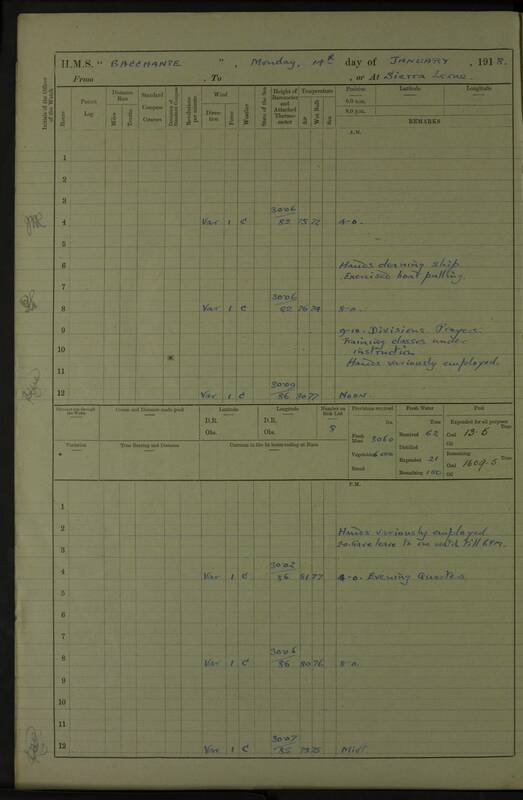 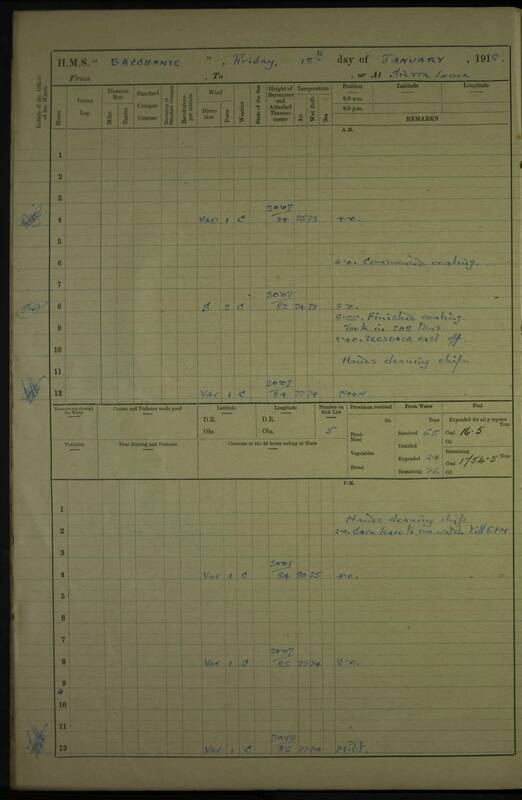 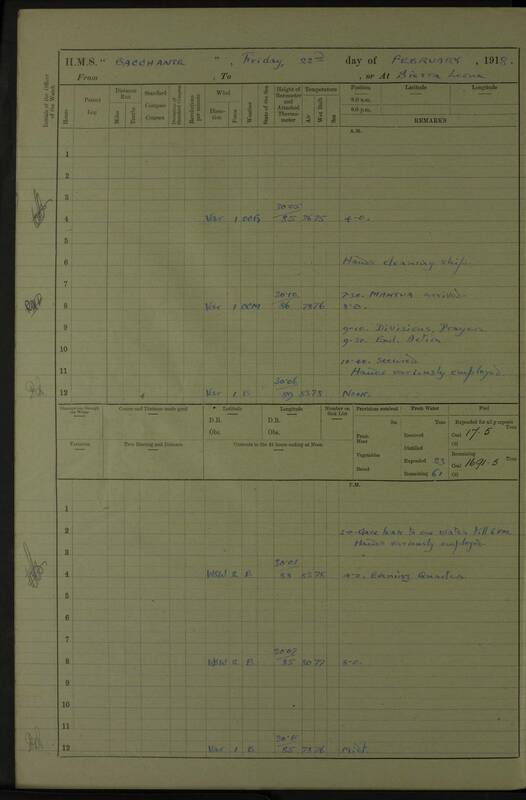 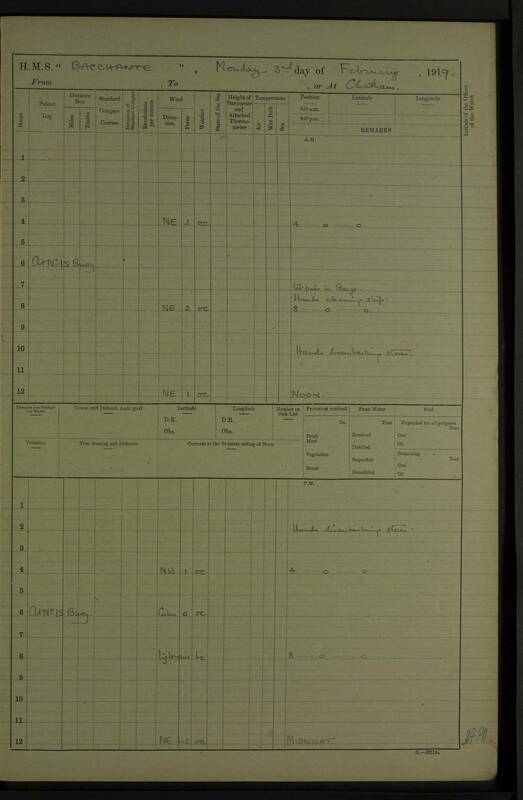 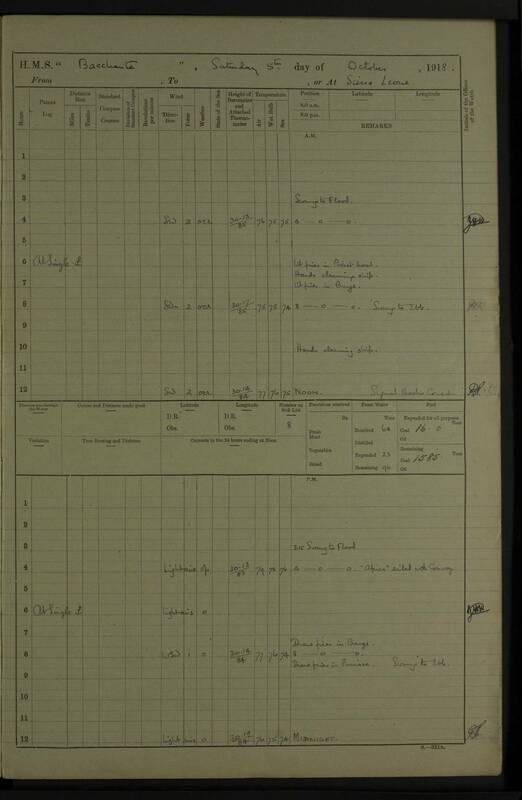 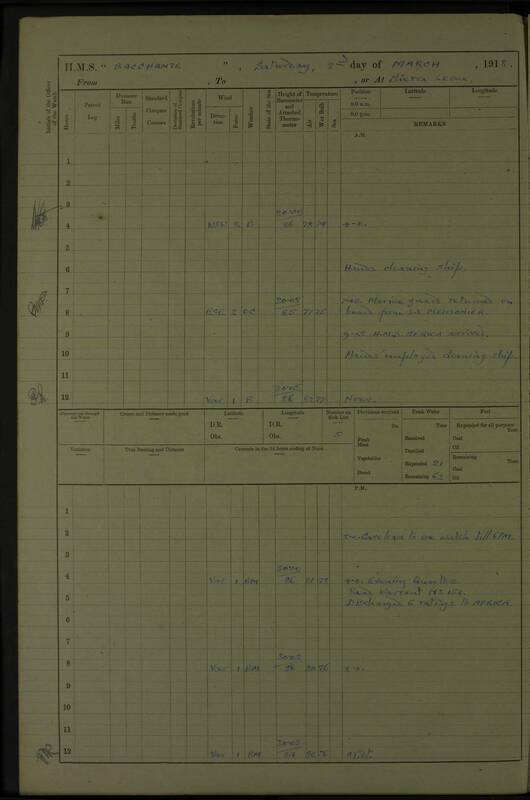 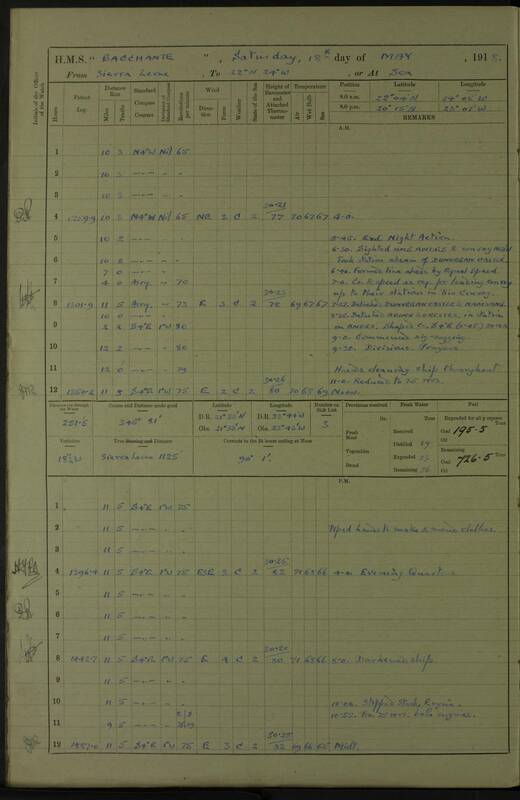 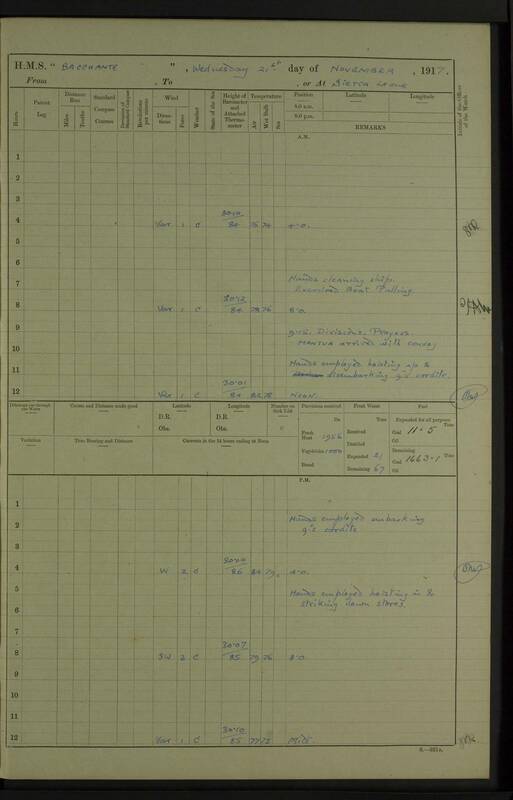 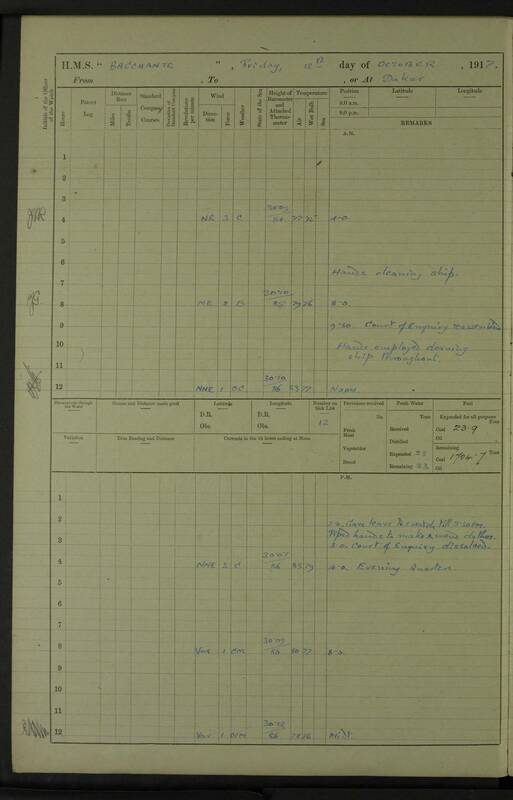 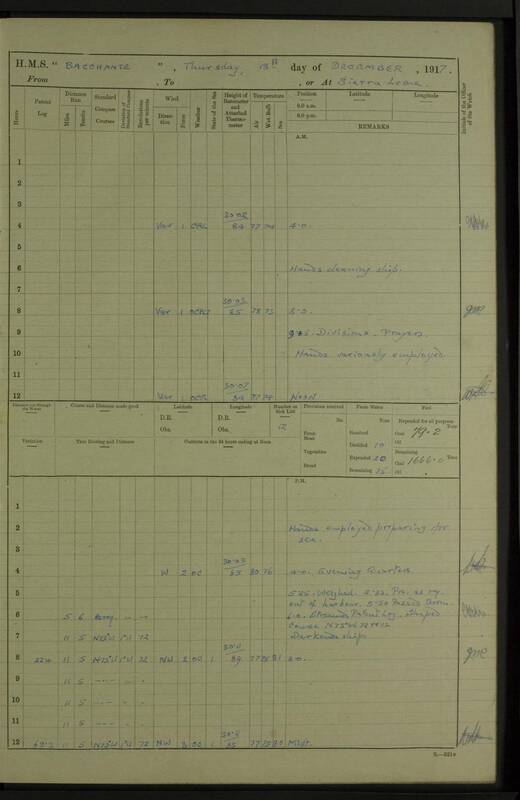 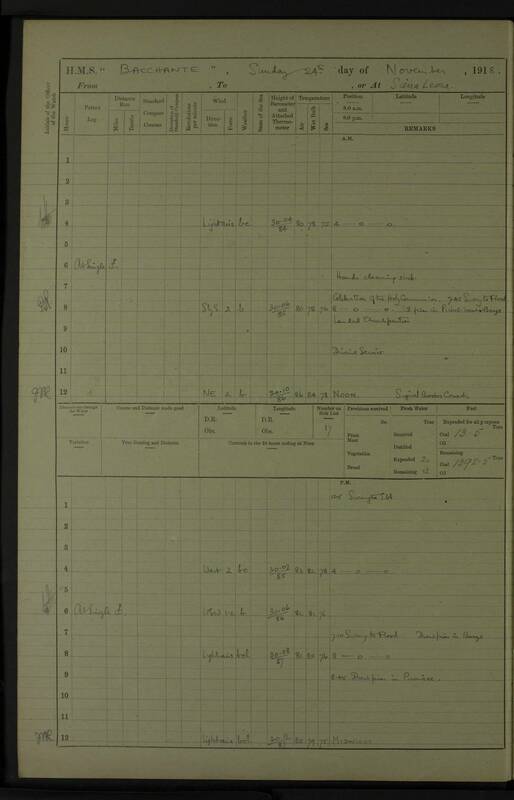 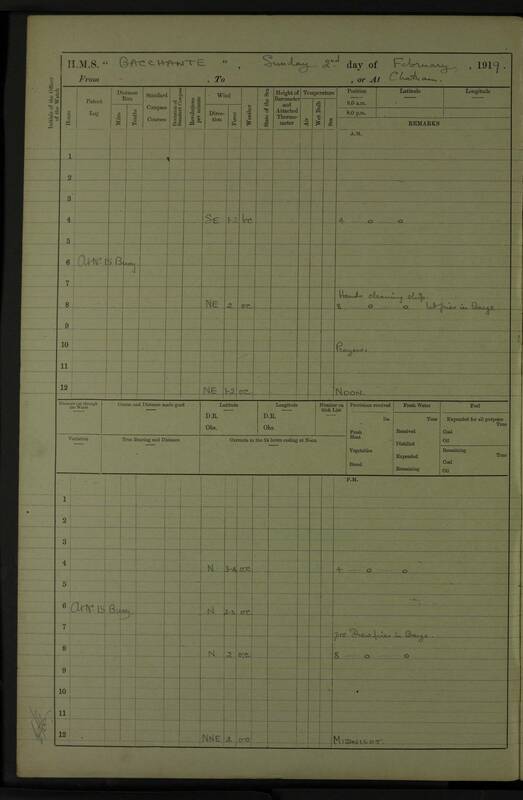 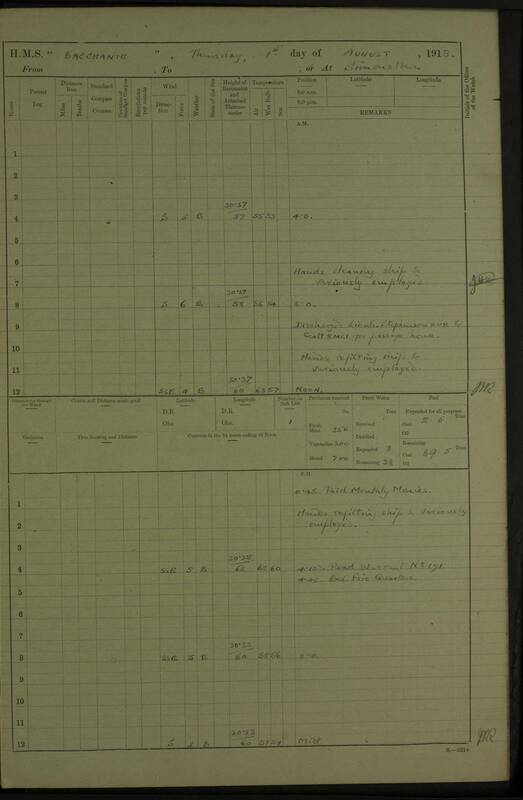 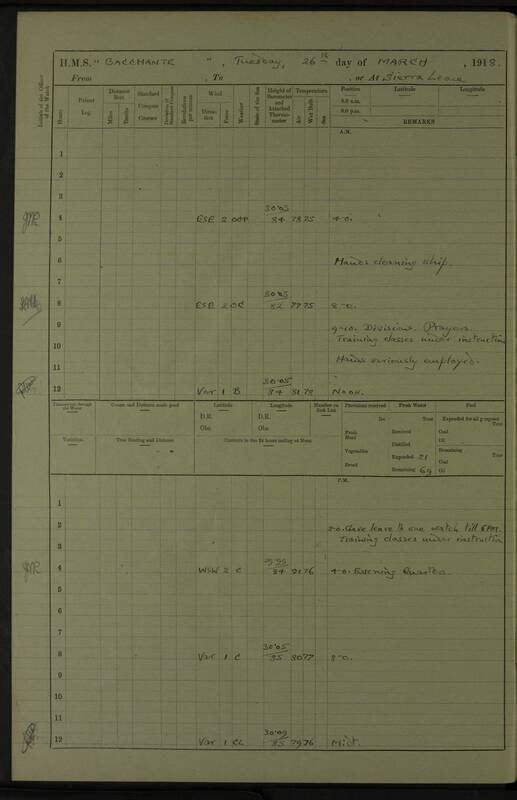 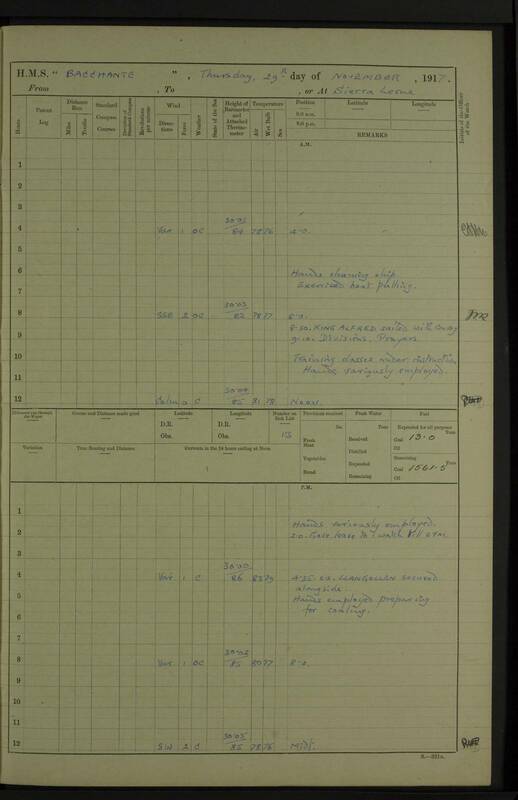 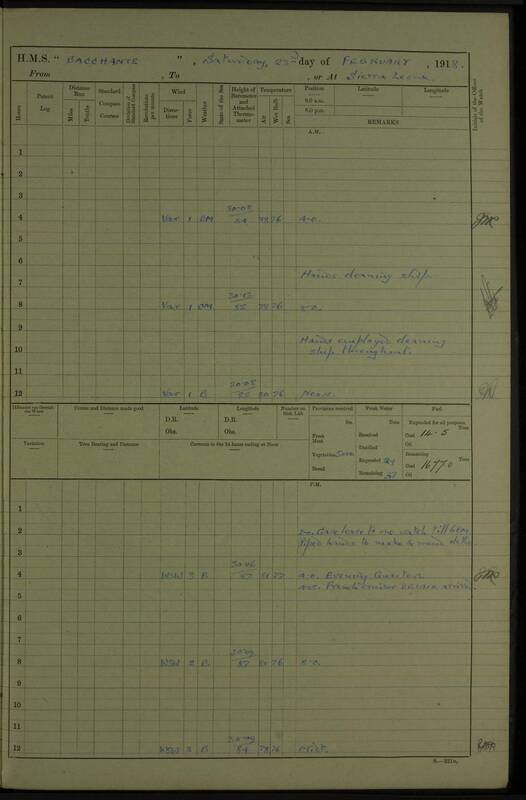 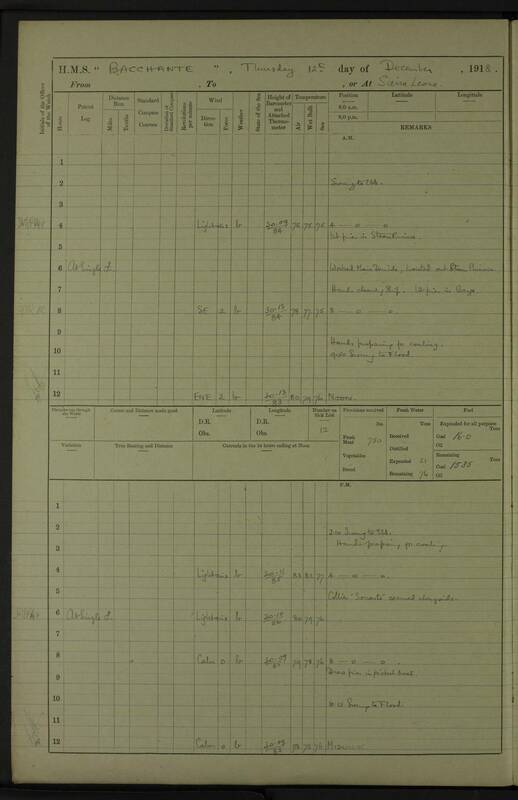 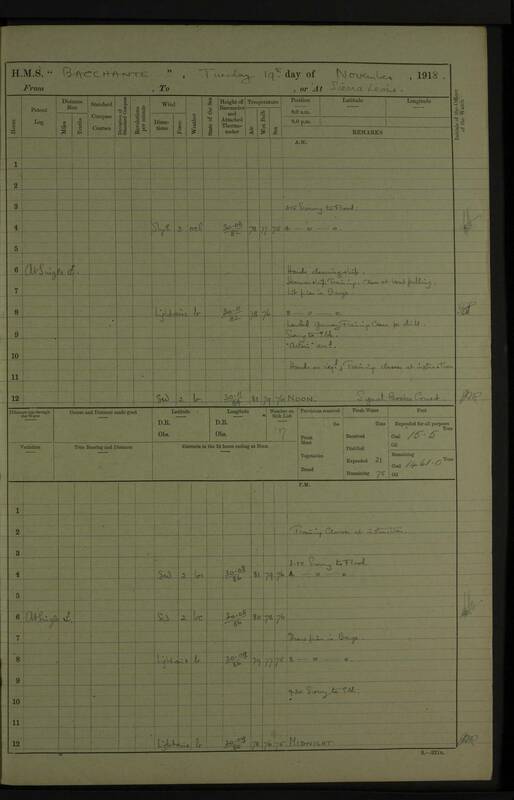 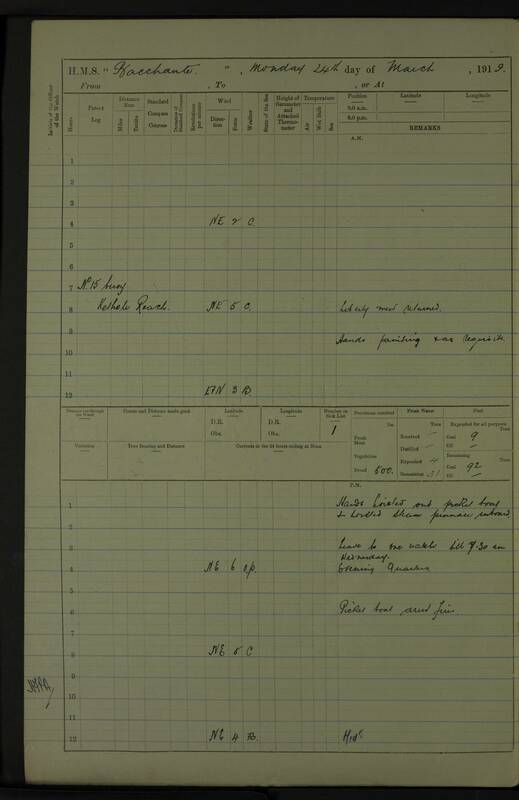 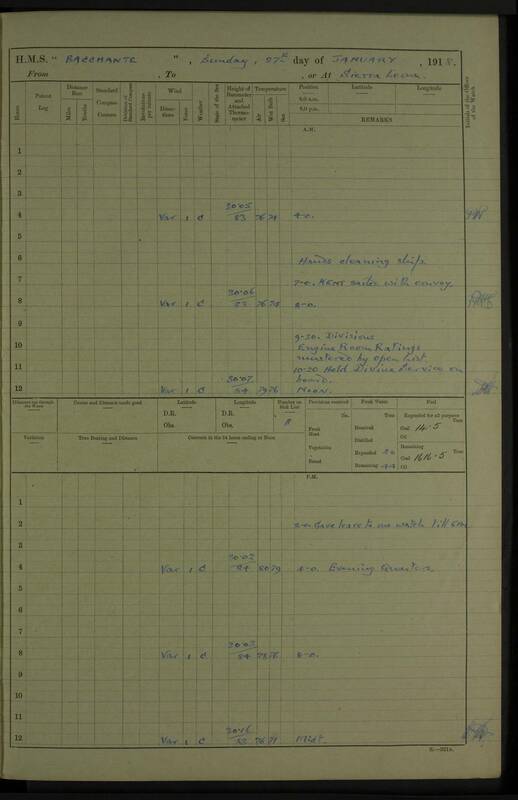 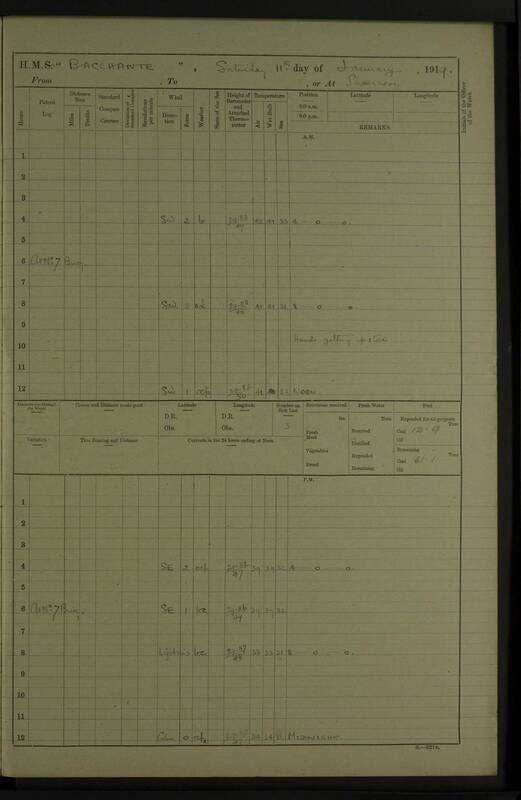 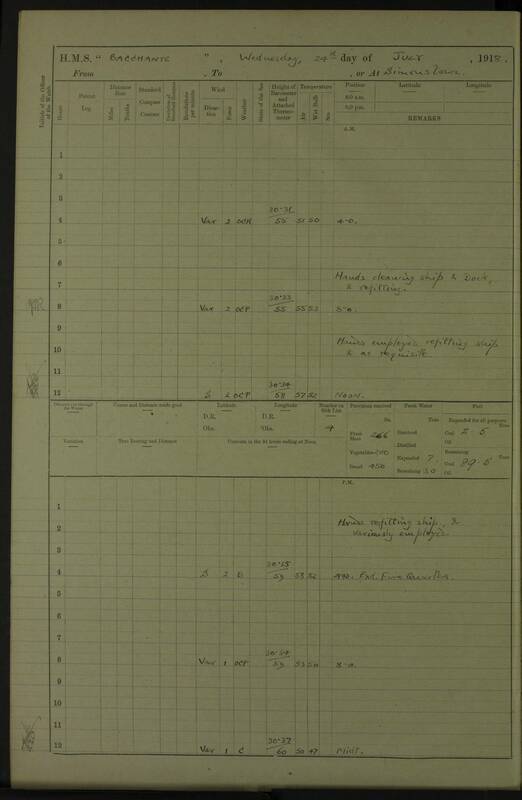 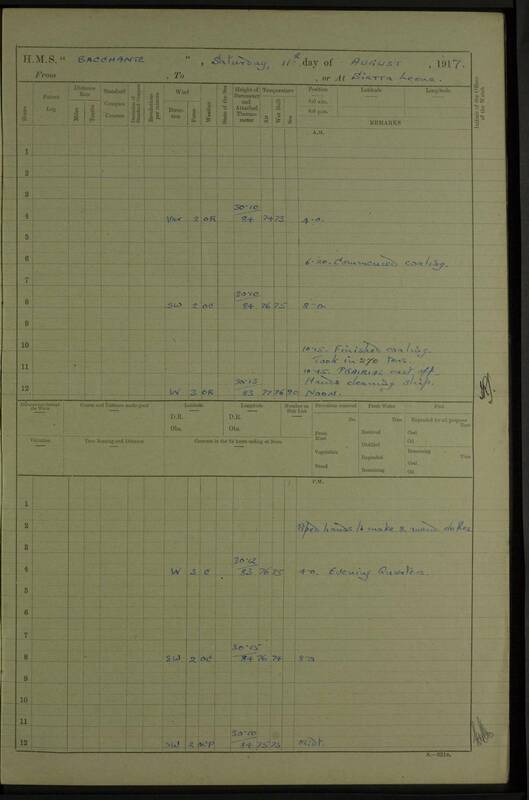 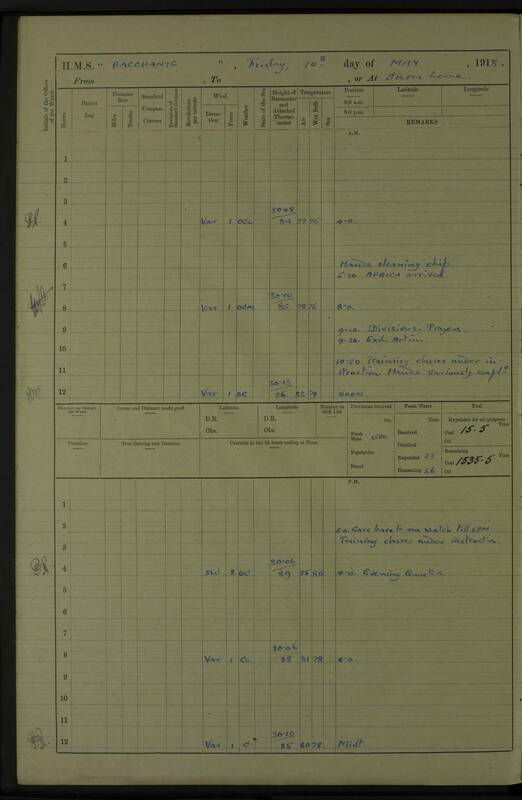 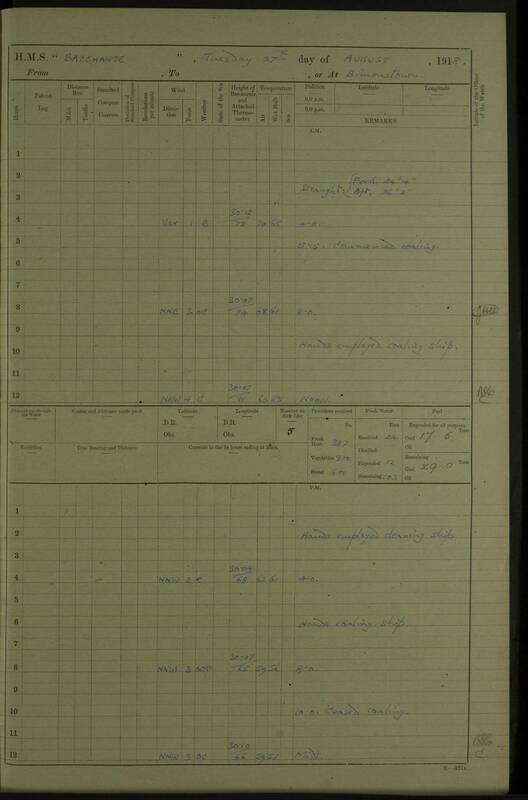 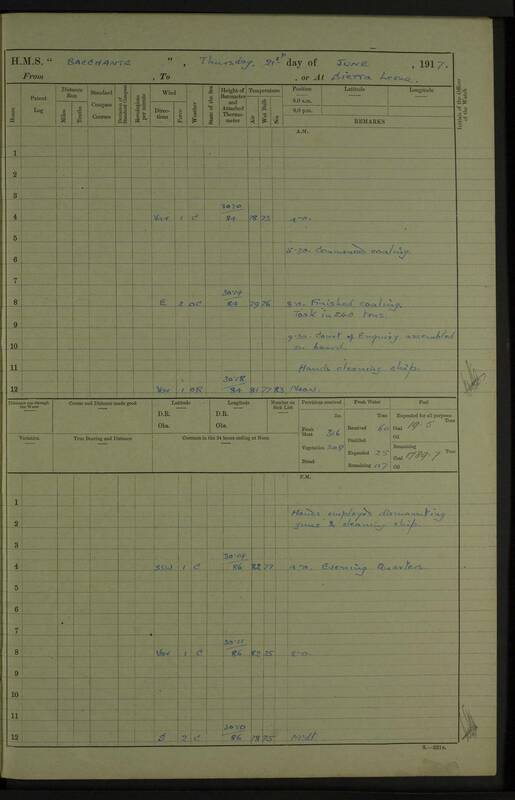 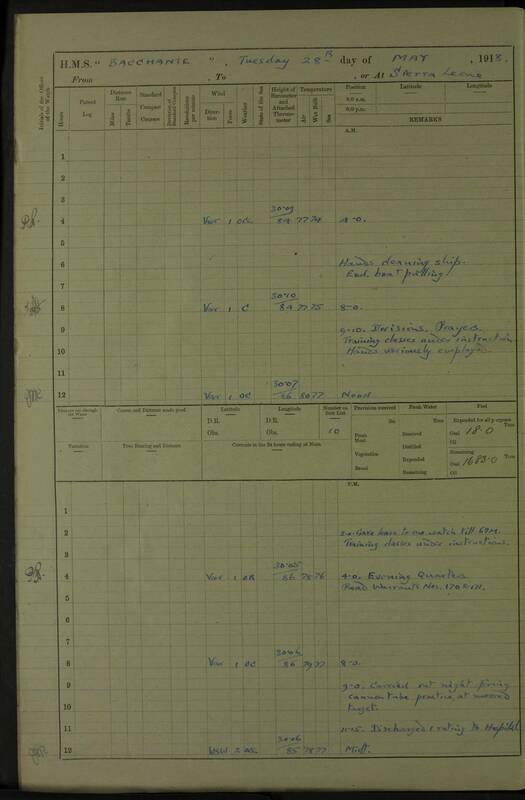 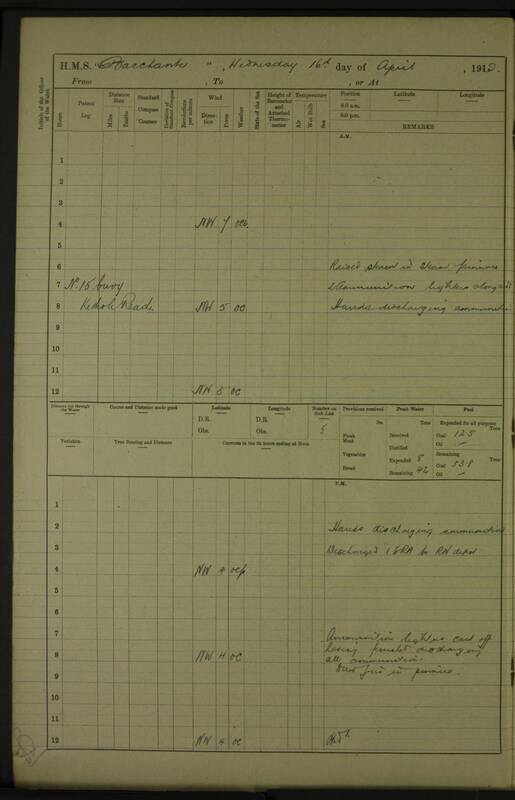 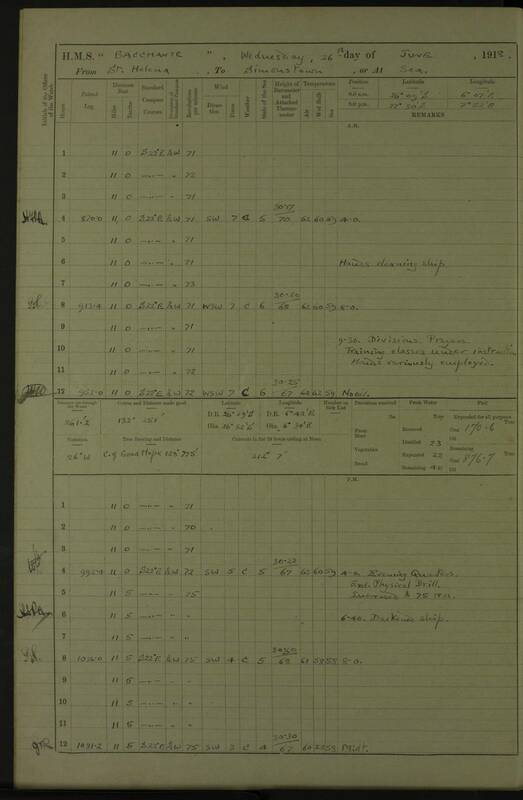 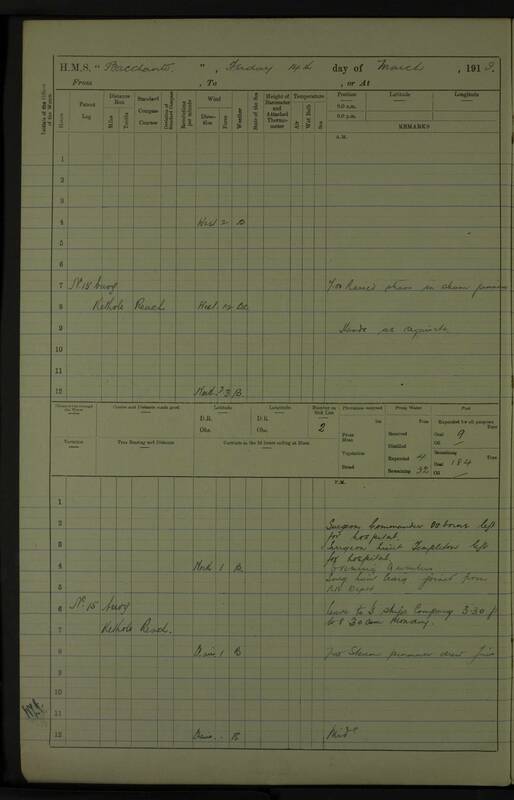 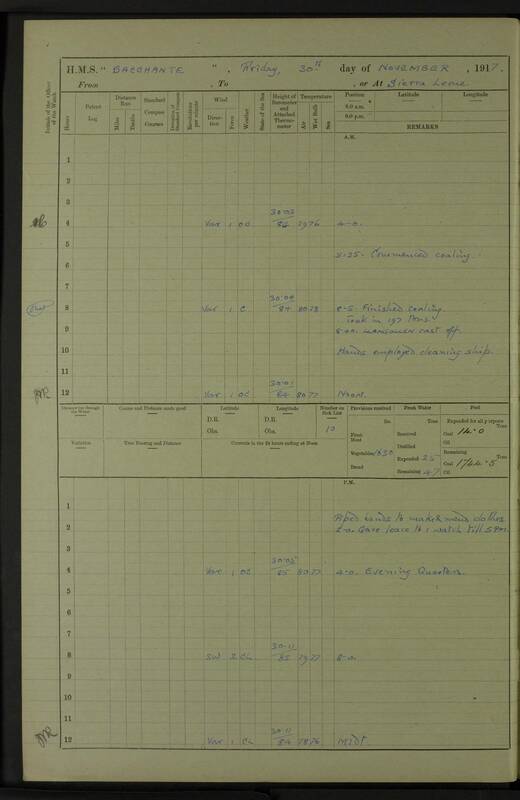 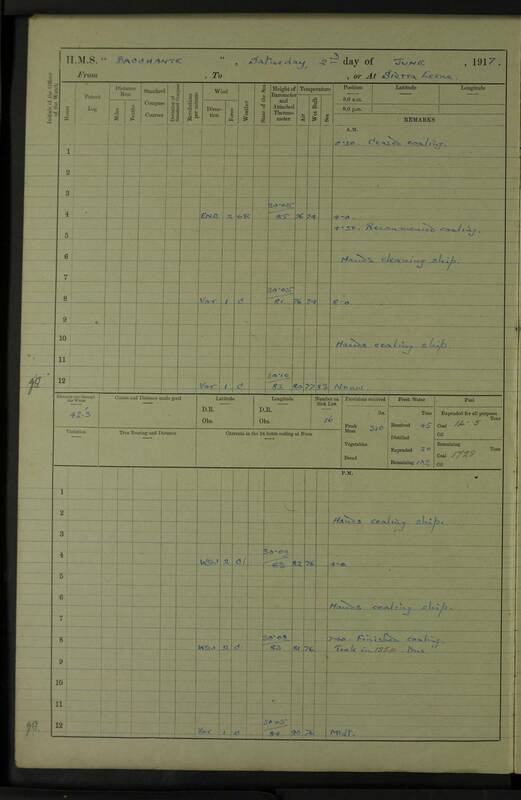 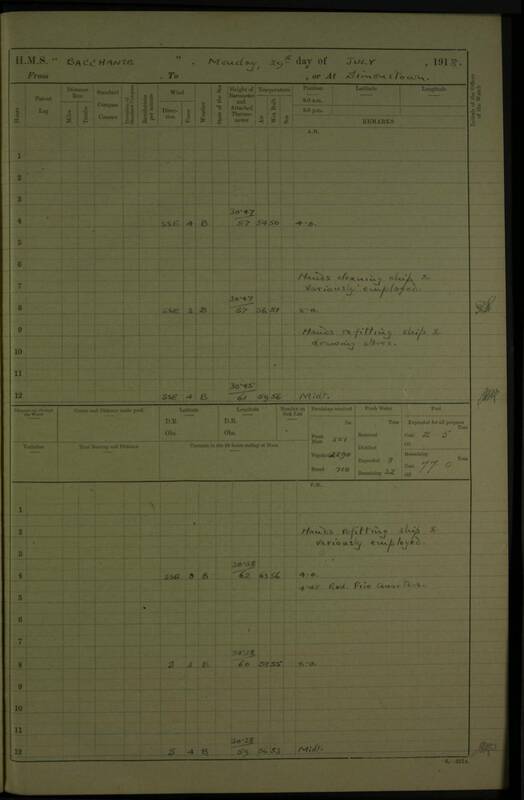 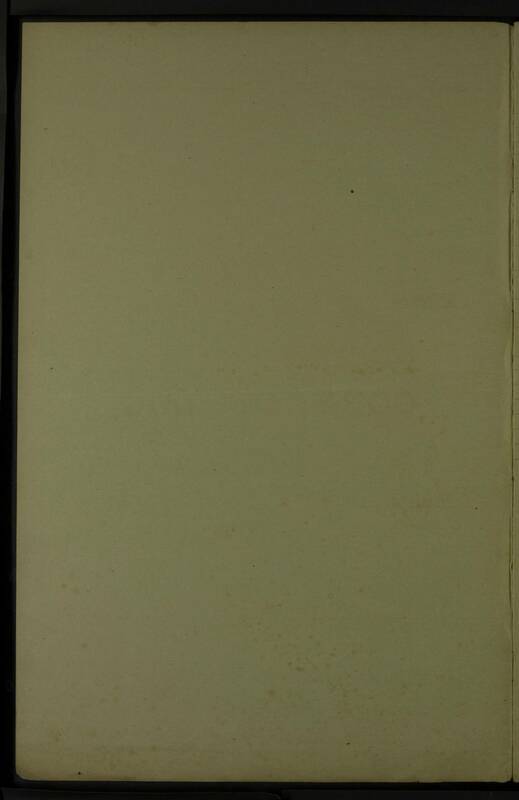 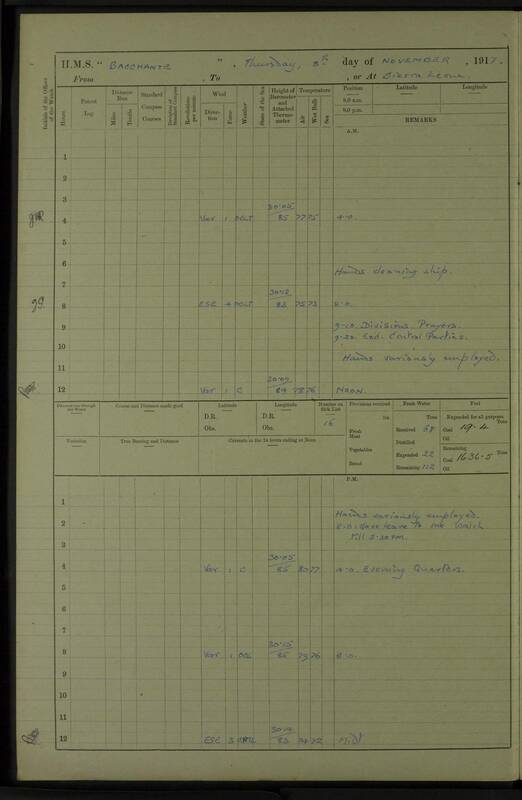 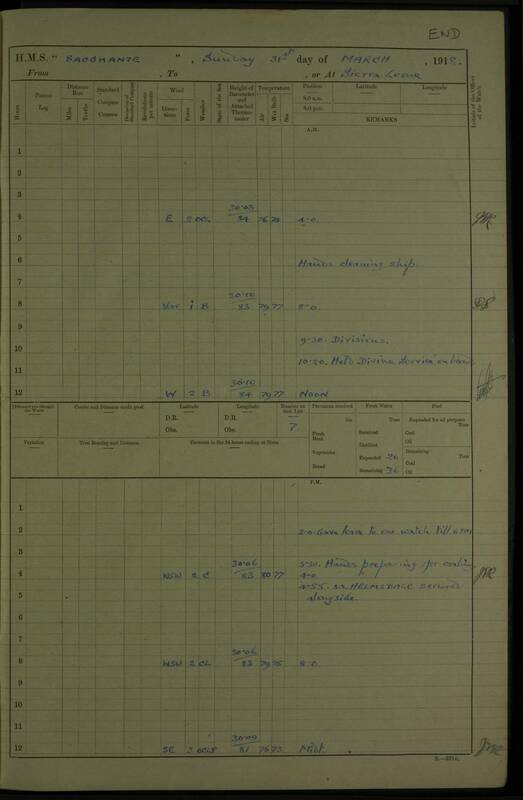 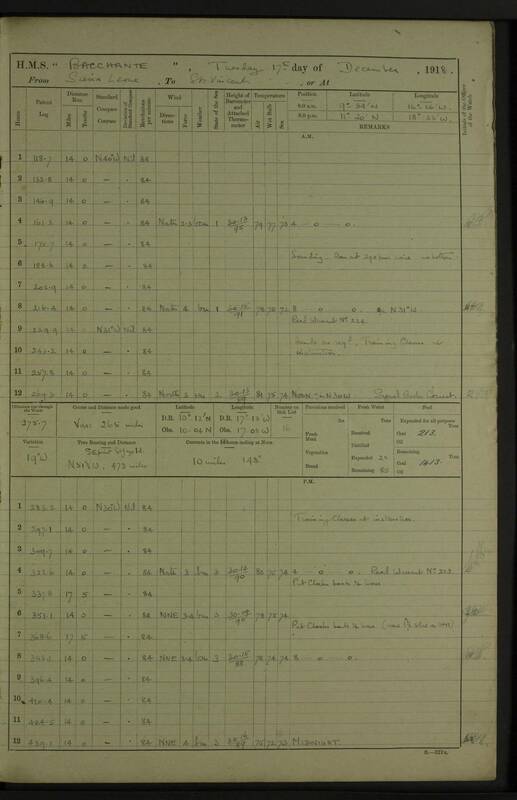 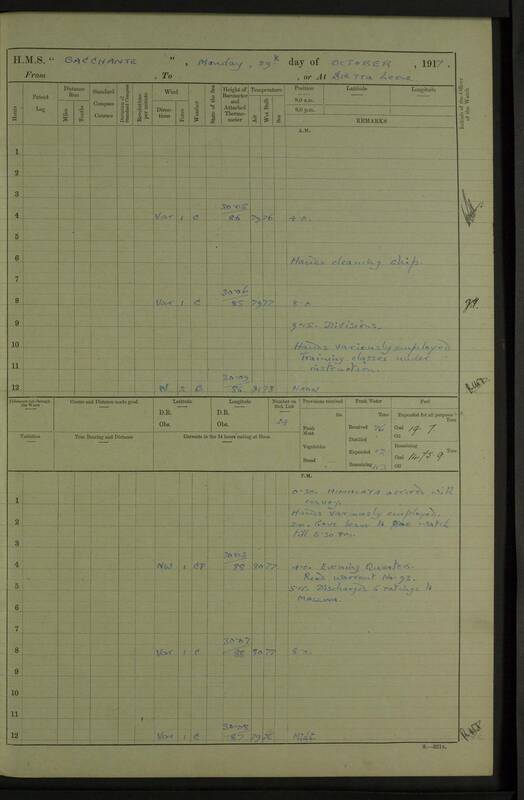 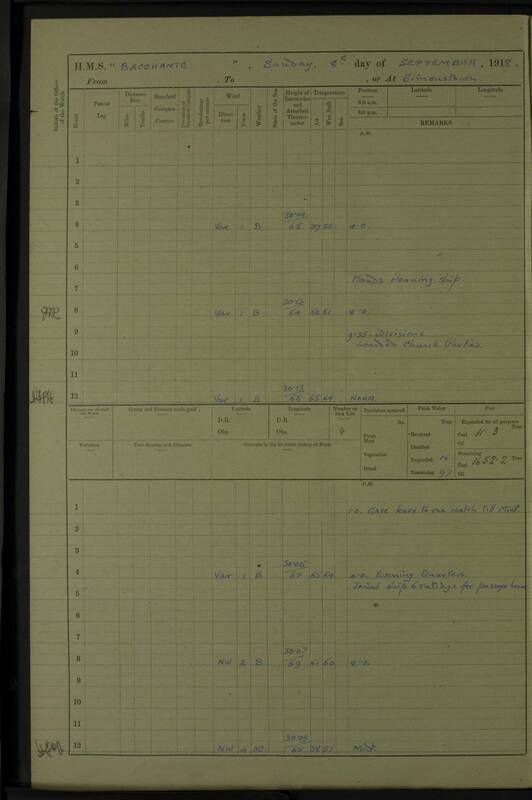 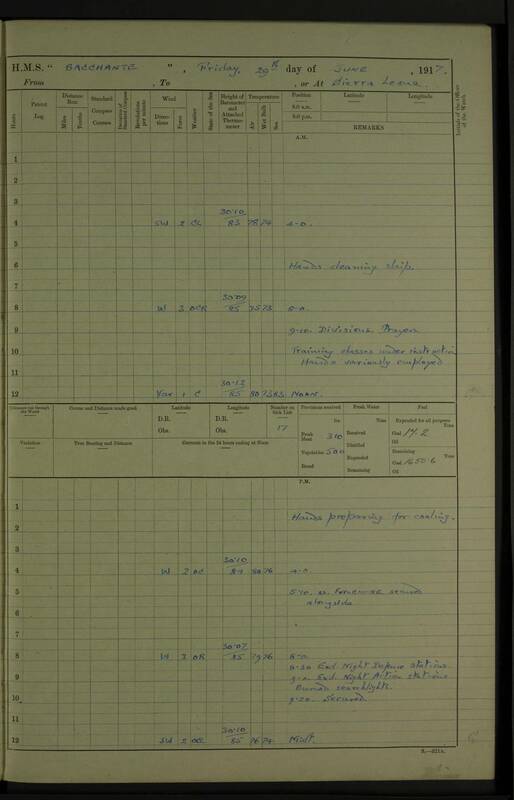 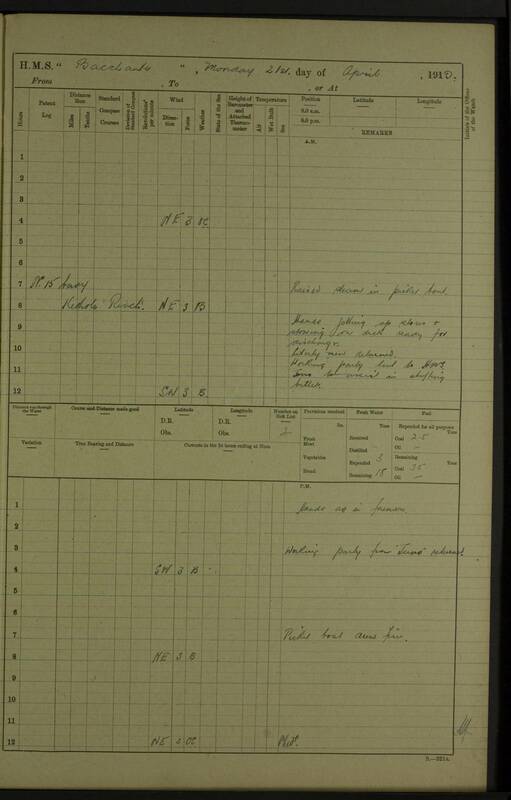 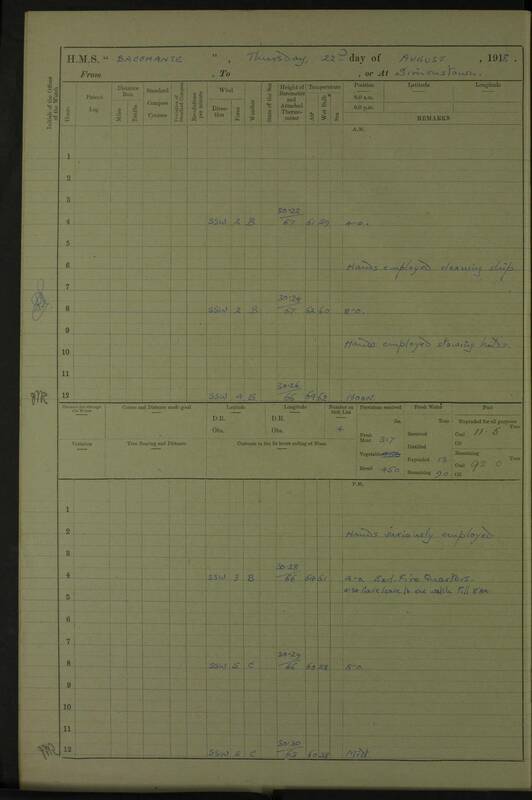 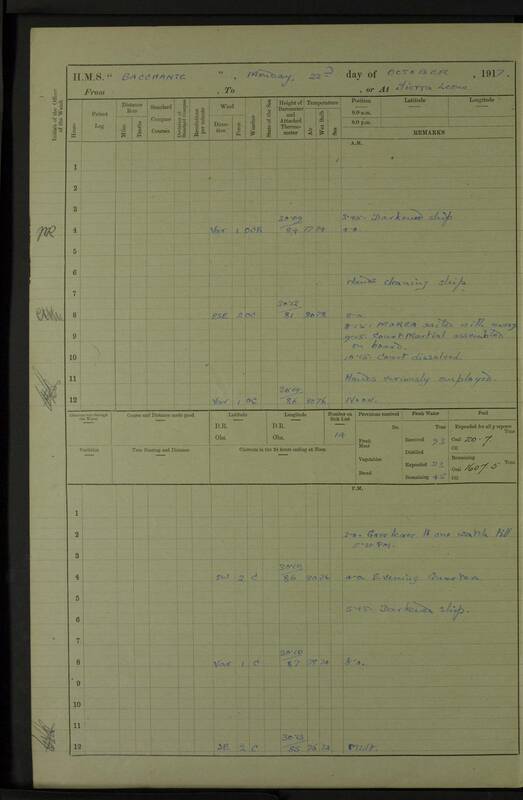 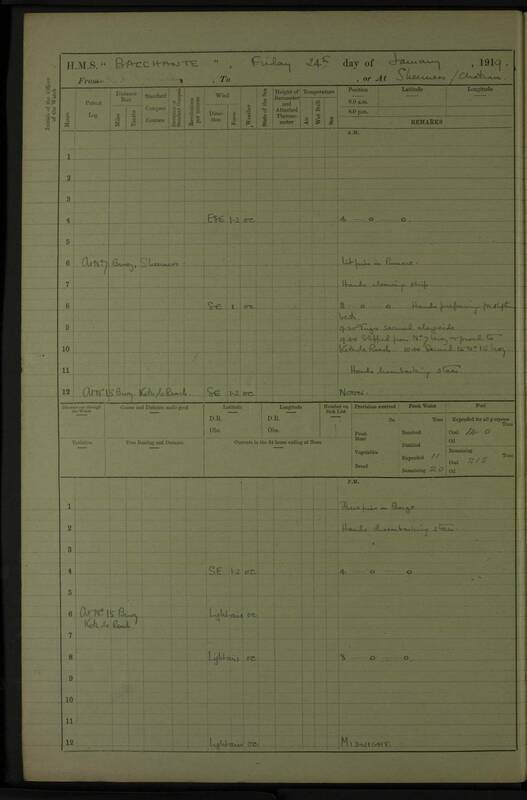 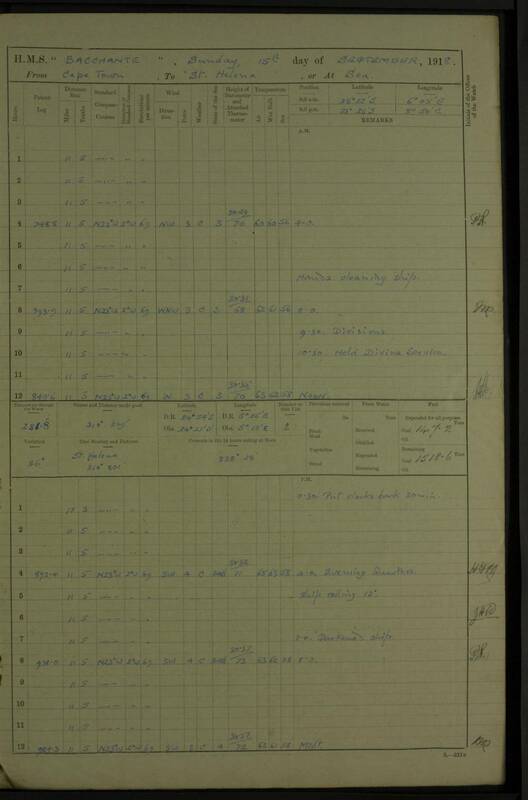 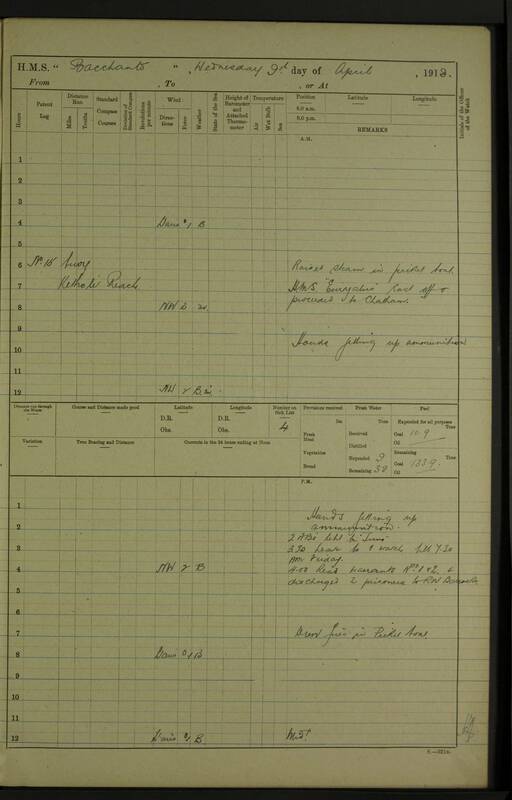 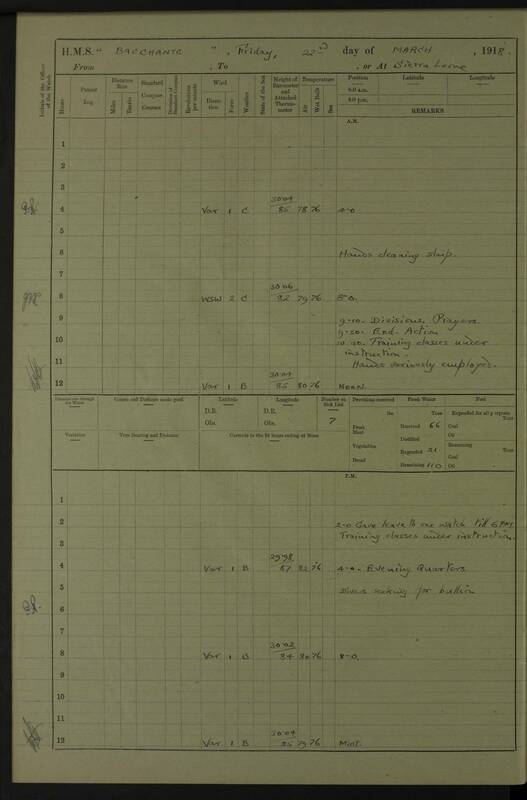 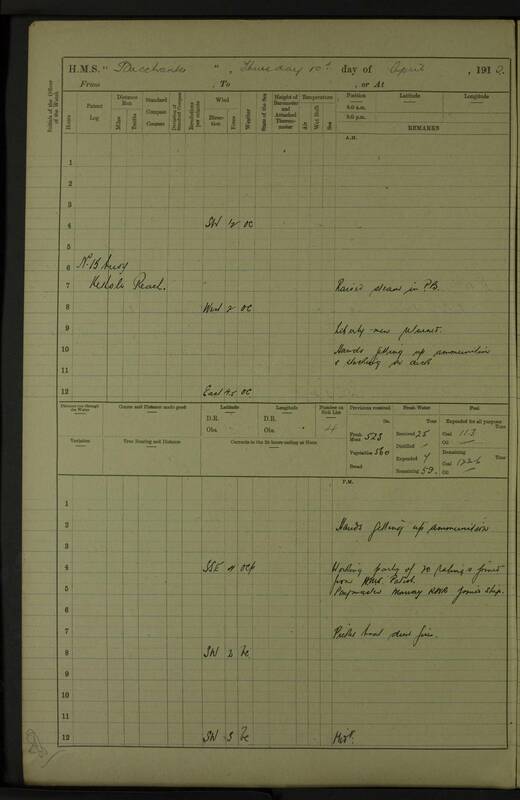 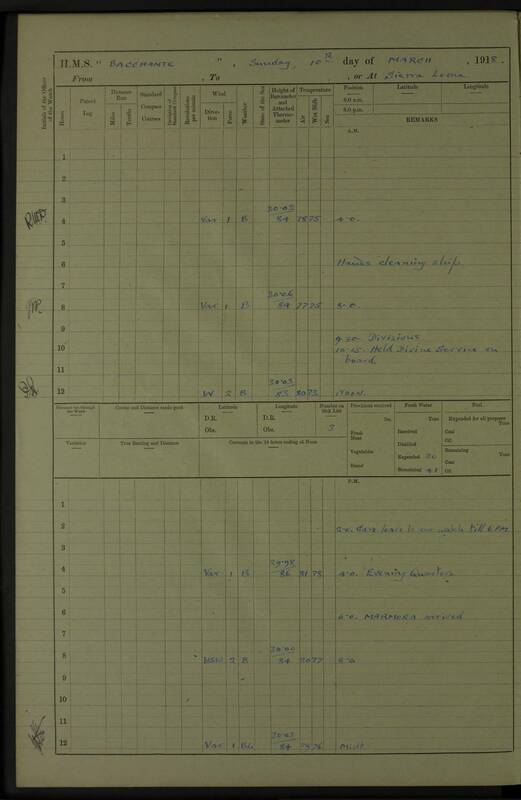 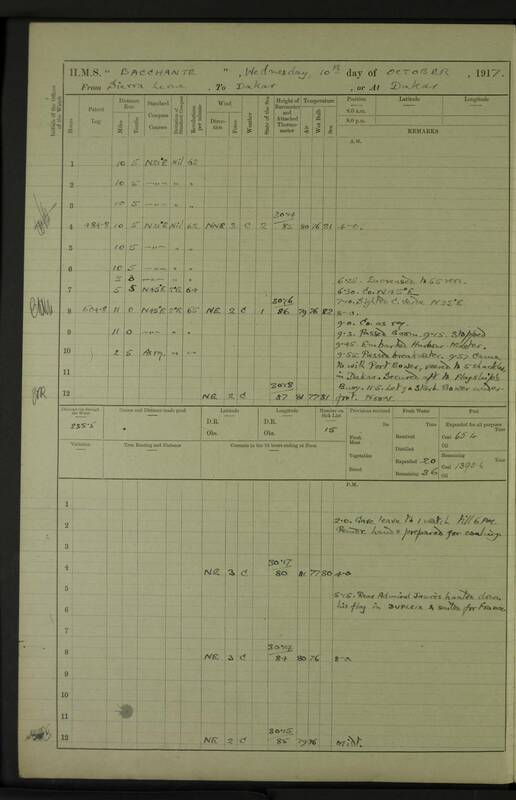 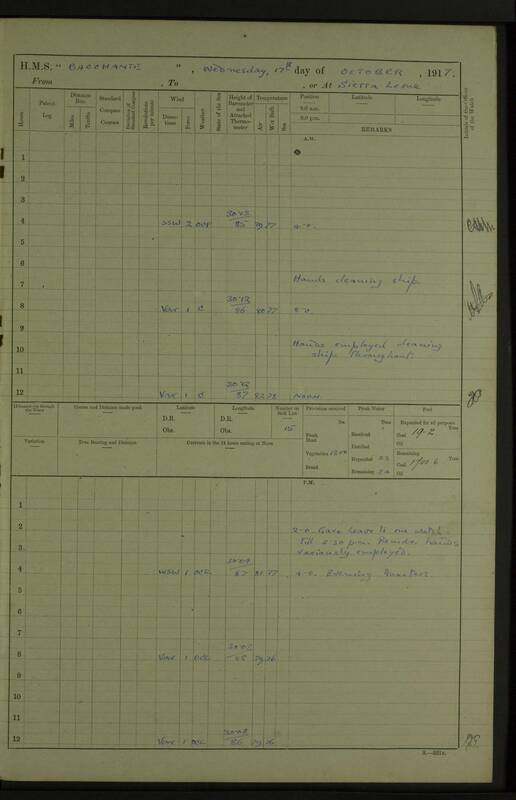 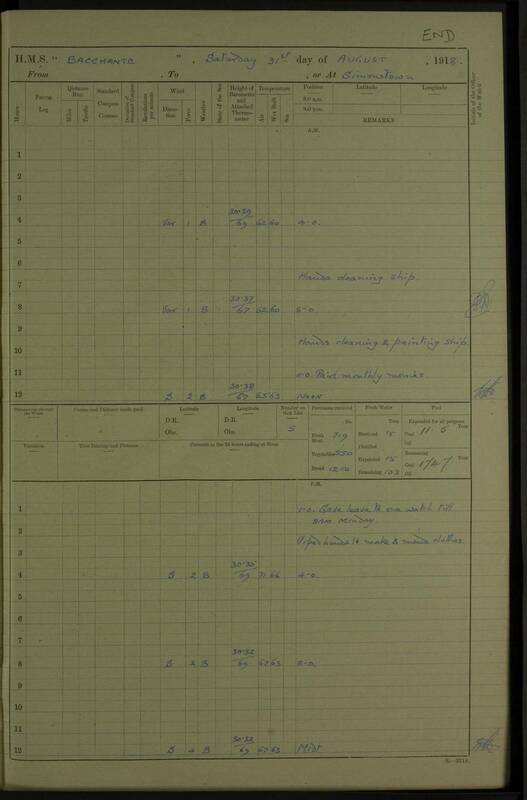 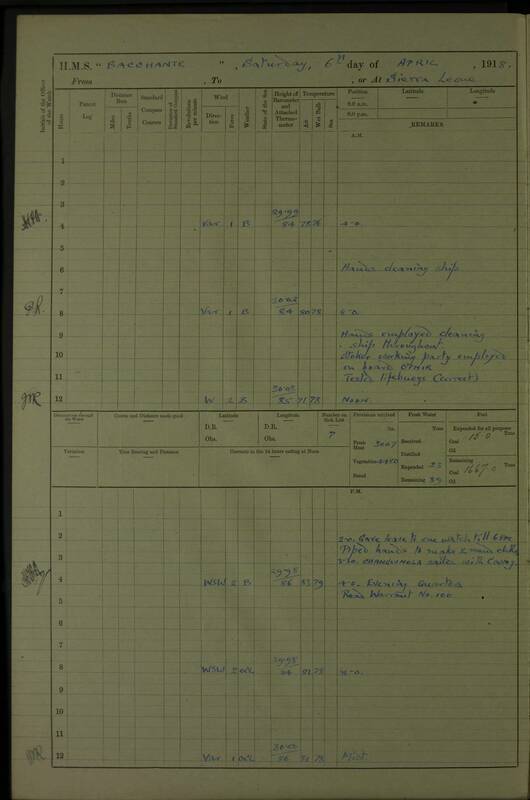 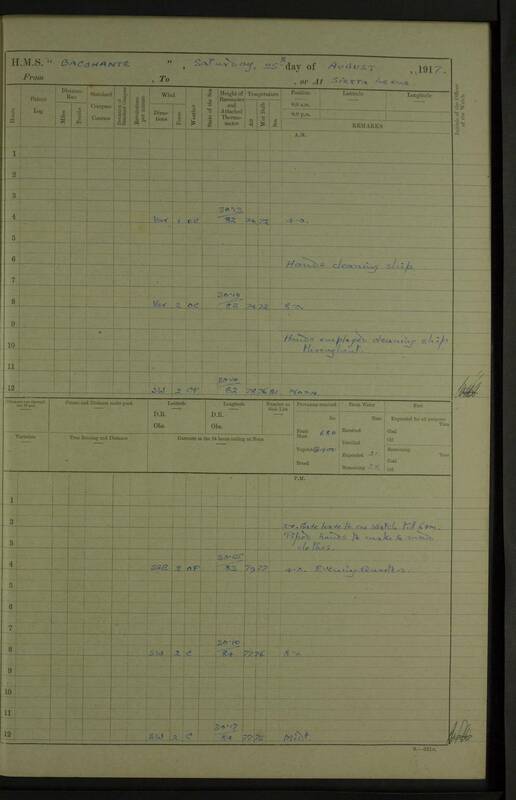 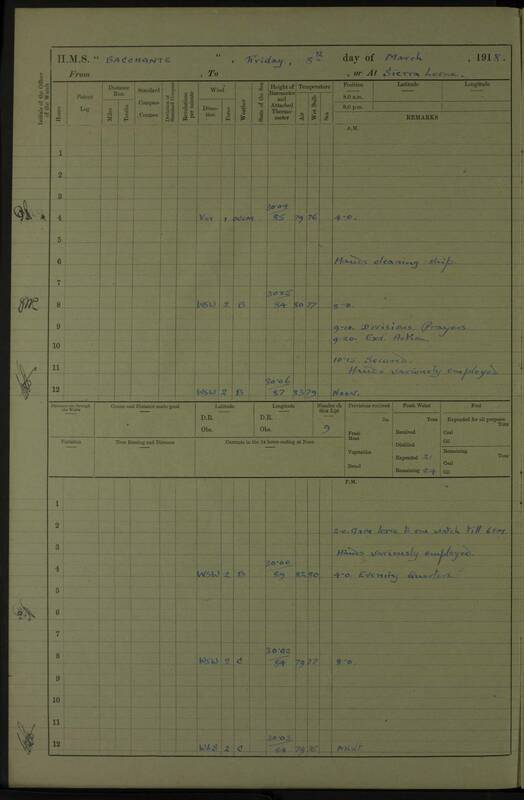 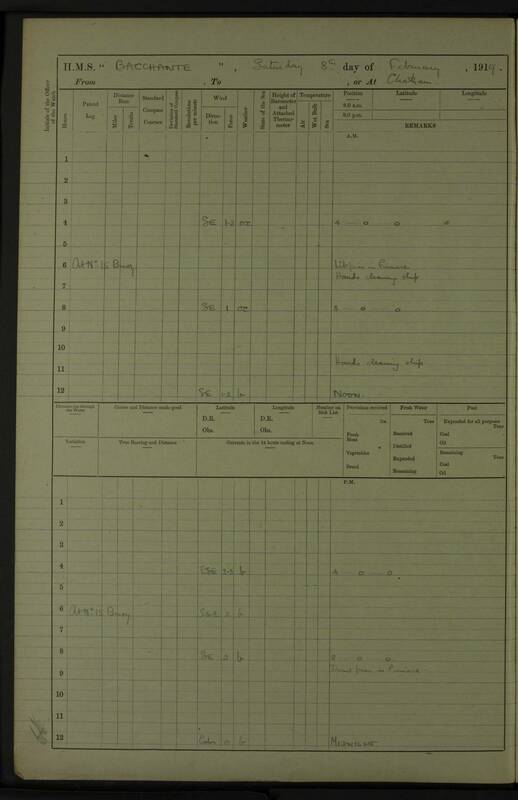 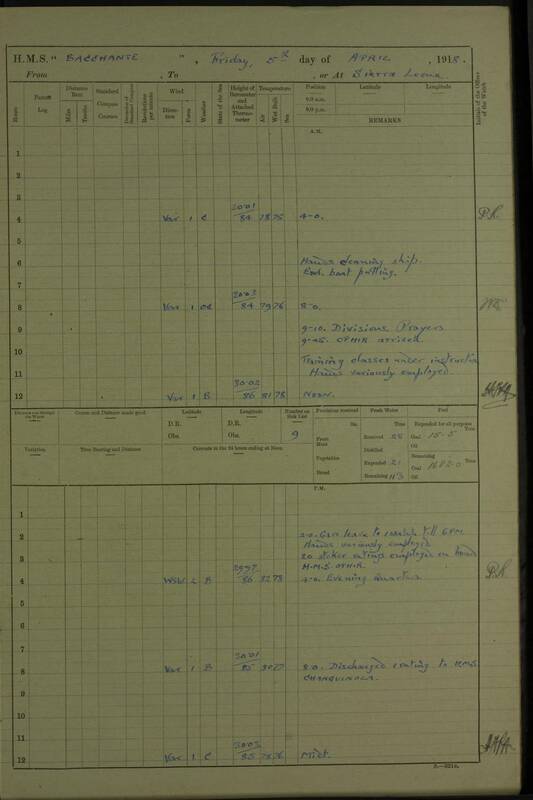 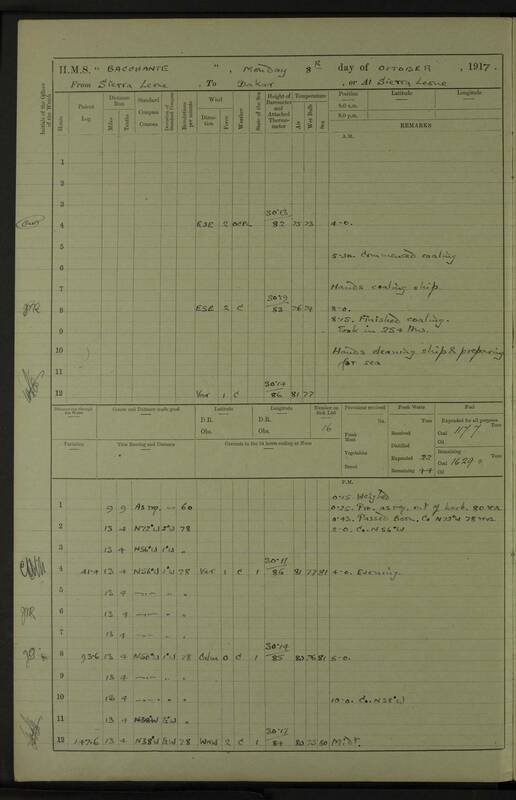 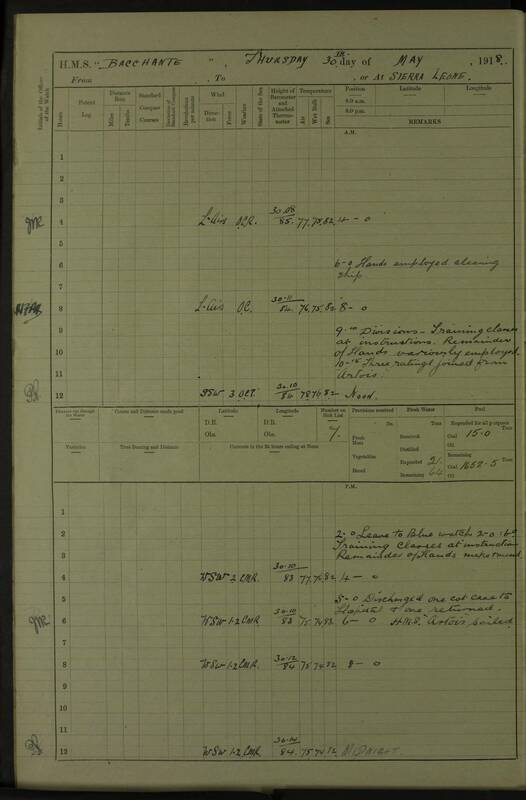 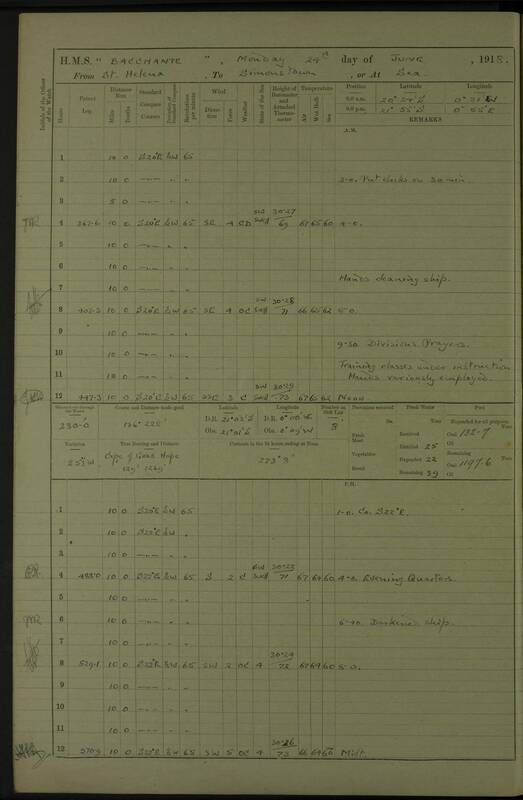 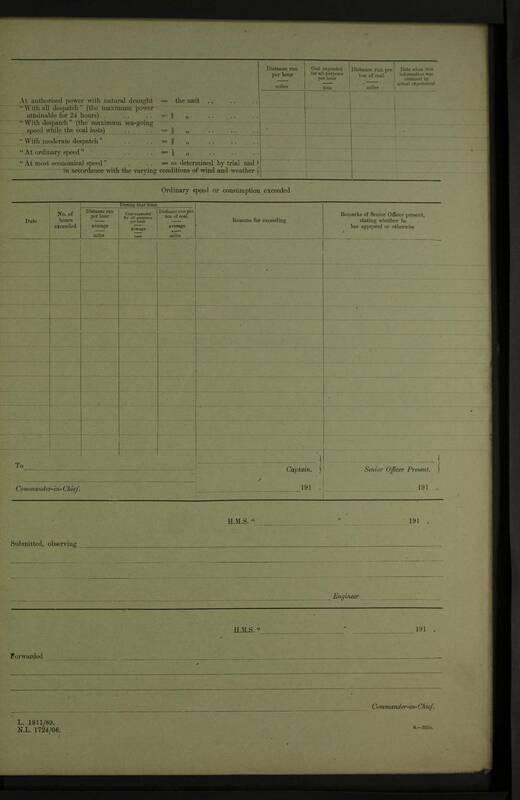 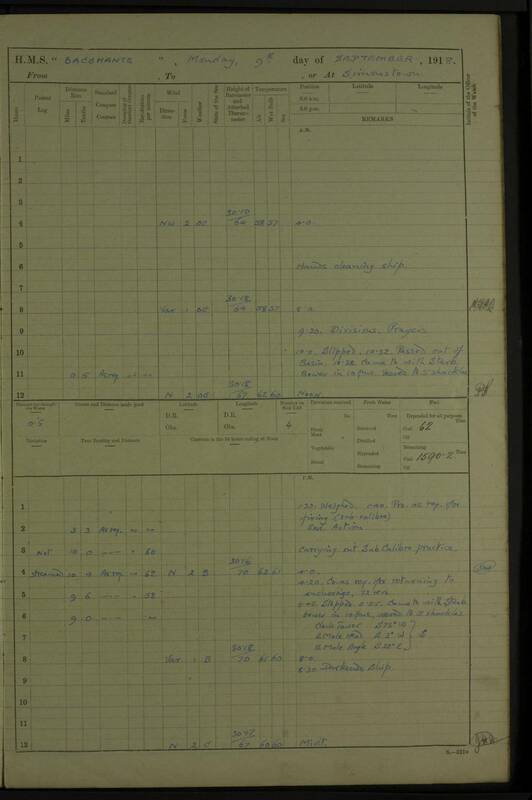 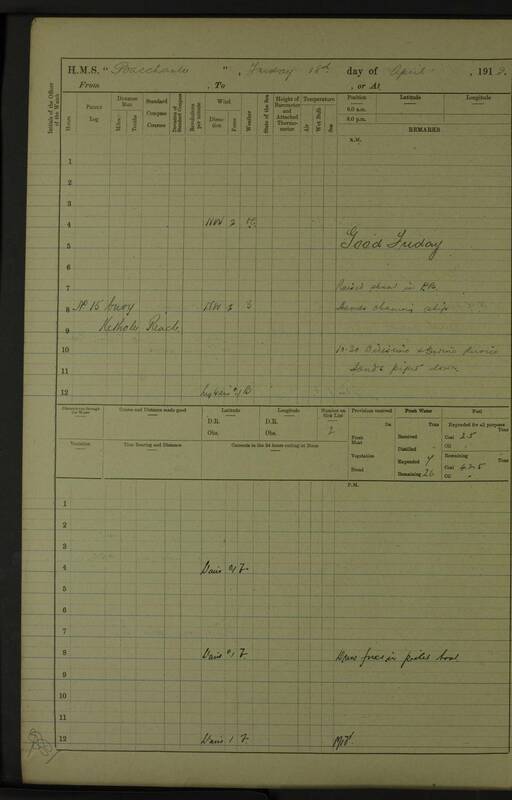 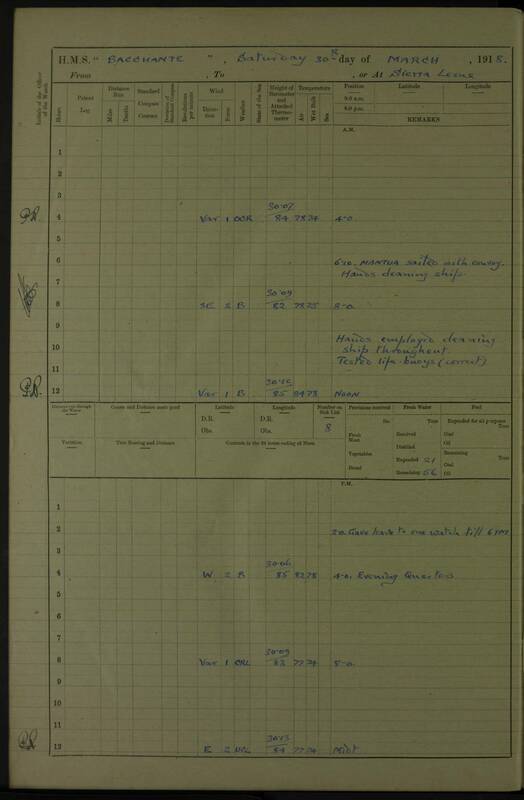 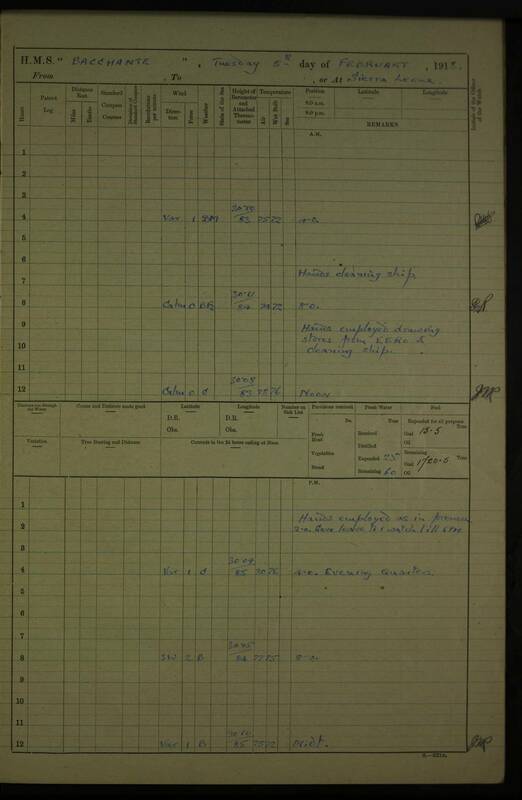 Log page mis-labelled as 20 October 1917. 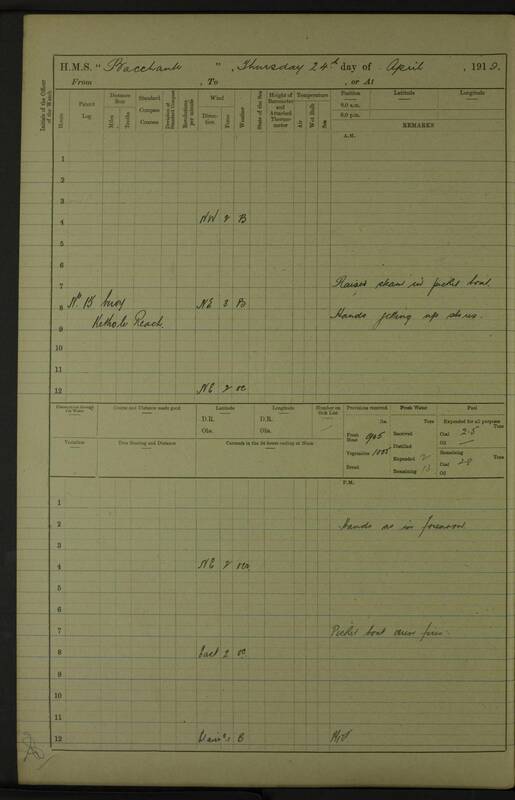 3.30 pm: ARMADALE CASTLE arrived with convoy. 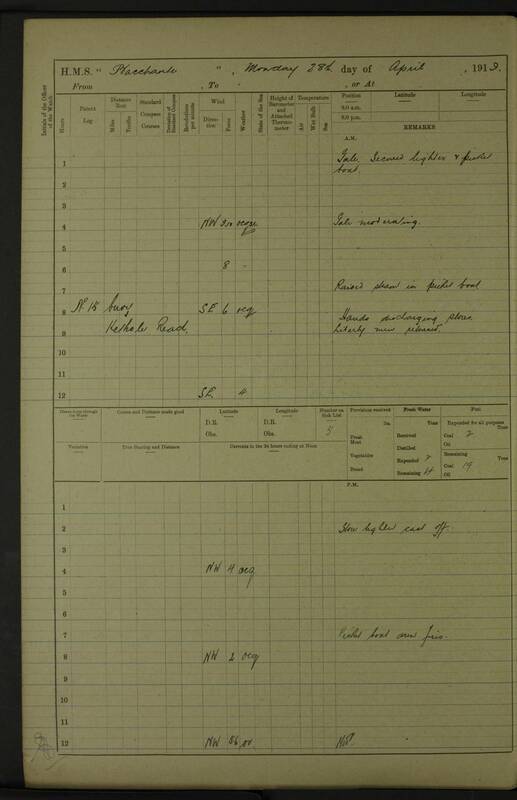 2.00 pm: KILDONAN CASTLE sailed with convoy. 5.35 am: Commenced coaling; 7.50 am: coaling completed; 8.25 am: TREVANION cast off. 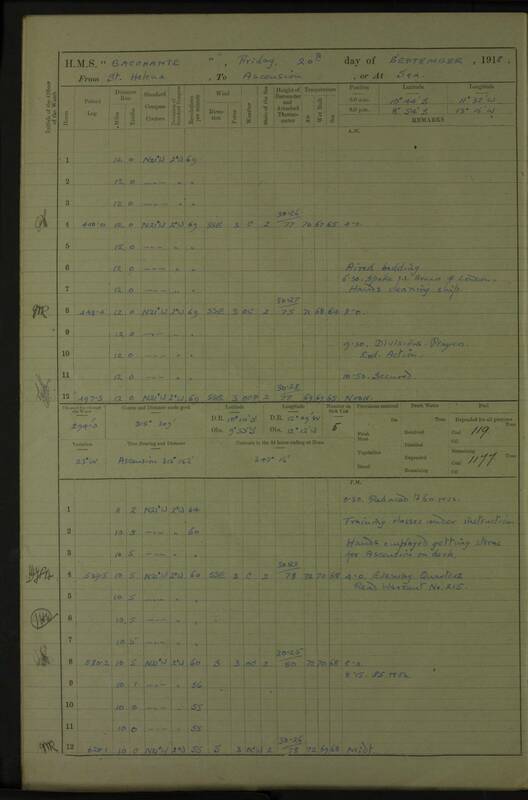 am: Hands employed hoisting up and disembarking 9.2” cordite. 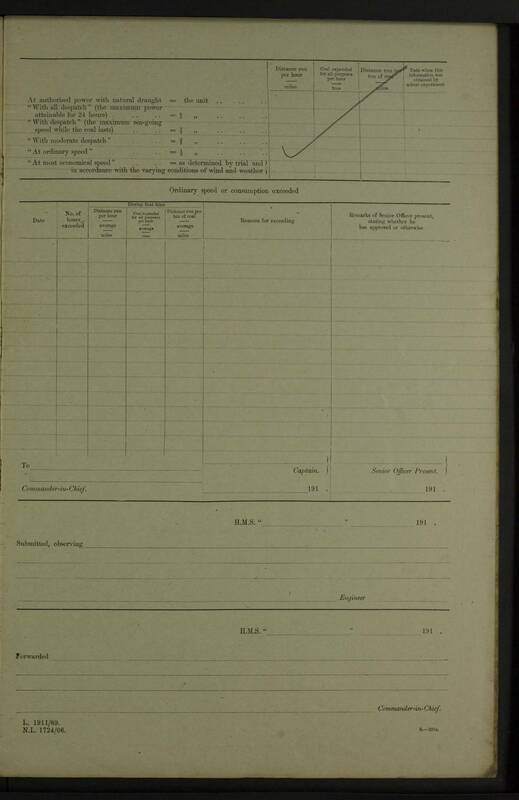 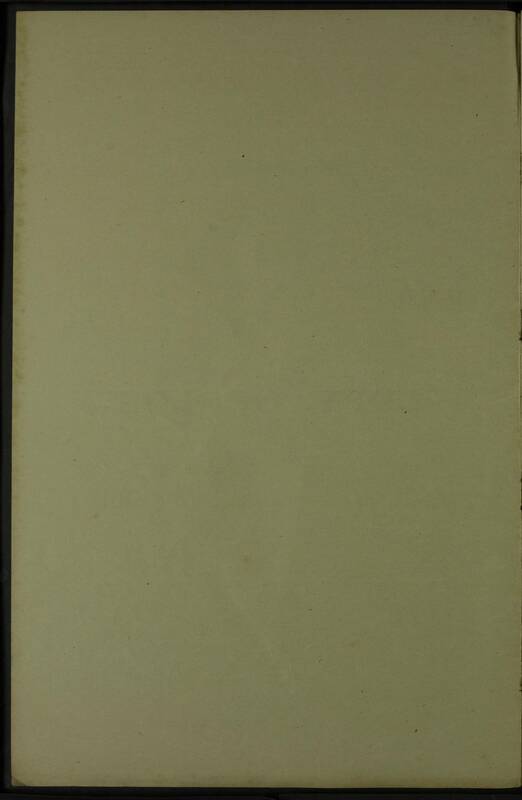 pm: Lieutenant Cecil H. Mee RNR: admonished by captain for (a) neglect of his duty in not immediately sending for important cypher telegram from ashore 29 December 1917, it being thereby delayed 2 hours; (b) inattention to his duties as O.O.W on various occasions reported by commander. 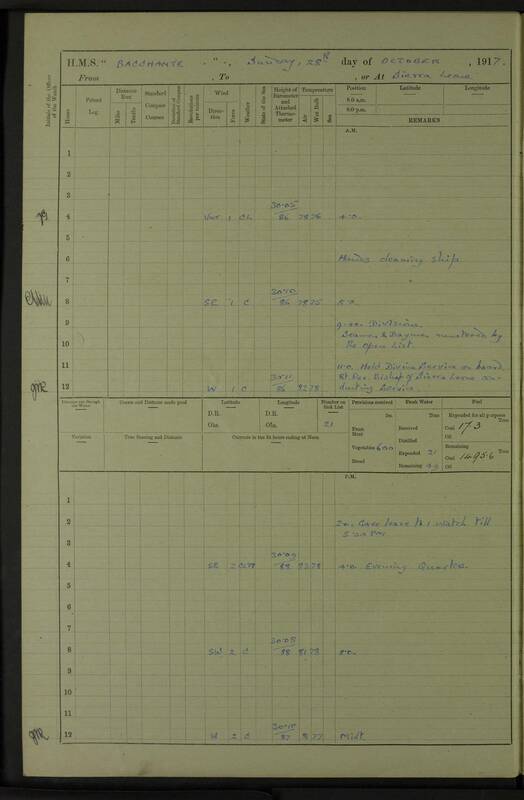 8.30 am: S.S. BOMBALA secured alongside and 1st Picket Boat Hoisted into it. 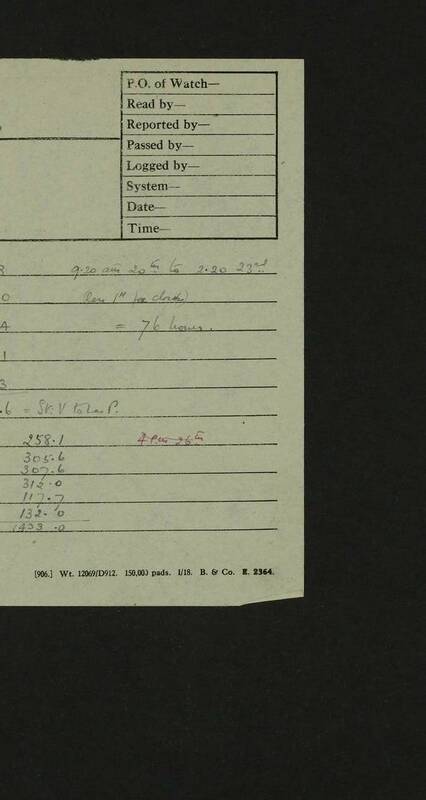 10.40 am: Carried out 12 Pdr. 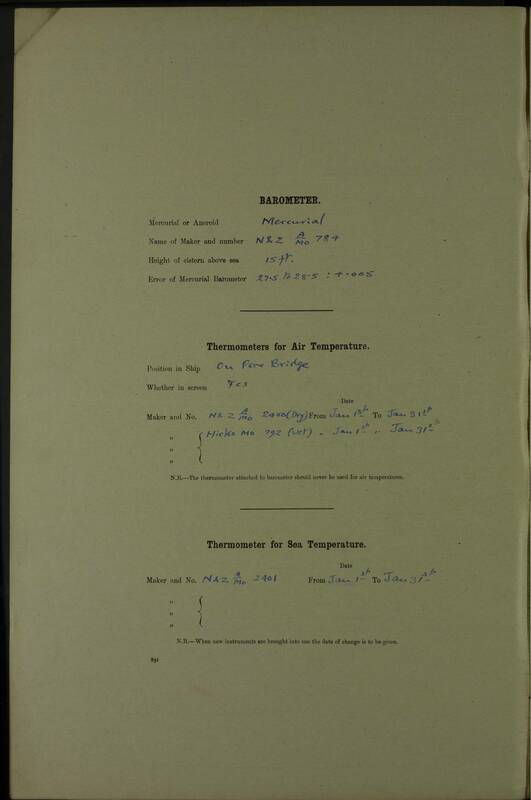 firing. 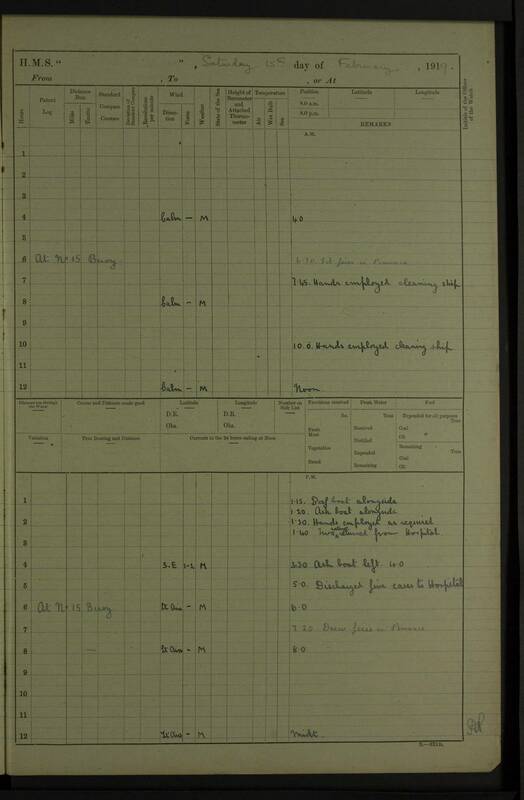 10.25 pm: BRITANNIA sailed with convoy. 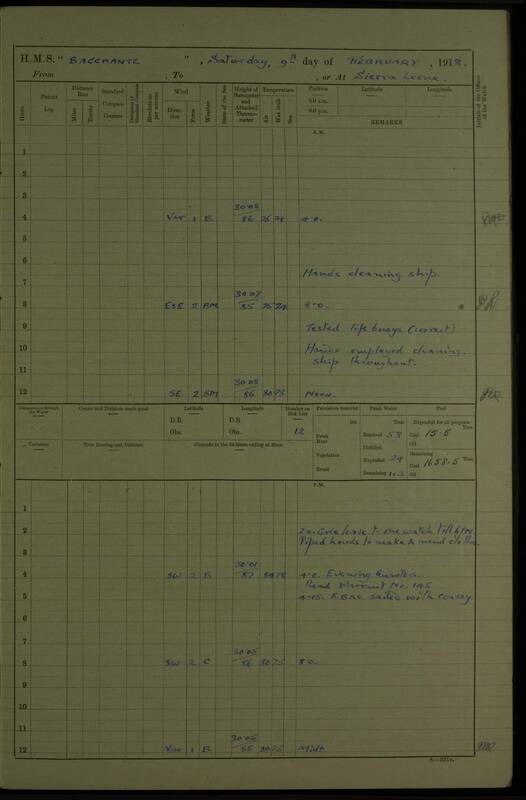 4.30 pm: S.S. GARDENIA secured alongside. 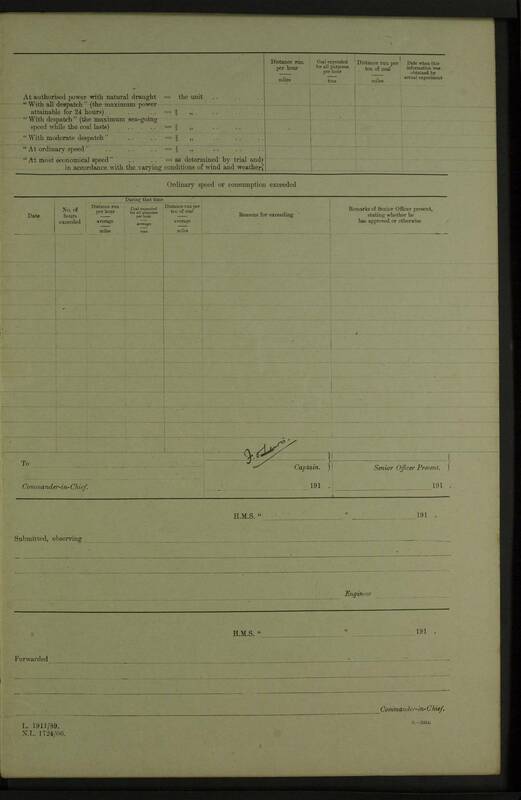 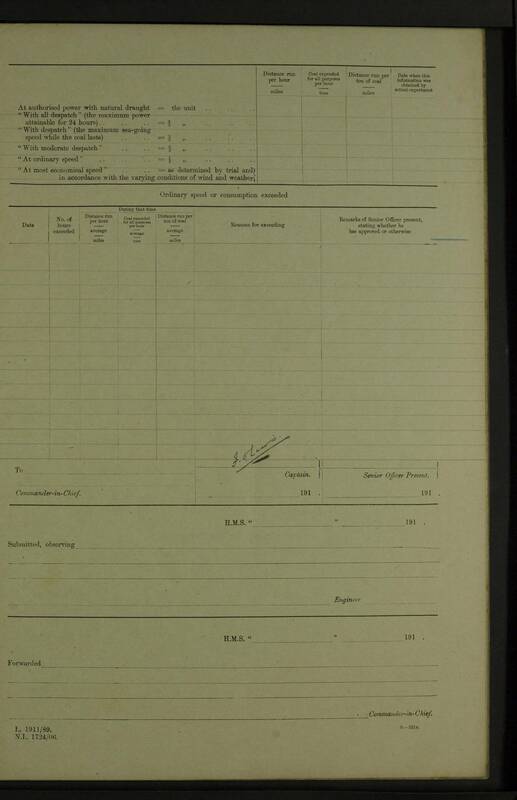 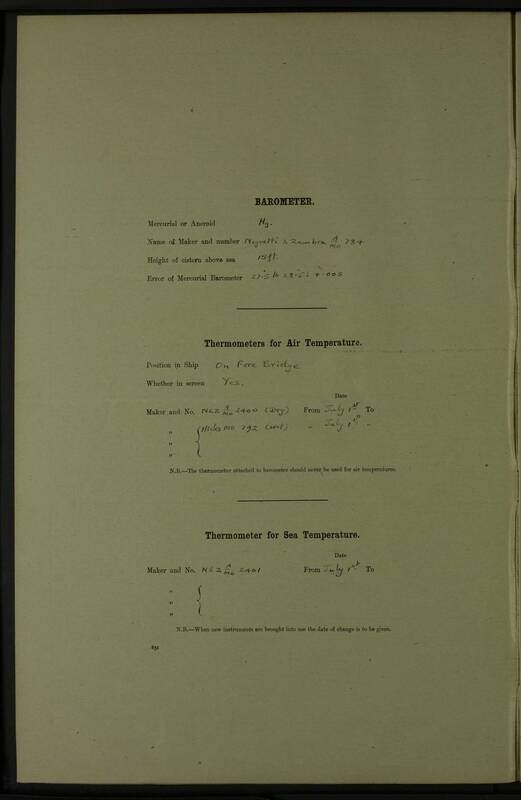 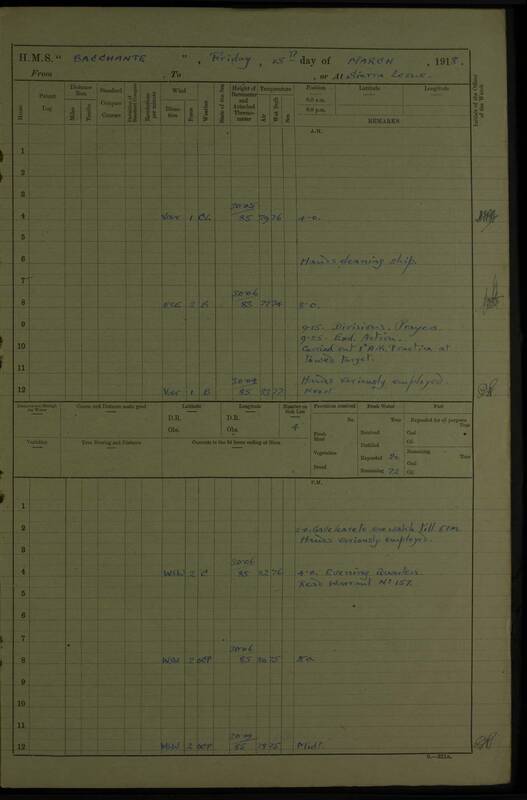 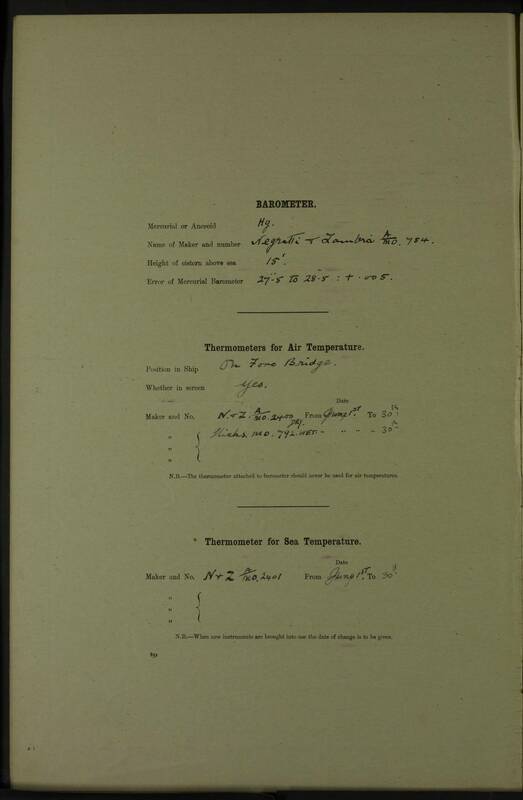 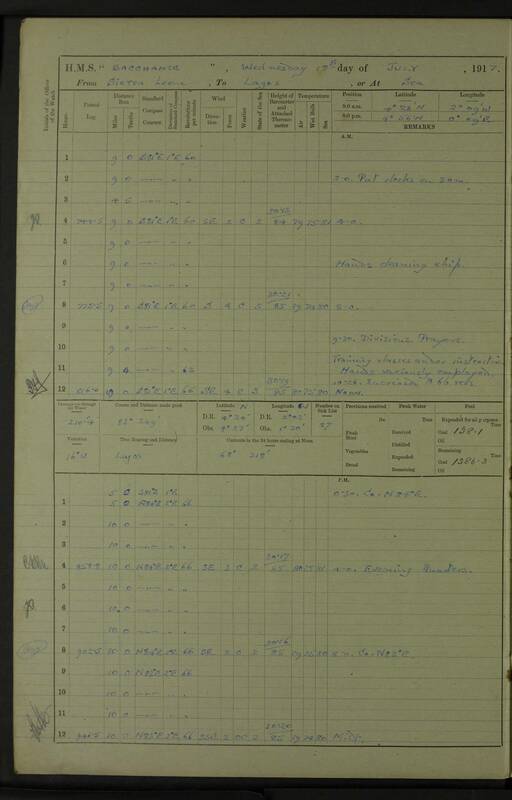 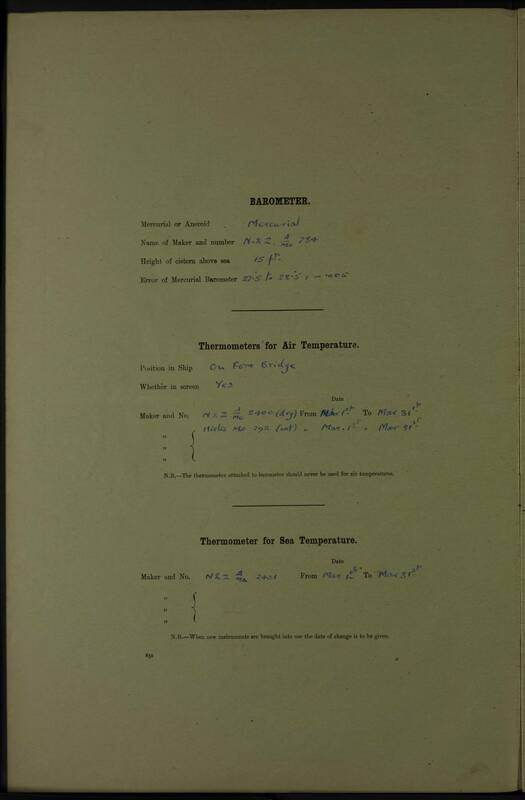 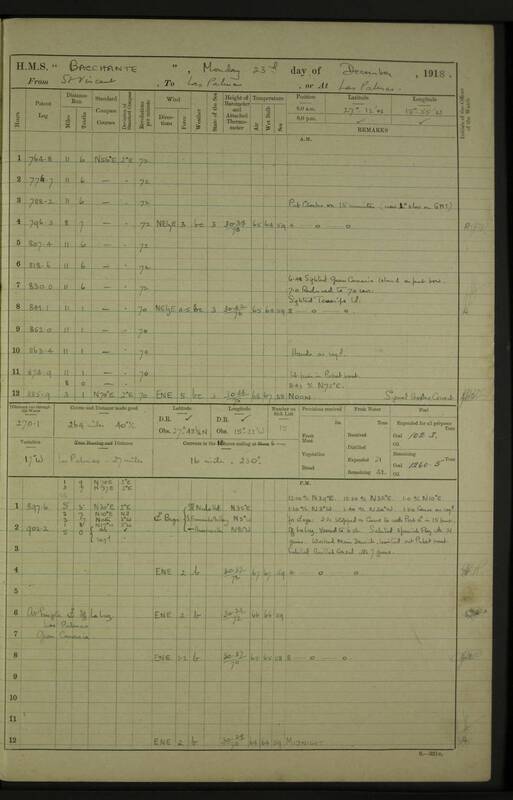 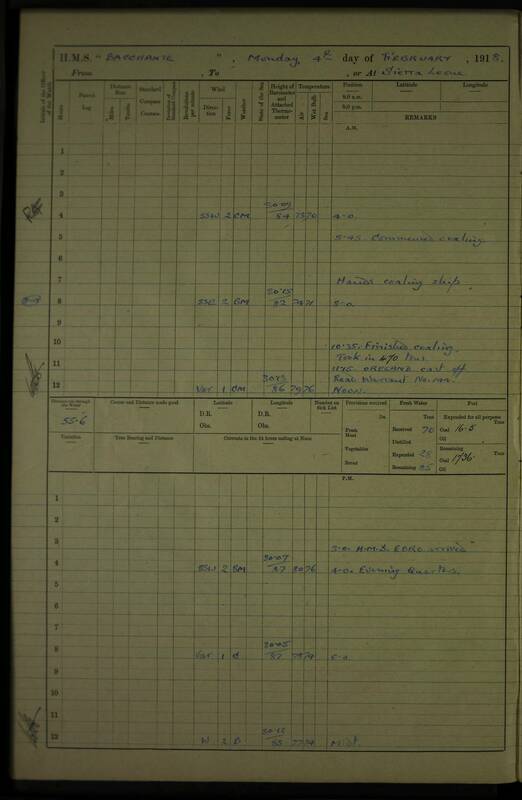 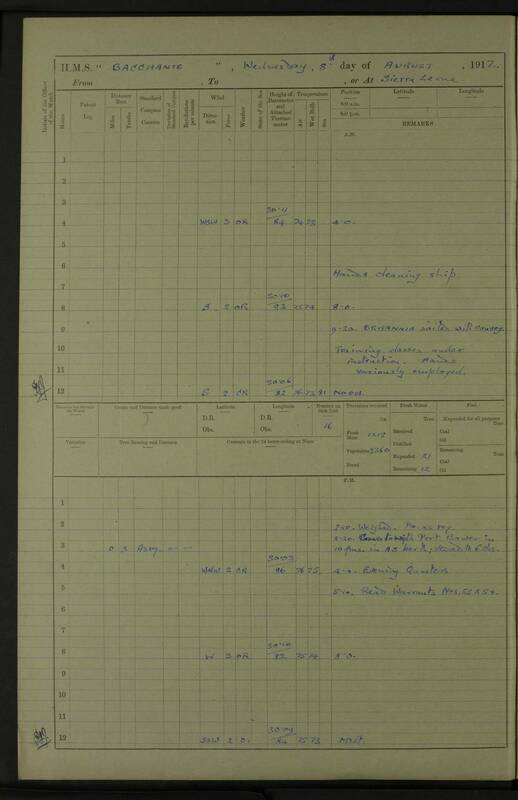 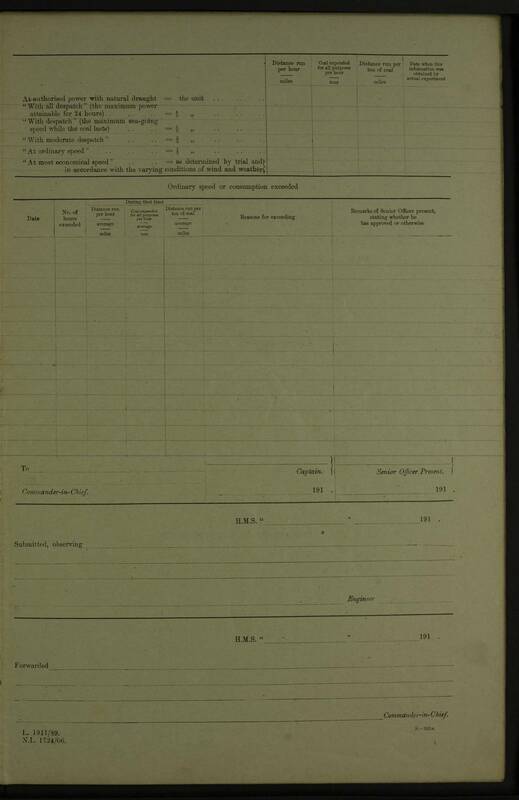 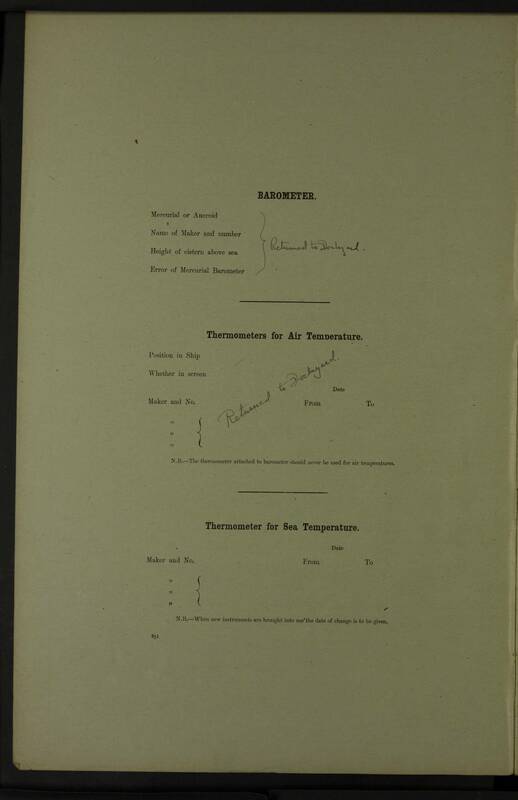 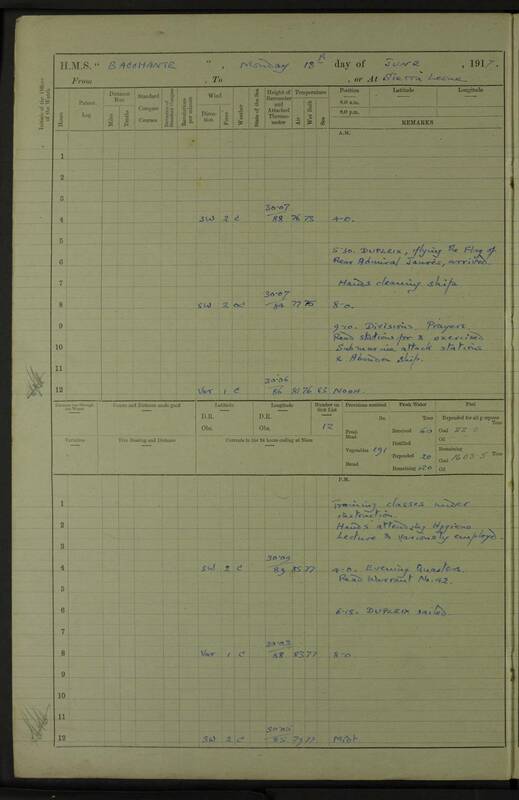 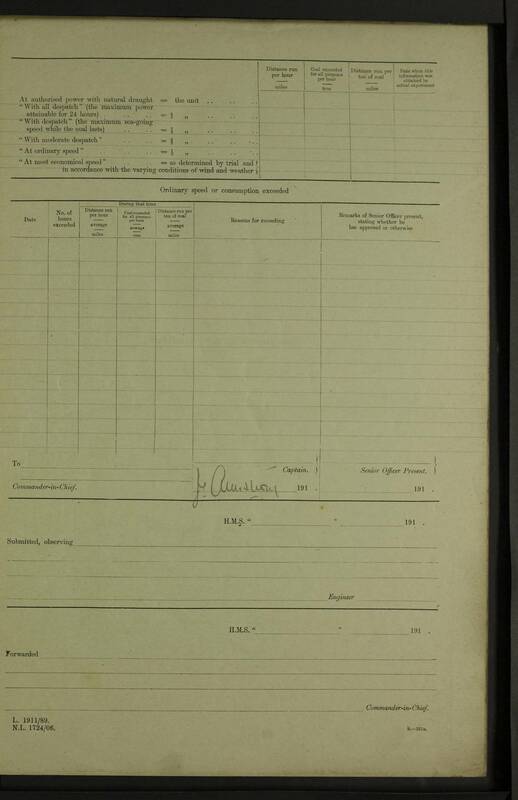 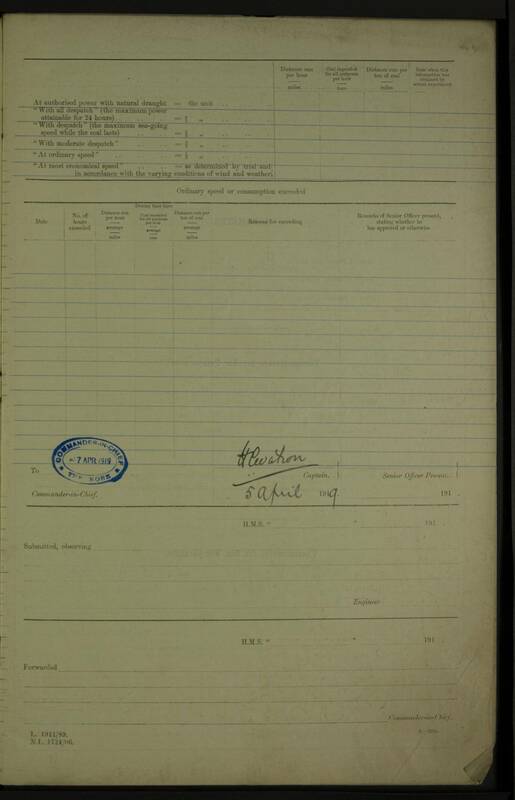 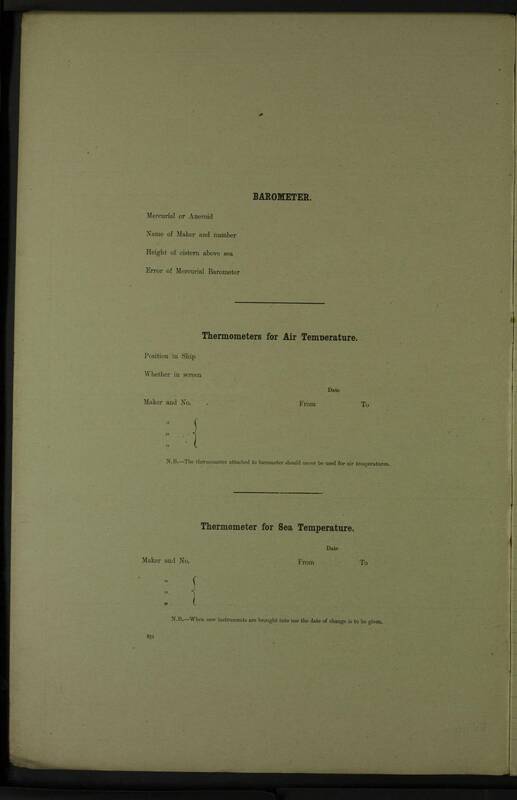 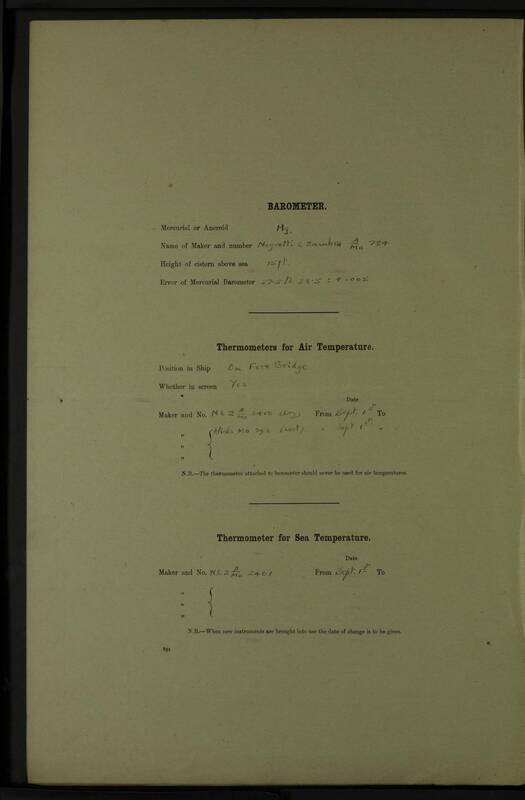 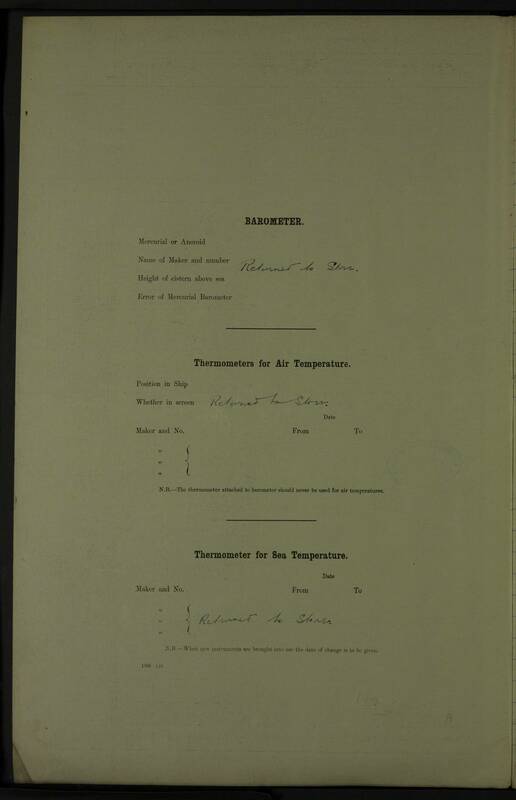 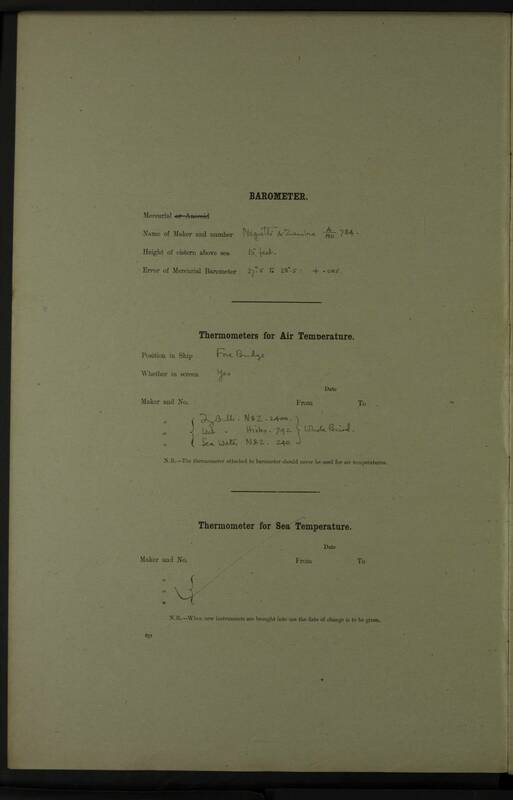 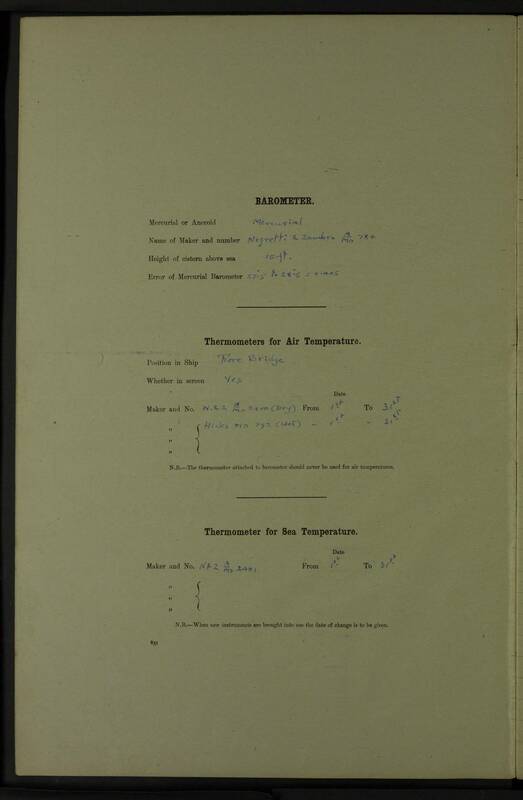 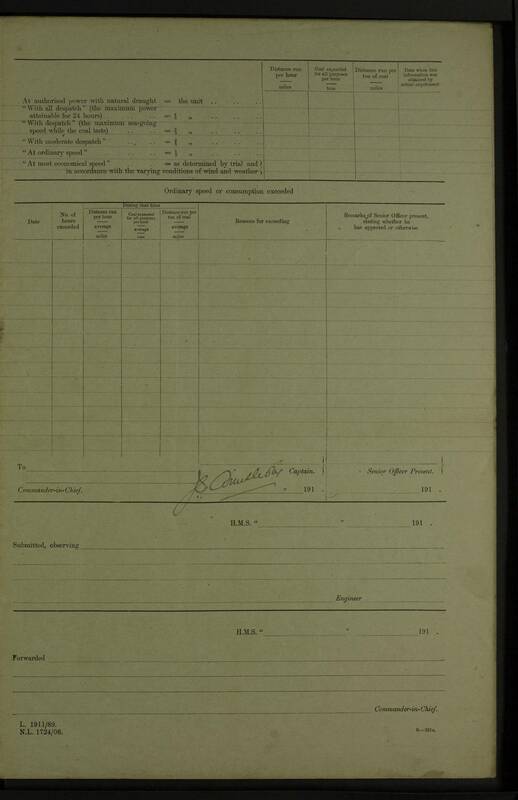 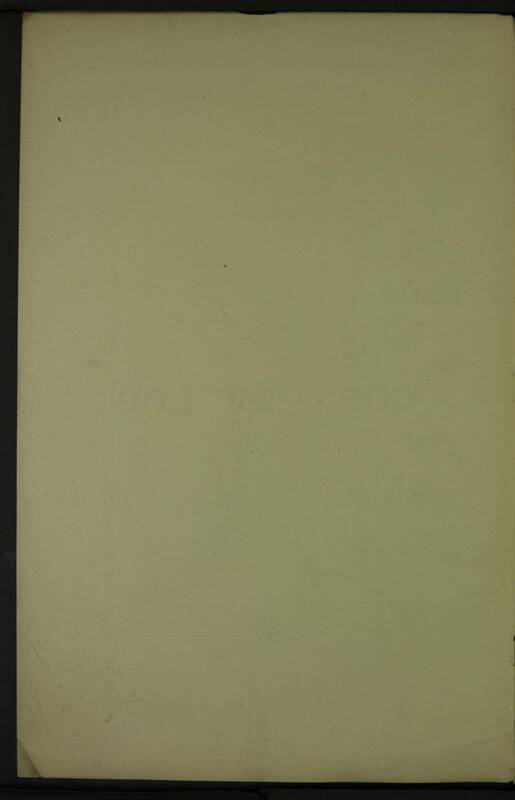 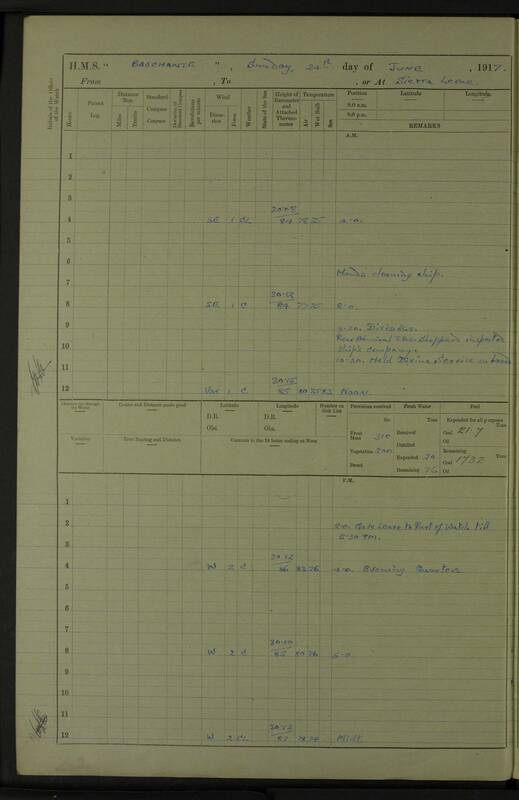 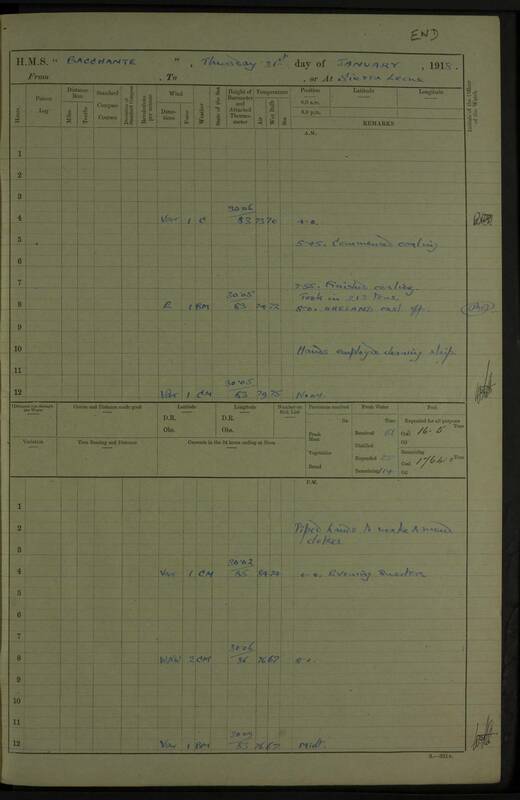 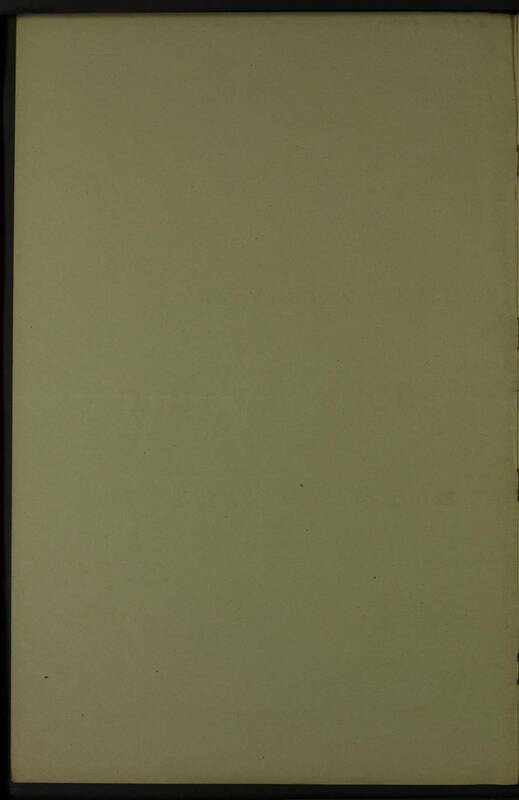 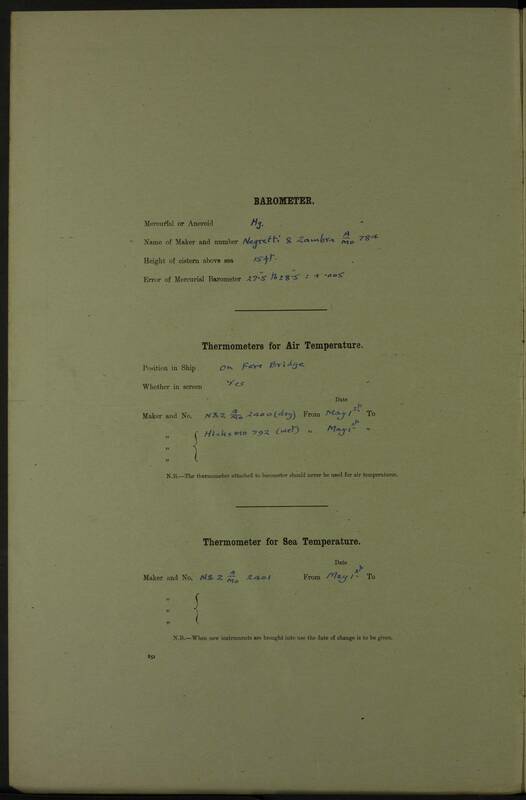 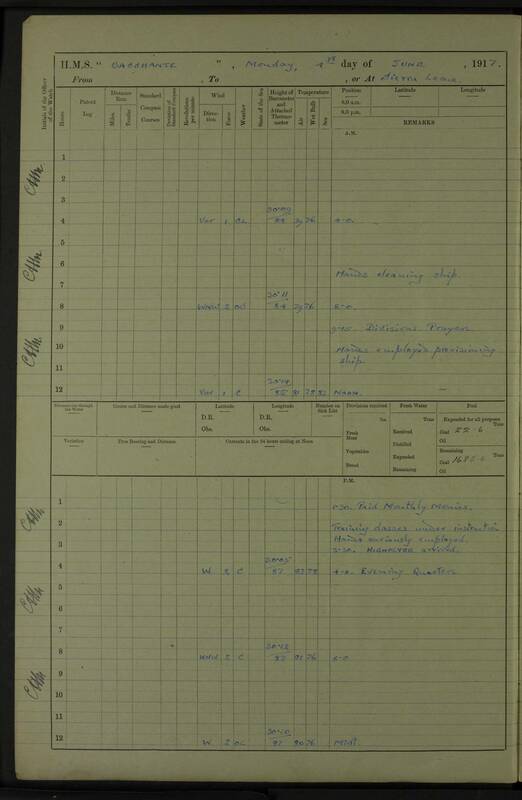 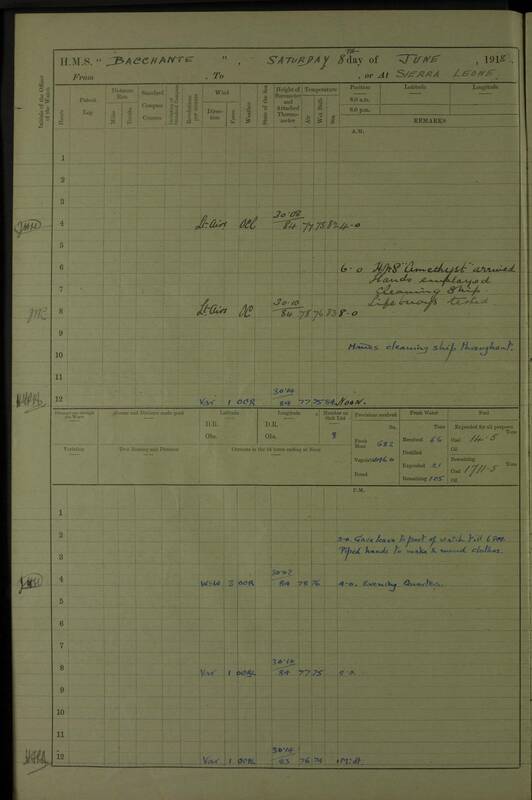 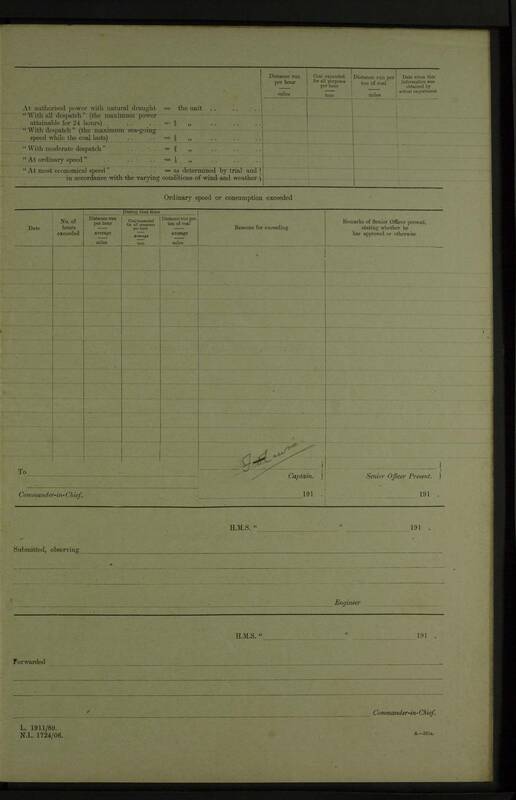 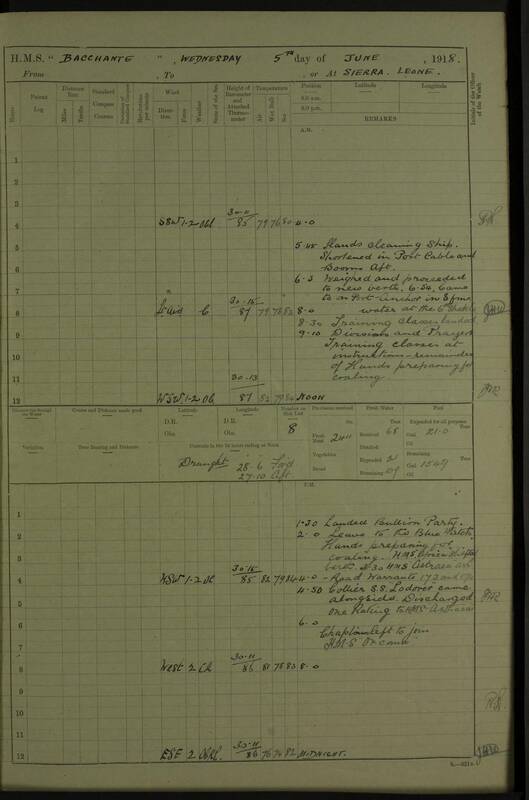 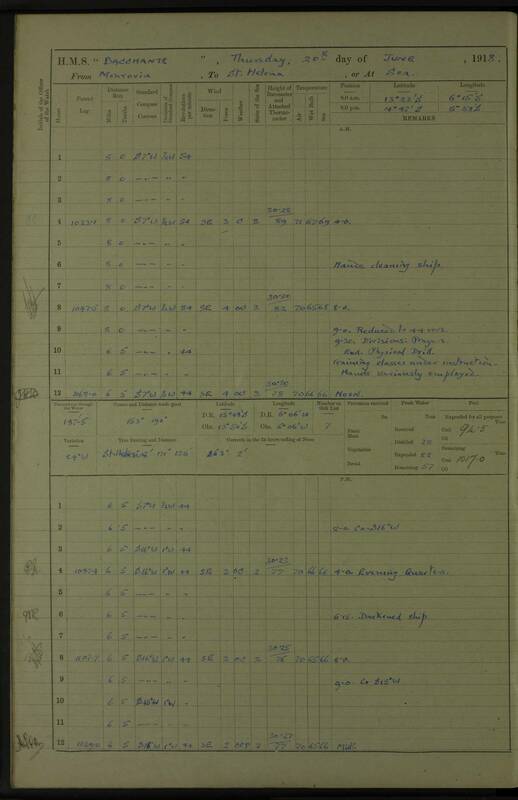 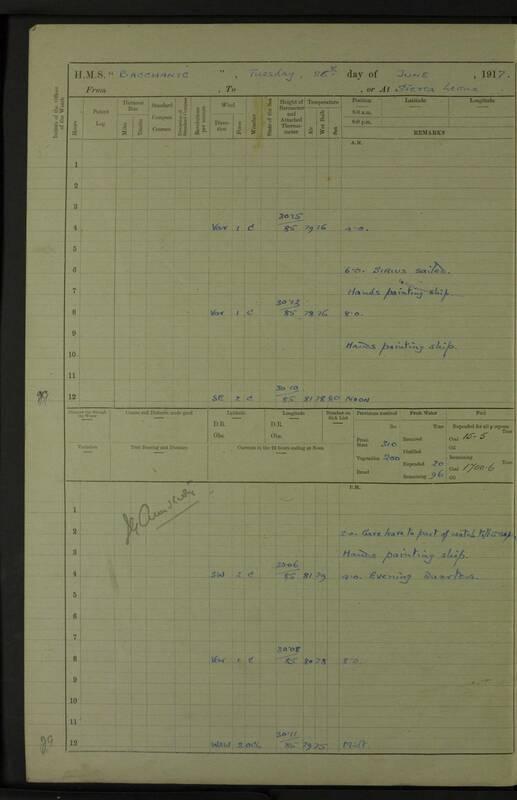 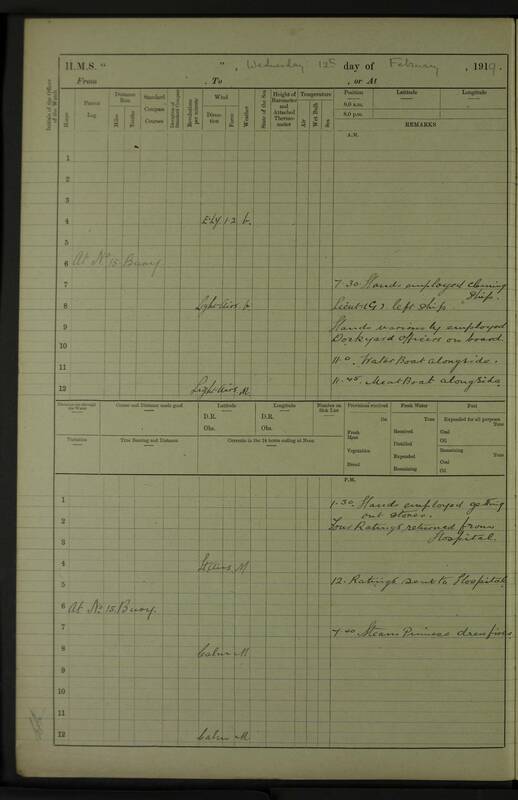 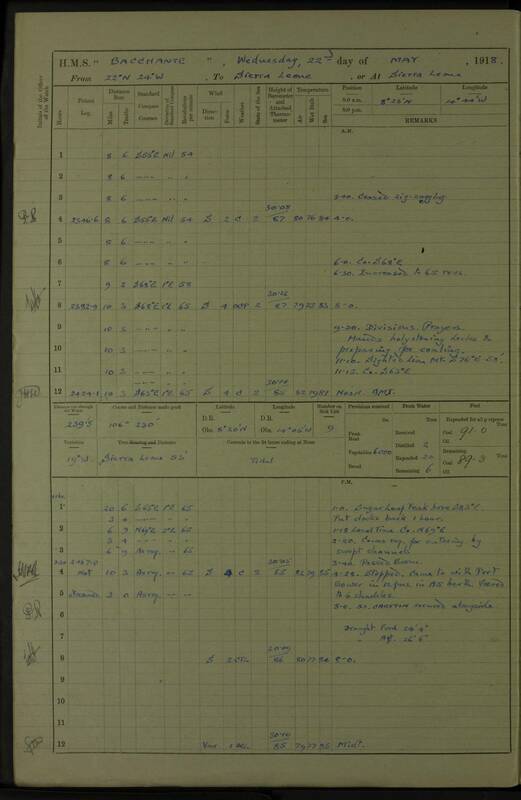 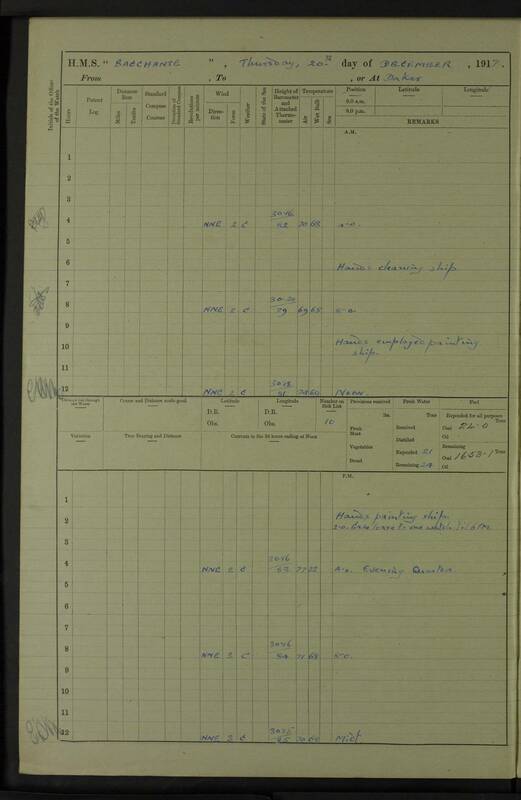 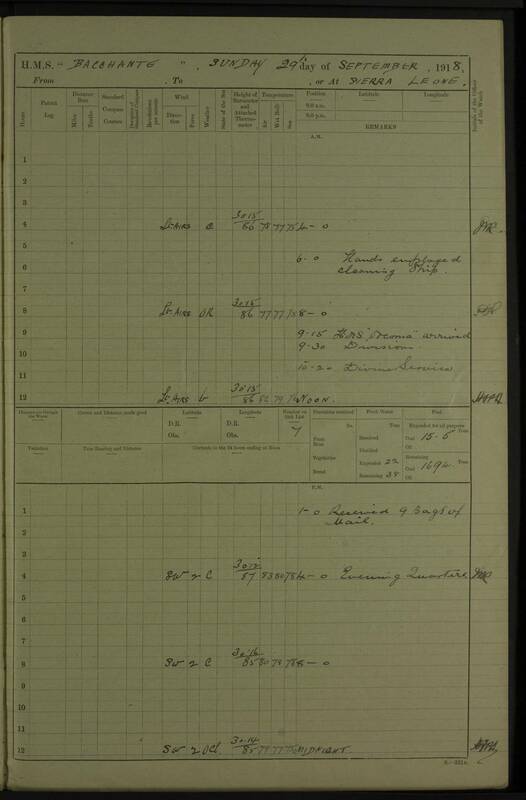 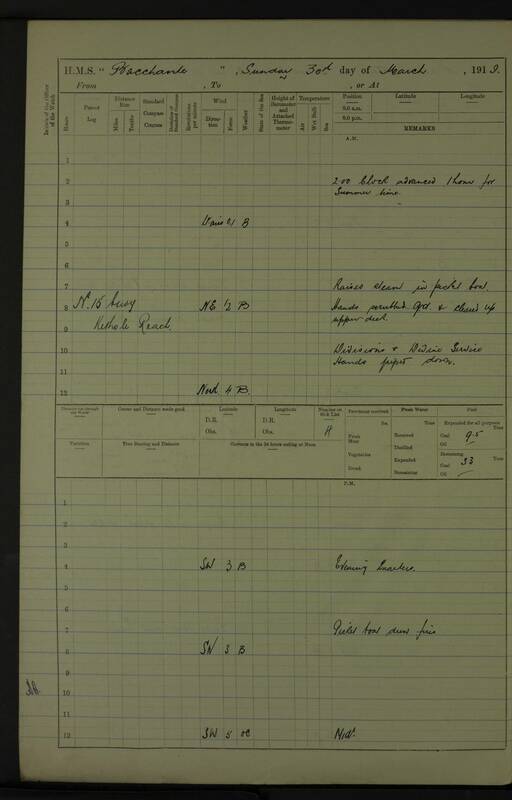 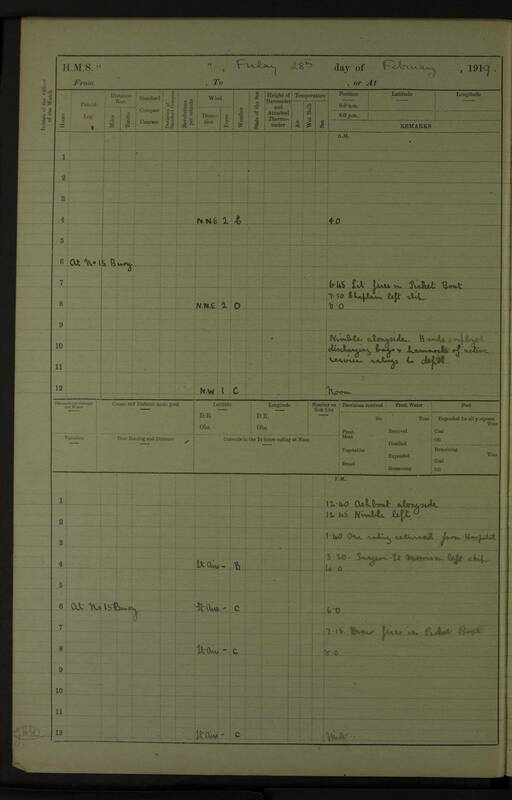 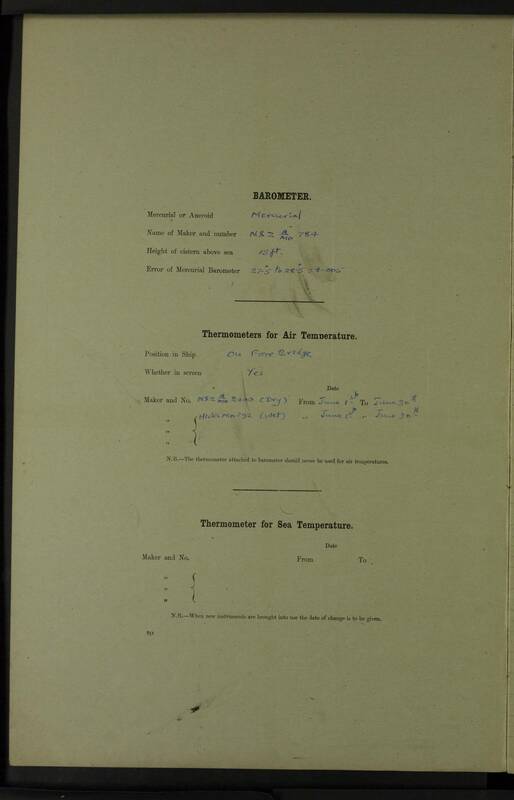 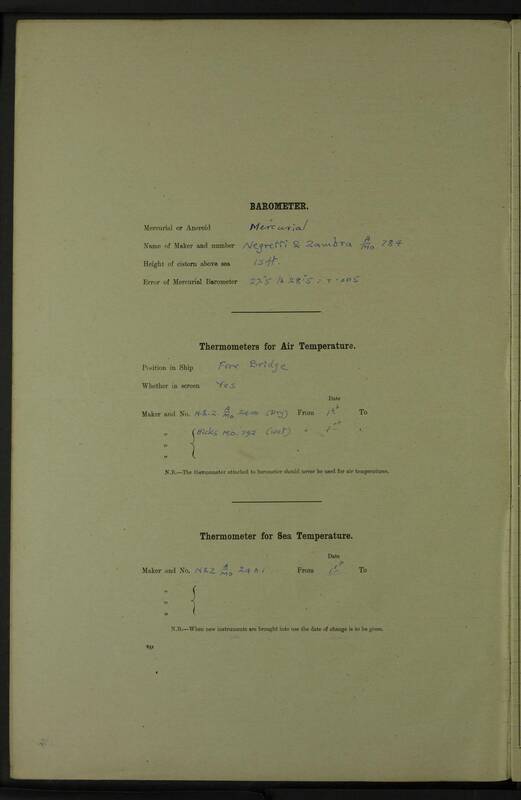 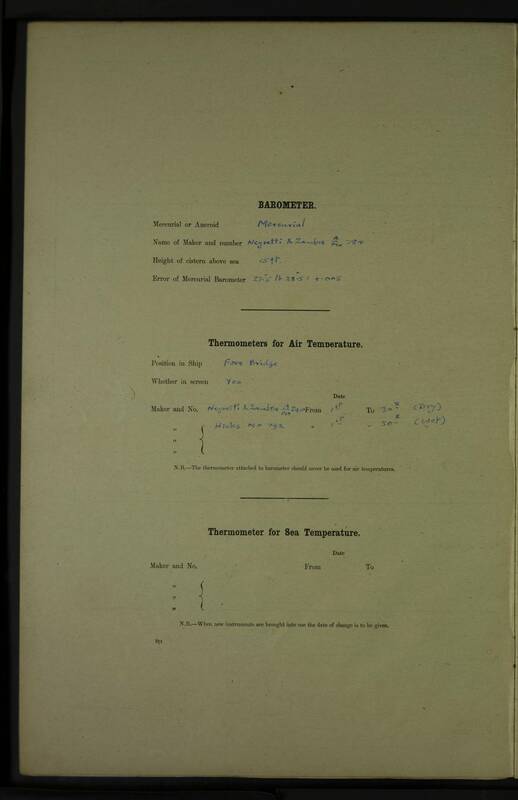 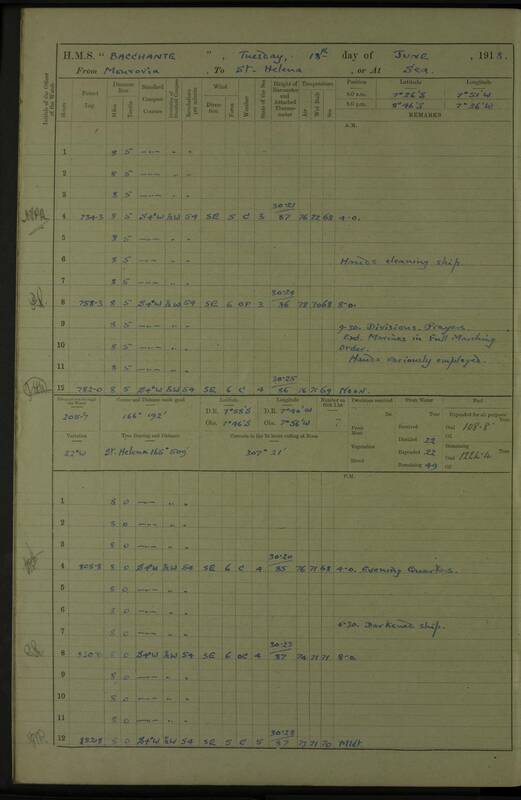 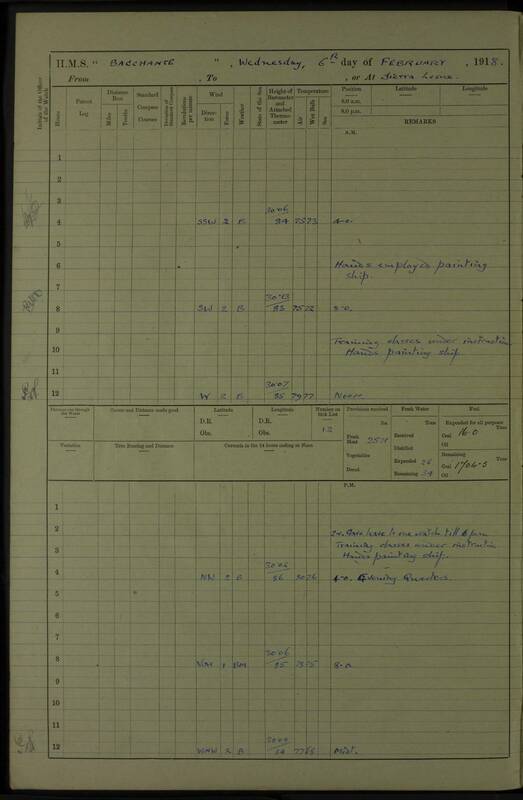 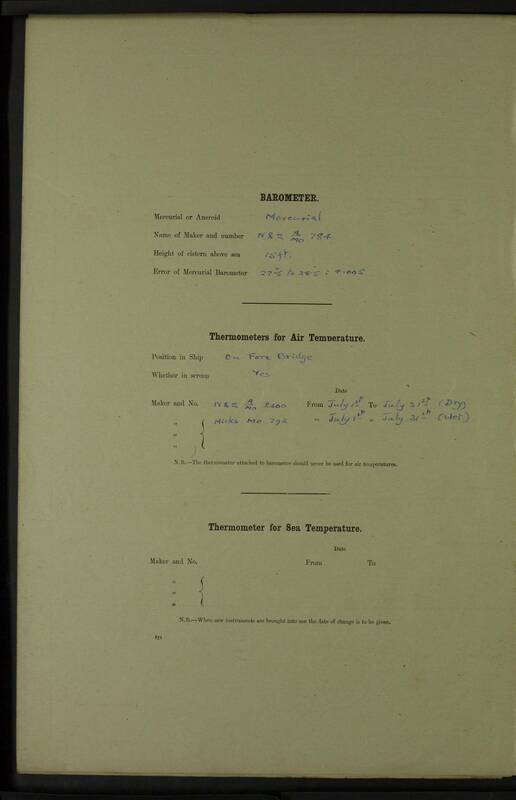 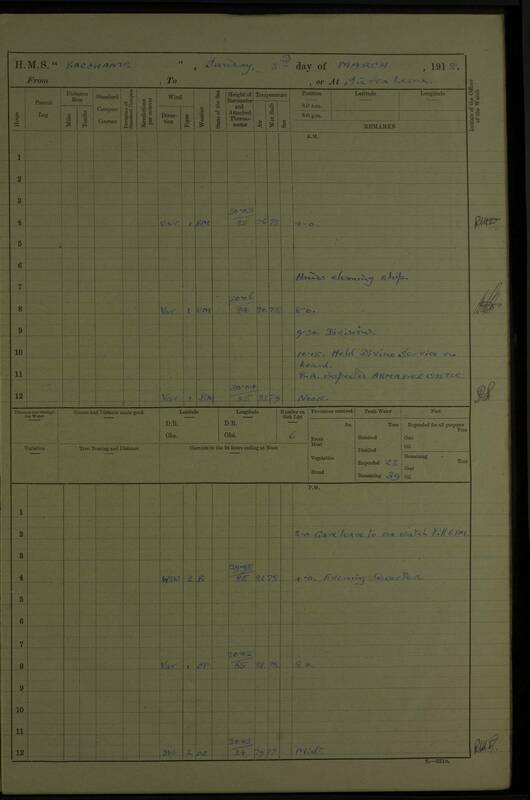 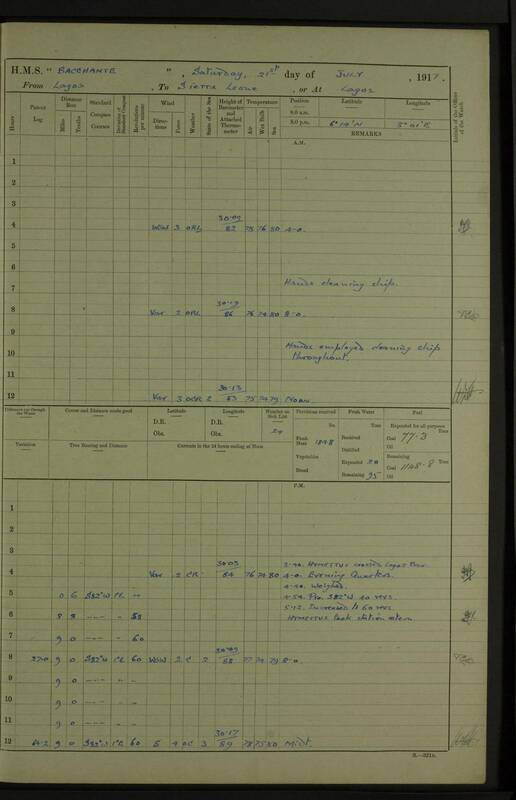 9.45 pm: Discharged Fleet Surgeon Herbert Gill, R.N., Lieutenant Randall MacDONNELL R.M.L.I. 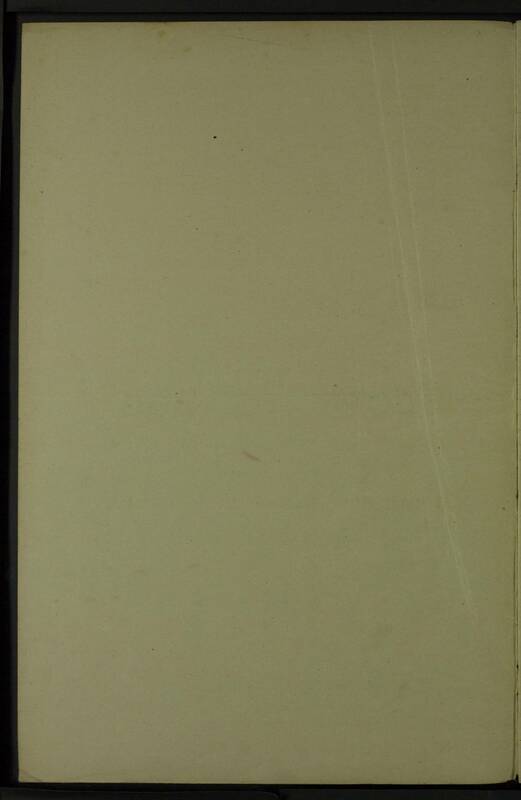 and one Rating, R.M.L.I. 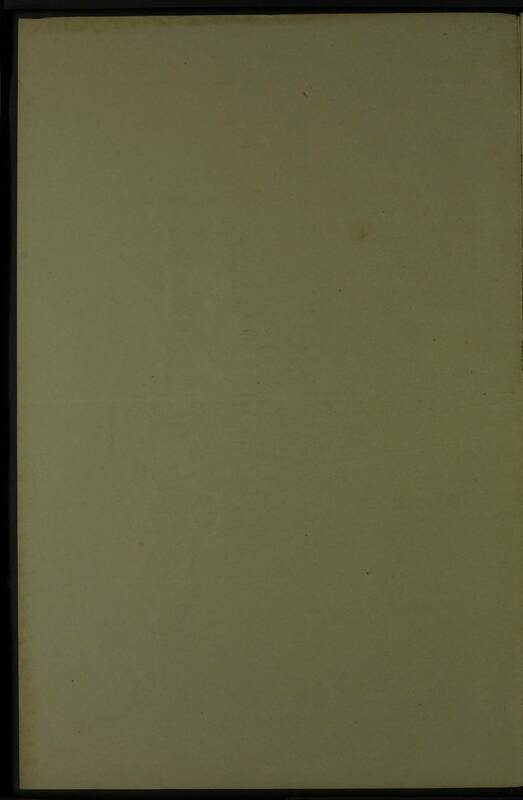 to DUNVEGAN CASTLE for passage home. 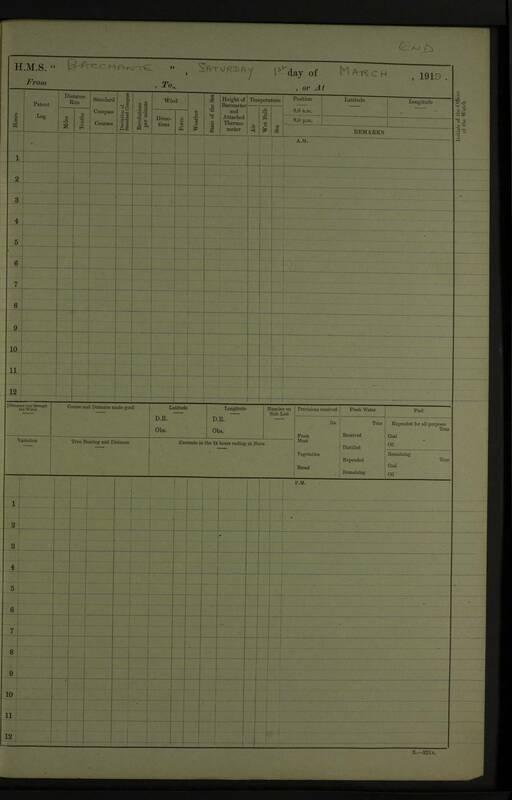 11.30 am: OREOMA shifted berth. 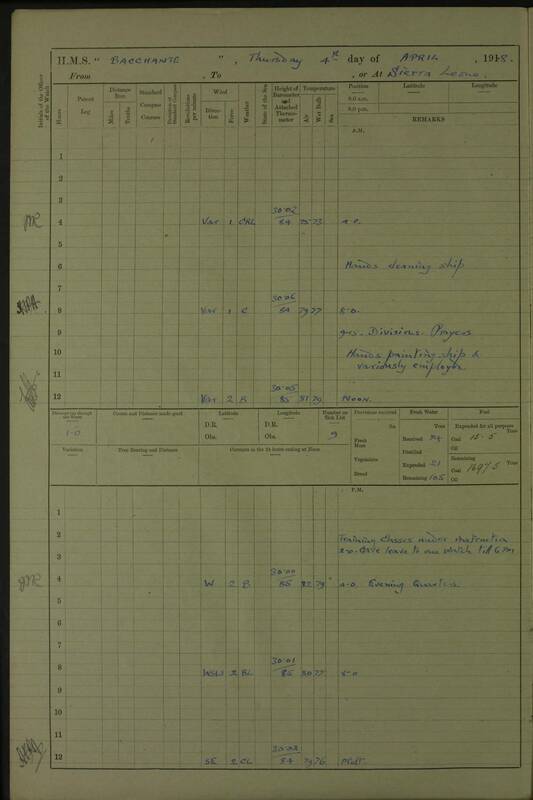 1.35 pm: HIMALAYA arrived with convoy. 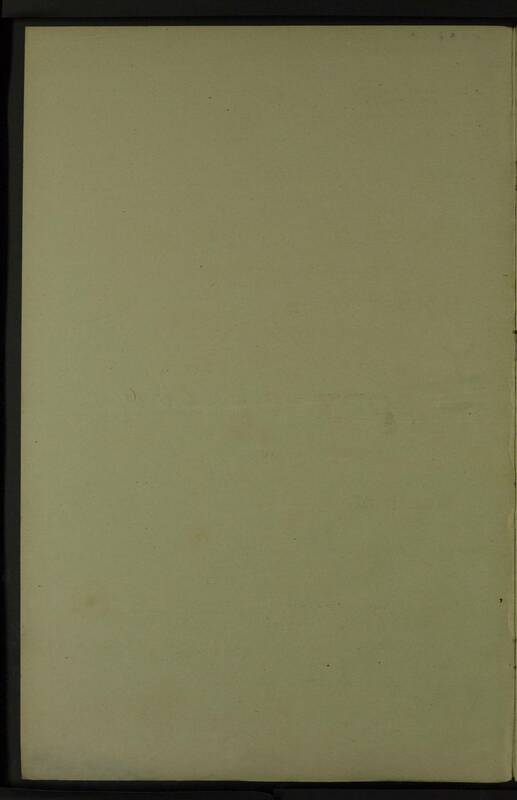 4.45 pm: S.S. HIGHLAND MONARCH secured alongside. 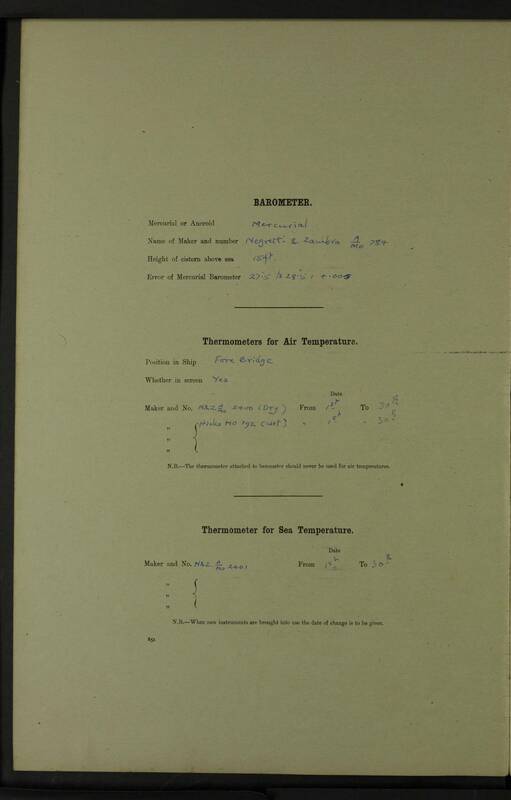 9.55 pm: Weighed; 10.32 pm: Passed boom. 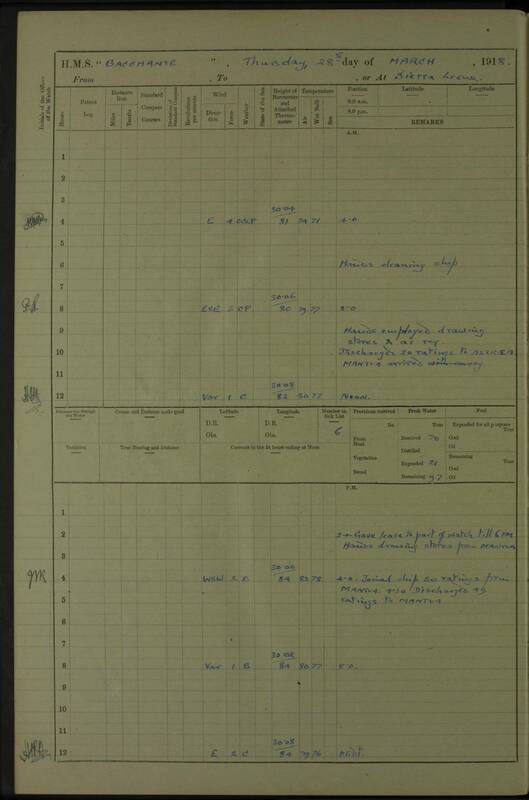 6.40 pm: Course for Cape Town. 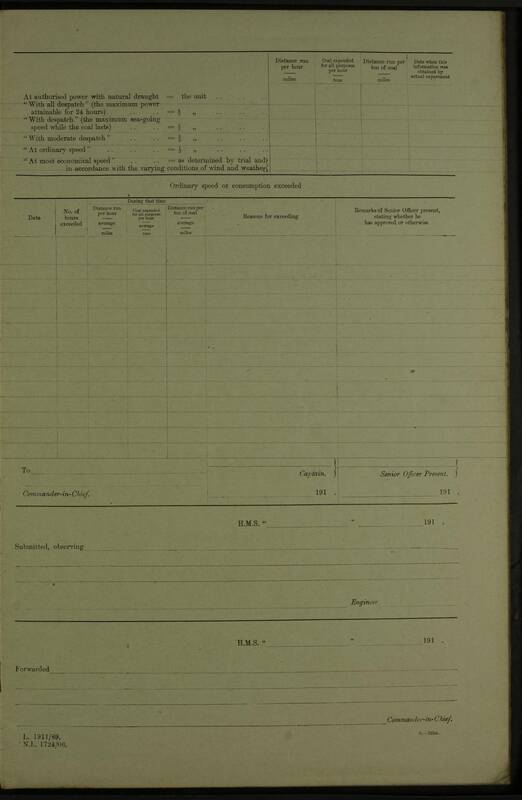 Increased to full speed available. Am/pm: Hands employed scraping ship’s bottom. 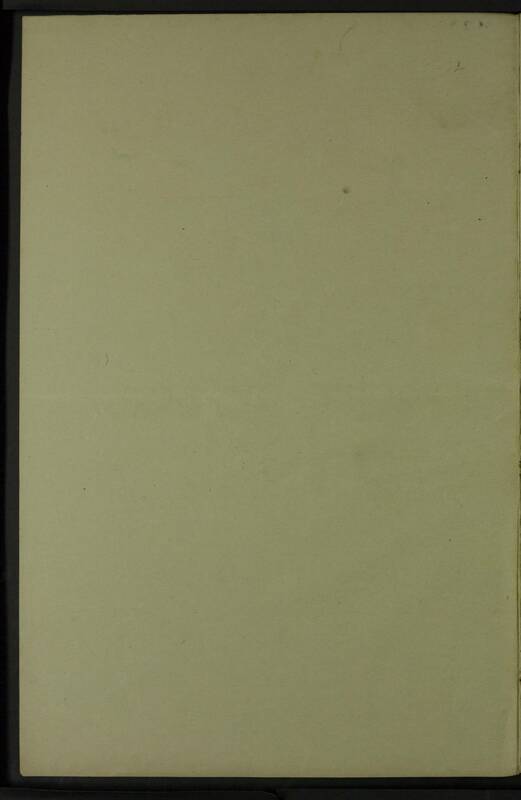 Length of barnacle growths 3.5 inches. 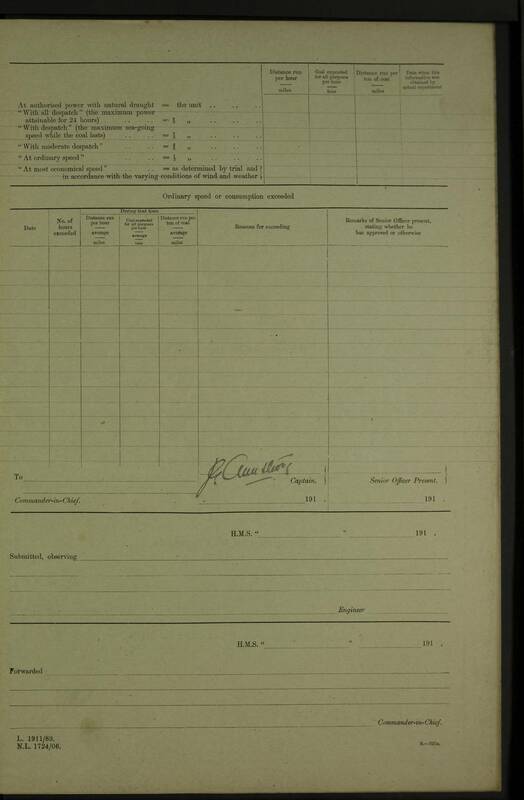 pm: 39 D. A. M. S. (Defensively Armed Merchant Ship) ratings joined ship. 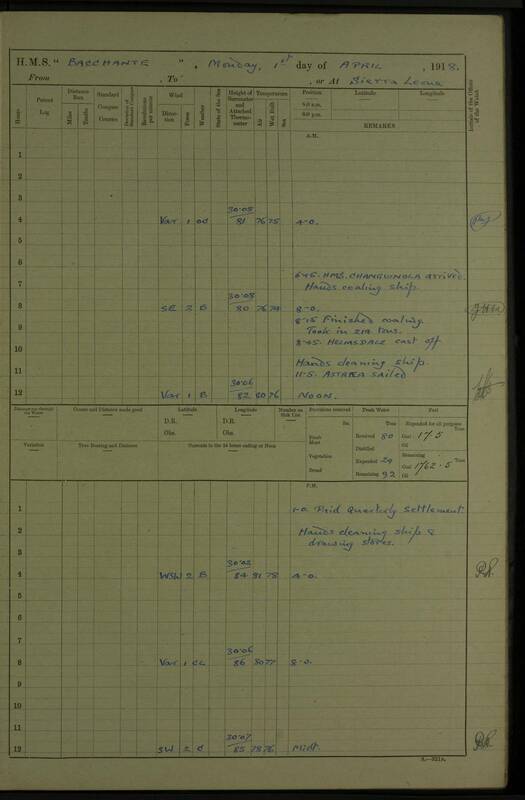 8.30 am: HYACINTH proceeded out of harbour; 12.30 pm: HYACINTH returned to harbour. 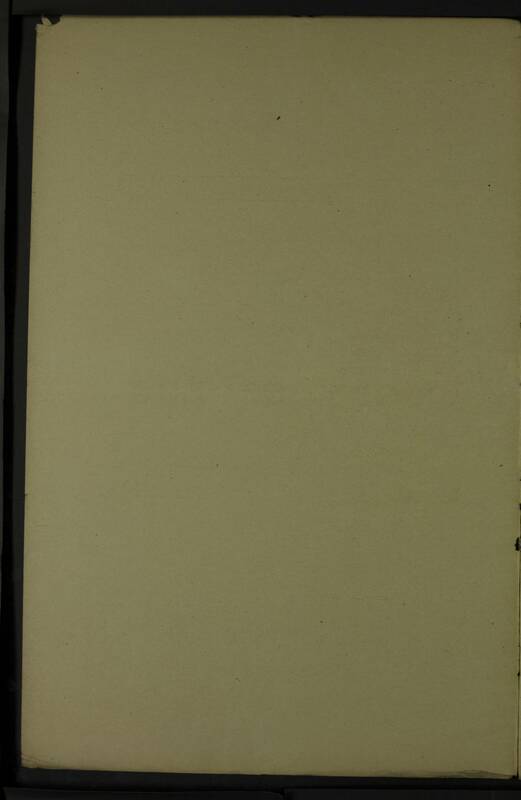 8.40 am: HYACINTH and TSUSHIMA sailed. 1.40 pm: HYACINTH returned to harbour. 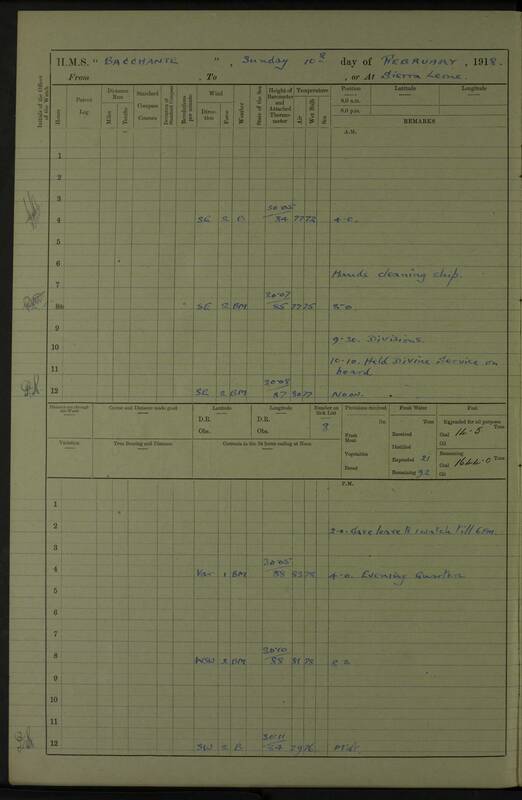 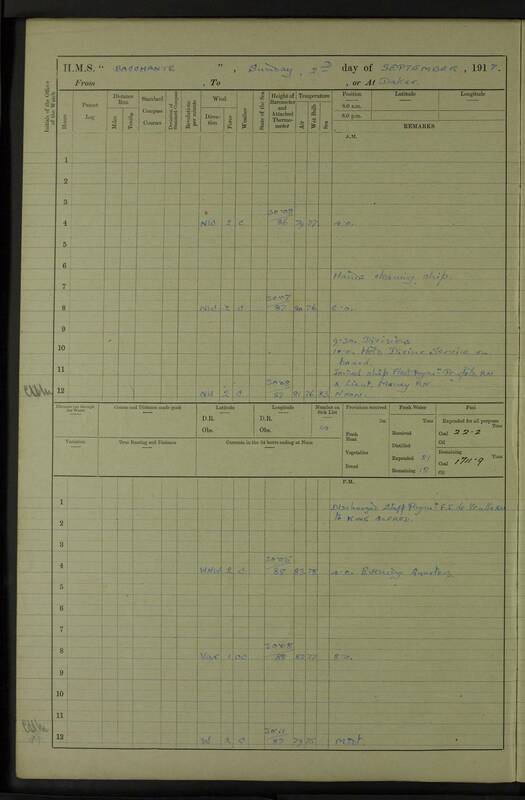 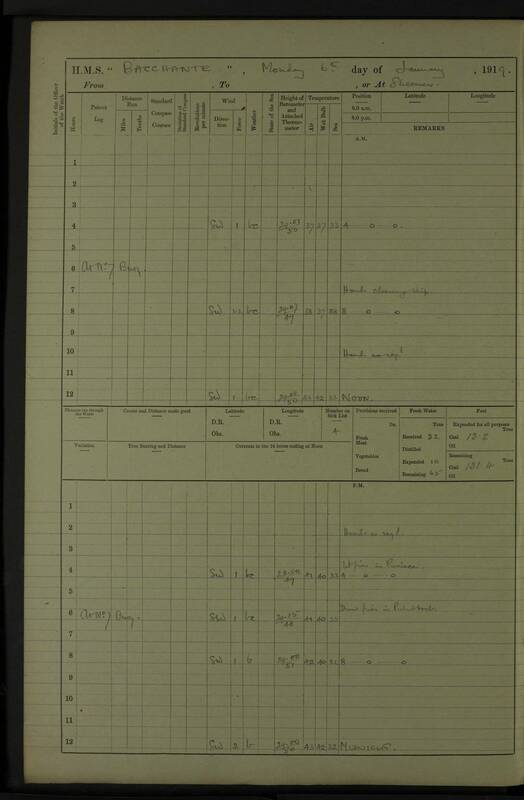 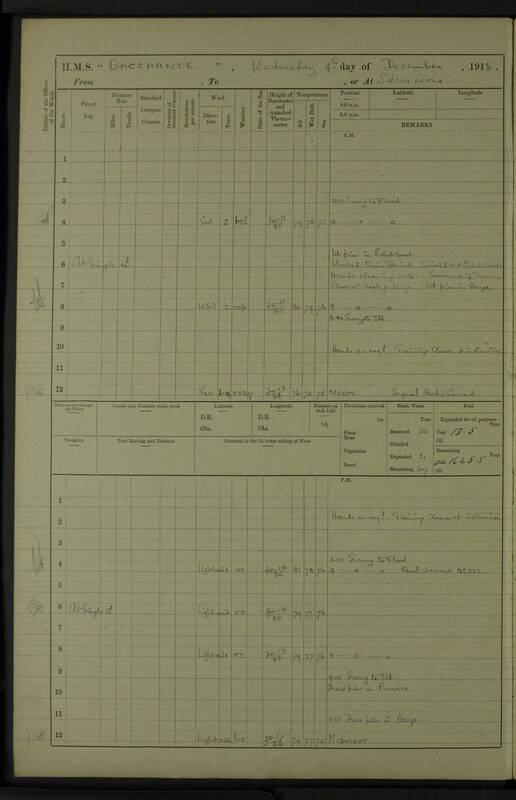 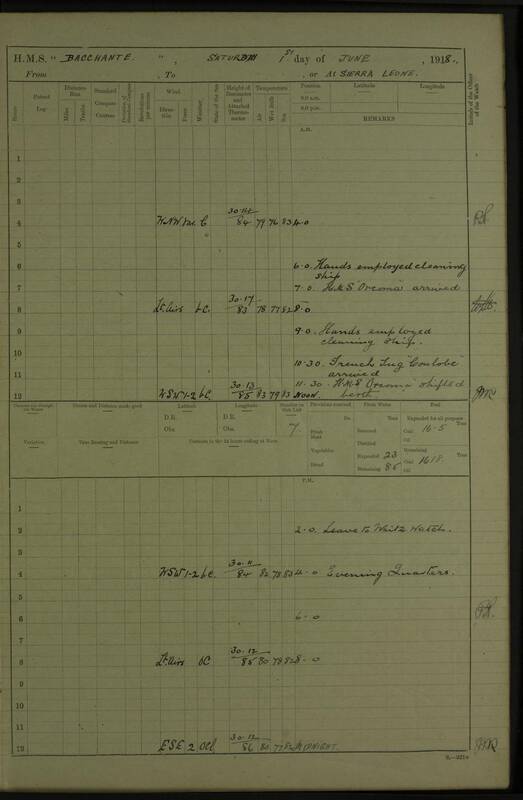 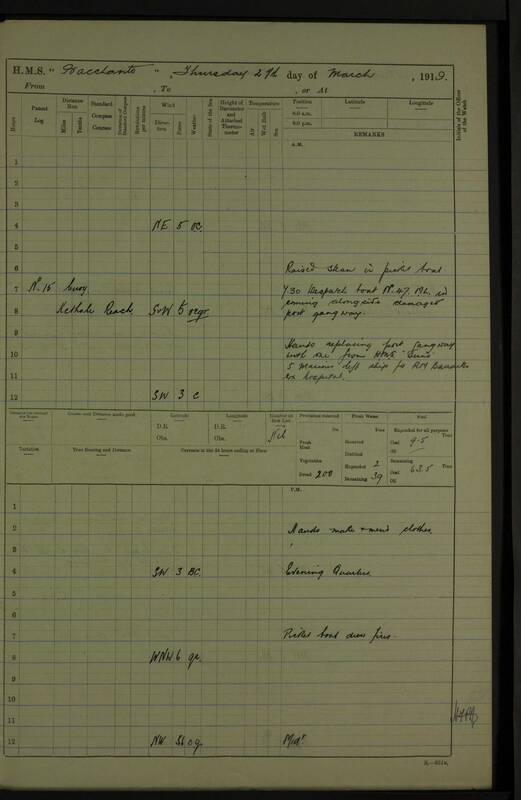 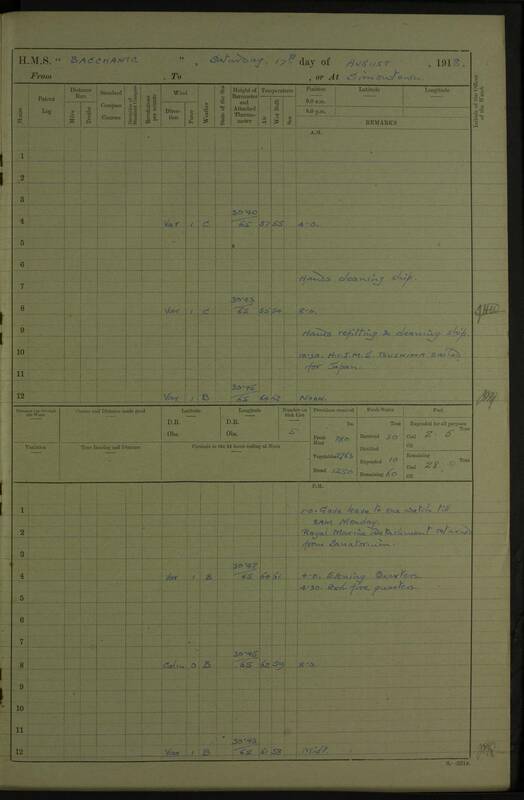 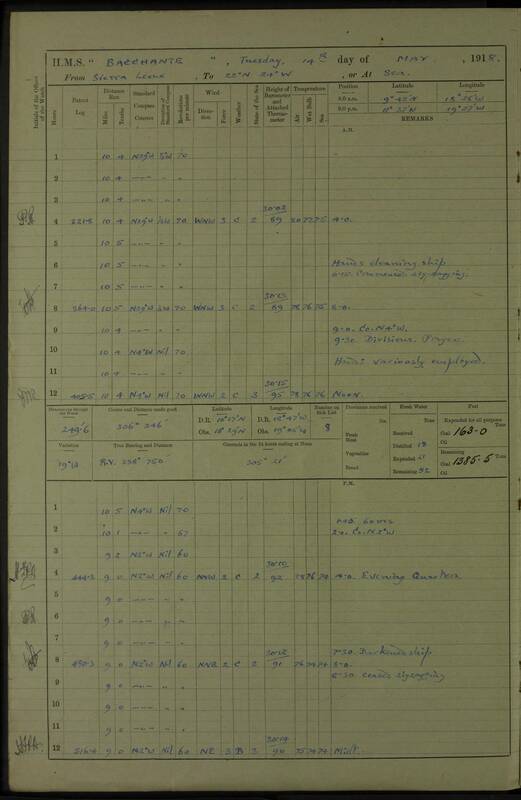 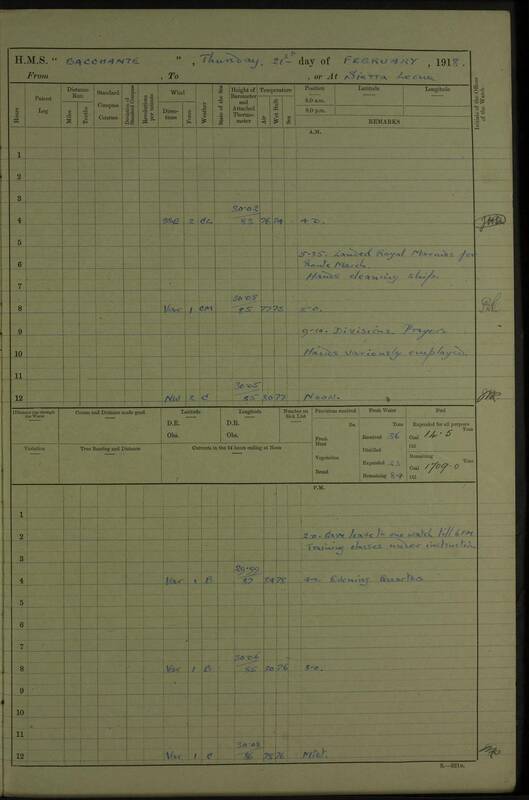 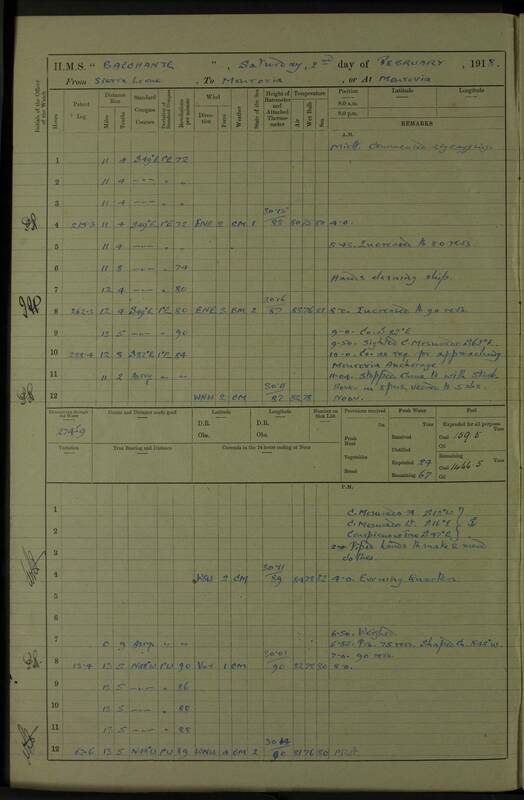 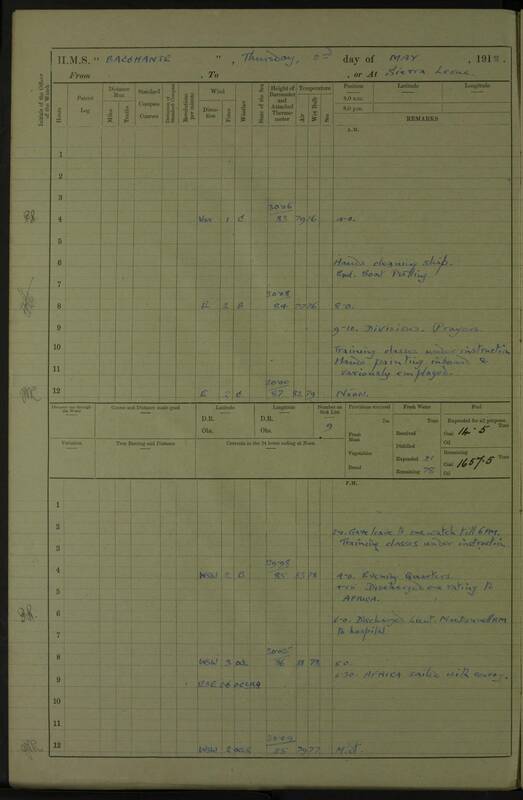 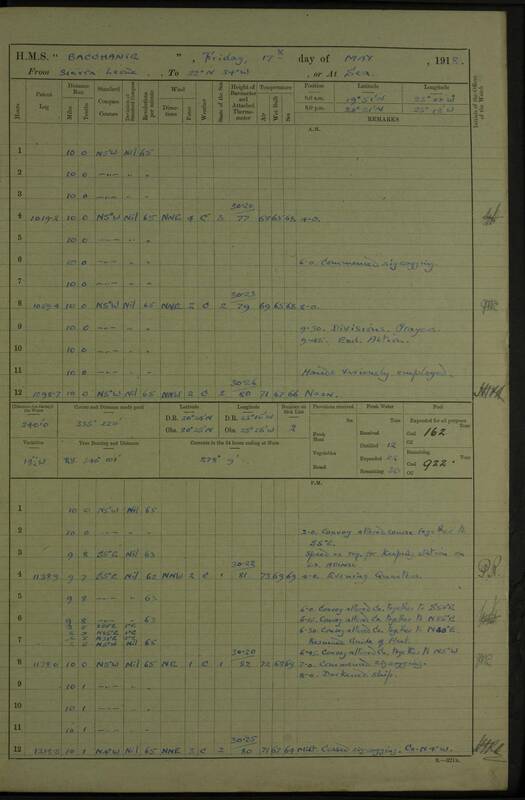 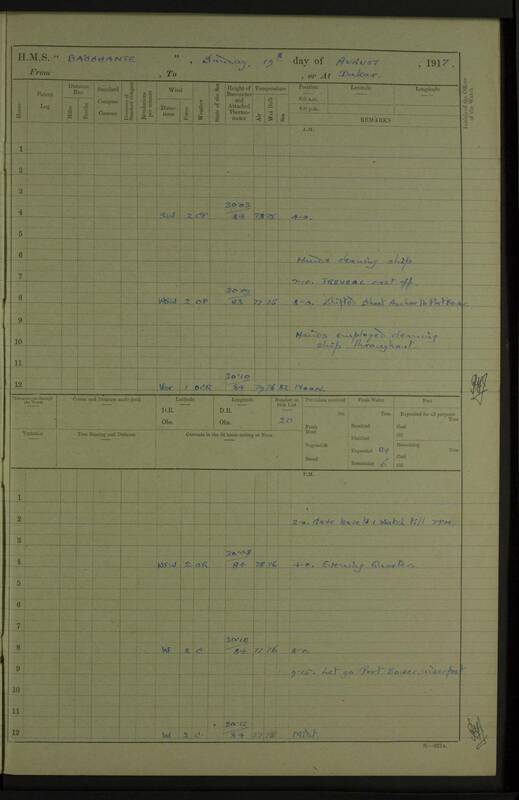 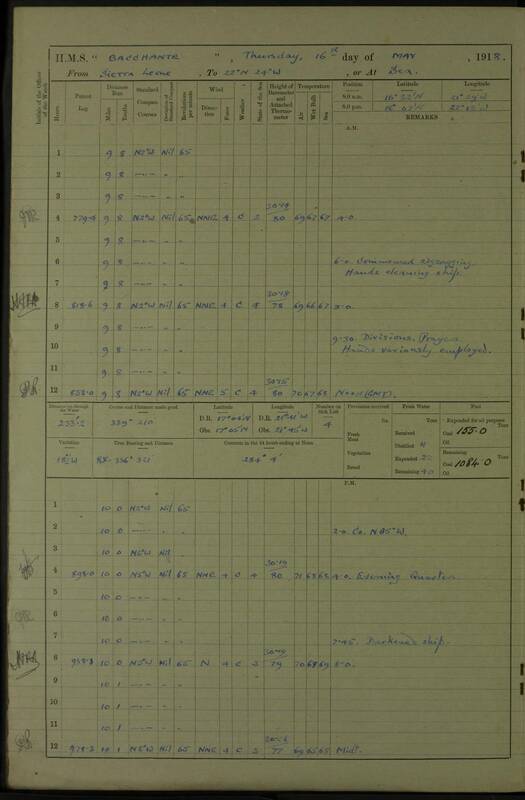 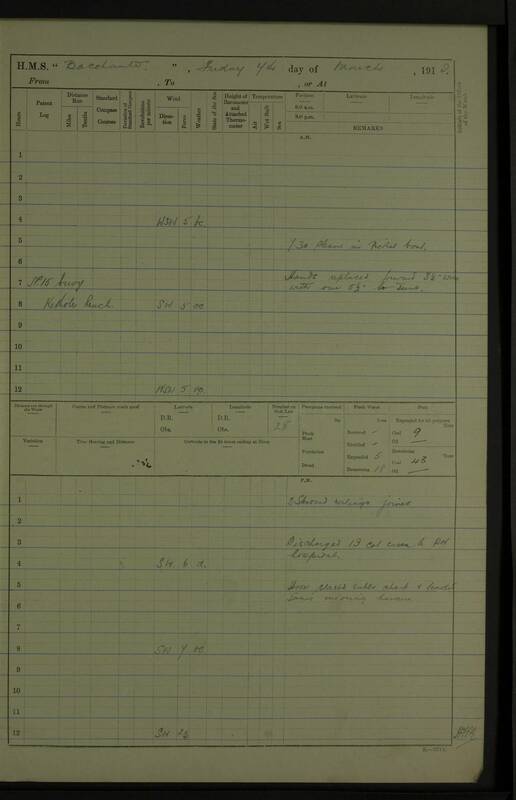 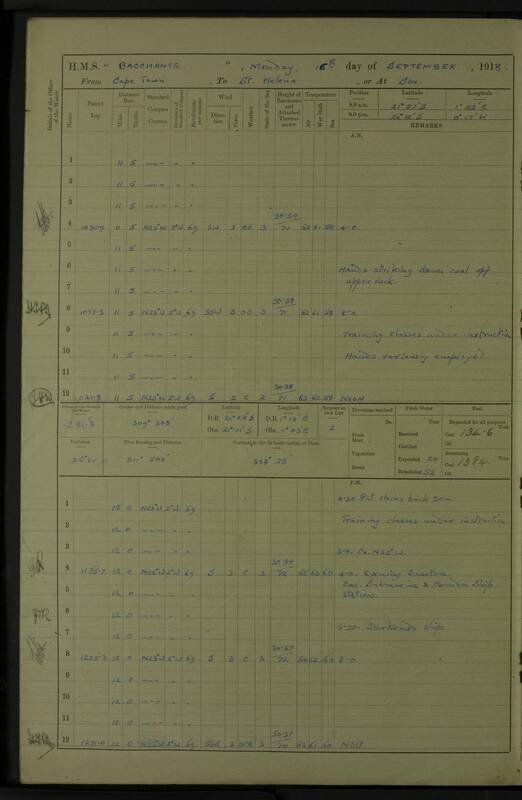 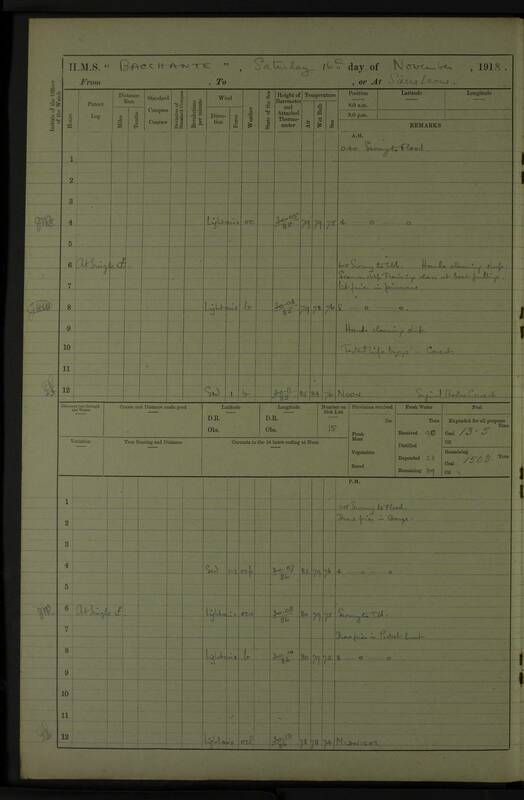 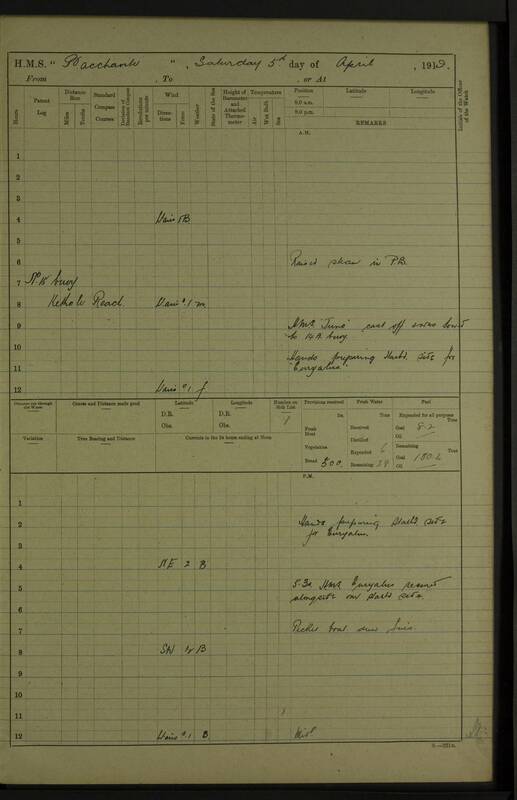 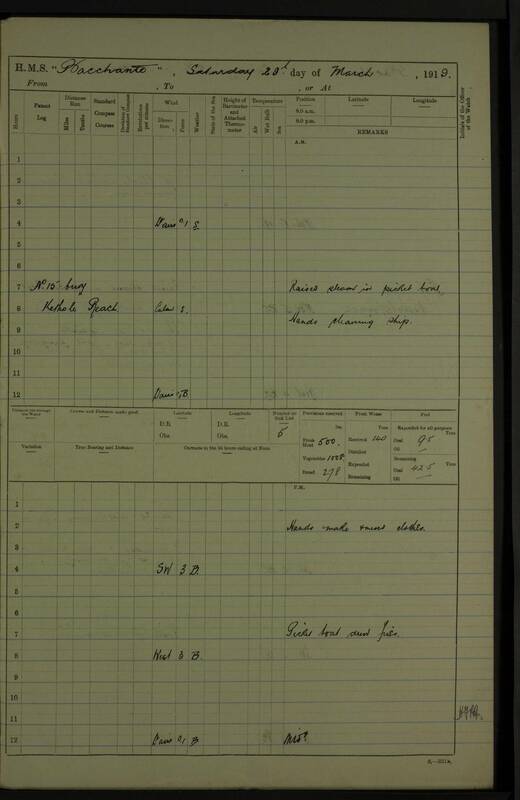 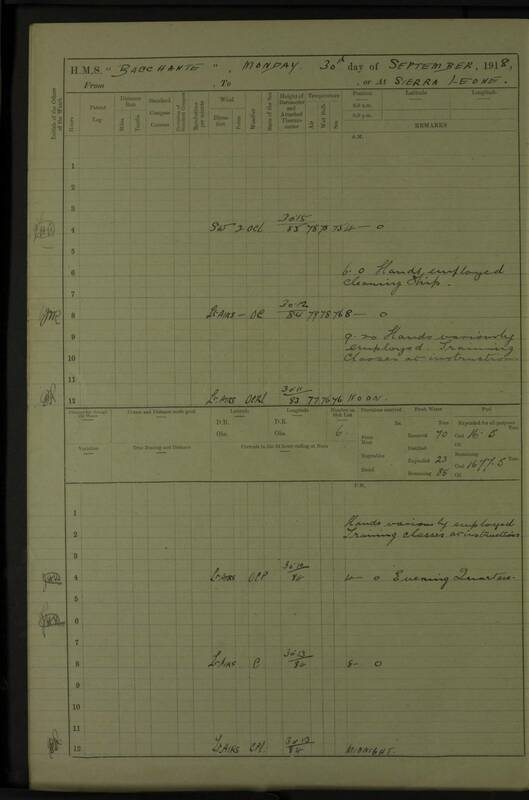 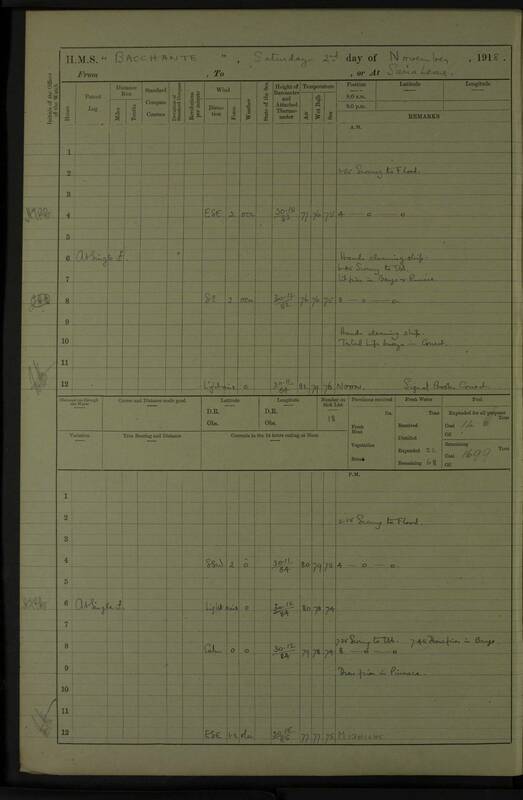 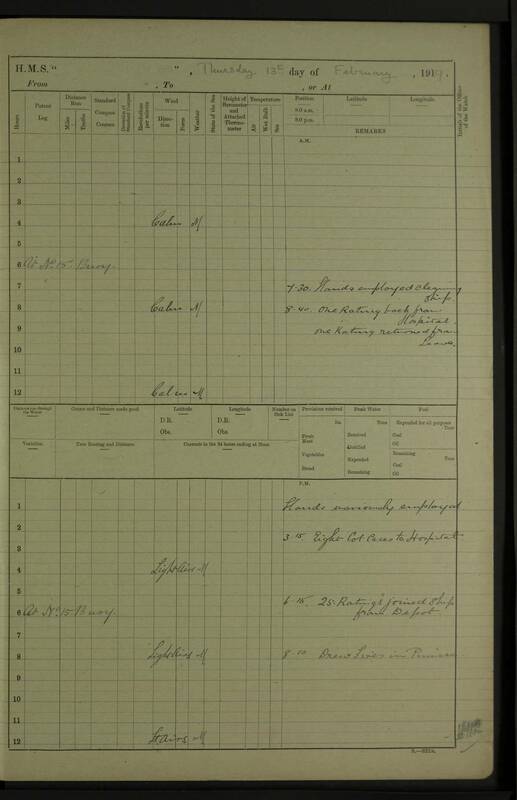 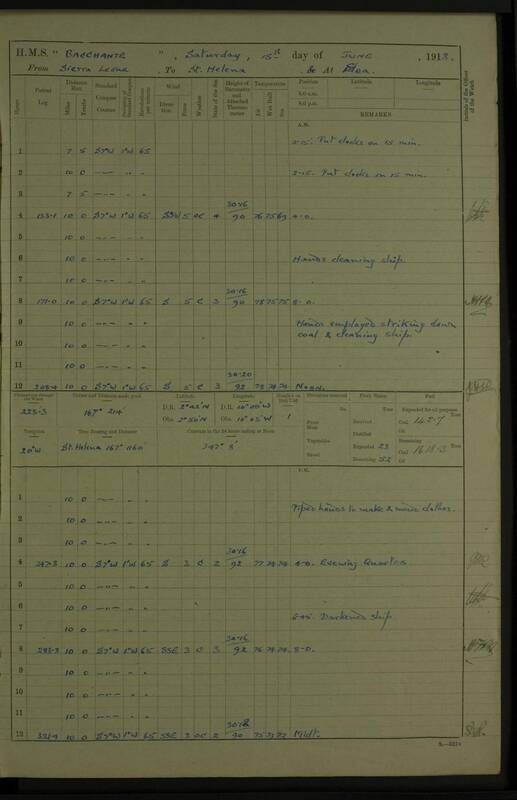 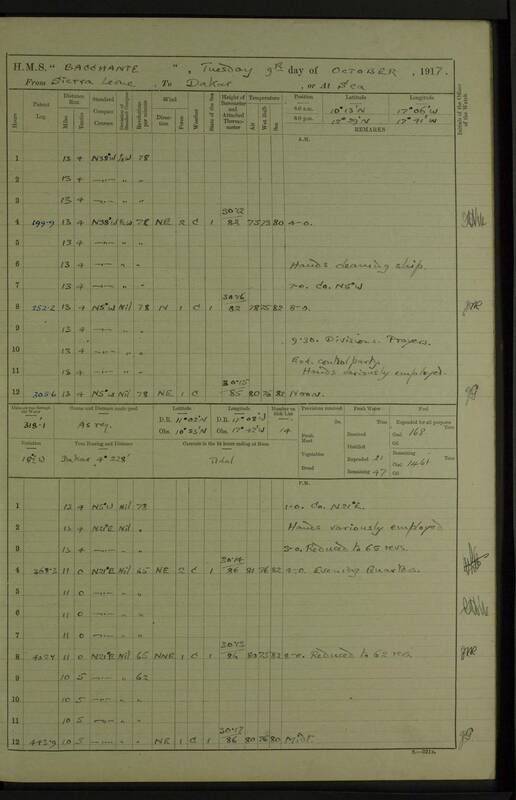 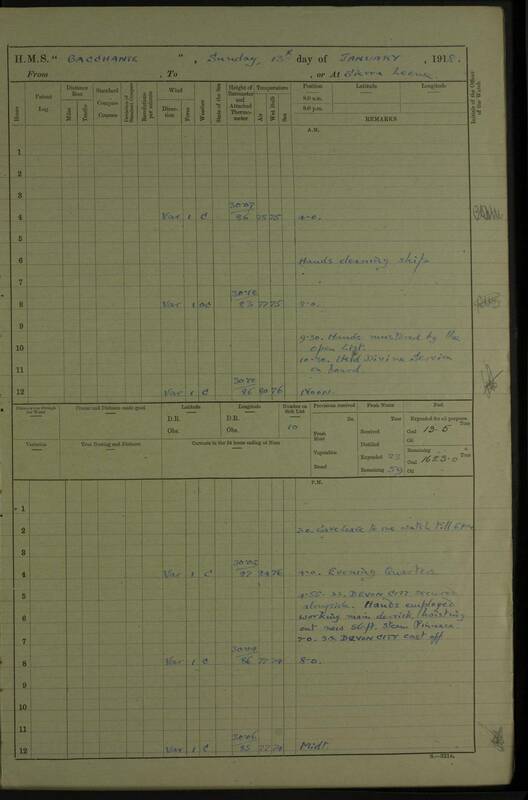 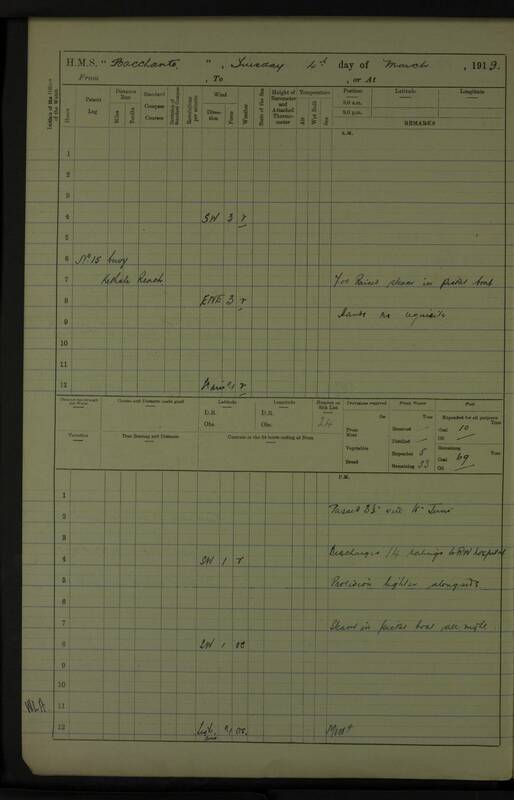 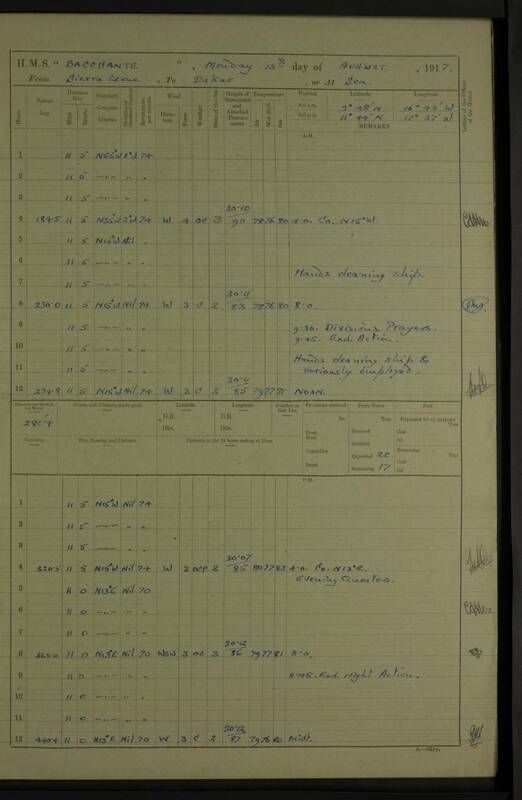 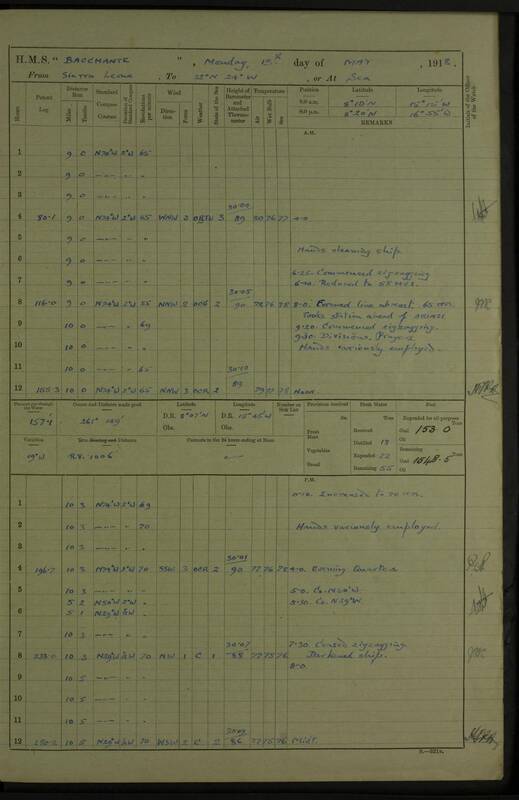 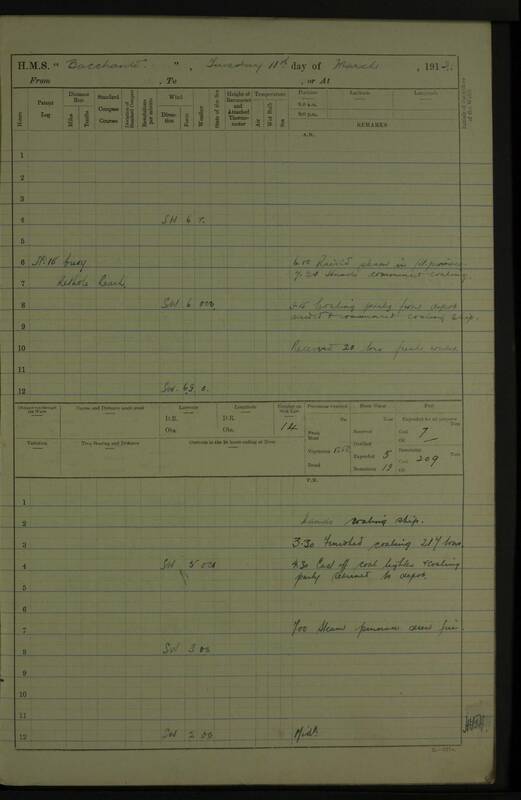 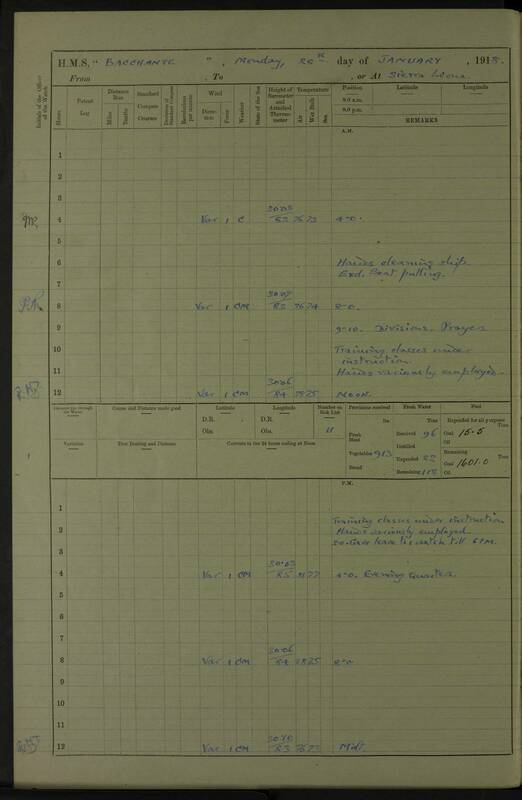 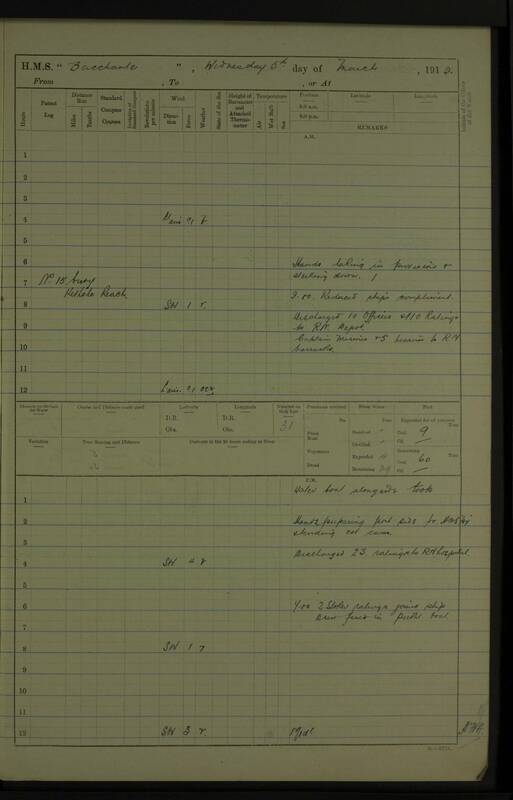 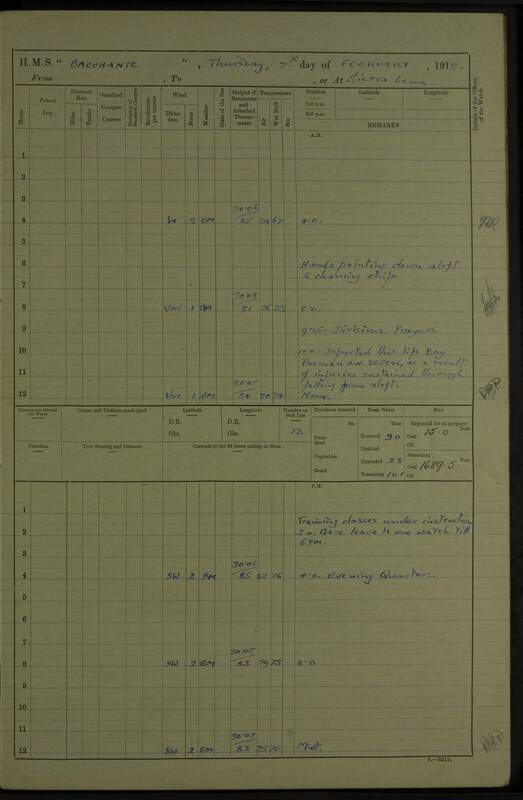 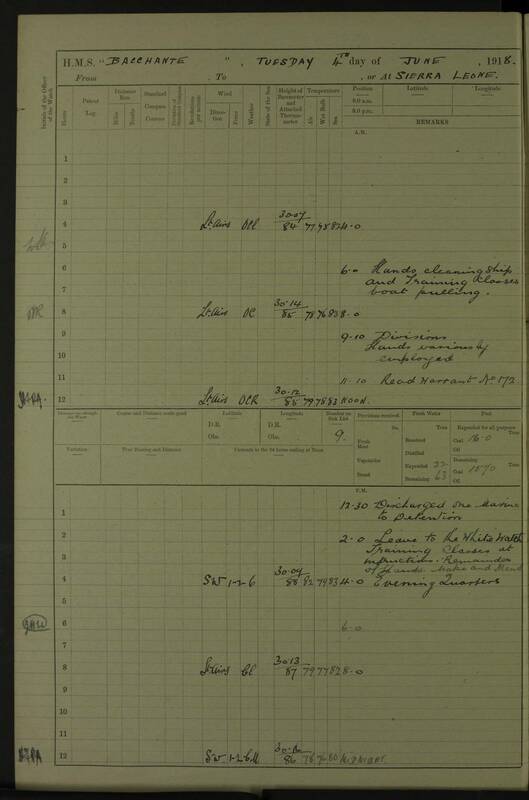 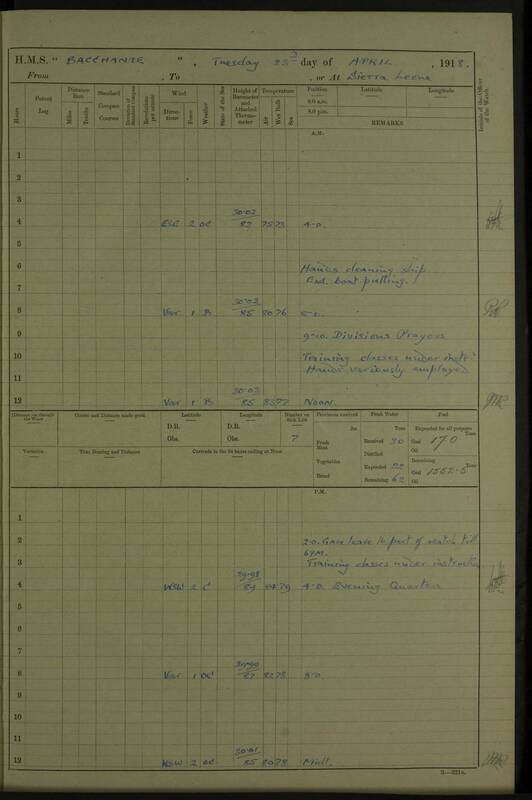 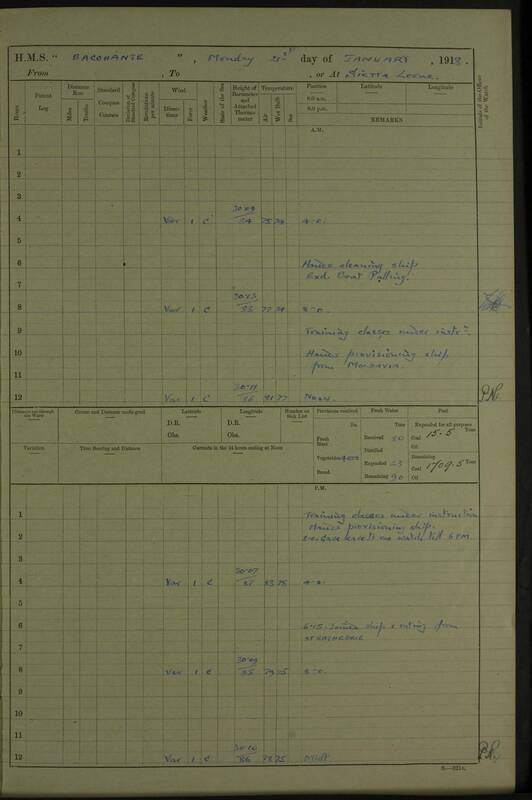 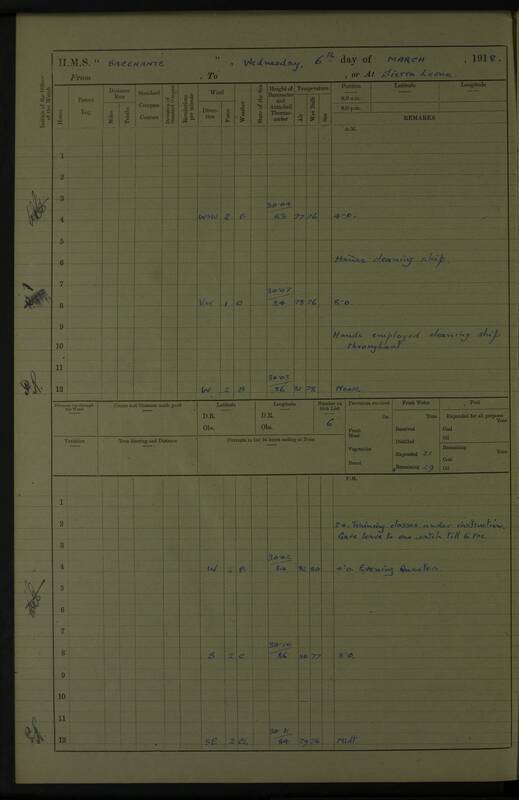 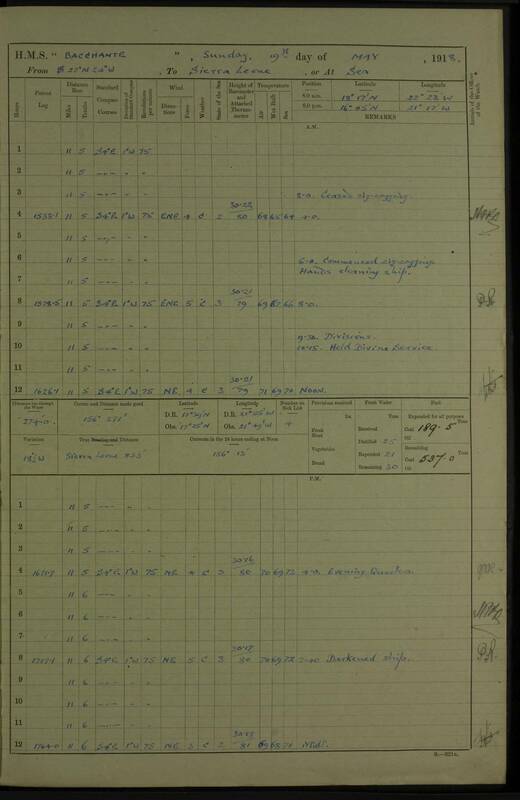 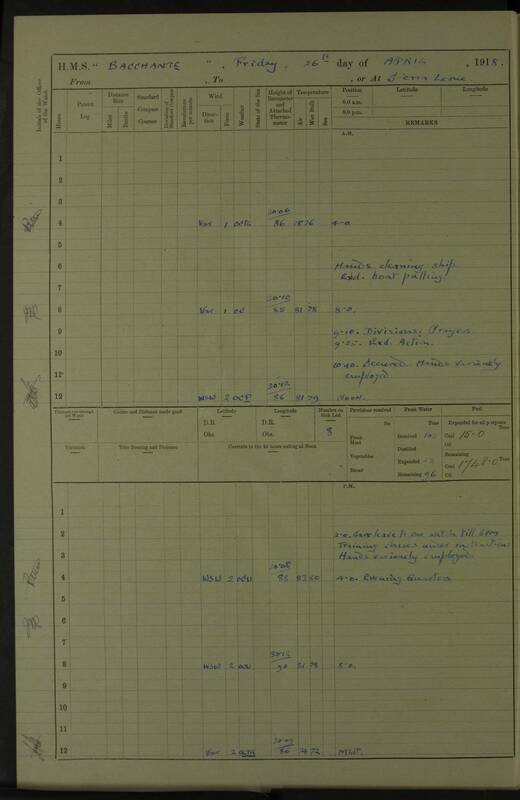 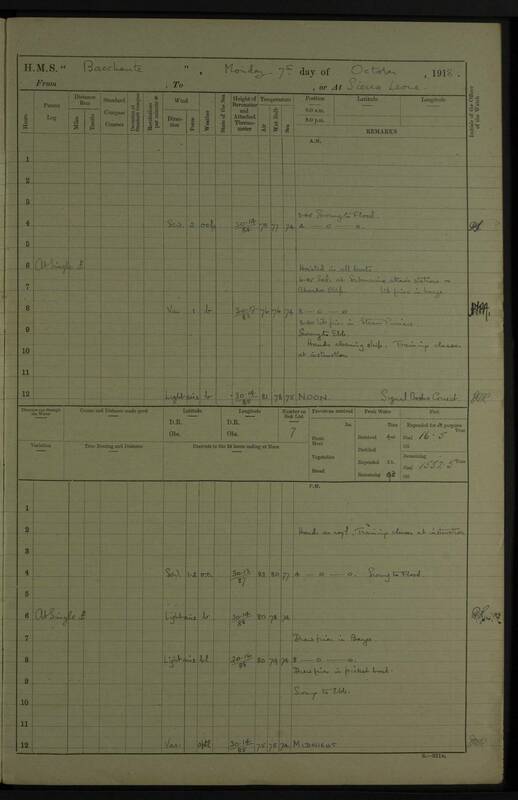 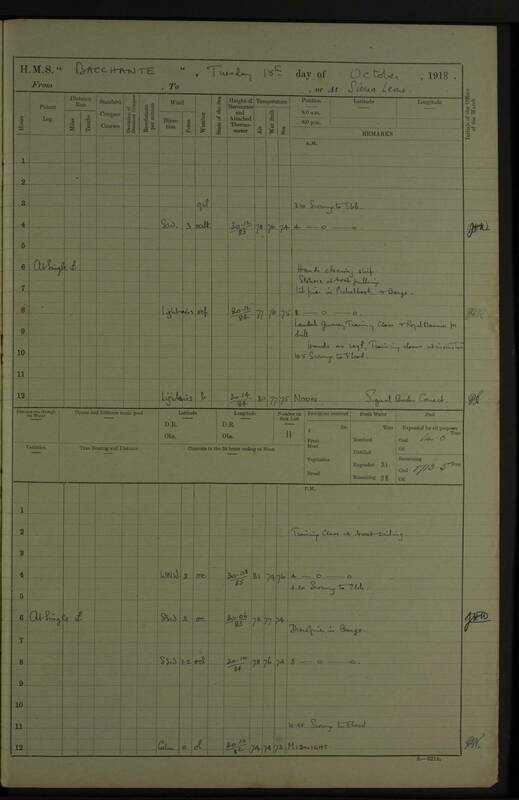 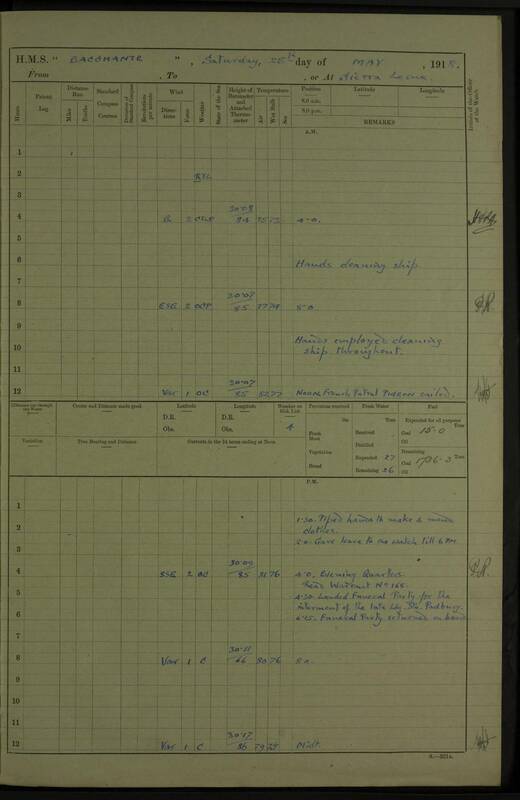 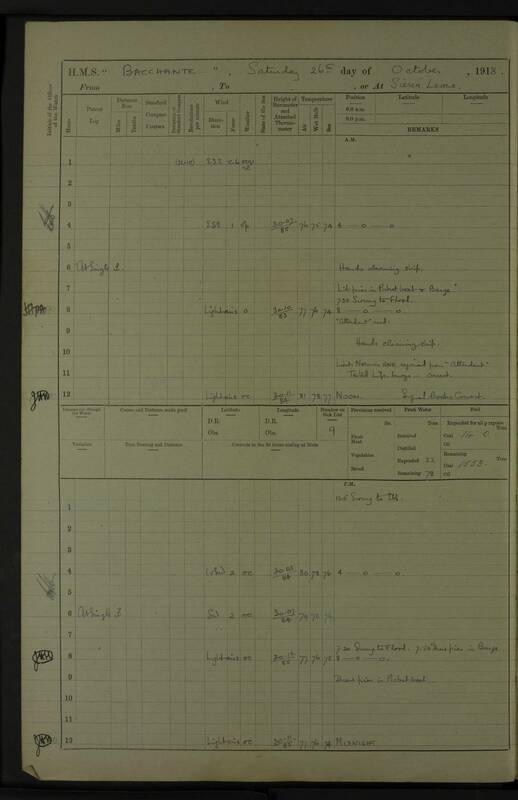 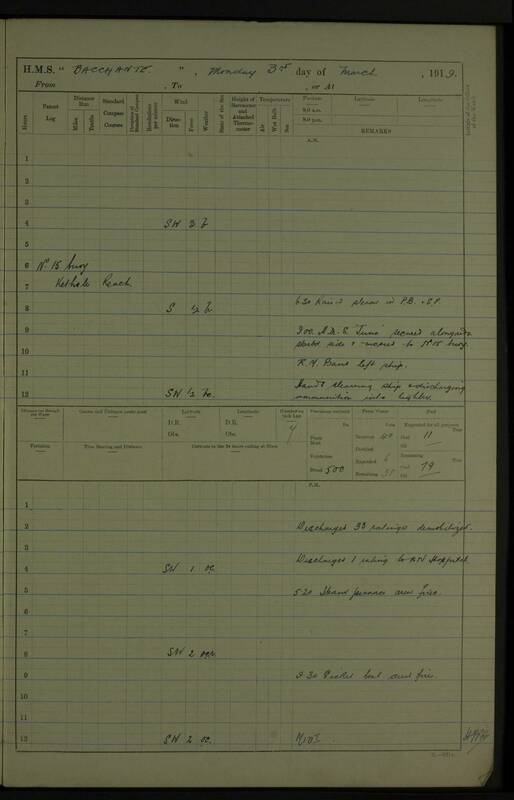 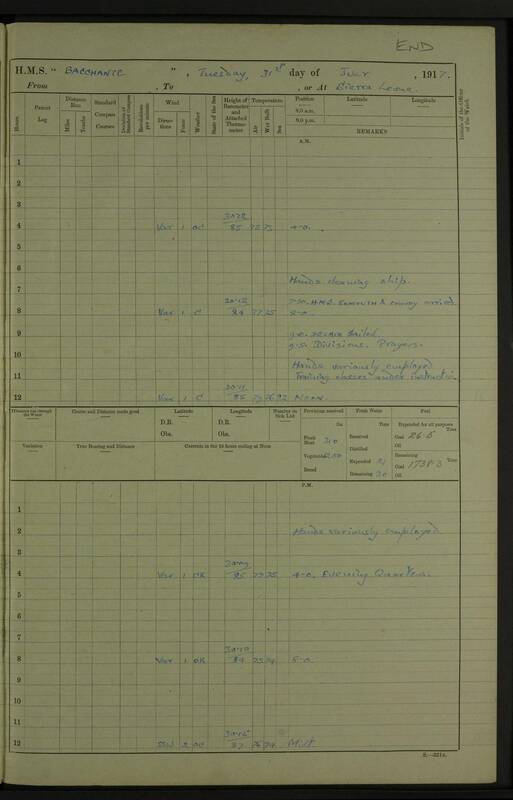 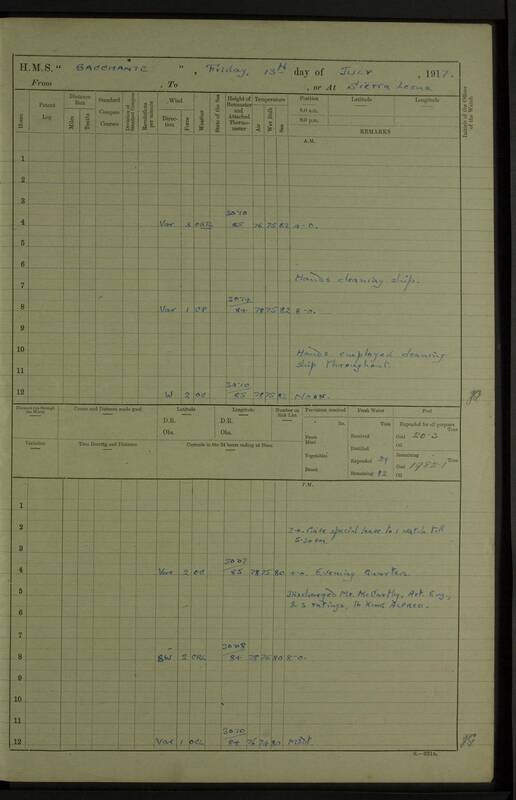 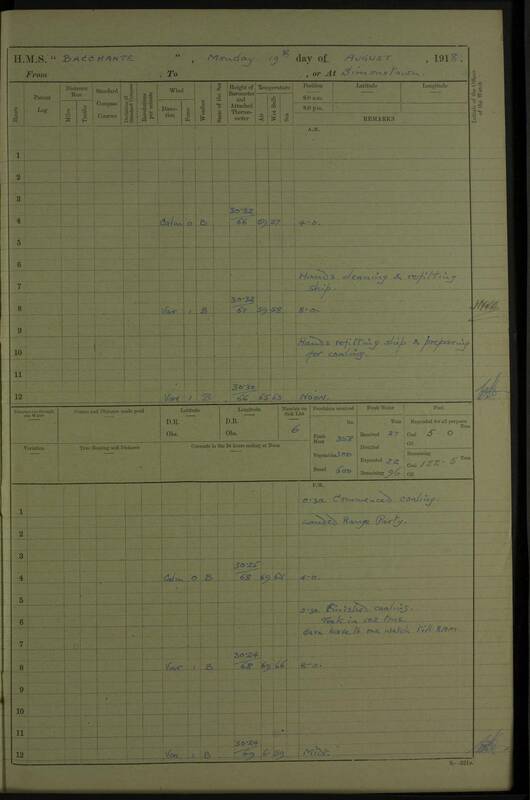 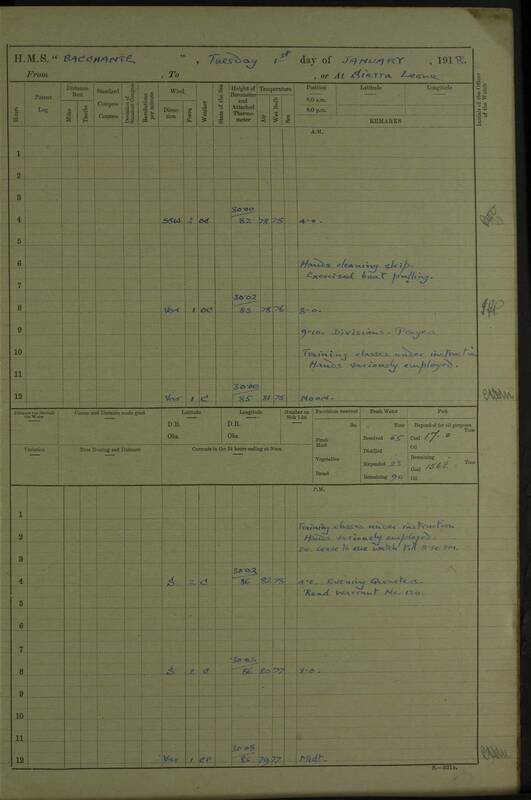 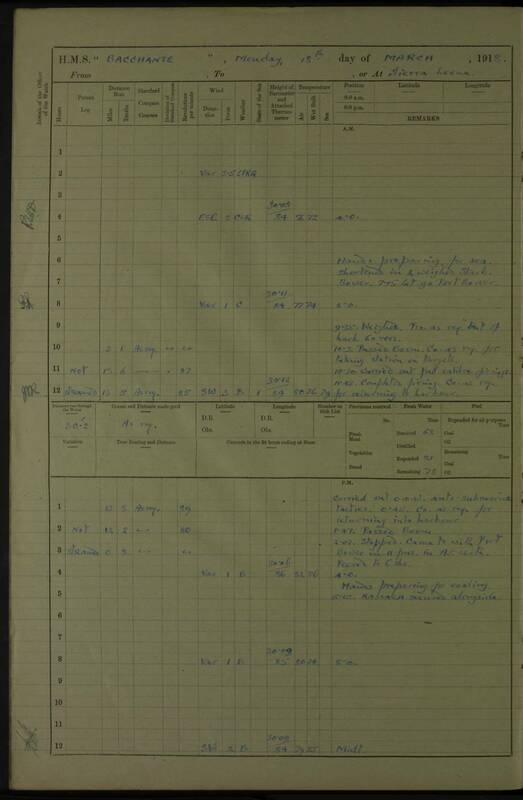 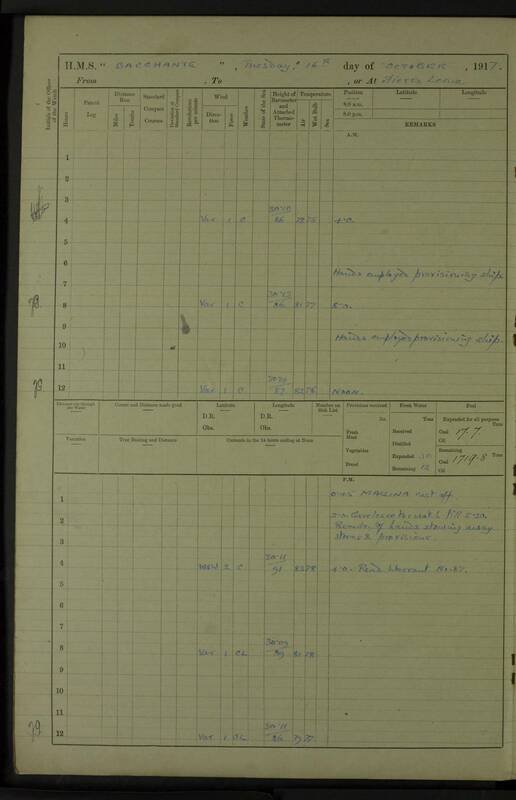 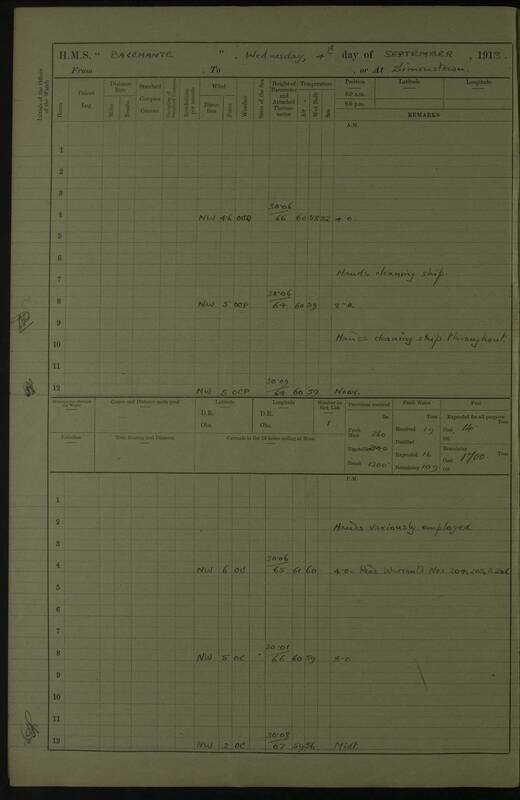 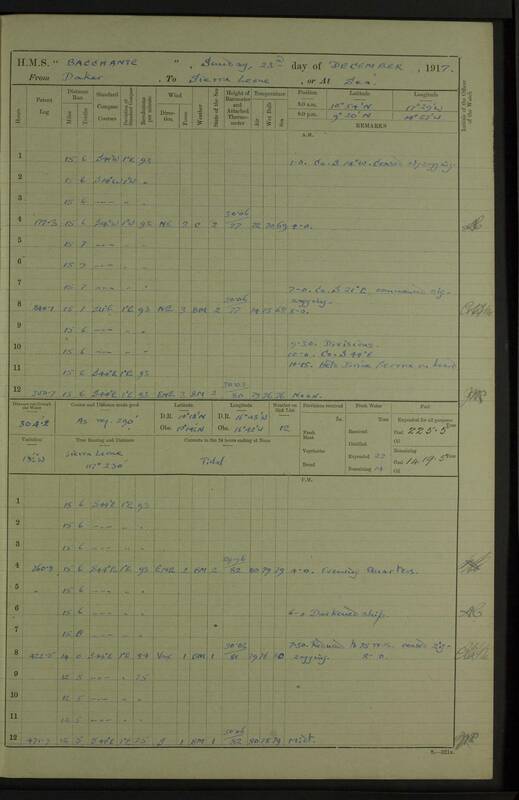 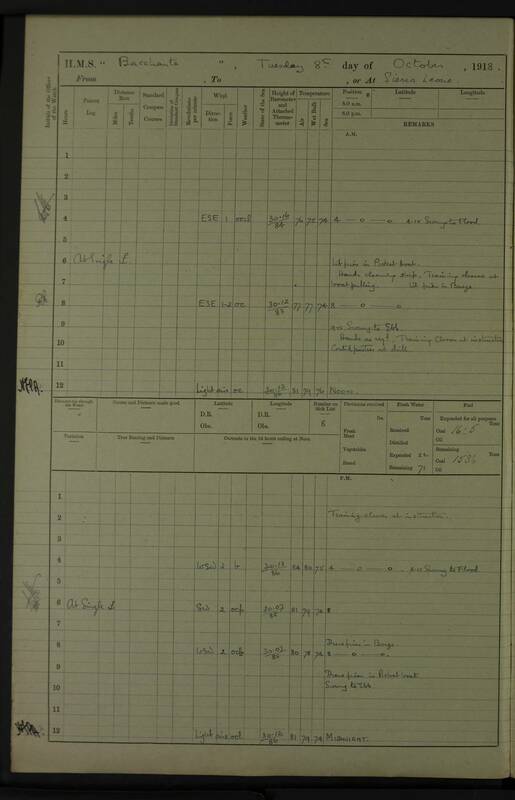 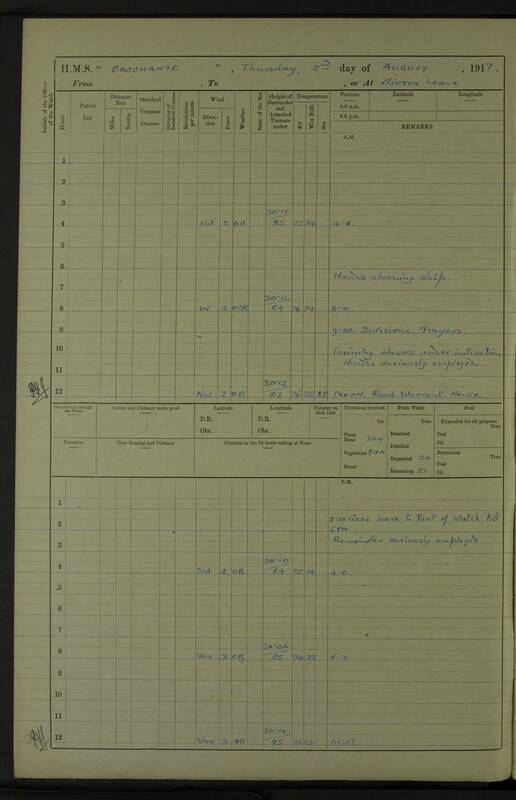 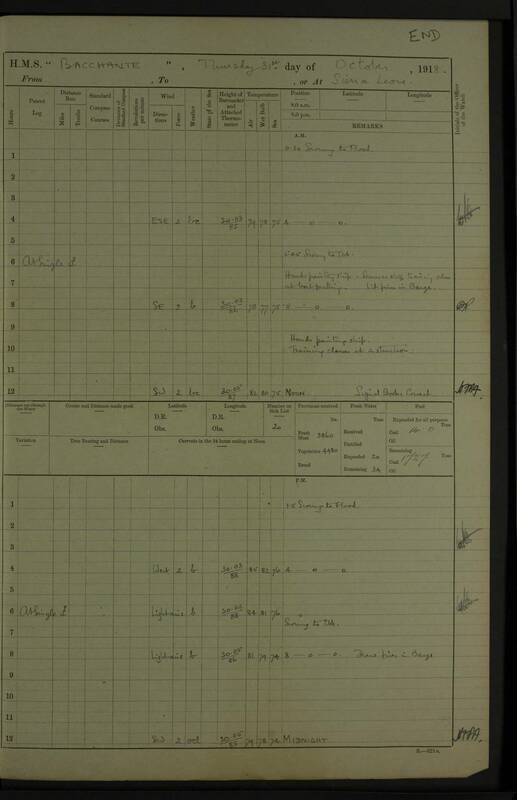 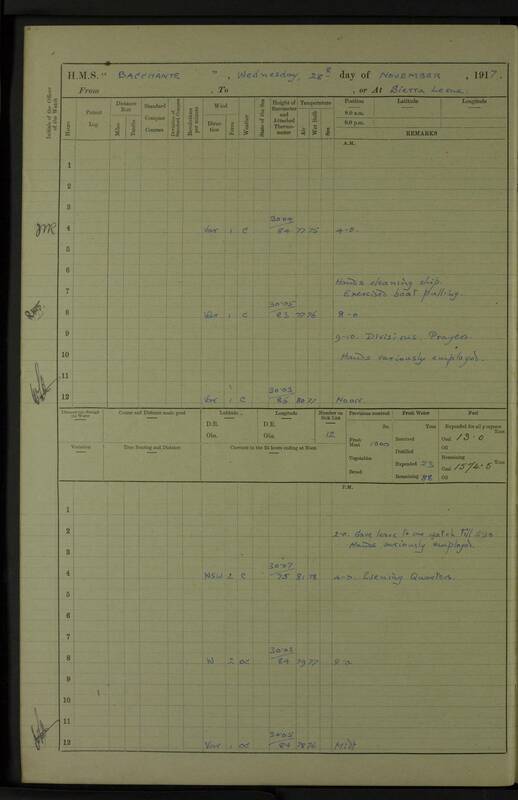 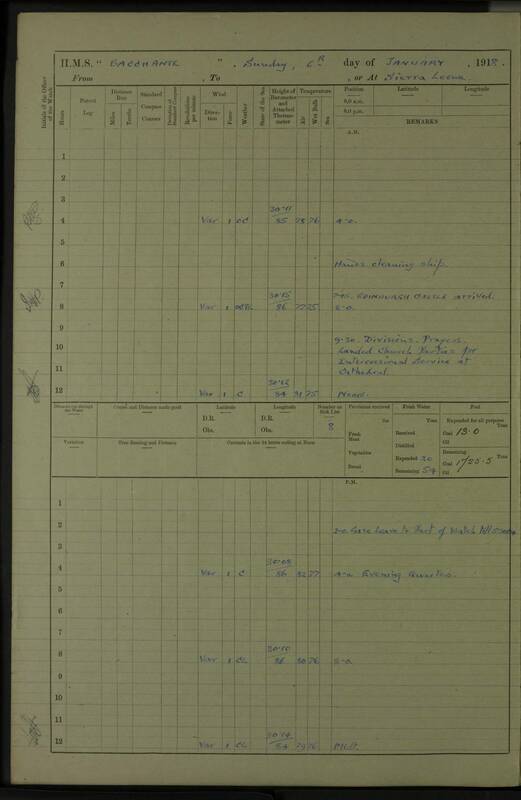 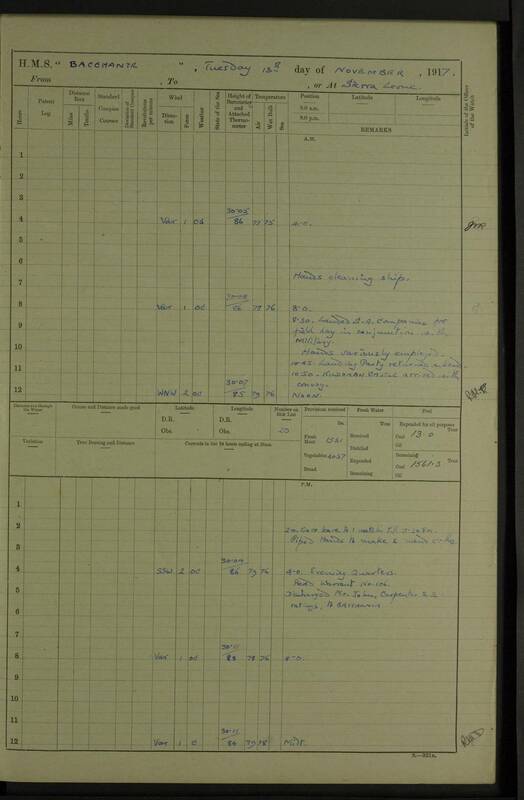 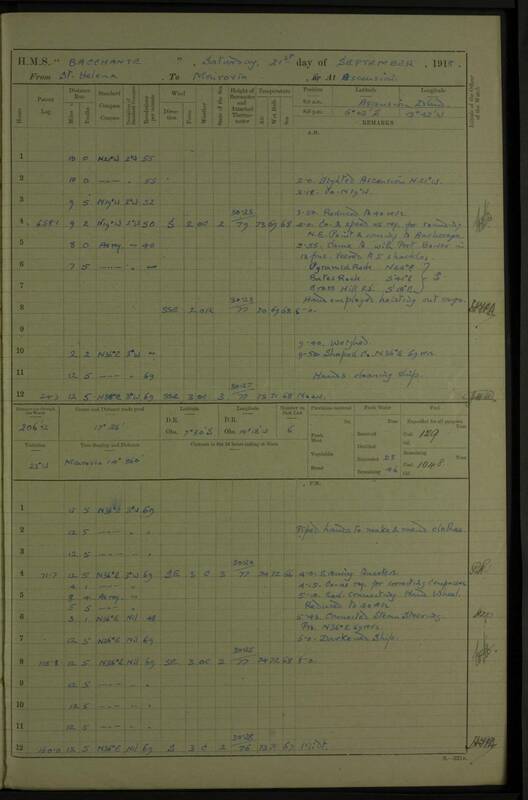 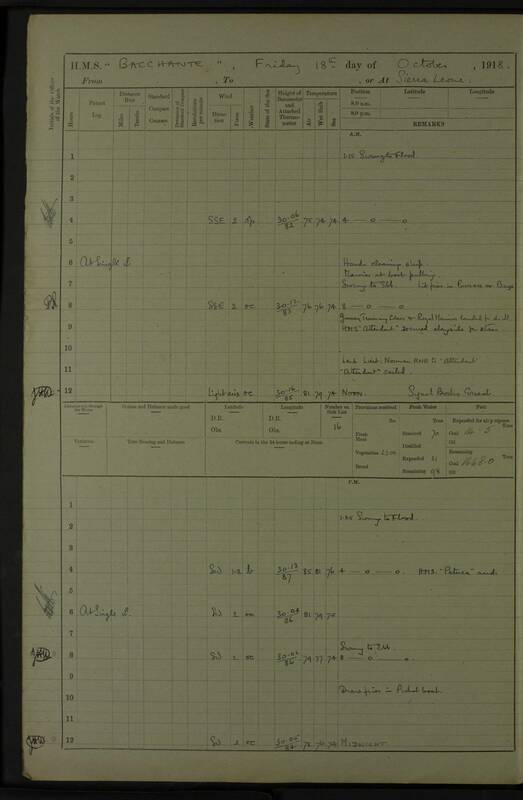 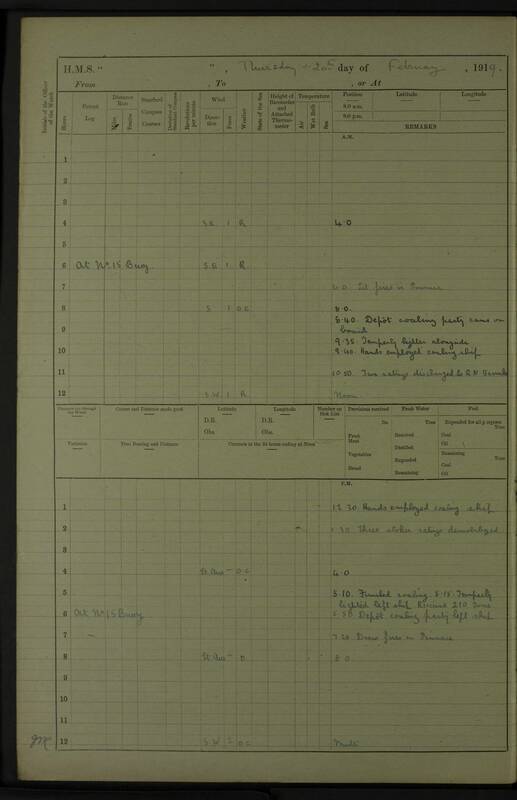 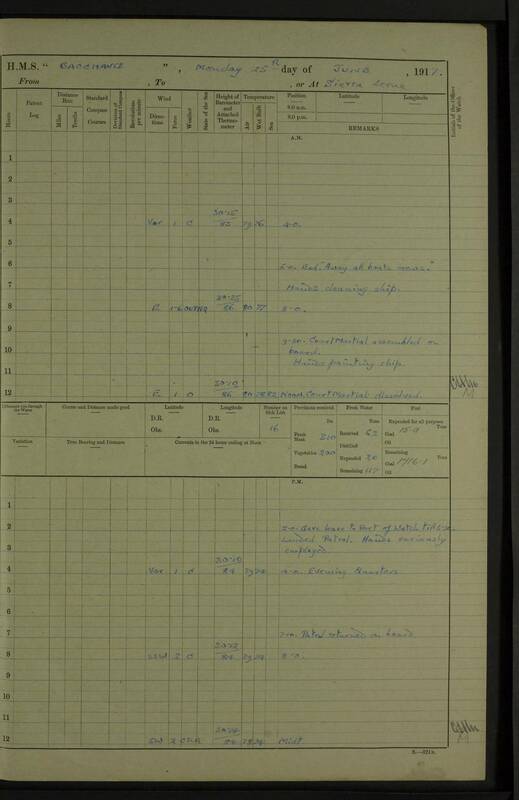 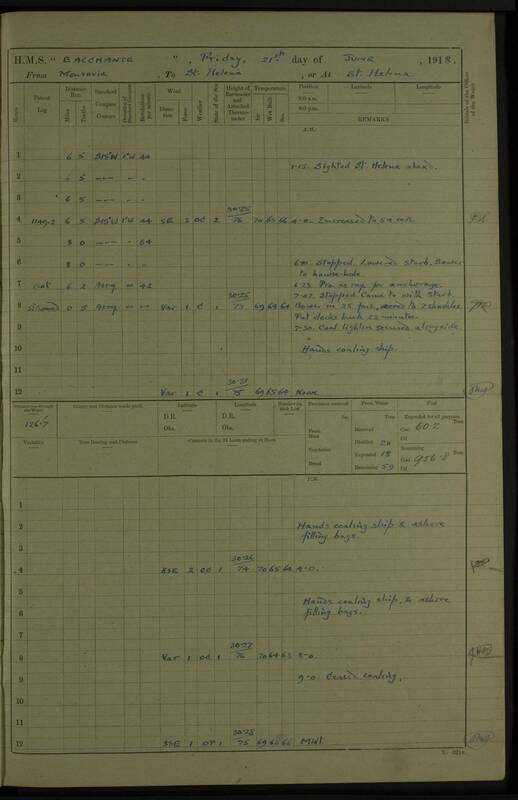 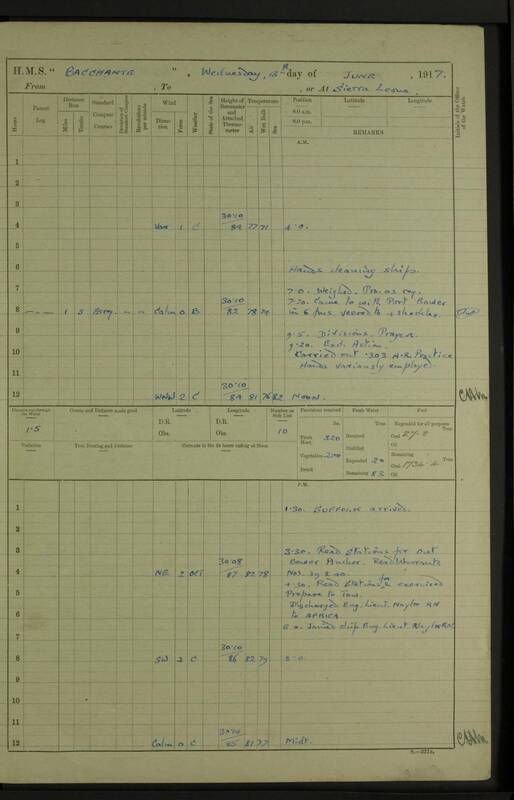 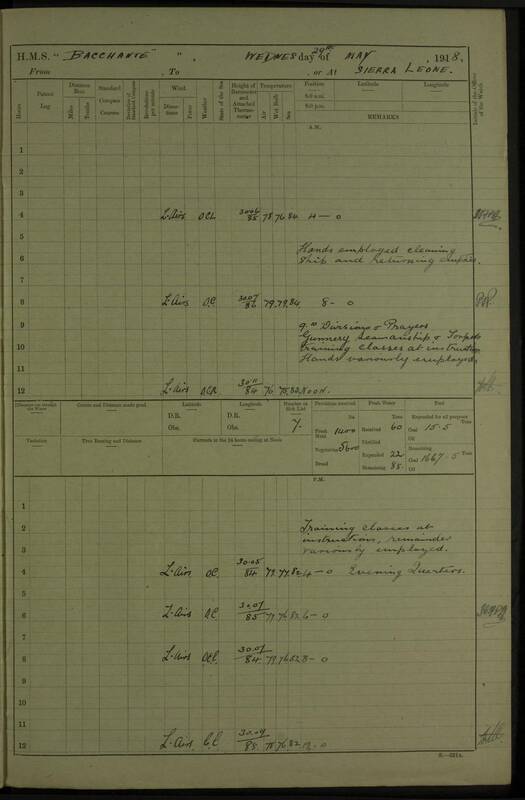 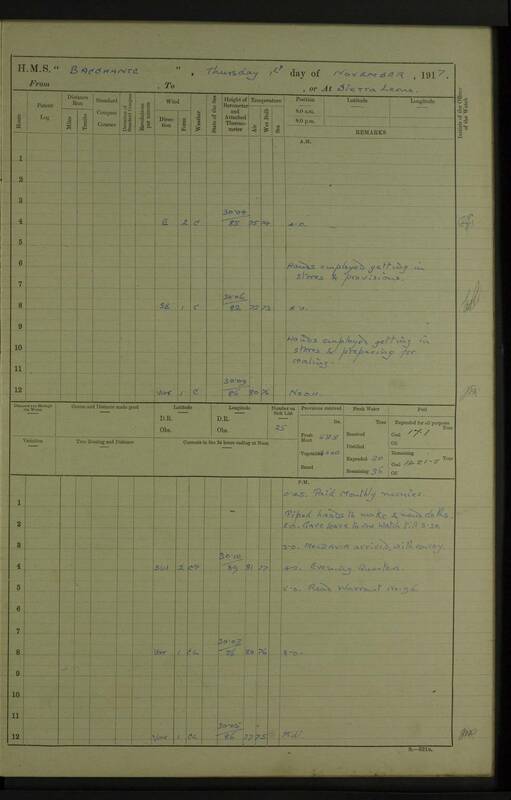 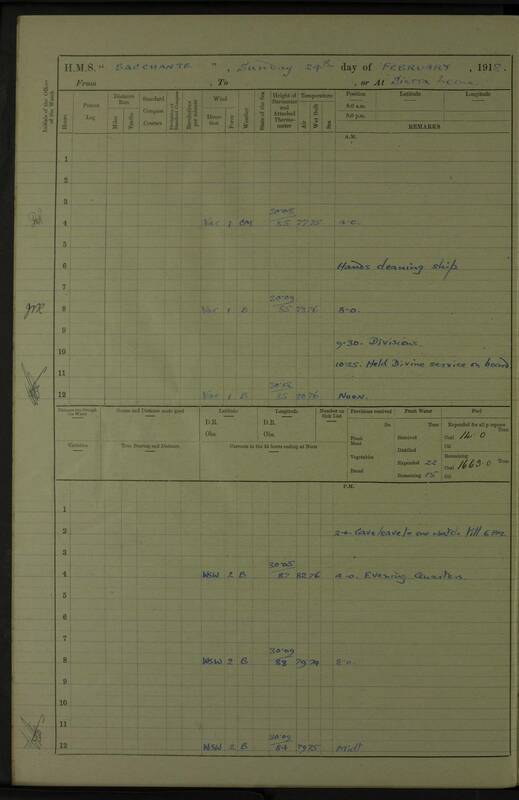 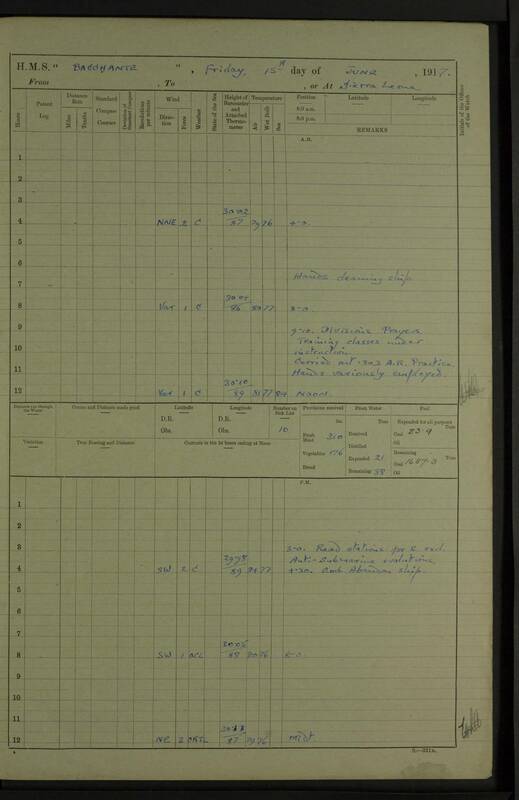 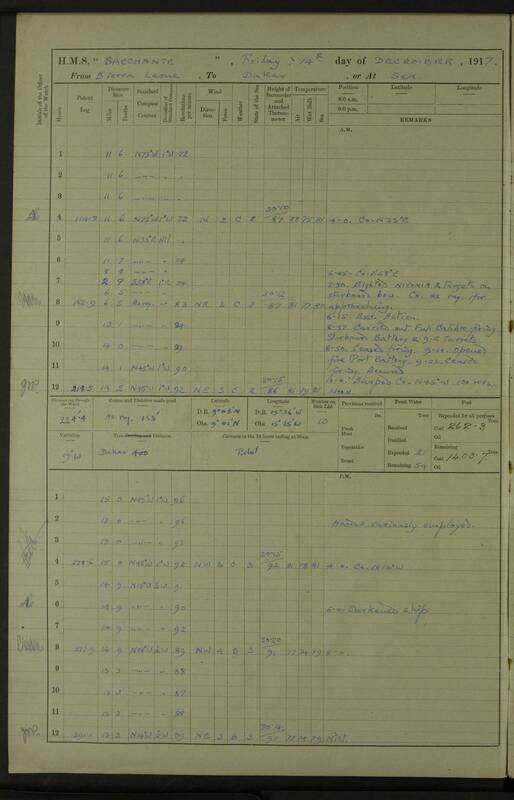 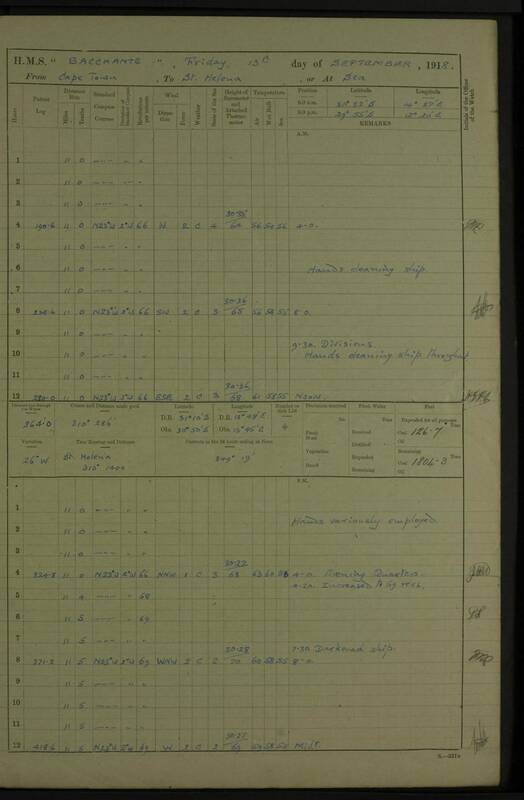 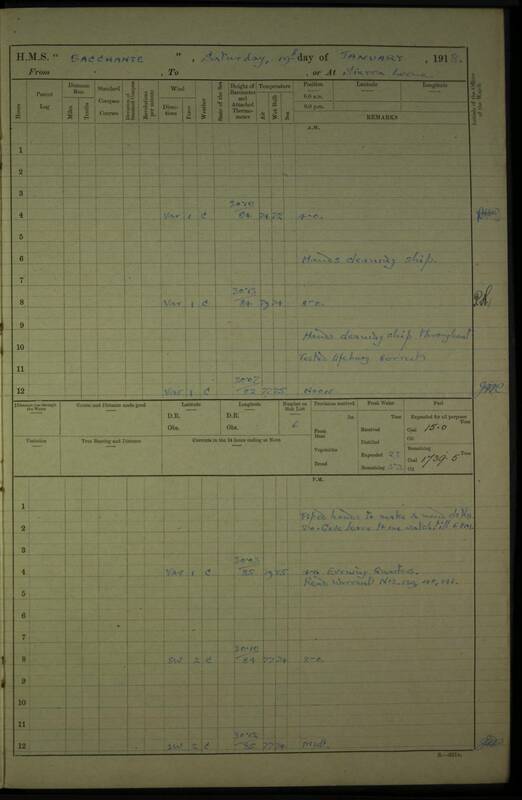 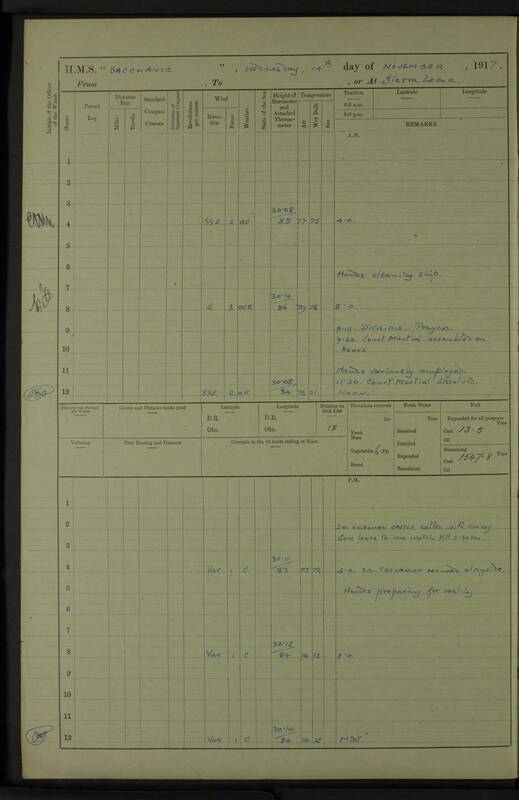 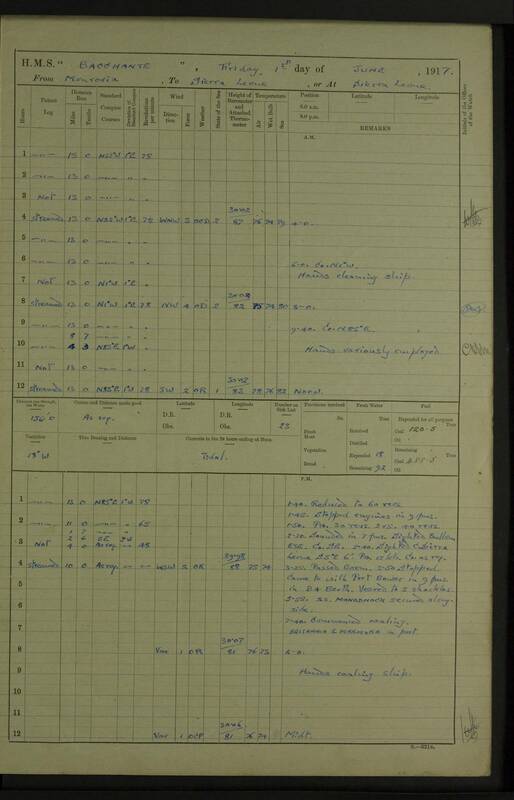 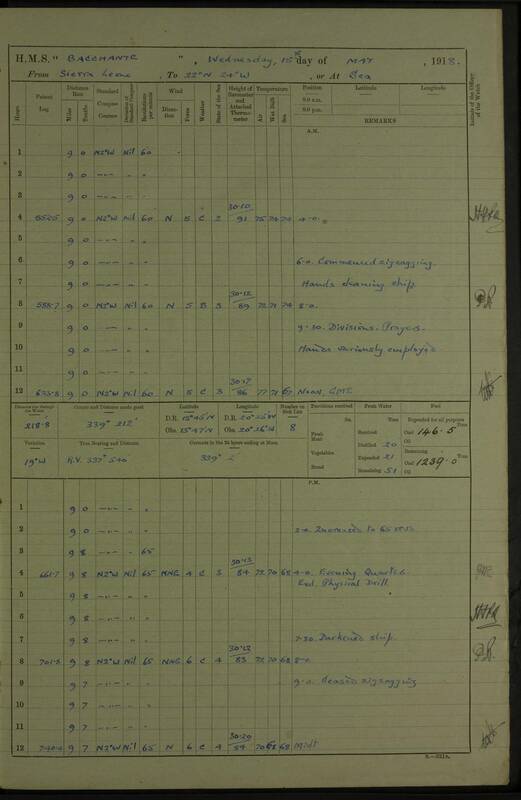 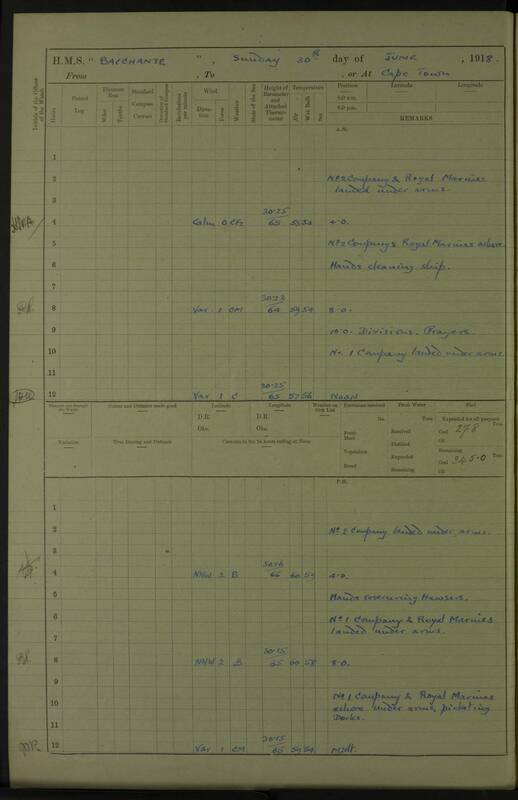 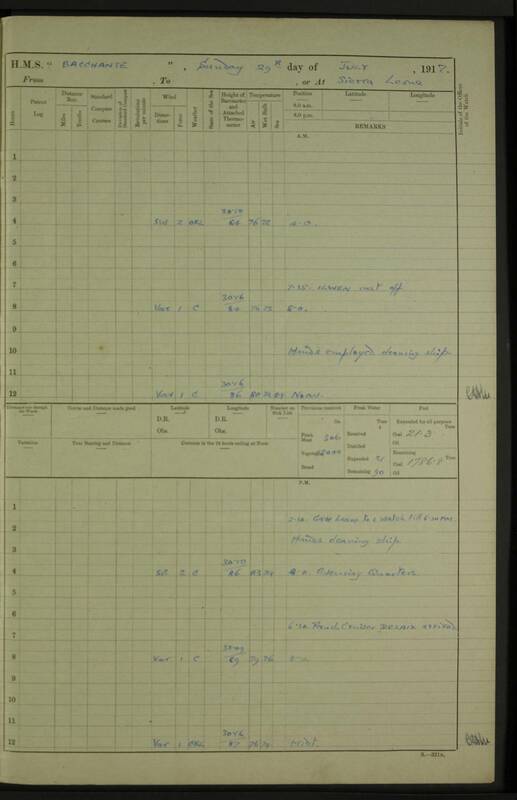 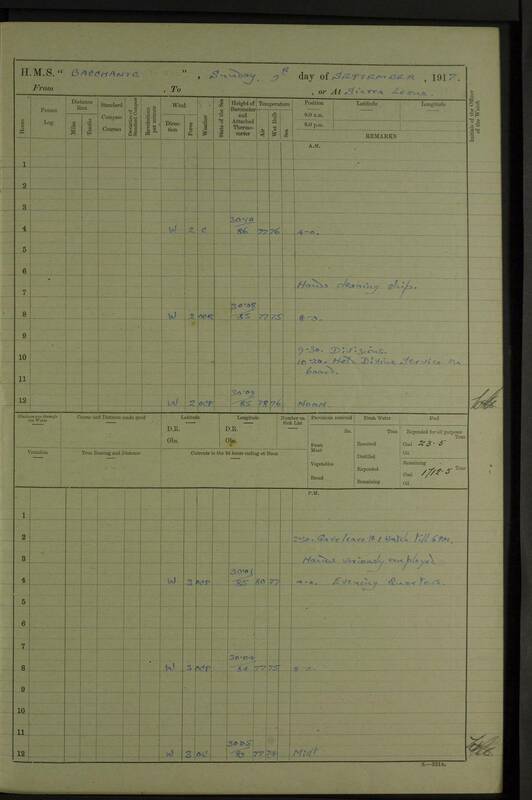 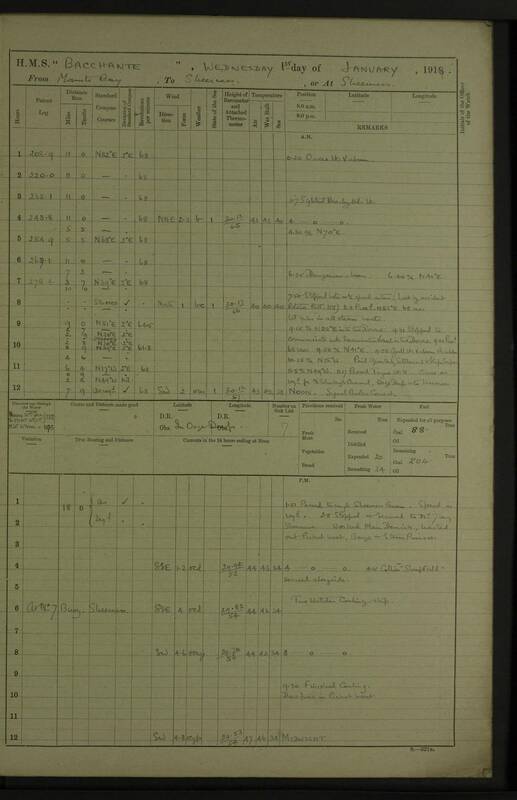 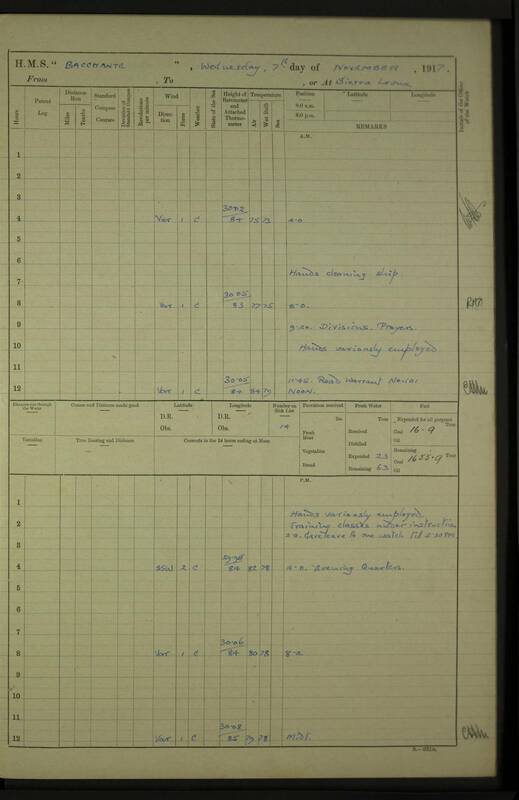 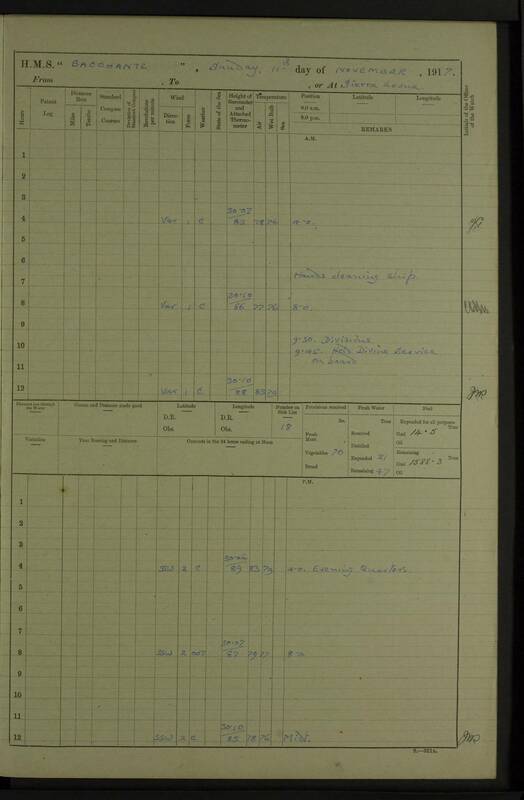 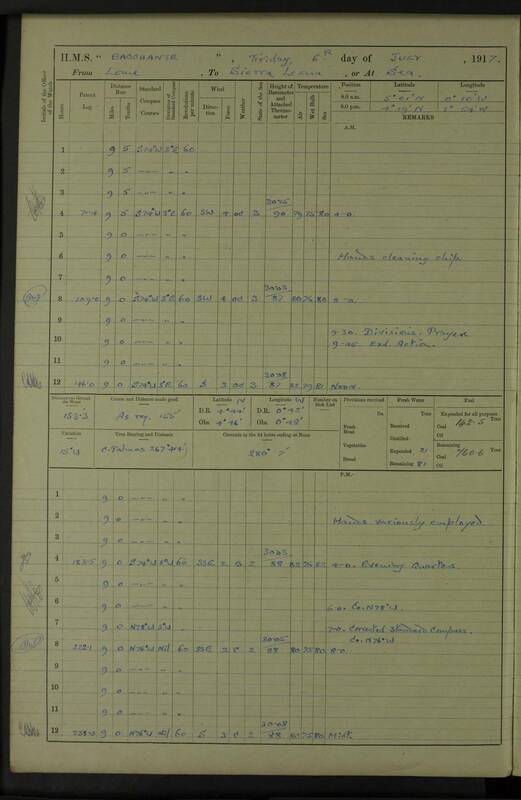 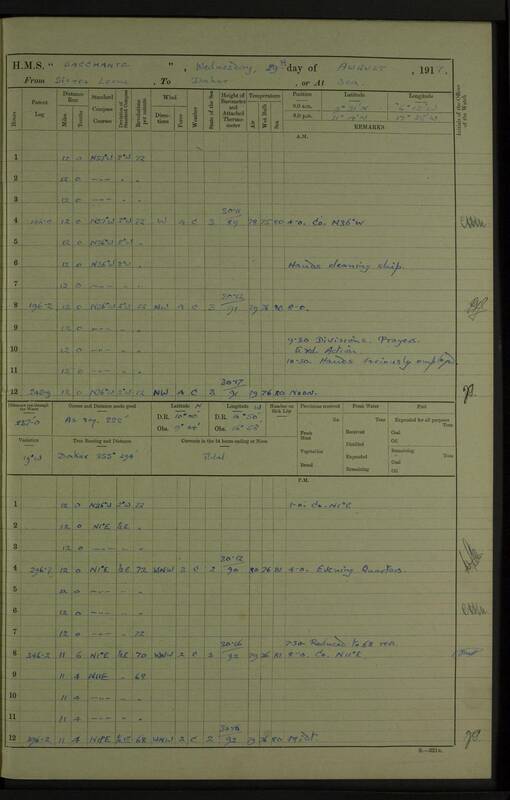 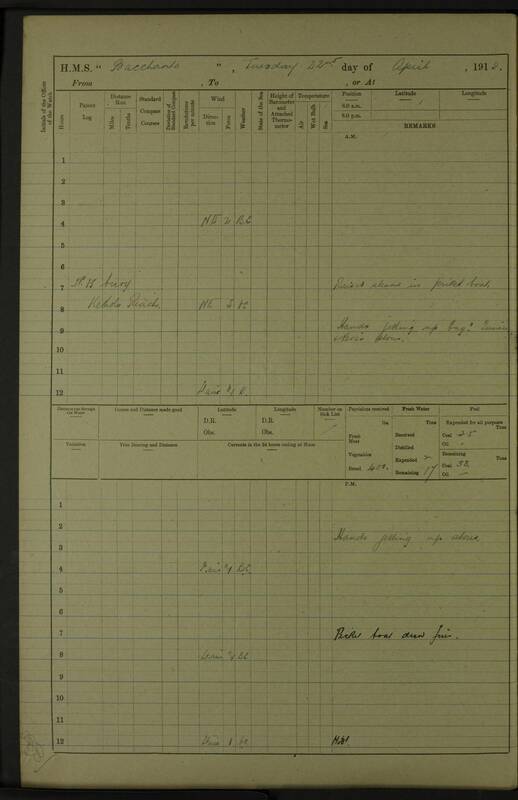 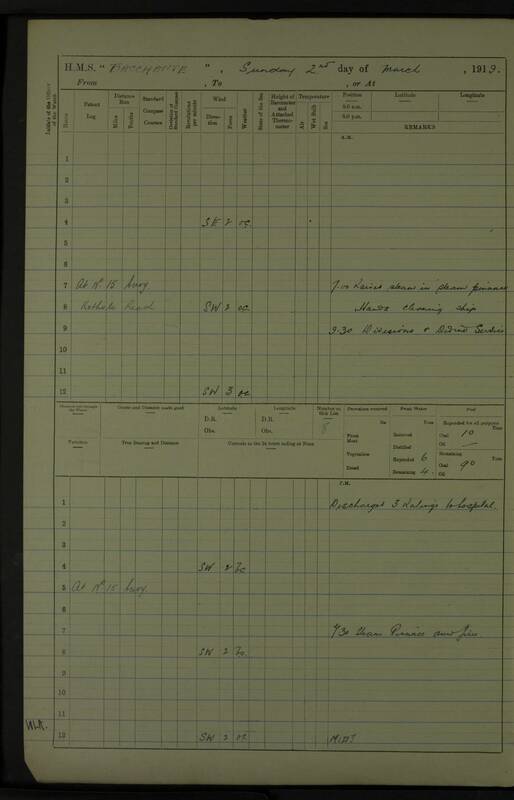 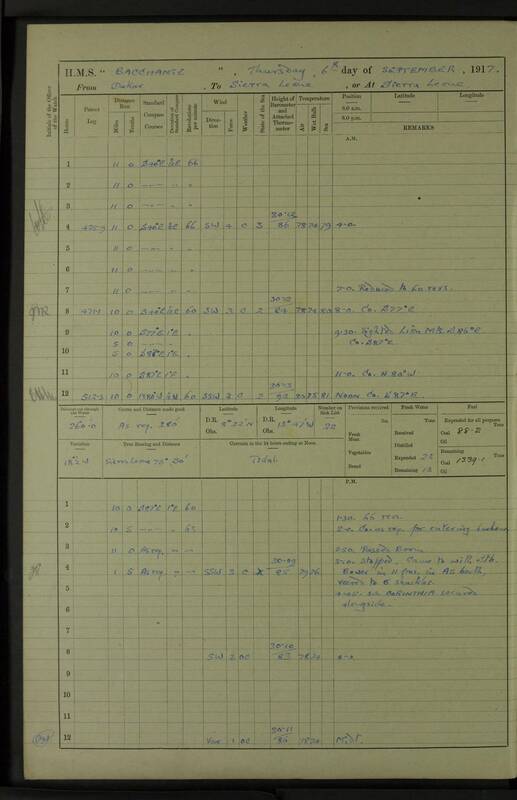 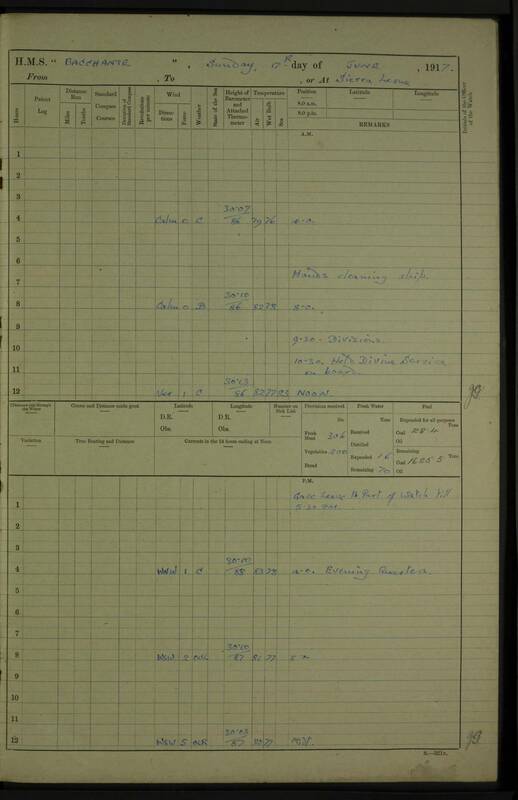 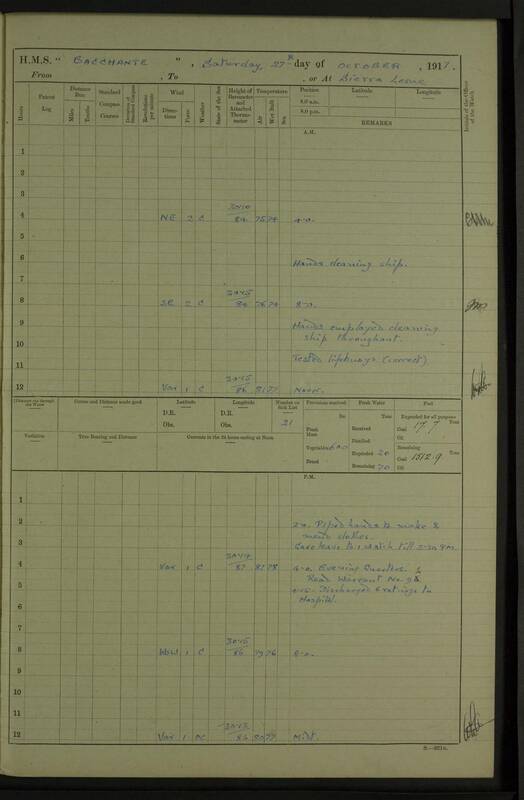 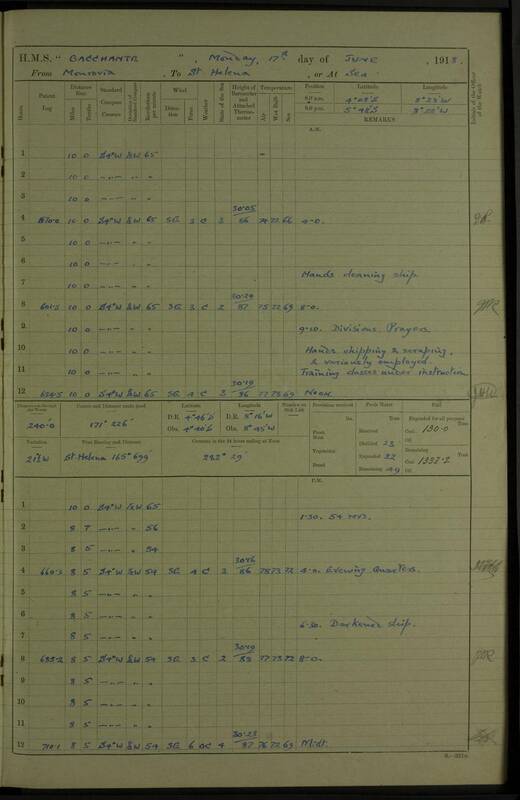 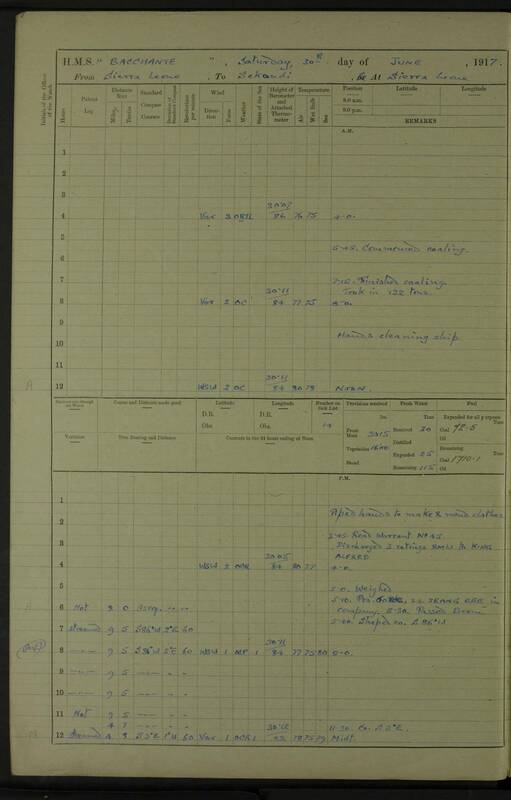 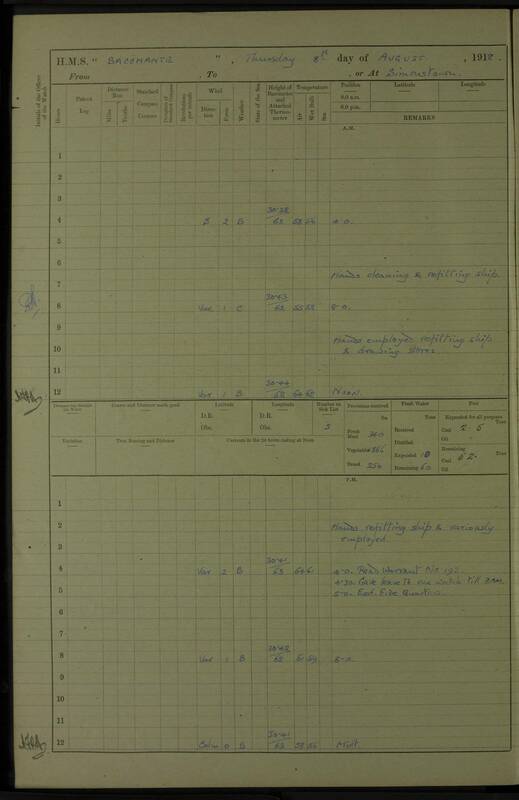 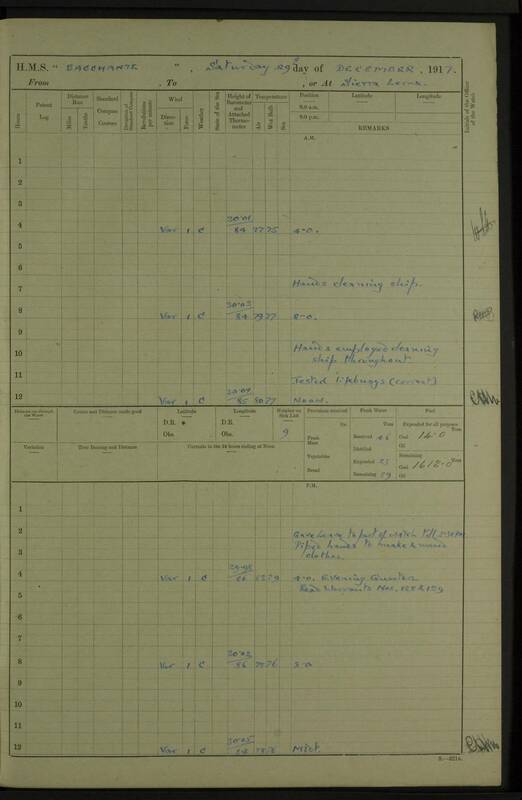 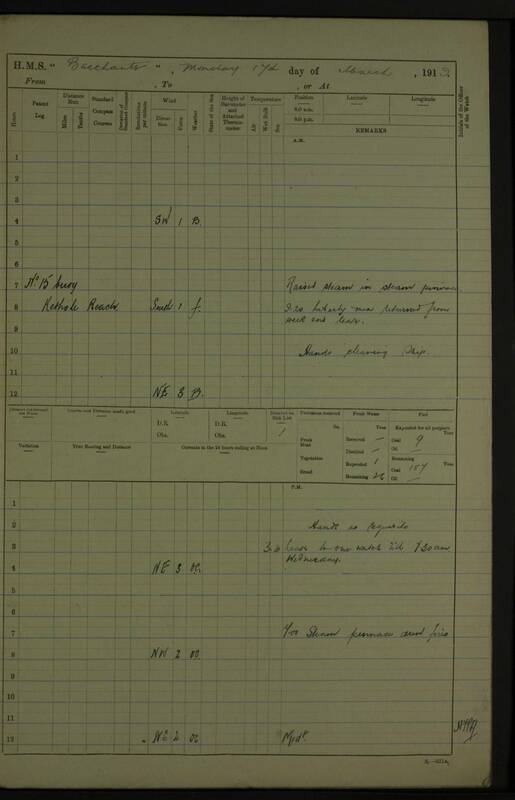 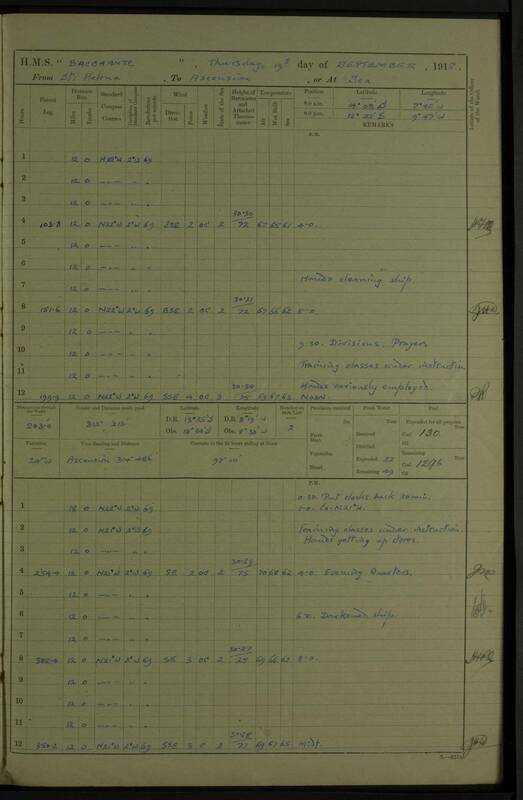 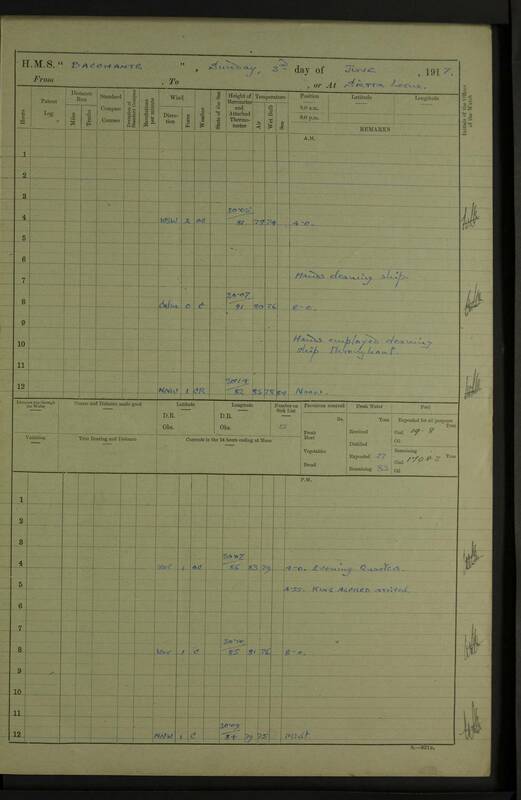 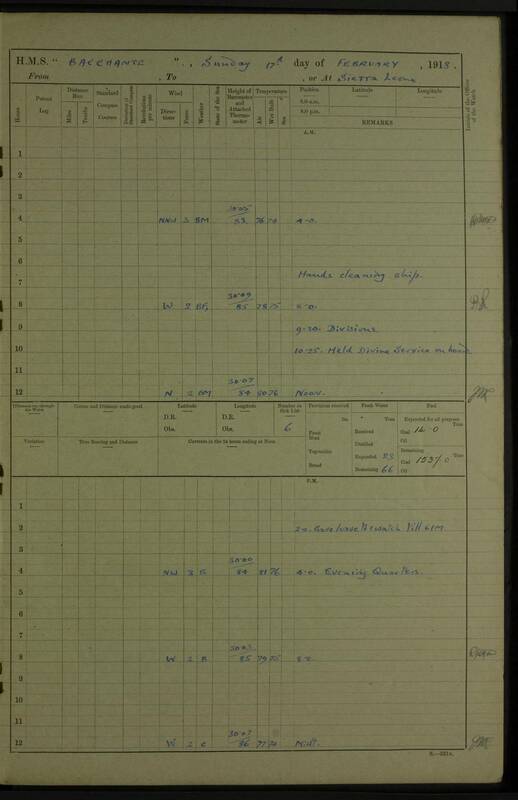 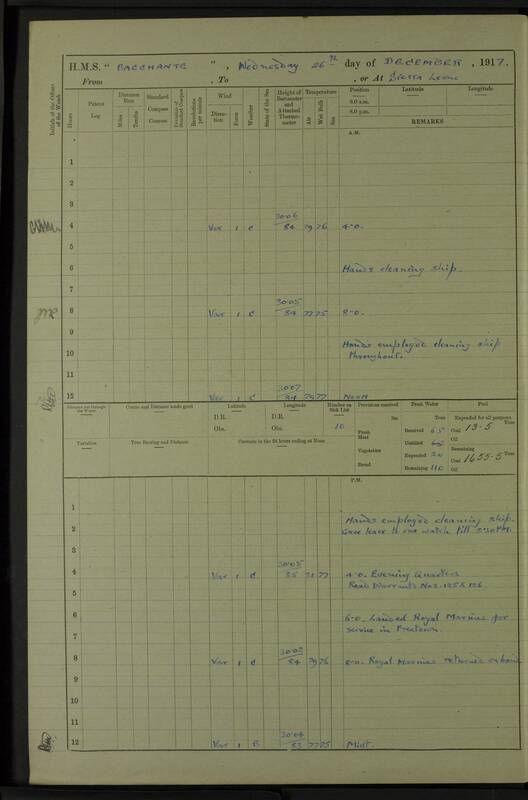 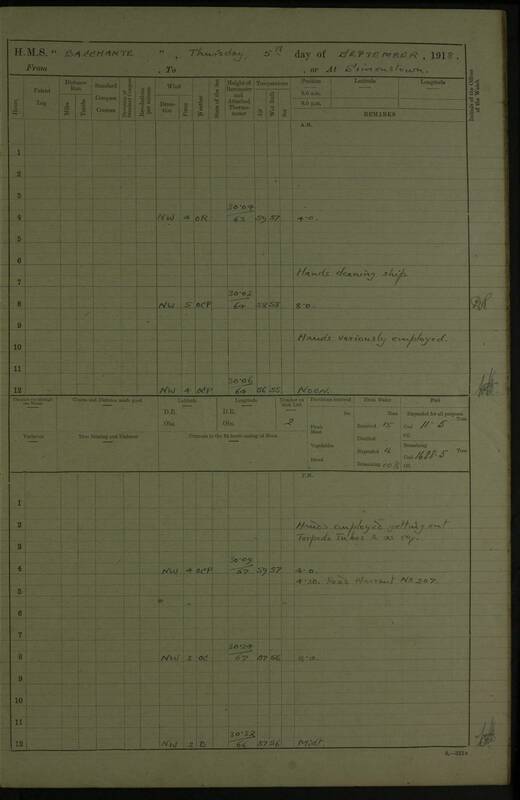 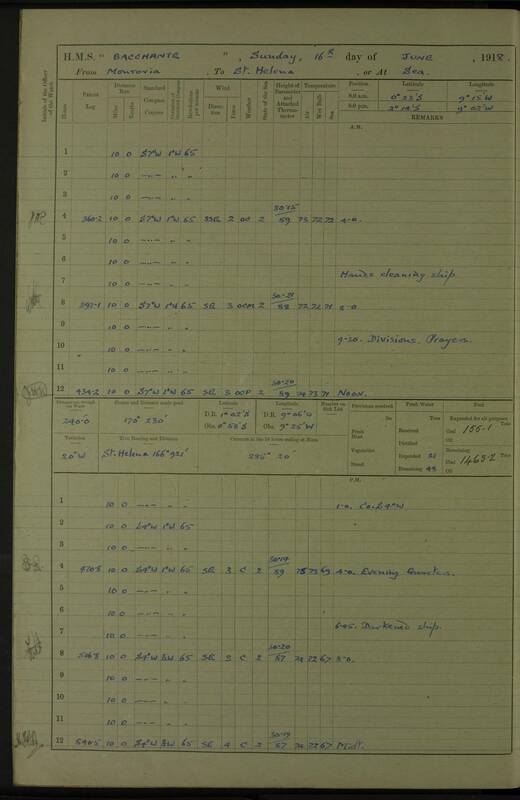 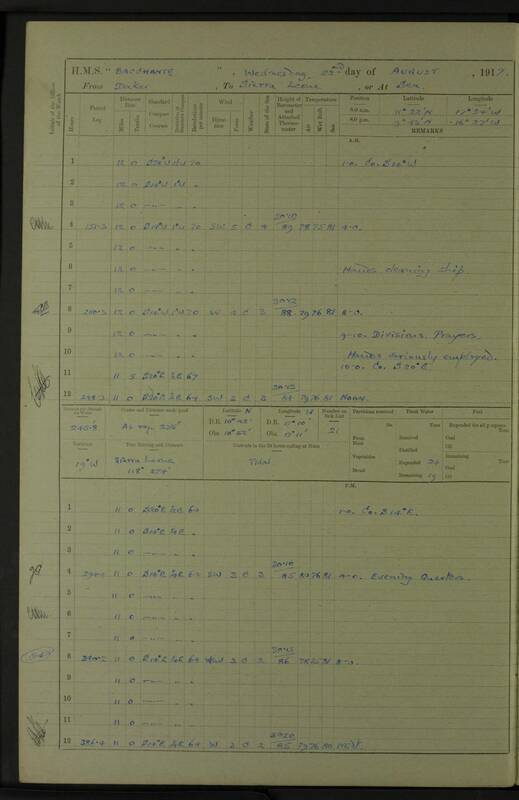 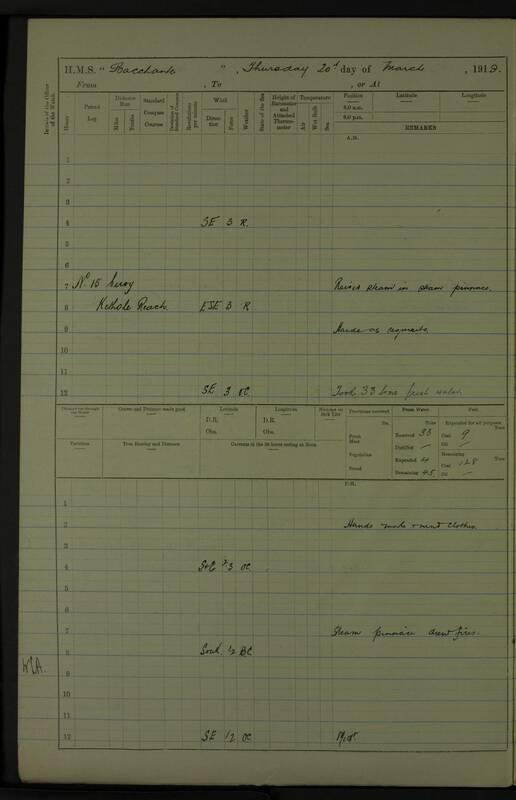 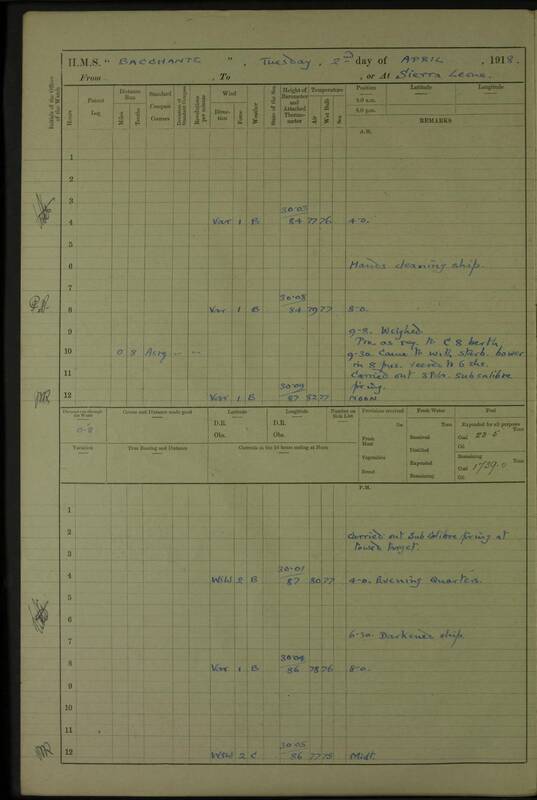 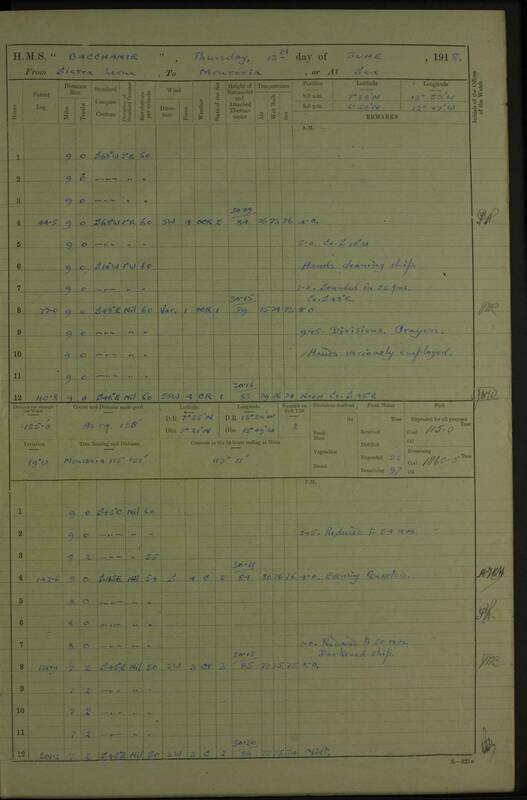 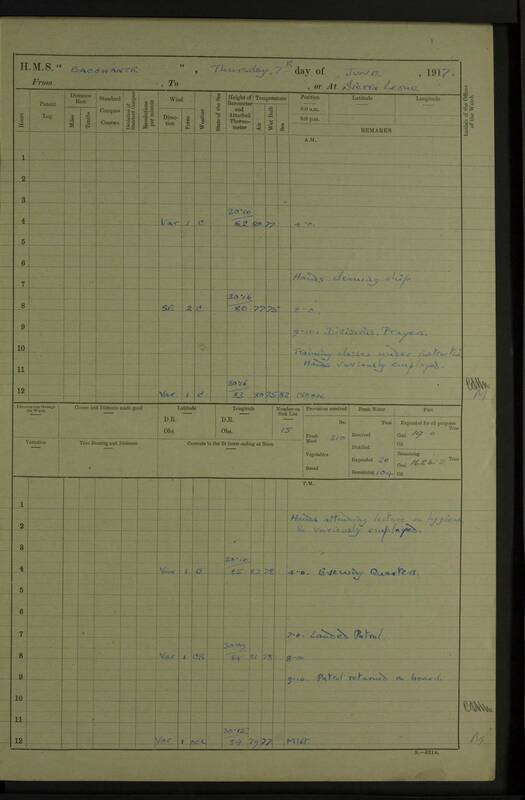 Log page mis-labelled as 25 August 1917. 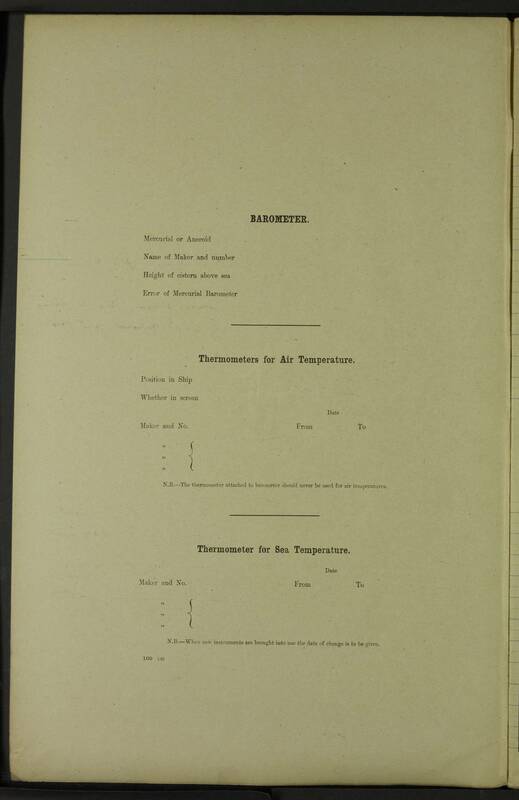 Person: Disciplined: Mr Robert Ward, Gunner, being unable to account for the loss of stores, namely between 60 and 70 pairs of gaiters is cautioned to be more careful of his stores in future and is to be charged 3 pounds towards the value of the same. 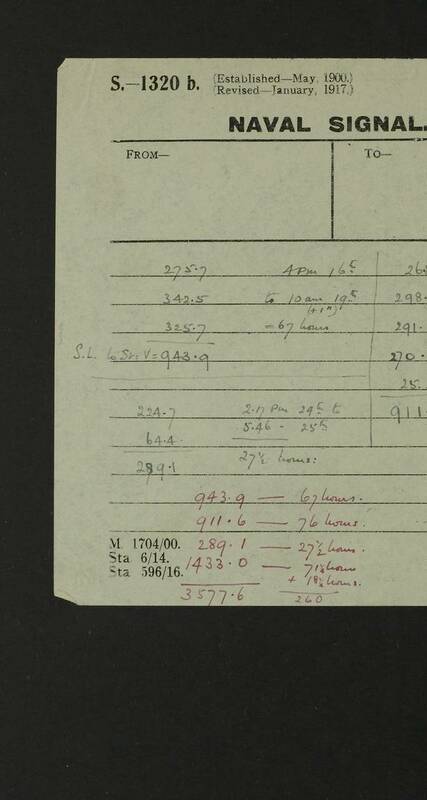 am: Collier HYANTHES secured alongside. 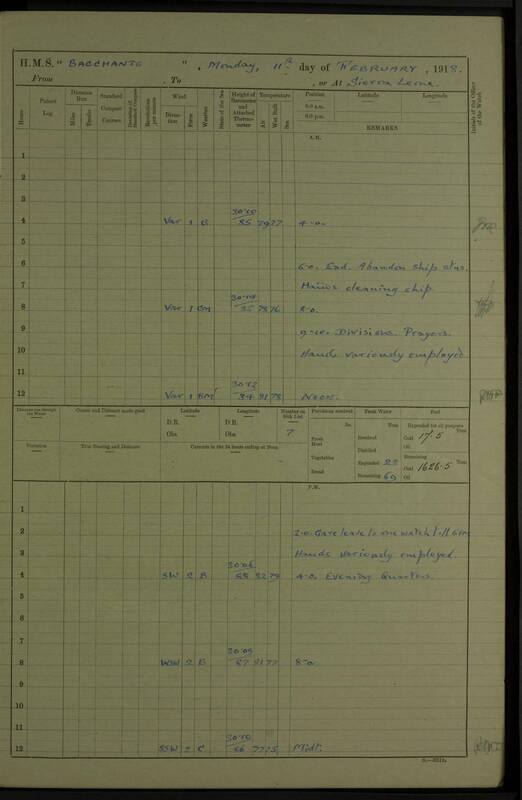 am: Cable ship TRANSMITTER arrived. 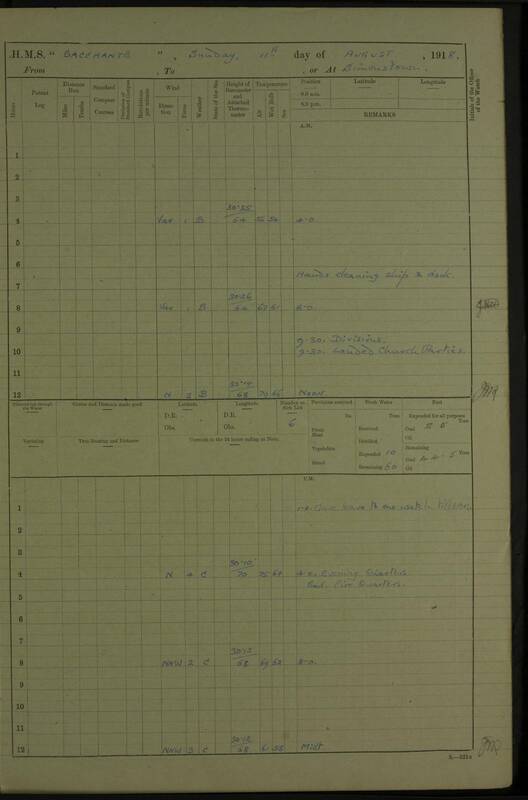 pm: Saluted Spanish flag with 21 guns; Saluted British Consul with 7 guns. 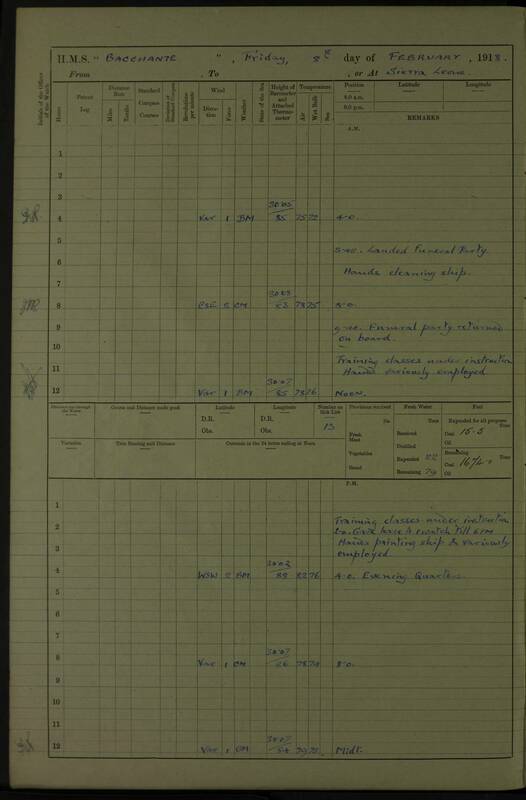 1.00 pm: Lieutenant Commander Sidney SMITH, R.N. 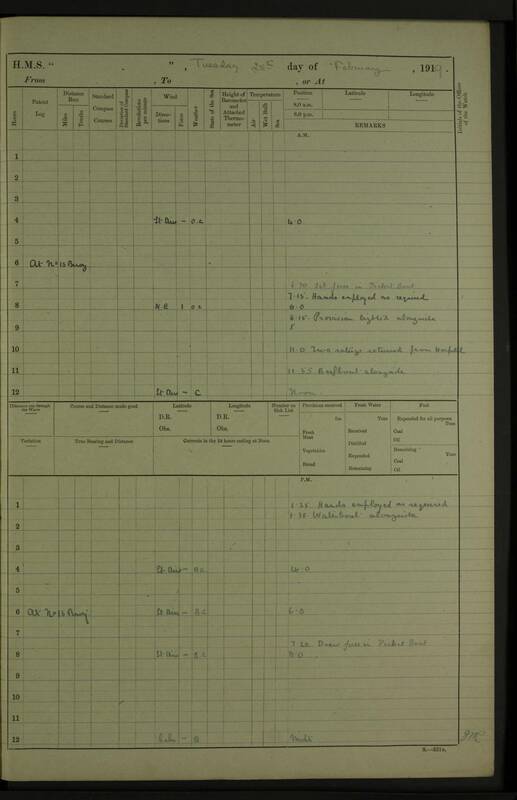 Am: ammunition working party of 52 Ratings returned to R.N.B.